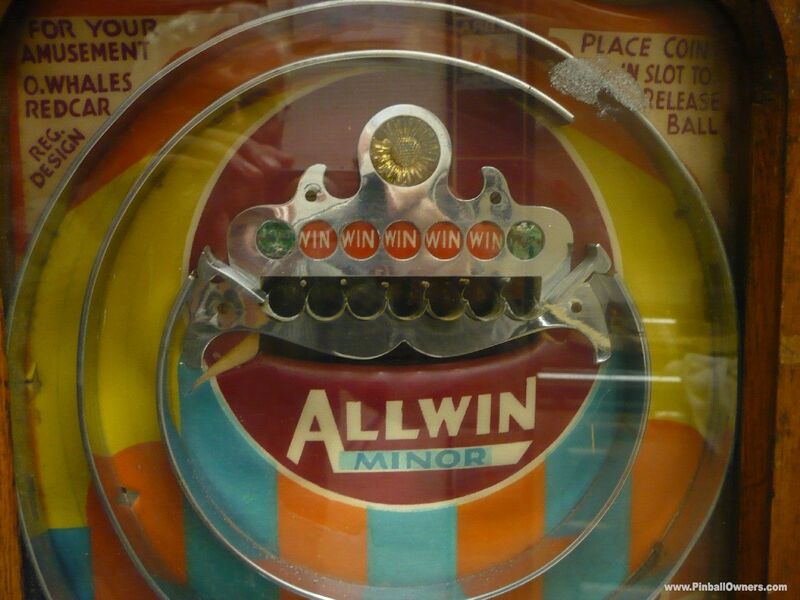 ALLWIN MINOR autre (voient les notes) Démonté, fonctionnant Jamais Made in the U.K. by Oliver Whales in the 1950's. 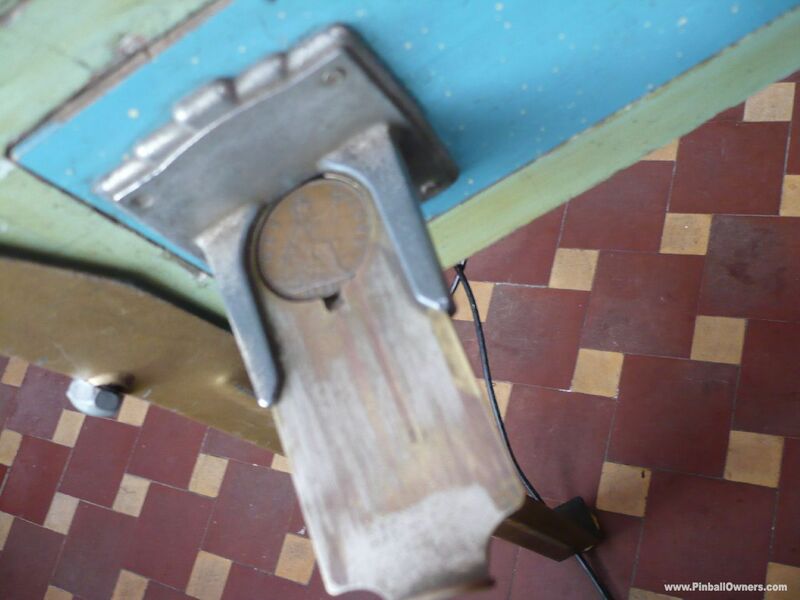 Efficient mechanical workings activated on an Old Penny. 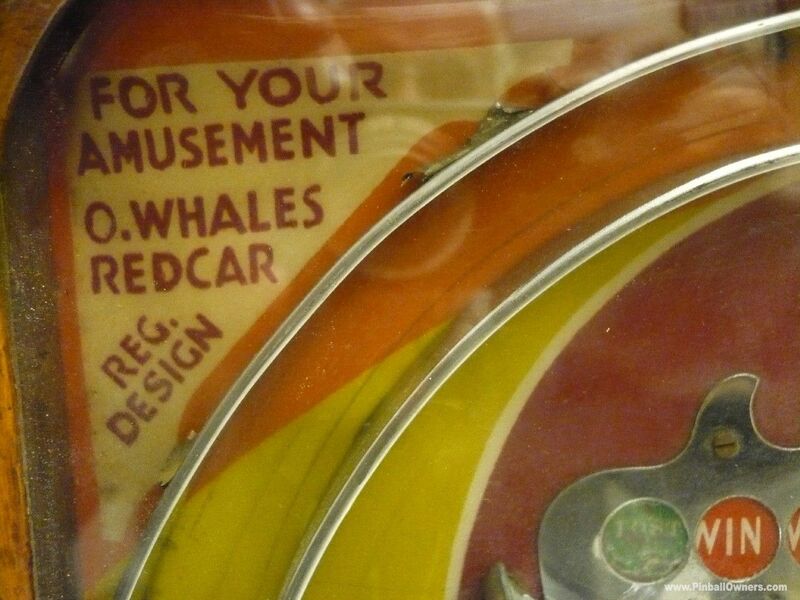 RESERVED. 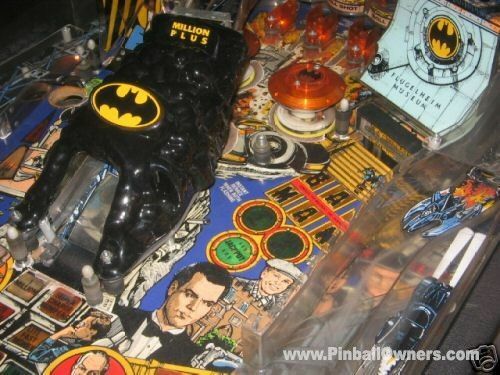 BATMAN Data East (USA) Monté, jouable Ca dépend 1991 (August) Popular machine. 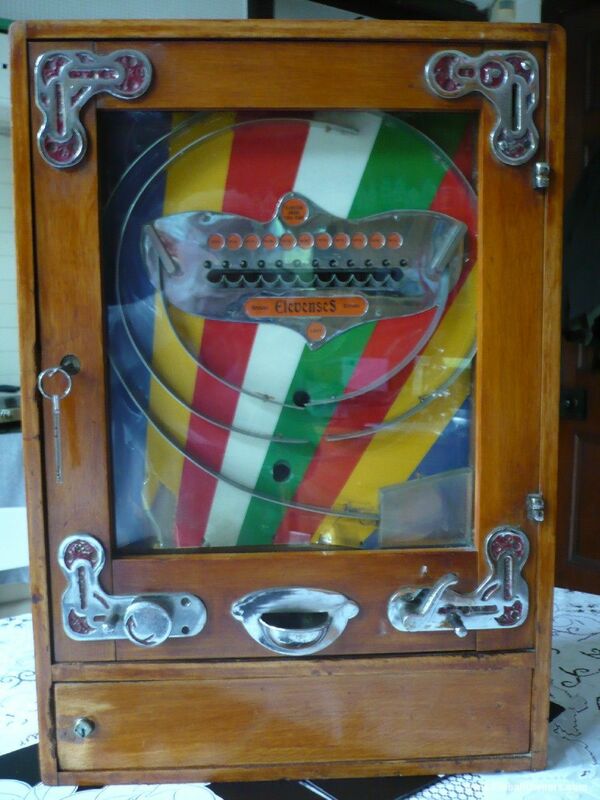 Good cabinet n topper. 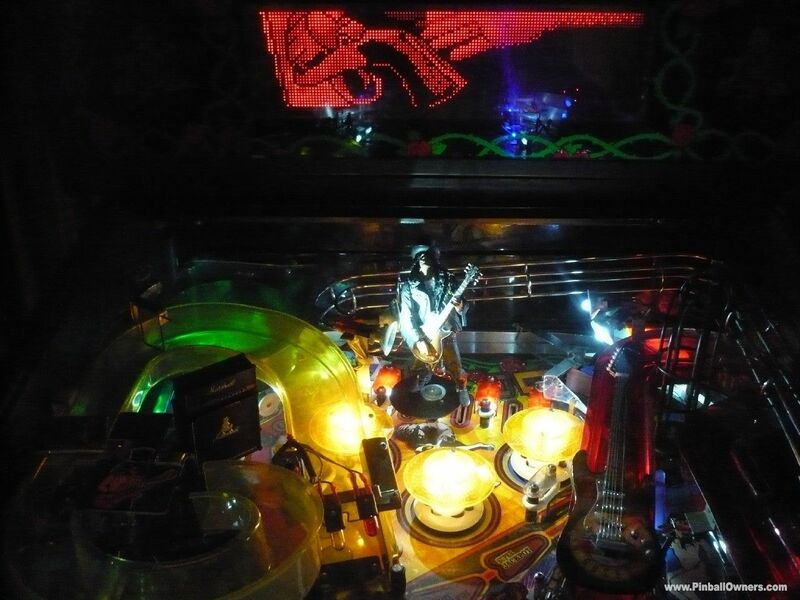 .plays well with cool sound. 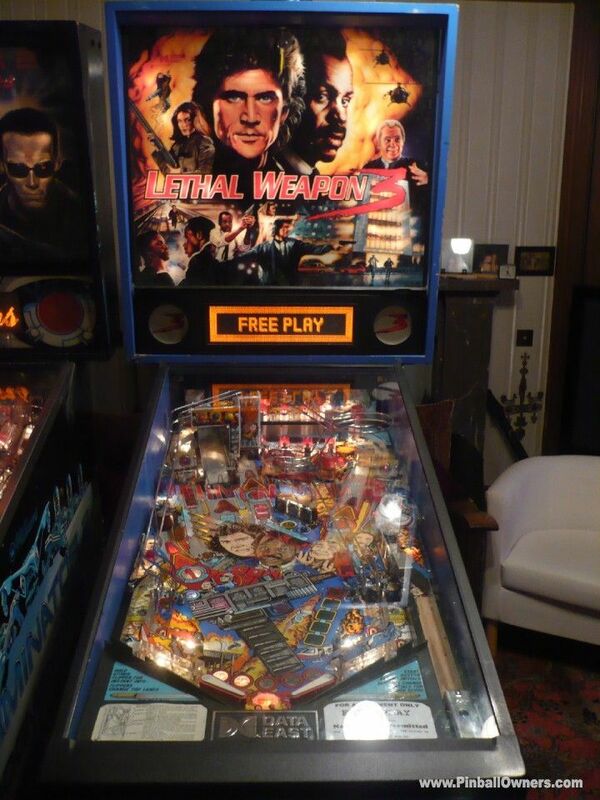 The verbals, music and effects are excellent for this almost 28 year old classic. 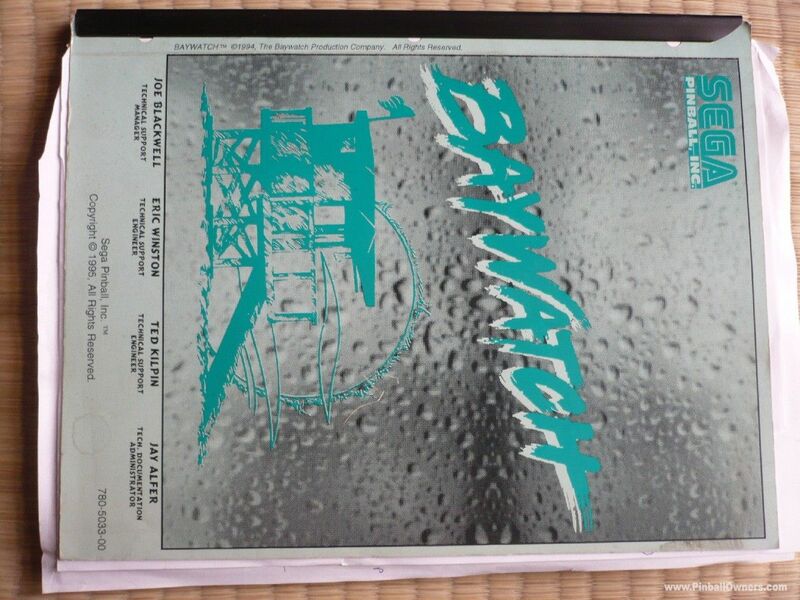 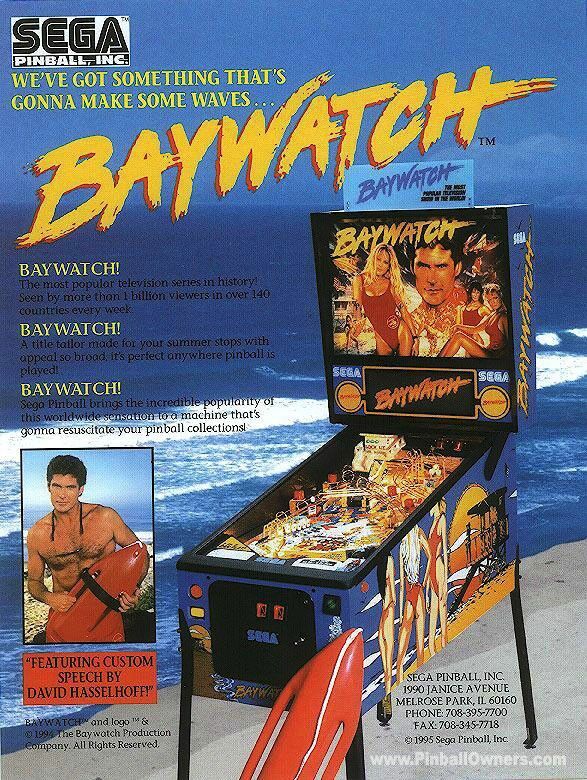 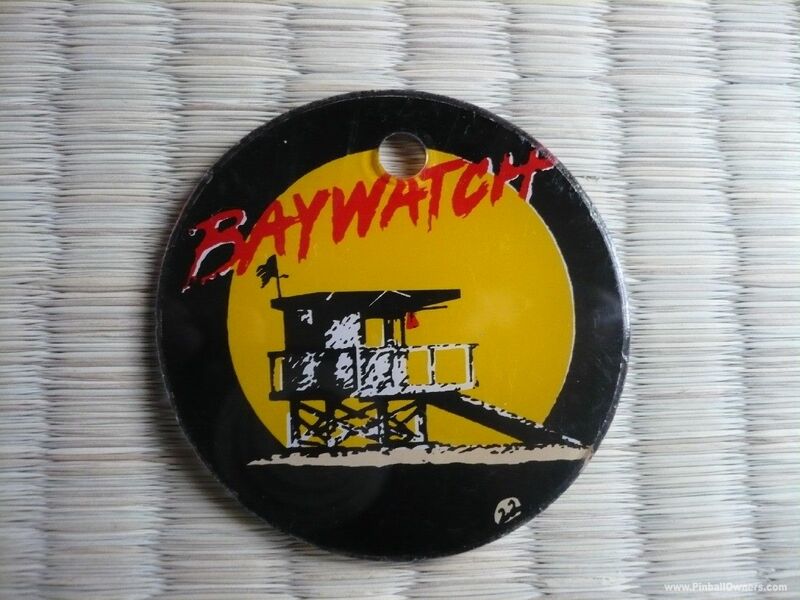 BAYWATCH Sega (USA) Monté, jouable Jamais 1995 (February) Plays well, like the larger dot matrix display n the shark flip. 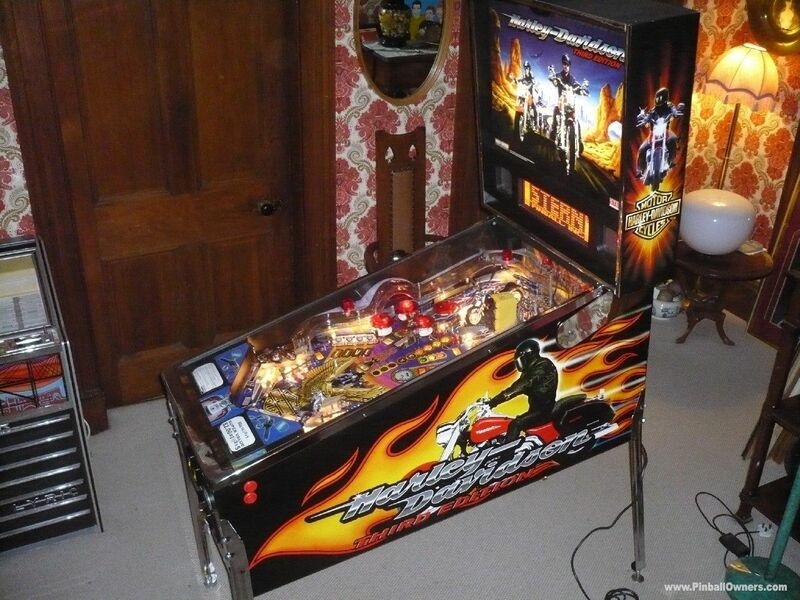 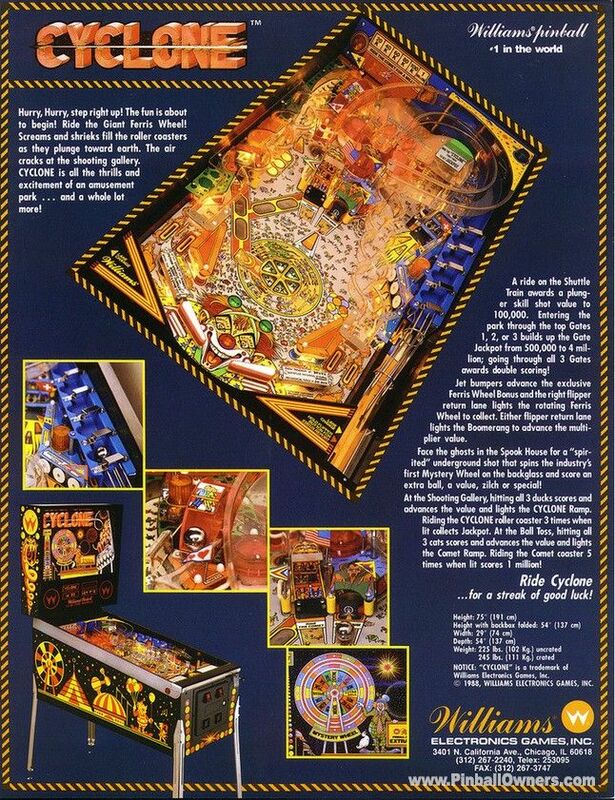 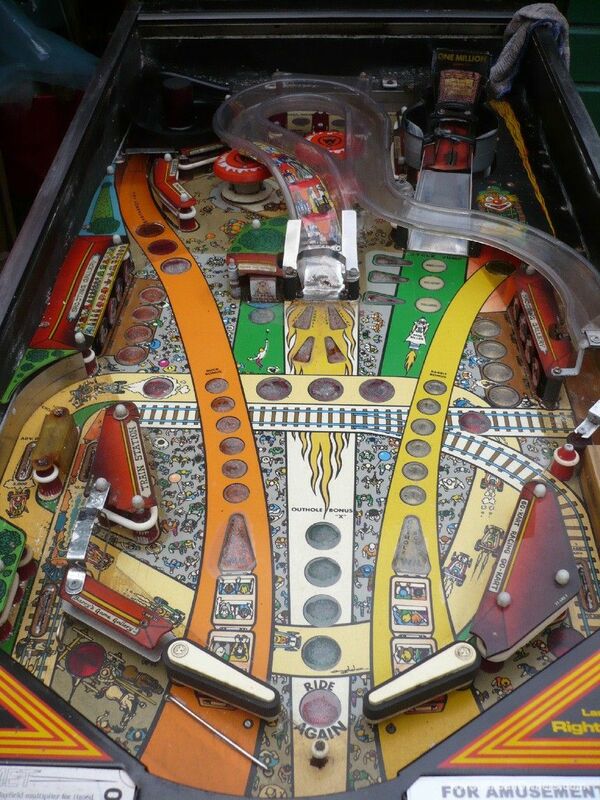 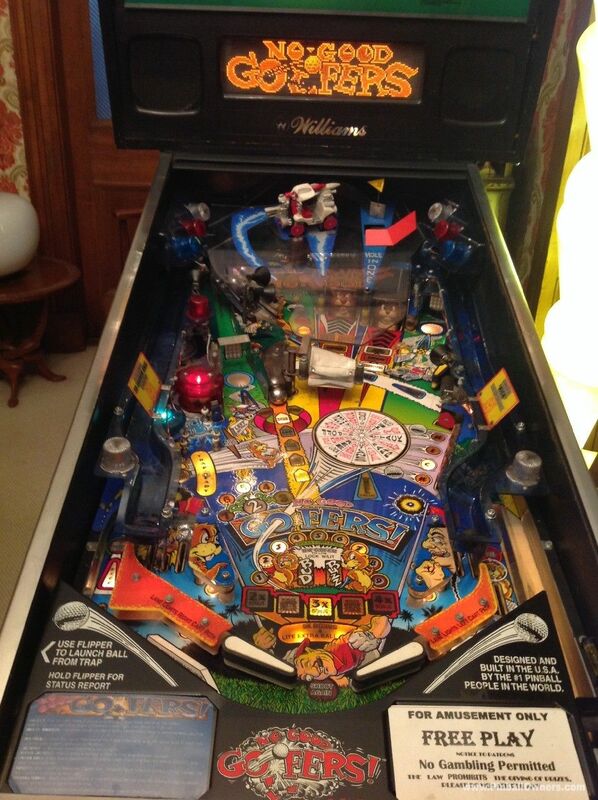 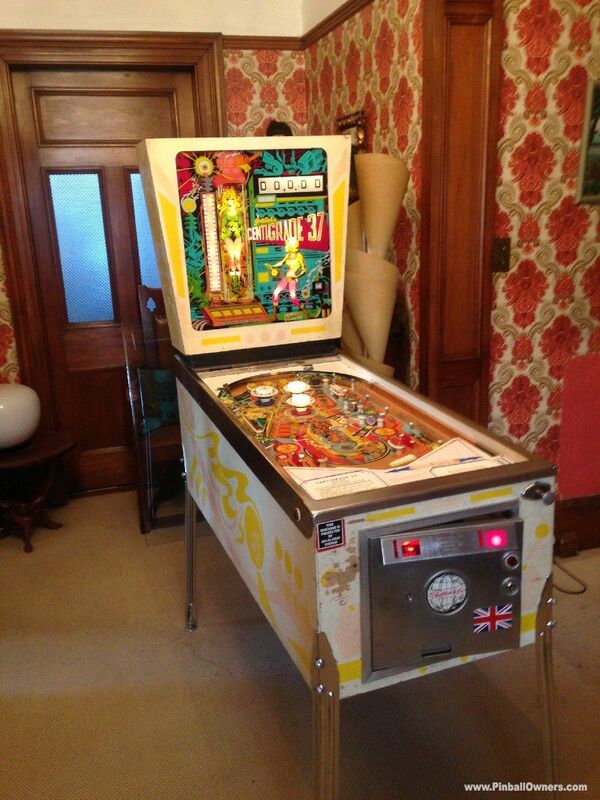 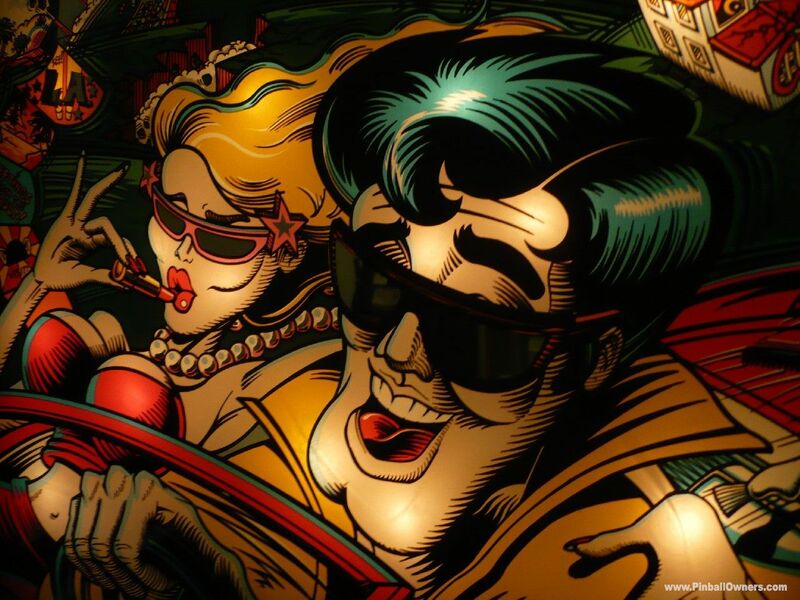 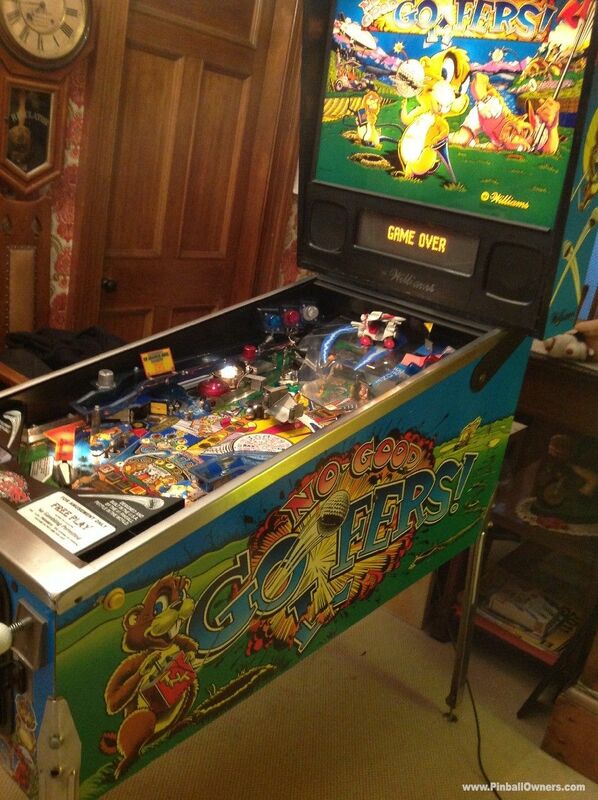 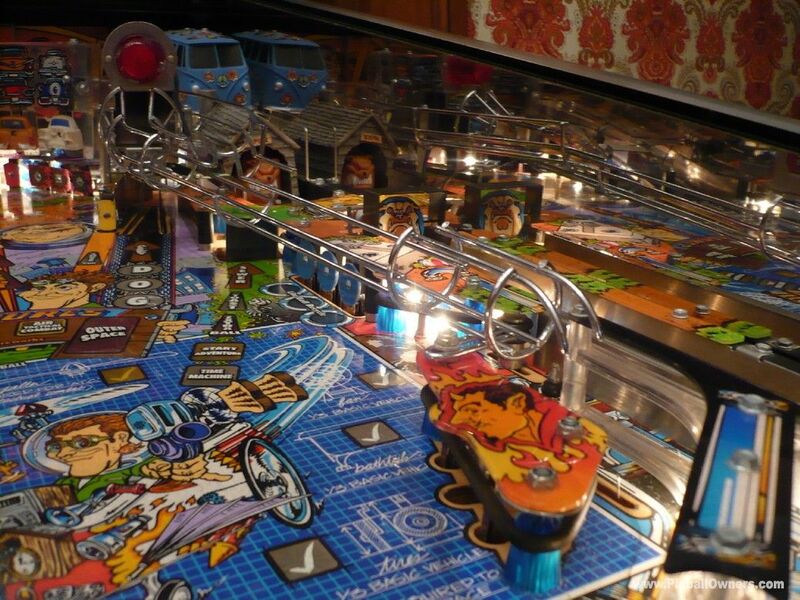 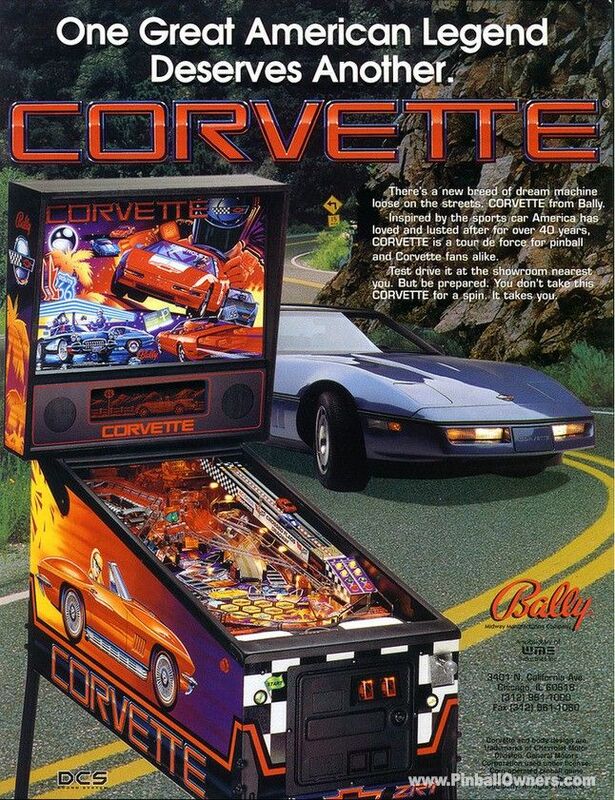 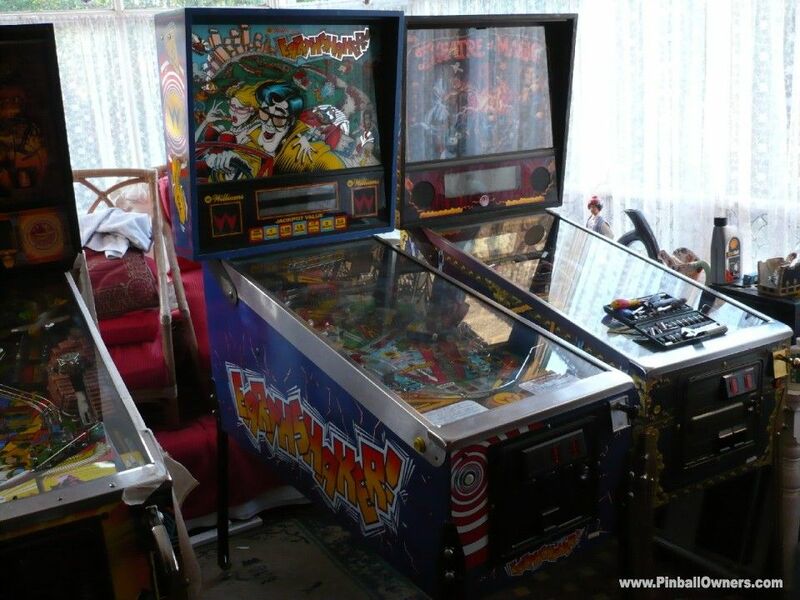 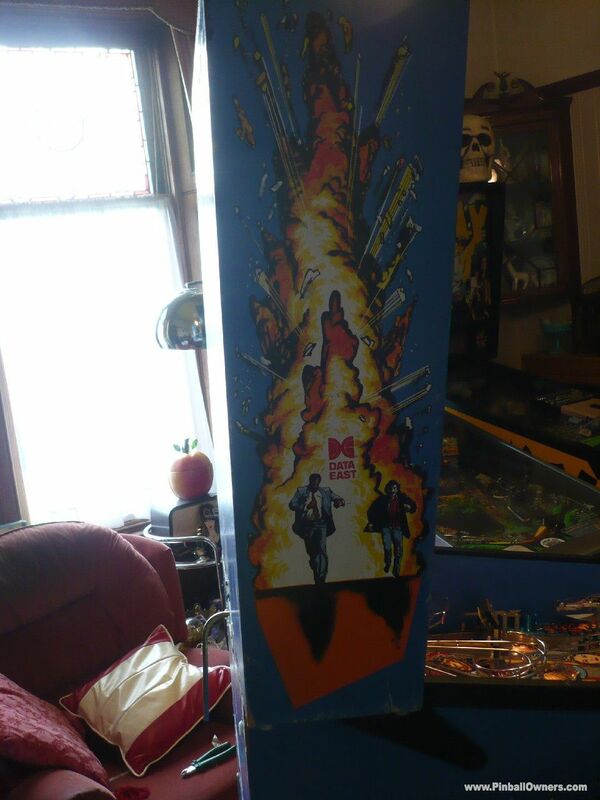 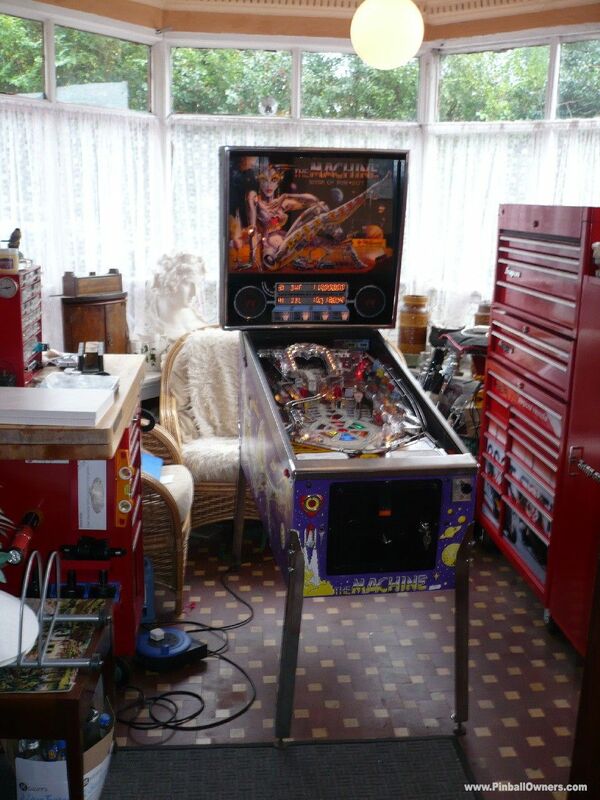 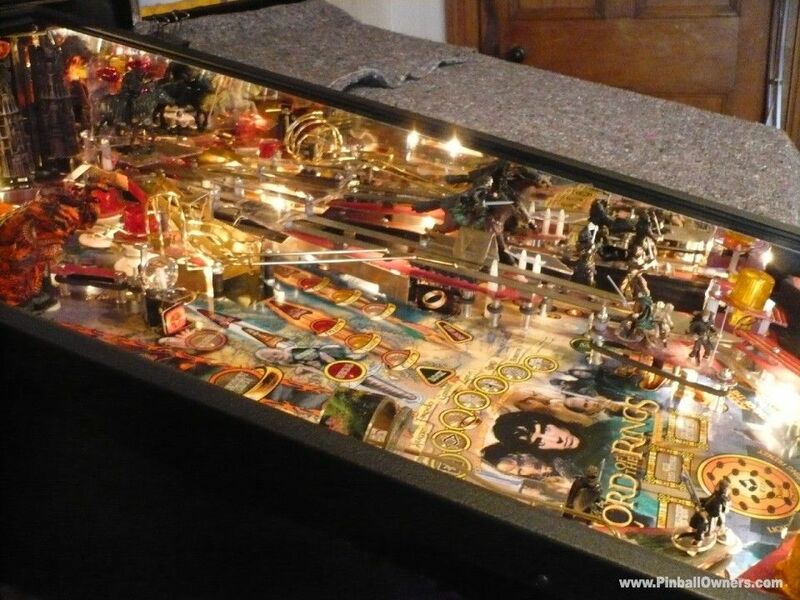 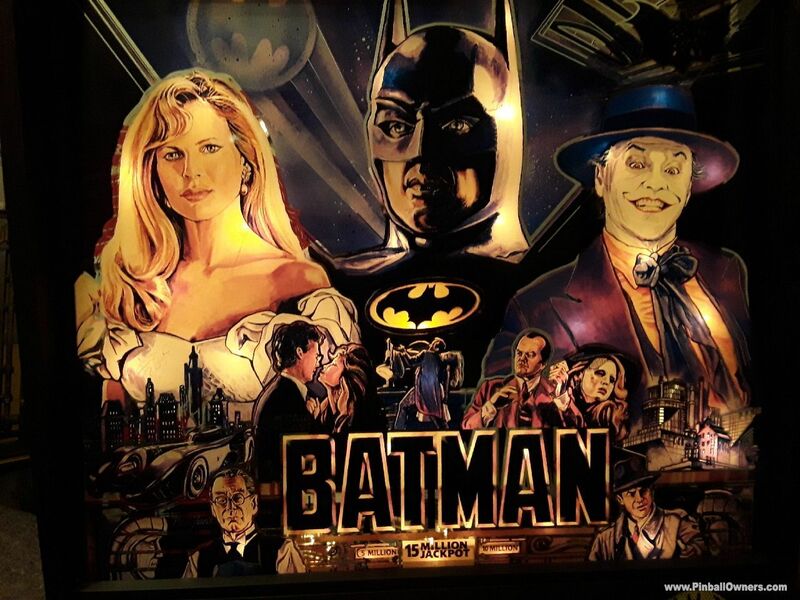 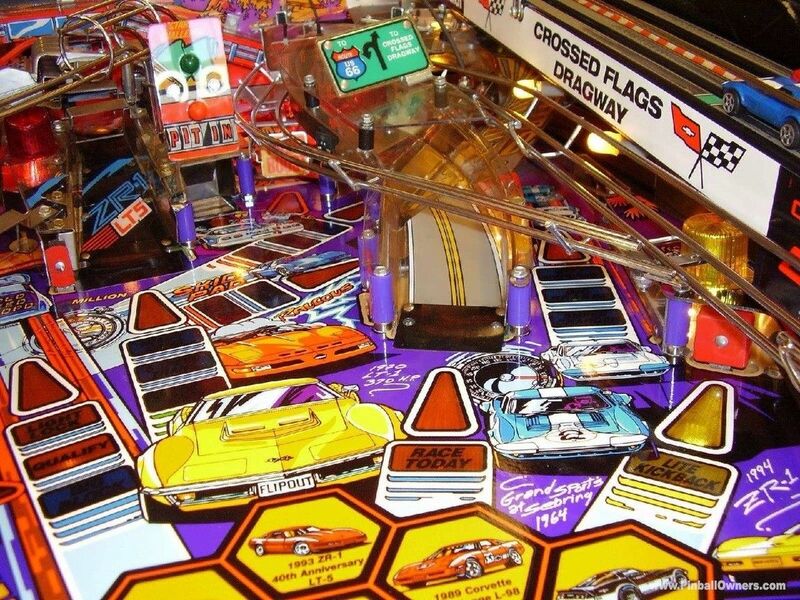 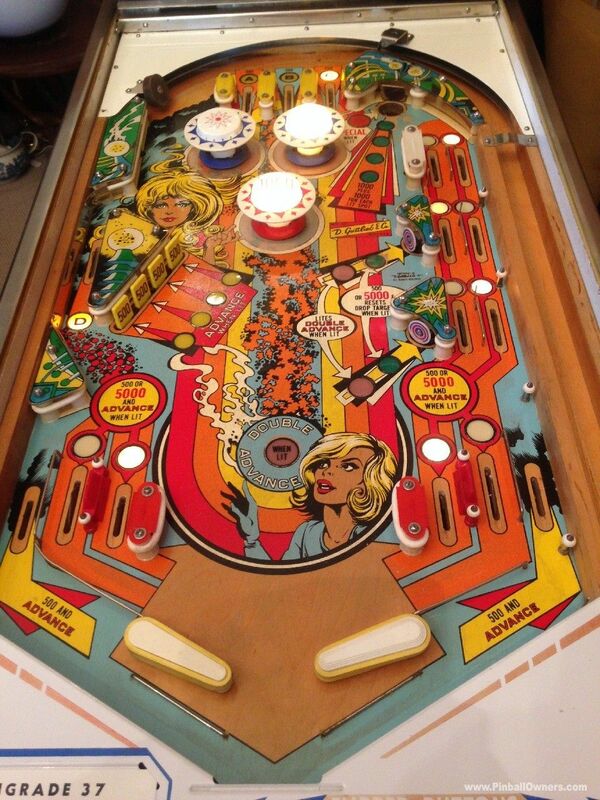 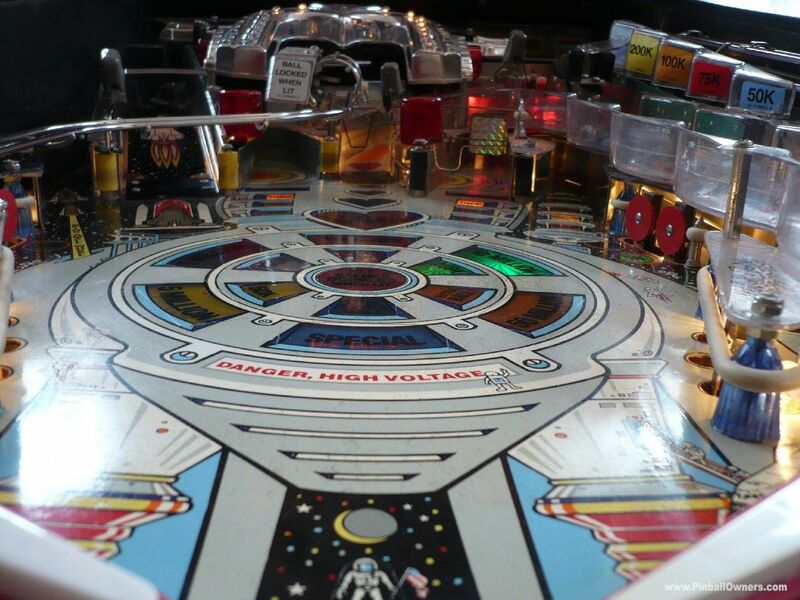 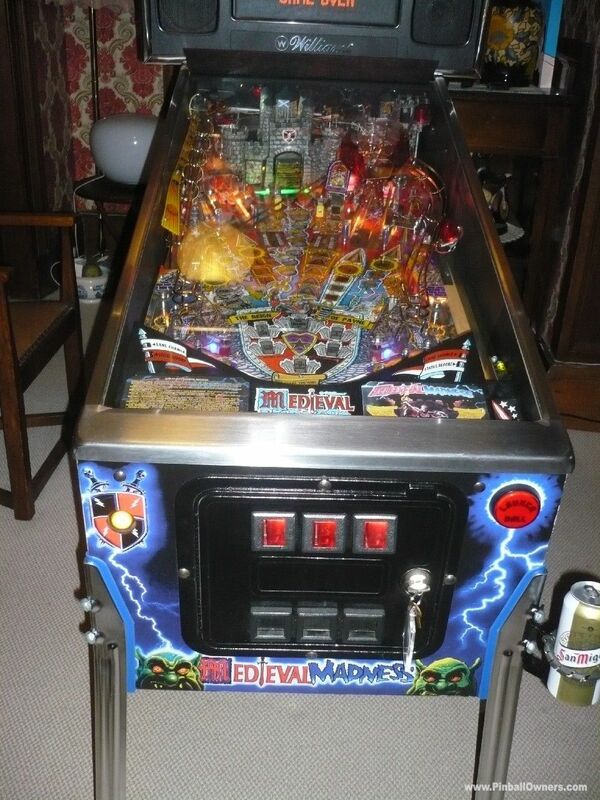 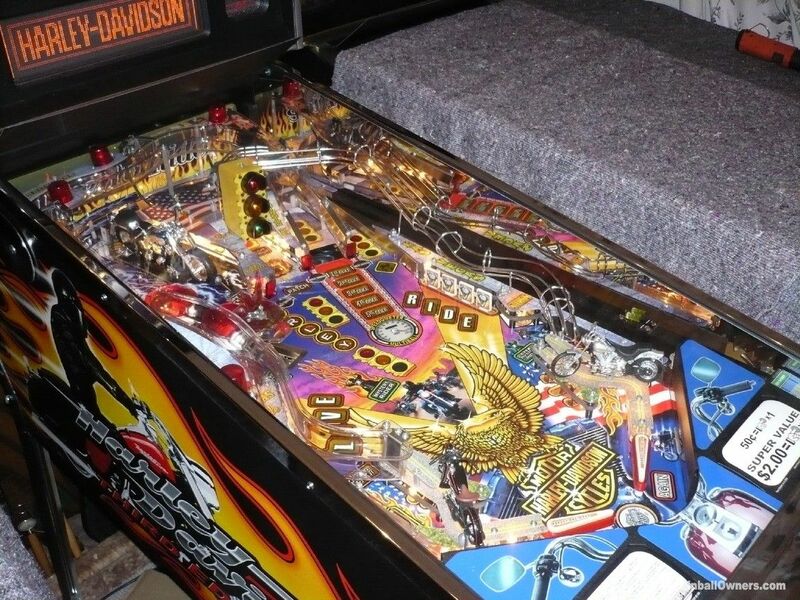 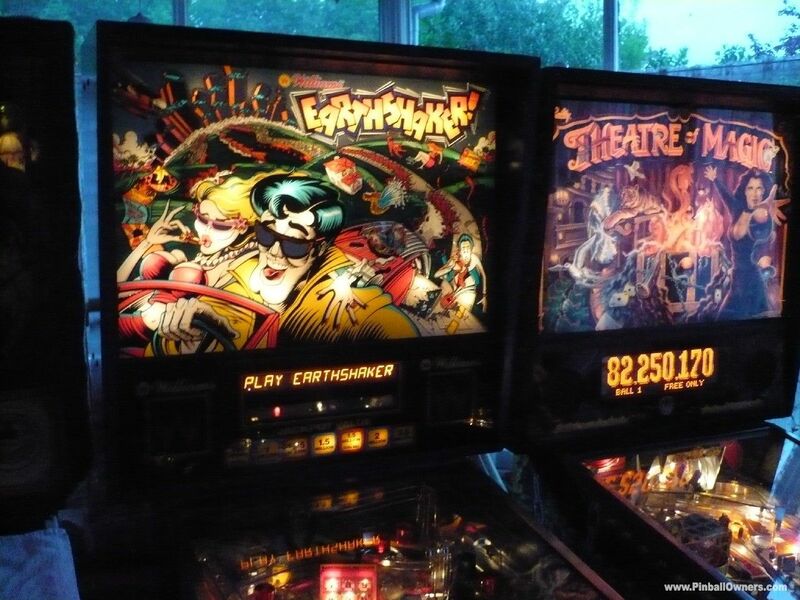 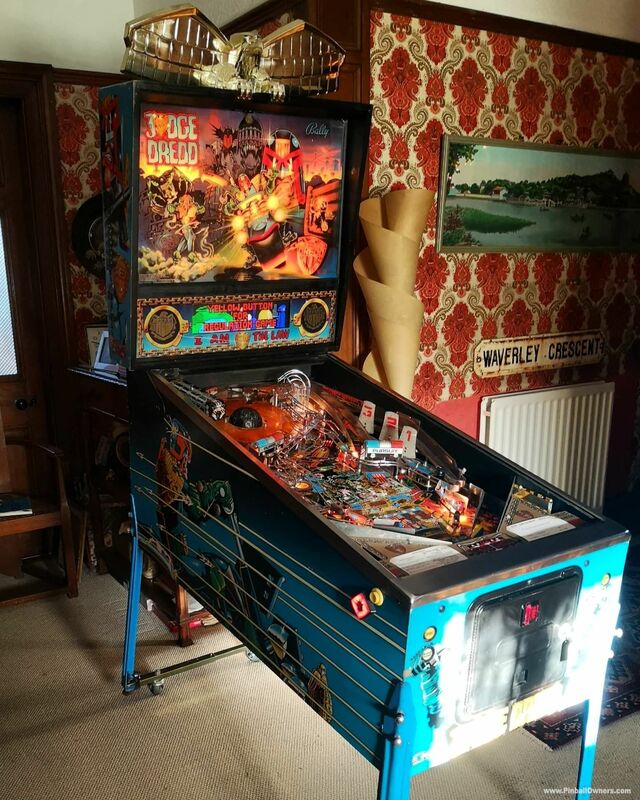 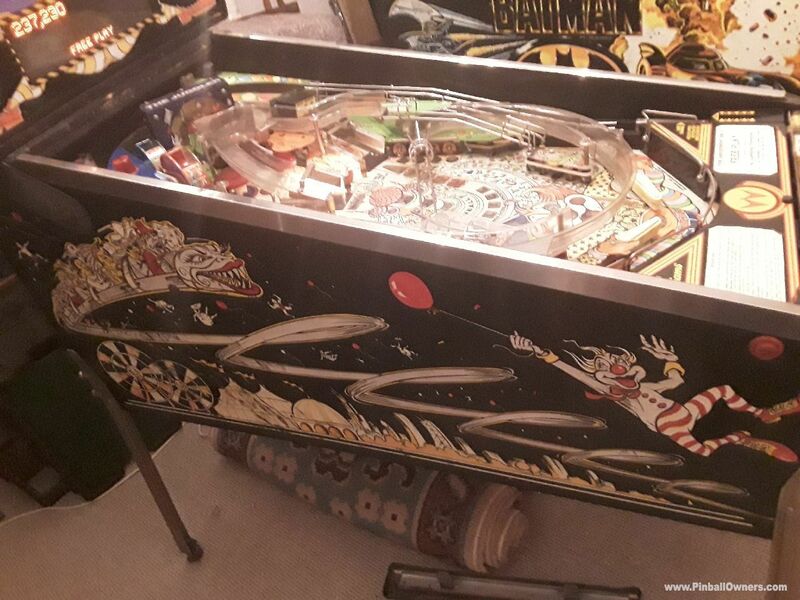 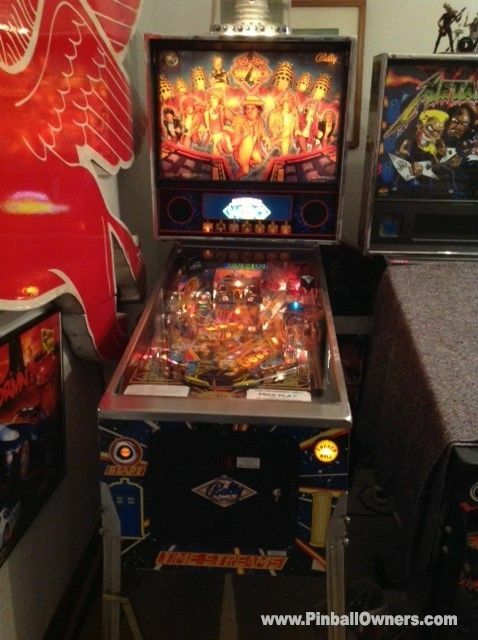 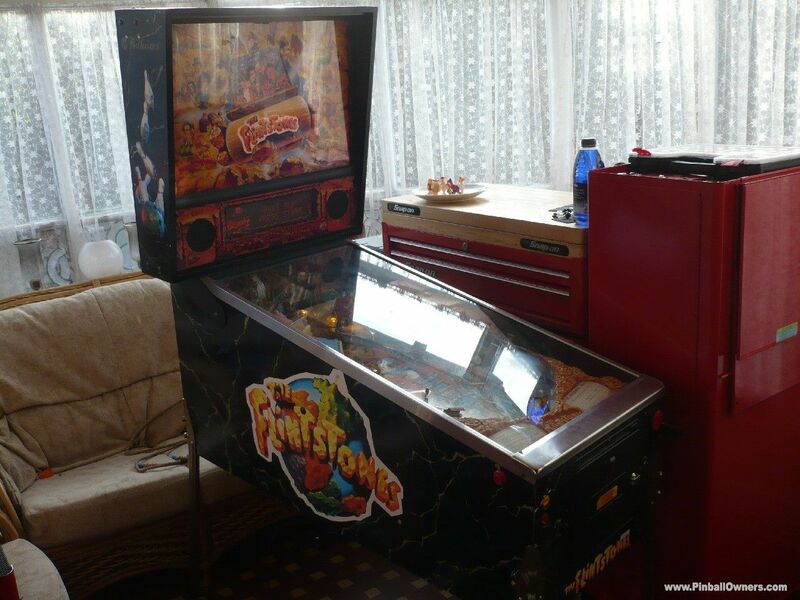 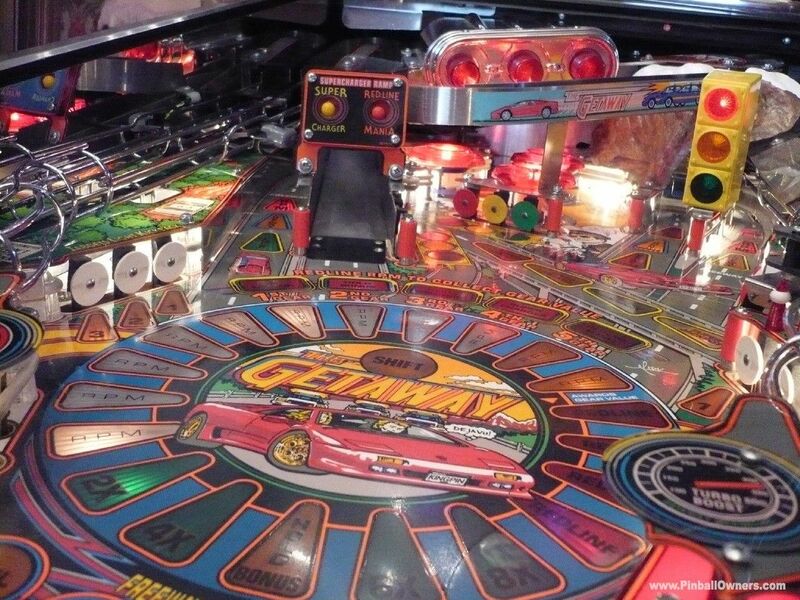 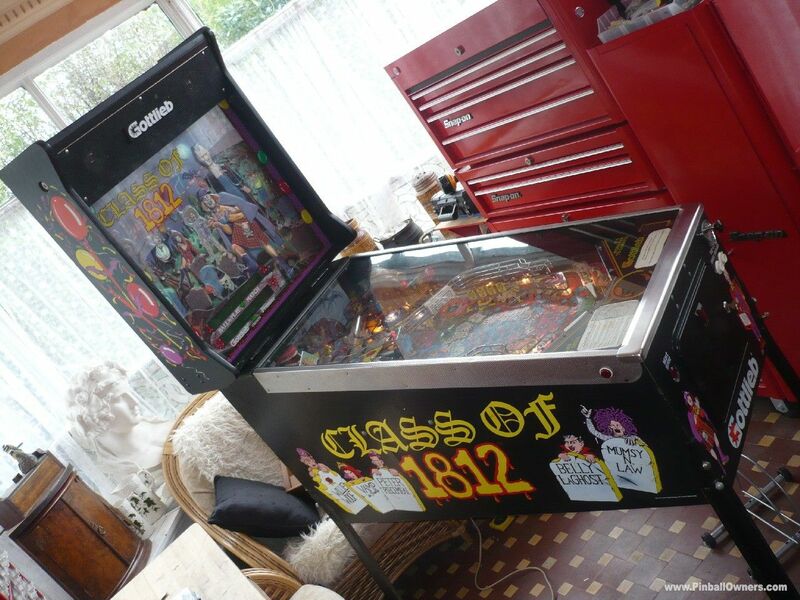 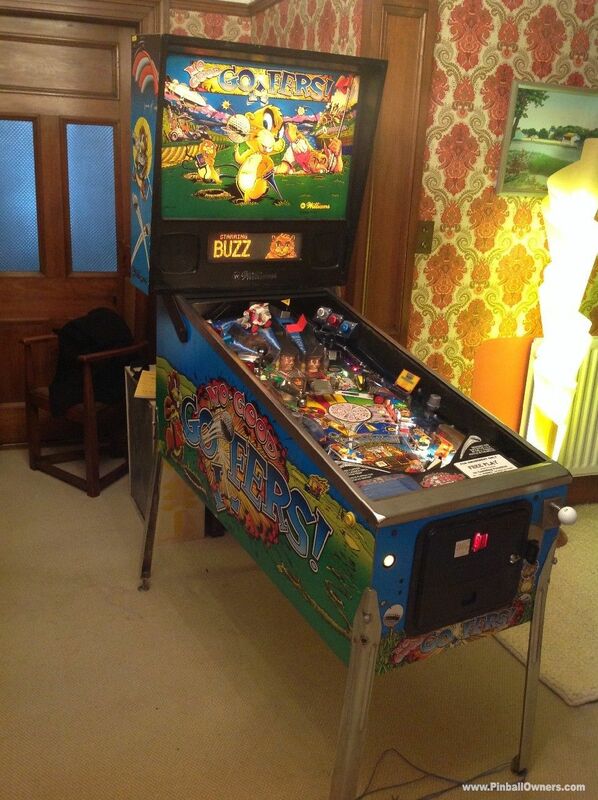 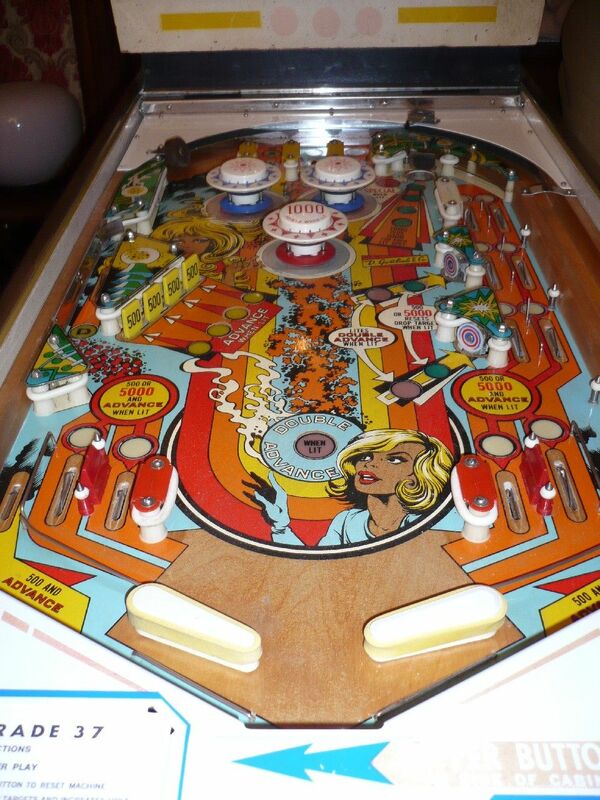 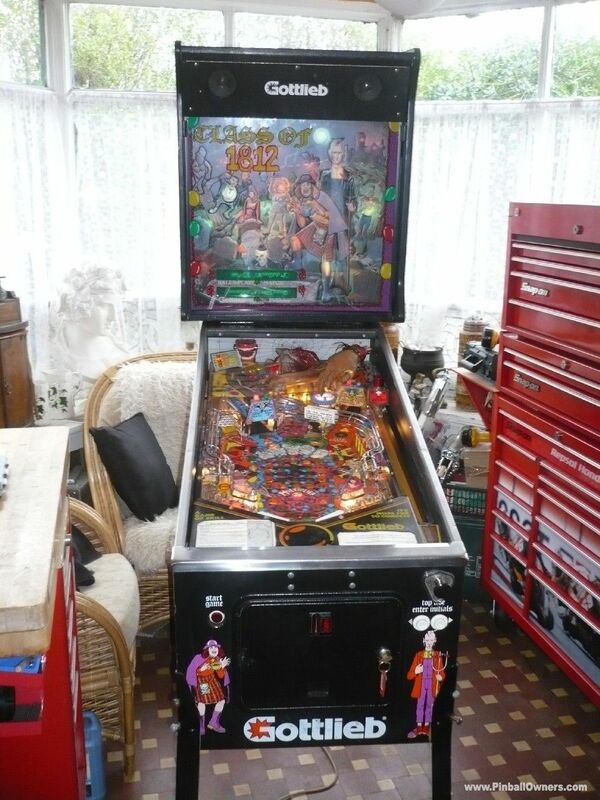 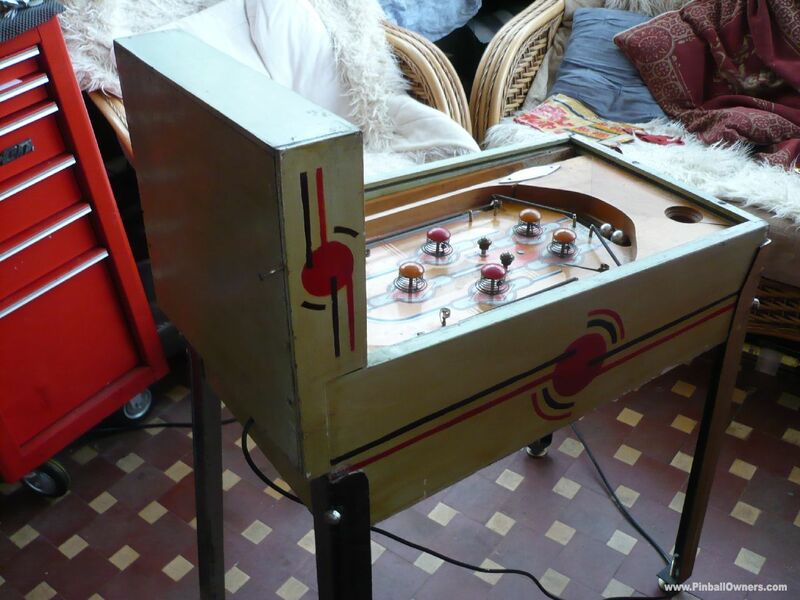 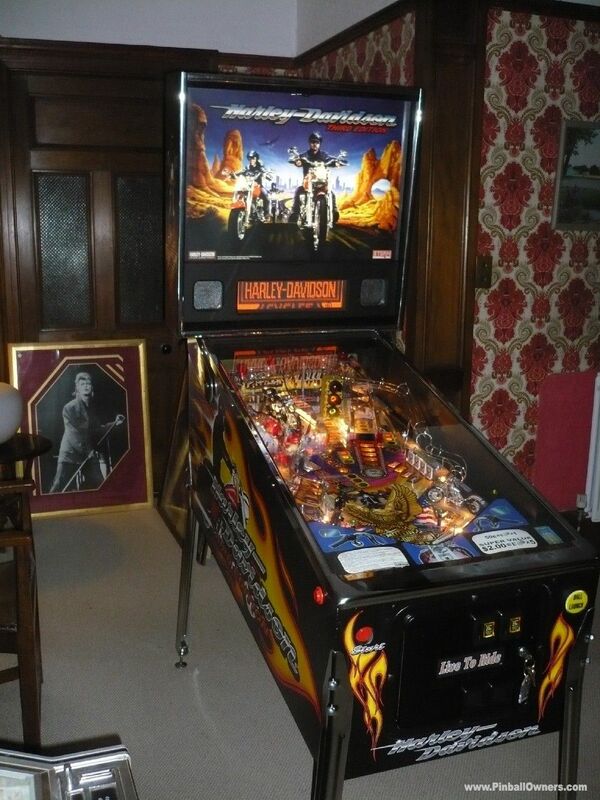 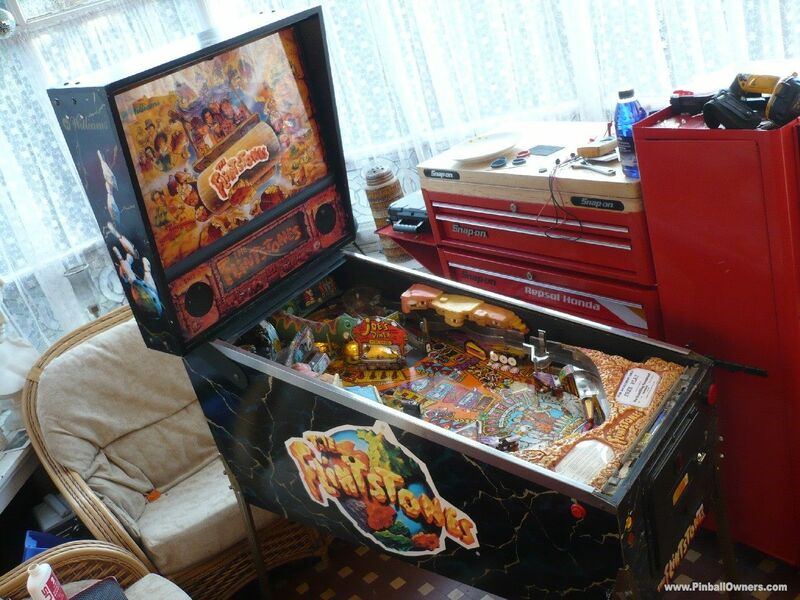 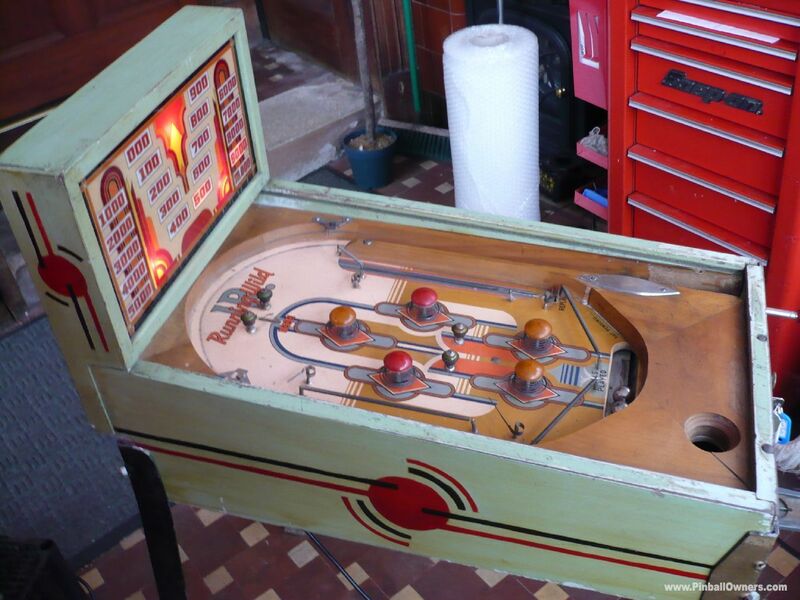 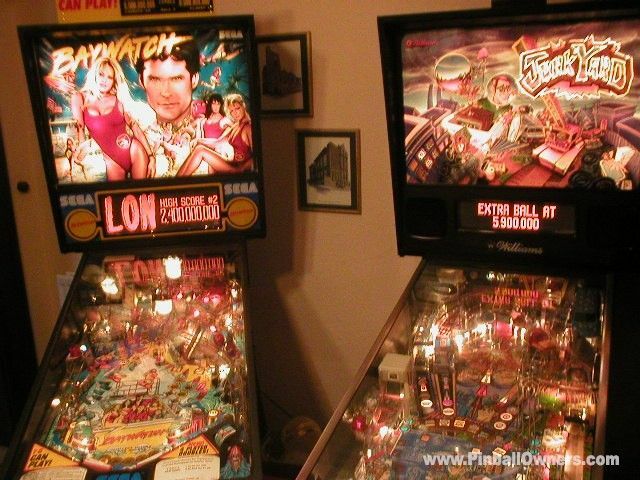 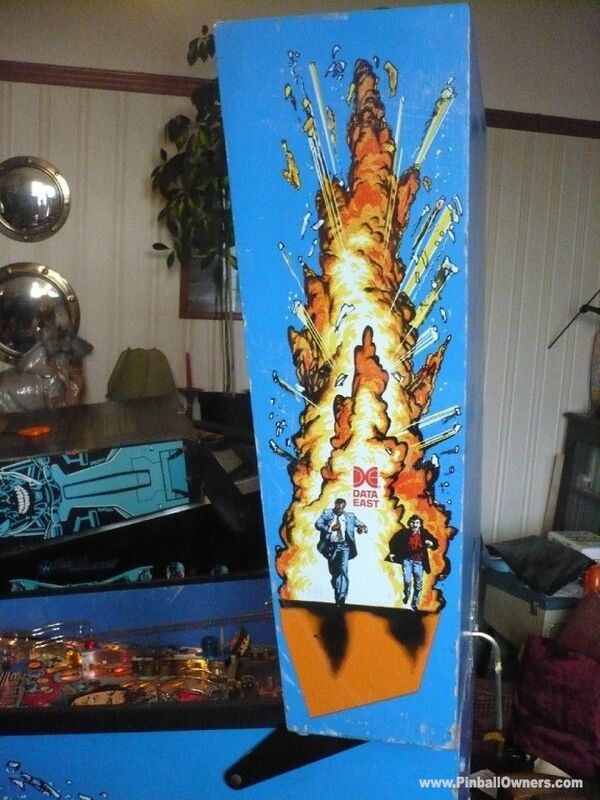 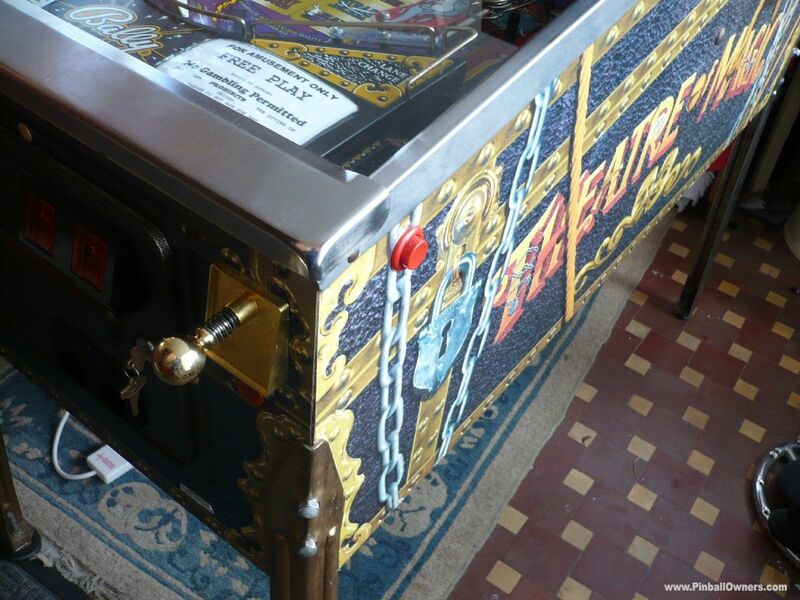 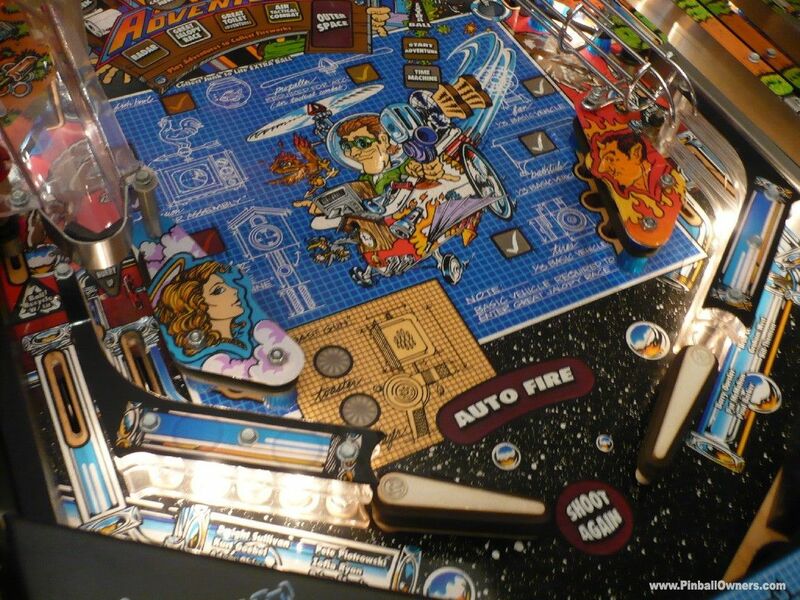 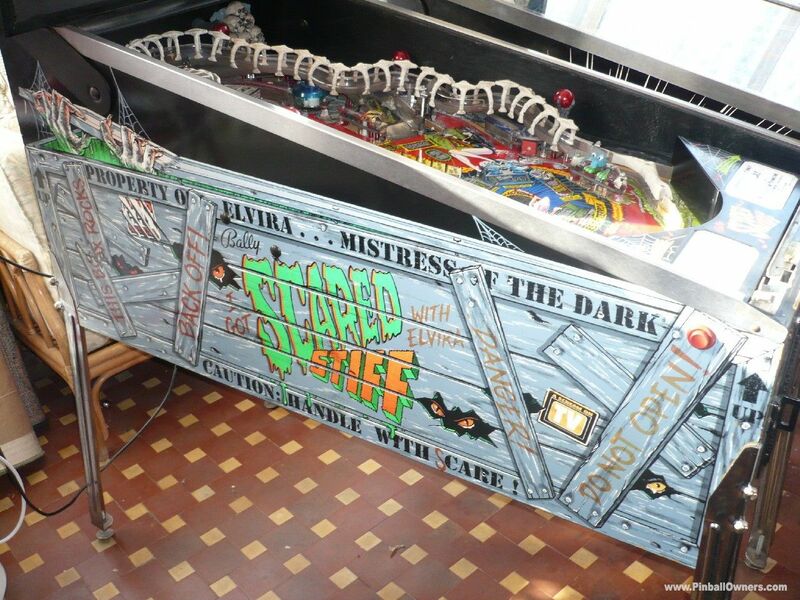 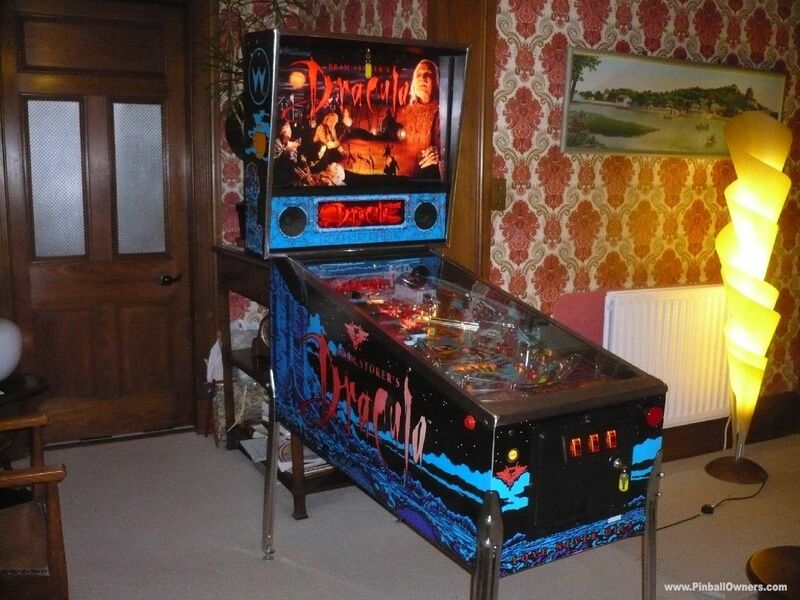 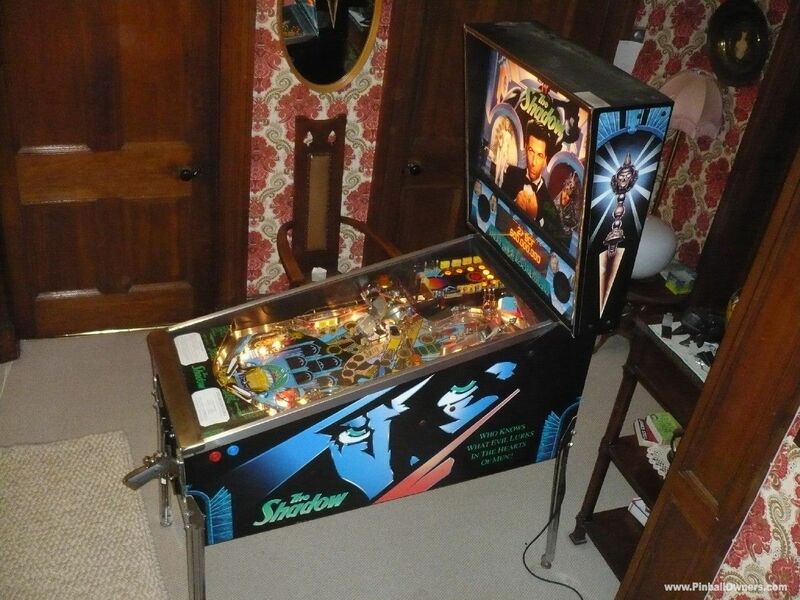 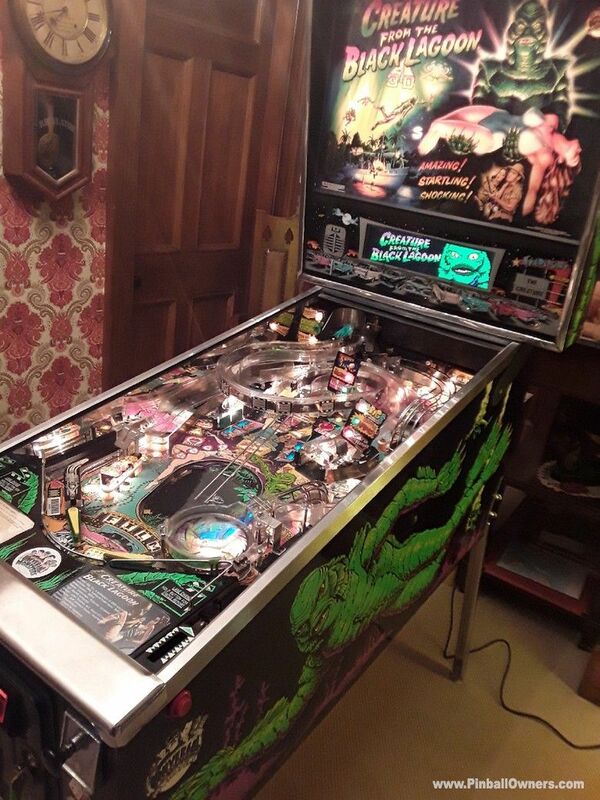 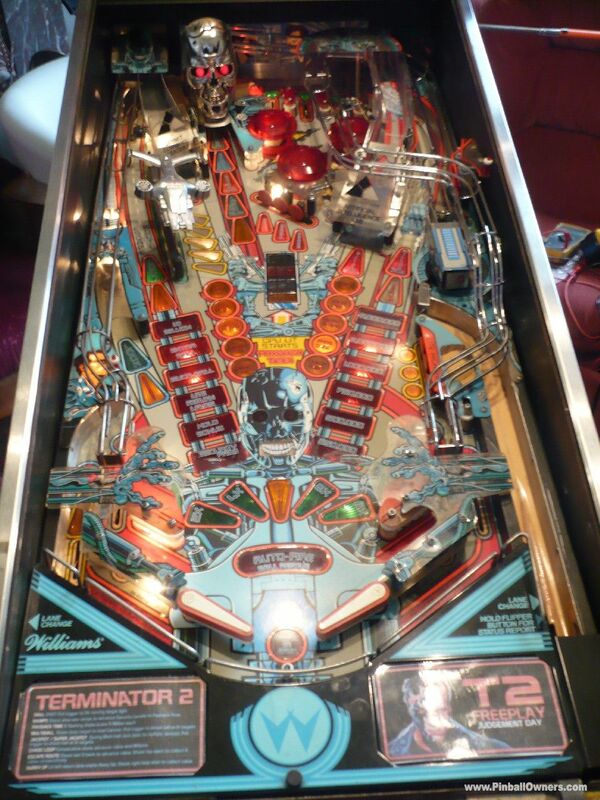 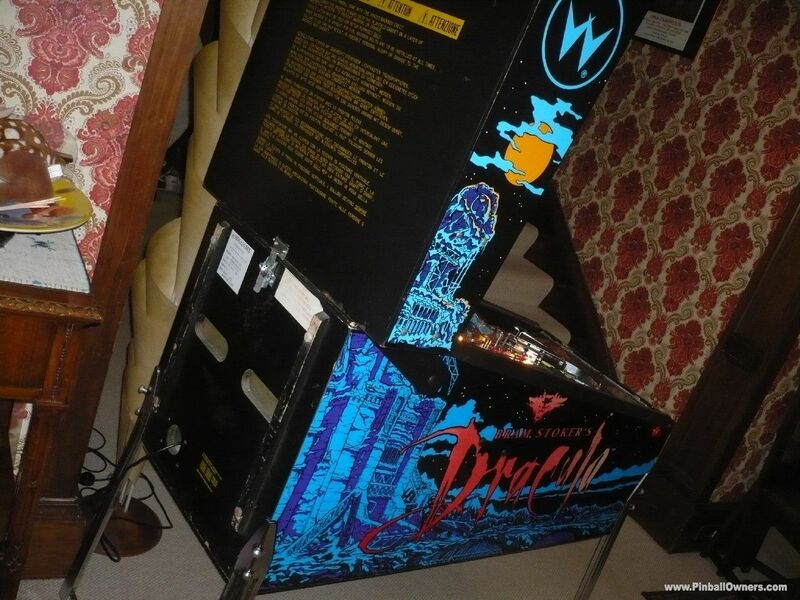 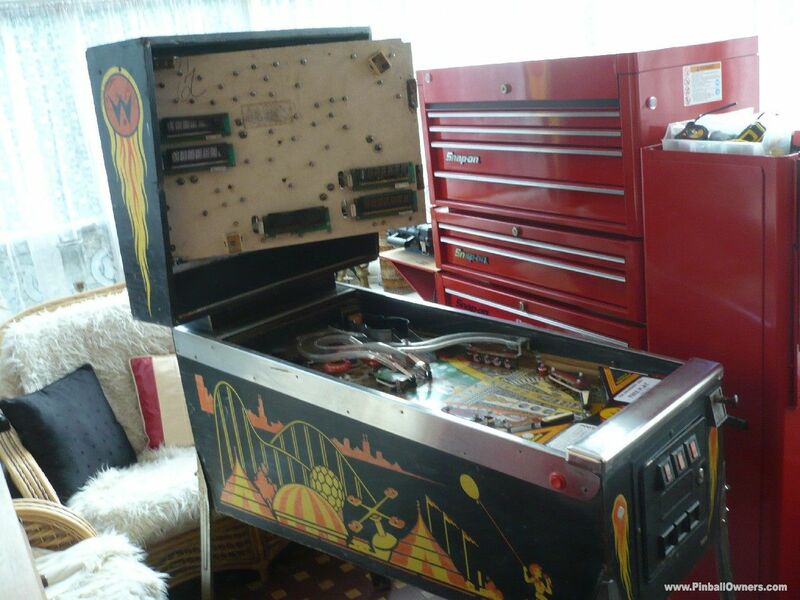 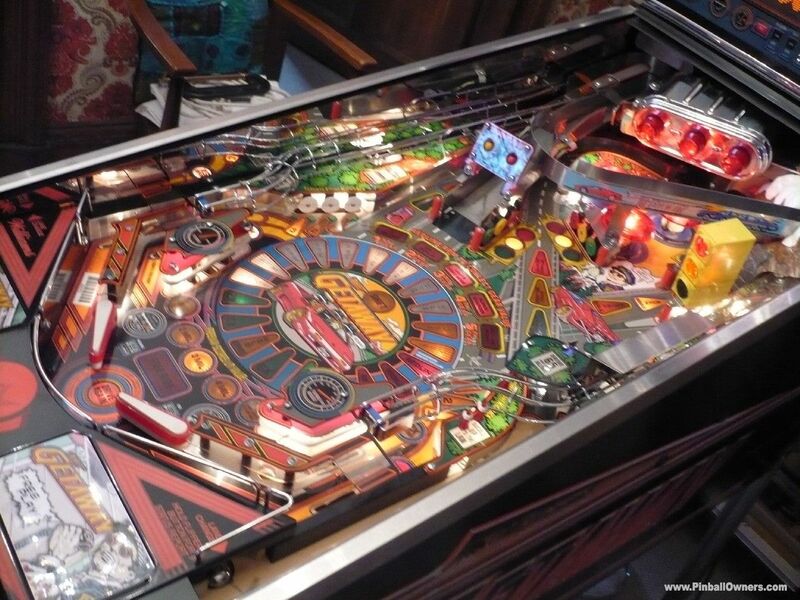 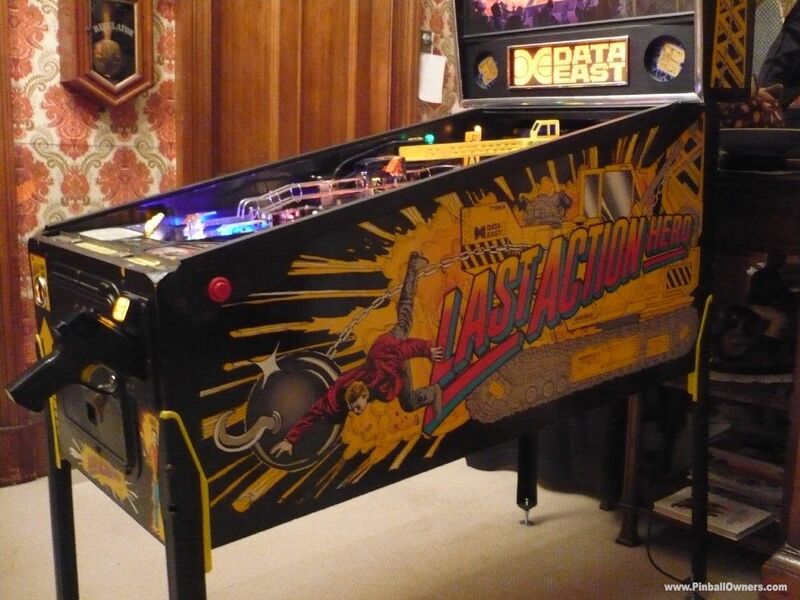 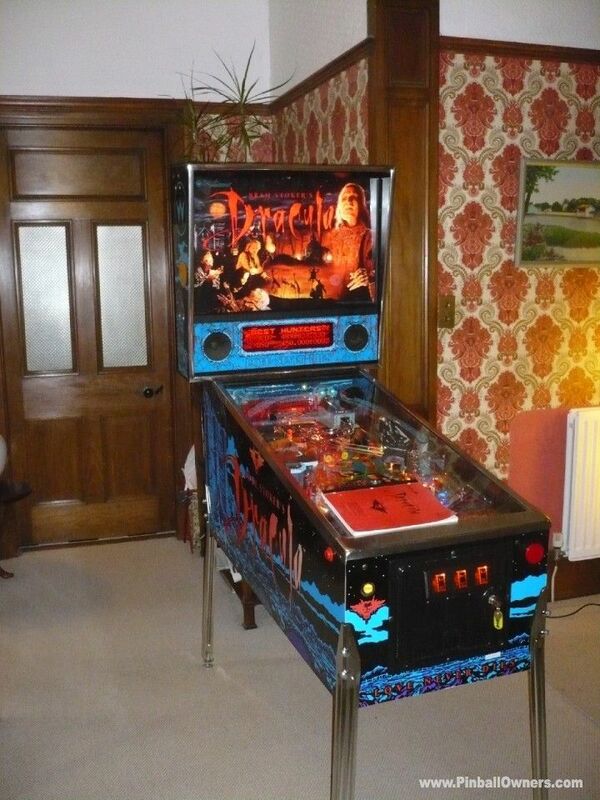 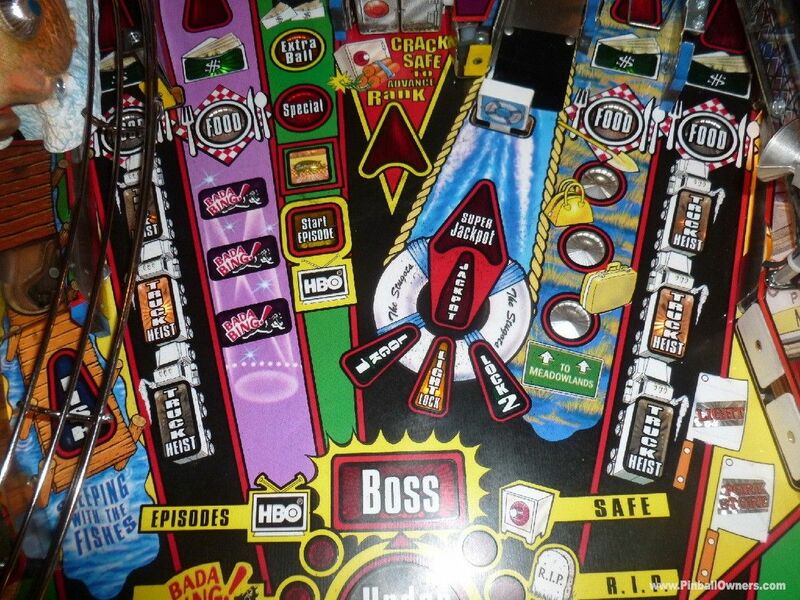 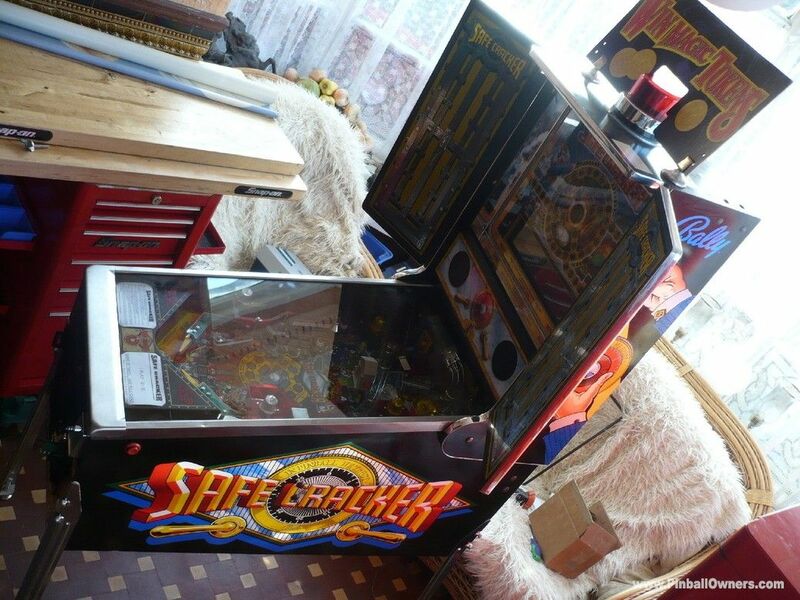 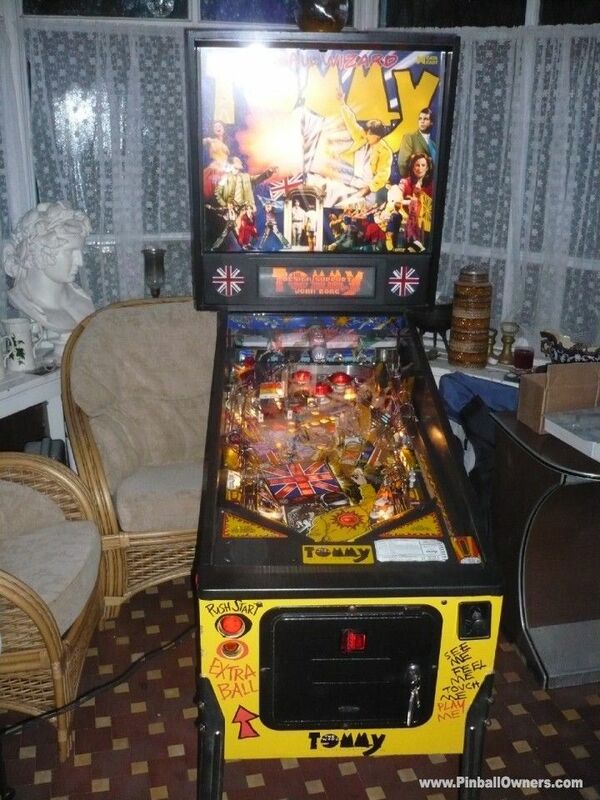 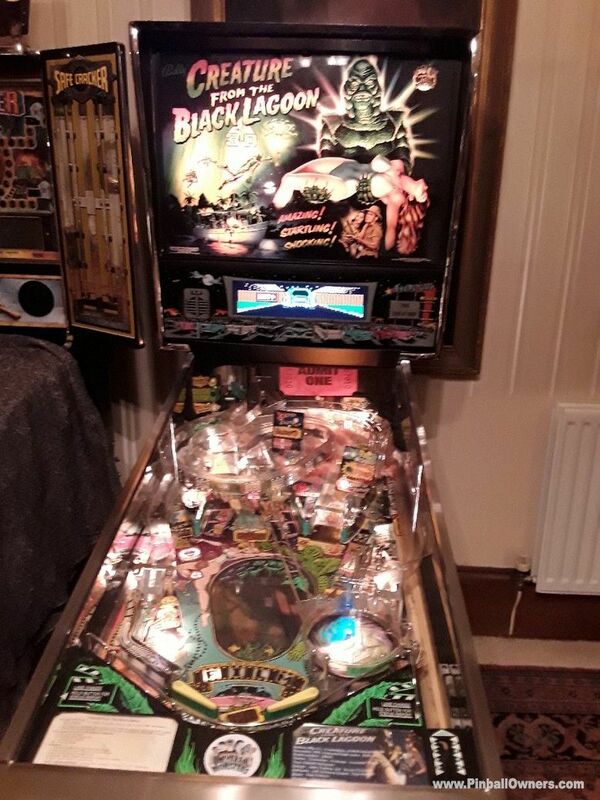 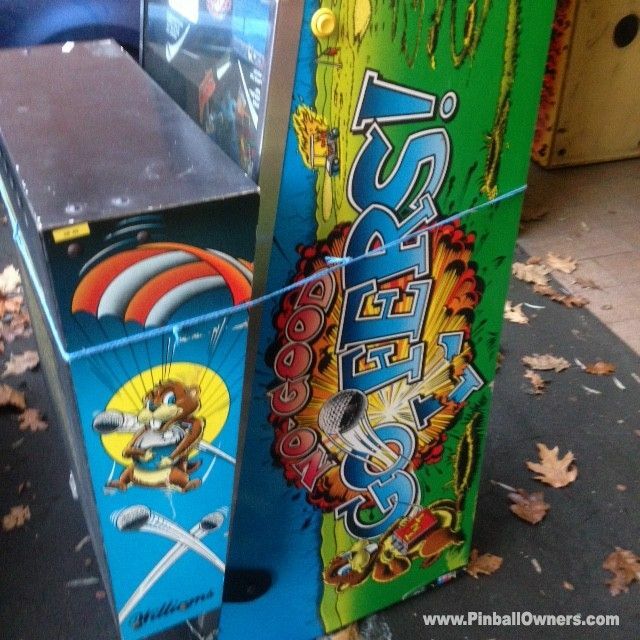 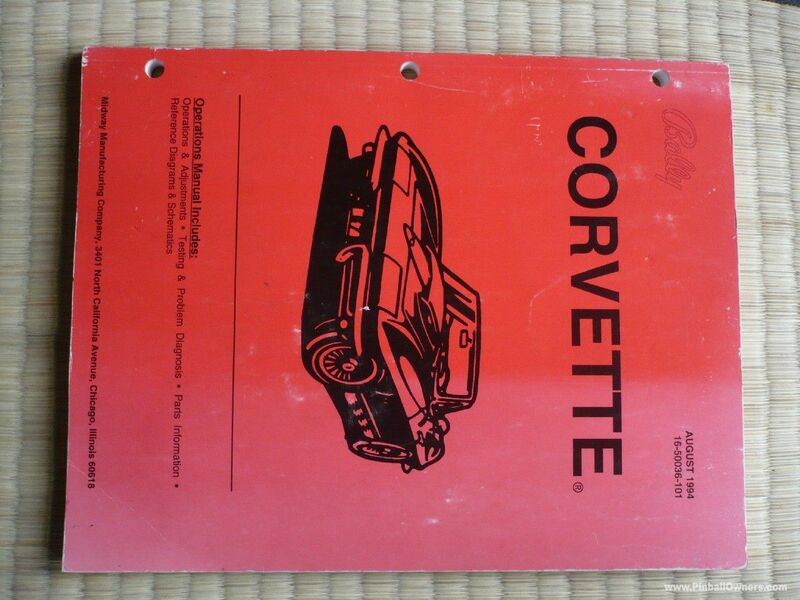 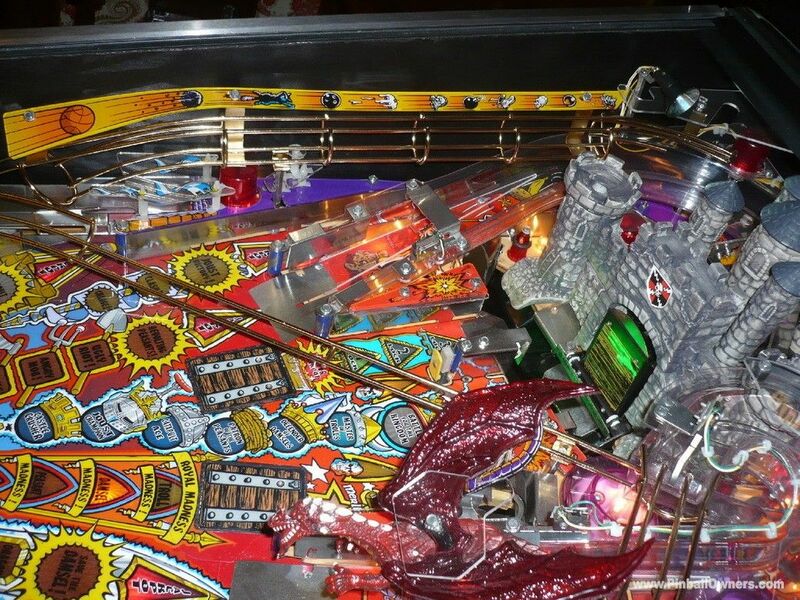 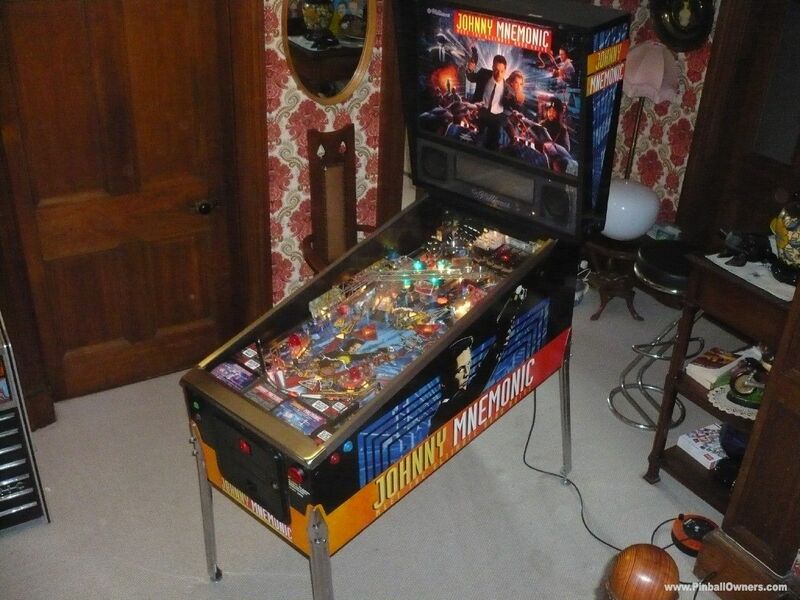 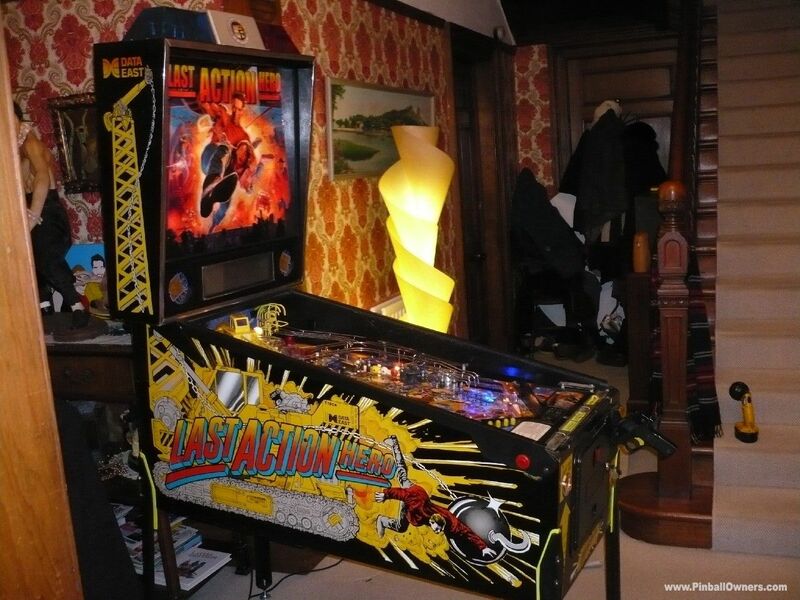 CORVETTE Bally (USA) Monté, jouable Jamais 1994 (August) Flawless cabinet n great playfield. 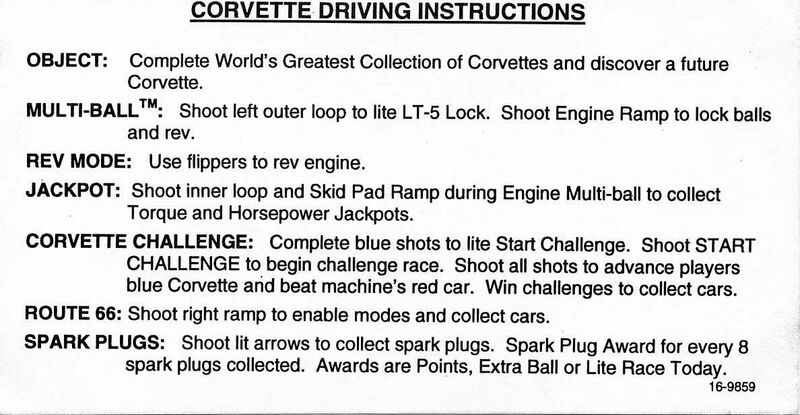 Feature corvette engine works as it should. 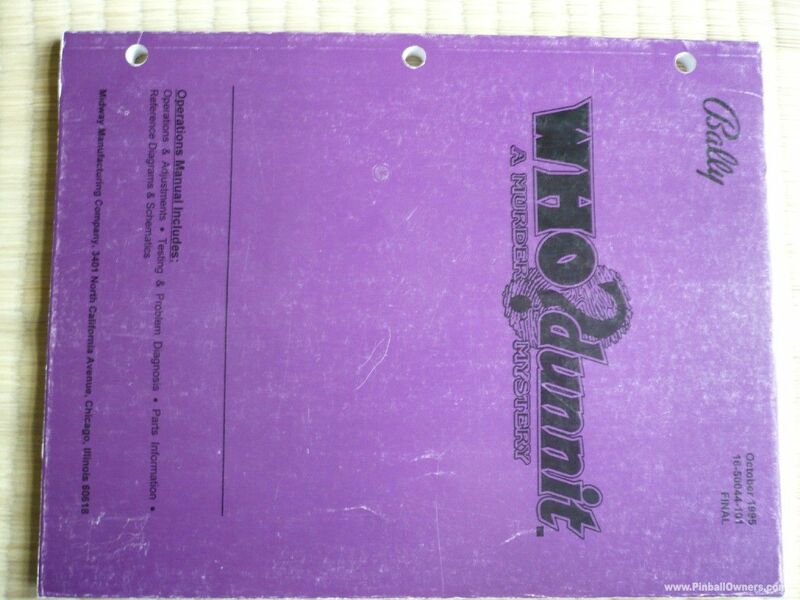 Like how the mystery translite is incorporated into the game. 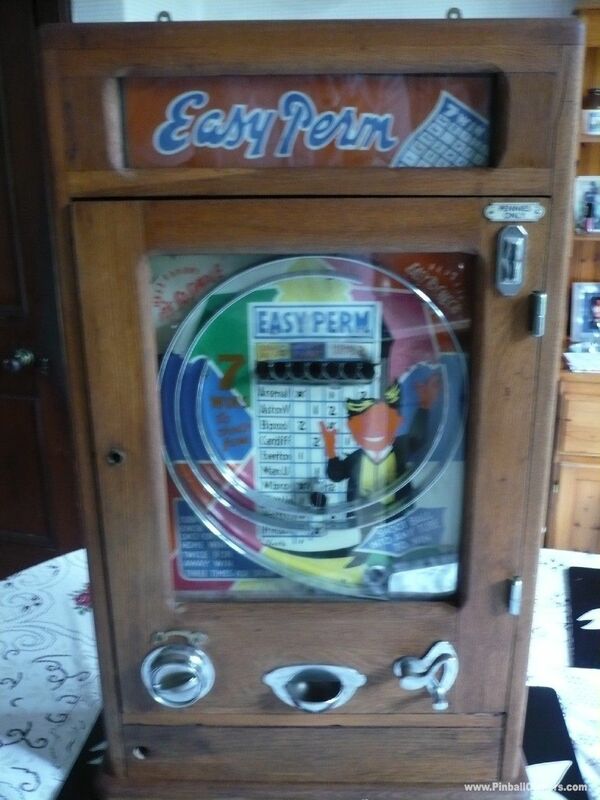 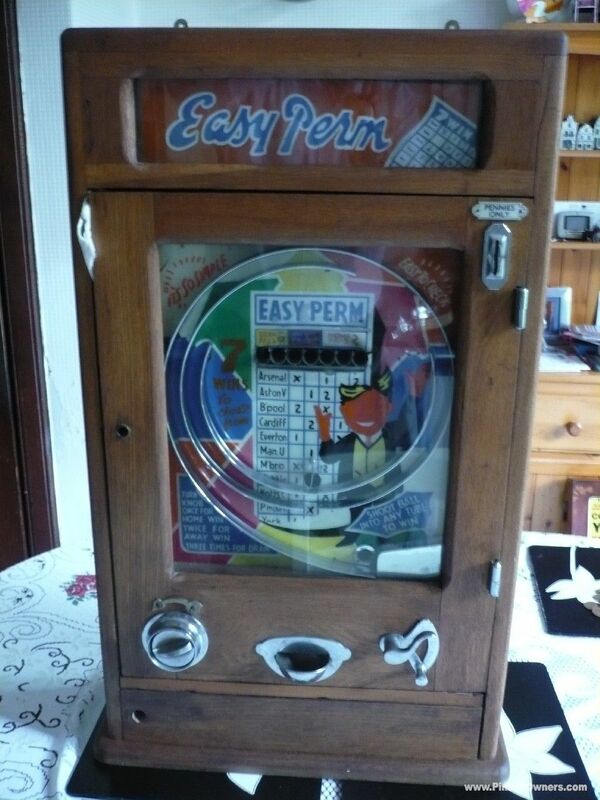 EASY PERM autre (voient les notes) Démonté, fonctionnant Jamais 1960's wall hung Allwin 7 cup machine. 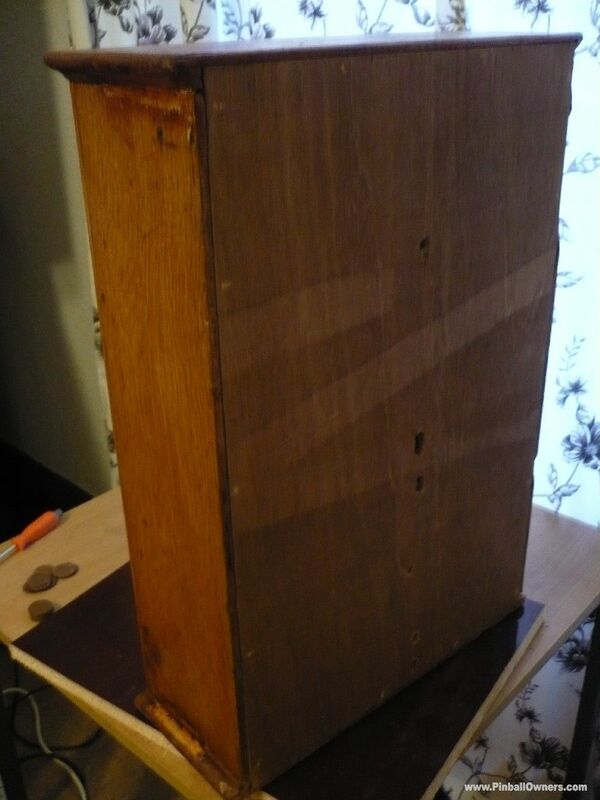 Solid oak cabinet. 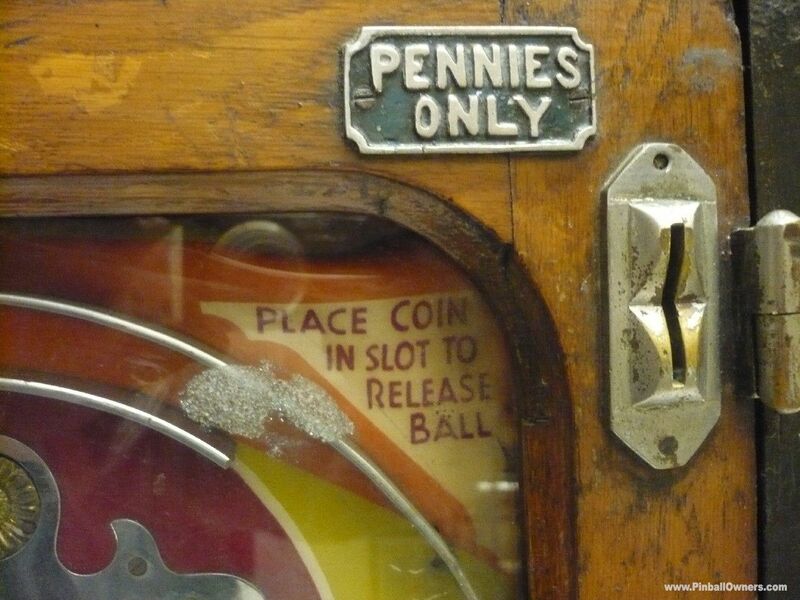 Coin operated on a pre decimal 30mm penny. 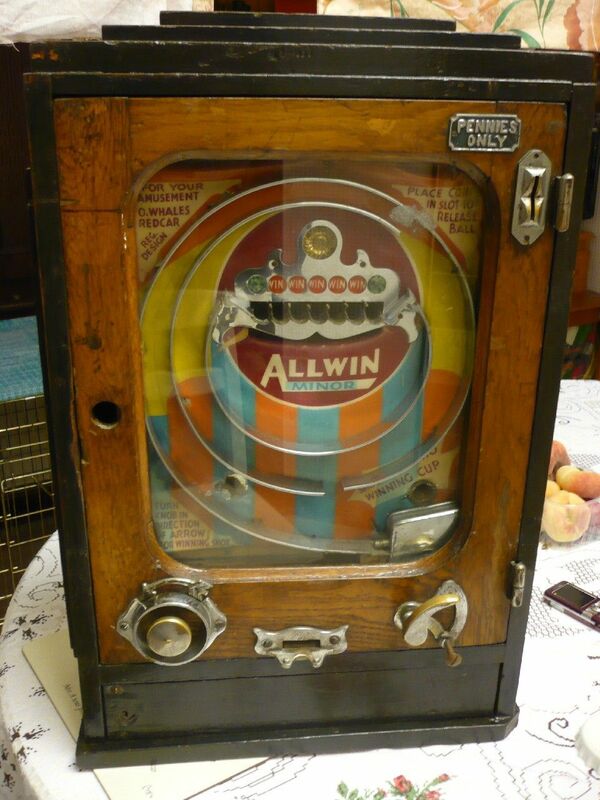 I love the mechanical whirring and clanking sounds.. and... the release rattle n clatter of six old pennies on a left cup win. 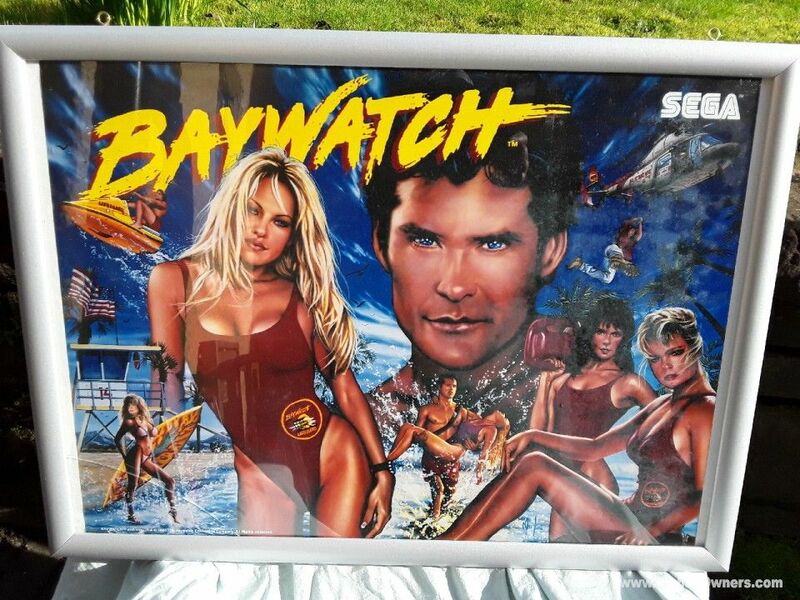 RESERVED. 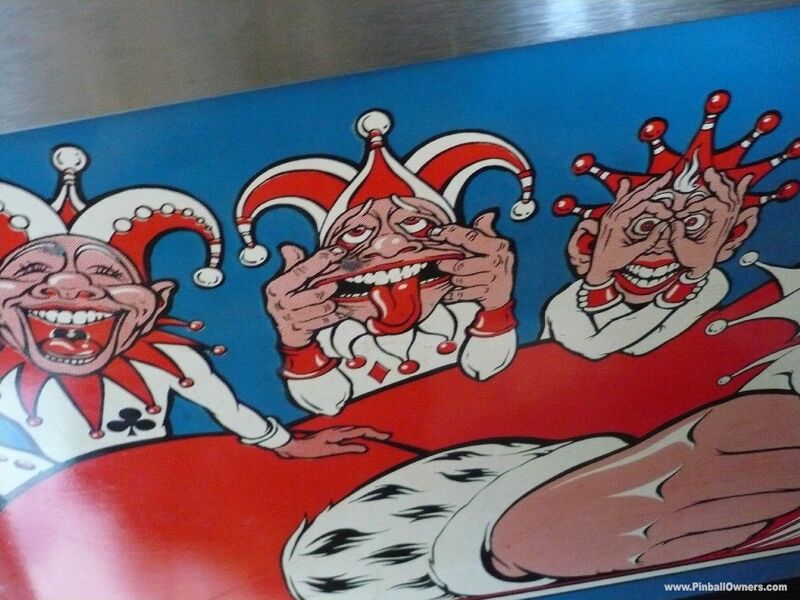 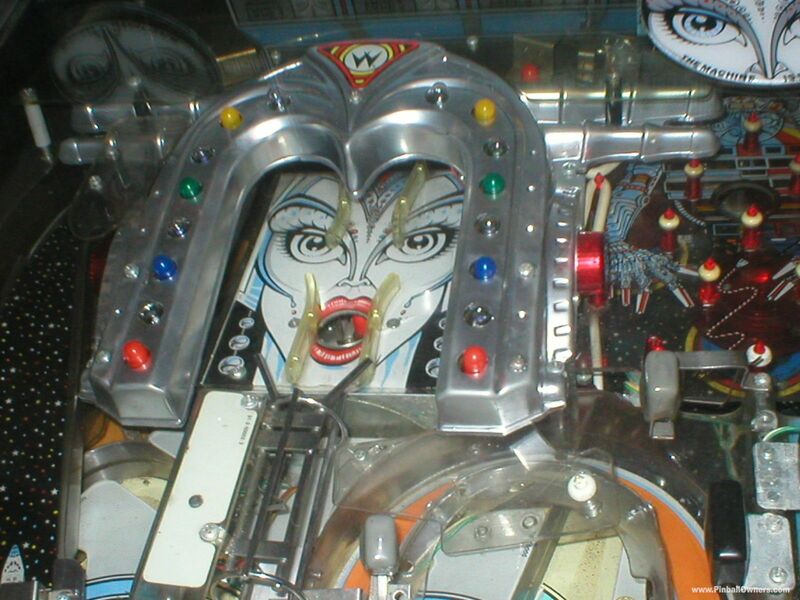 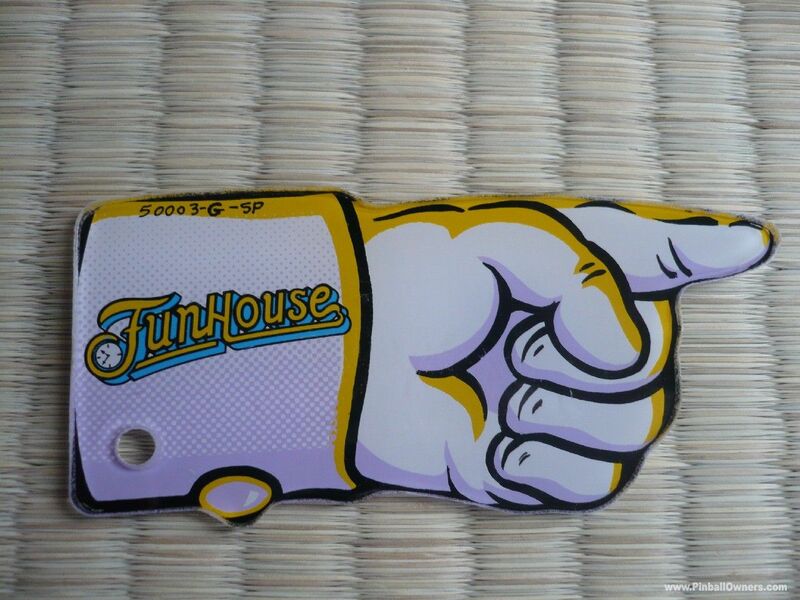 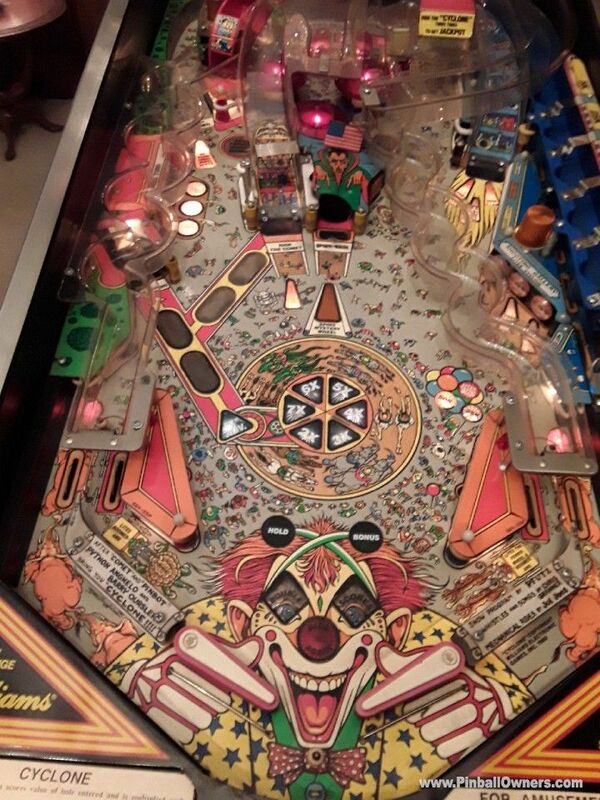 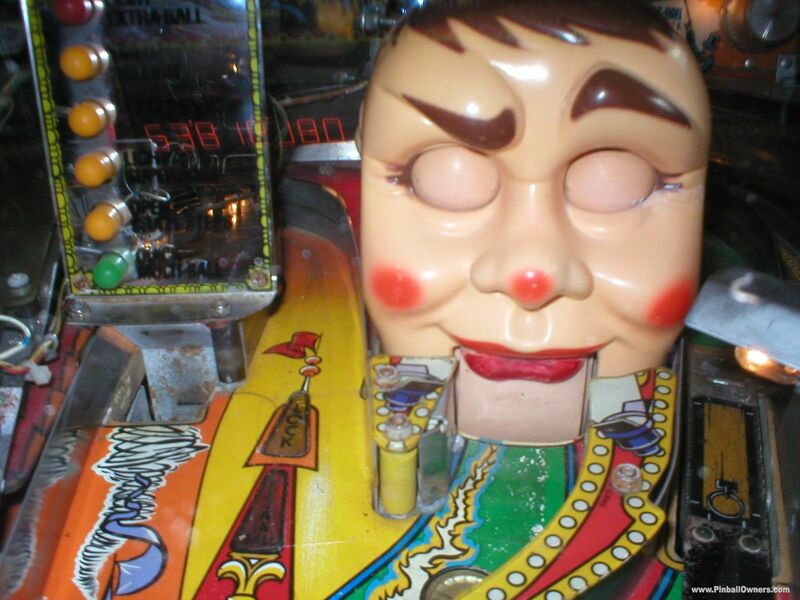 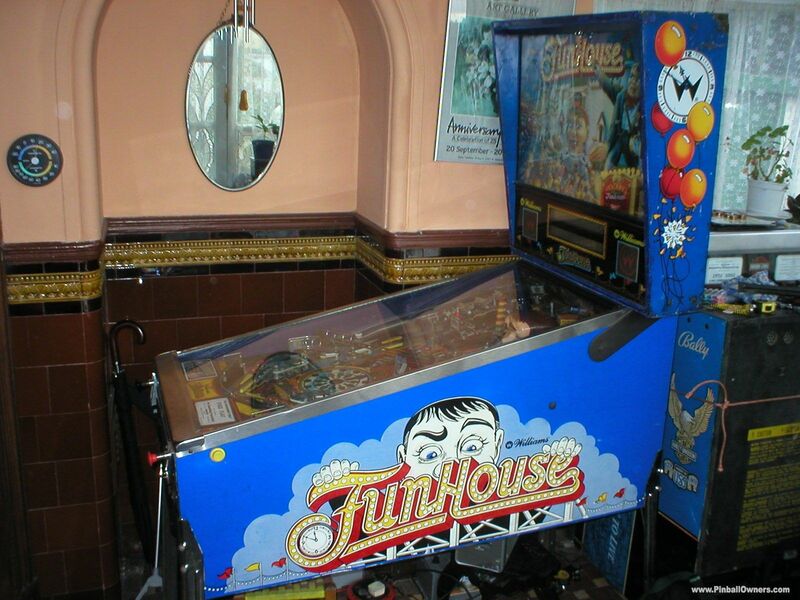 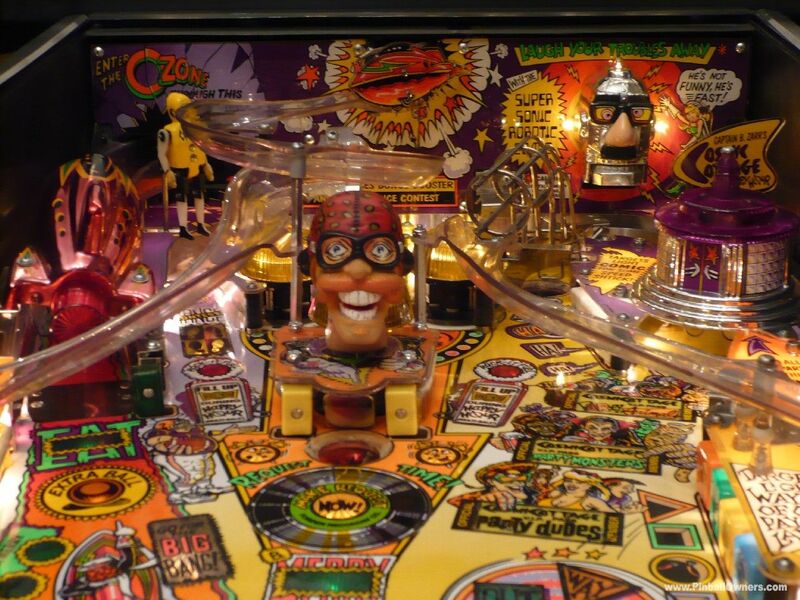 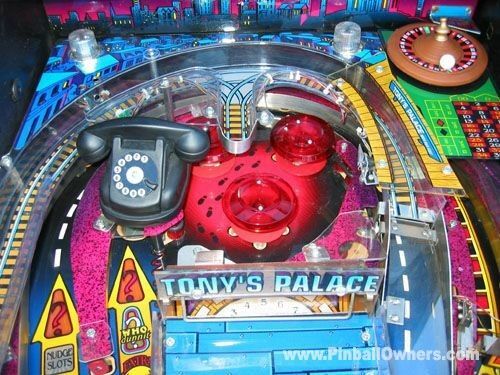 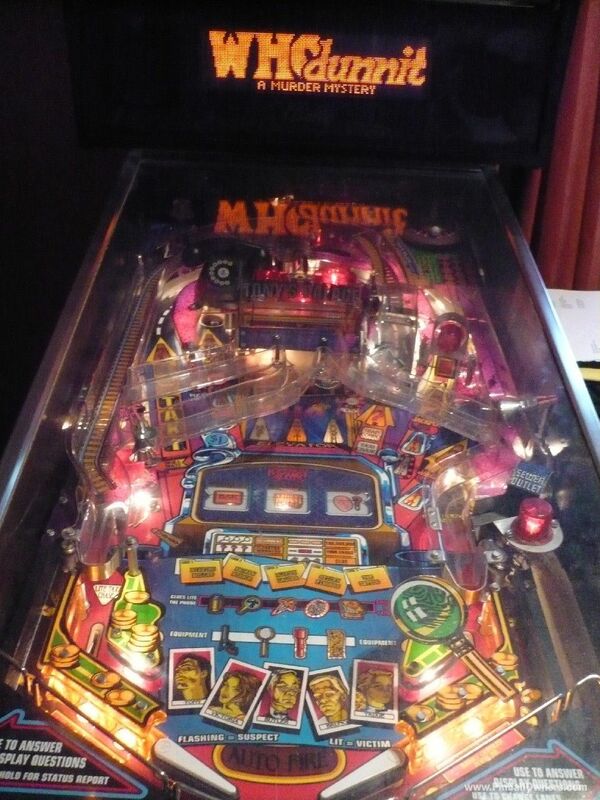 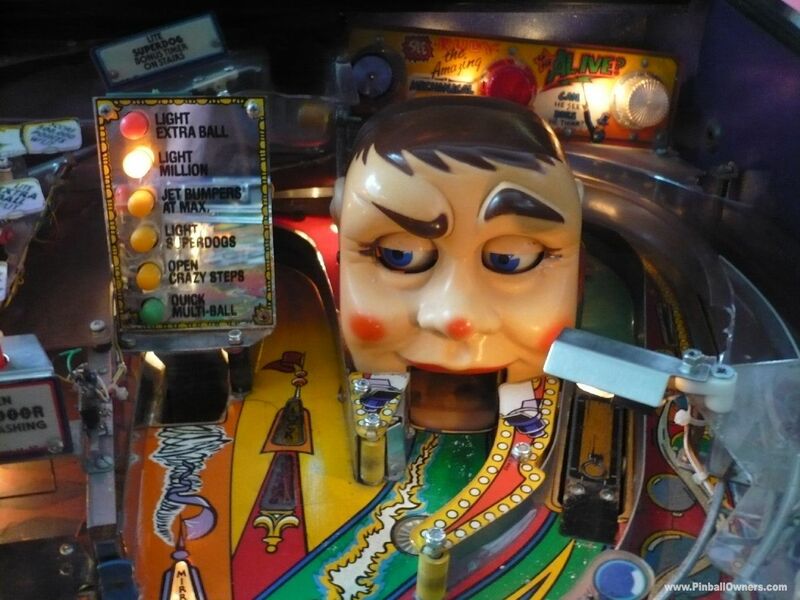 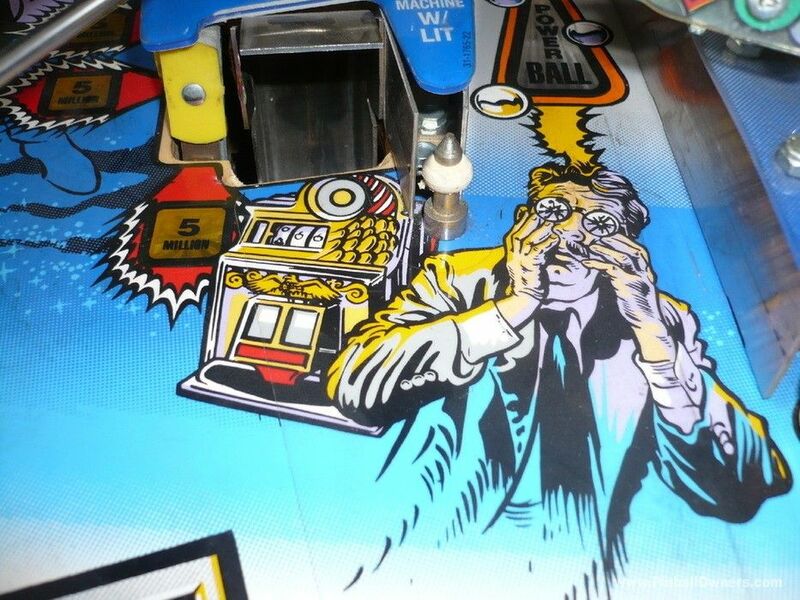 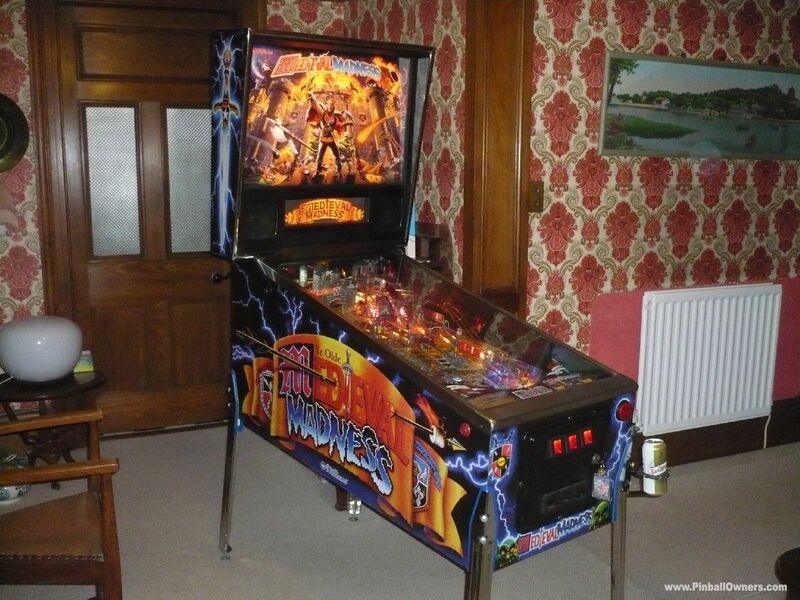 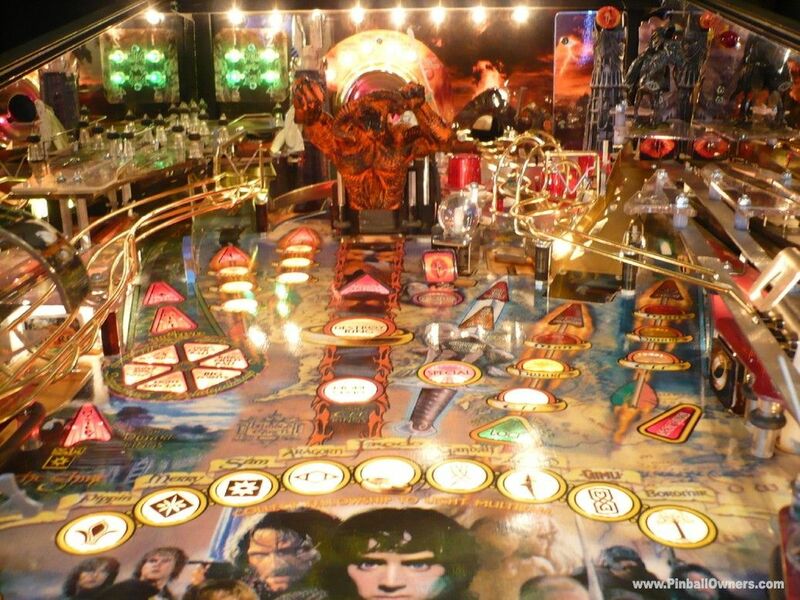 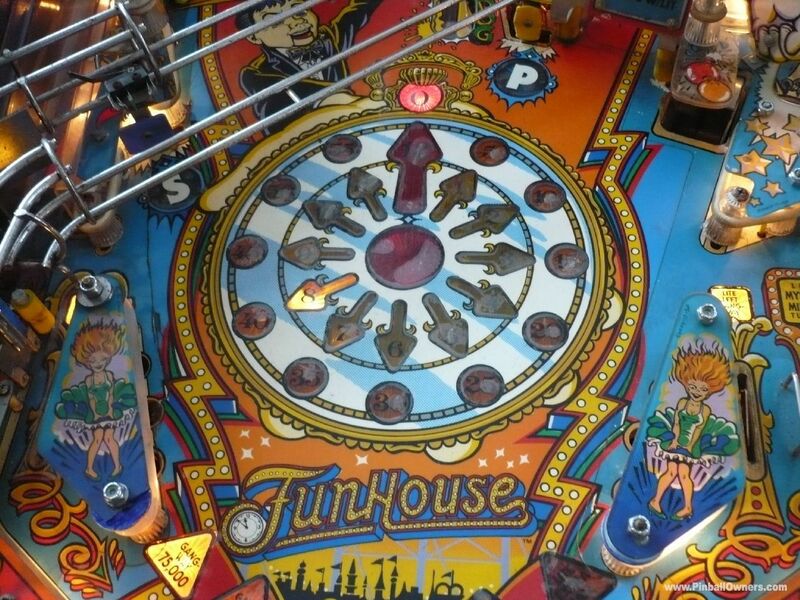 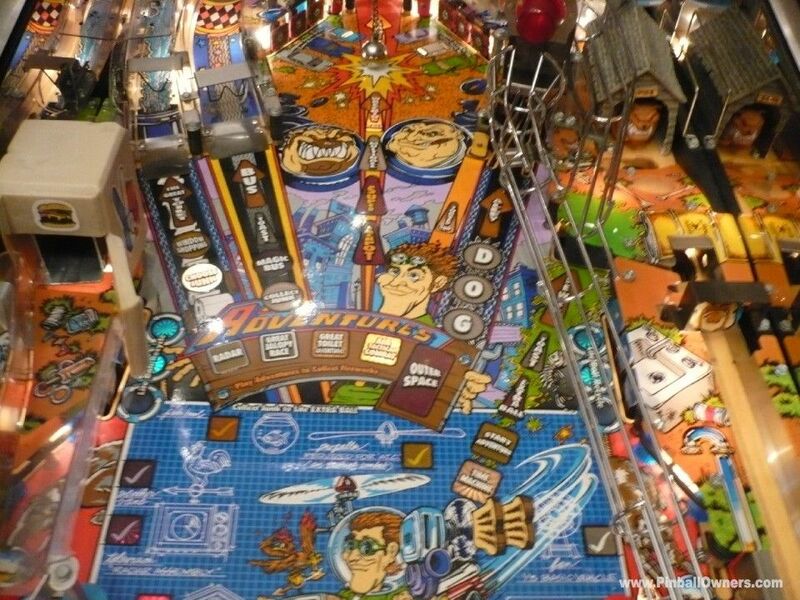 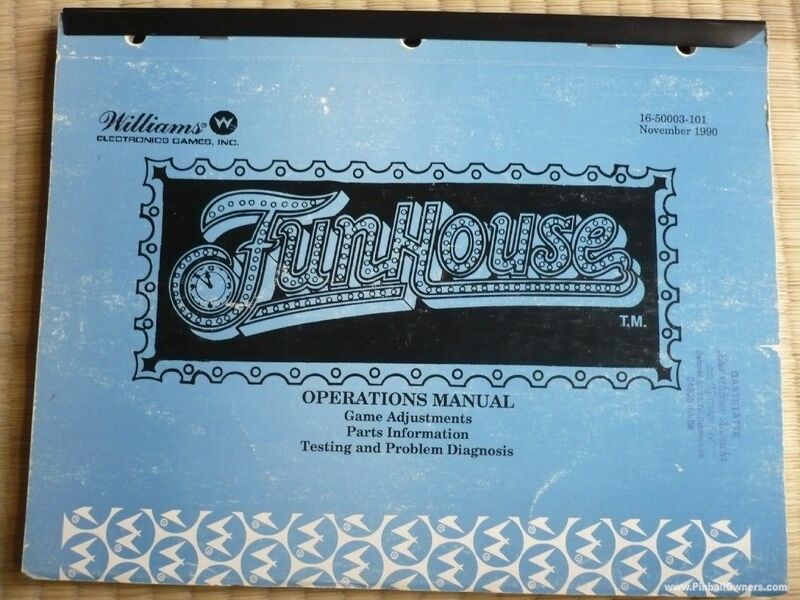 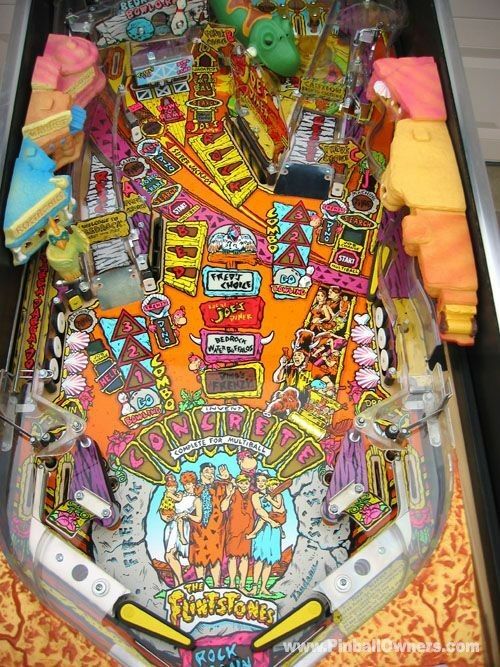 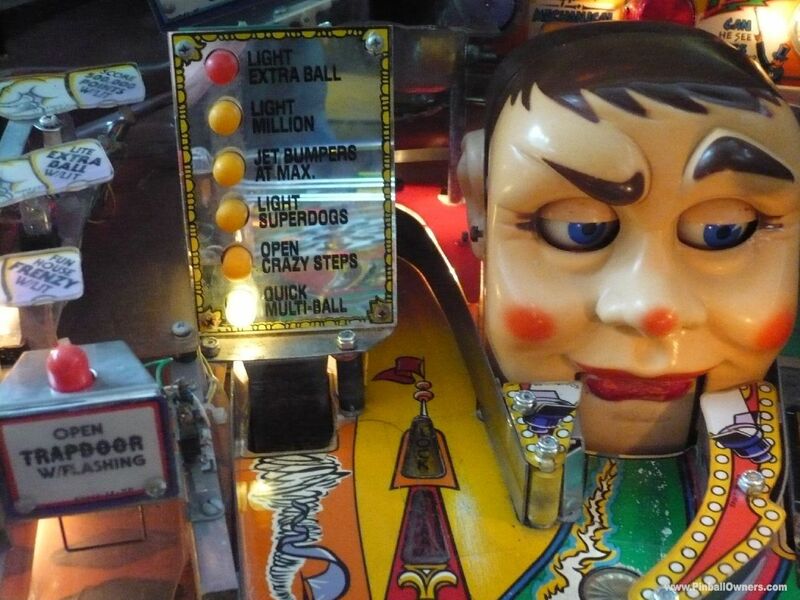 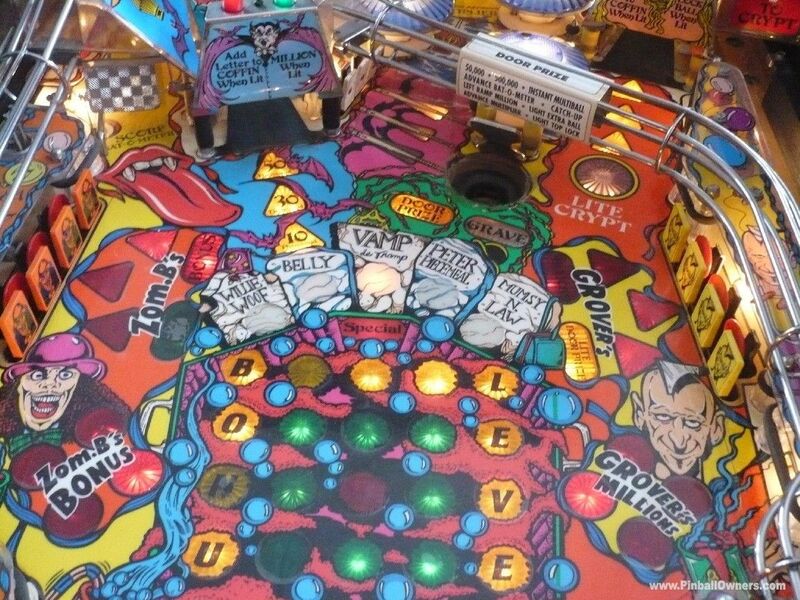 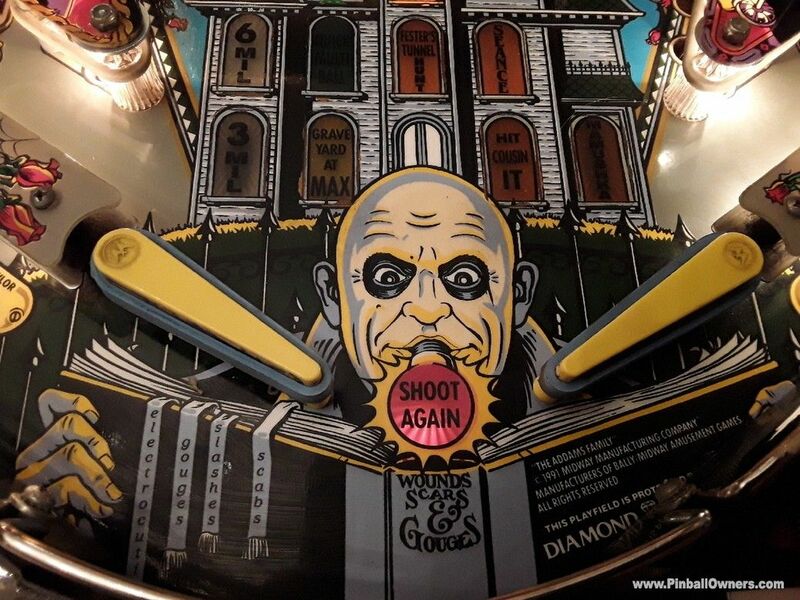 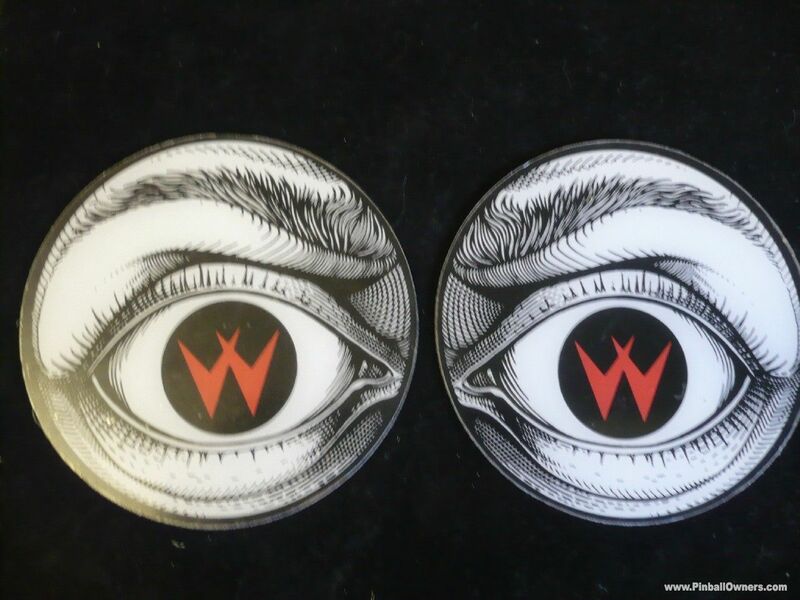 FUNHOUSE Williams (USA) Monté, jouable Ca dépend 1990 (November) Sinister vocals, with manic music, the table has some of the best features in pinball... Rudy's eyes open n close watching the ball as it catapults round the playfield, his mouth n eyes operate correctly as he taunts you to play better. 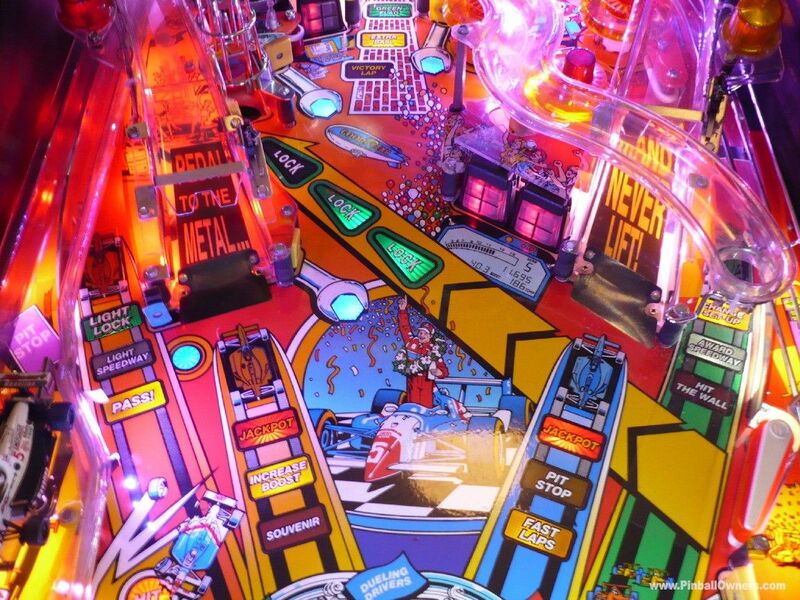 The flashing lights build to an impressive synchronised visual experience as the game challenges you to beat your highest score. 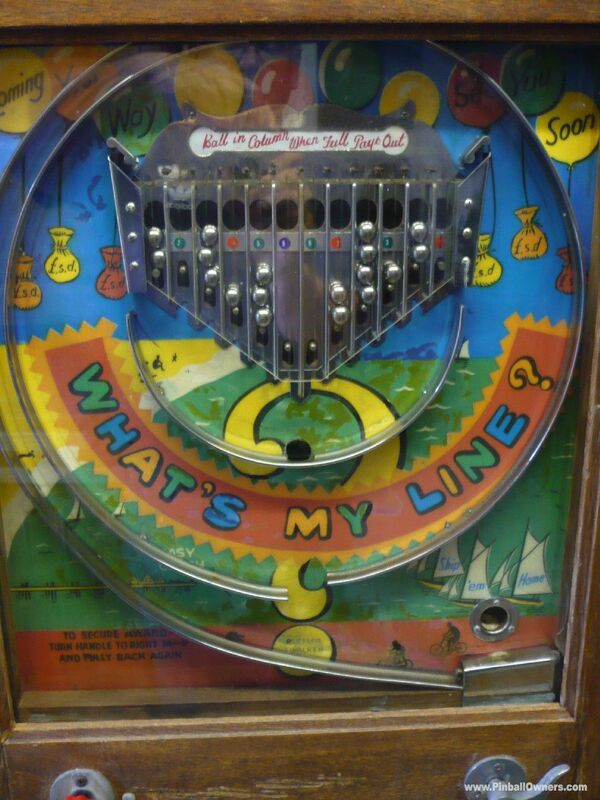 Not this time??? 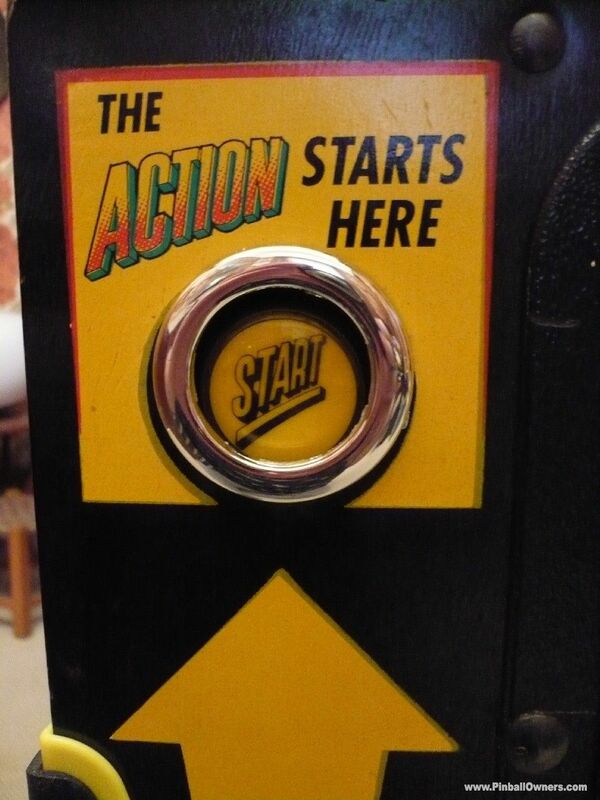 Best press the Start Button....again. 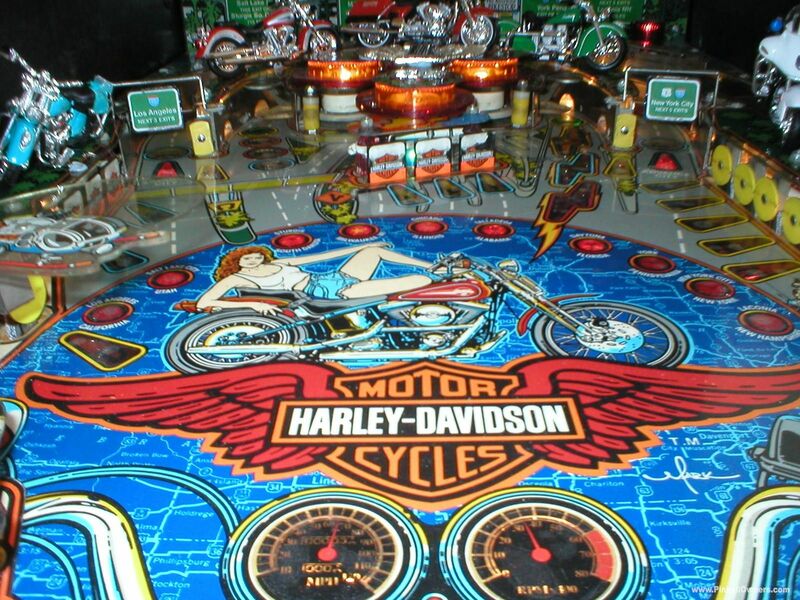 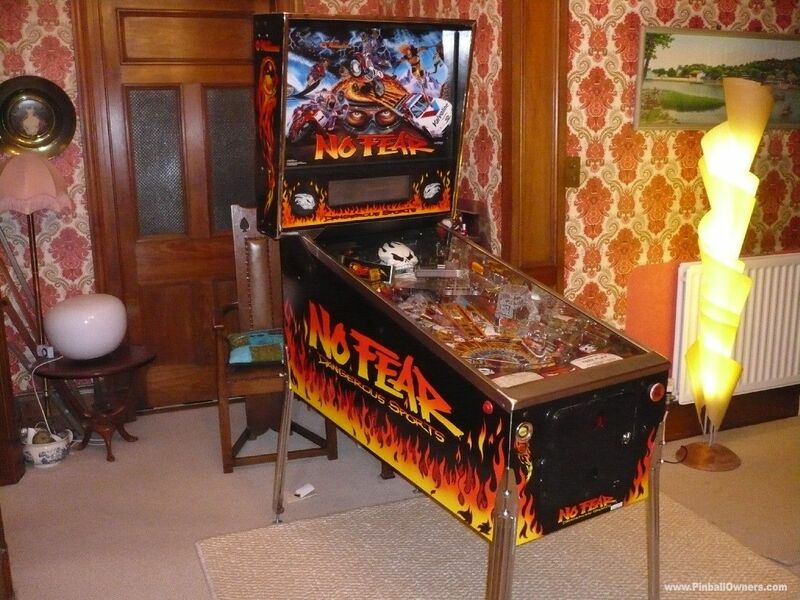 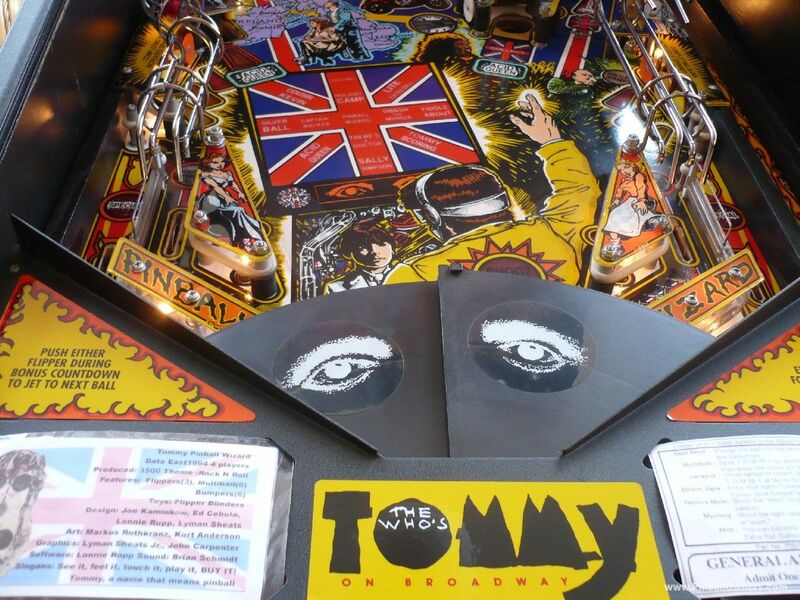 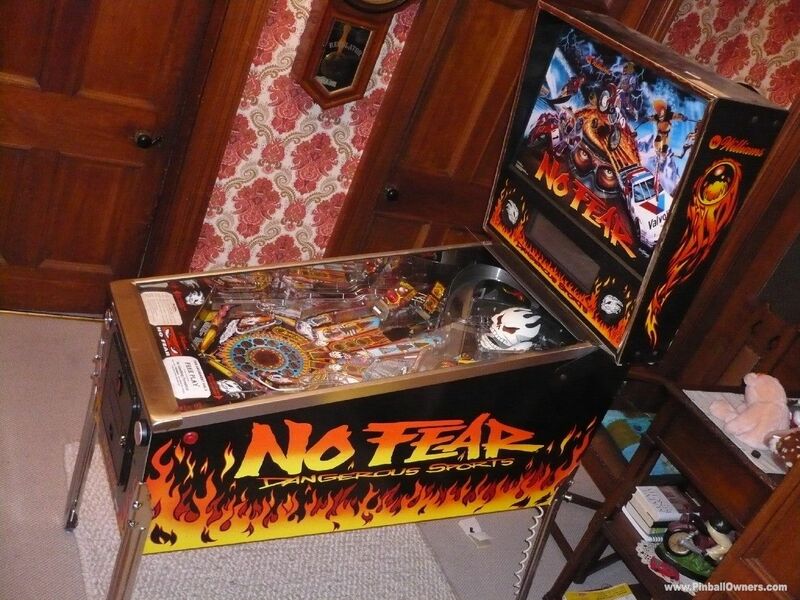 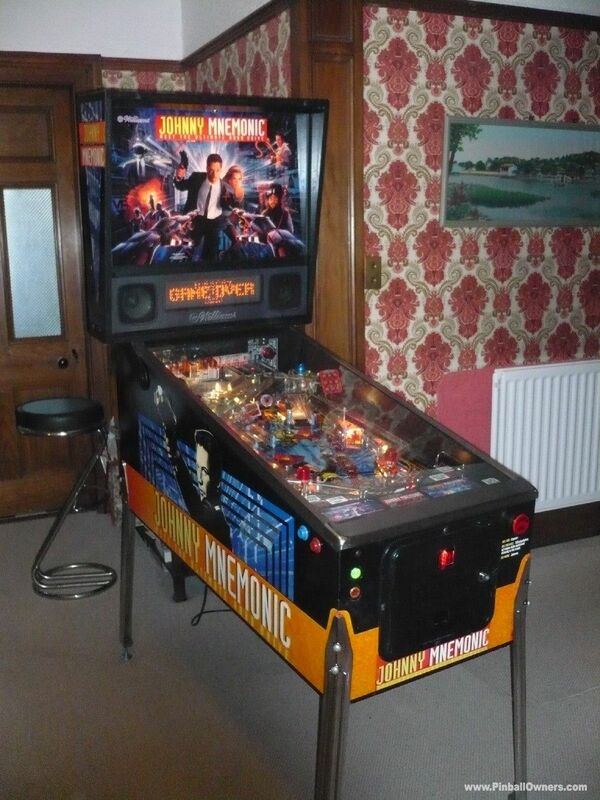 You can enjoy the audio and visuals on Utube........but there is nothing like playing on .a full size pinball machine .... 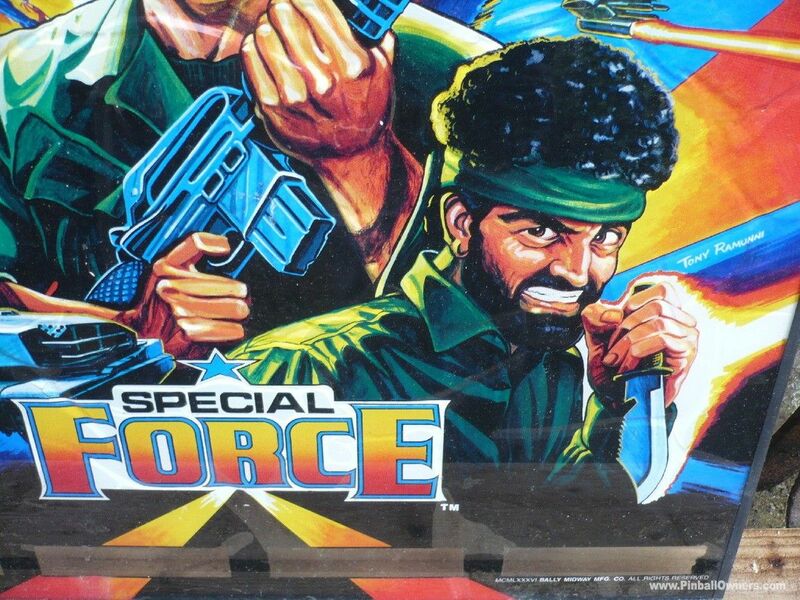 The real deal. 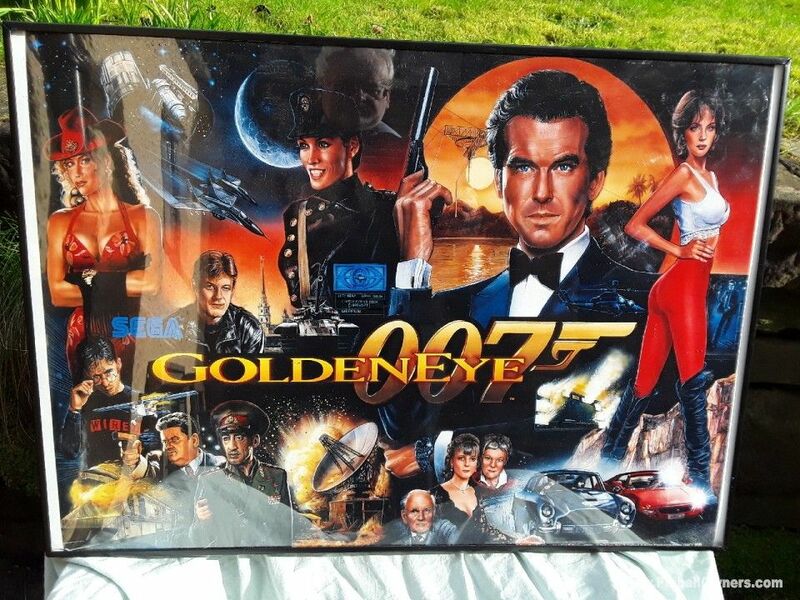 GOLDENEYE Sega (USA) Bon pour pièces Ca dépend Original new old stock translight for Goldeneye, never fitted. 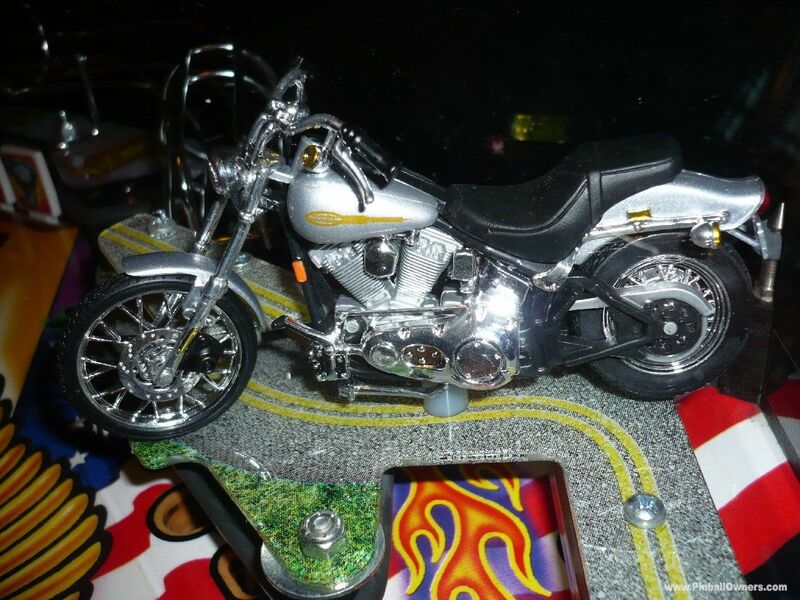 HARLEY DAVIDSON Stern (USA) Monté, jouable Ca dépend 2004(November) Out of the box condition. 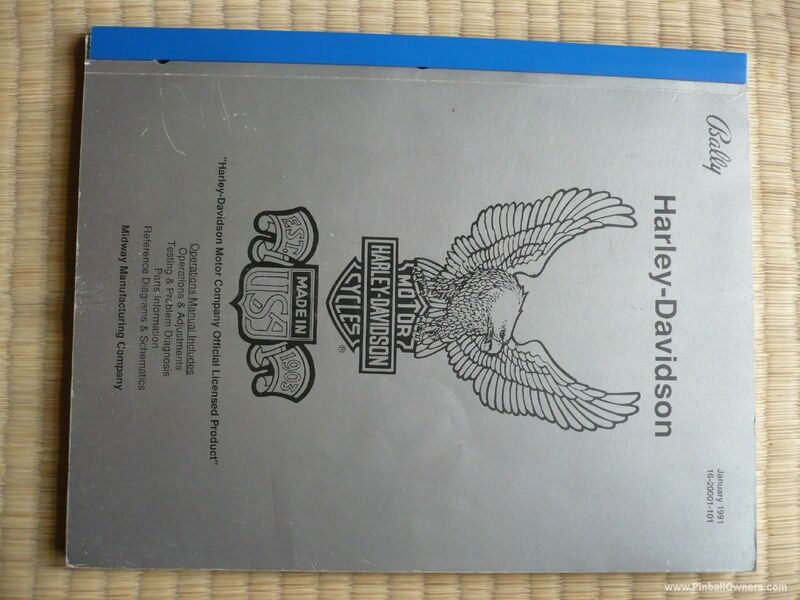 This is the STERN "Harley Davidson 3rd Edition" with all the chrome fittings, different art work n motorcycle types. 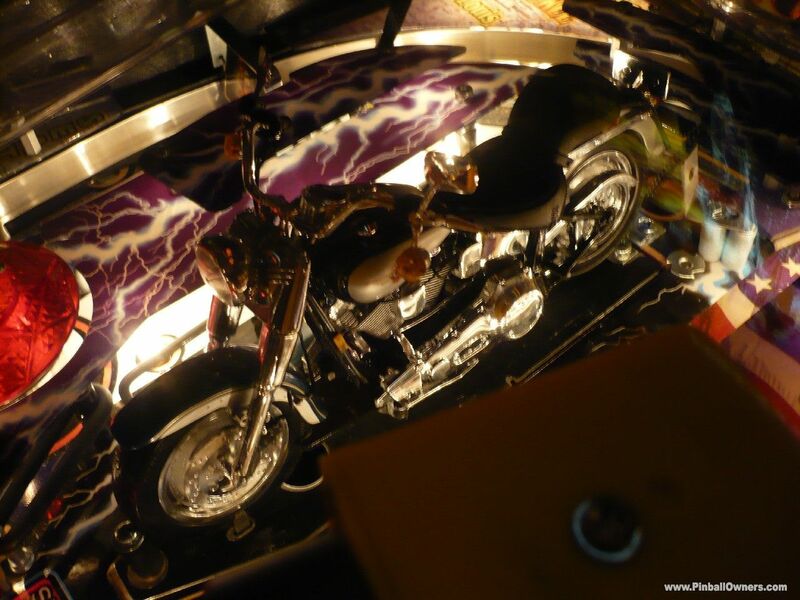 Easy-Rider music. 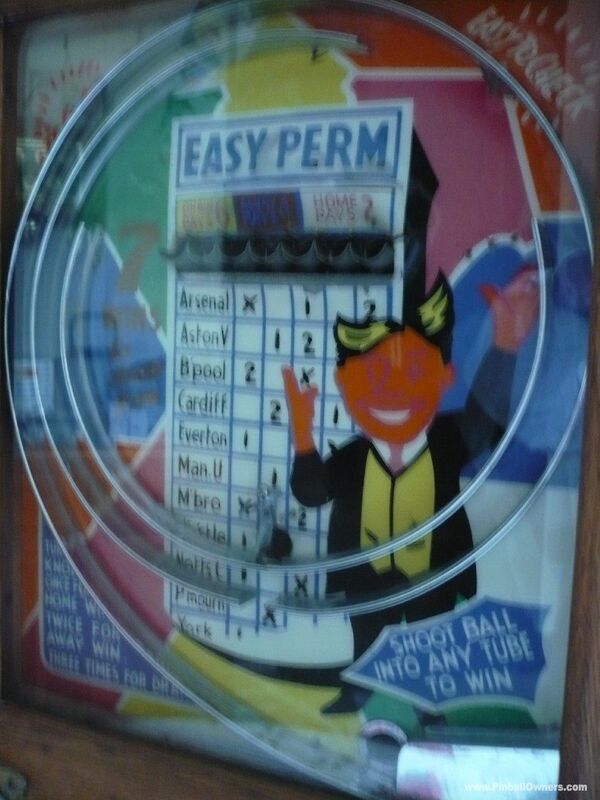 Easy-Play multi-ball game which is popular with everyone. 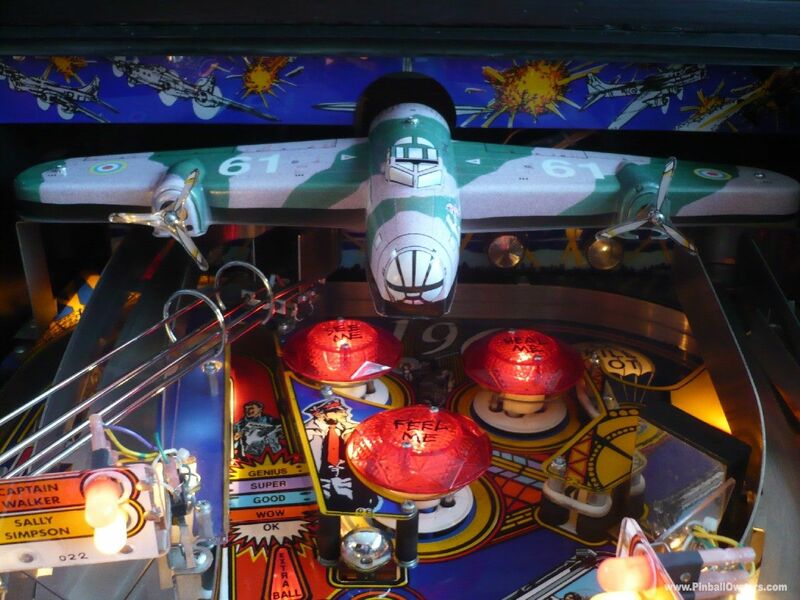 Beautifully enhanced with mirror blades which visually makes this game look huge. 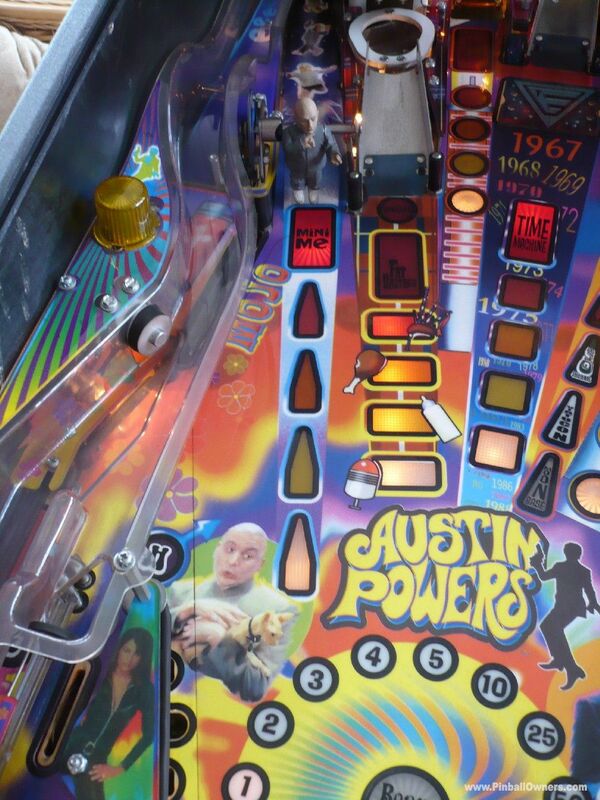 This pin "Gets Your Motor Running"...... Set the Shaker Motor on ....#***# HIGH!!!!!....... 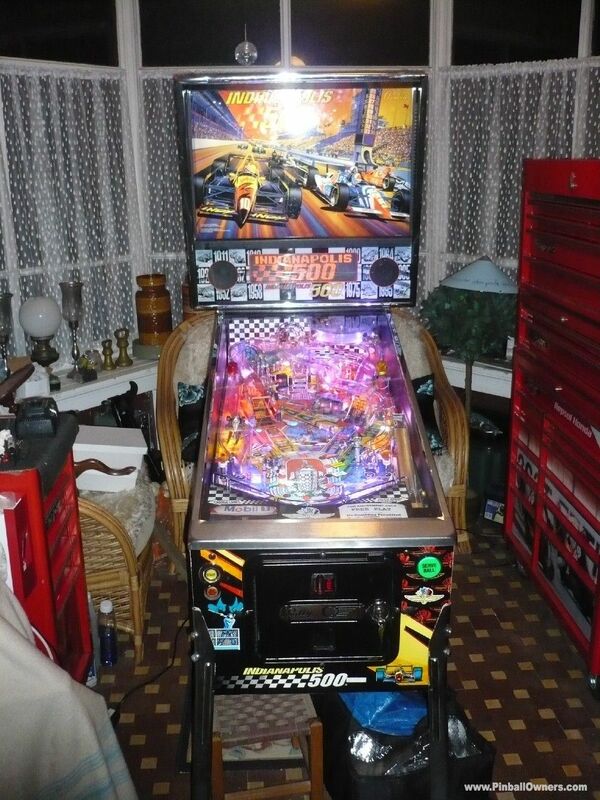 300 made, ........ is there an other in the UK? 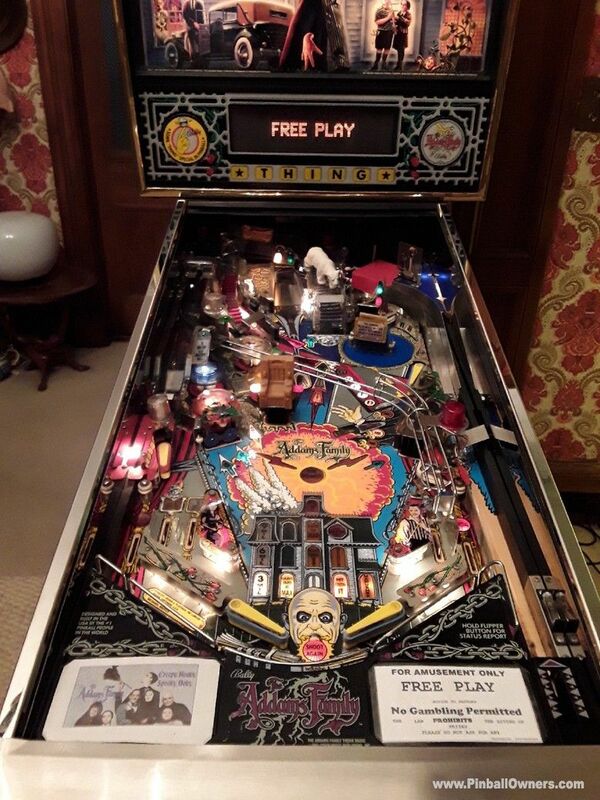 Low play, home use only. 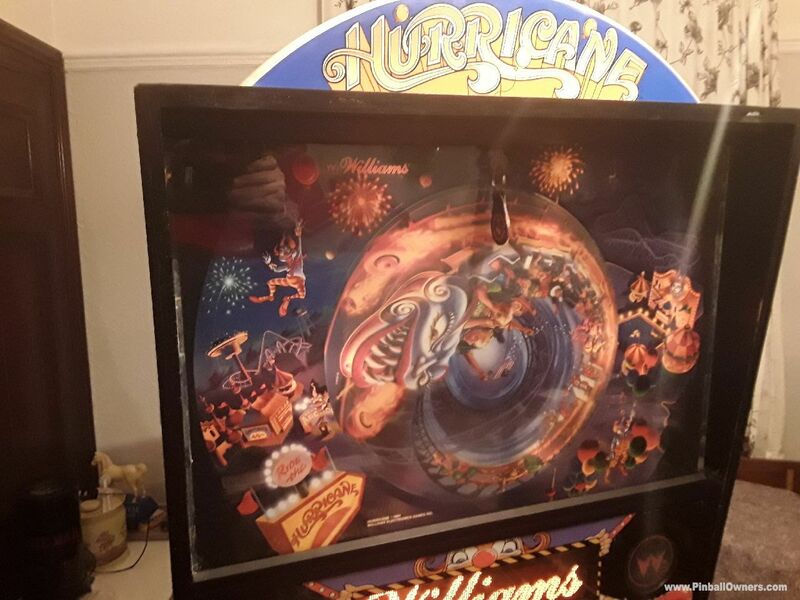 HURRICANE Williams (USA) Monté, jouable Oui! 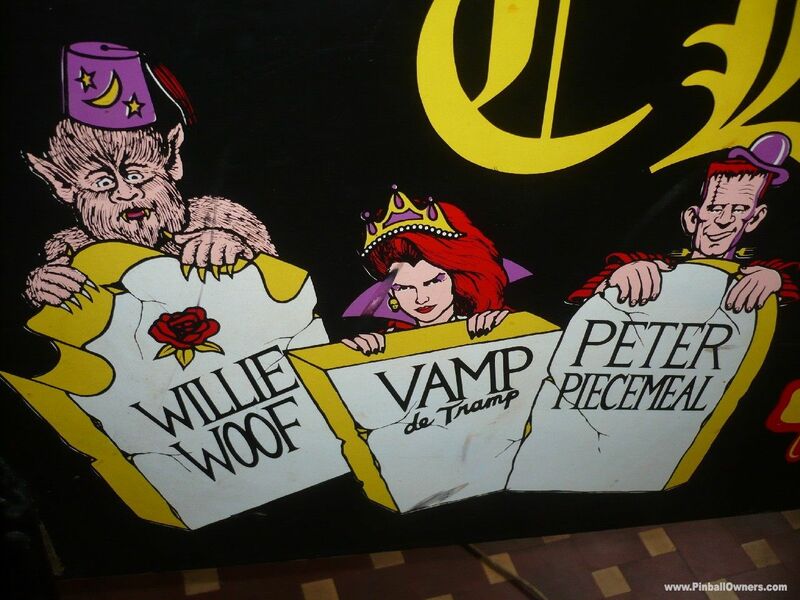 contactez-moi 1991 (August). 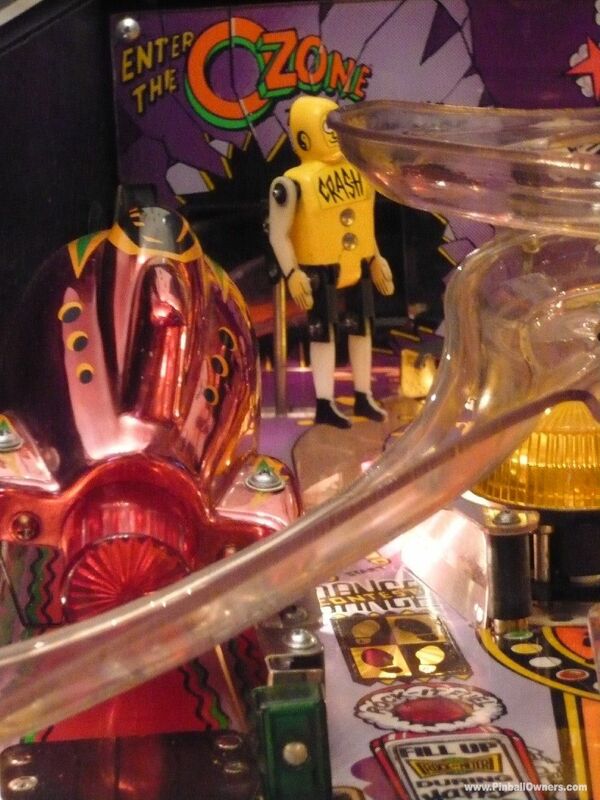 Happy family theme with the juggler and related ferris wheels. 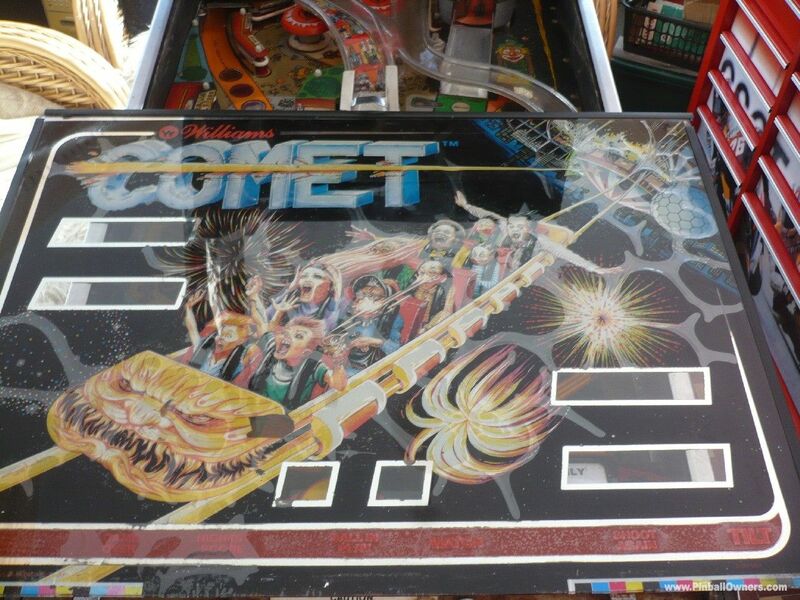 Last of the Williams circus park trilogy of Comet, Cyclone and Hurricane. 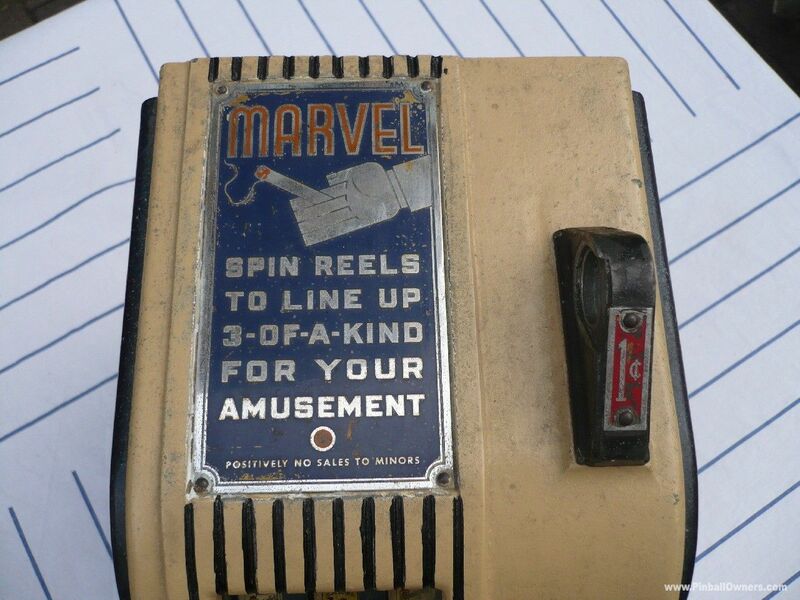 Popular and still a low budget machine great value for a very animated dot matrix display machine. 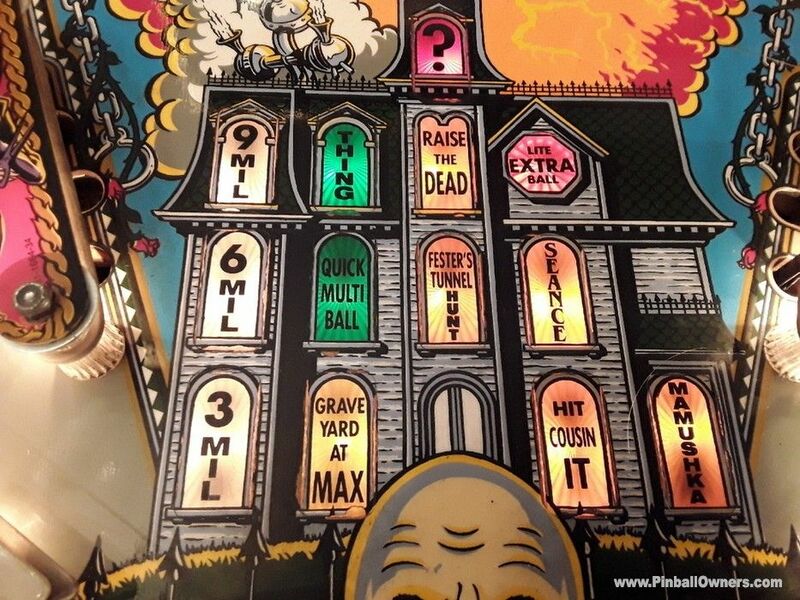 The subject of Theme Parks makes a pleasant change from the new slaughterhouse and mayhem games. 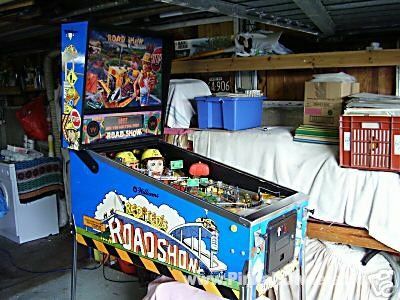 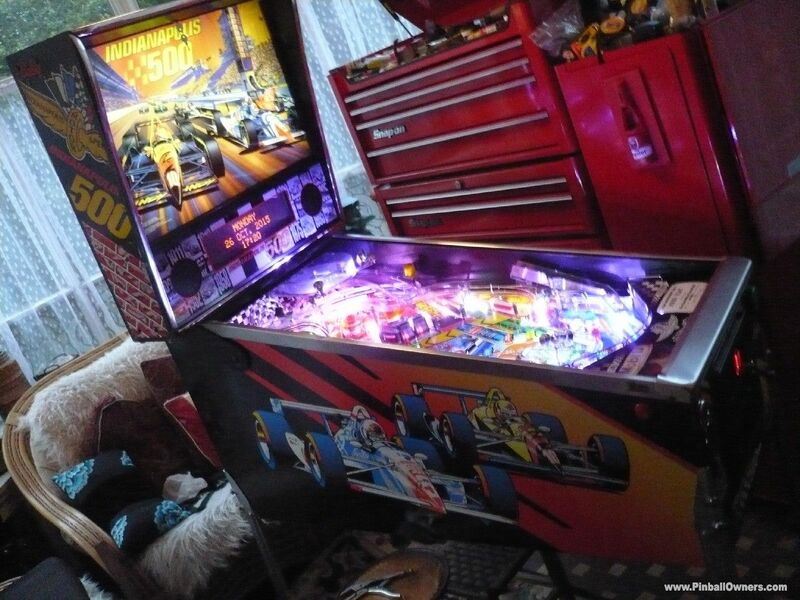 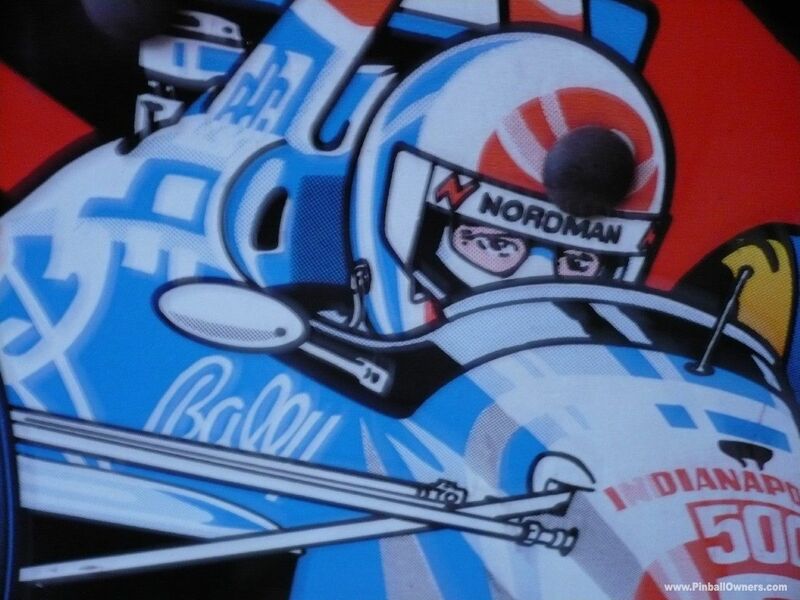 INDIANAPOLIS 500 Bally (USA) Monté, jouable Ca dépend 1995(August) Very colorful bright cabinet and play field with full led lamps to make it even brighter. 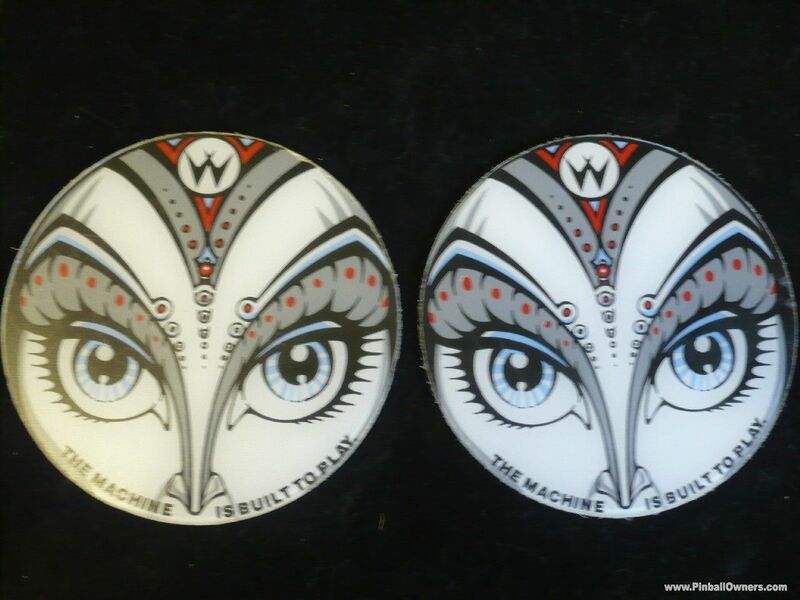 Nordman innovative multi ball design gives you tight varied targets which plays strong and fast. 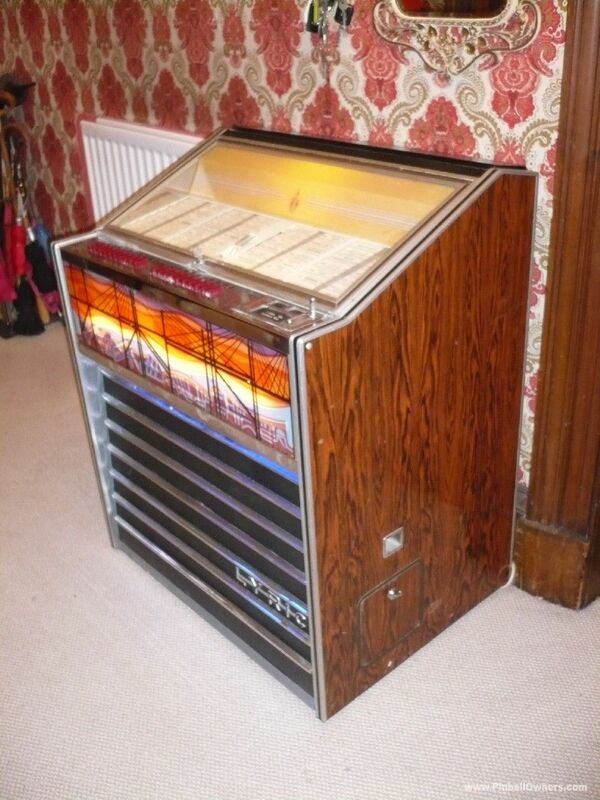 Good sounds and busy display if/when you get a chance to look at it. 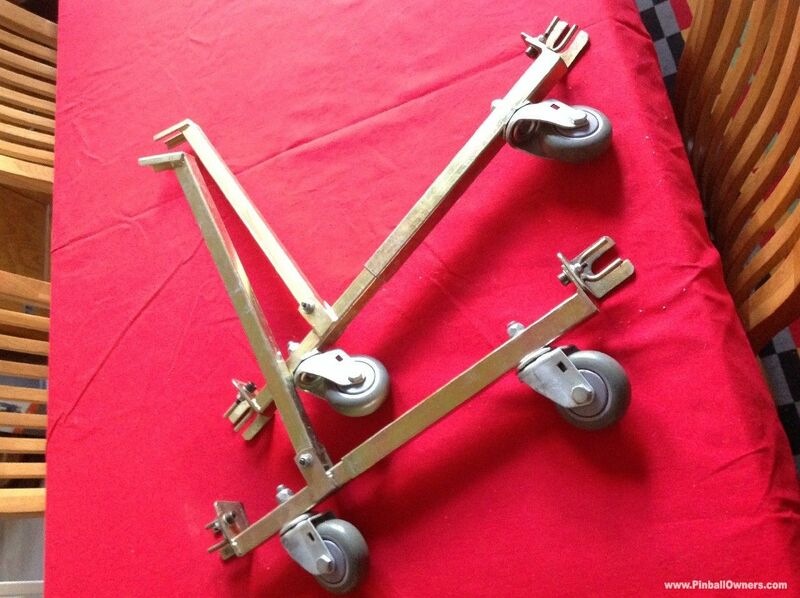 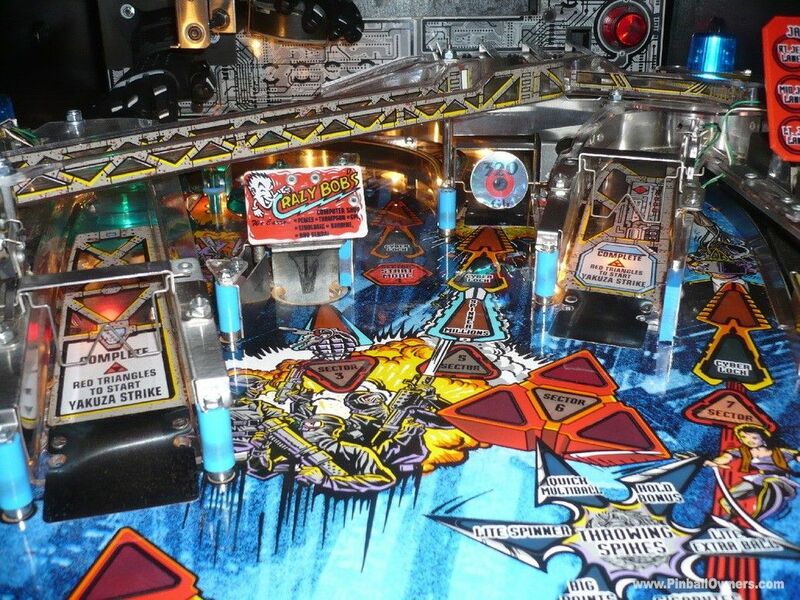 The turbo spinner loads via an upkicker then returns the multiballs at great speed. 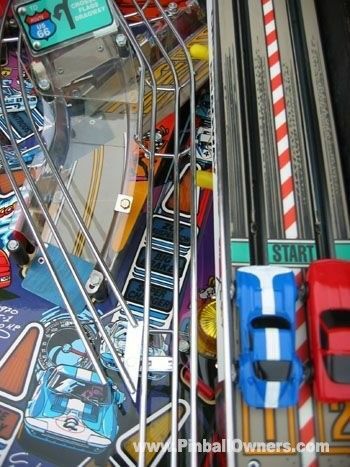 The racetrack is a nice vibrating visual. 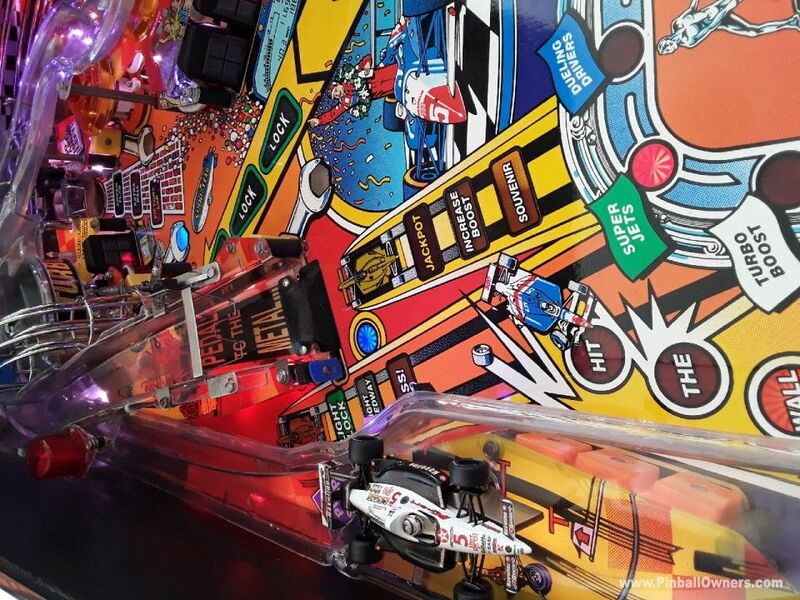 Complete 200laps, pit stop, load turbo, pole position, gasoline alley, dueling drivers, with Wrong Way giving you an amusing distraction....Ask the farmer direction.. super colourful led lit playfield. 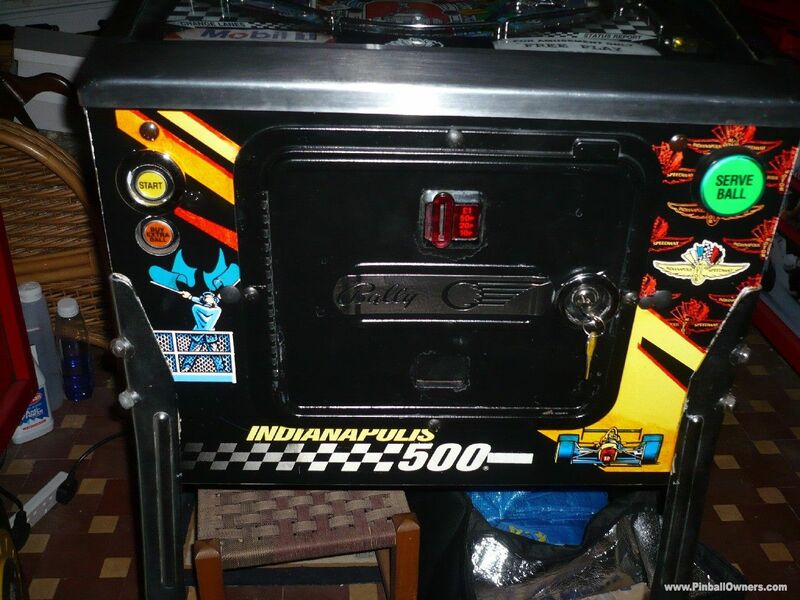 INDIANAPOLIS 500 Bally (USA) Monté, jouable Oui! 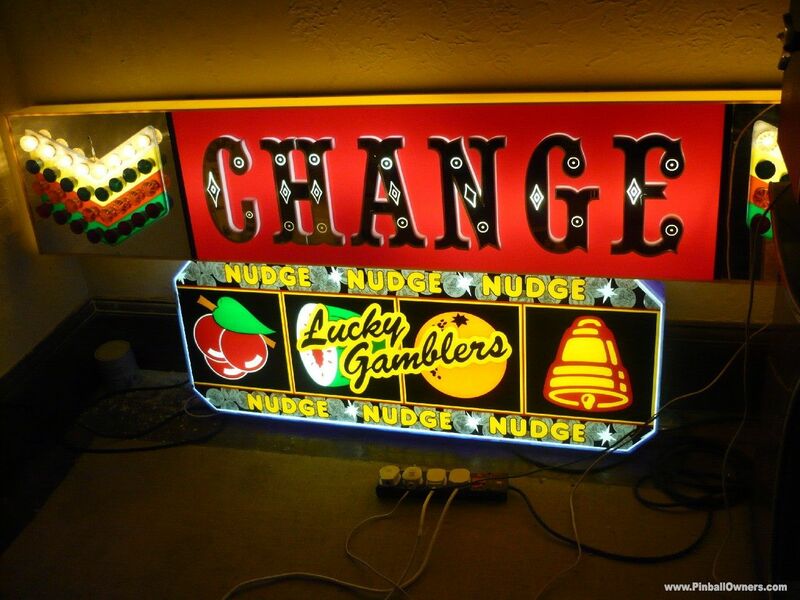 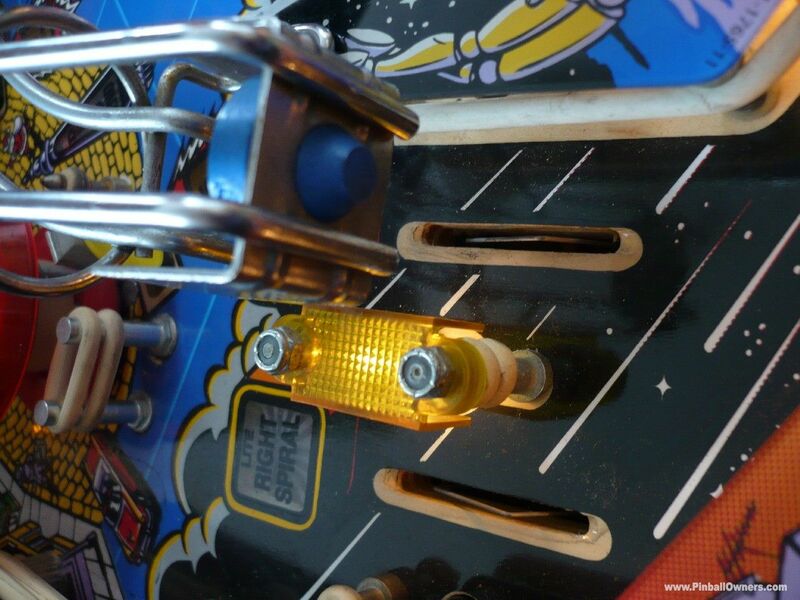 contactez-moi Made in 1995 has had tasteful playfield led strip lighting added with amazing result. 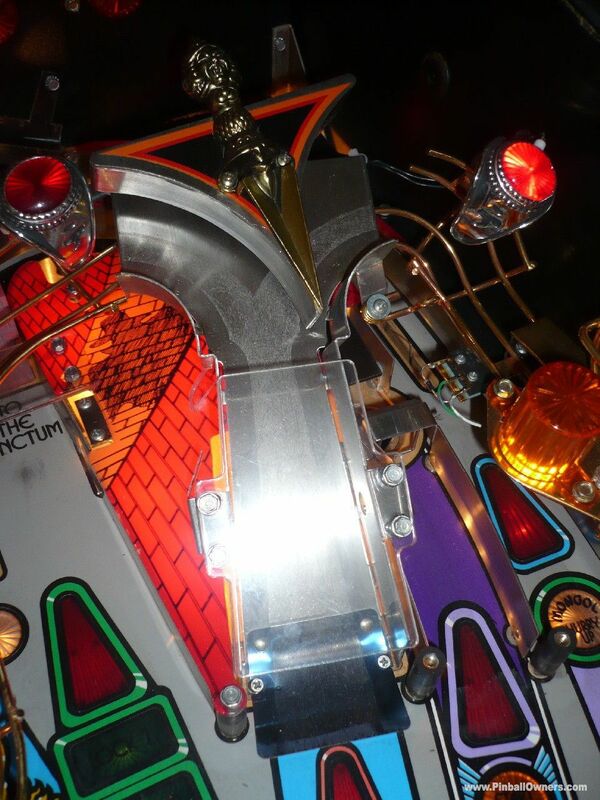 Highly polished mirror finish side rails. 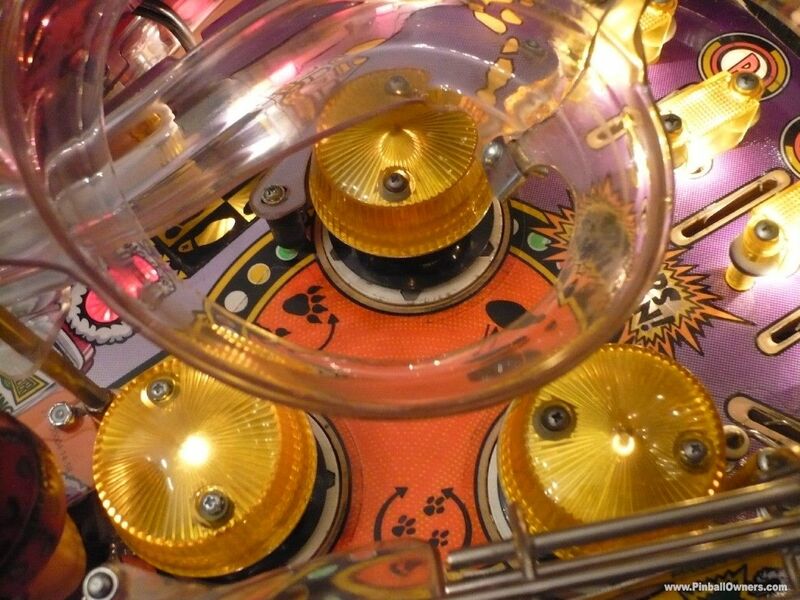 Unmarked highly polished gloss playfield deck gives a very very fast game. 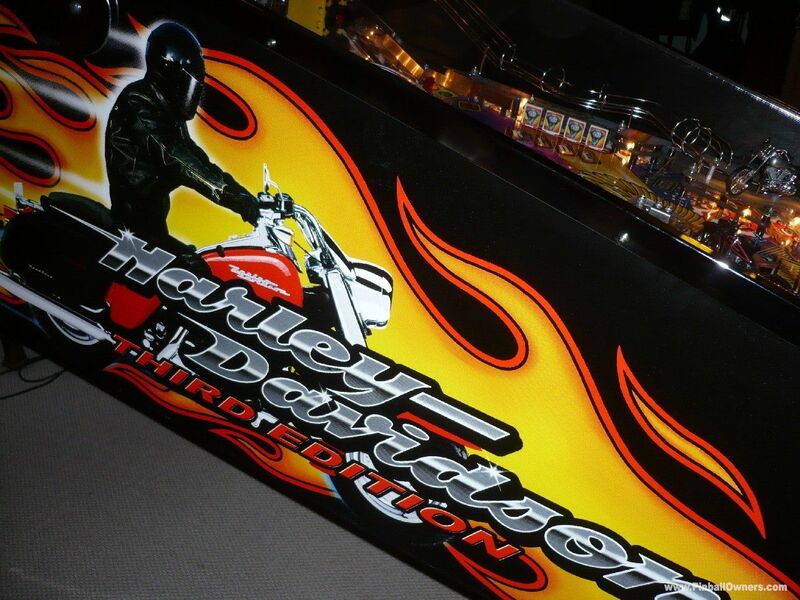 Cosmetically, electrically and mechanically fully operational and ready for many many more years of fun and excitement.The ramps are as new, Crystal clear. 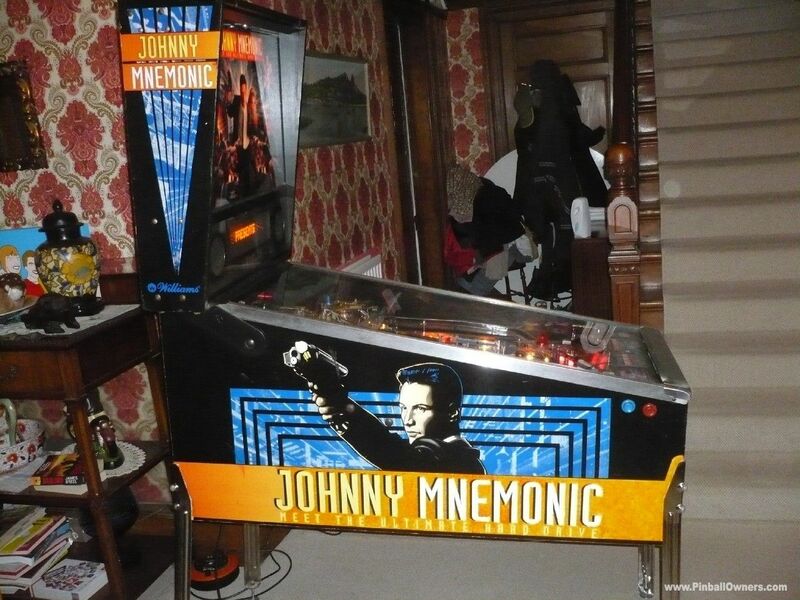 Recently fitted colour display and mirror blades complete the package and make this game an eye.gasm and joy to play..
JOHNNY MNEMONIC Williams (USA) Monté, jouable Ca dépend 1995 (November) Fast and Quirky great sound and a very busy dot matrix display as you guide Keanu into and thru various stages of the game.Plays fast and strong. 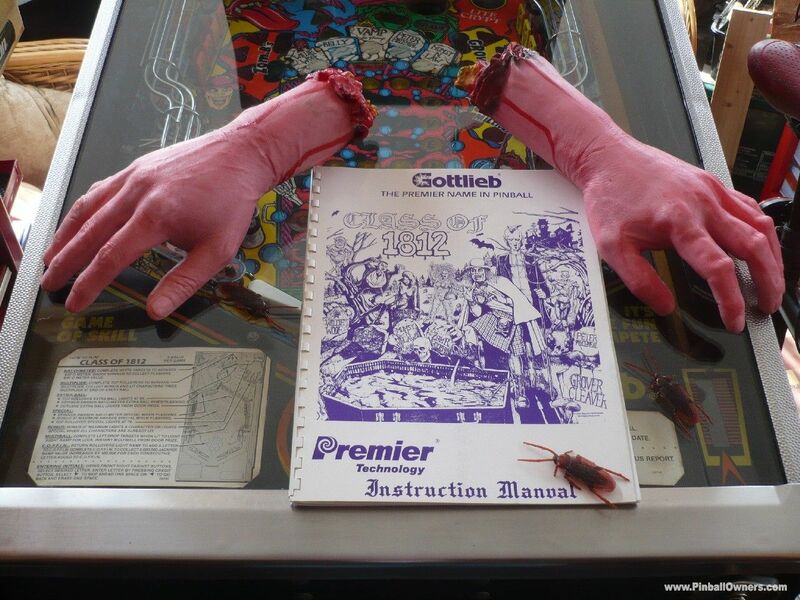 The Cyberpunk bonus and futuristic video mode are pretty special but the moving gloved hand is awesome.. A game with Midnight Madness, and surprisingly, ... Rudy's voice introducing The Frenzy Mode. 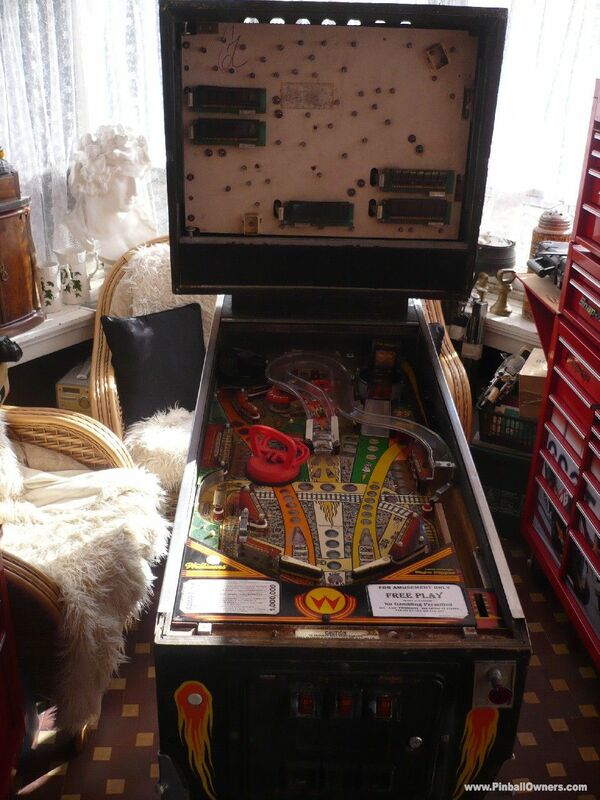 Good cabinet with a really Beautiful play-field. 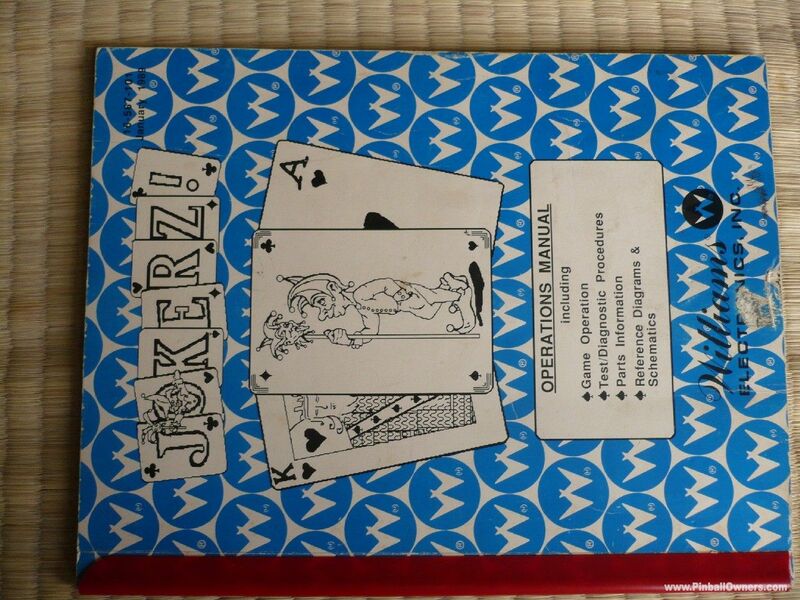 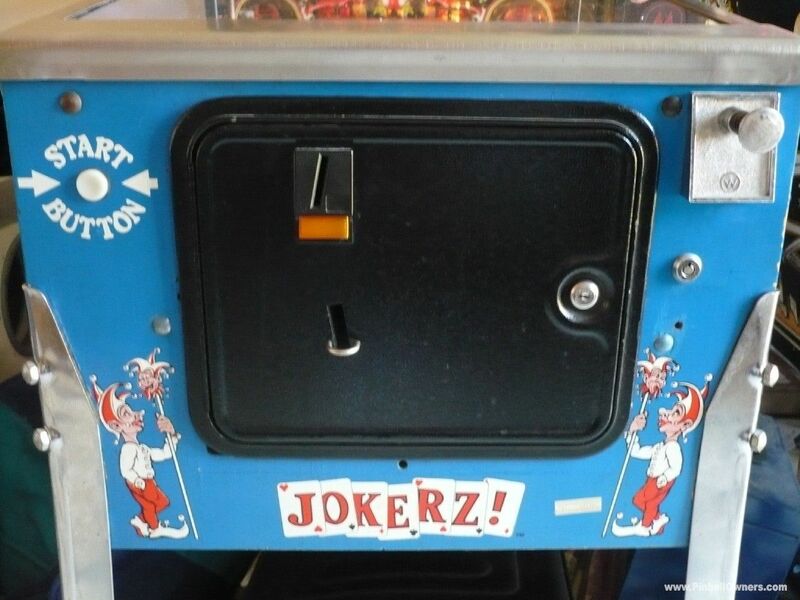 JOKERZ! 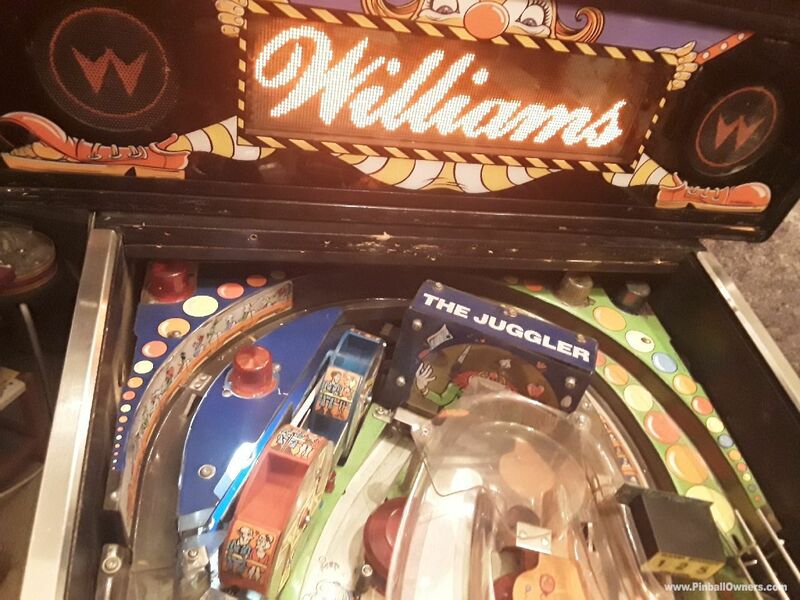 Williams (USA) Monté, jouable Ca dépend 1988 (December) Some clever features.... spinning cards on the backbox, rising ramp on the playfield.....an easy to play everyone pin. 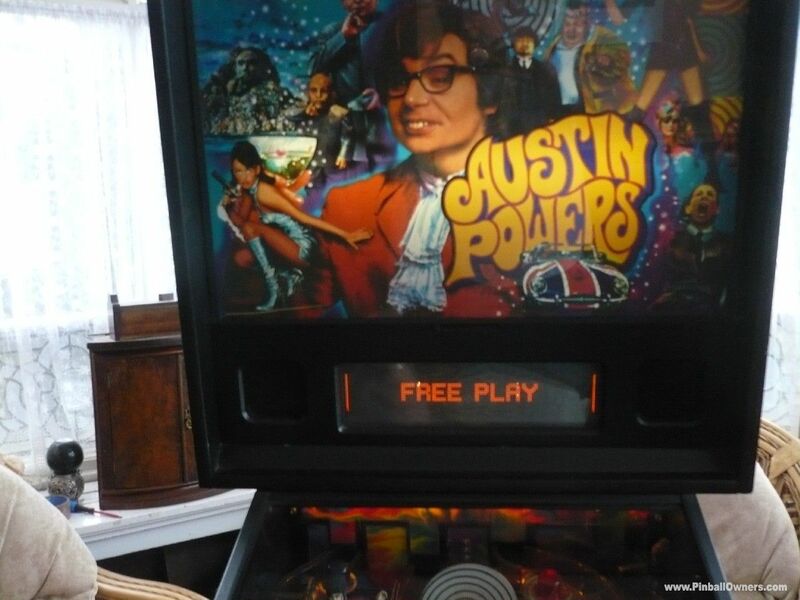 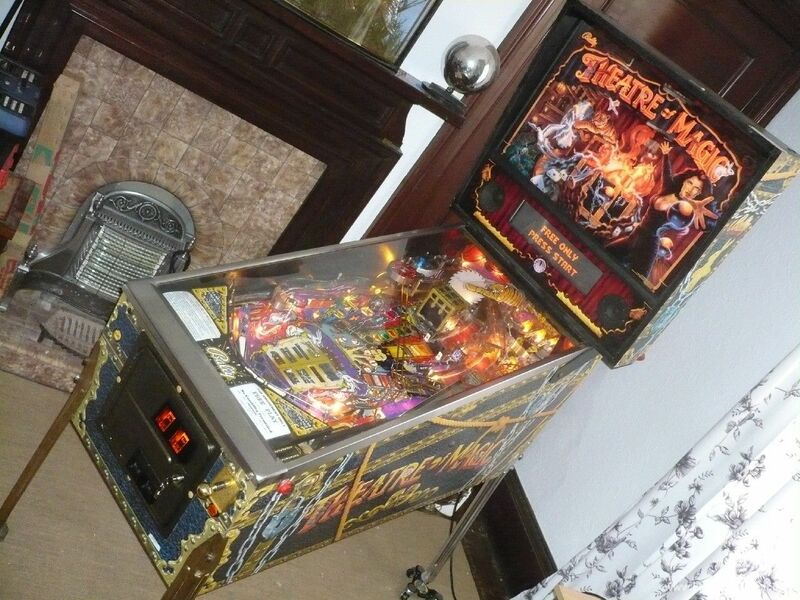 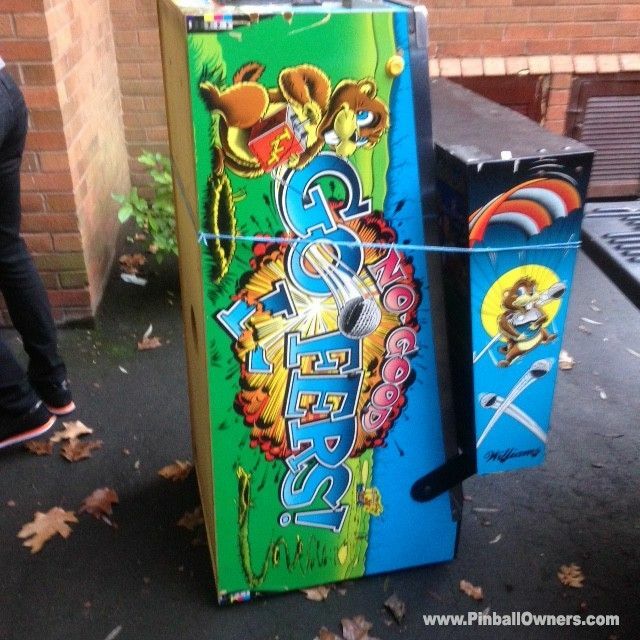 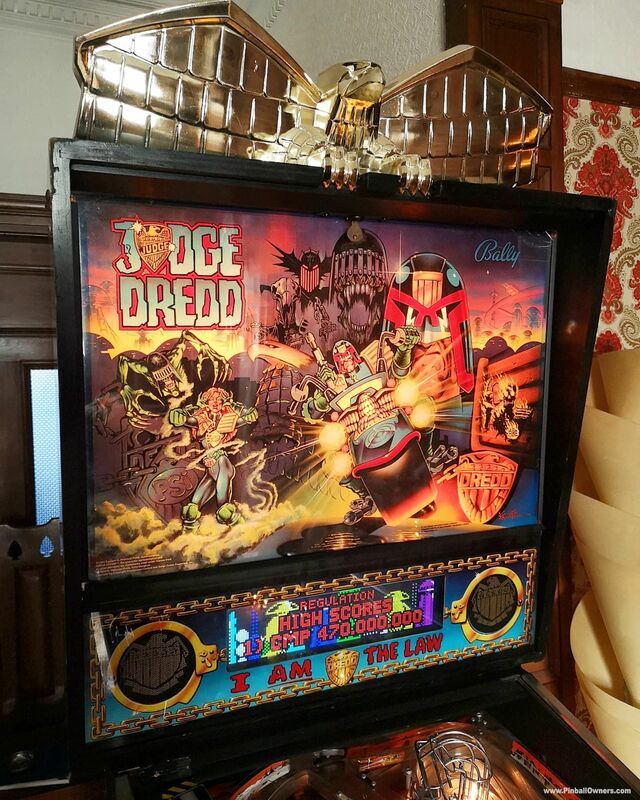 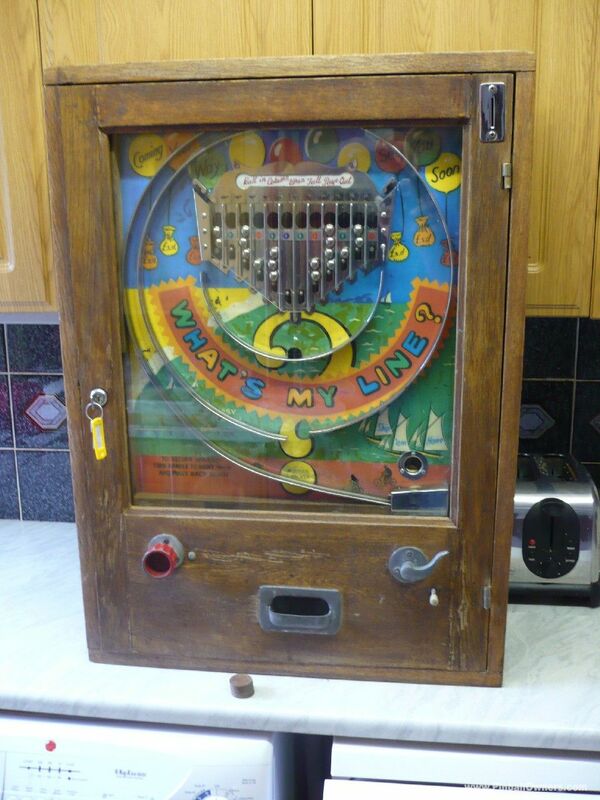 Nice unmarked colourful cabinet and very good playfield Plays strong and always fun scoring on the little Jokers. 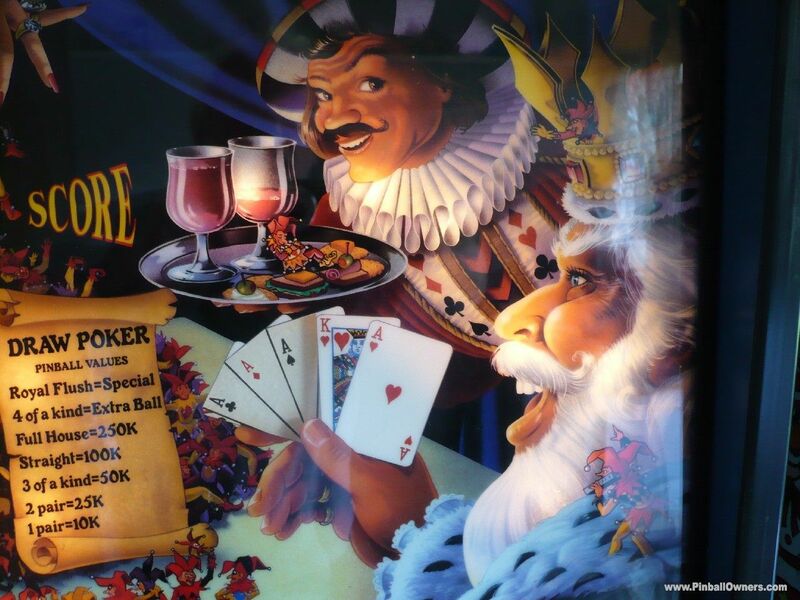 The King and Queen verbals are very posh. 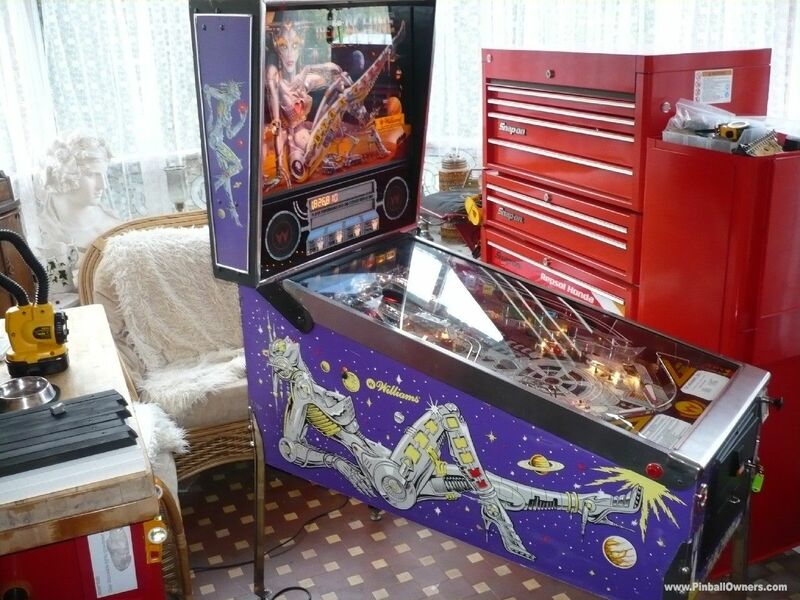 One that is still under the 1K budget. 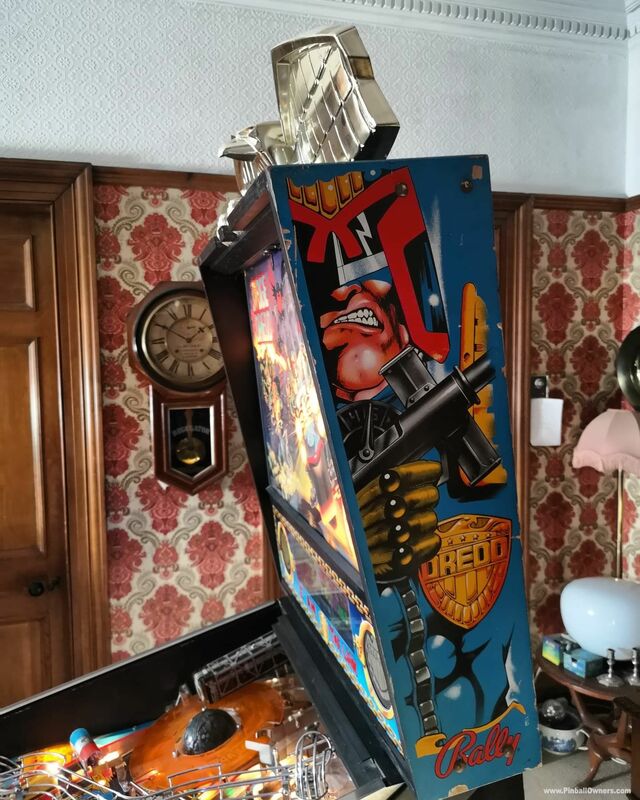 JUDGE DREDD Bally (USA) Monté, jouable Jamais 1993(May) Oh what fun we have...... one of the most difficult extractions from a house ever!!! 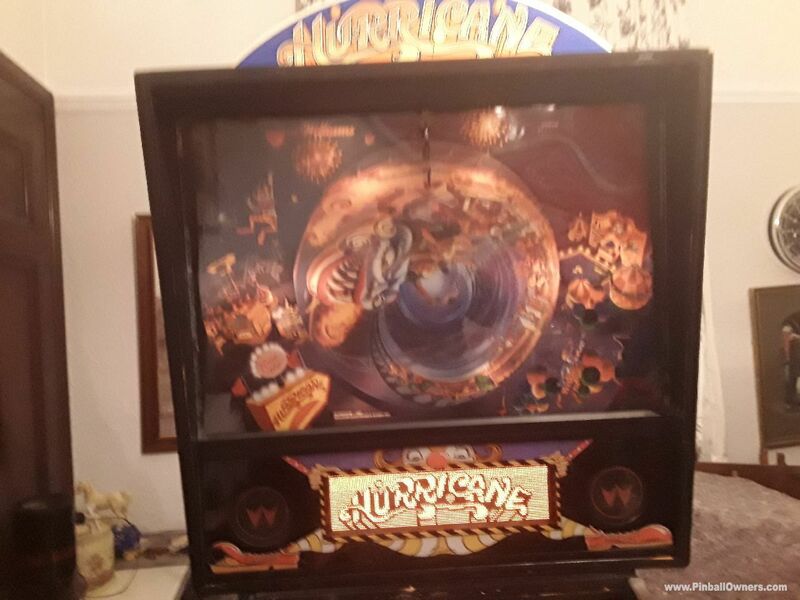 Like an army platoon manhandling a tree trunk... the cabinet was lifted head height, turned thru 180, upended, lowered, raised, up..n.down flights of stairs.... n free!!!! 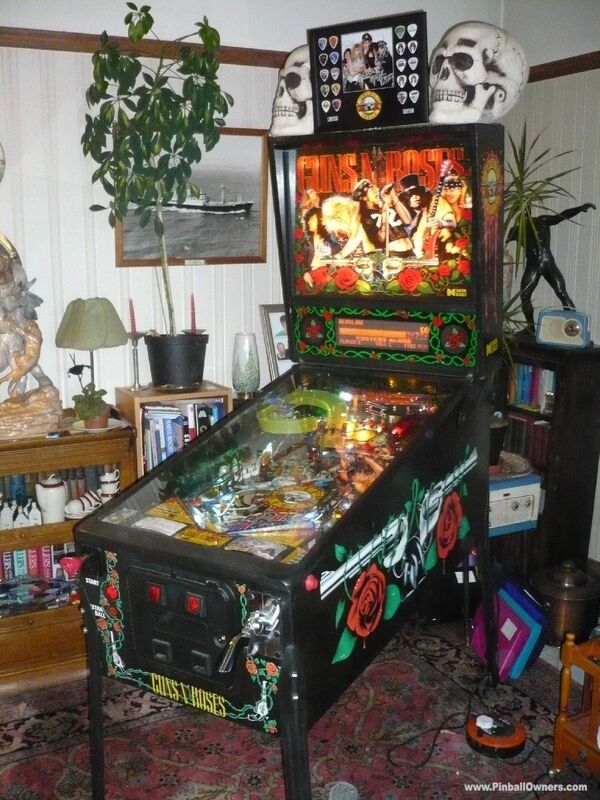 Lovely machine, private use since the 90's... worth the burning muscles n heavy bruising. 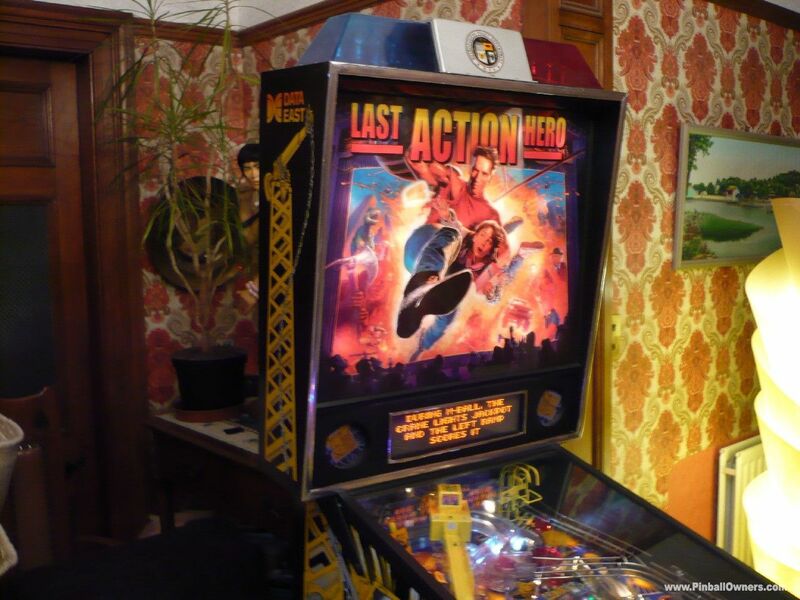 LAST ACTION HERO Data East (USA) Monté, jouable Oui! 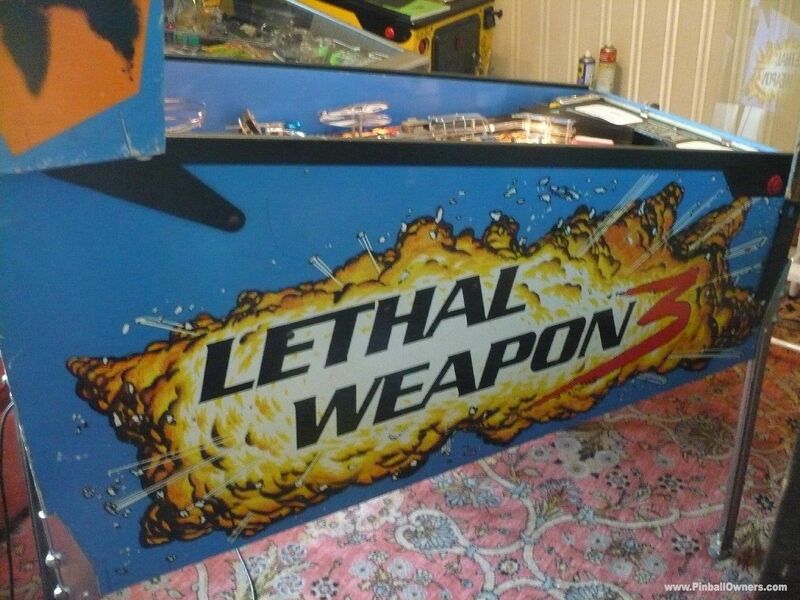 LETHAL WEAPON 3 Data East (USA) Démonté, fonctionnant Jamais 1992 (July)A good game. 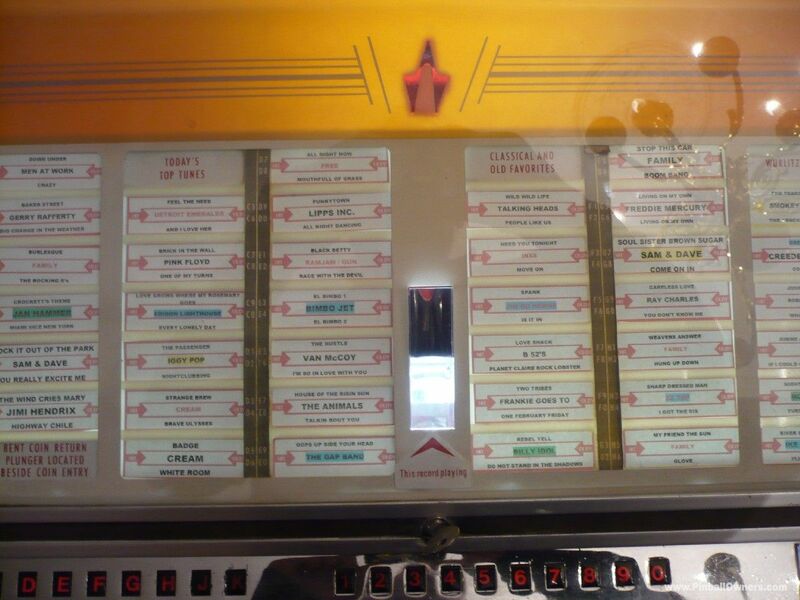 I like the intro and being able to choose the music from a menu on game start. 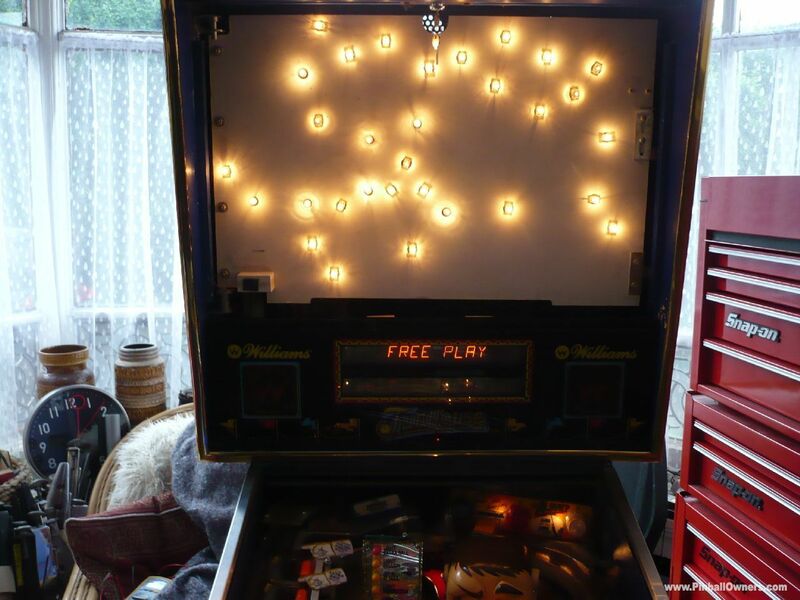 The light show is commendable, the ball moves fast between features and the dot-matrix highly animated. 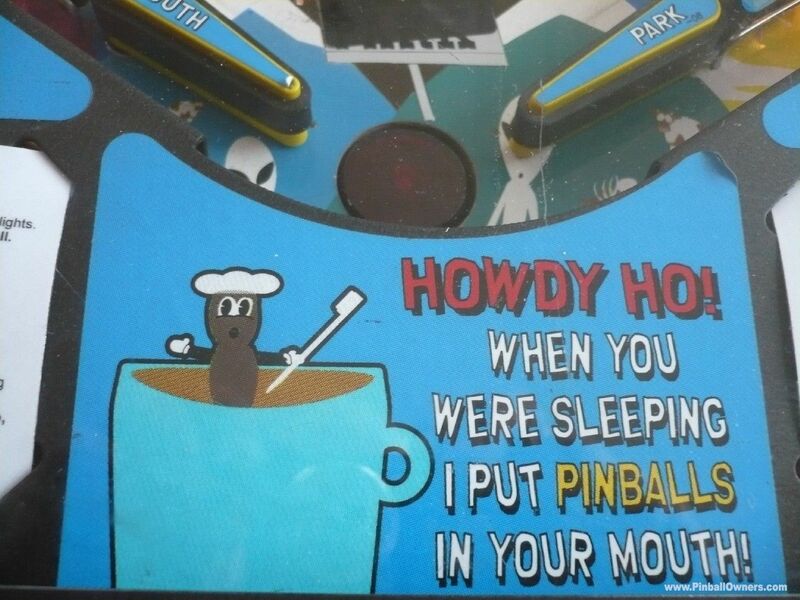 Yeh, I like this game. 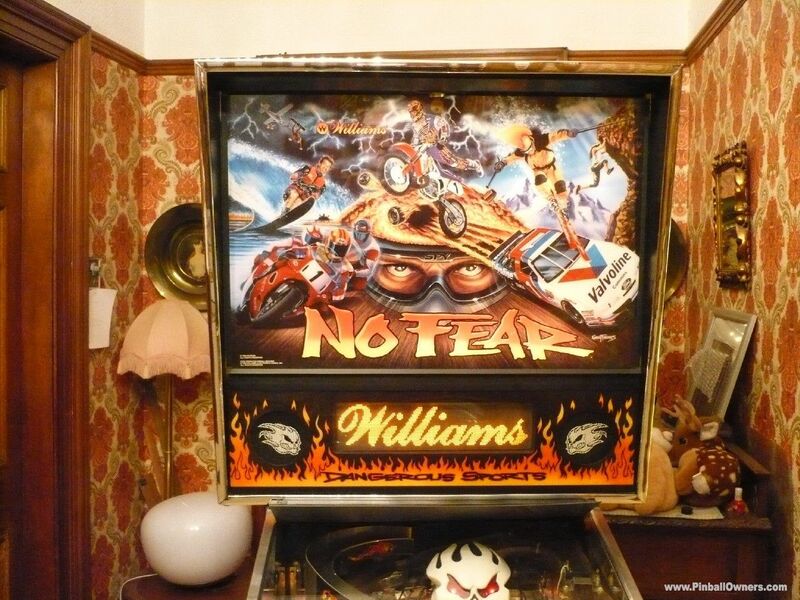 Maybe its because it has an almost identical table layout and shot map as Williams T2. 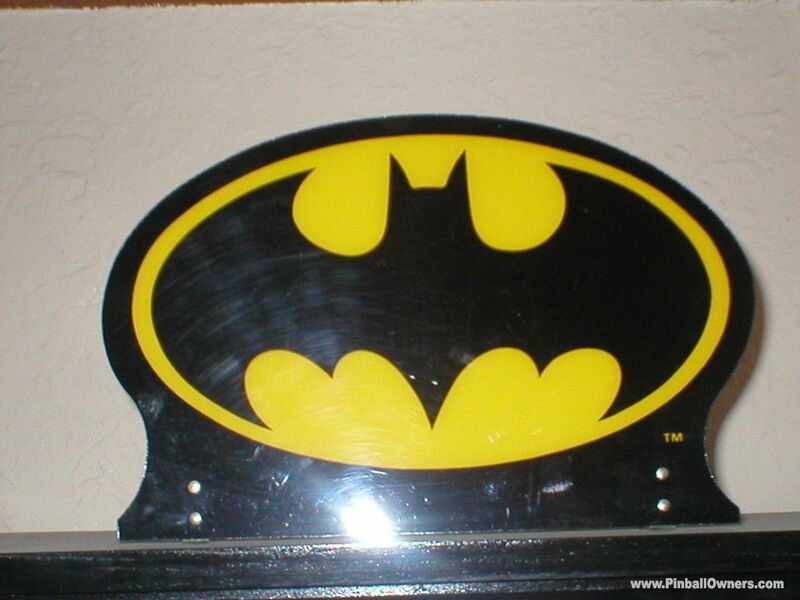 RESERVED. 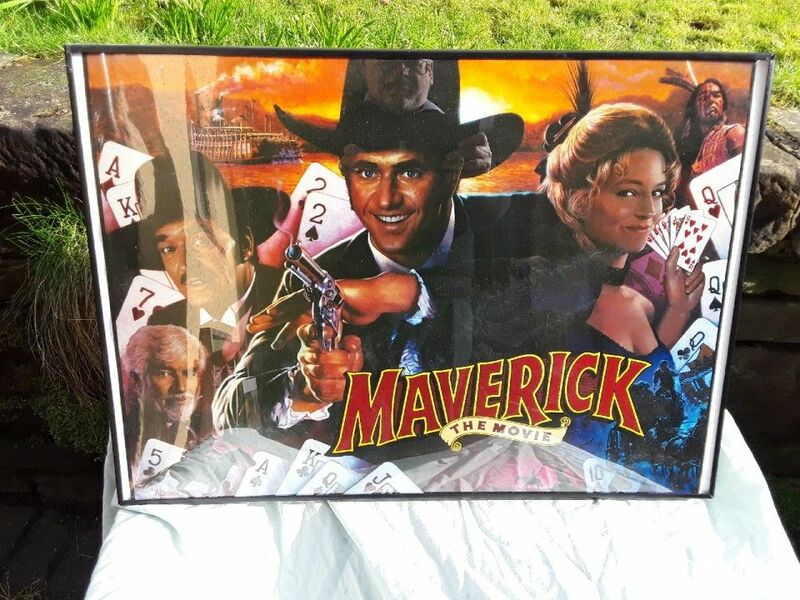 MAVERICK Data East (USA) Bon pour pièces Ca dépend Translight and a few odd parts left. 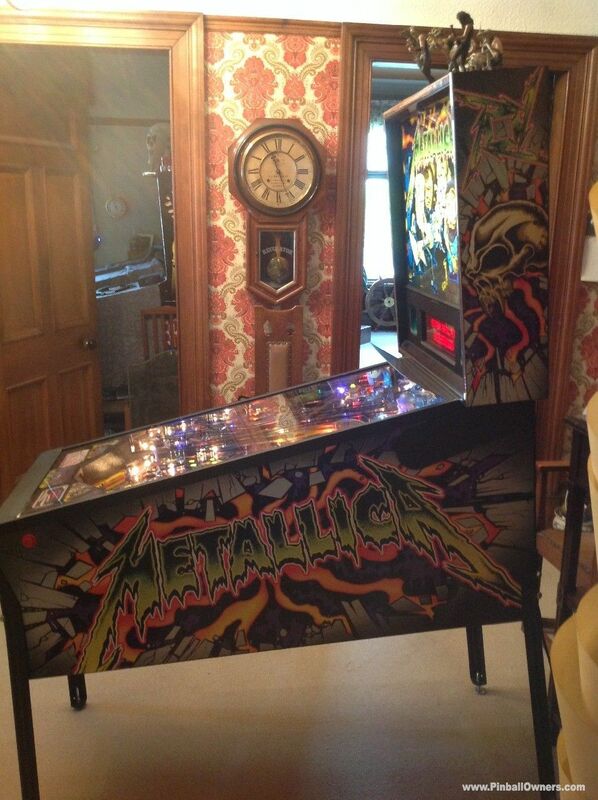 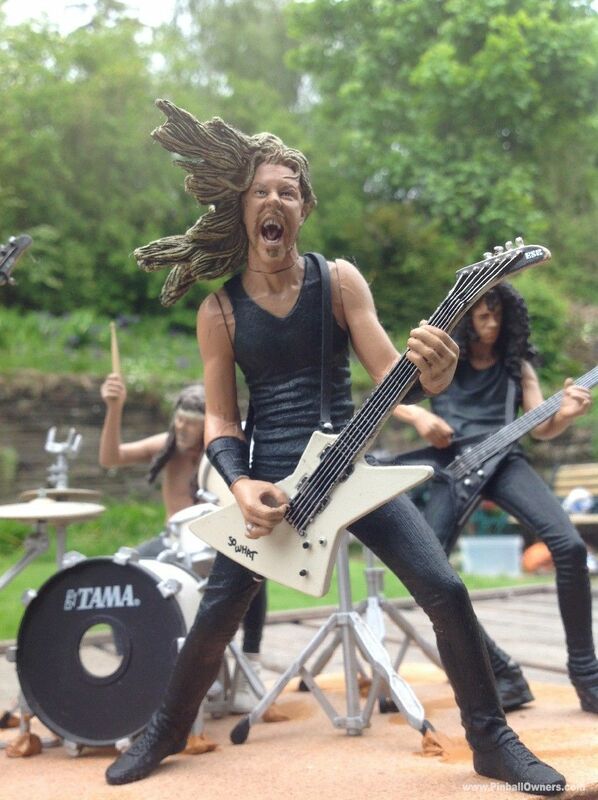 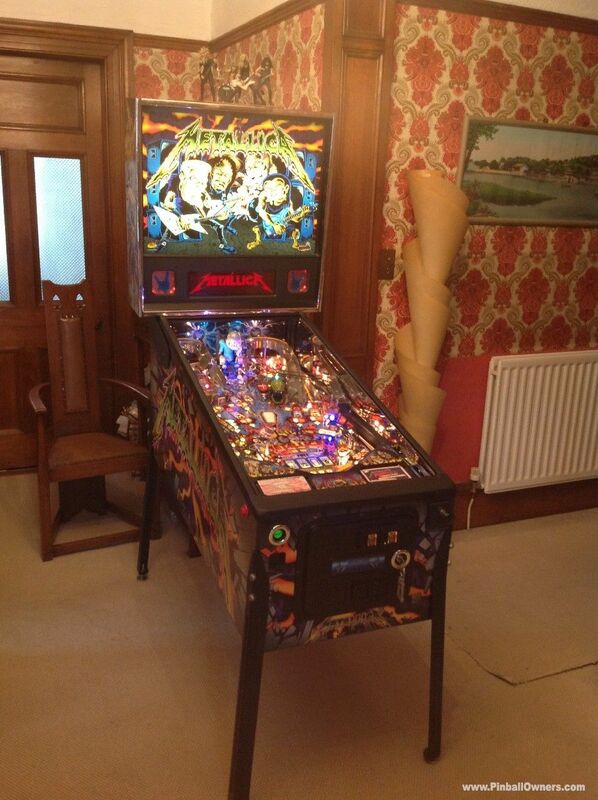 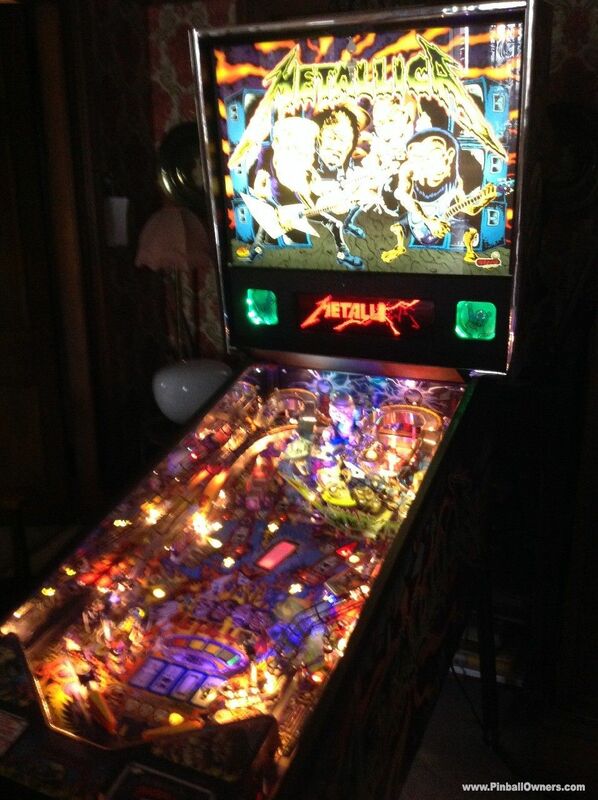 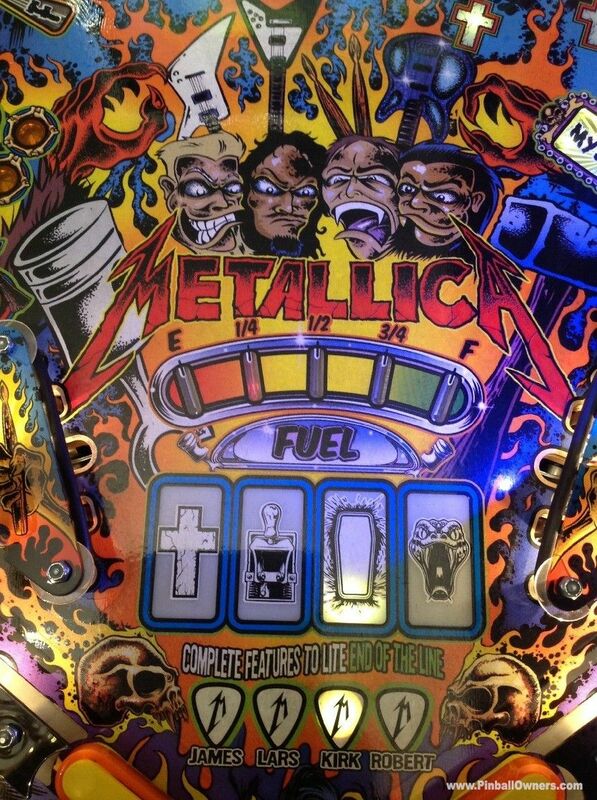 METALLICA Stern (USA) Monté, jouable Ca dépend 2013 (May) presently running the latest 1.8 updated game code. 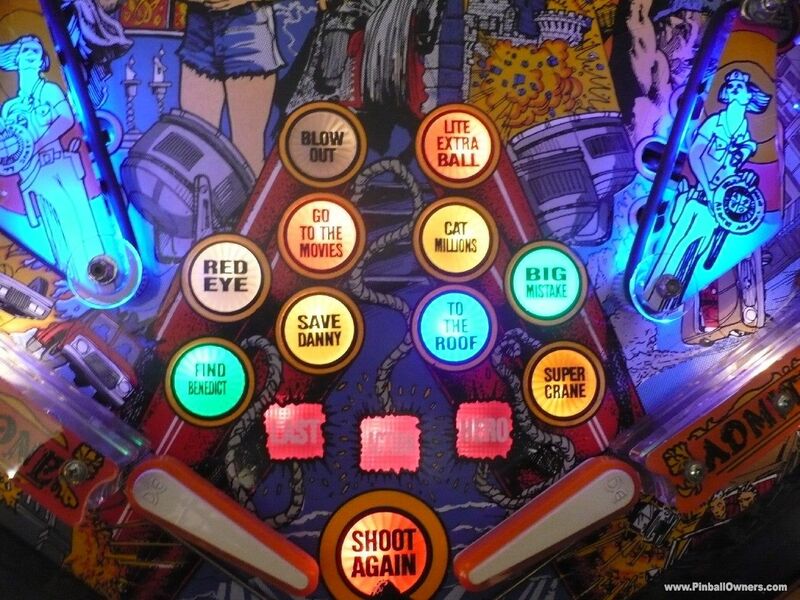 There is a lot to enjoy in this game., ., ..the art work, the game theme, the light show, the music..and stackable multi-ball features which extend the game time and makes for huge scores Gives you that insane grin as you rack -up the points in an awesome manic 4 ball musical frenzy.Fitted with stainless mirror blades, colour changing speaker lighting, and a colour DMD.. Just an awesome clever game. 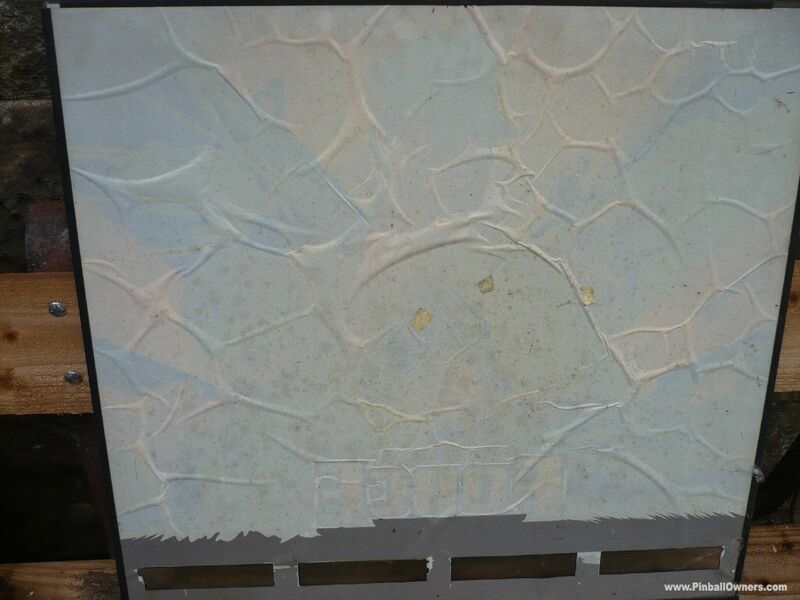 Low play unmarked original example. 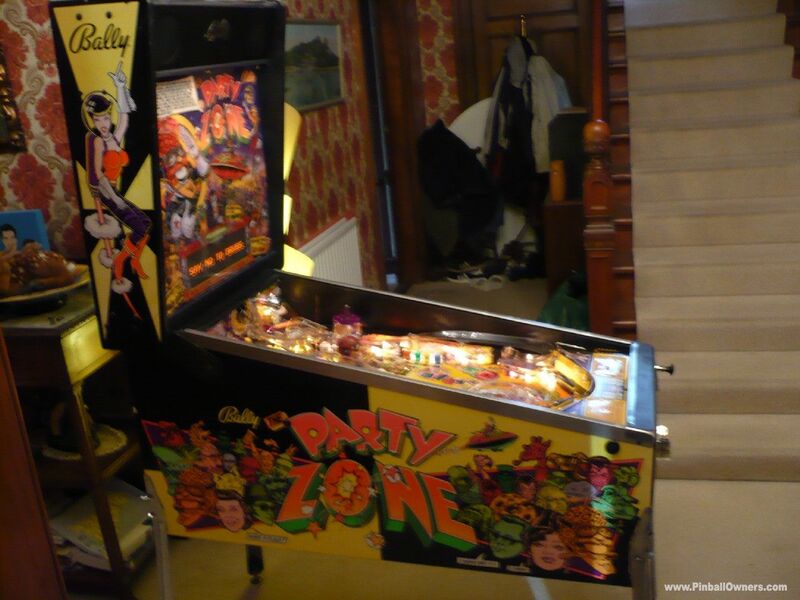 PARTY ZONE Bally (USA) Monté, jouable Ca dépend (August)1991. 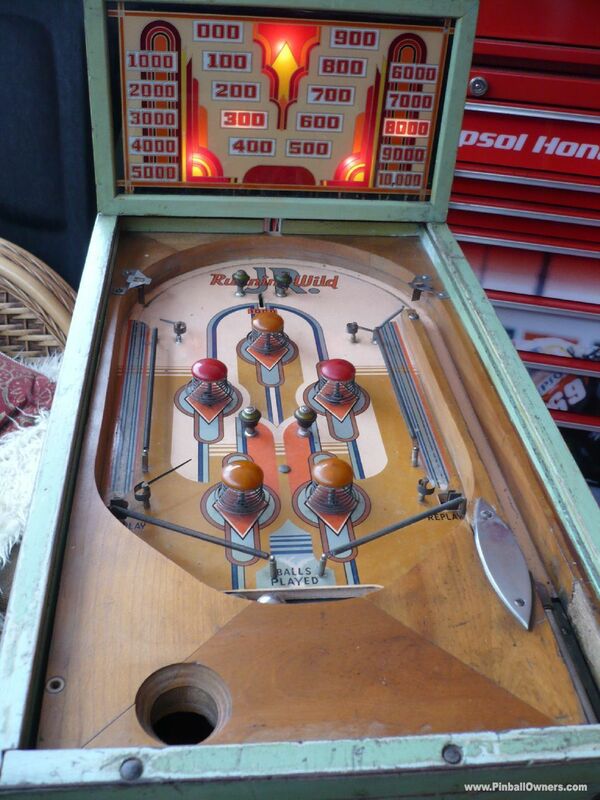 All original with good strong color to diamond plate play-field and cabinet. 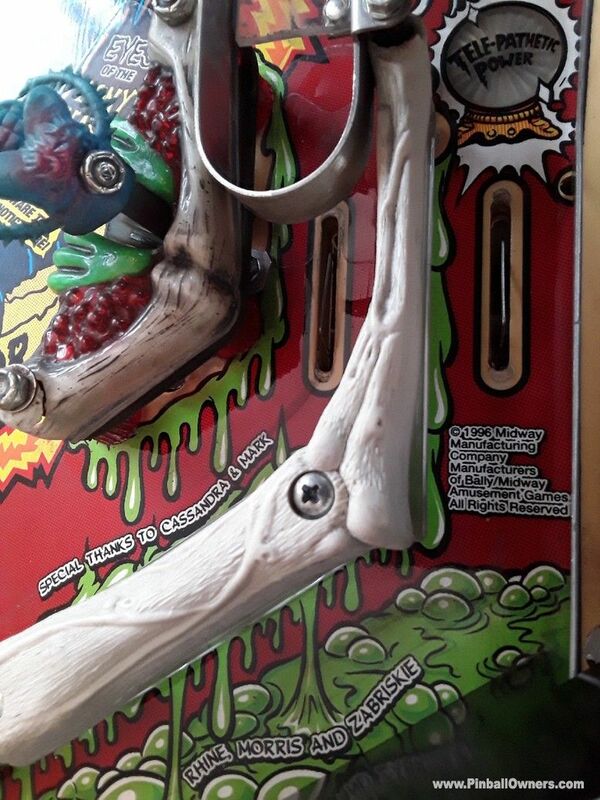 Plays strong like it should. 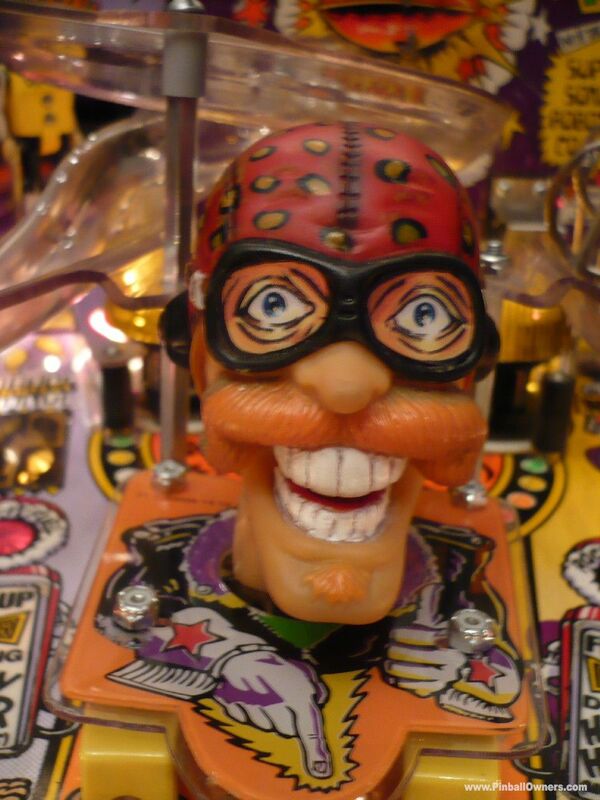 Capt.B-Zarr plays your music requests (favourites being...pinball wizard, n purple haze), head following the ball movement, Crash test Dummy dances and wins points, whilst the Super Sonic Robot tells jokes in some alien Language. 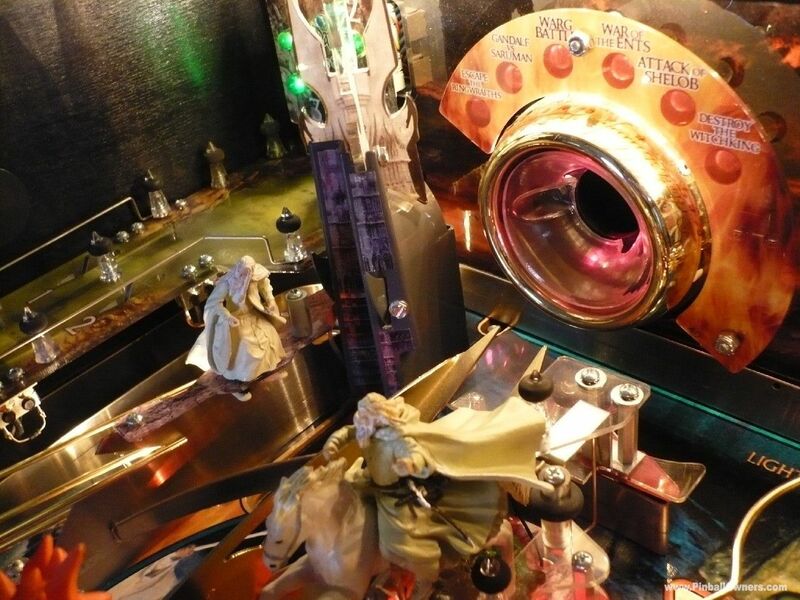 All Party people meet up in the Cosmic Cottage for Drinks and eats ending in a big points visual BIG. 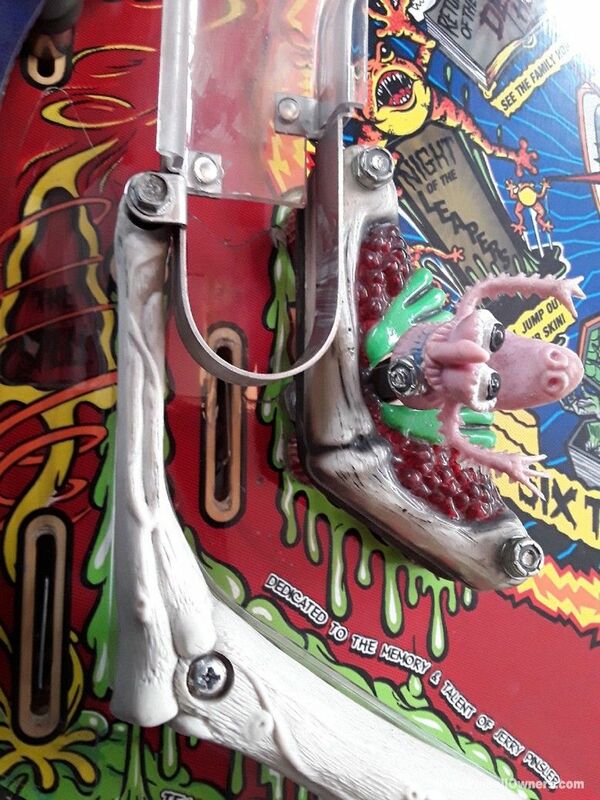 (Red).BANG !!!!!. 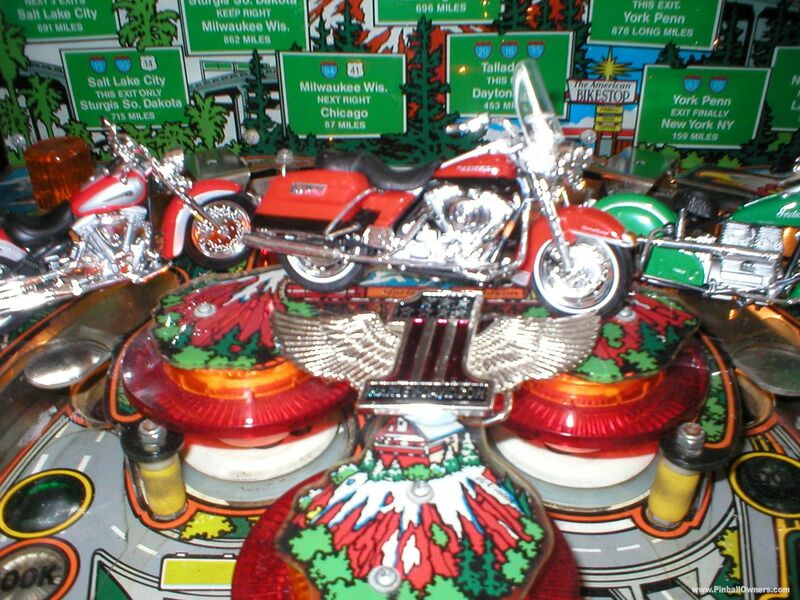 The ramps curve n swirl tightly with a busy dot matrix.The flashing effect with Red n Yellow light show is especially memorable...yes ...just.. 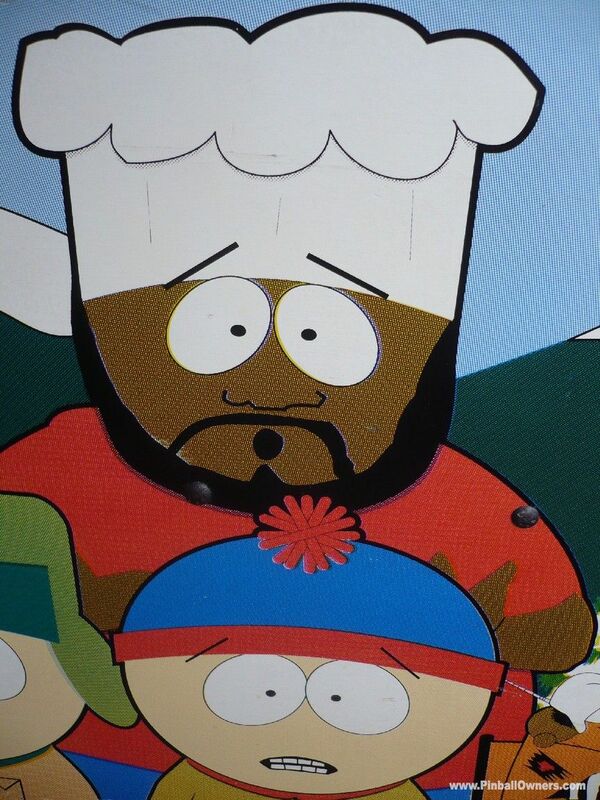 ......So good. 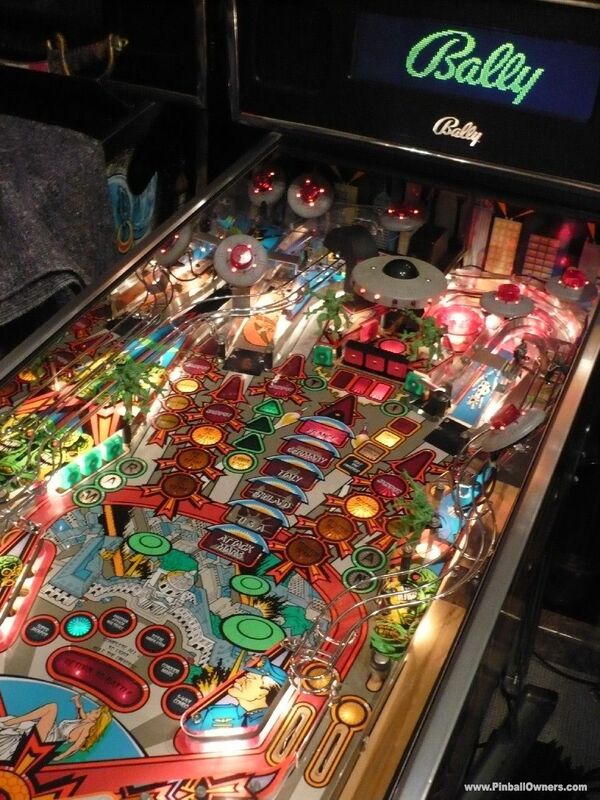 A really well cared for and beautiful game. 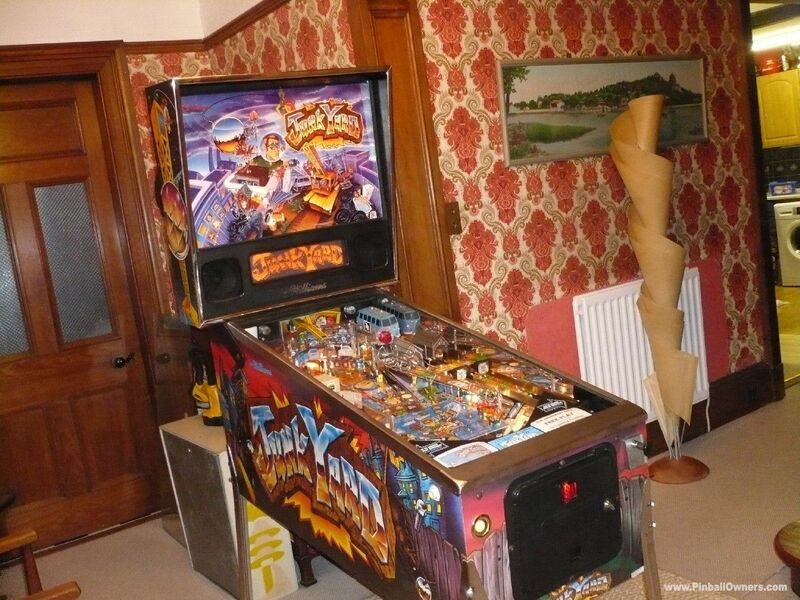 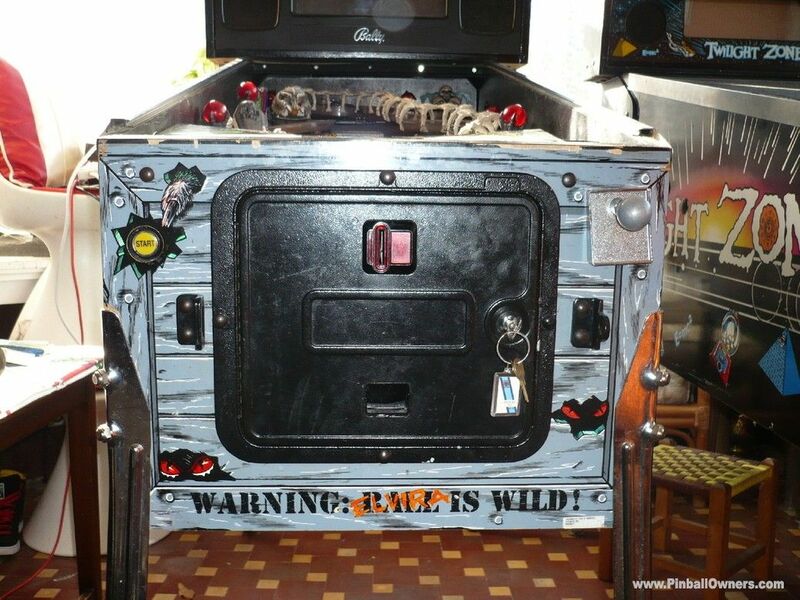 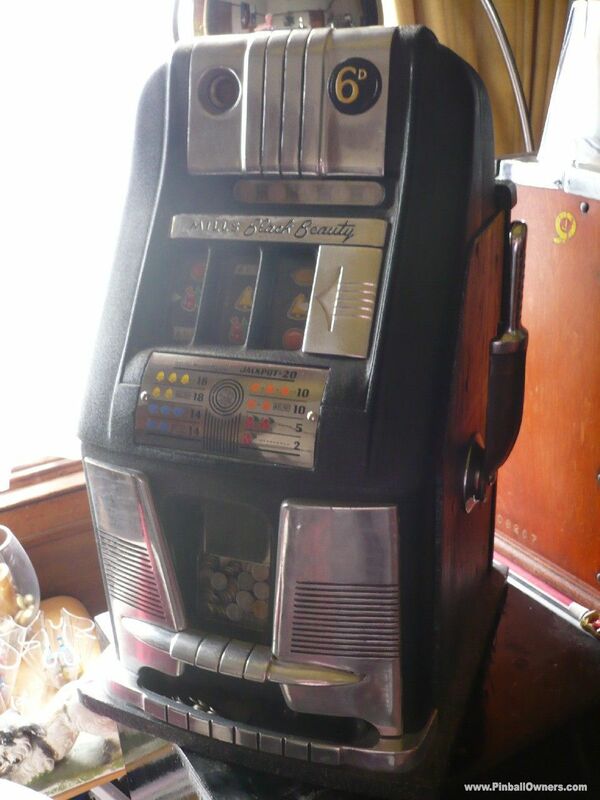 RUNNING WILD Genco (USA) Monté, jouable Ca dépend 1938 A "time capsule" survivor. 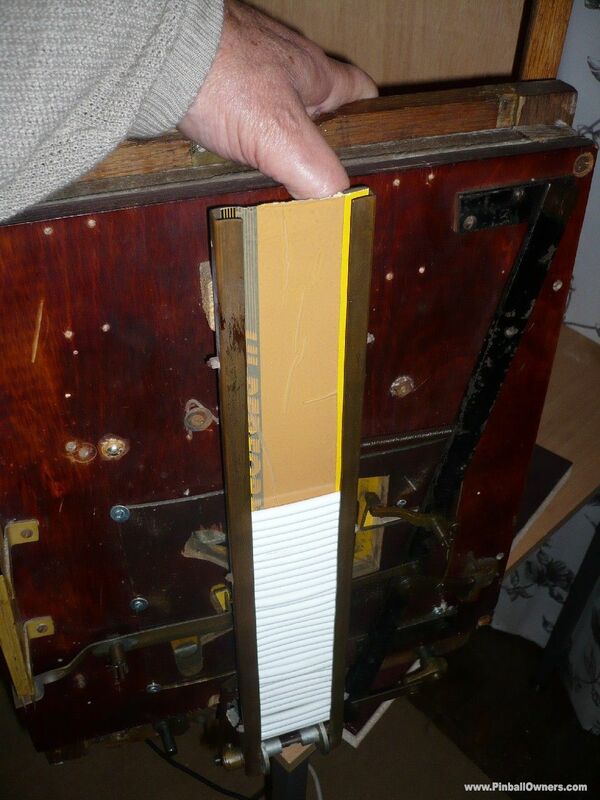 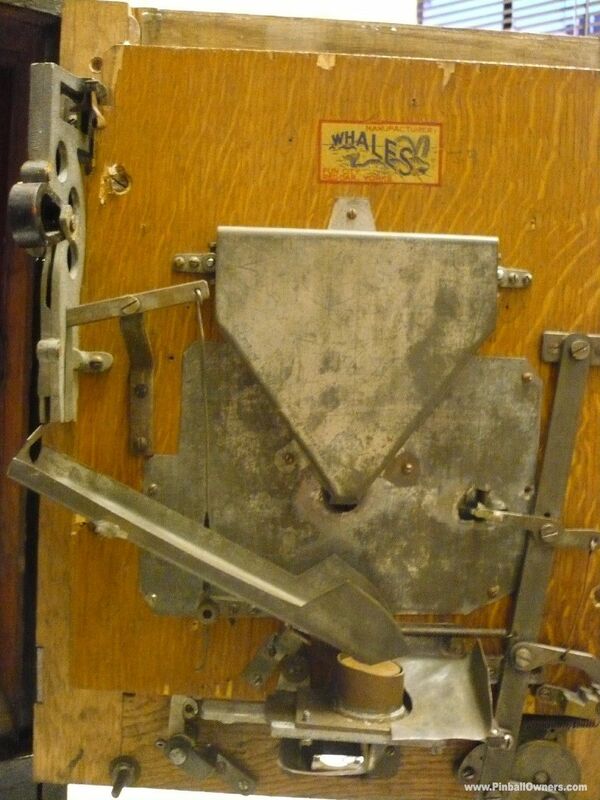 Why would a small machine be so heavy?.The lock was drilled out to find it full of Old copper pennies. 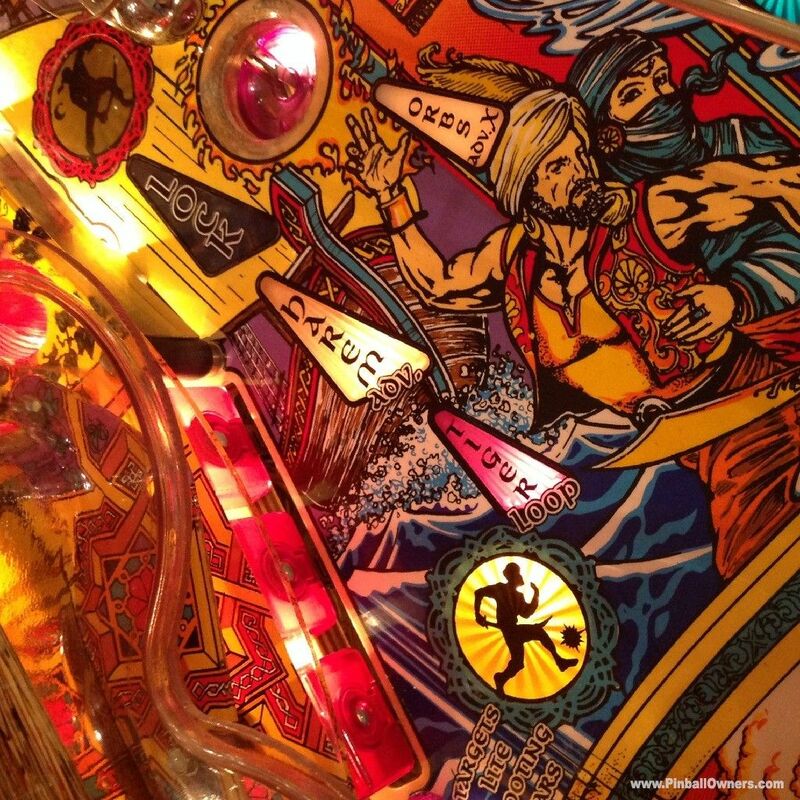 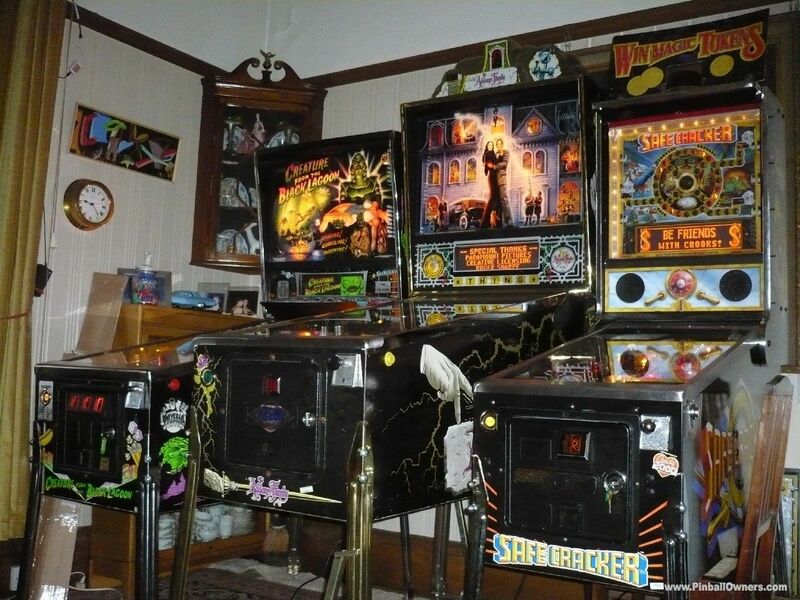 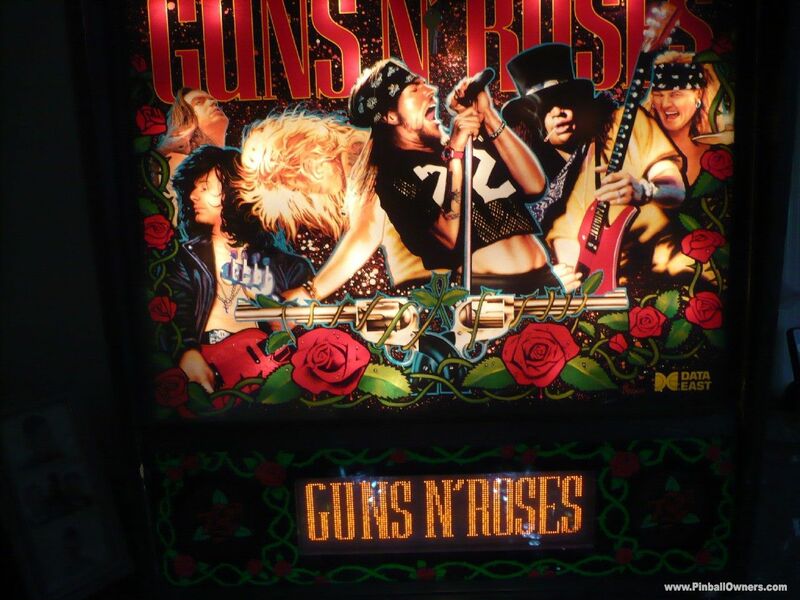 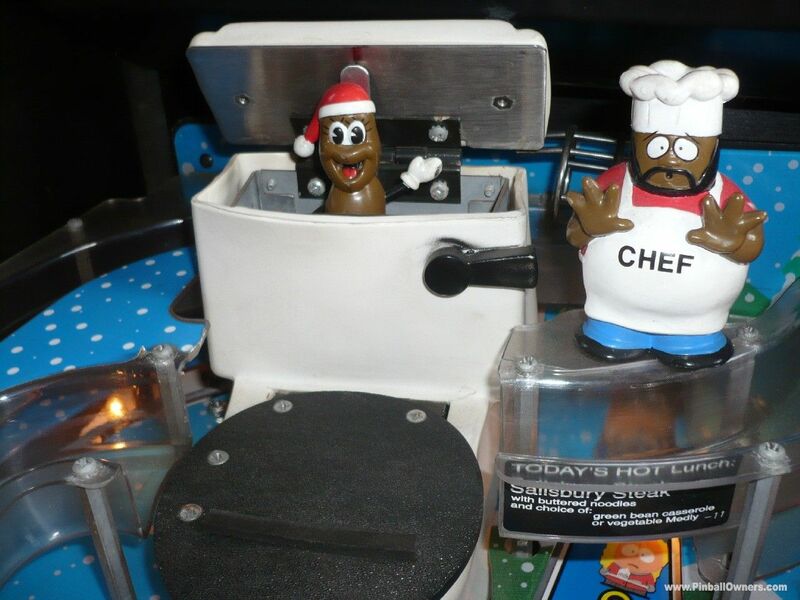 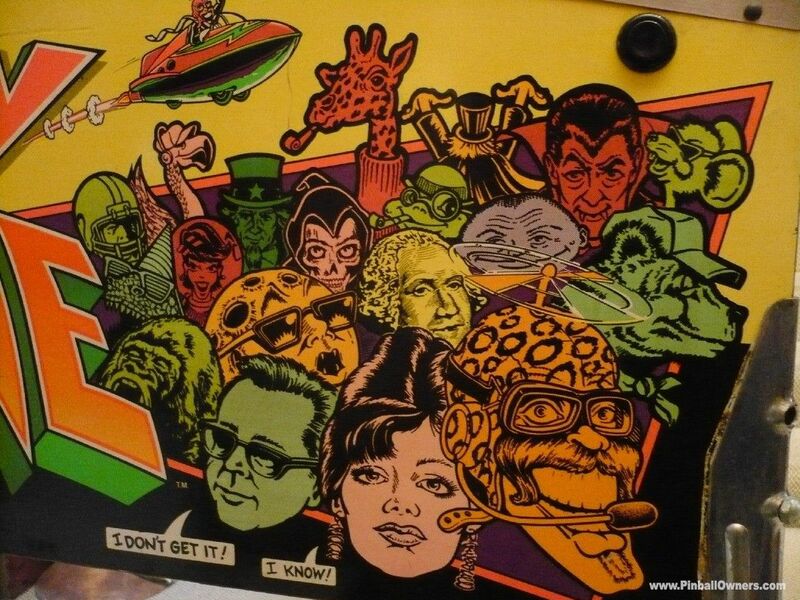 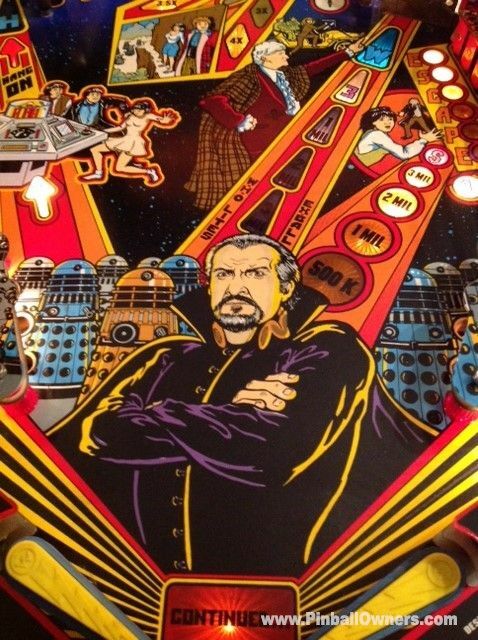 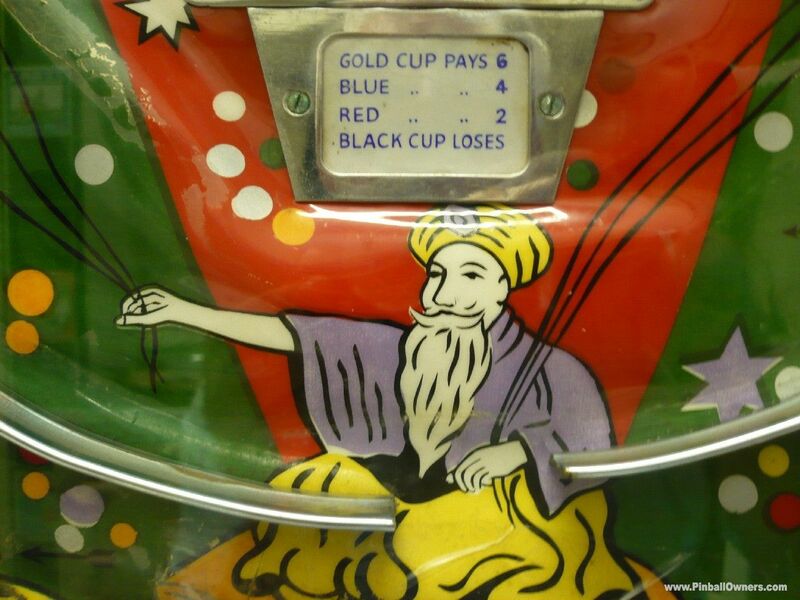 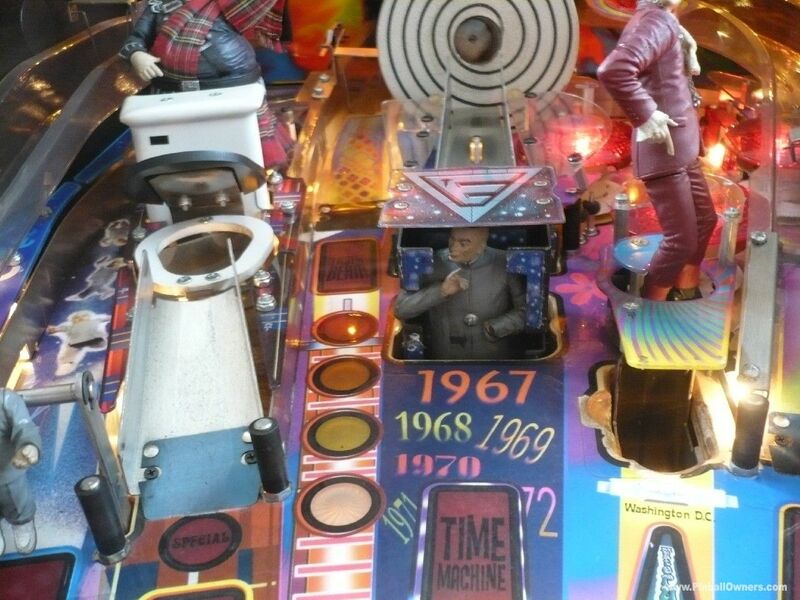 A true gamblers pinball. 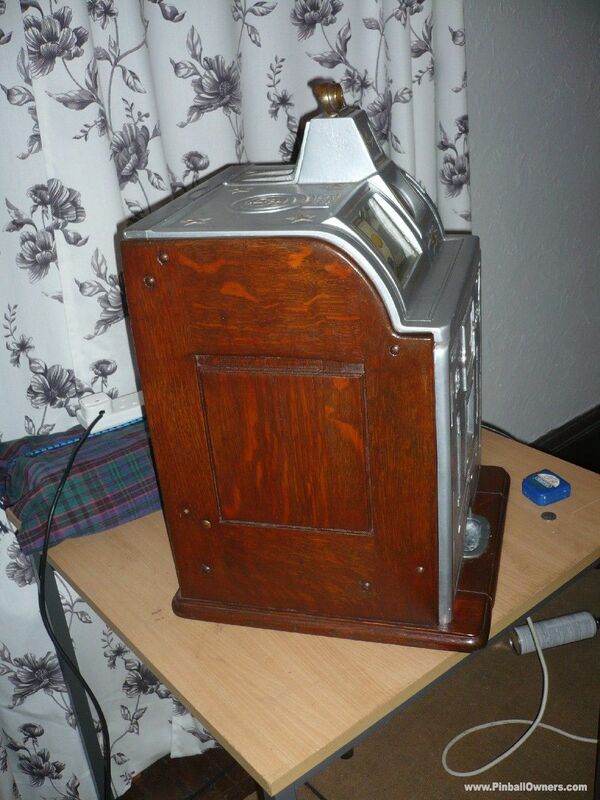 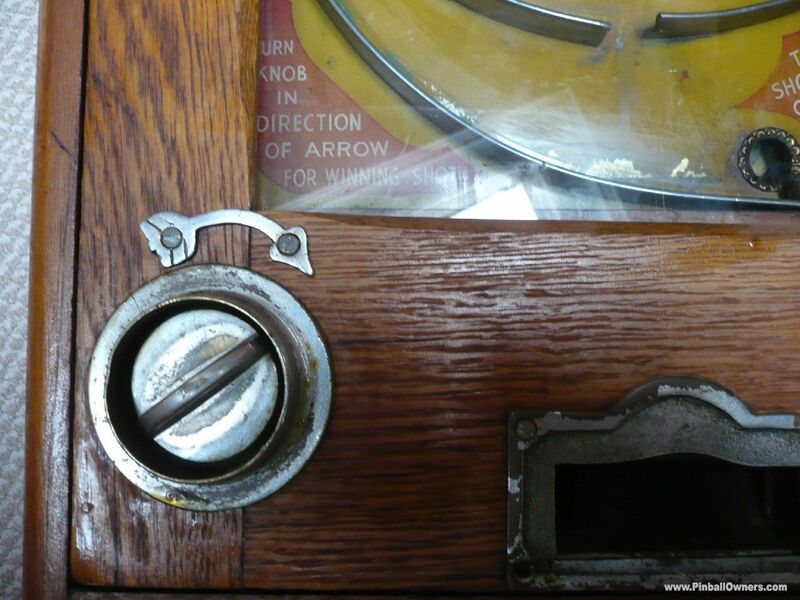 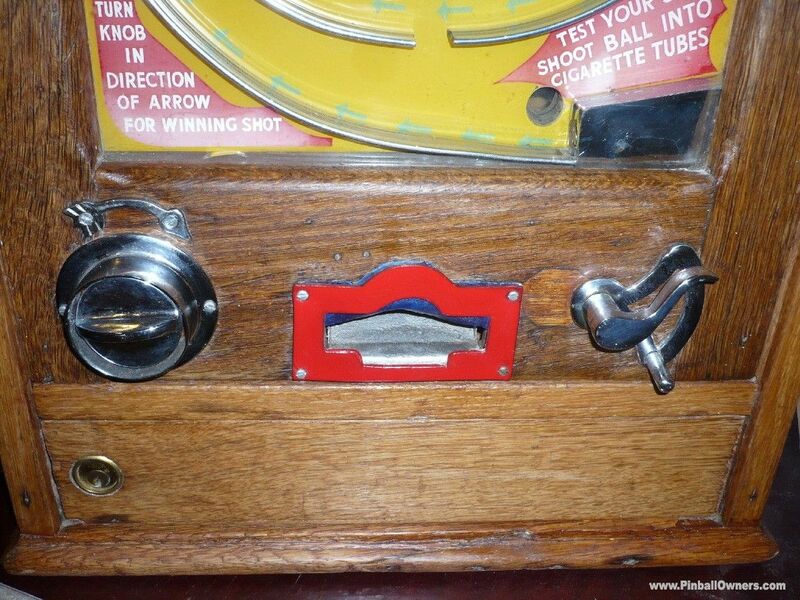 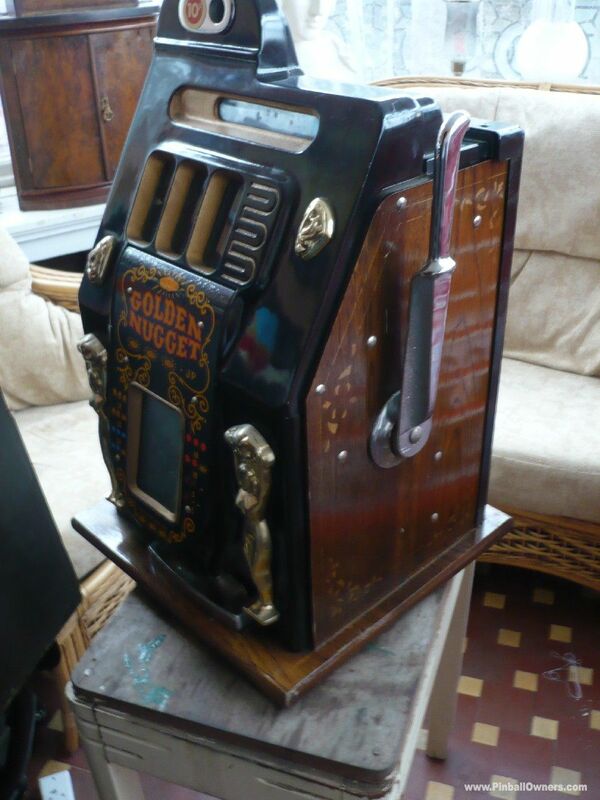 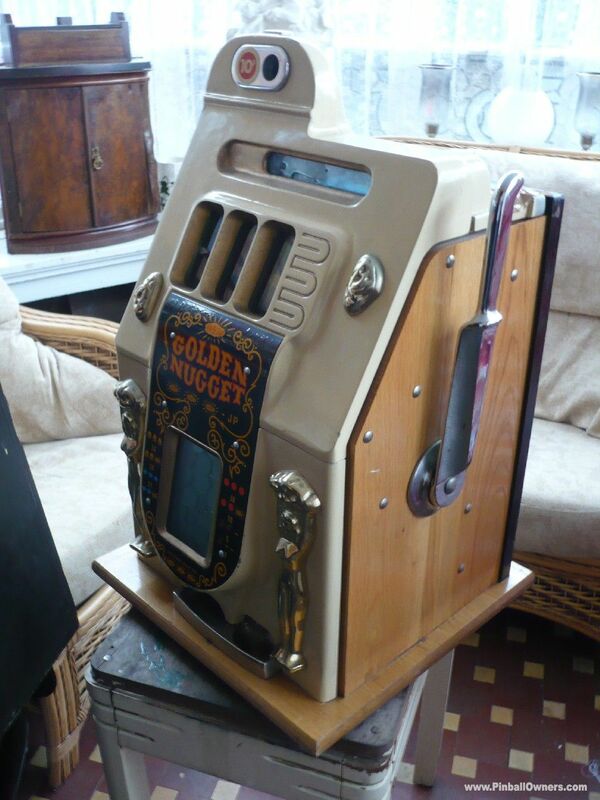 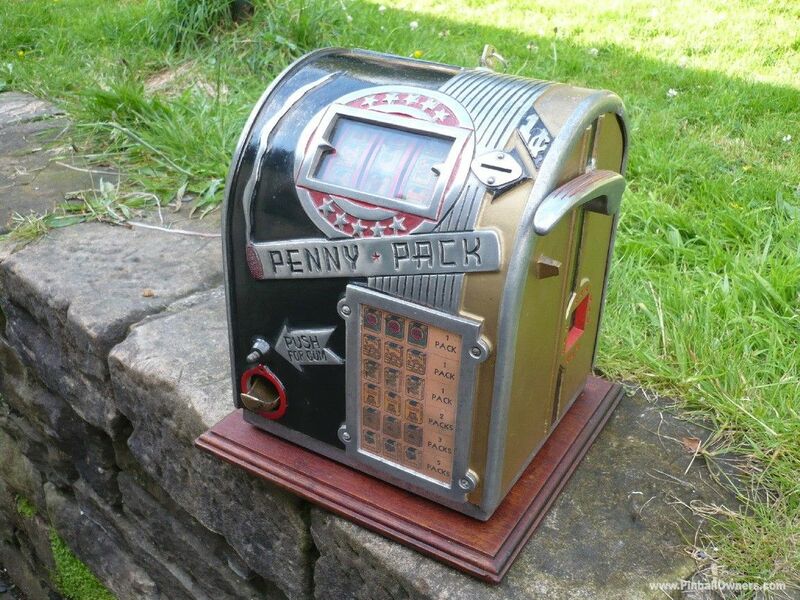 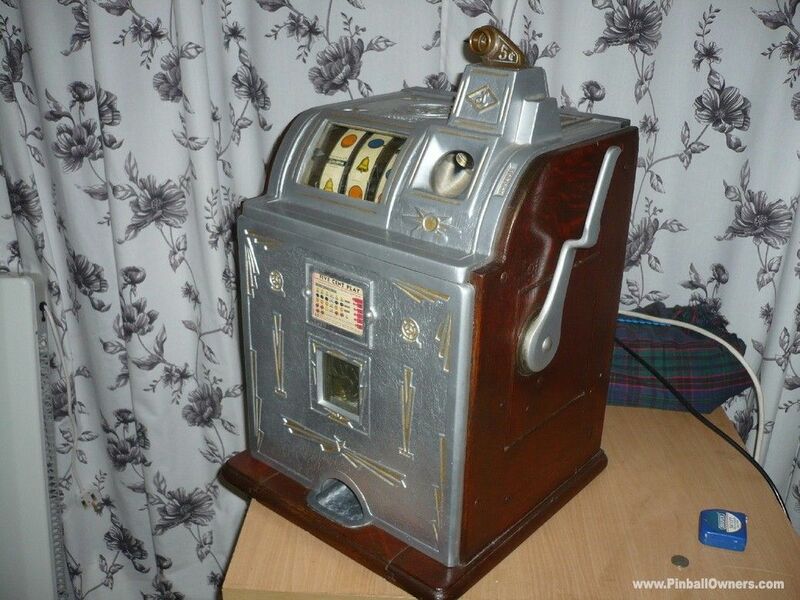 You place a penny in the coin slider and push slider in then pull slider out again.The penny drops into cashbox. 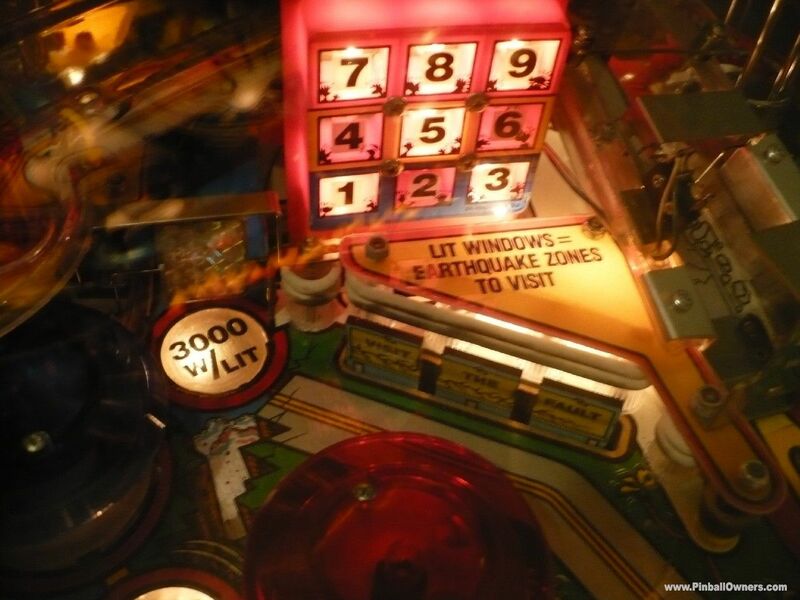 Machine back glass lights-up, timer starts the countdown clock. 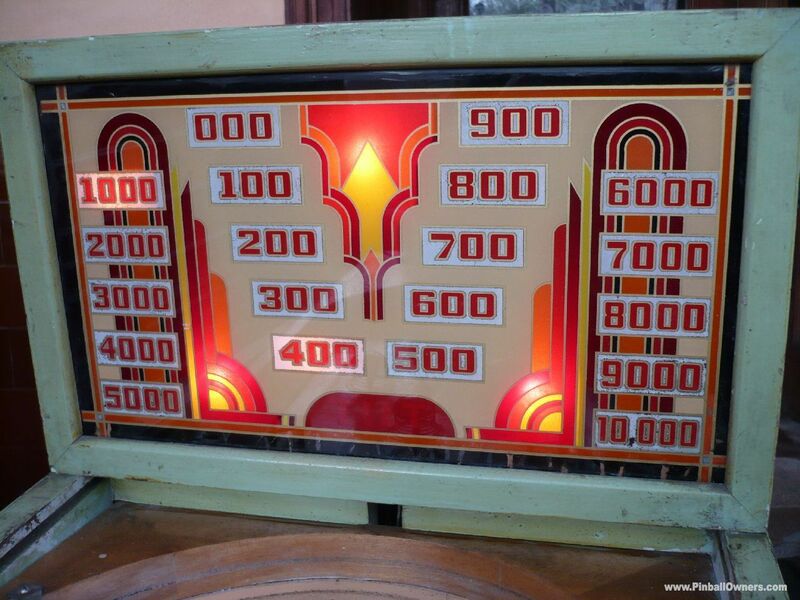 Five balls drop into the loading shute. 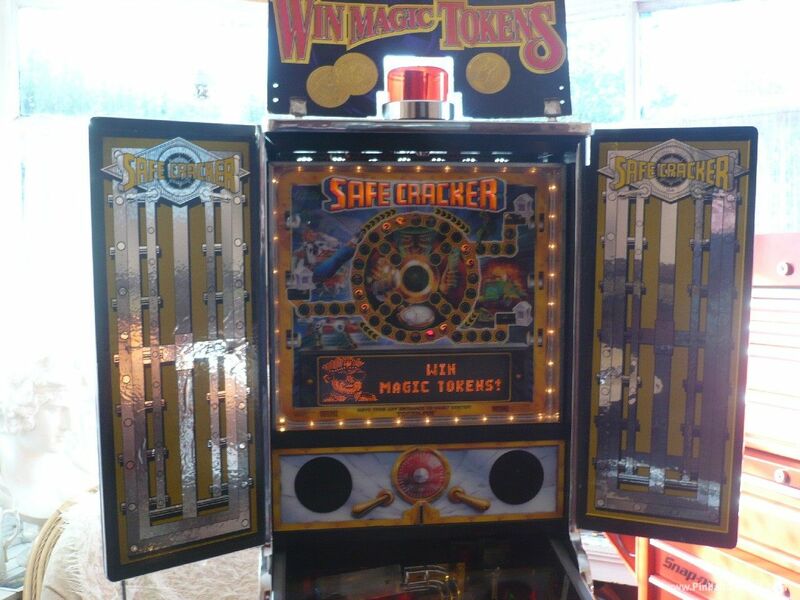 Each ball is lifted into the shooter lane and put into play. 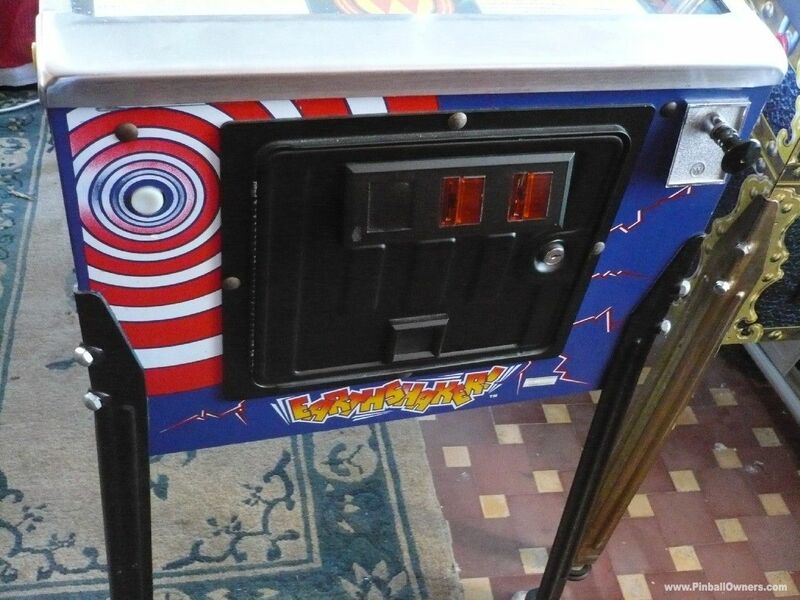 With no flippers and the tilt set finely, you watch the ball scoring hits on the spring bumpers and one roll-over switch. 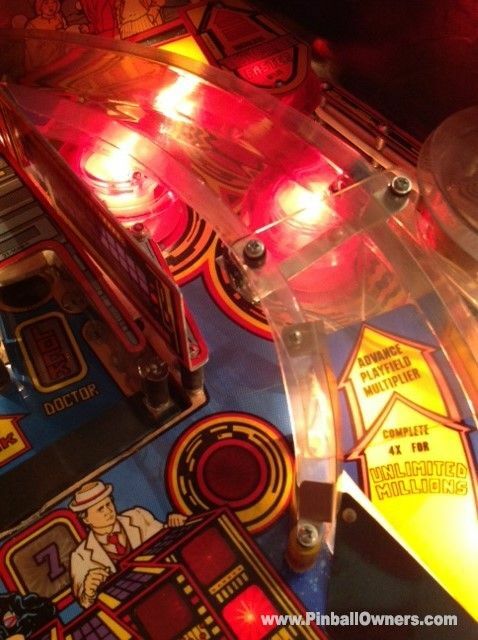 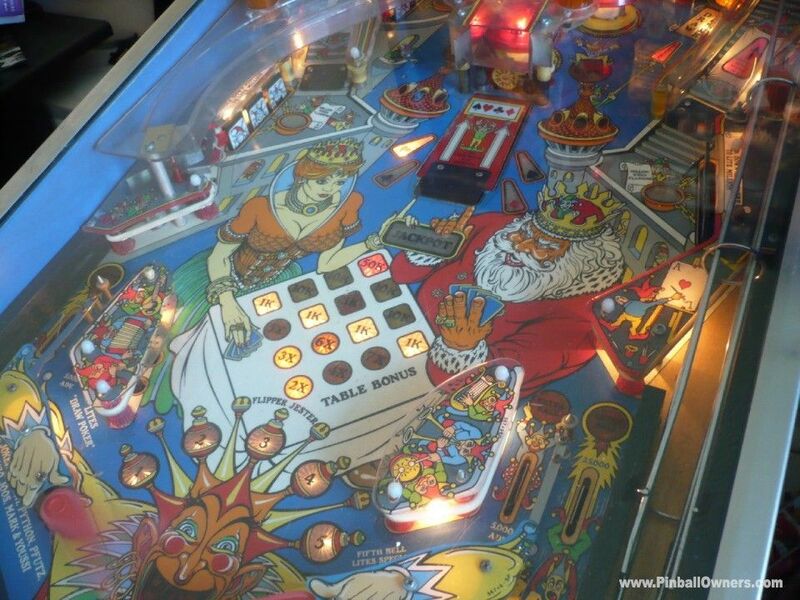 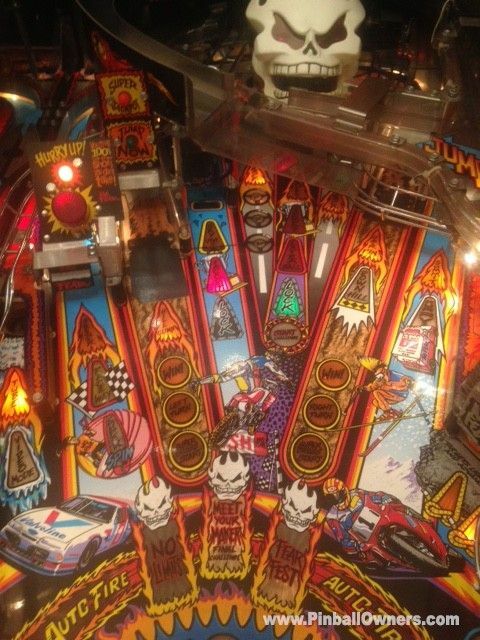 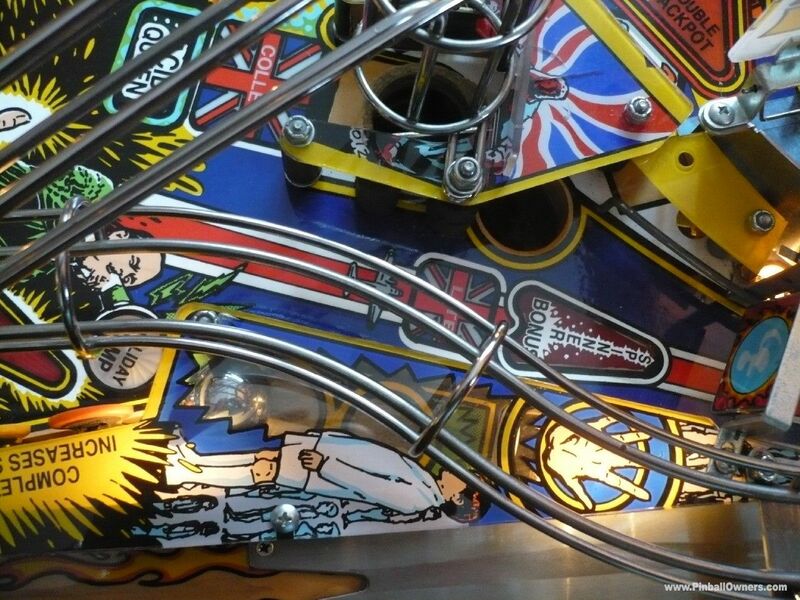 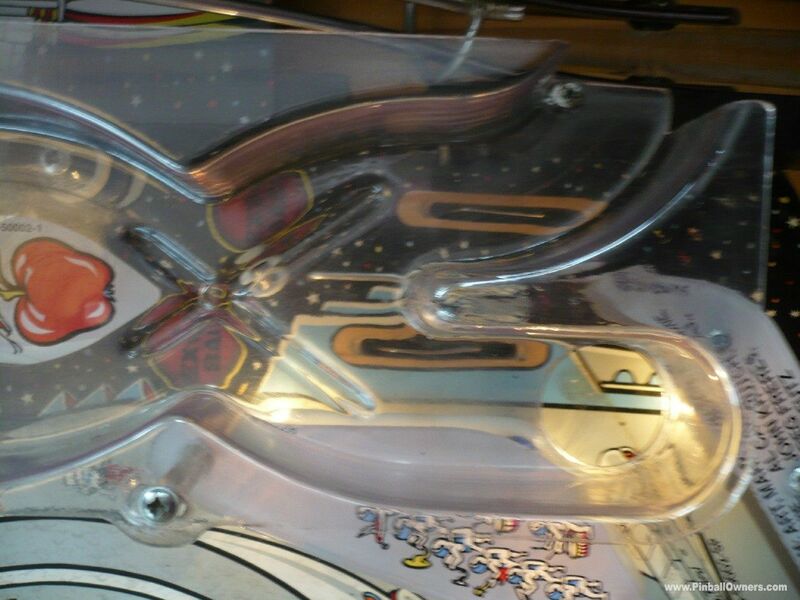 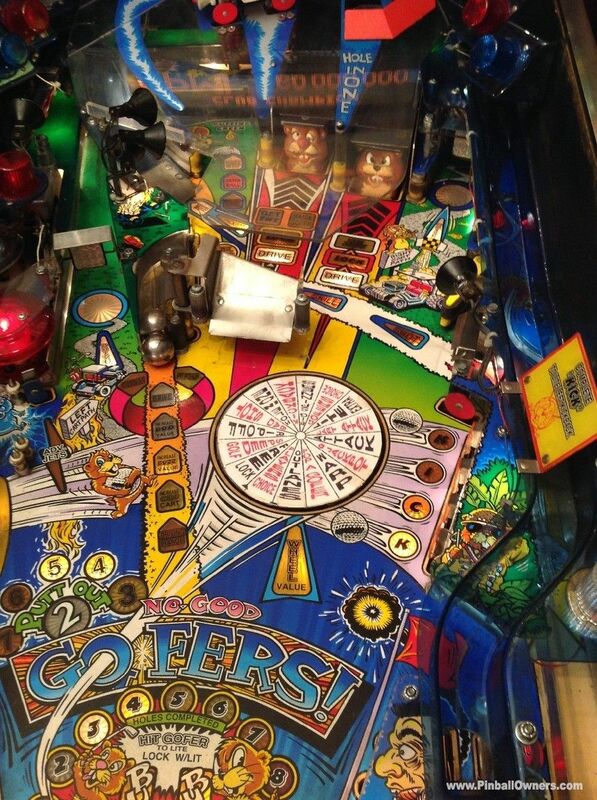 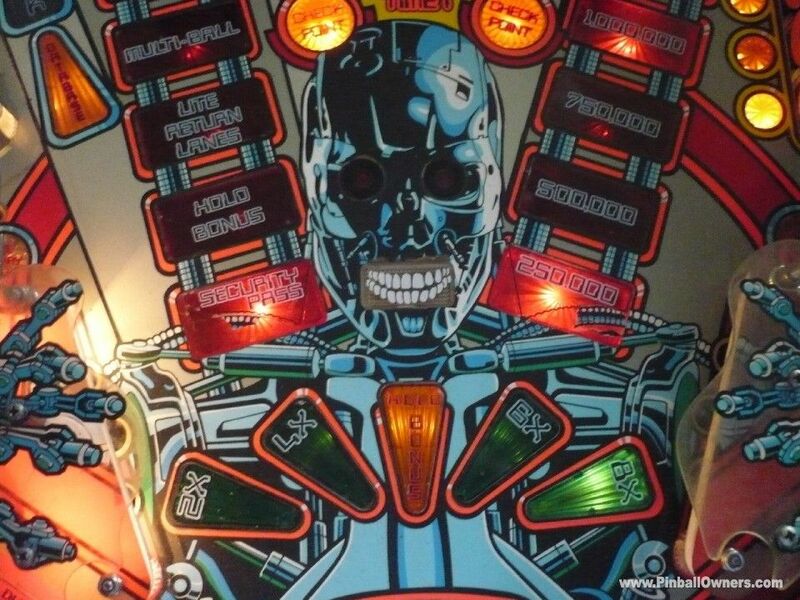 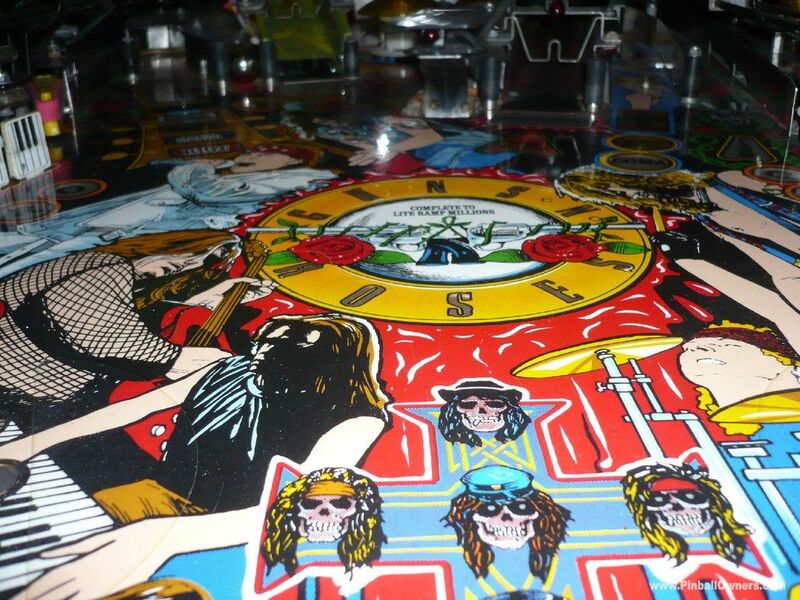 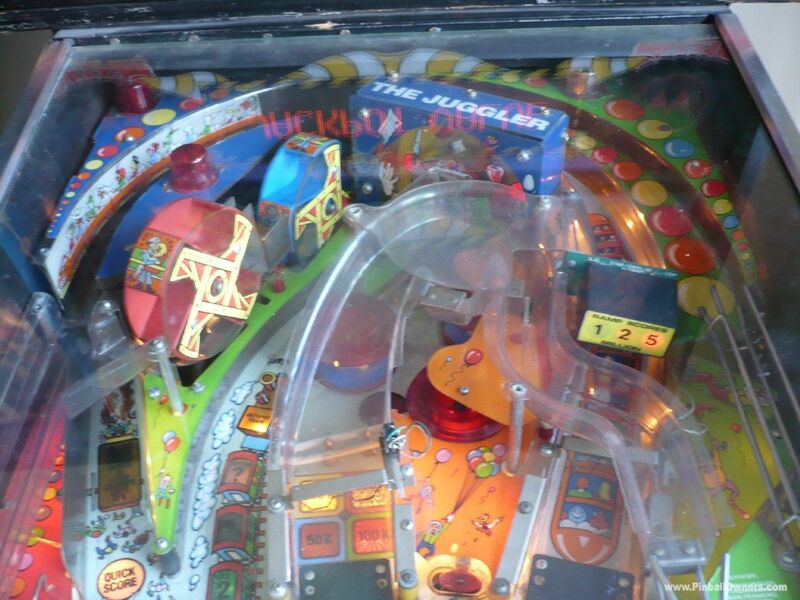 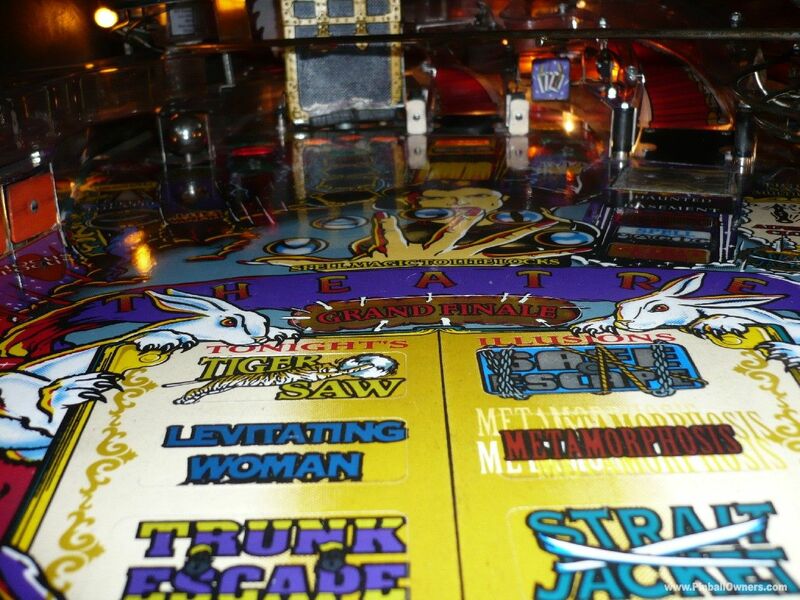 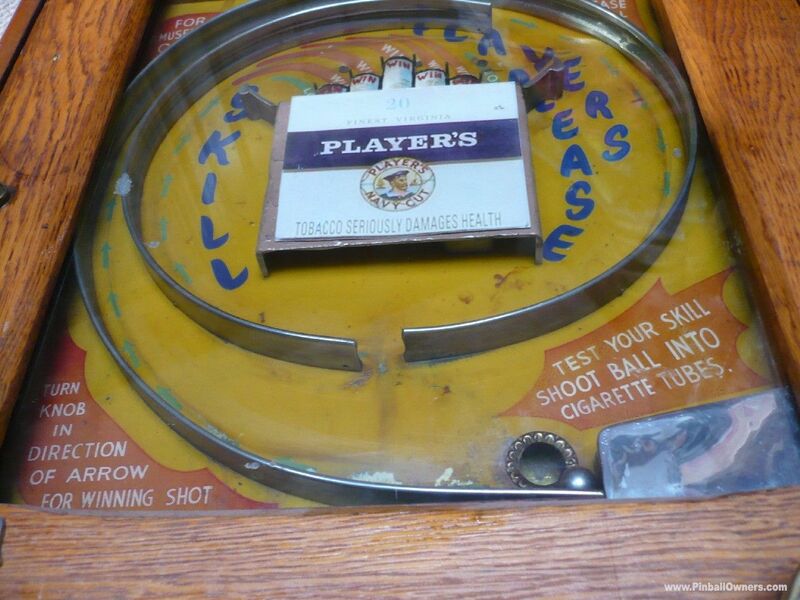 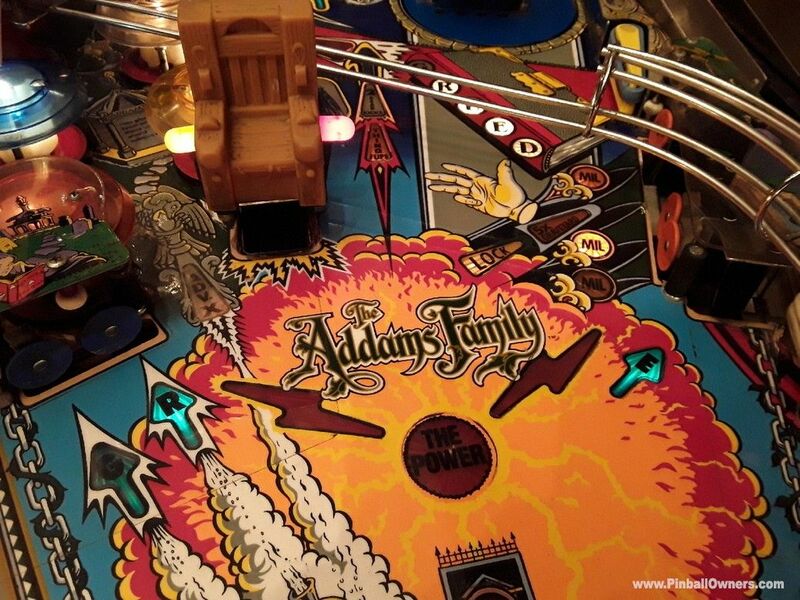 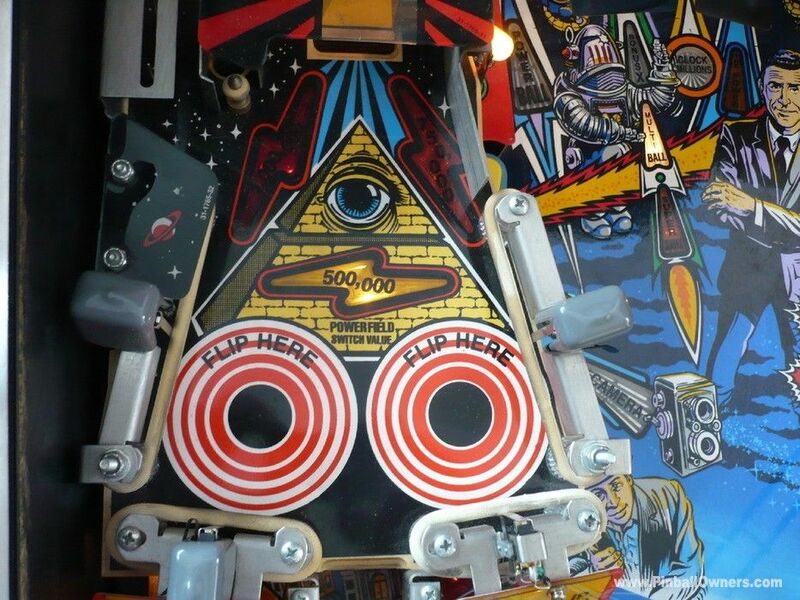 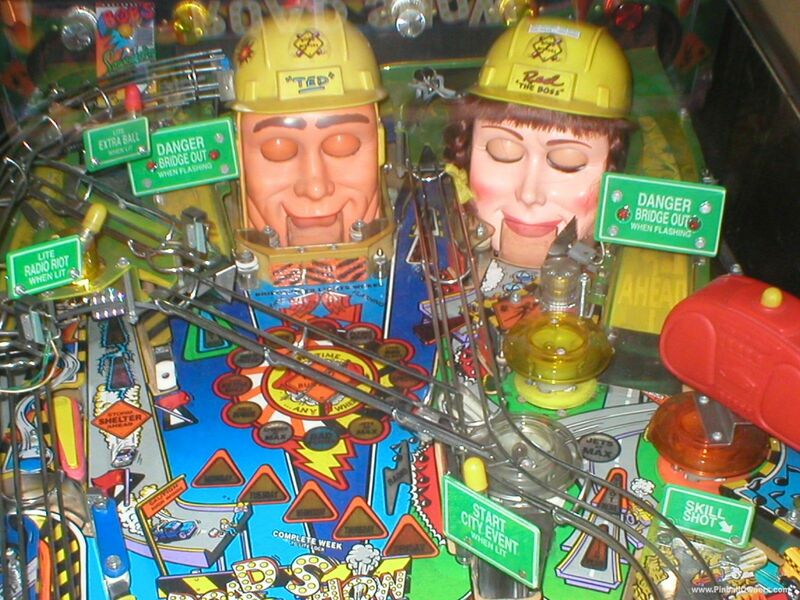 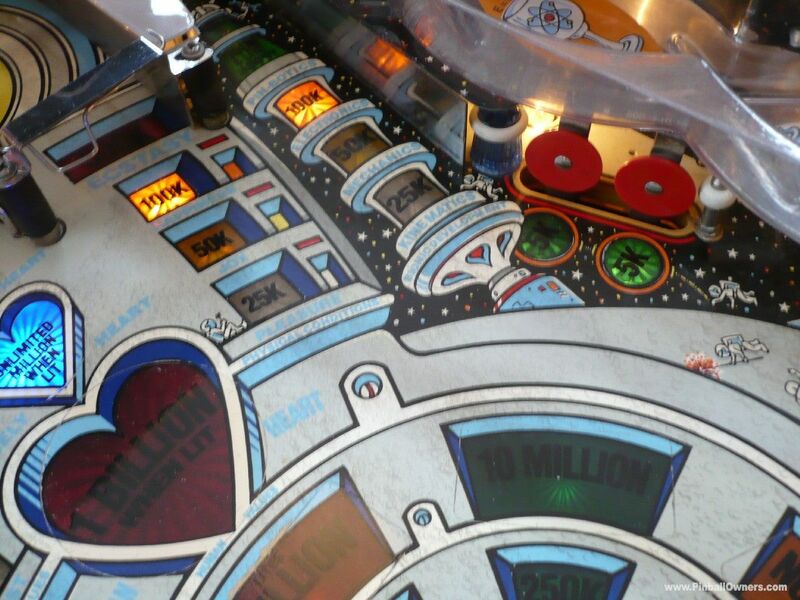 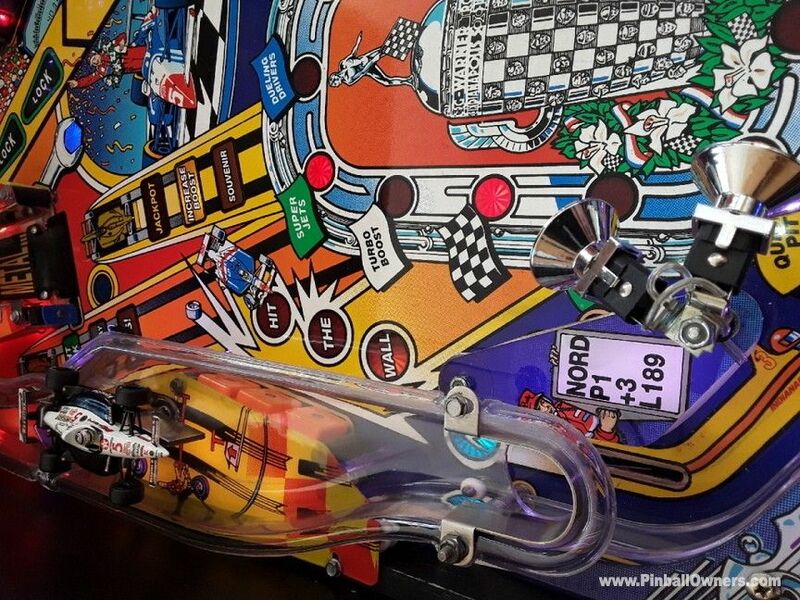 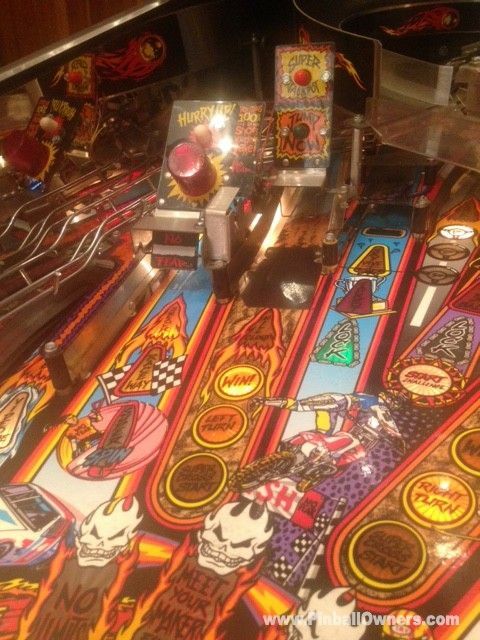 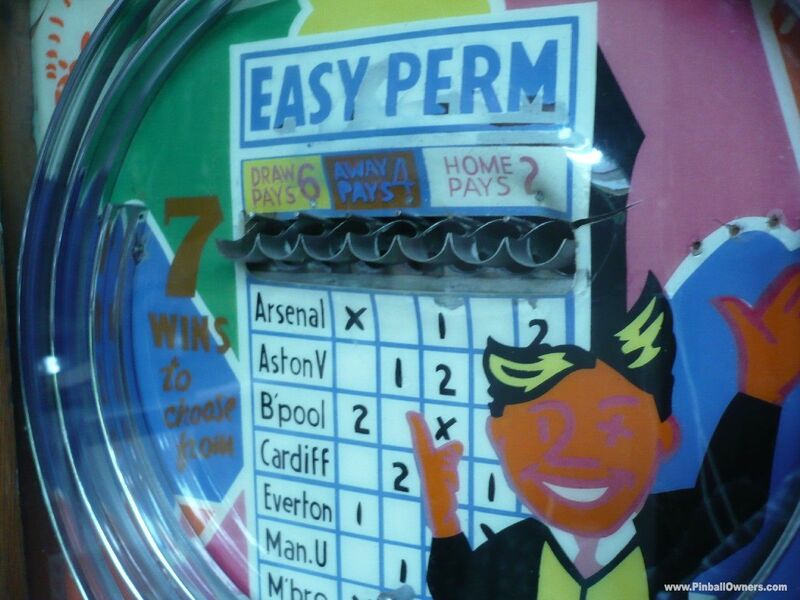 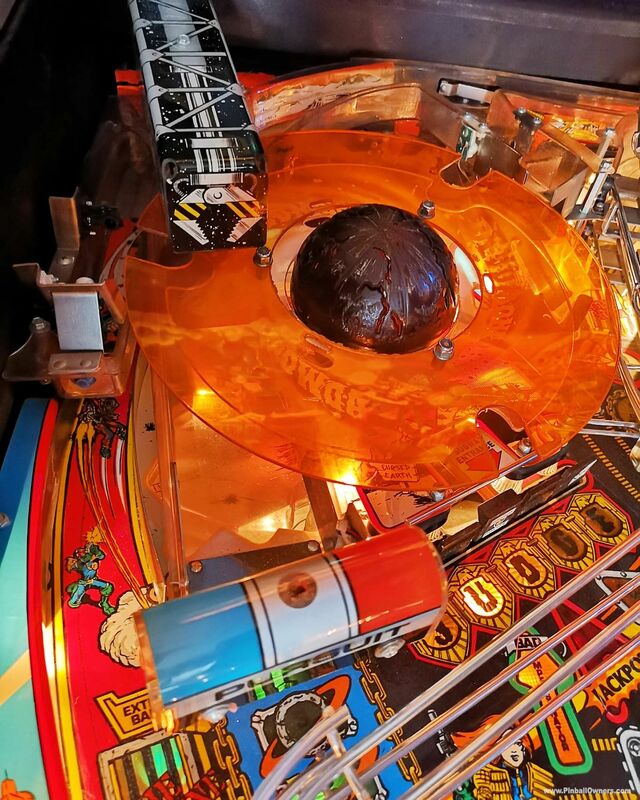 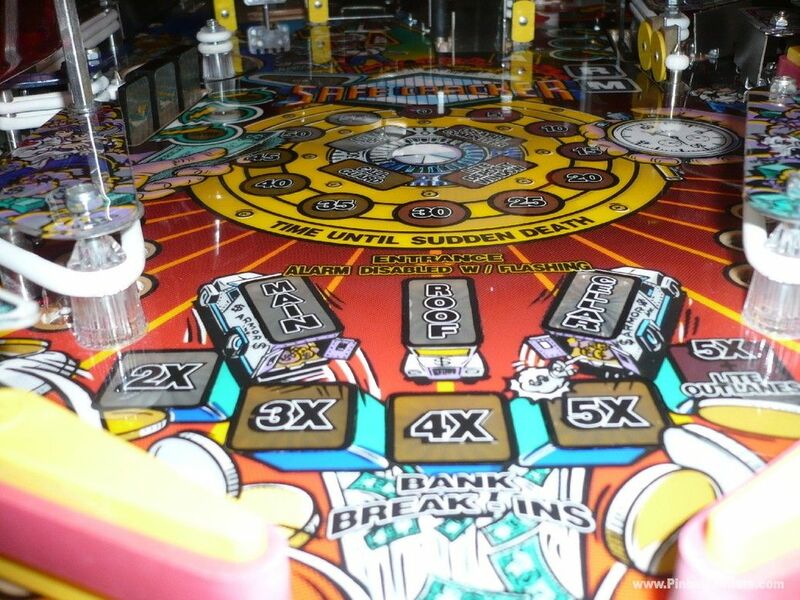 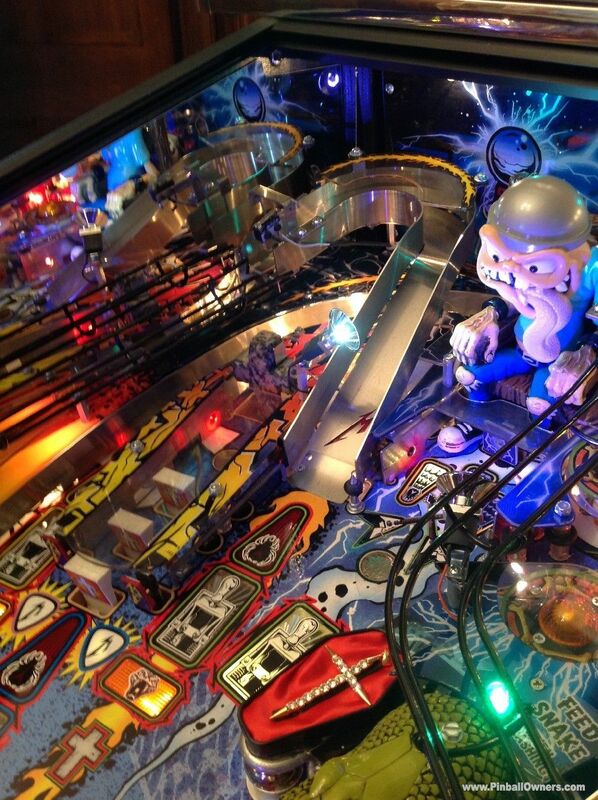 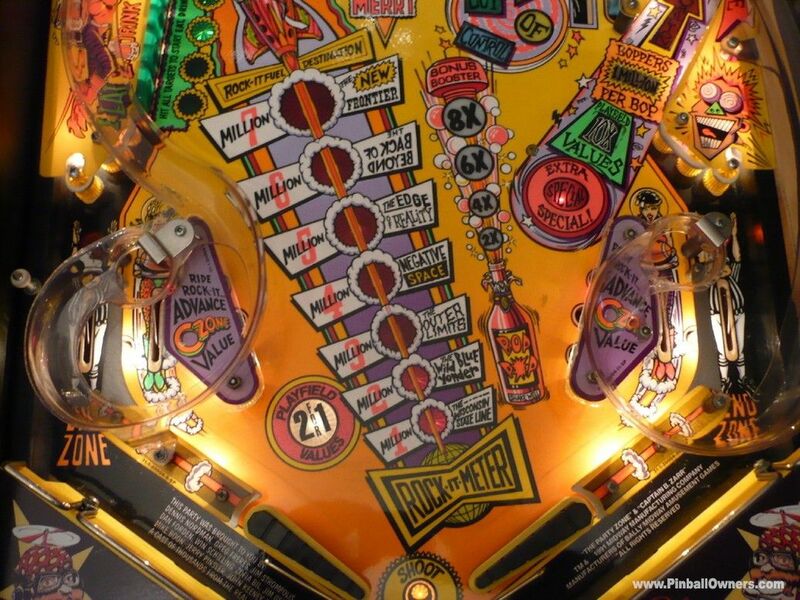 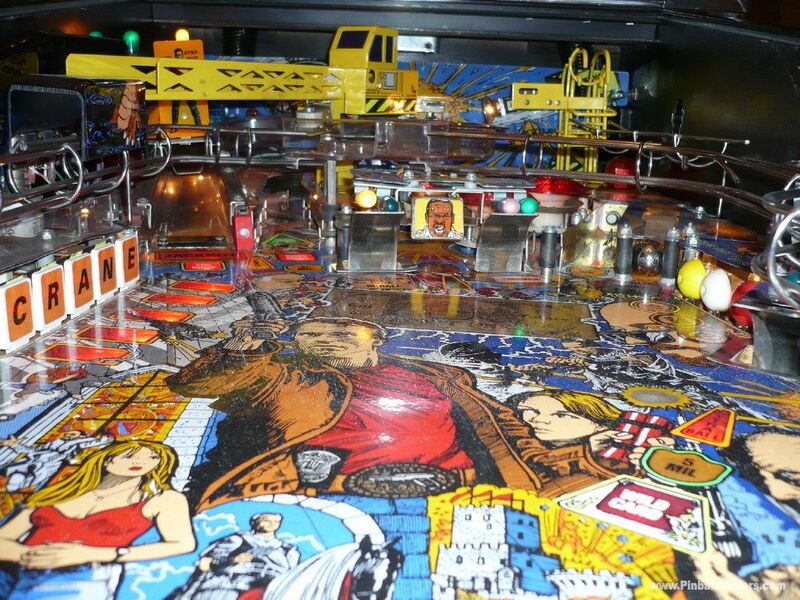 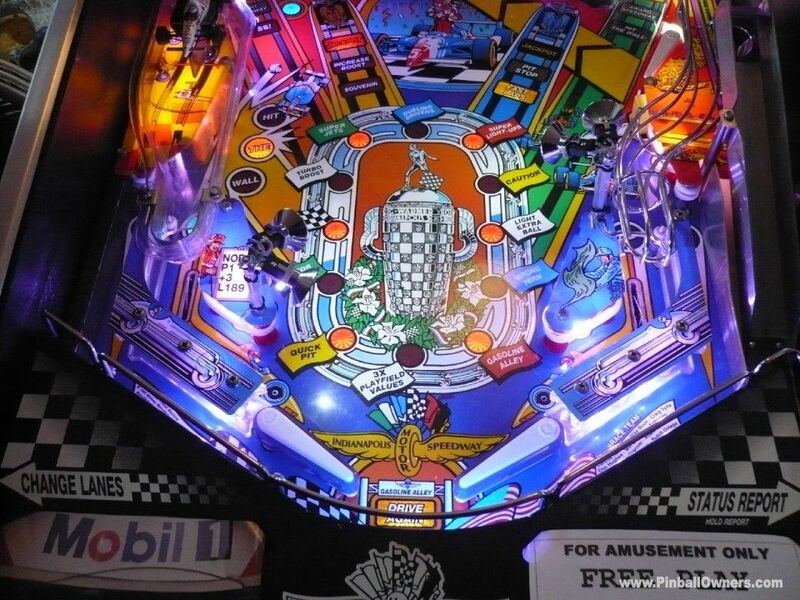 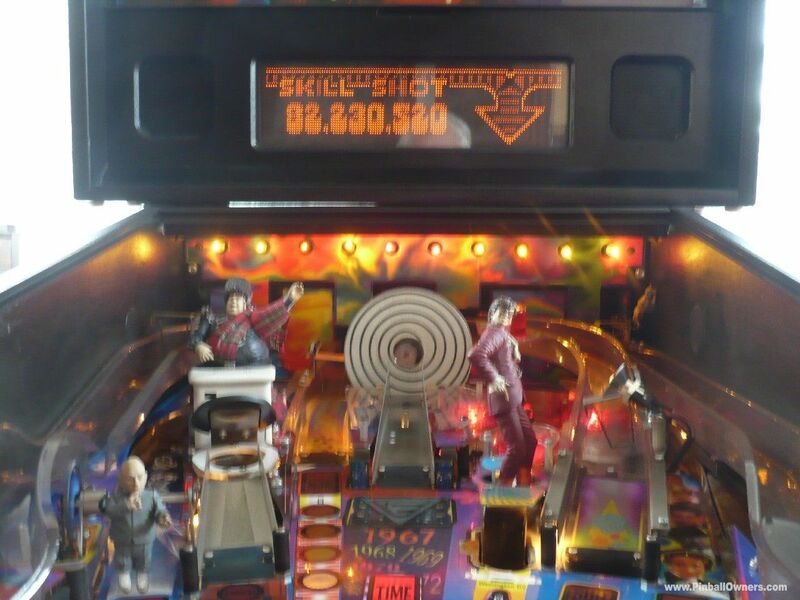 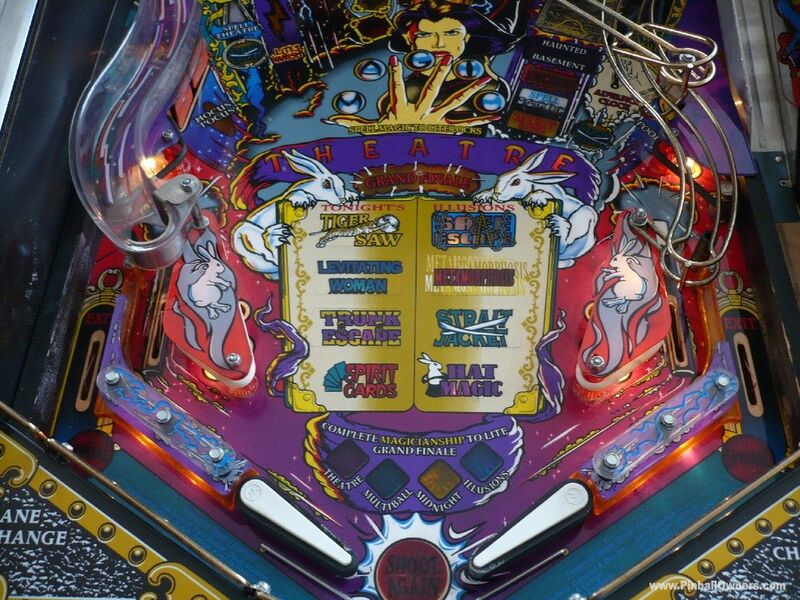 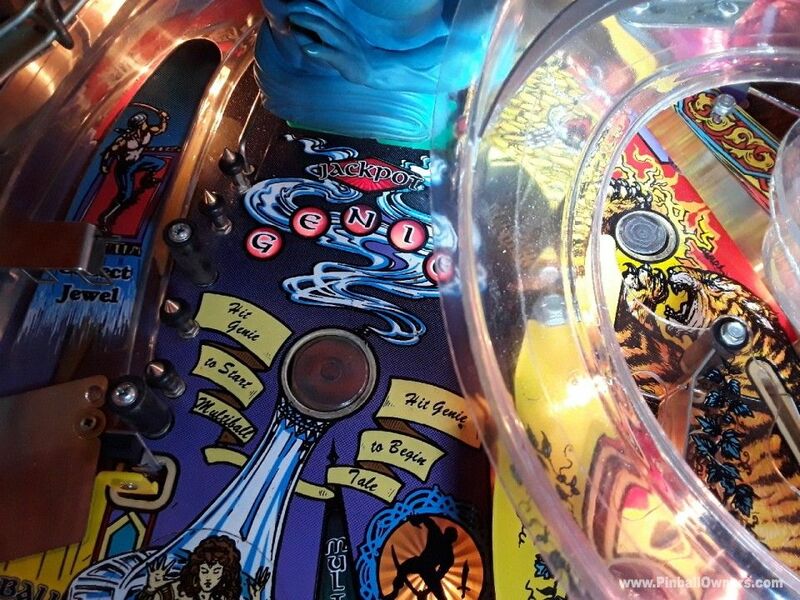 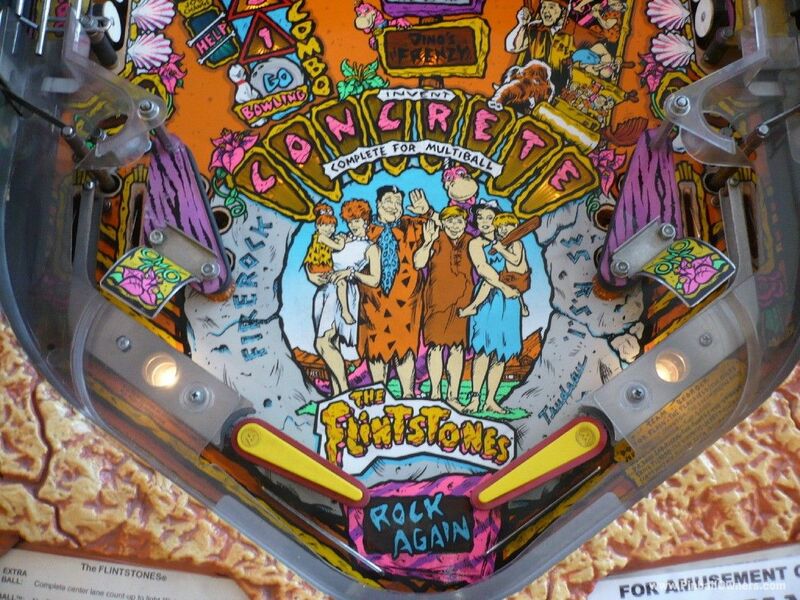 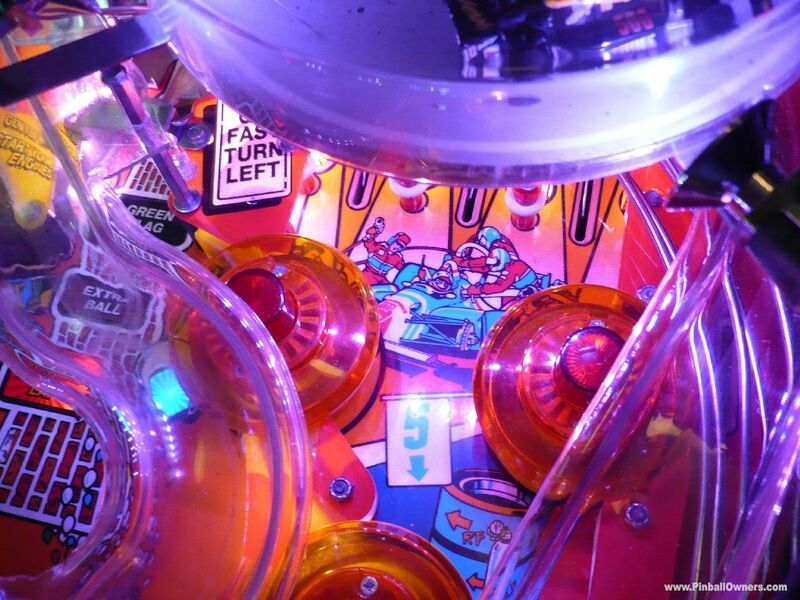 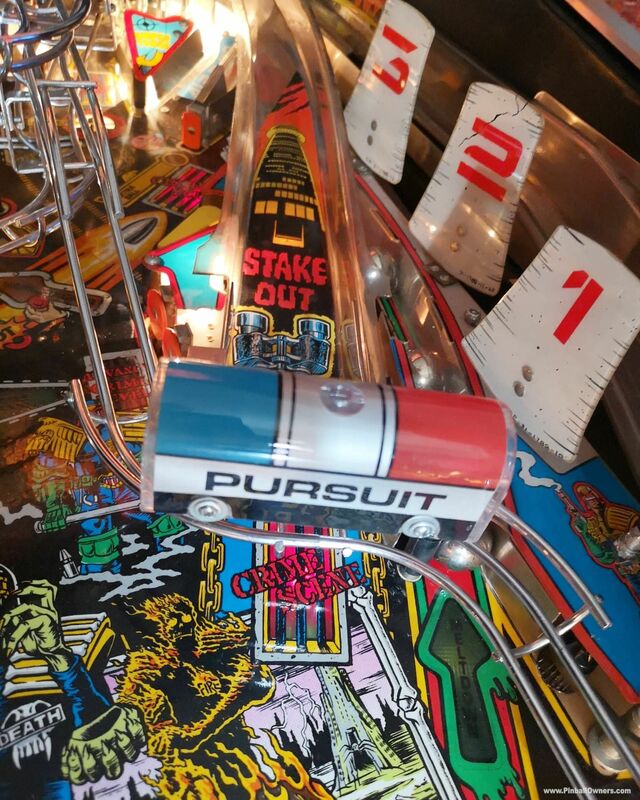 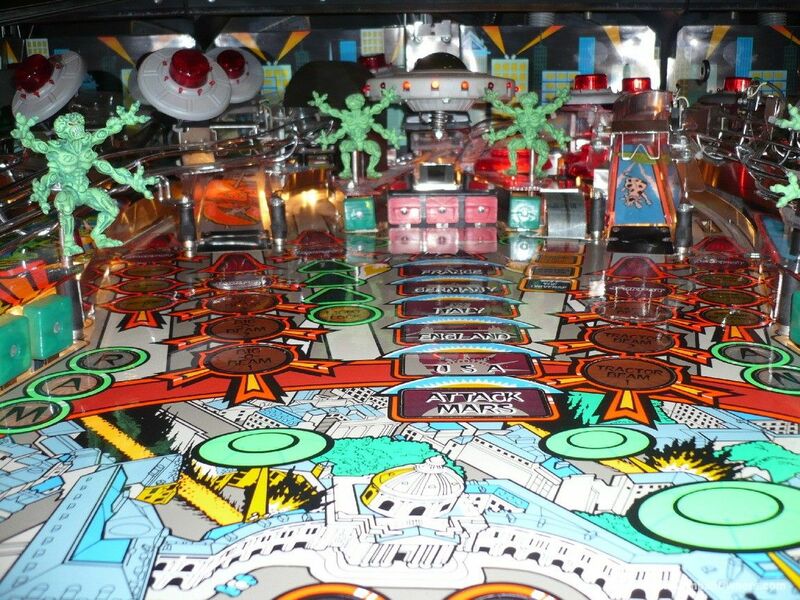 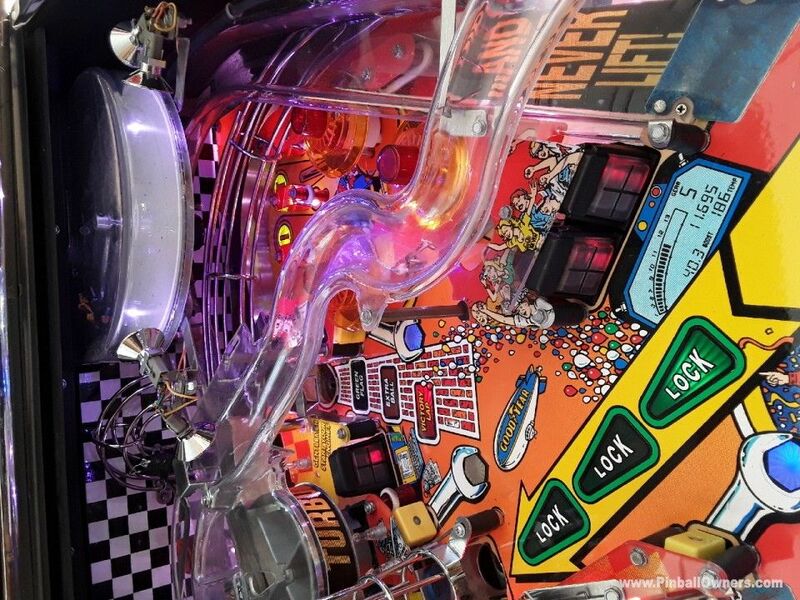 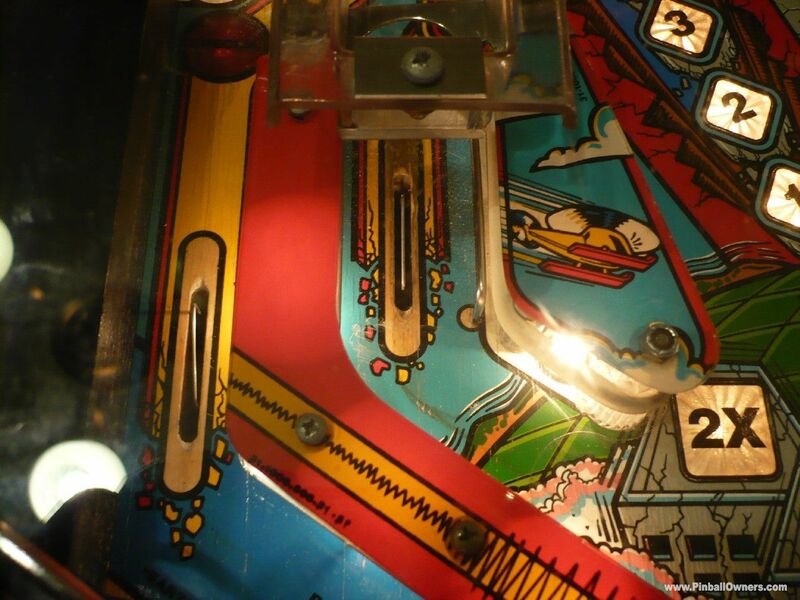 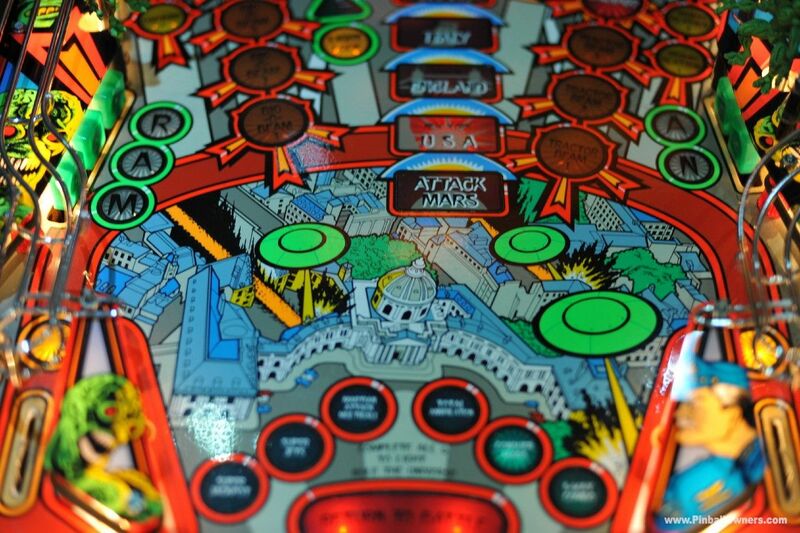 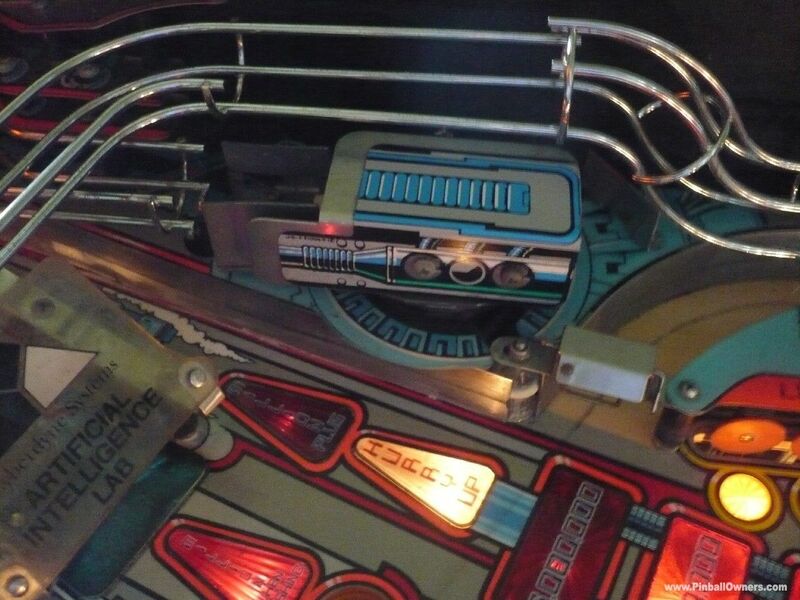 Points are accumulated on the back-glass as it rolls down the playfield. 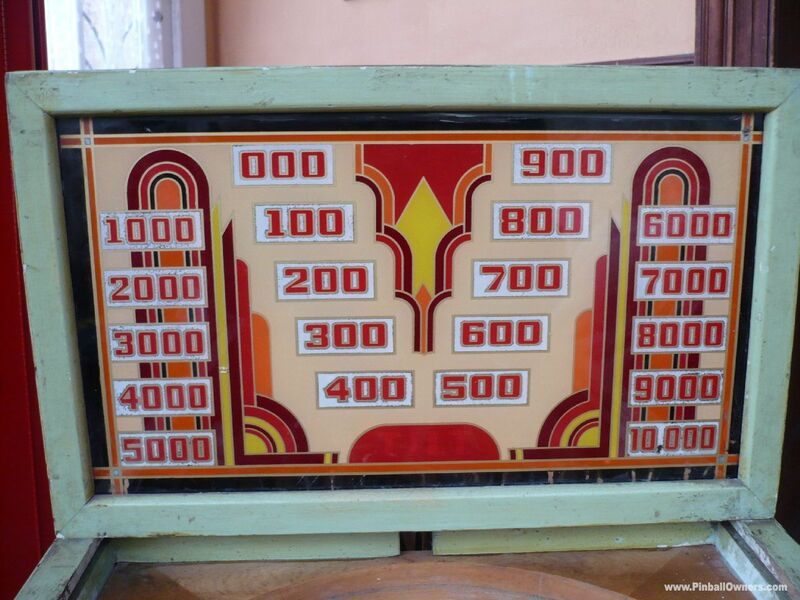 It's simplicity is it's attraction and becomes mesmerising as you play game after game. 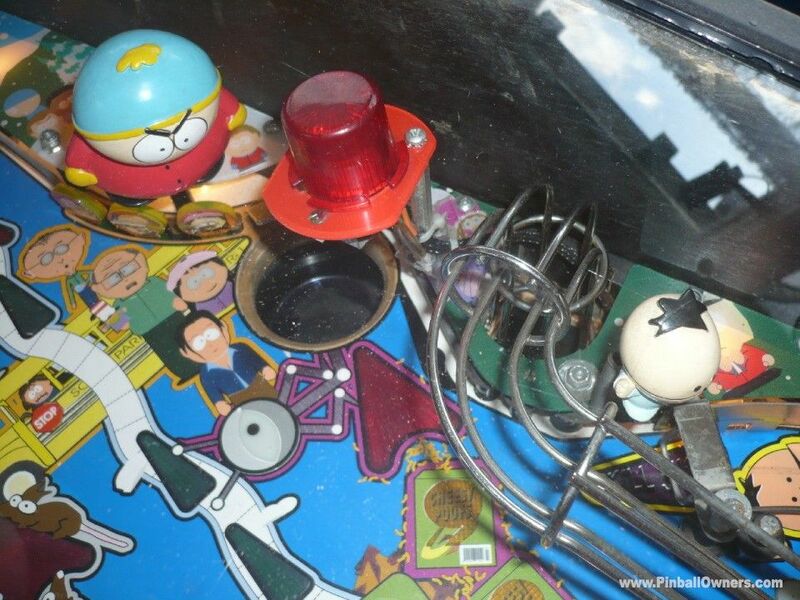 The timer shuts the power off the lights go out and its time for next player to put a coin in for the next game. 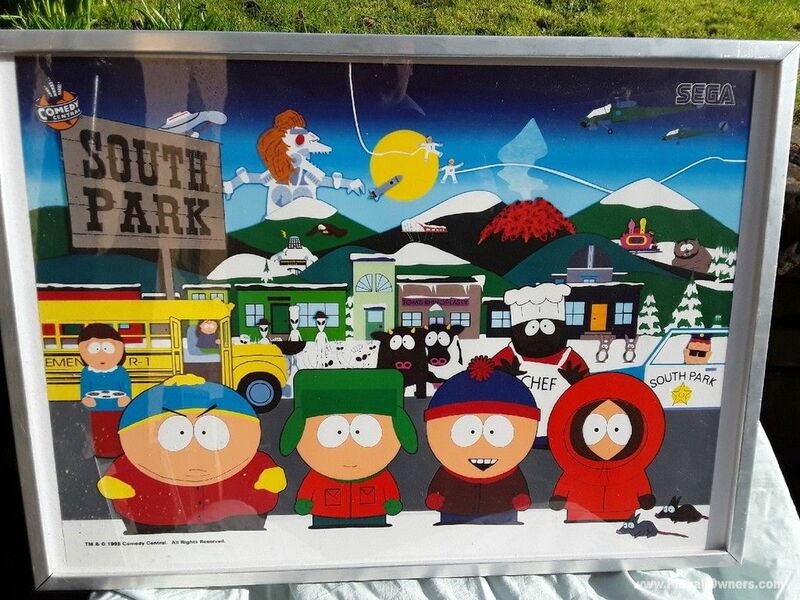 SOUTH PARK Sega (USA) Bon pour pièces Ca dépend Original new old stock South Park translight. 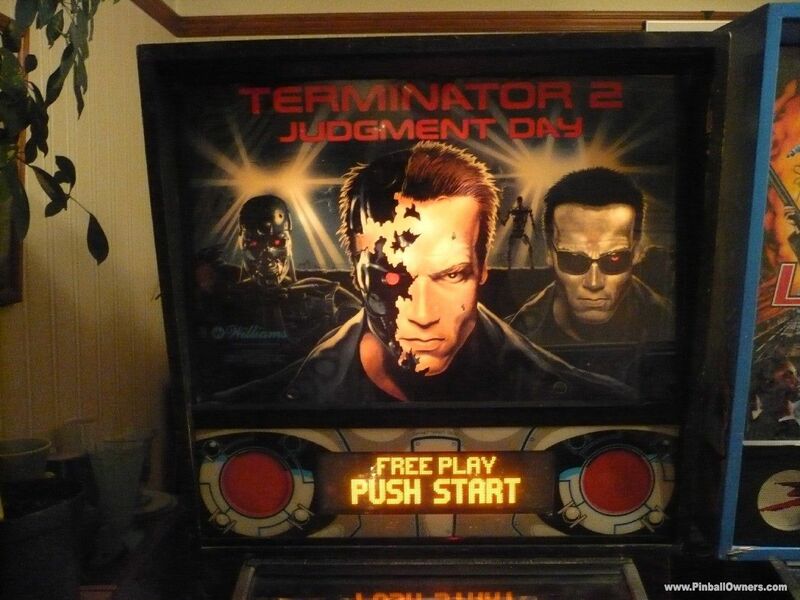 never fitted to machine. 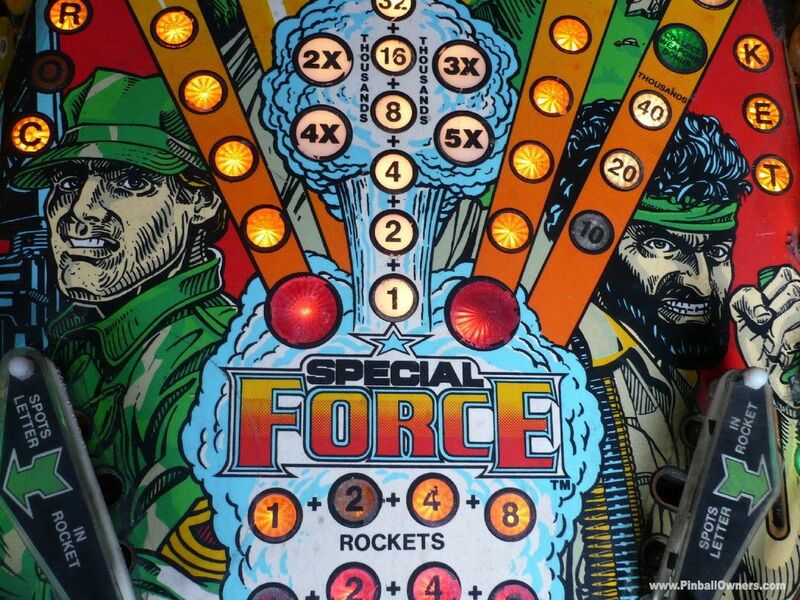 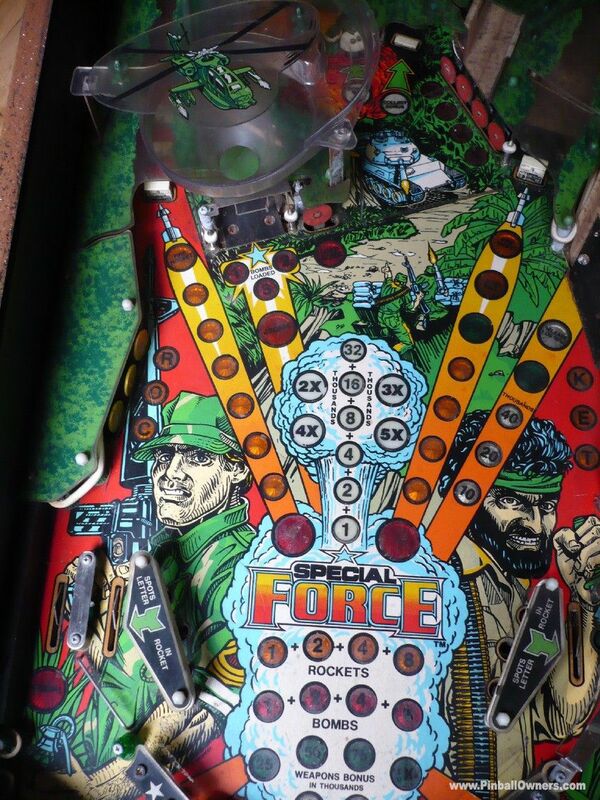 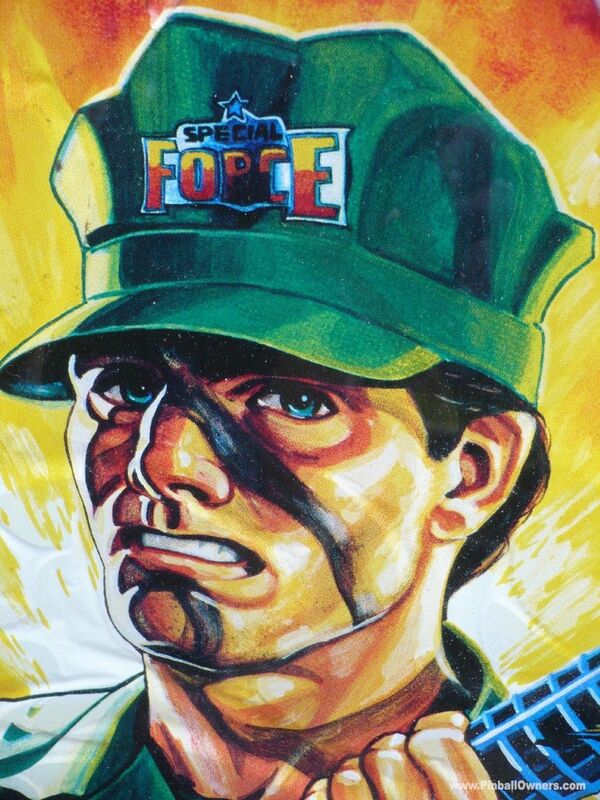 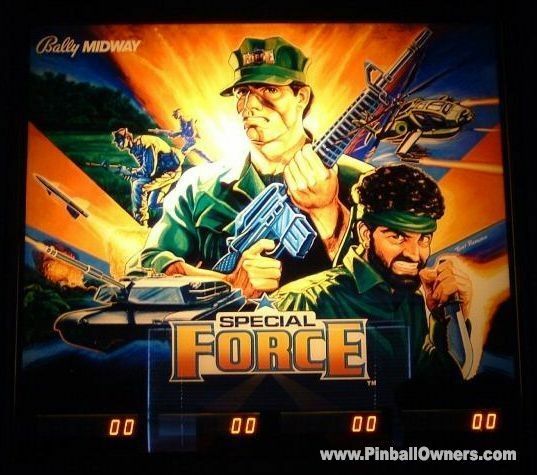 SPECIAL FORCE Bally (USA) Bon pour pièces Ca dépend 1986 (September) Some cool features, the helicopter whirlpool n extra buttons to fire missiles. 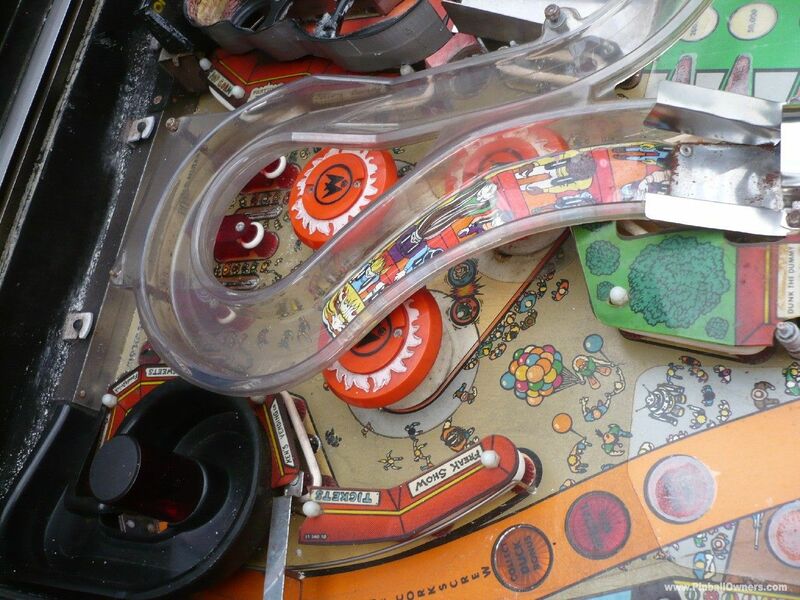 The bumpers take the form of a straw hut village. 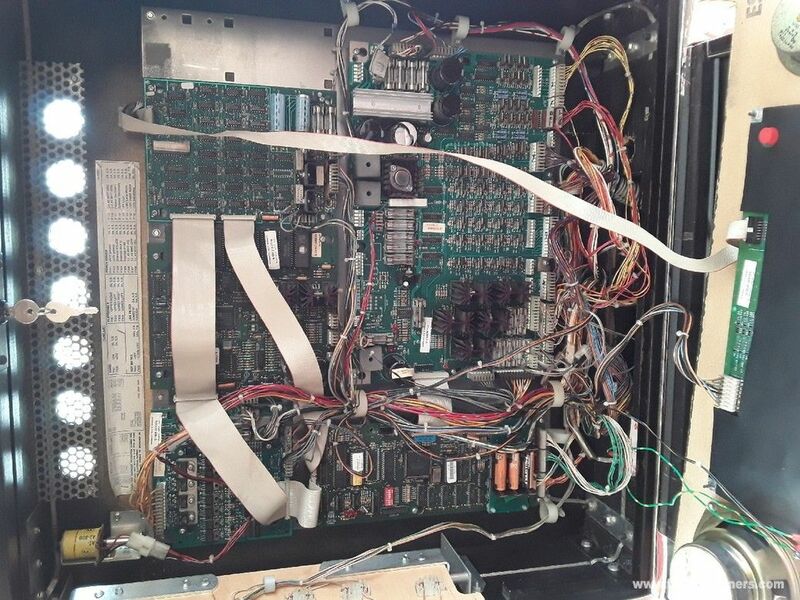 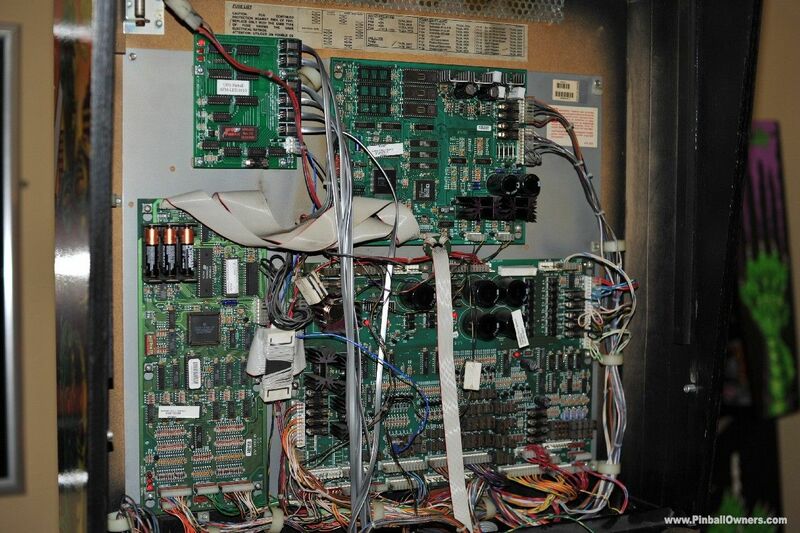 Now lapsed into a NON-working project machine includes the portal controller...and manual... �295 for complete machine. 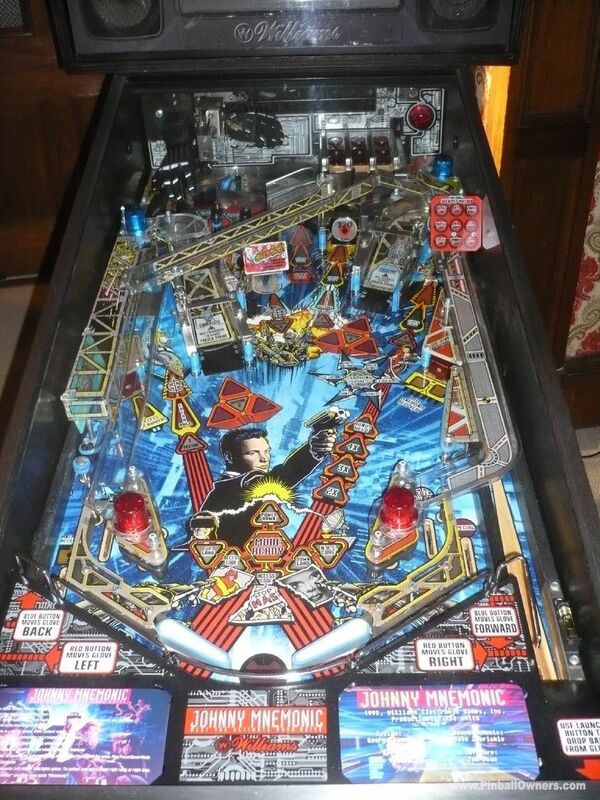 STAR WARS Data East (USA) Monté, jouable Ca dépend 1992 (December).... 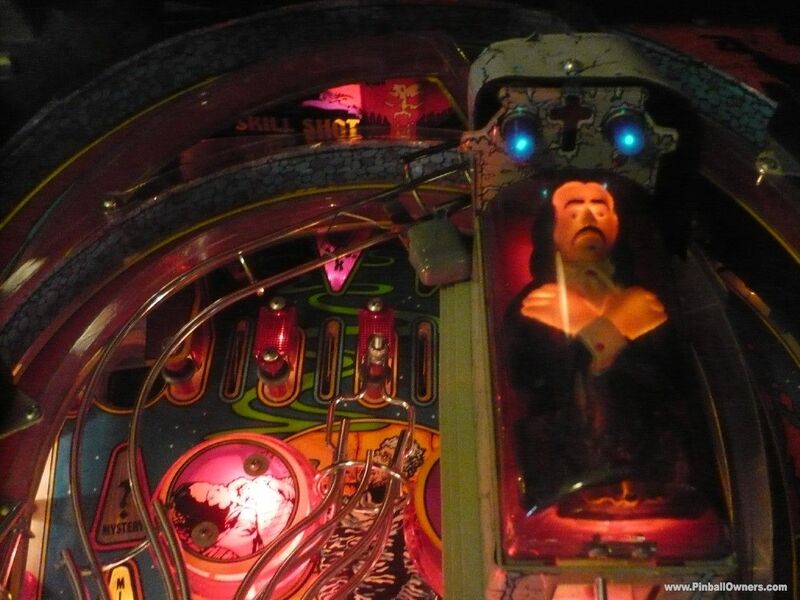 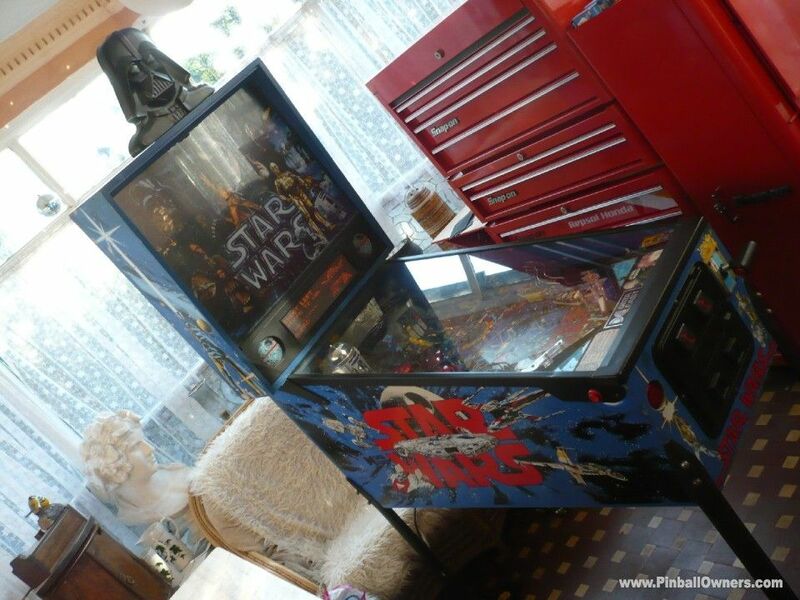 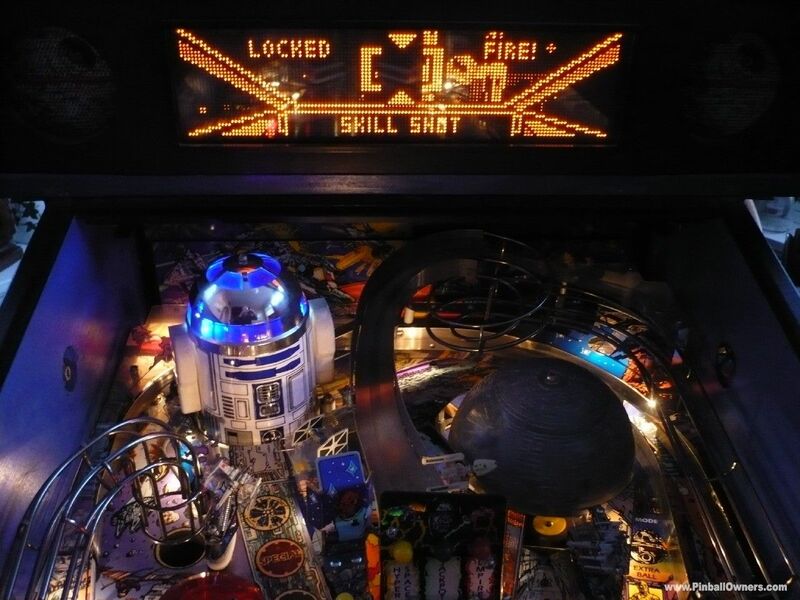 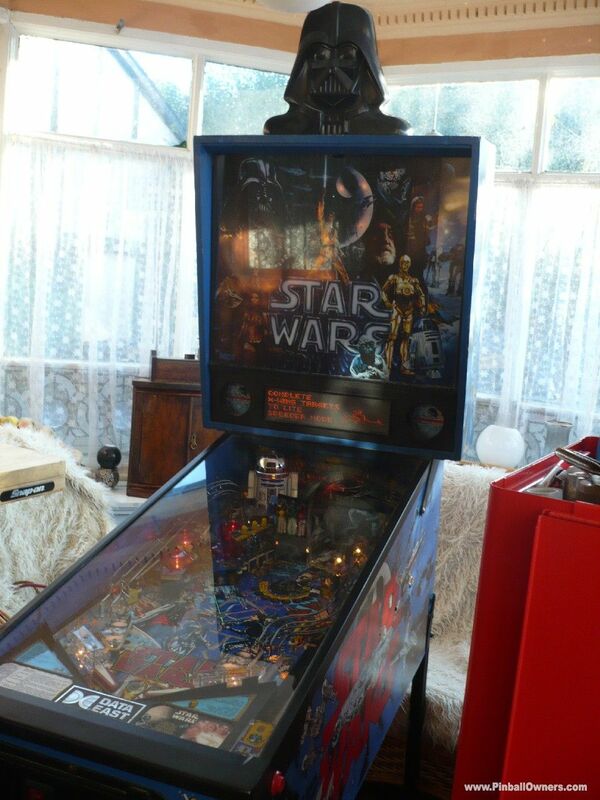 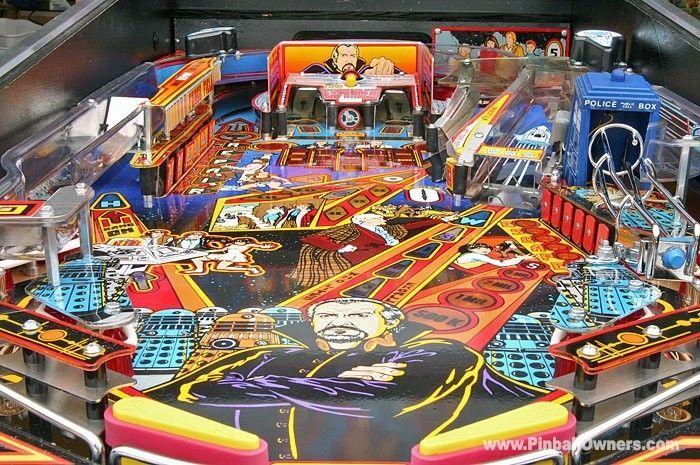 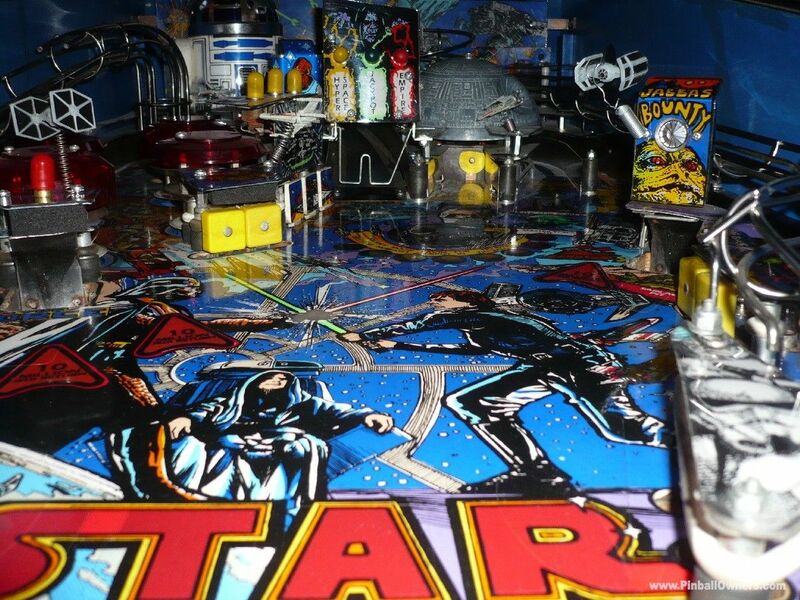 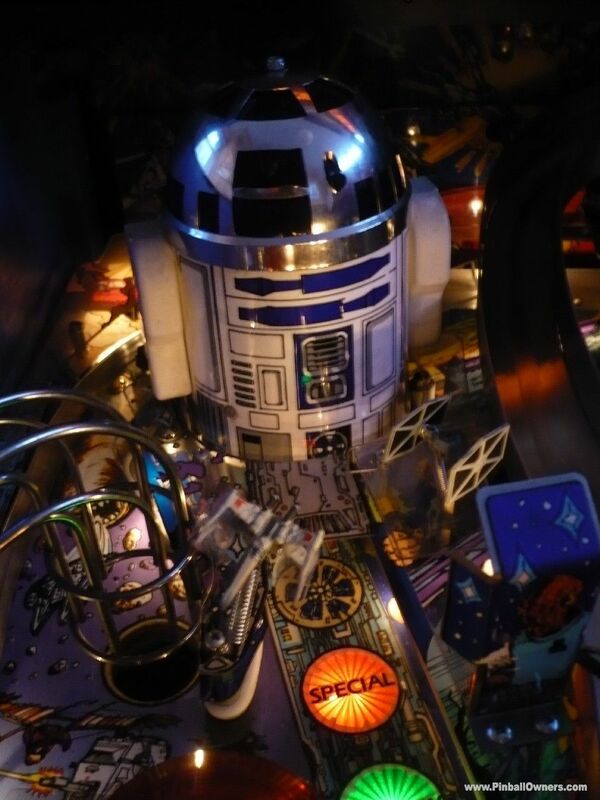 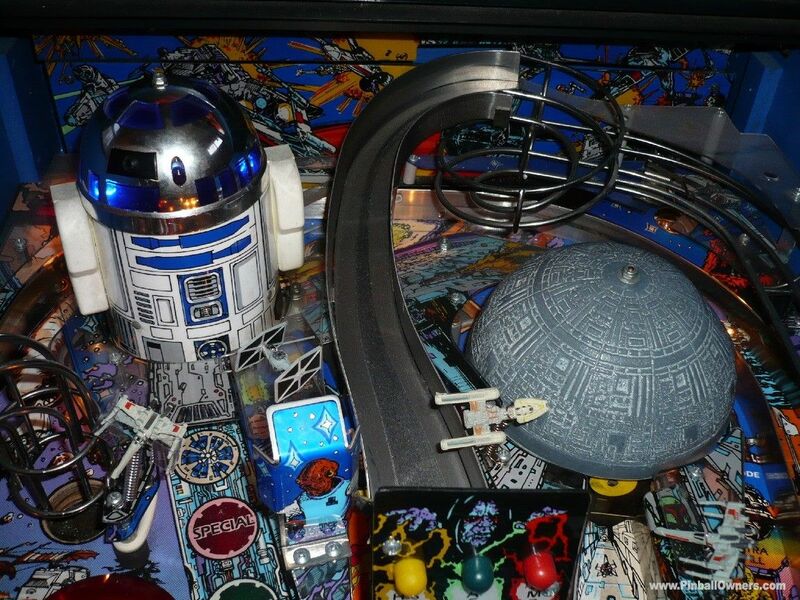 This is the classic Star Wars pinball. 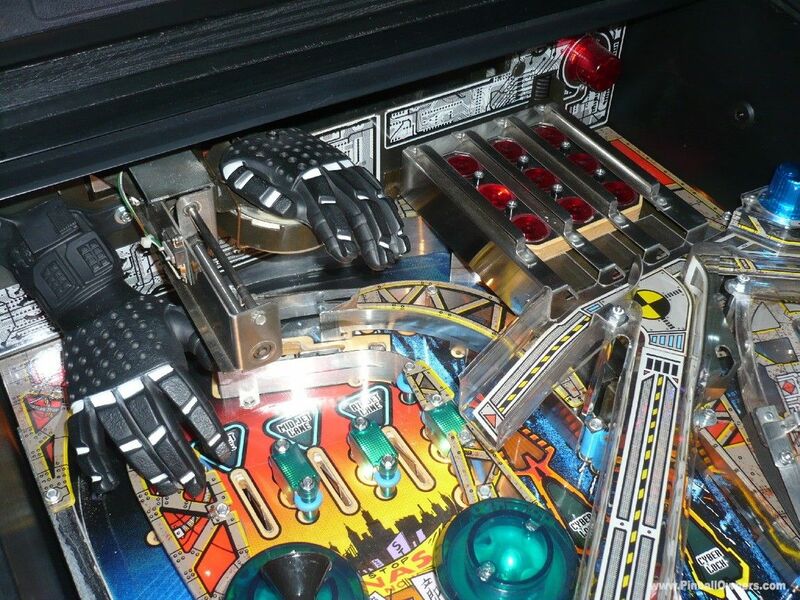 With updated custom game roms it plays fast and strong. 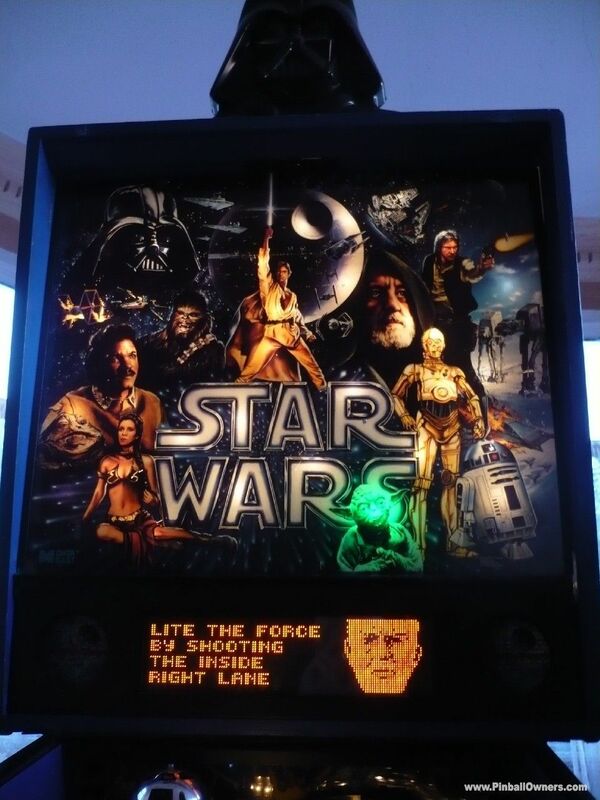 The light show and sound is solid Star Wars, all complimented by movement of the R2D2 and Death Star. 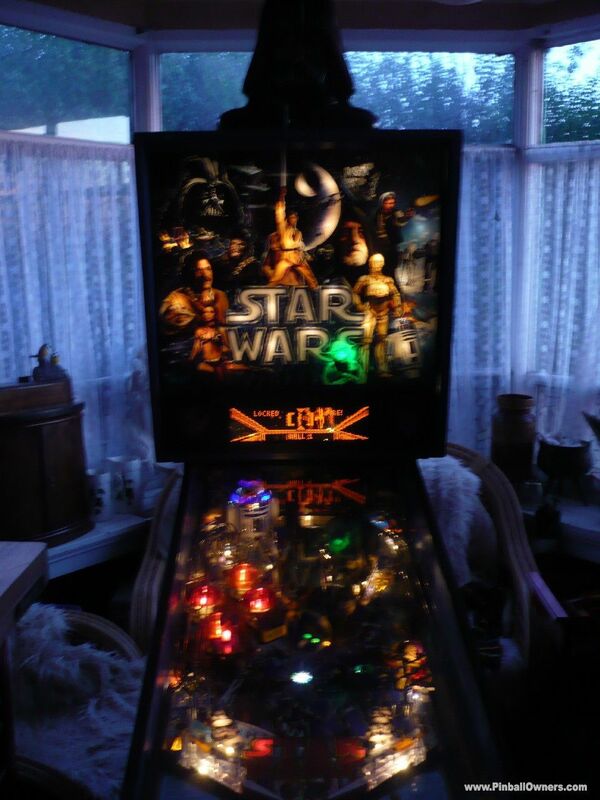 Unlike some examples this Star wars is Fully working all plastics and ramps correct. 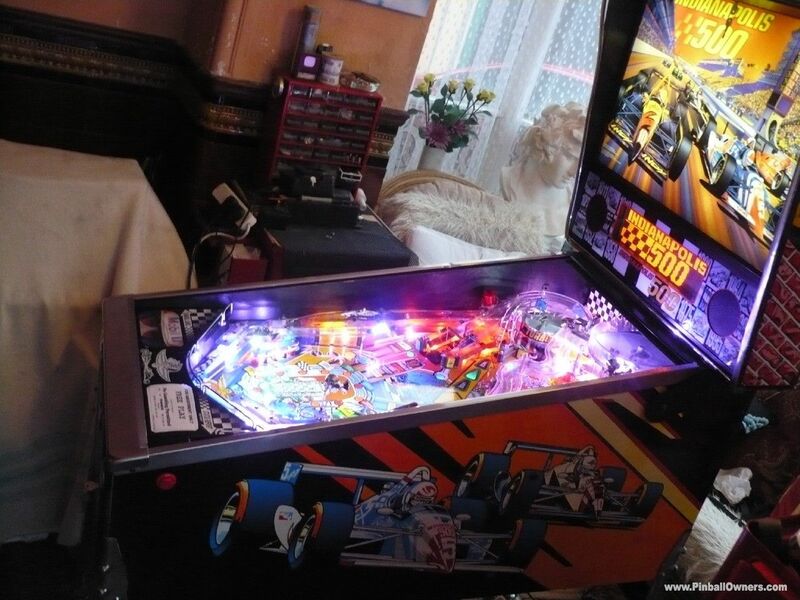 Fitted with mirror blades and a very clever multi effect animated color DMD which shows the full game animation at its best. 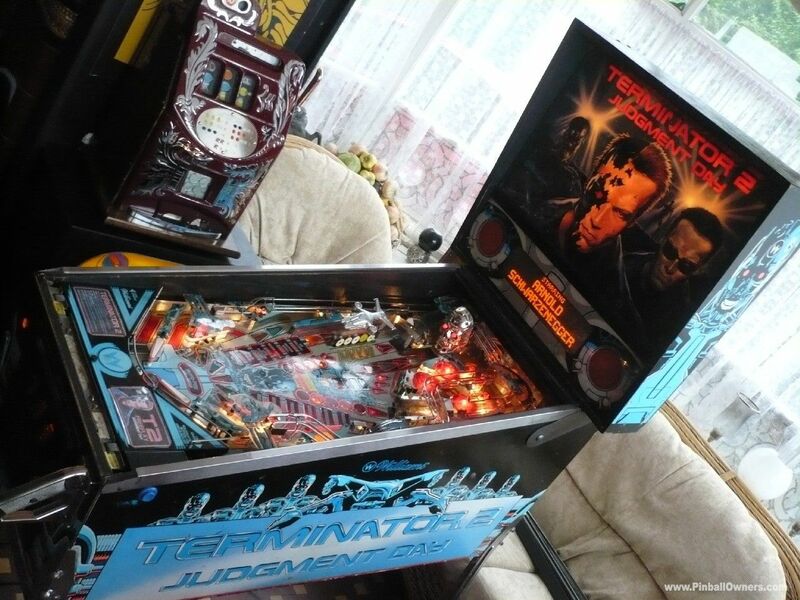 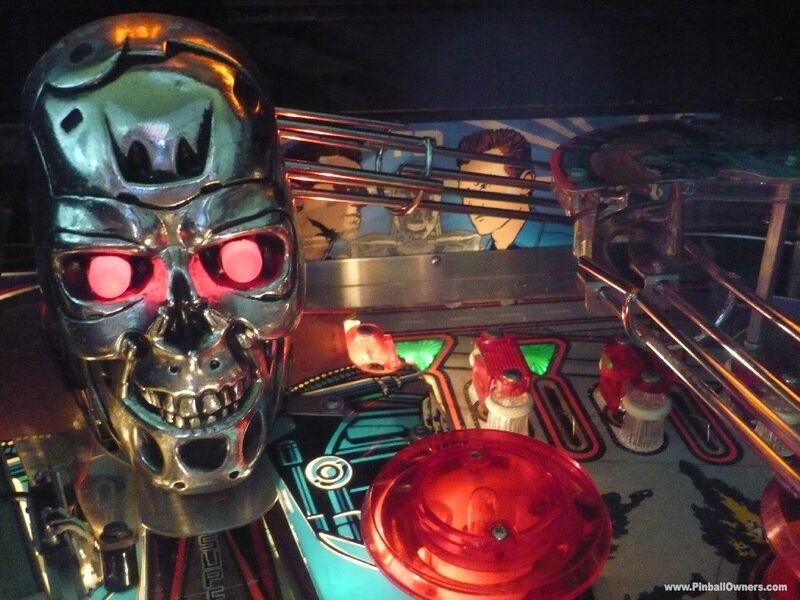 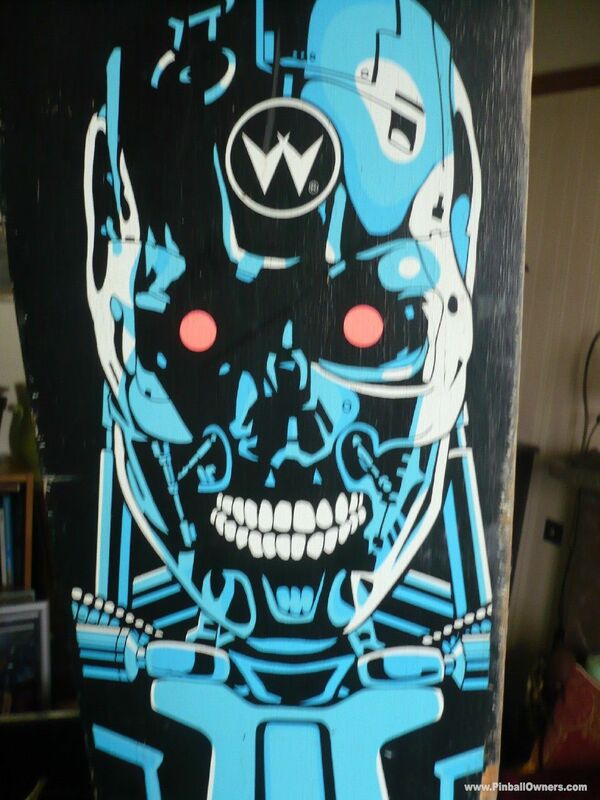 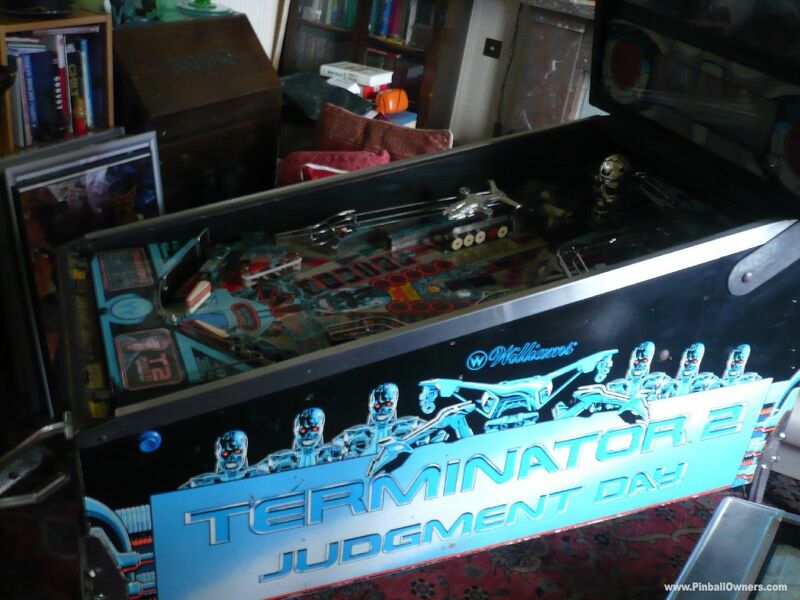 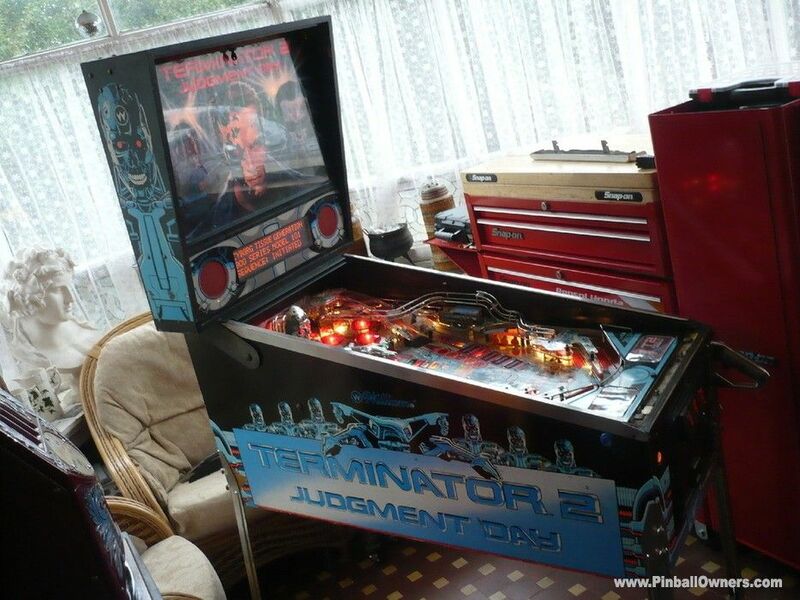 TERMINATOR 2: JUDGMENT DAY Williams (USA) Monté, jouable Jamais 1991(July) Nice machine with diamond plate play-field and un-faded cabinet decals. 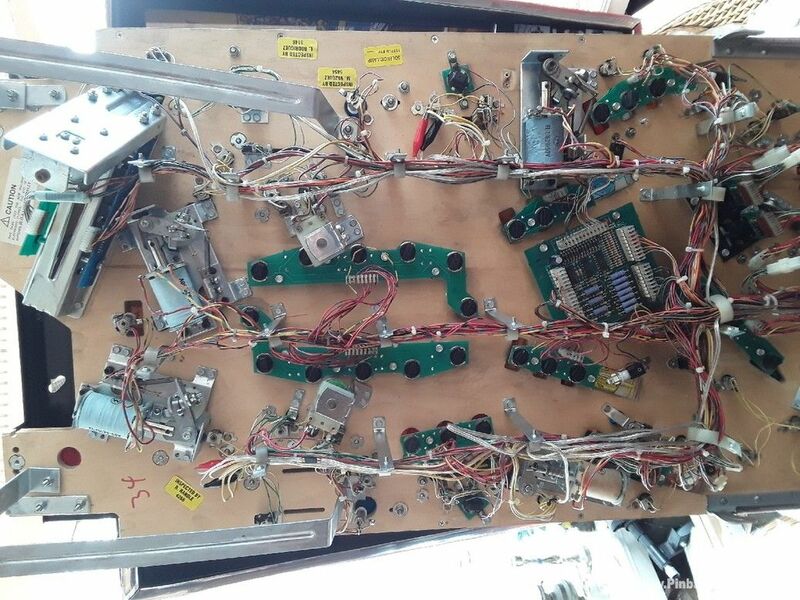 Fully working. 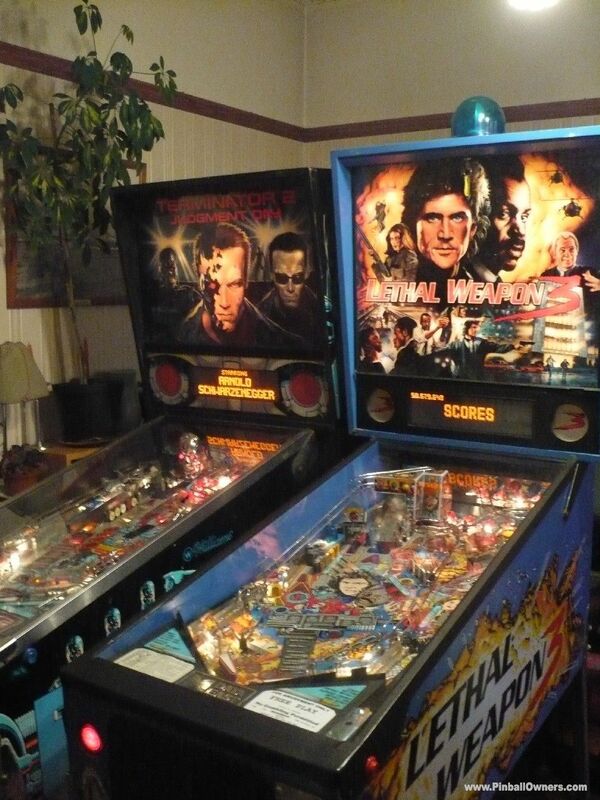 Great unfettled pin the way I like them. 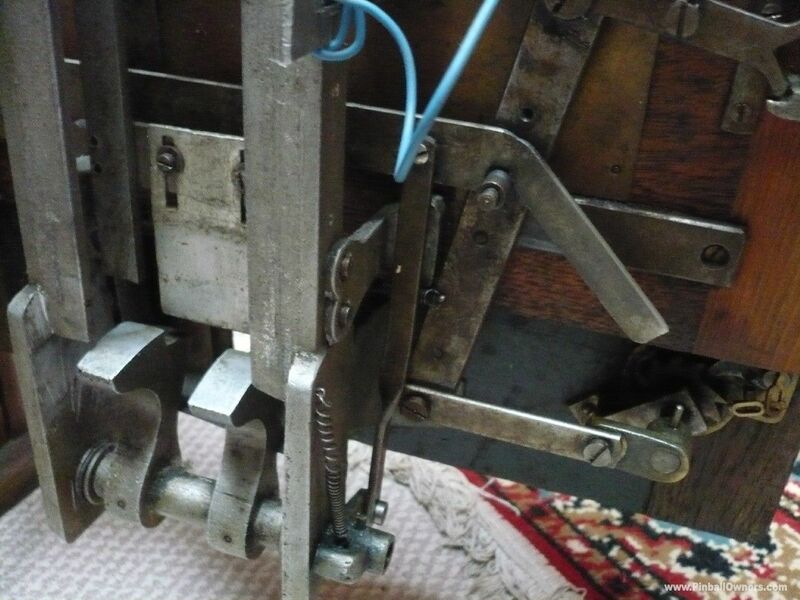 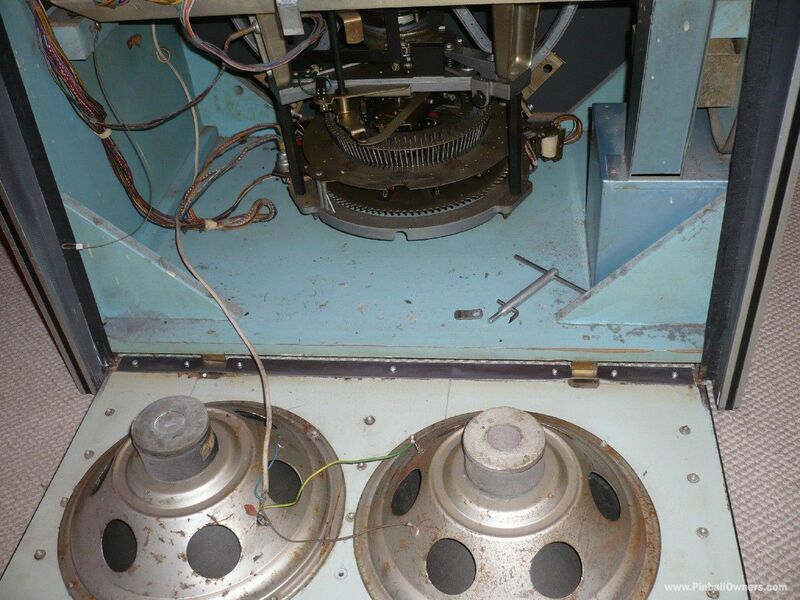 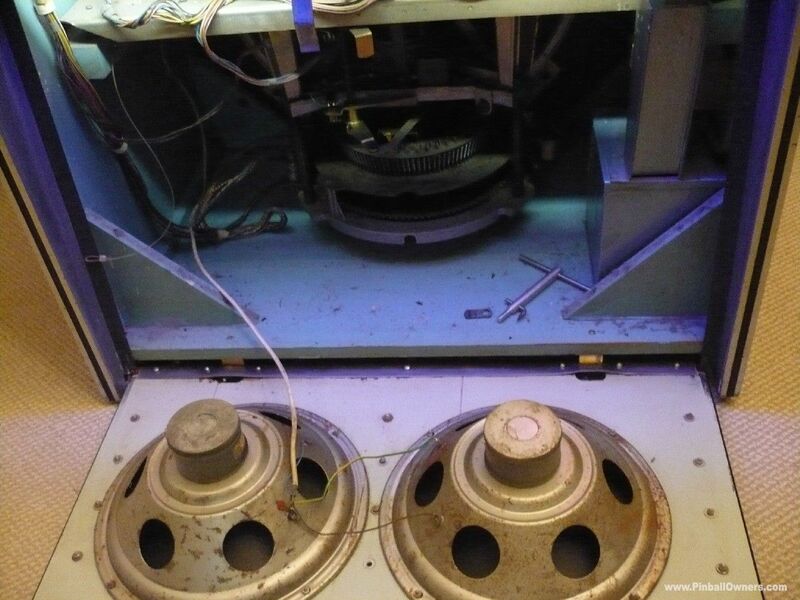 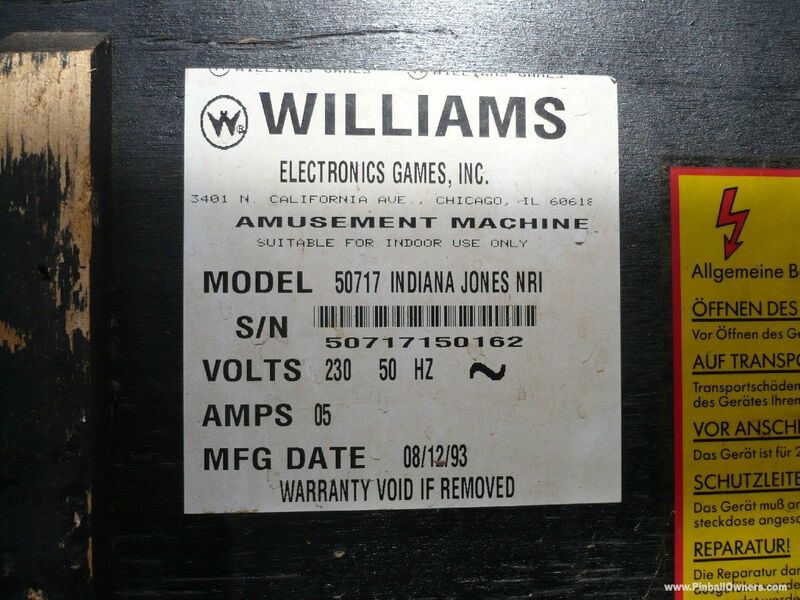 THE MACHINE Williams (USA) Monté, jouable Jamais 1991 (April) Found neglected with not a flicker of life, abandoned after terminal in-service electrical faults, it had been stored in a spare room and forgotten about........ UNTILL NOW!!! 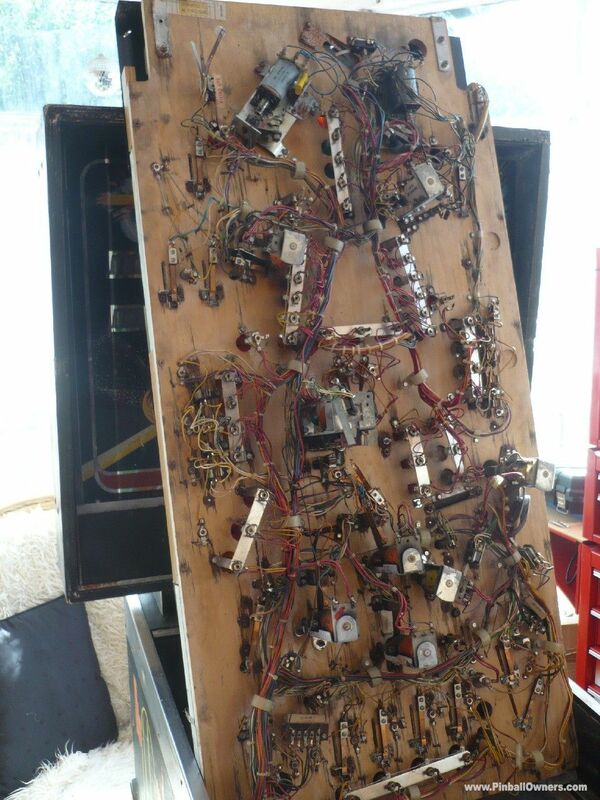 After many hours of invasive CPR ., , , , , ..MY GOD, , , , , . 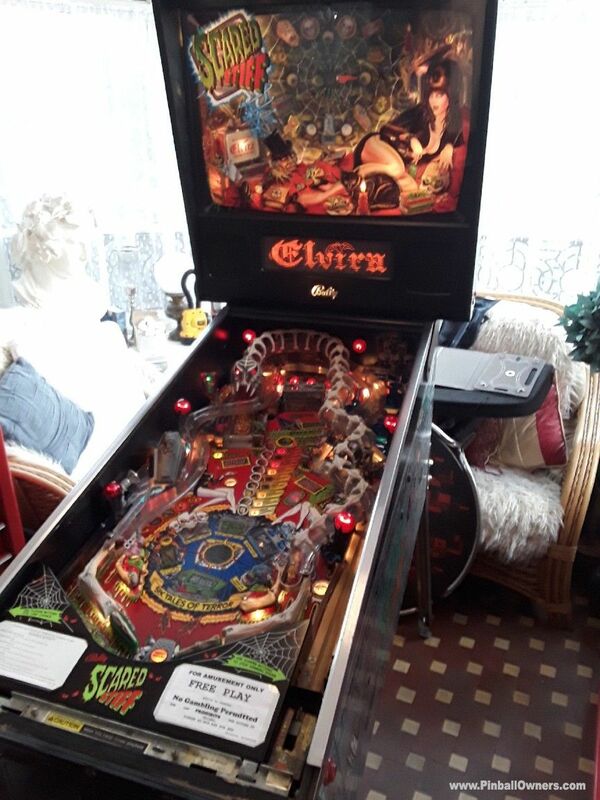 SHE's ALIVE !!!!! 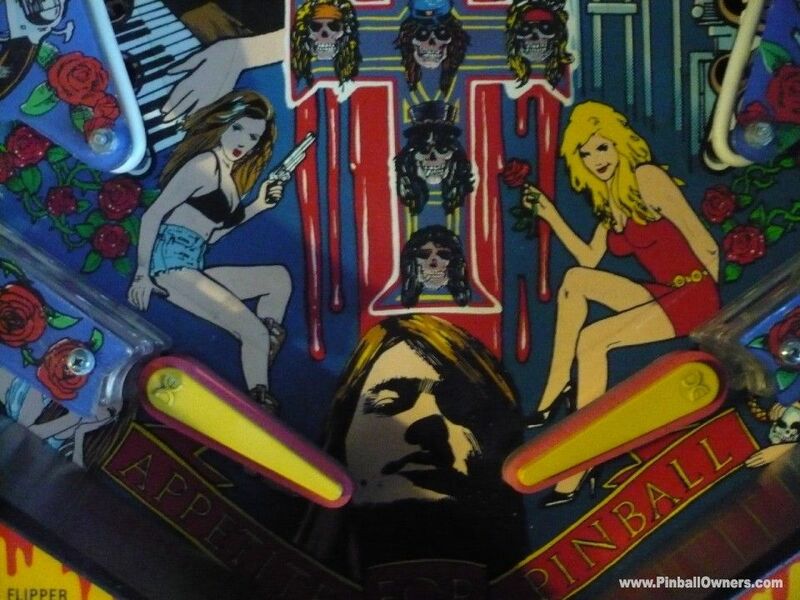 , Heart beats strong, Sings and plays as a pin should...... Nice. 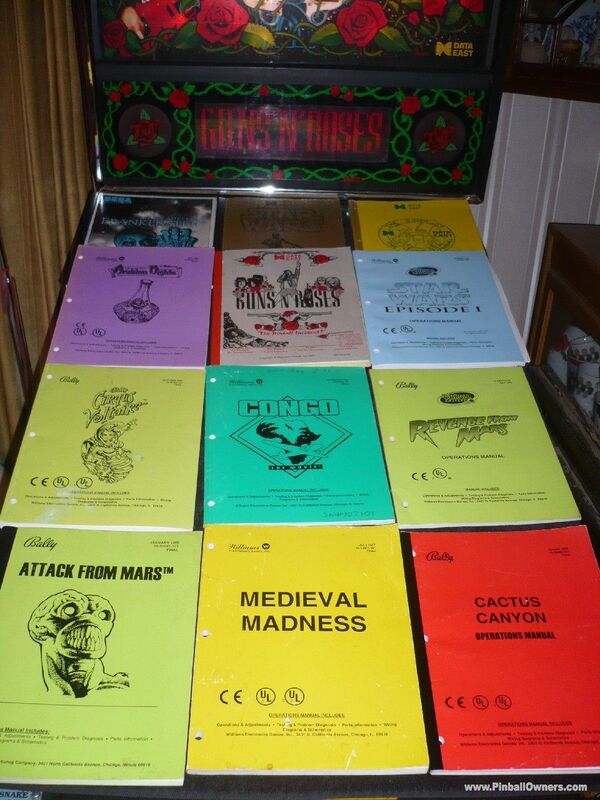 Music and sound effects which are the best. 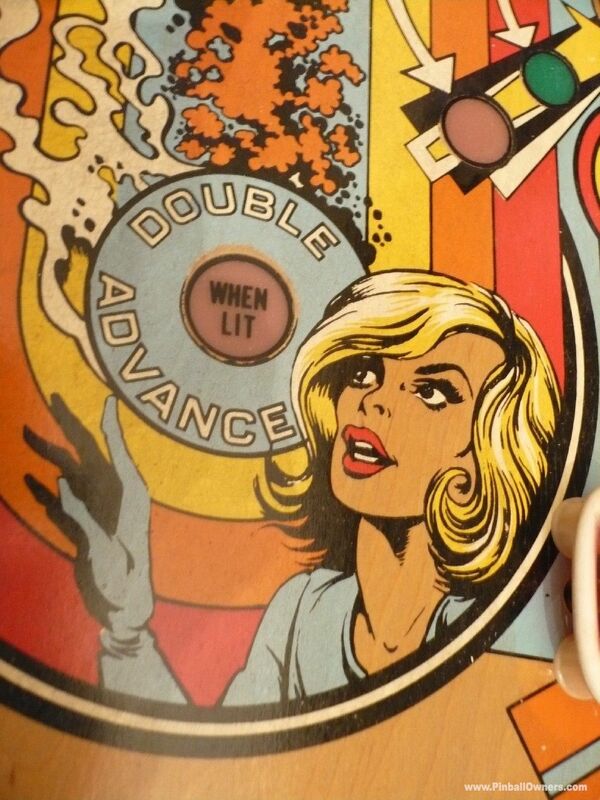 All play features are Awesome. 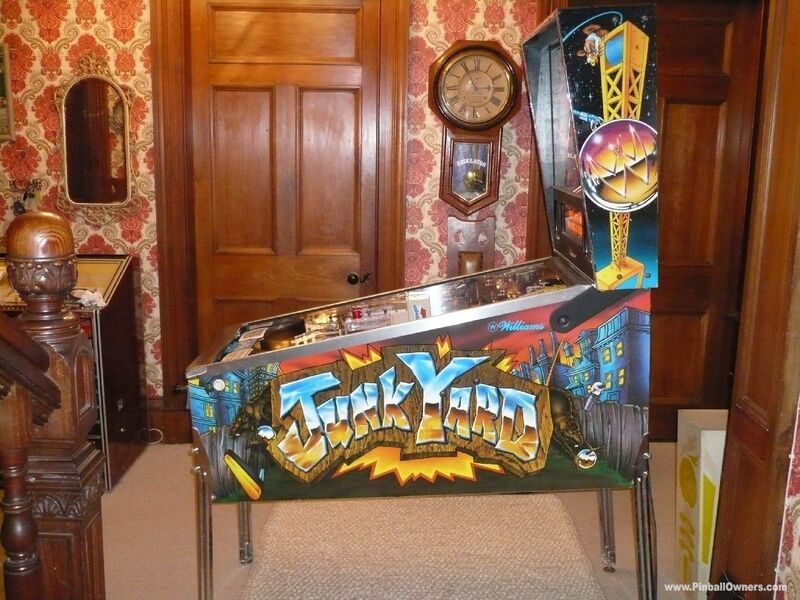 One of Trudeaus many classic innovations. 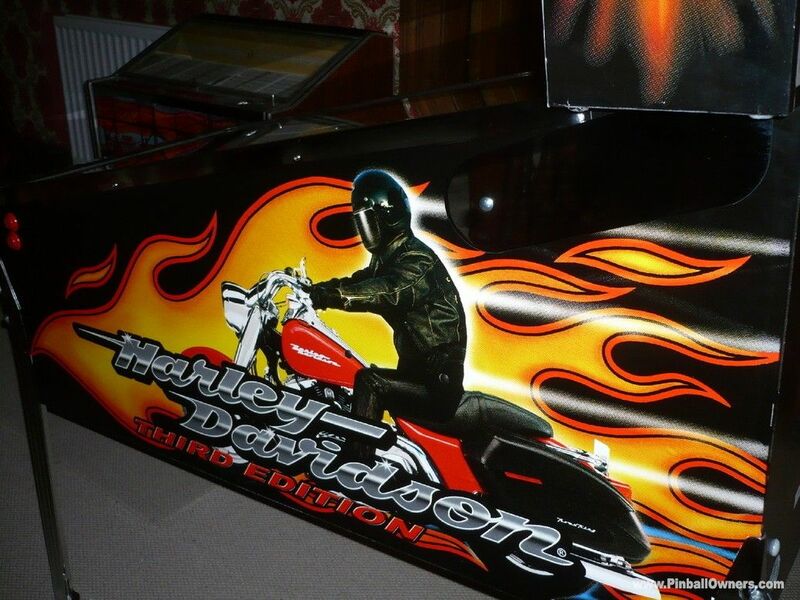 New ramps, displays and bride helmet fitted. 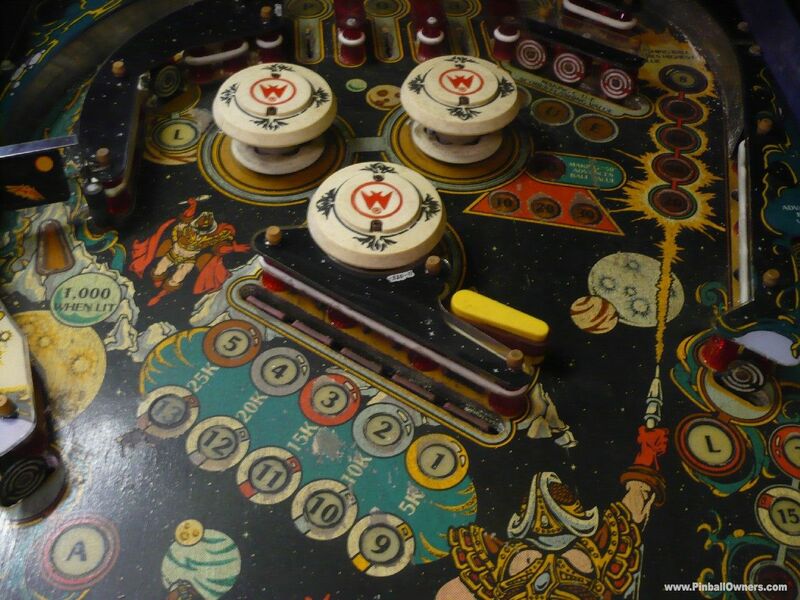 Original play field has ball swirls. 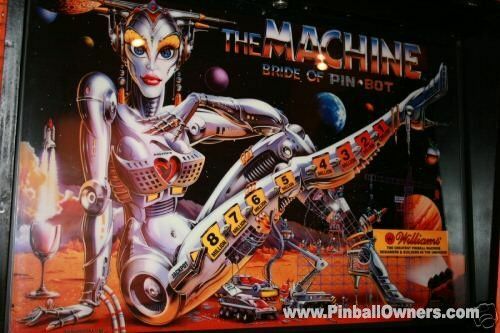 THE MACHINE: BRIDE OF PIN*BOT Williams (USA) Monté, jouable Jamais 1991 Good condition, Great sound n the feature fully integrated revolving head is awesome if not a little spooky. 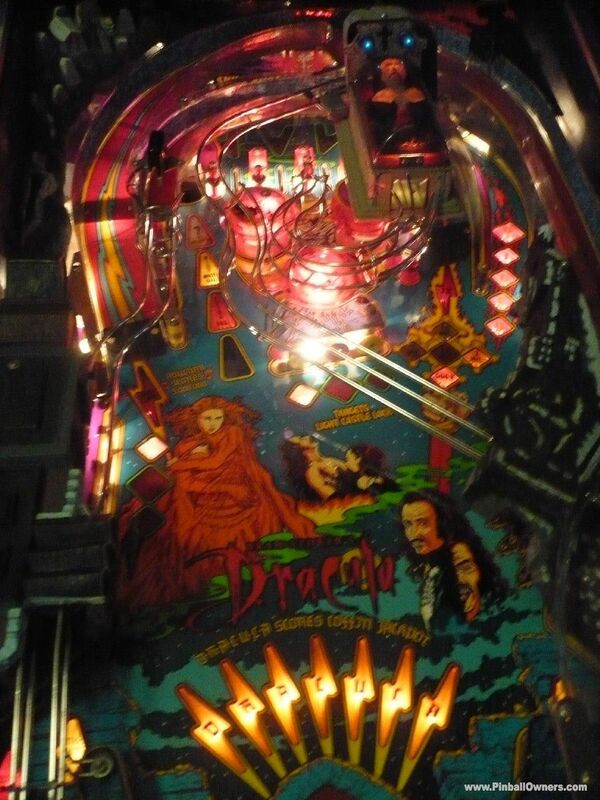 One of my top ten for fun. 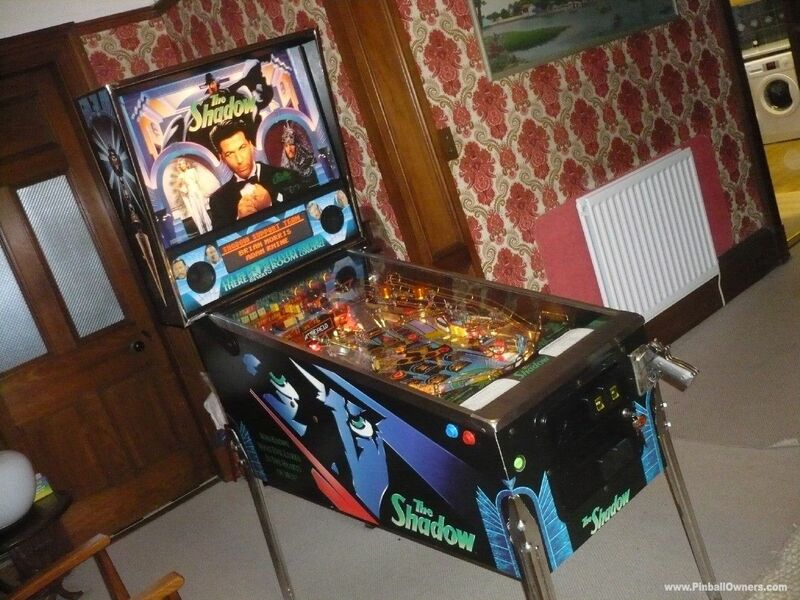 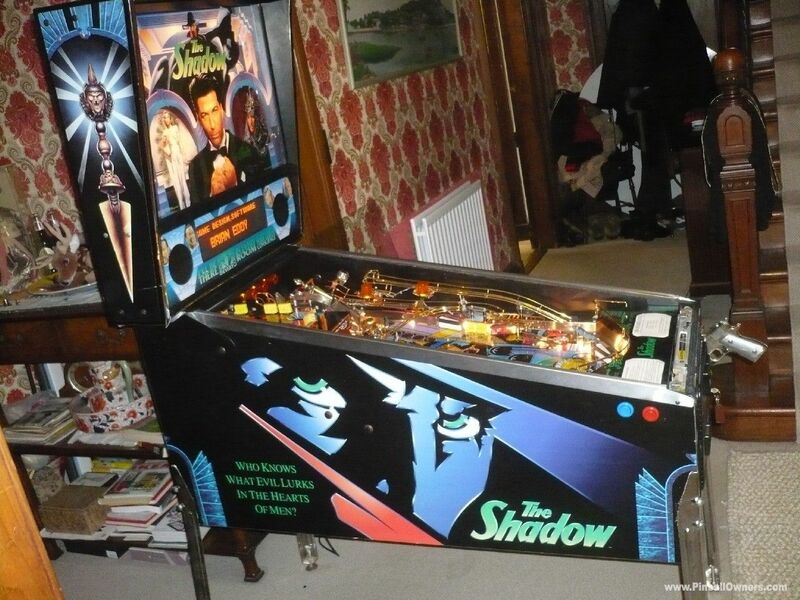 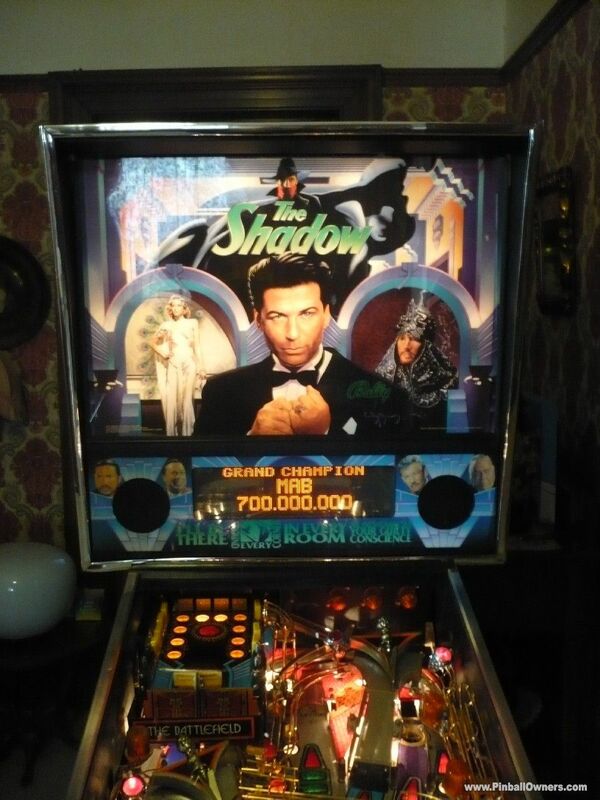 THE SHADOW Bally (USA) Monté, jouable Ca dépend 1994 (November) Great in all respects. 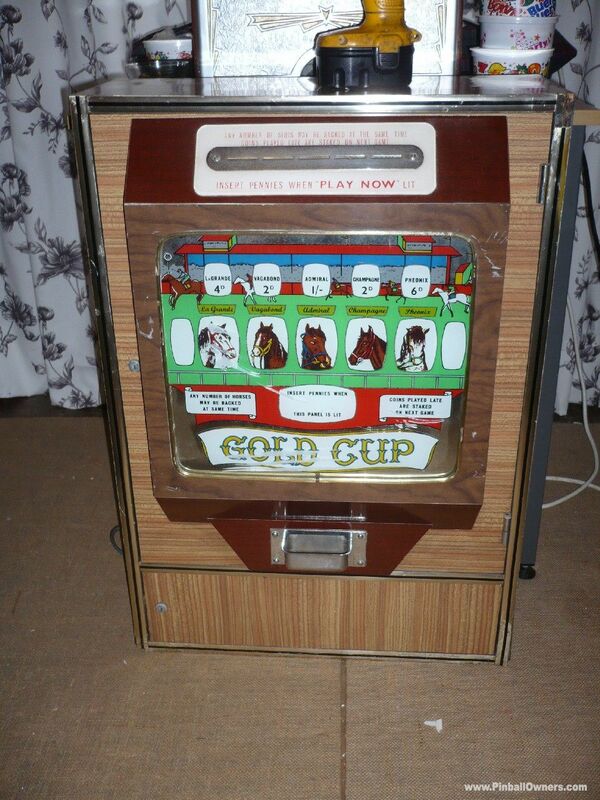 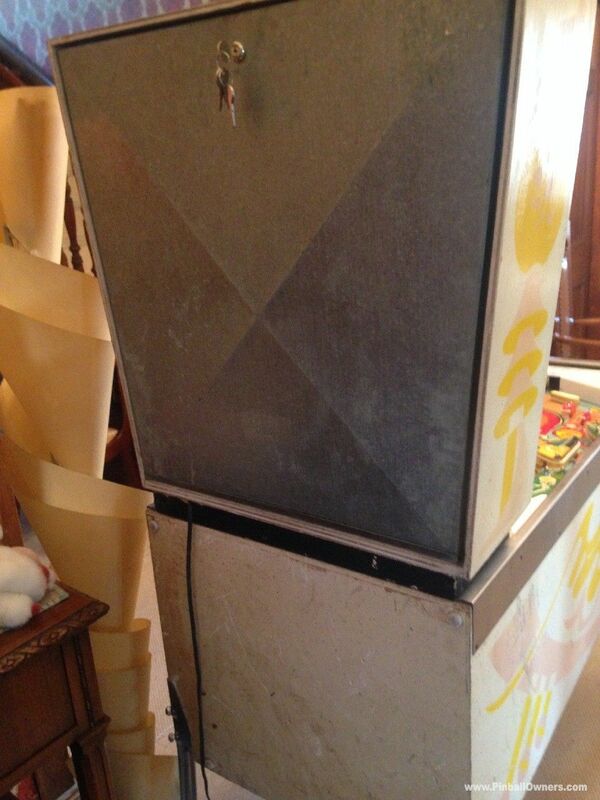 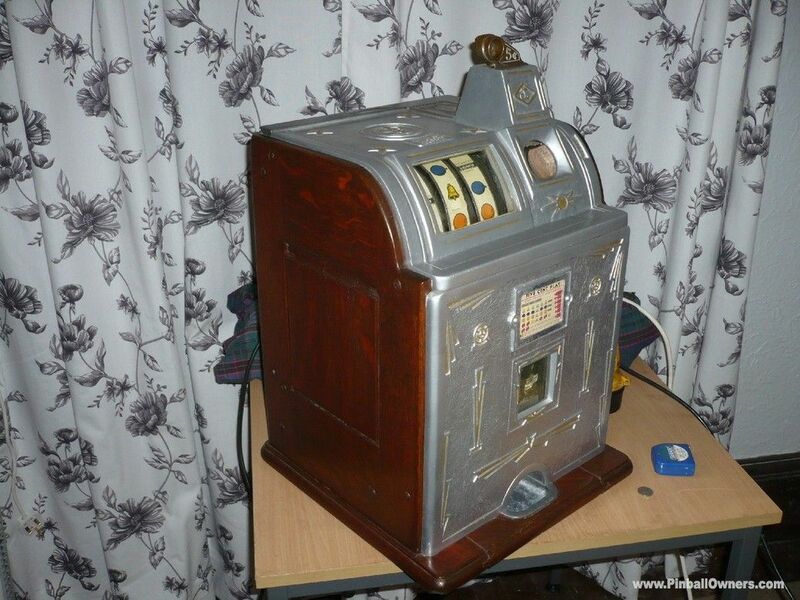 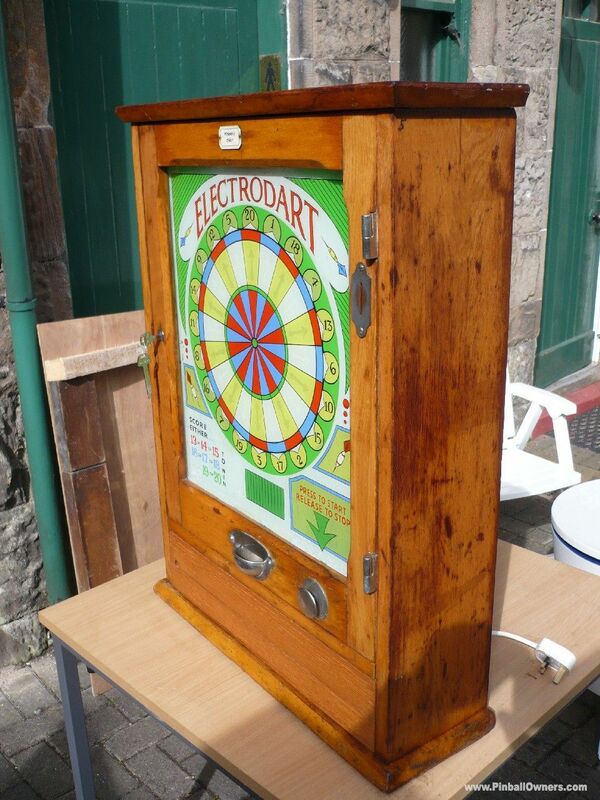 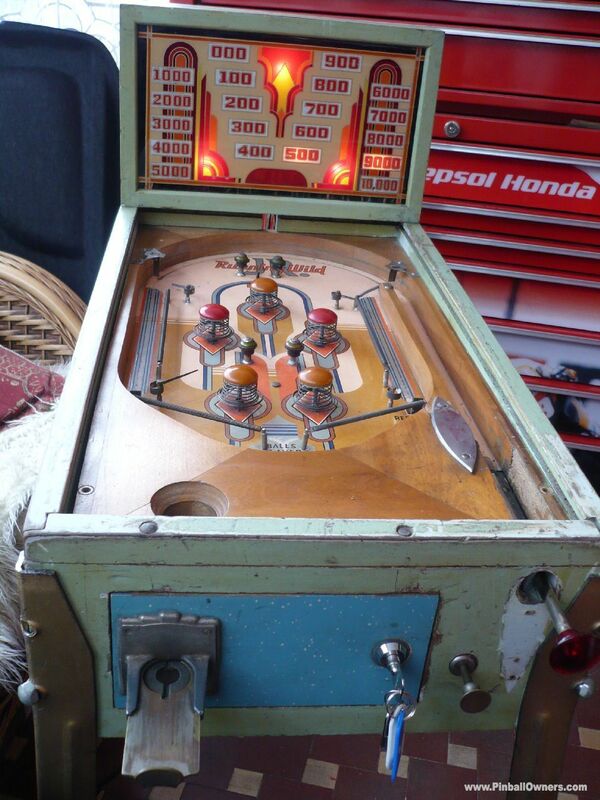 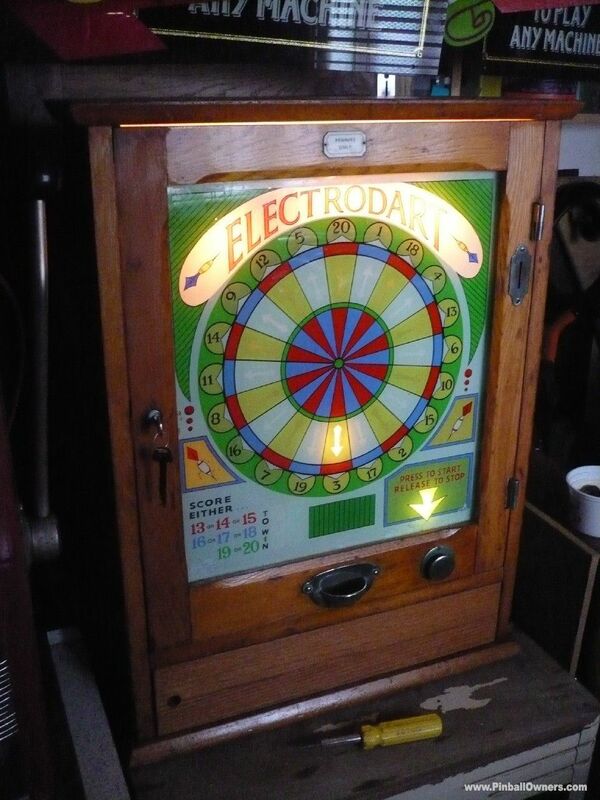 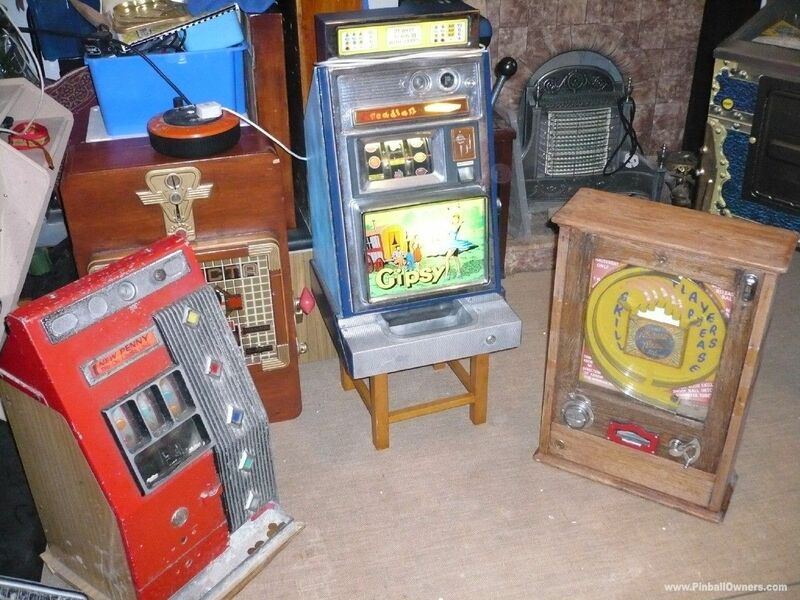 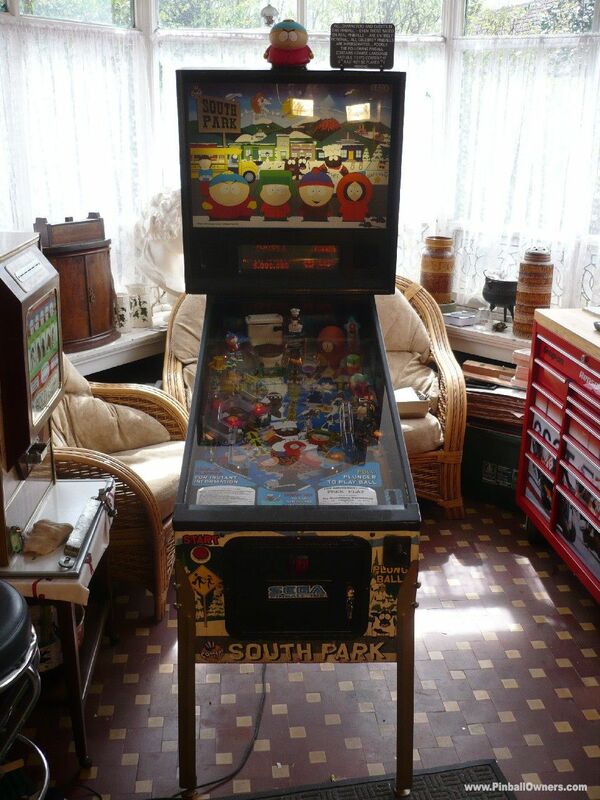 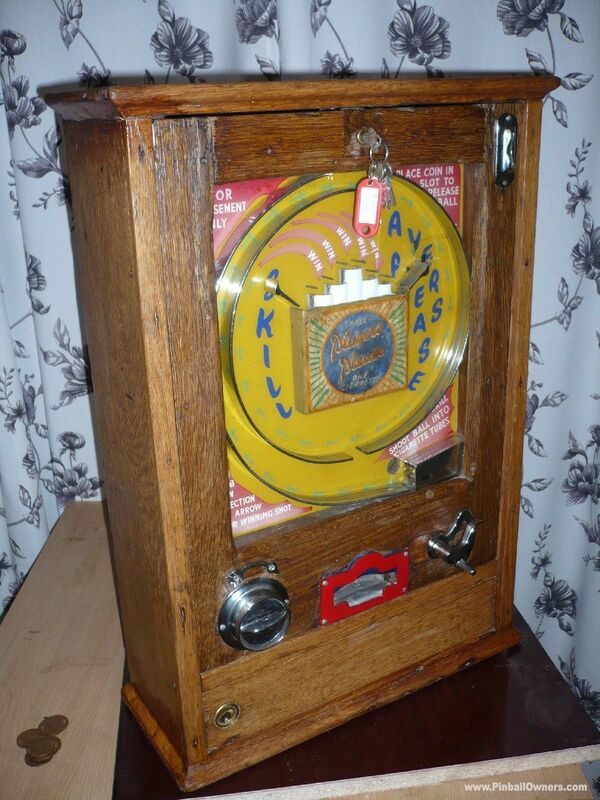 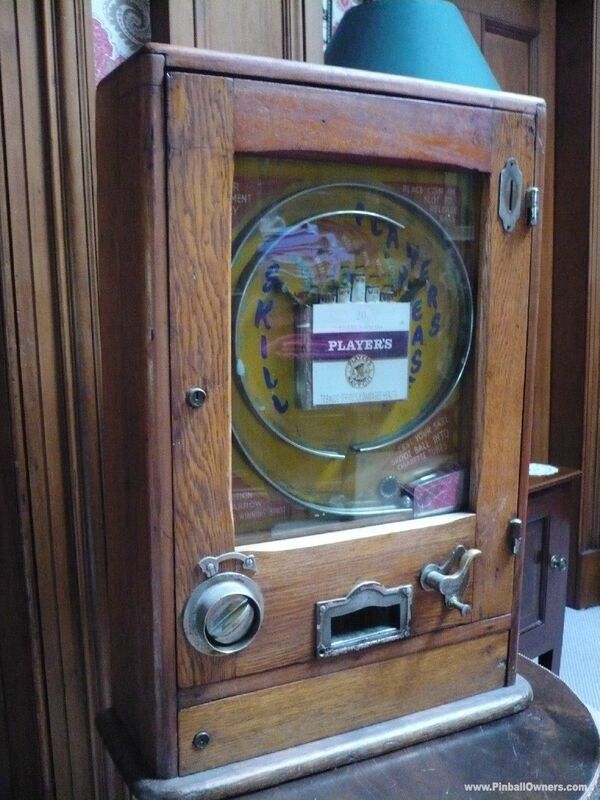 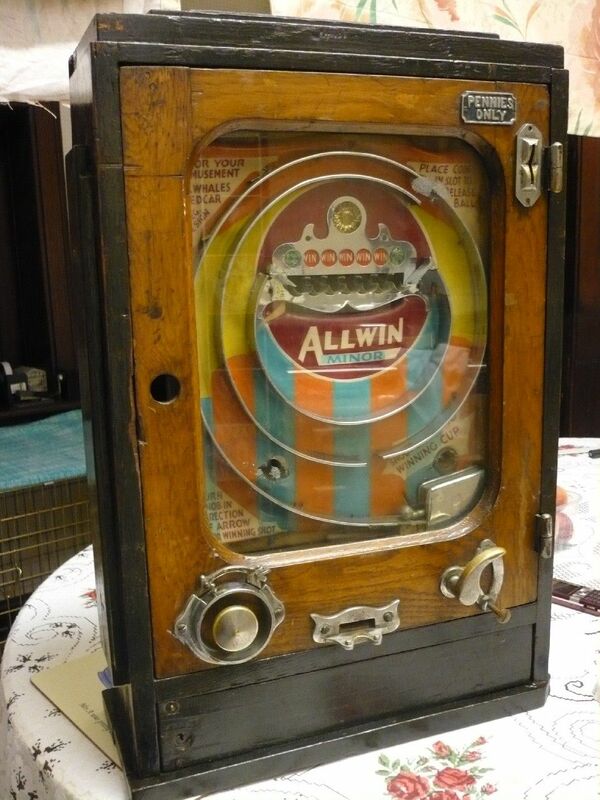 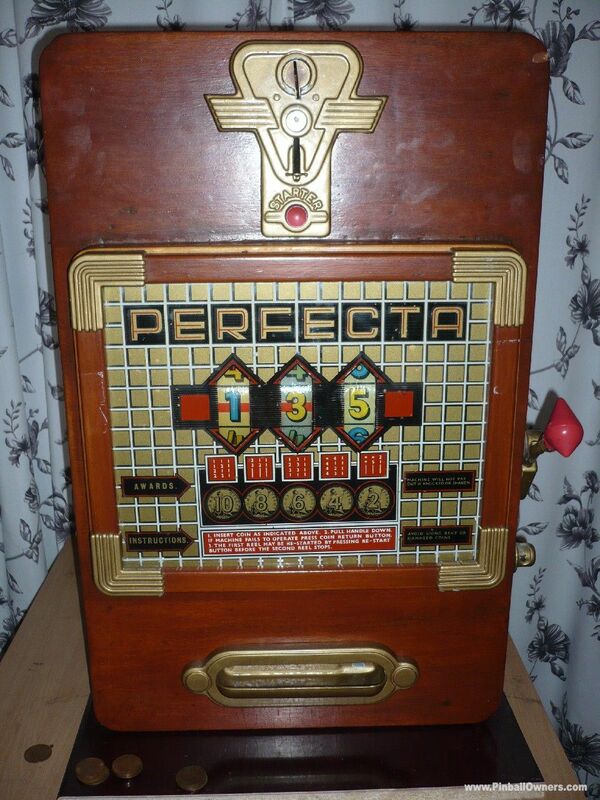 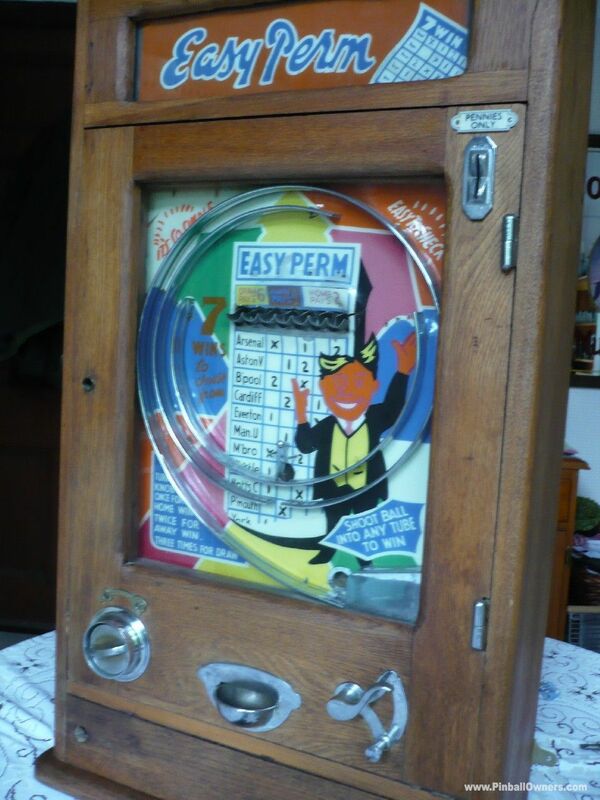 Original unfettled play-field and crisp cabinet. 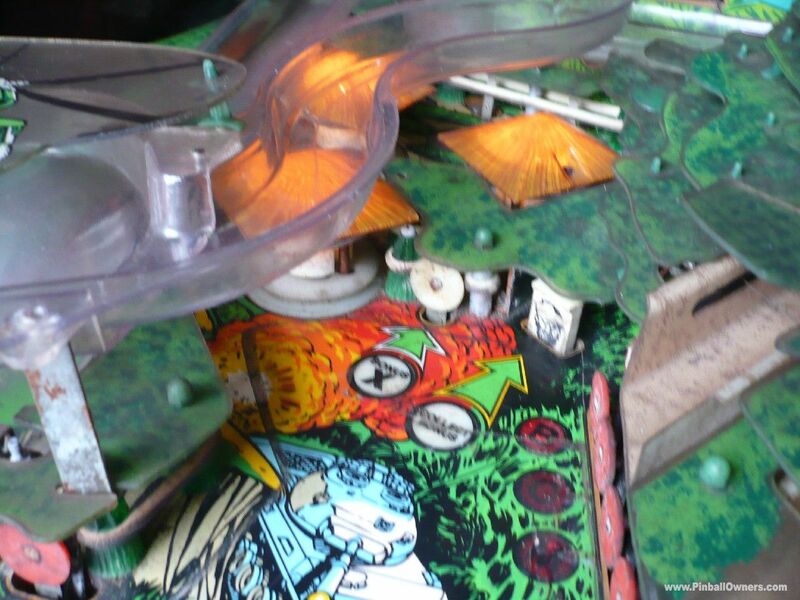 Game-play is unique and complex, fast and unforgiving. 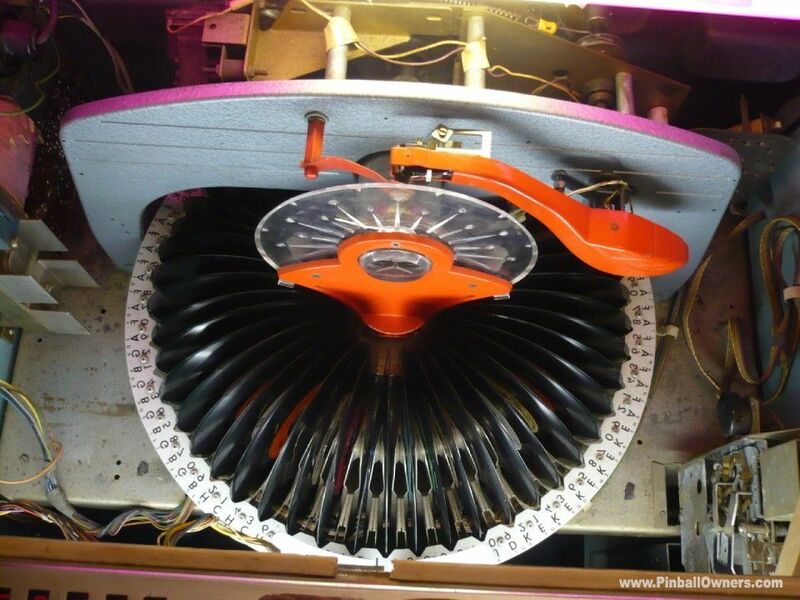 Amongst the best for sound, n light with a very busy dot matrix display. 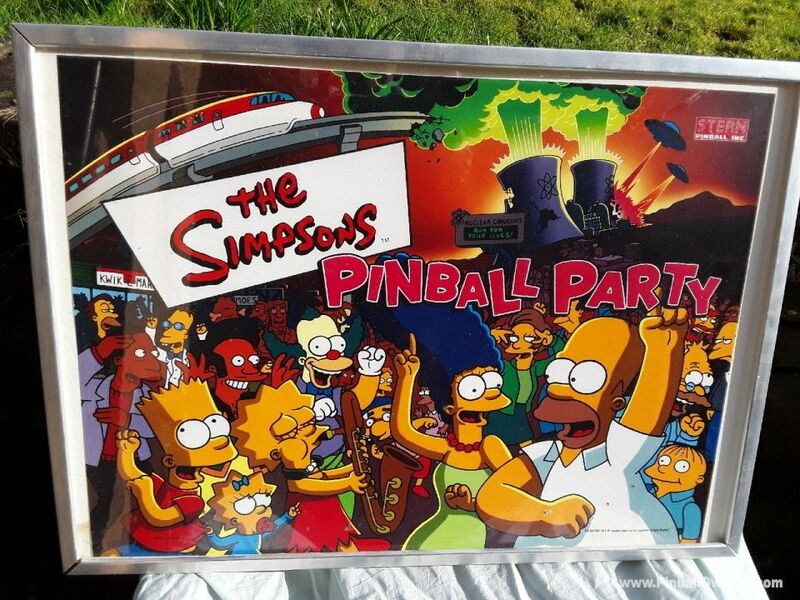 THE SIMPSONS PINBALL PARTY Stern (USA) Bon pour pièces Ca dépend Original new old stock backbox translight. 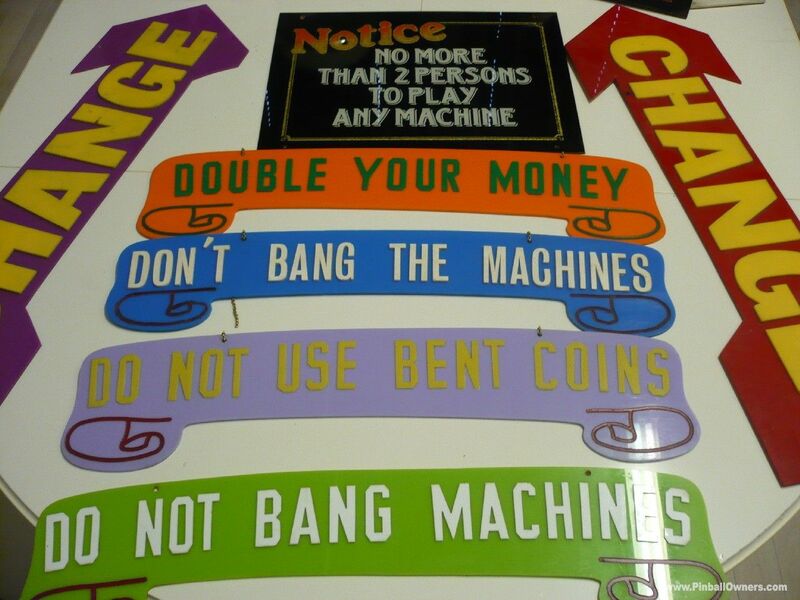 never fitted to machine. 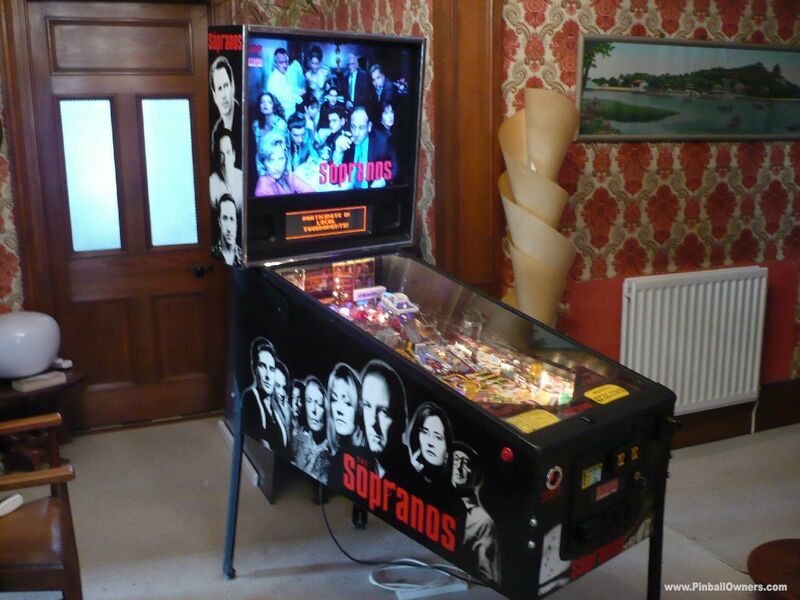 THE SOPRANOS Stern (USA) Monté, jouable Jamais 2005 (28th.April) Great in all respects, unmarked original pin with nice super fast glossy play-field. 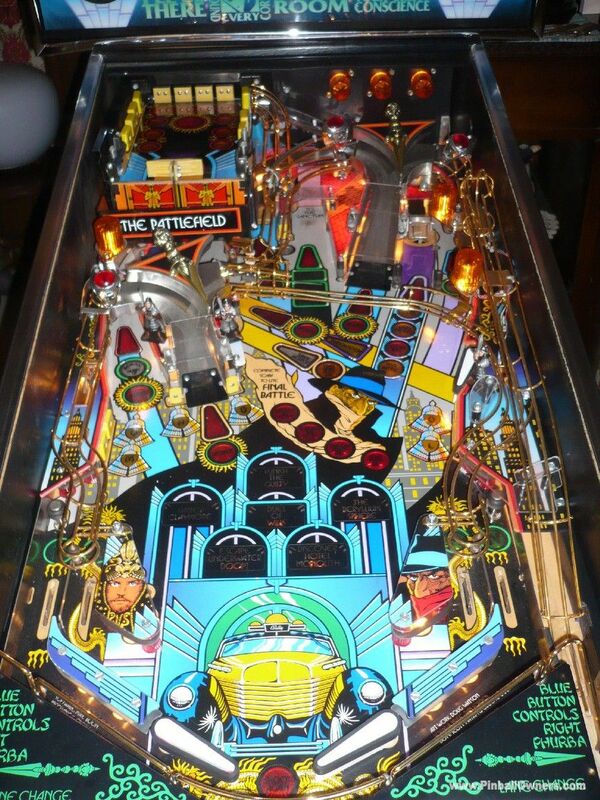 Well maintained plays slick and smooth A.Gomez design, the shots are not overly difficult. 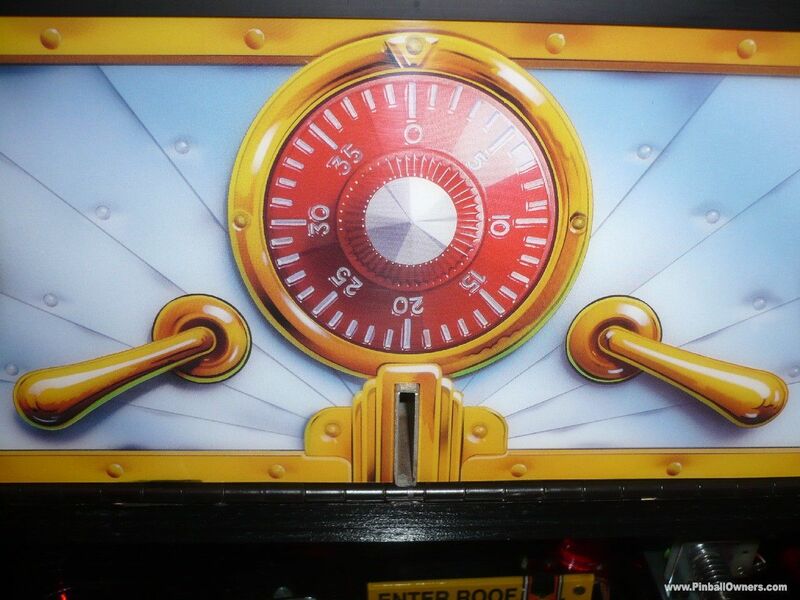 Crack the safe to advance thru the ranks from associate to Boss. 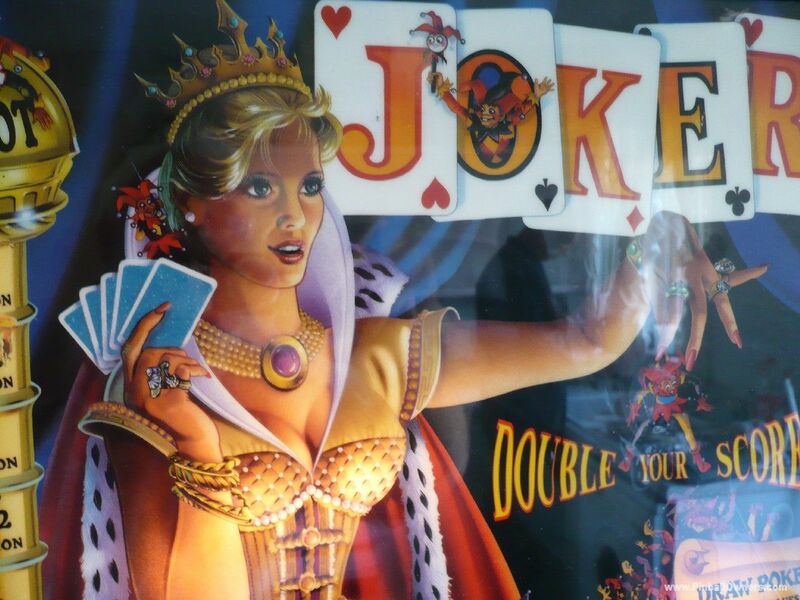 Meet the Mistress on the boat for Double Jackpots. 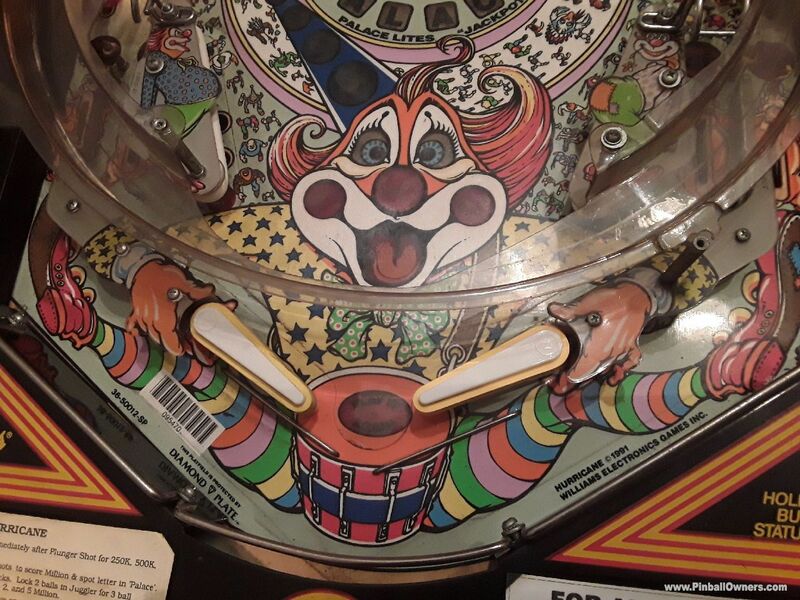 Visit the twirling pole dancers as you search for FBI bugs.. 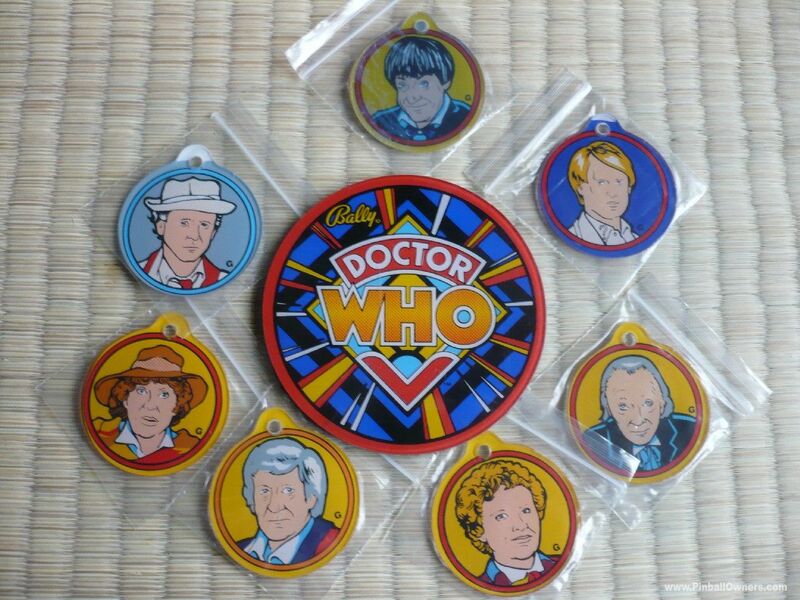 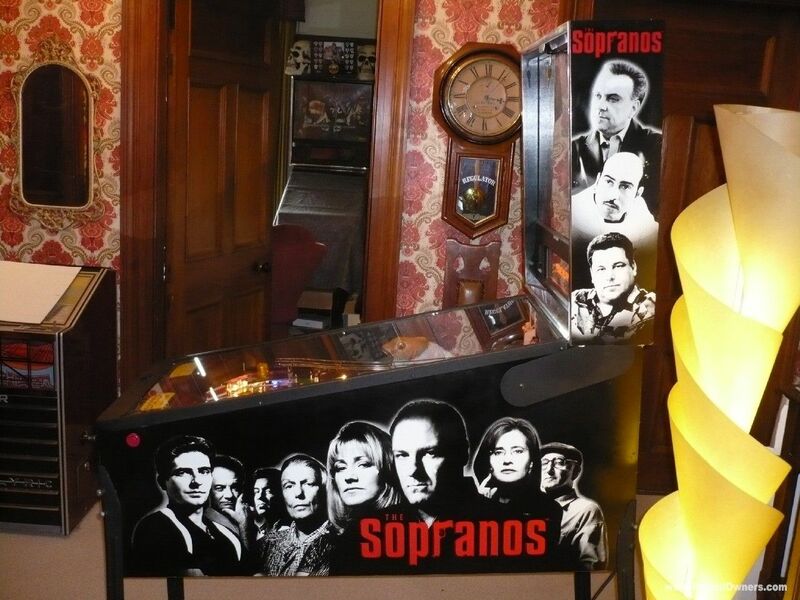 Play all 5 Episodes....Arson, Exterminate, Horse Race, Executive Game and Satisfaction. 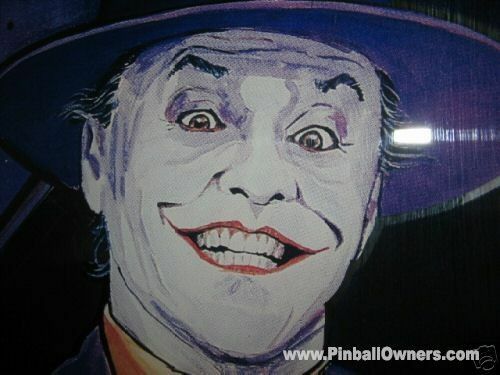 Plenty of Hi-jack n assassination points and plenty to keep you smiling. 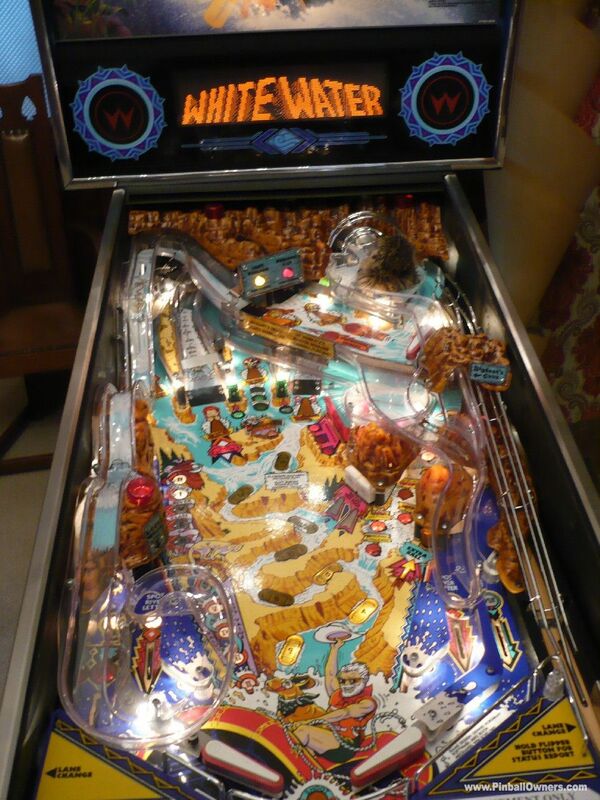 Unusual in many ways this game has the Original soundtrack n music from the series....... Oh....... And a talking Fish !! 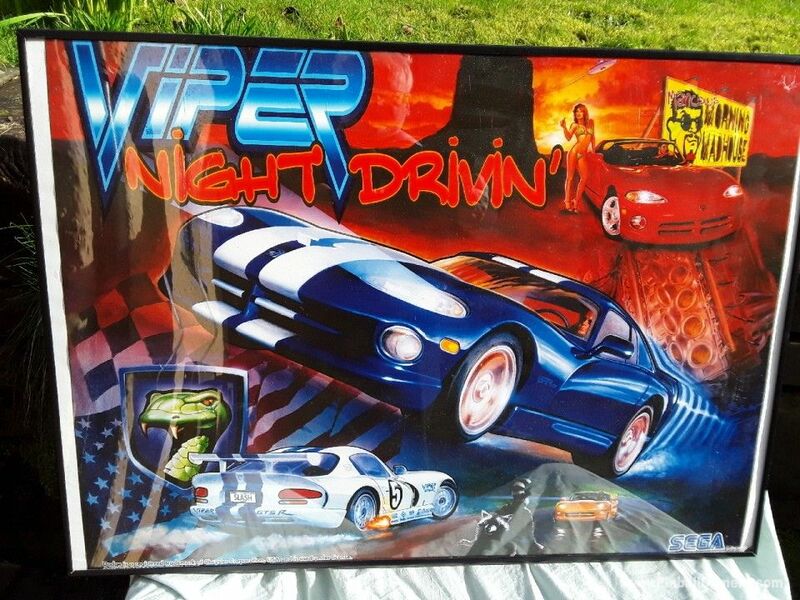 VIPER NIGHT DRIVIN' Sega (USA) Bon pour pièces Ca dépend Original new old stock Viper translight. 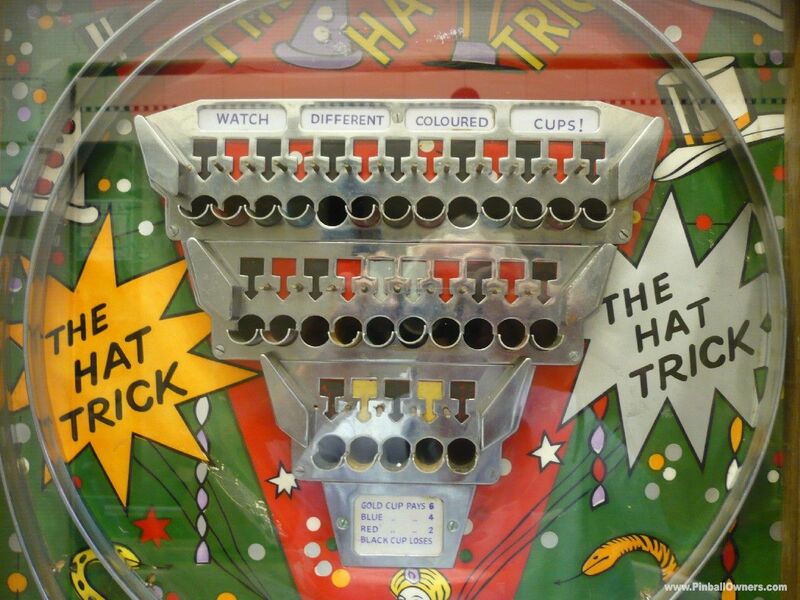 never fitted to machine. 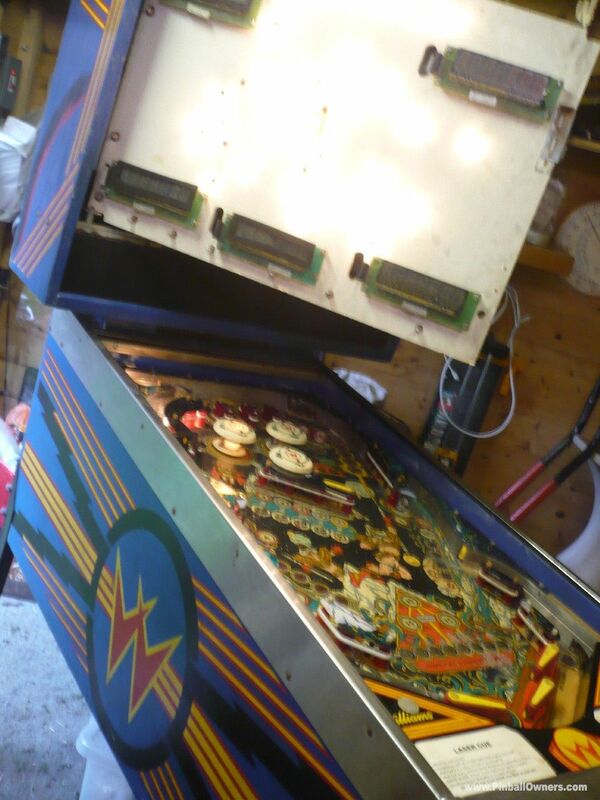 WURLITZER autre (voient les notes) Monté, jouable Jamais This jukebox plays an important part of my Pinball collection repair and maintenance process. 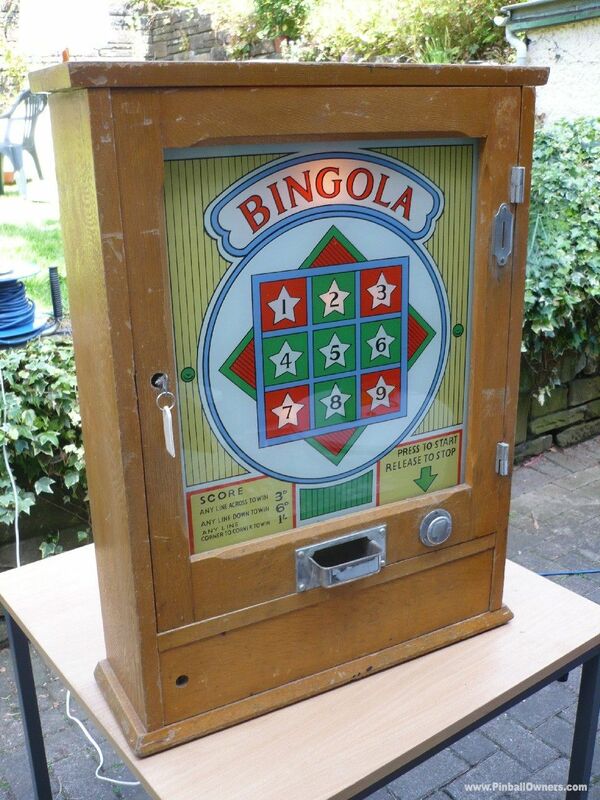 Every acquisition spends hours and at times days beng dialled-in to give a strong fast reliable game. 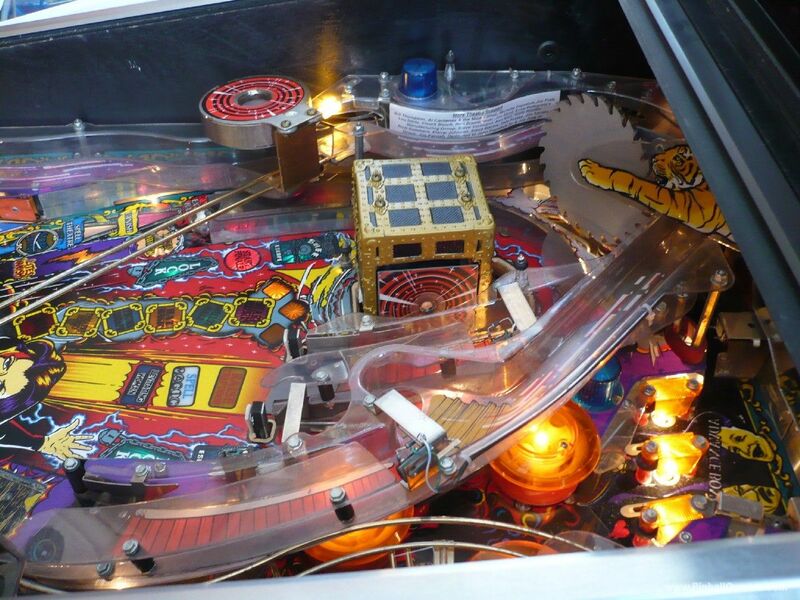 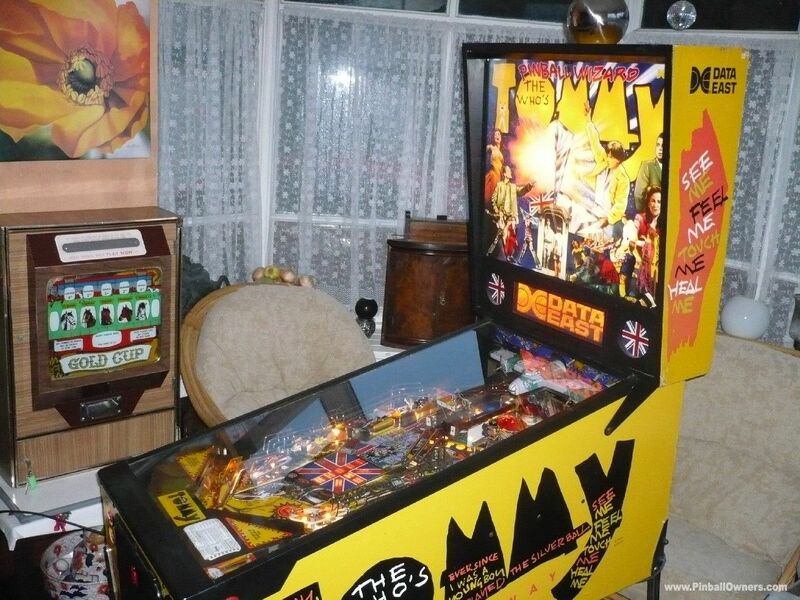 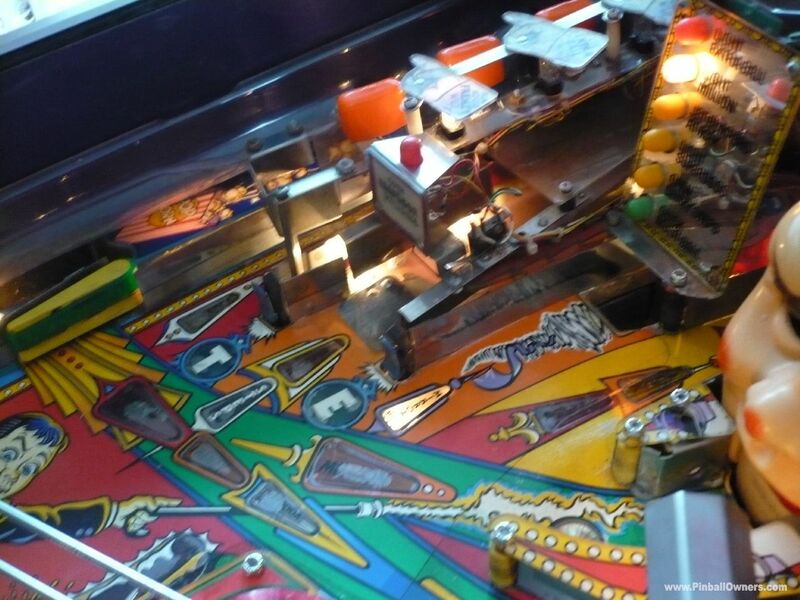 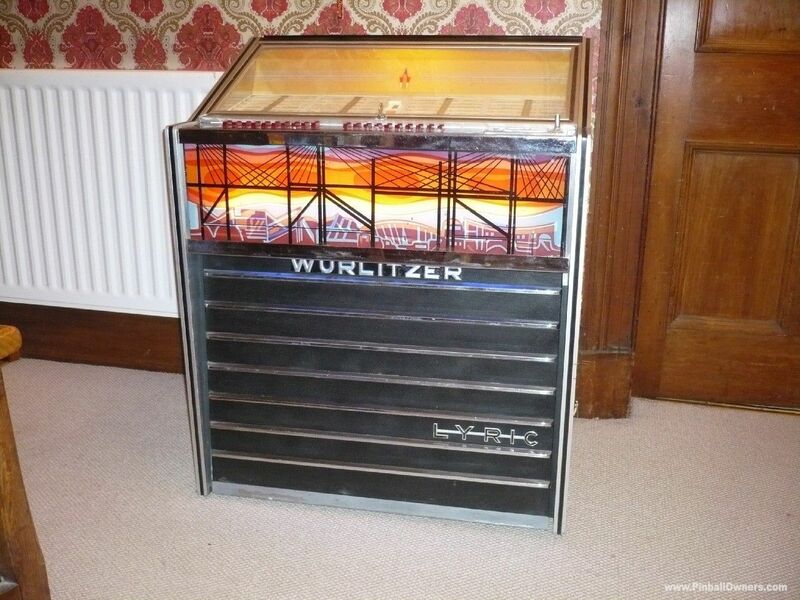 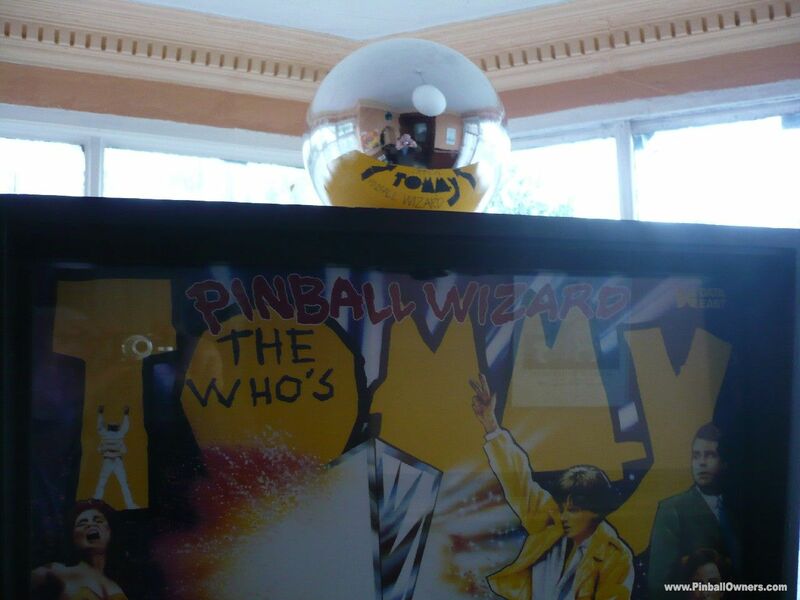 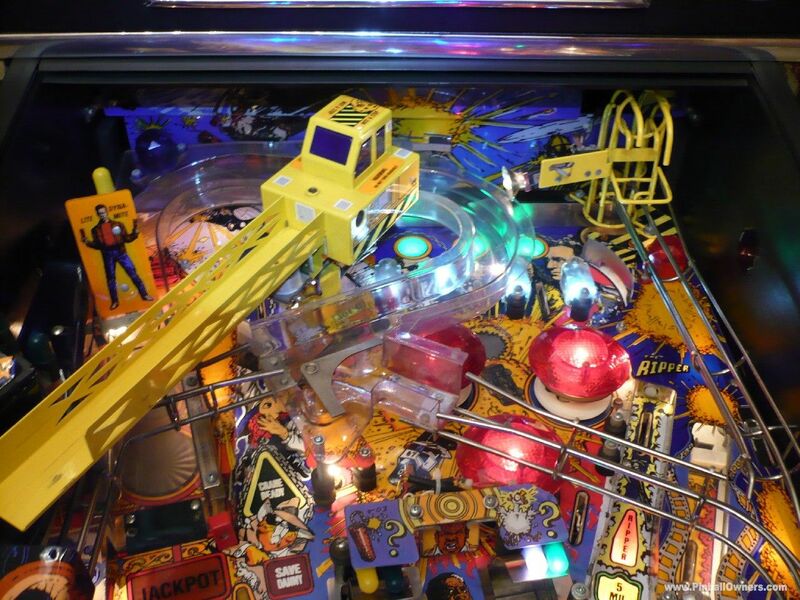 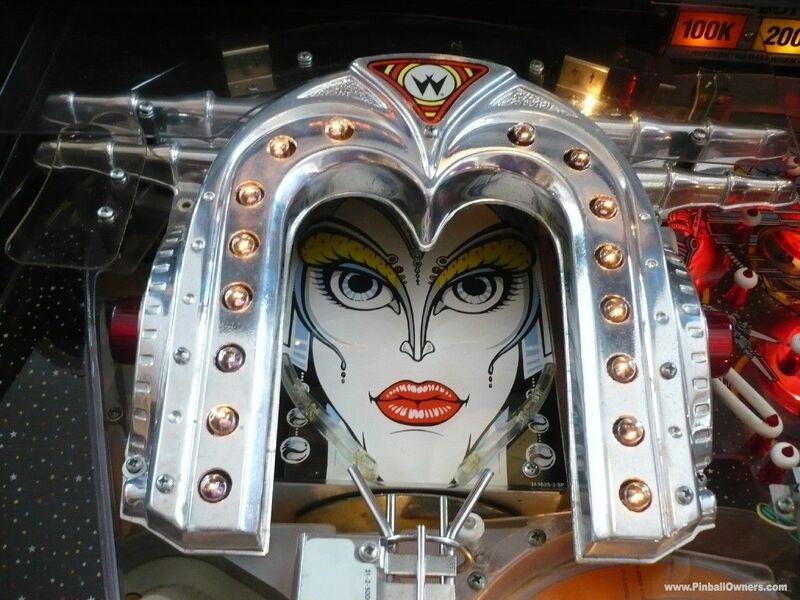 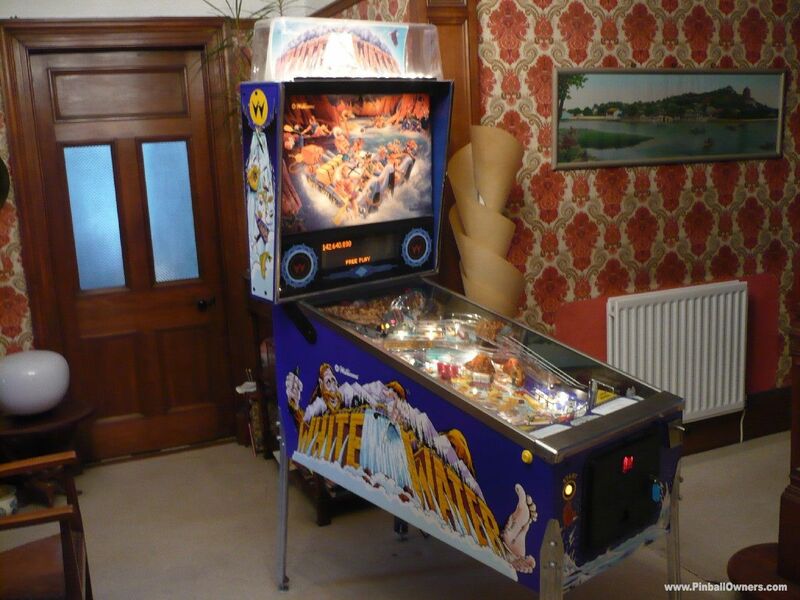 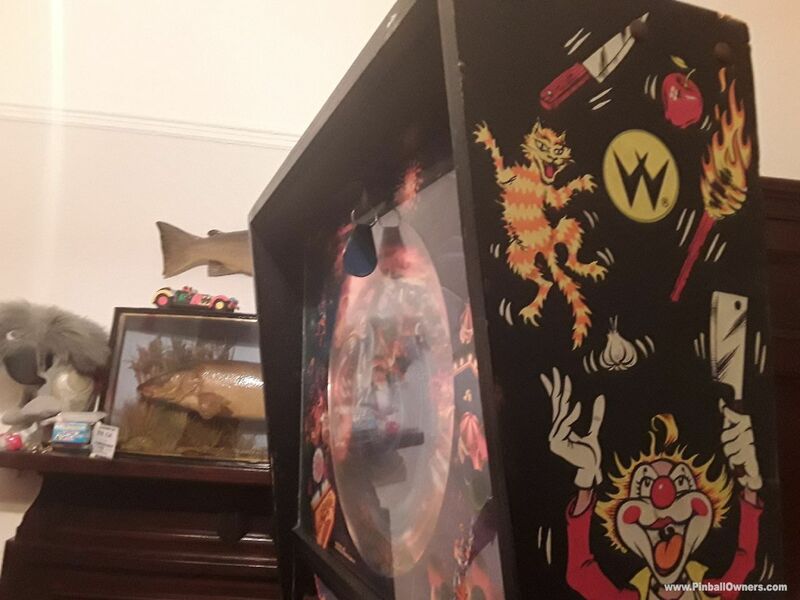 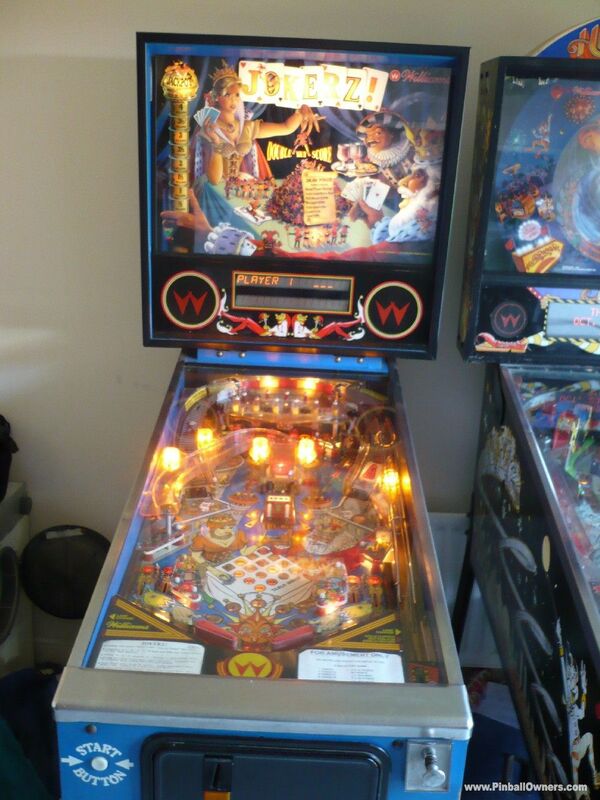 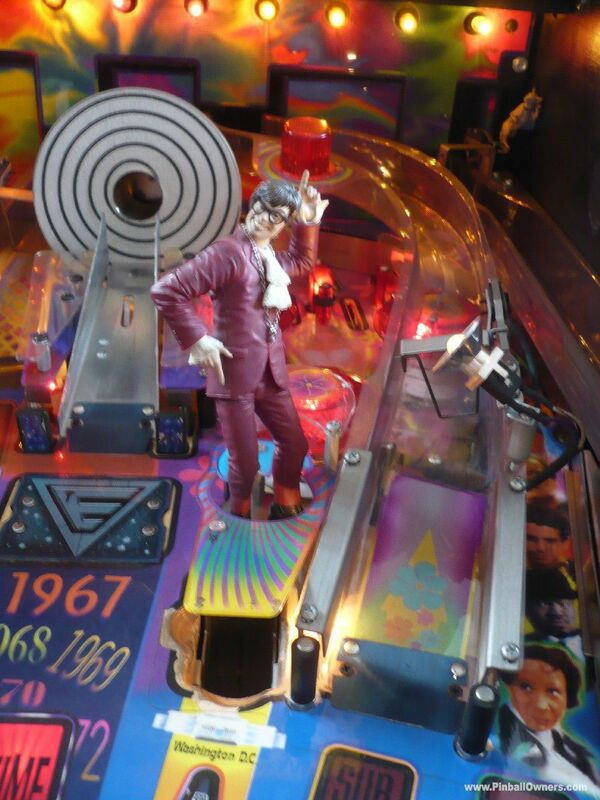 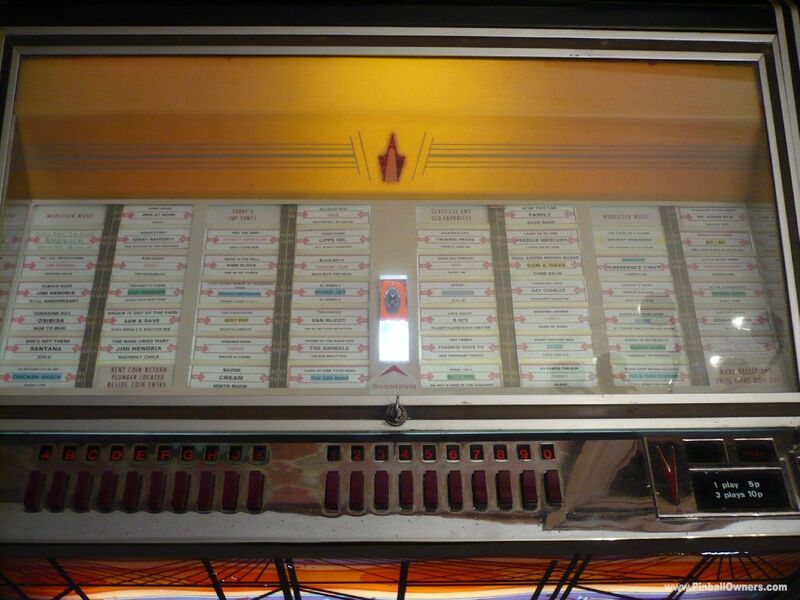 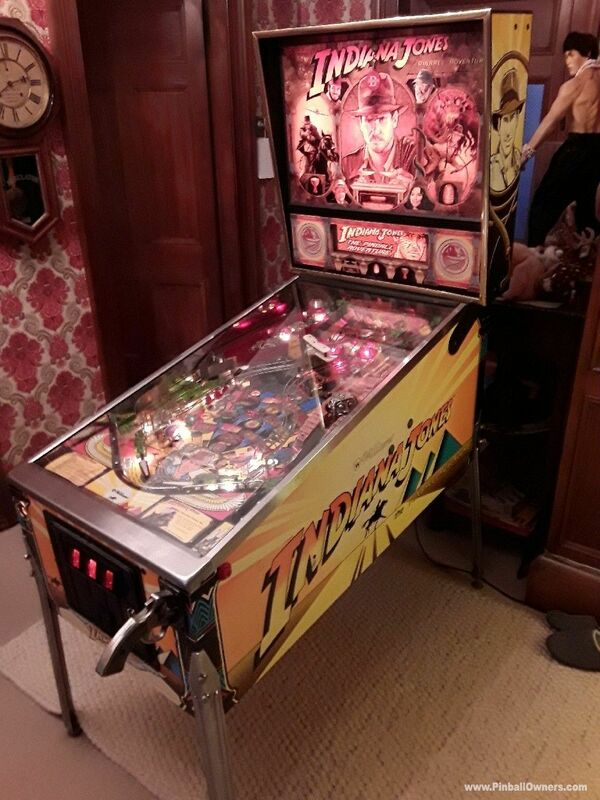 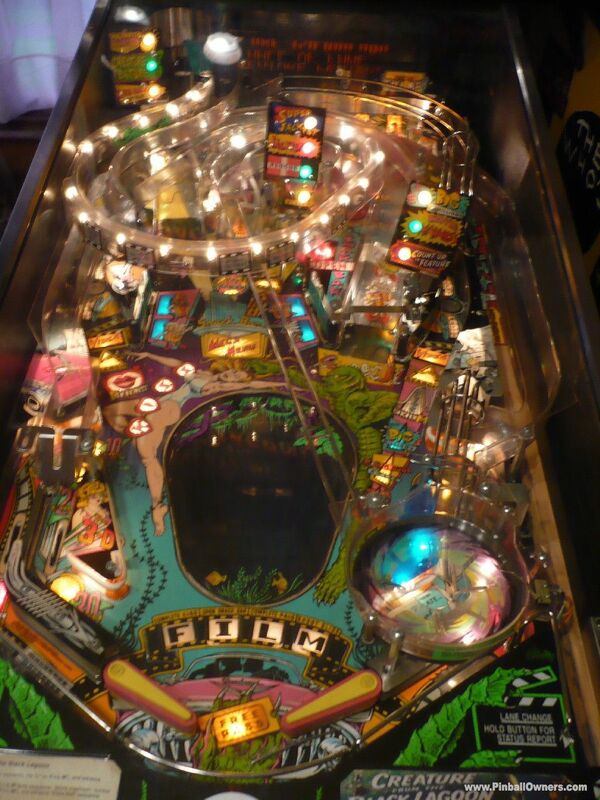 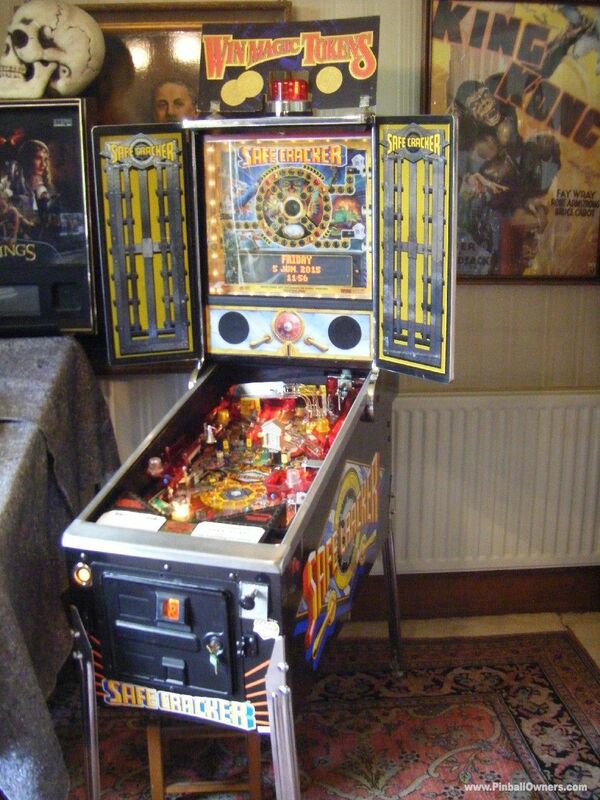 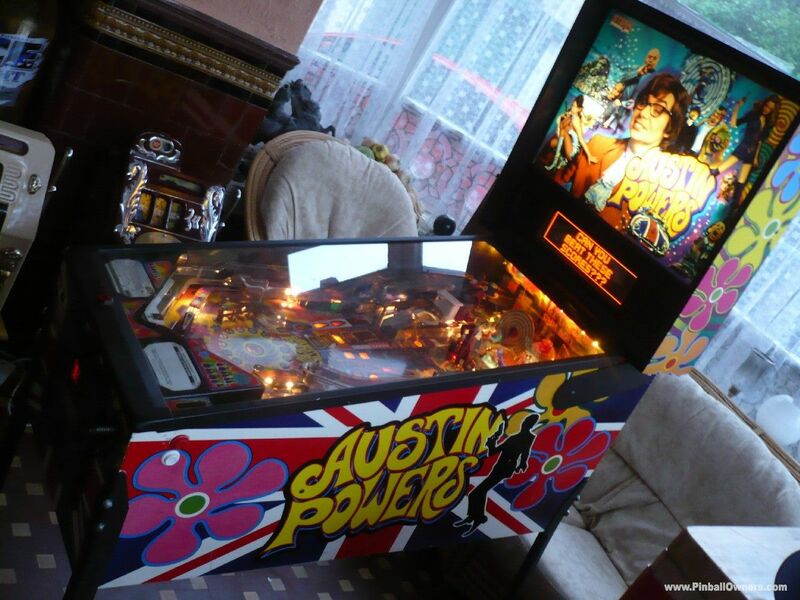 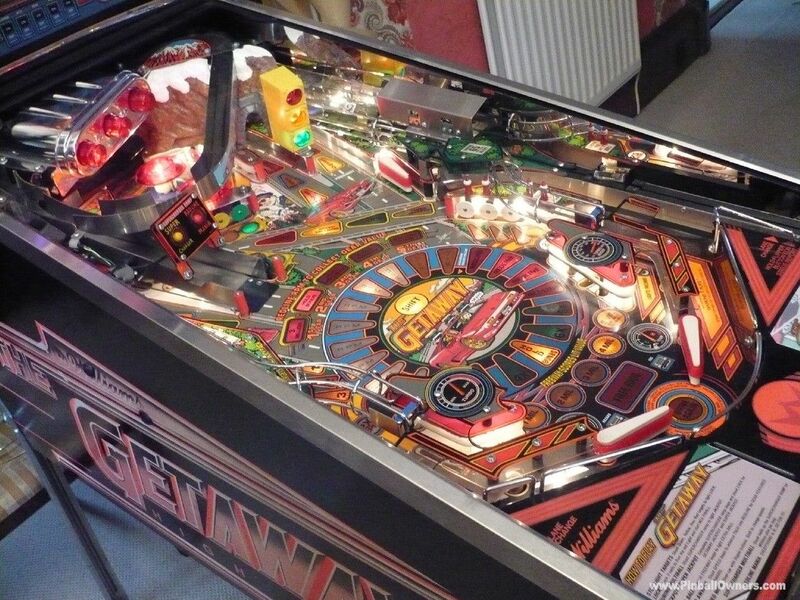 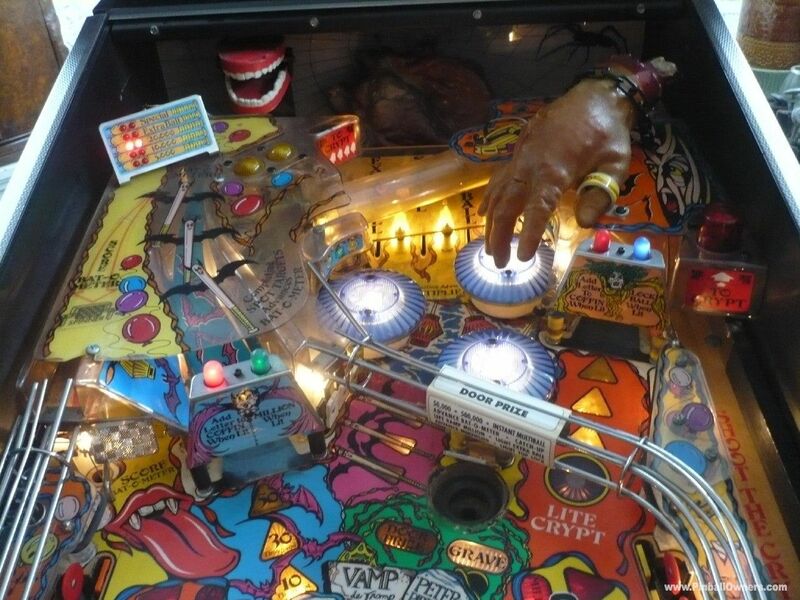 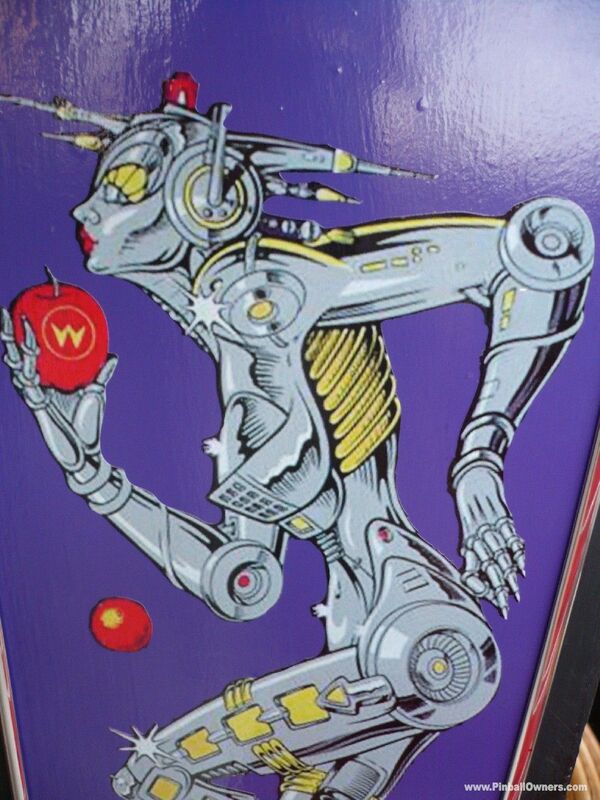 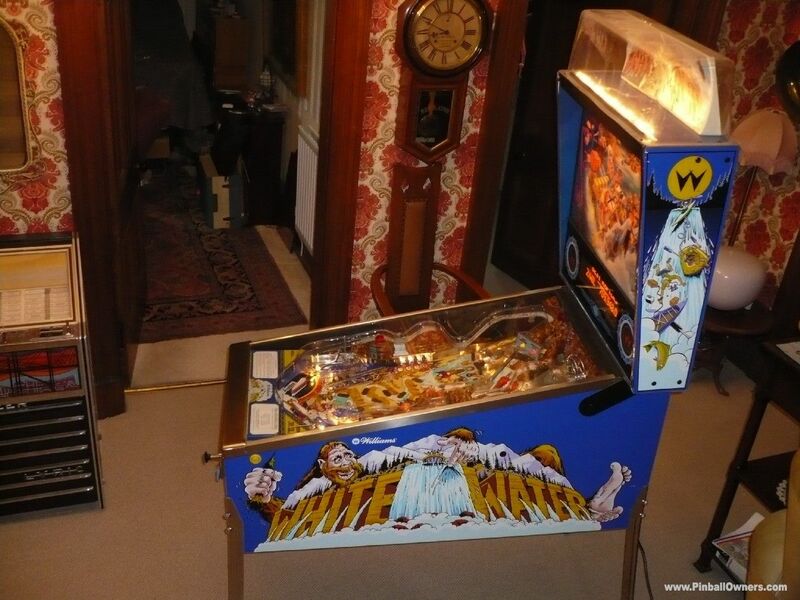 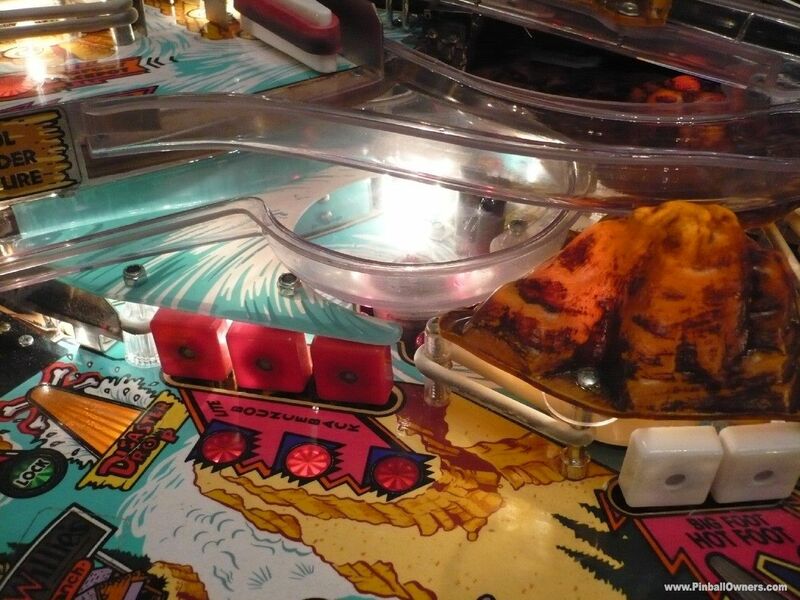 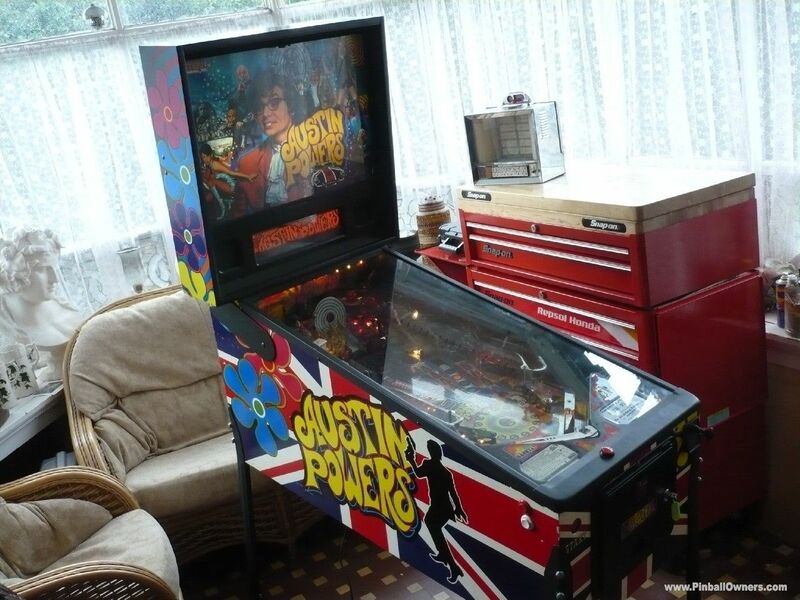 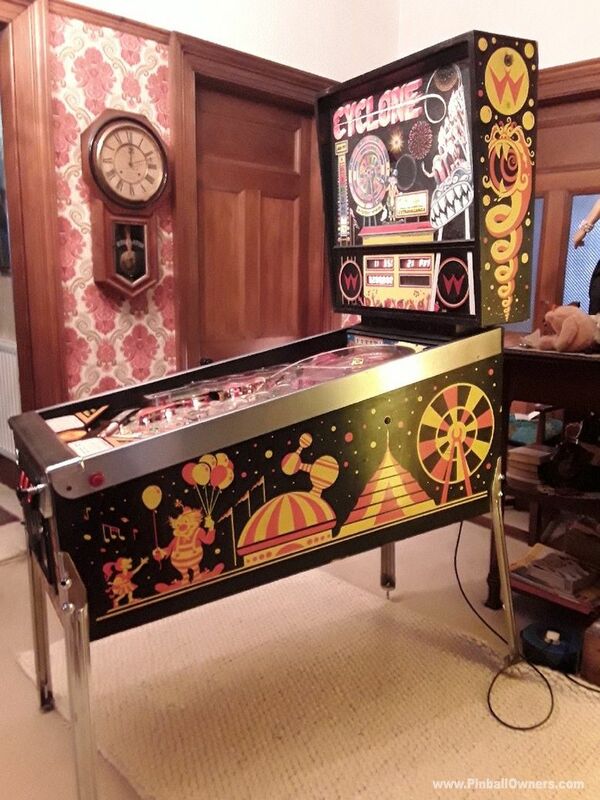 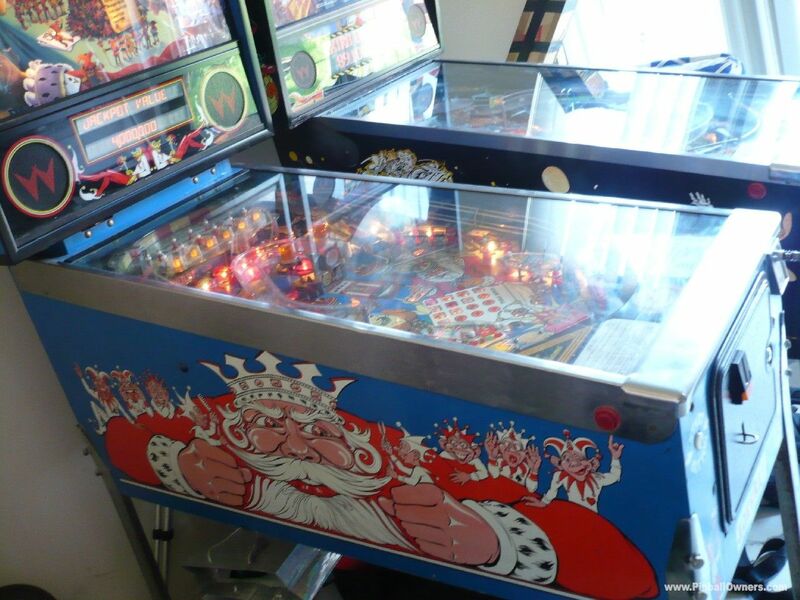 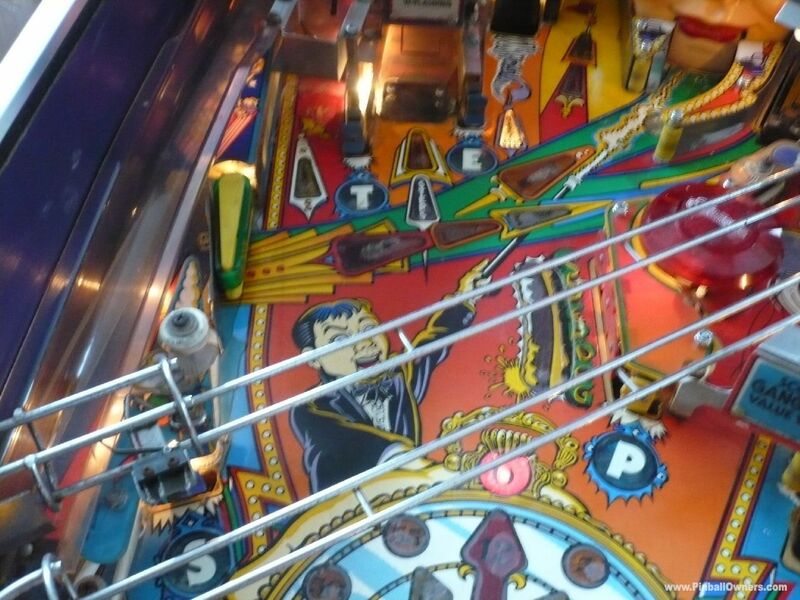 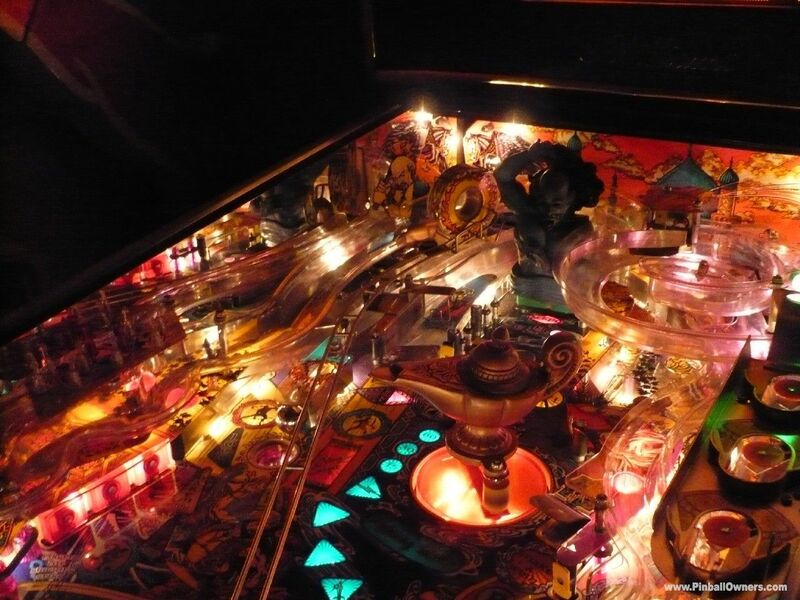 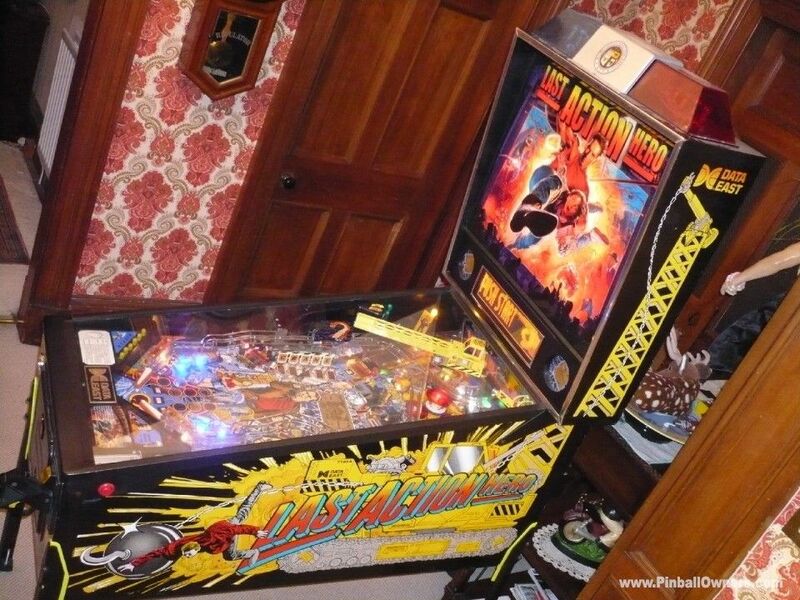 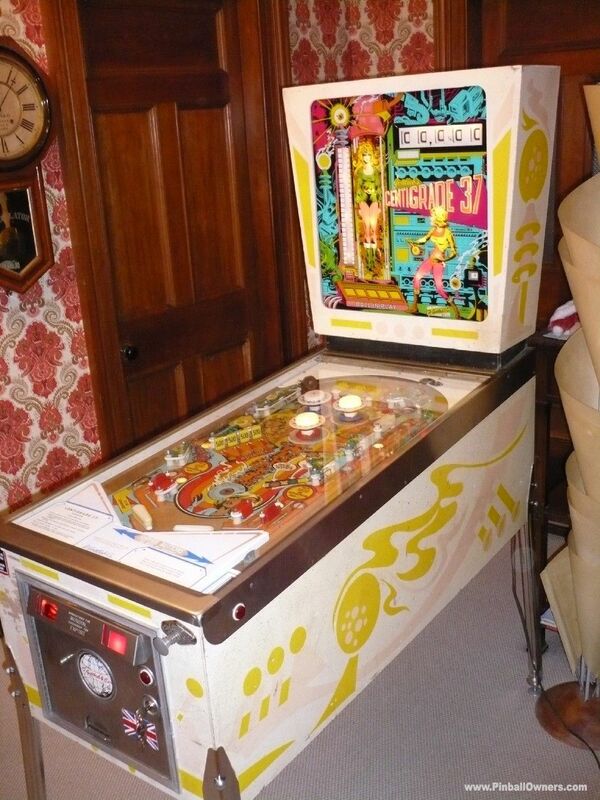 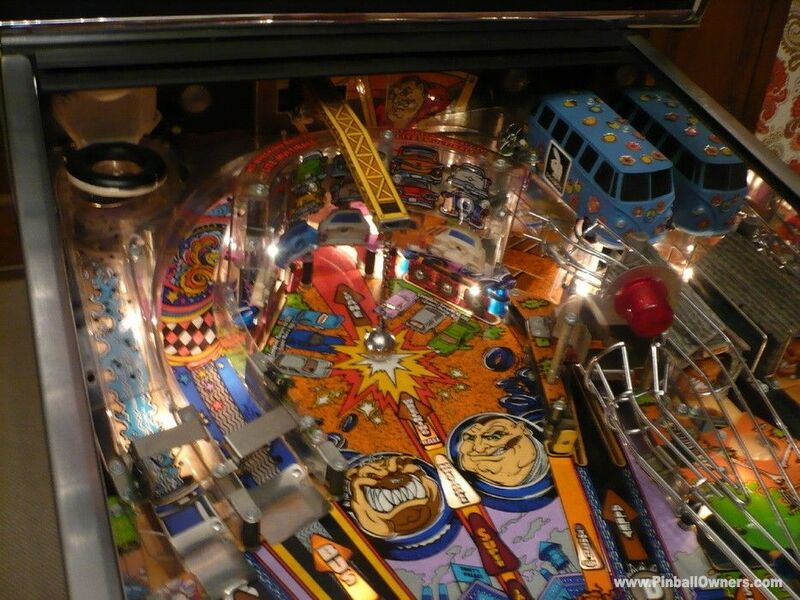 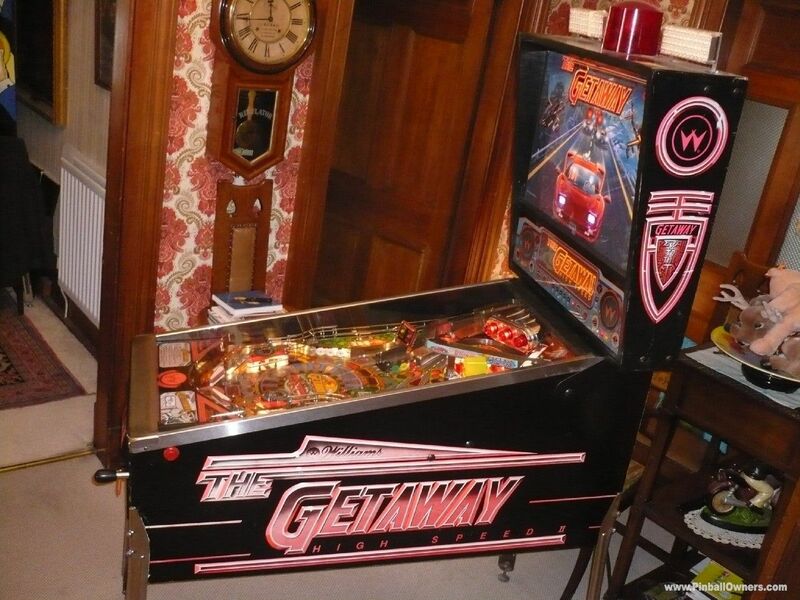 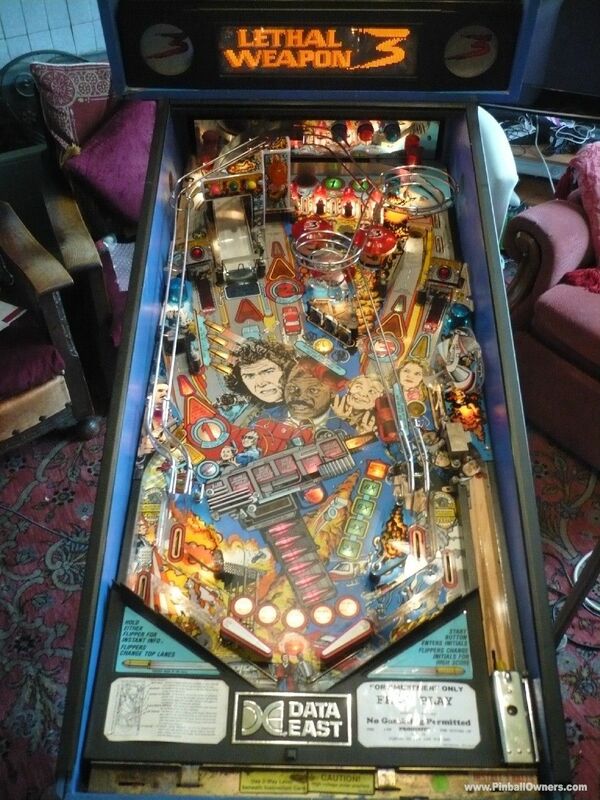 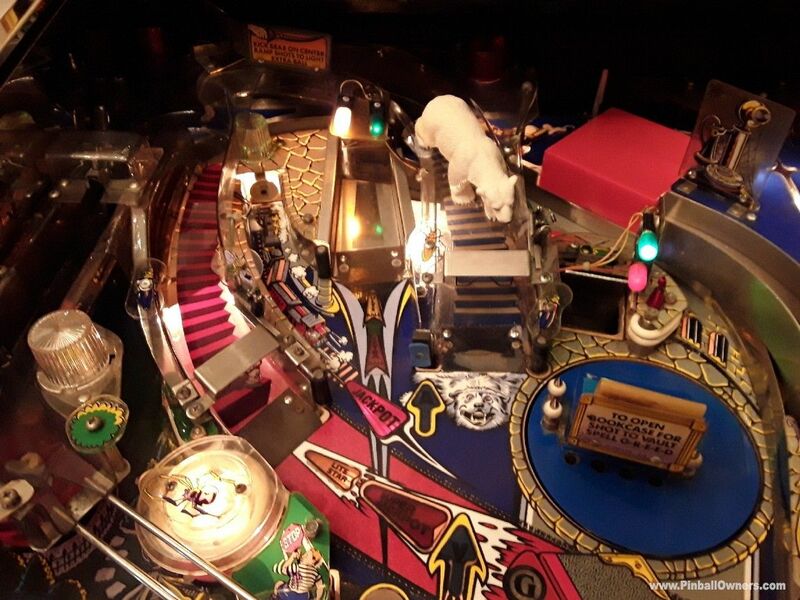 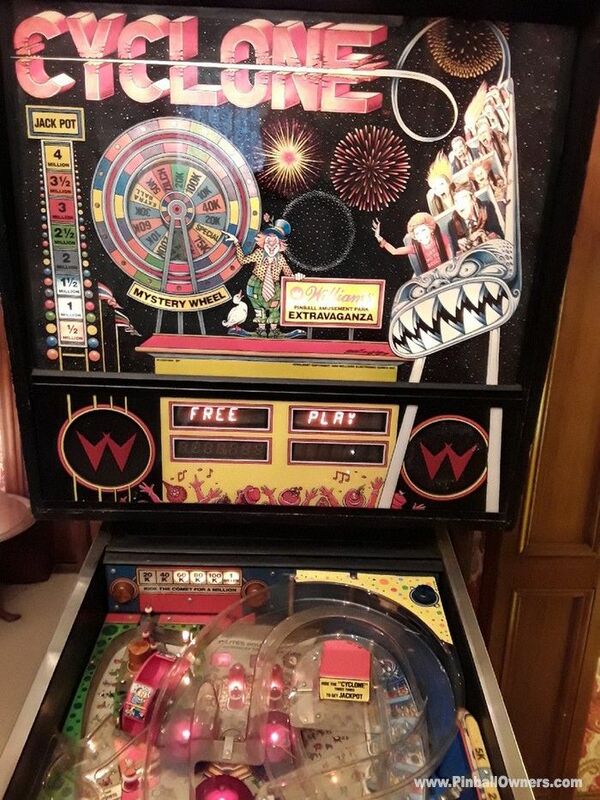 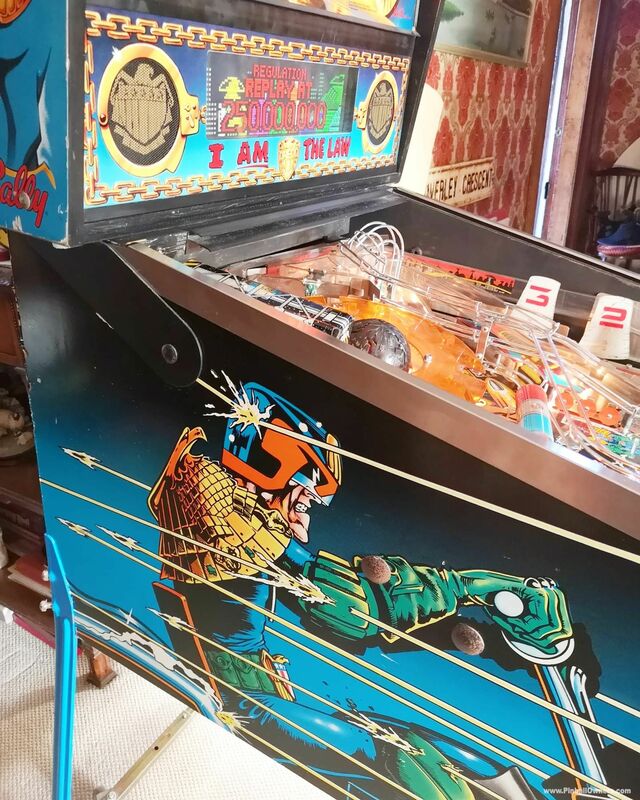 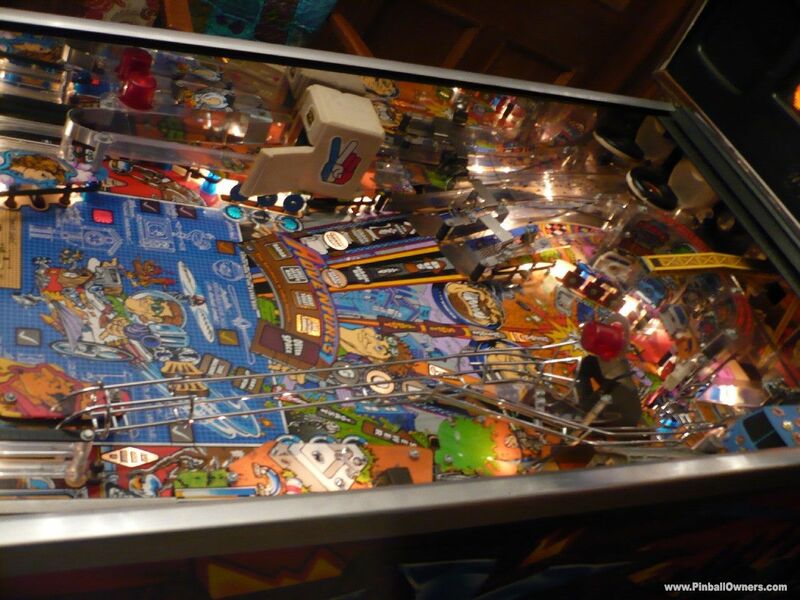 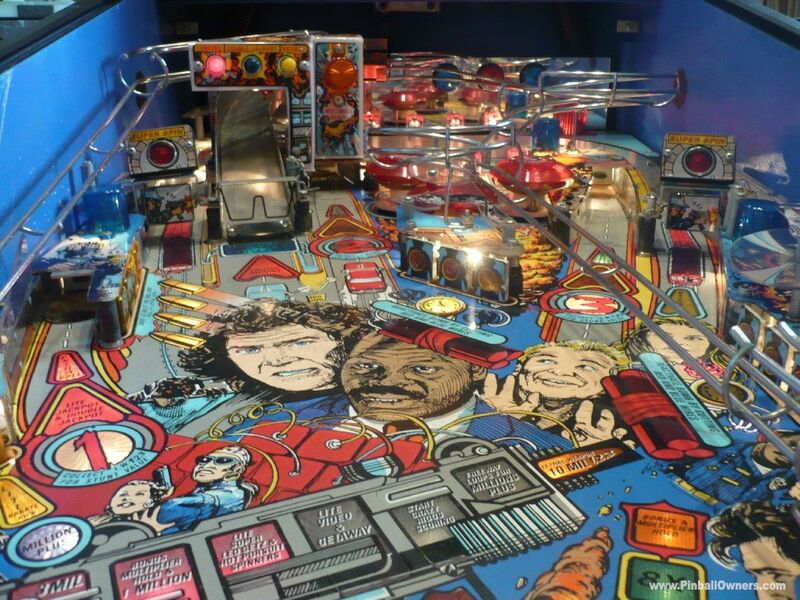 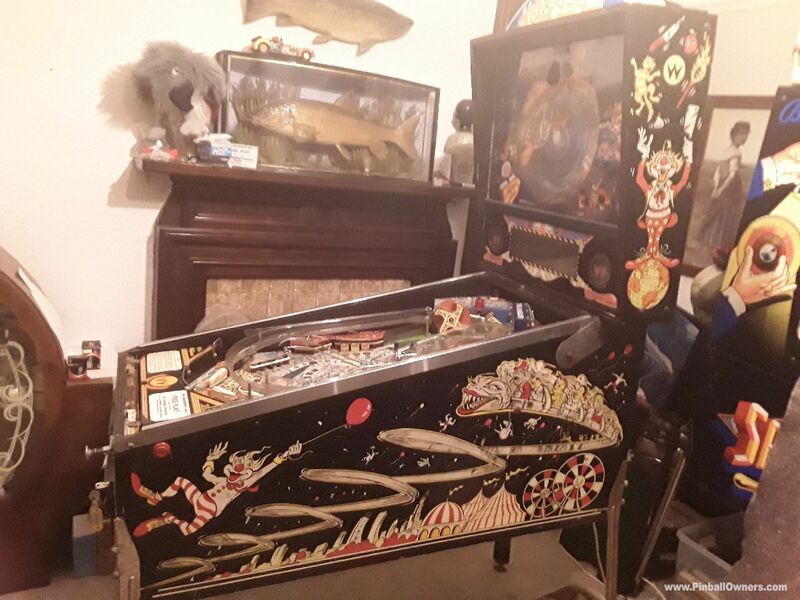 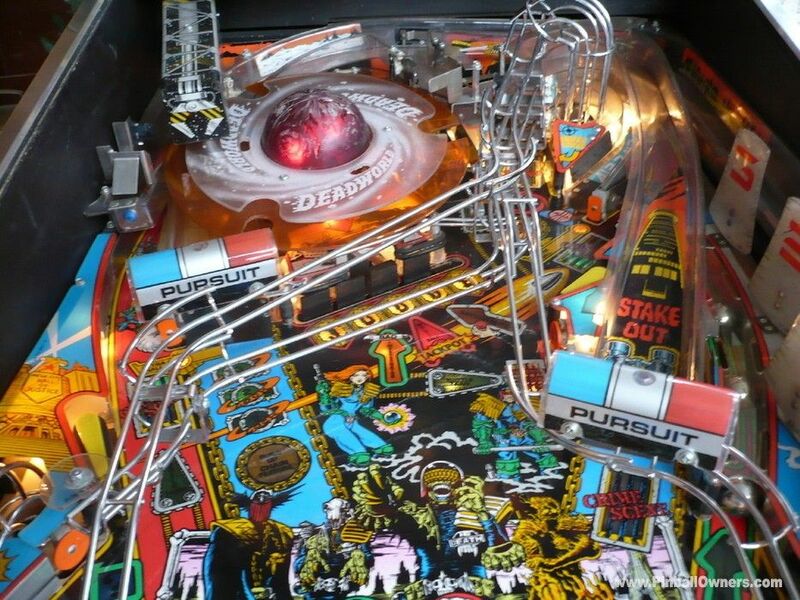 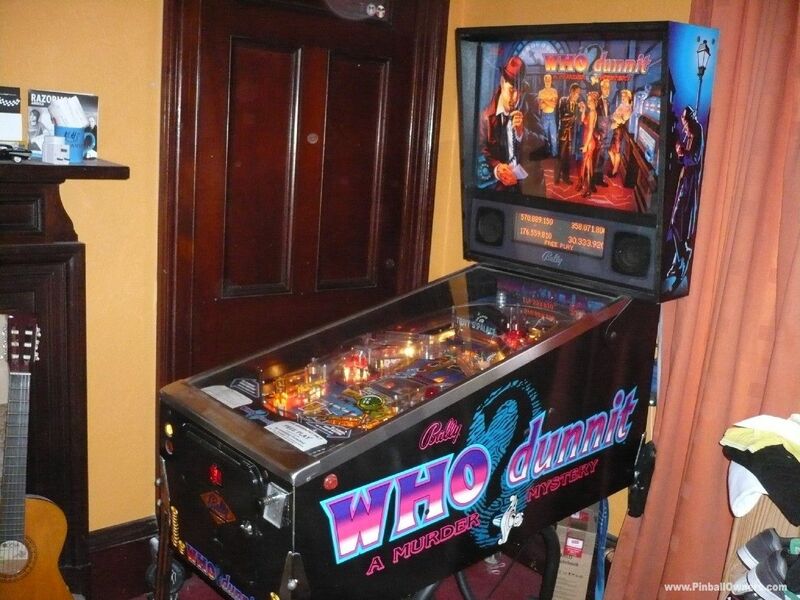 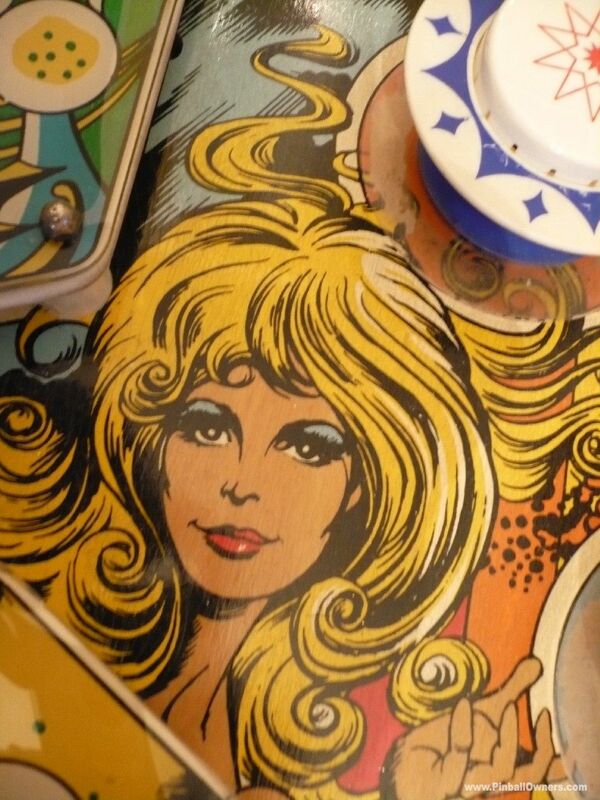 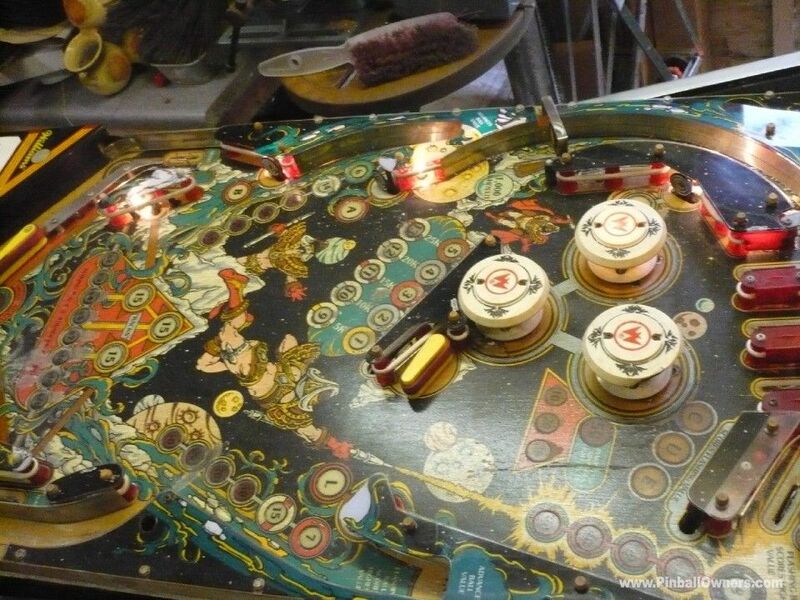 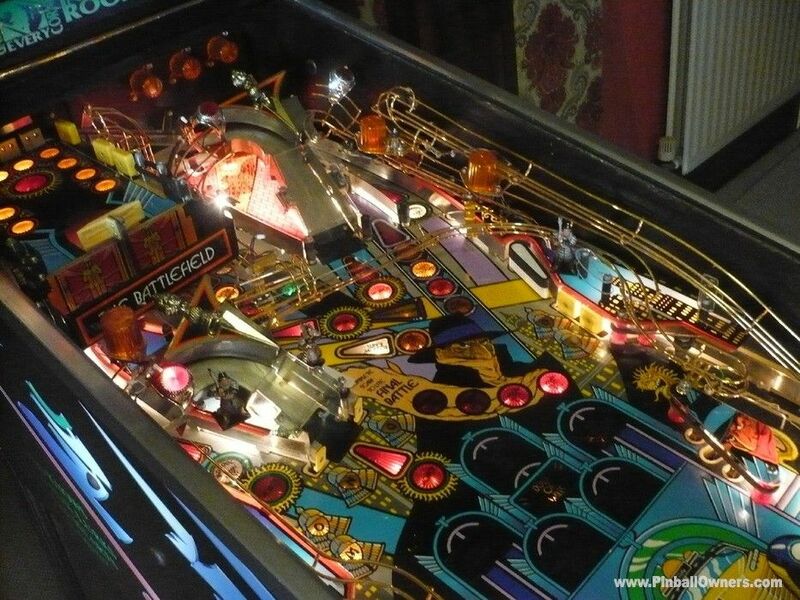 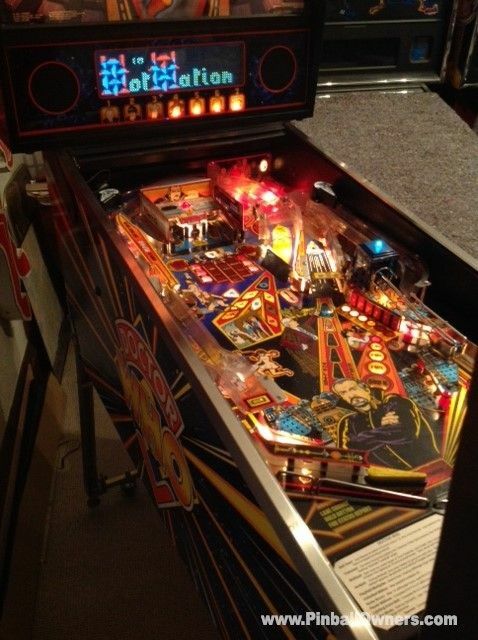 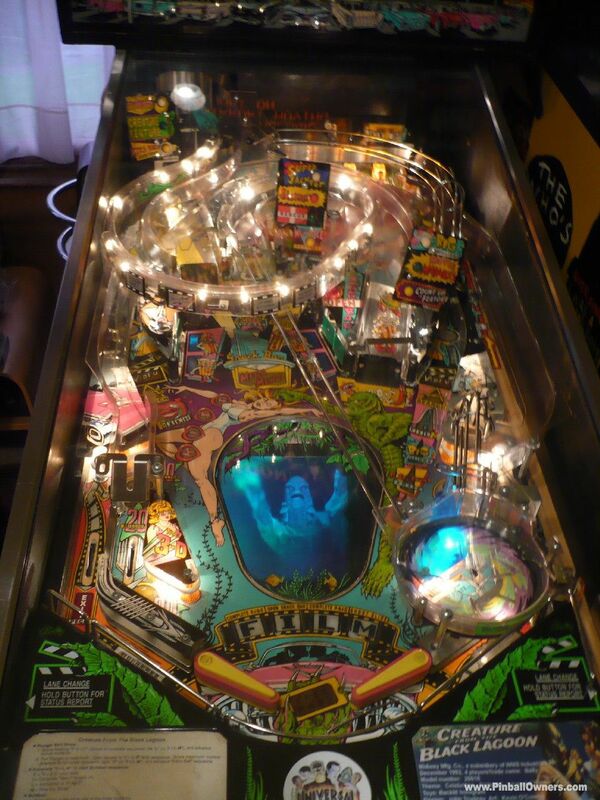 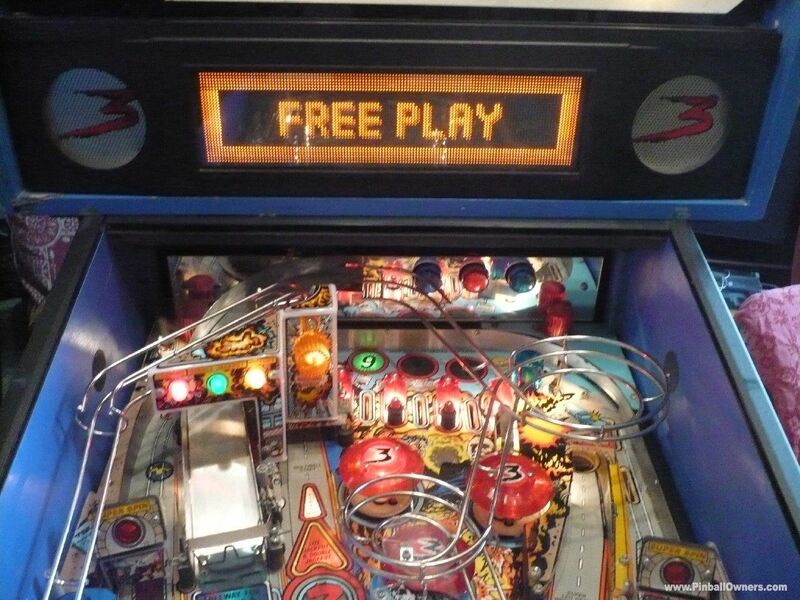 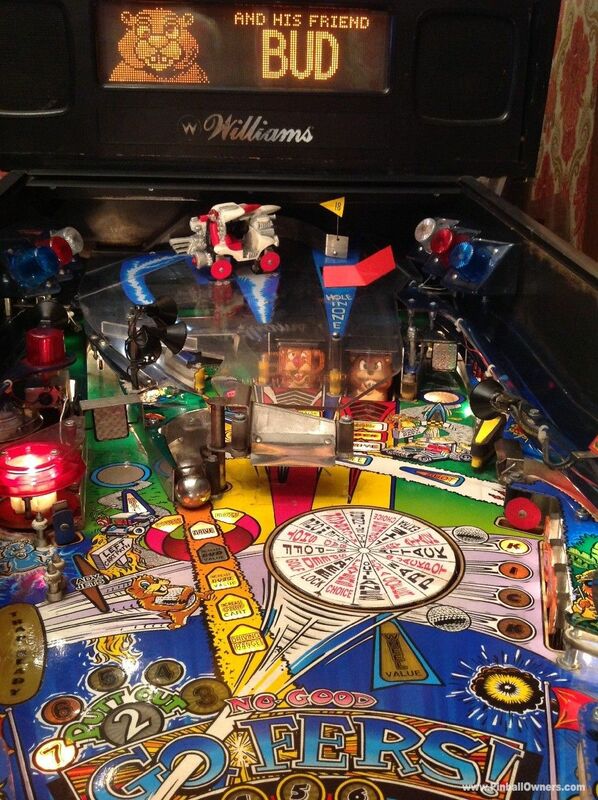 My "pinball buddy" is this Wurlitzer which booms out eclectic nostalgia in the form of music from, Sam n Dave, George Thorougood, Jimmy Hendrix, Cream, King Crimson, Focus, Jan Akerman, Tarantula, Beach Boys, The Stranglers, Family, Iggy Pop etc etc. 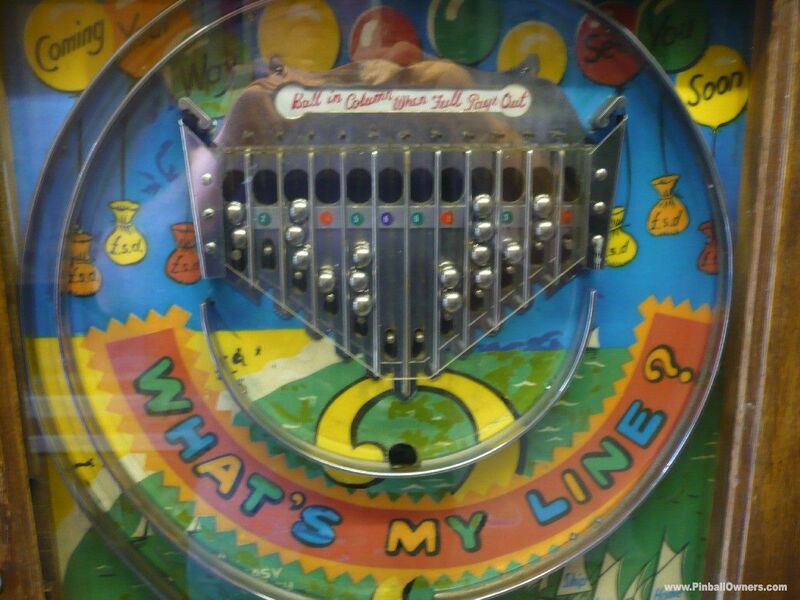 Nothing equals the tone and the mechanical selection whirrs and clicks...... love it. 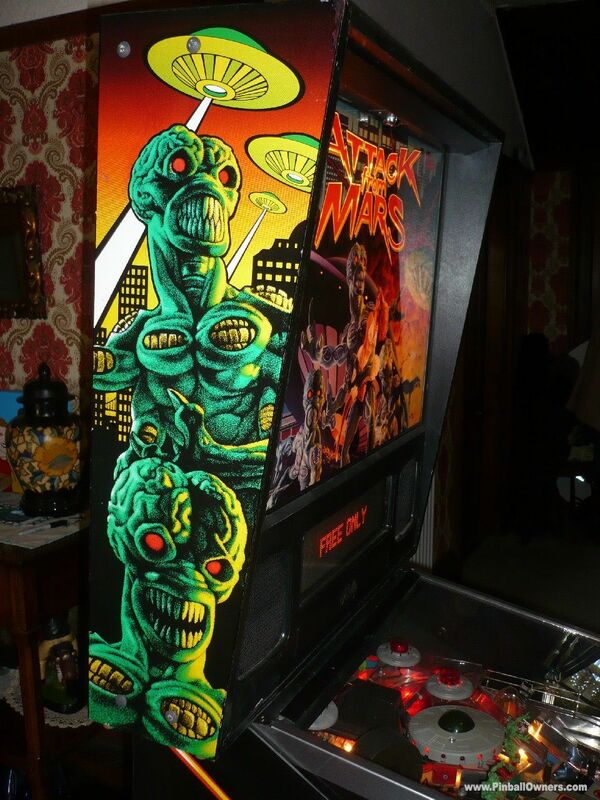 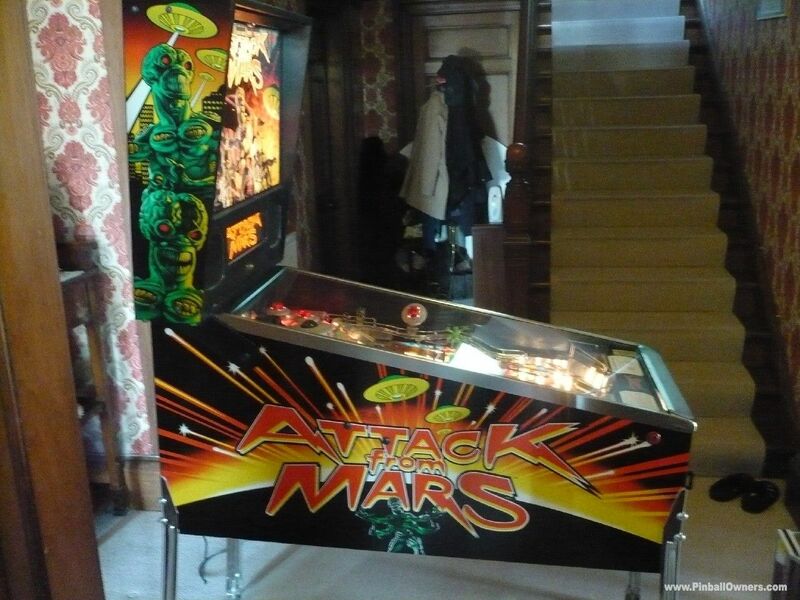 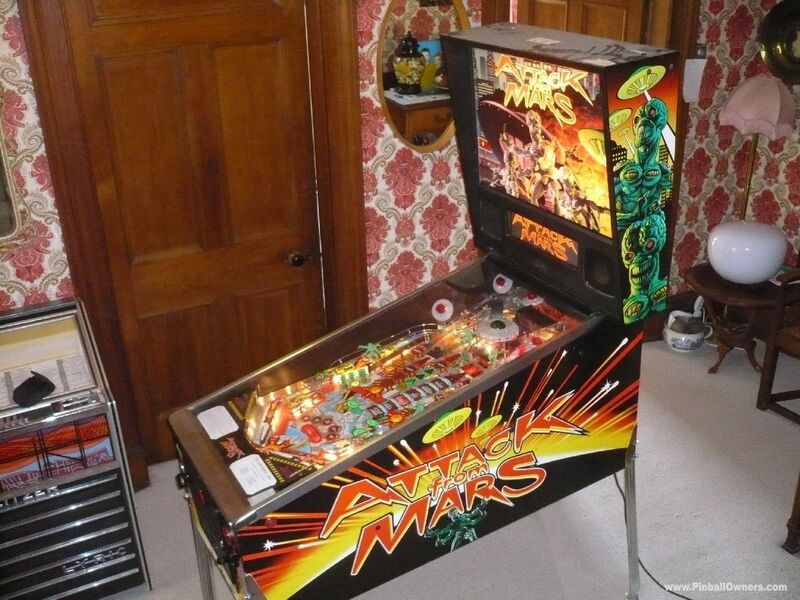 ATTACK FROM MARS Bally (USA) Vendu 1996(February) Has remained original and unrefurbished with exception to the (all) saucer light Mod. 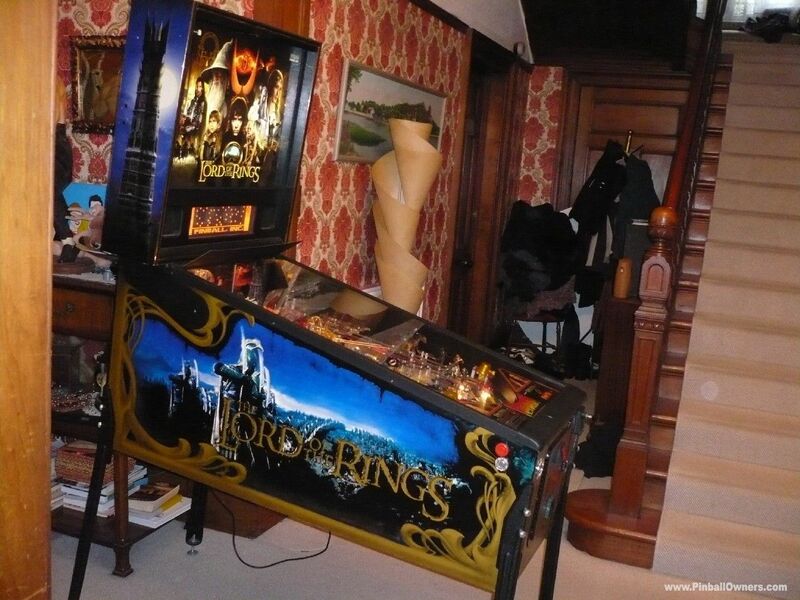 Plays perfectly. 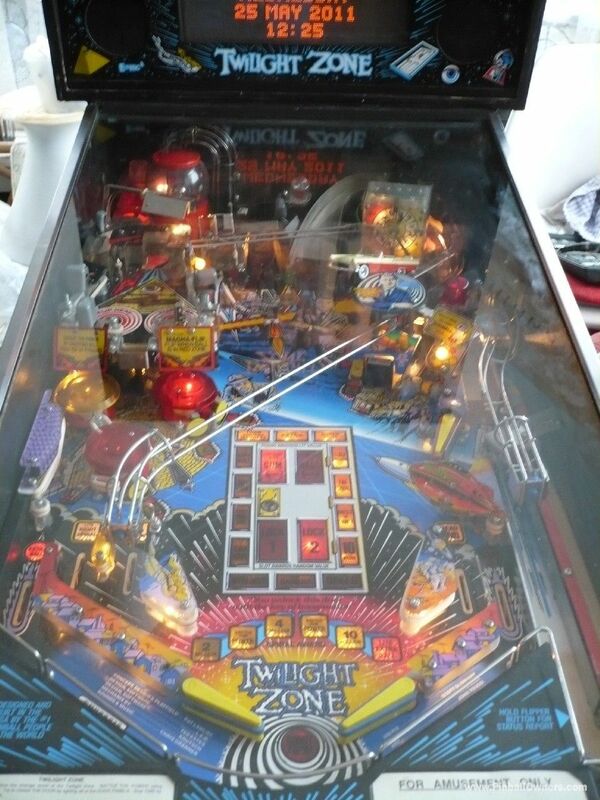 The light mod is awsome and an important part of the pin. 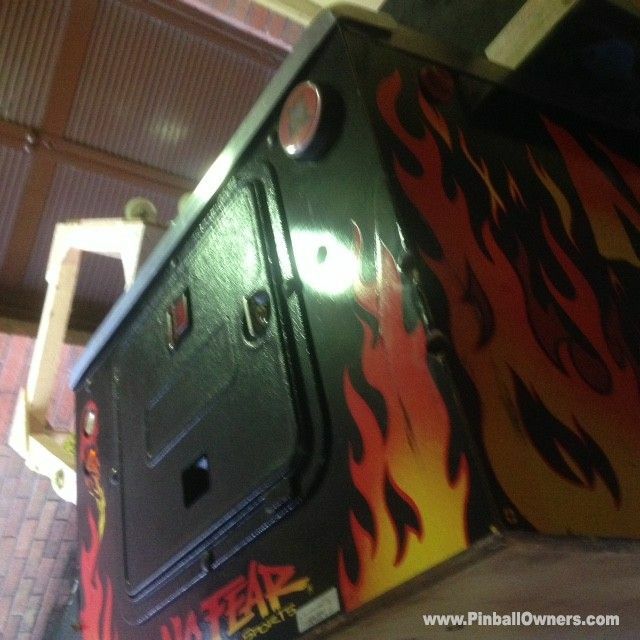 Now fitted with colour display and mirror blades which gives this pintable a whole new dimension. 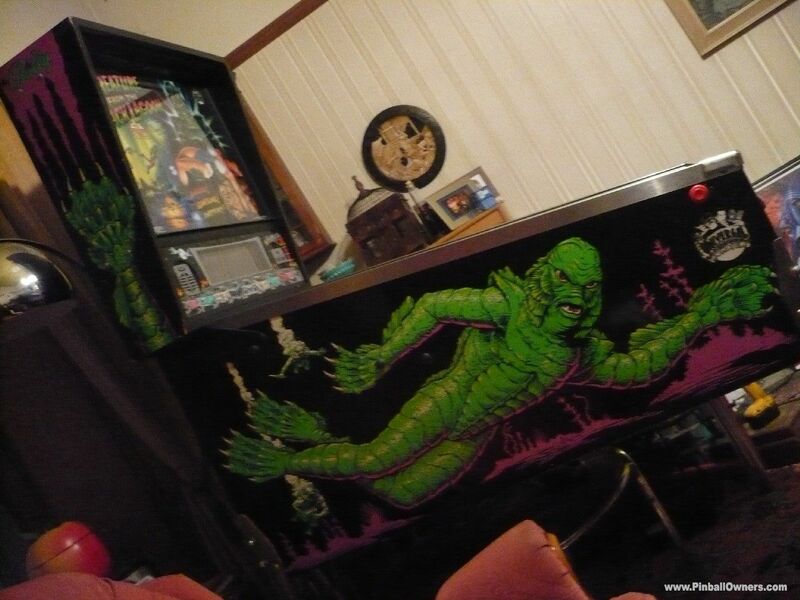 Now cosmetically complete. 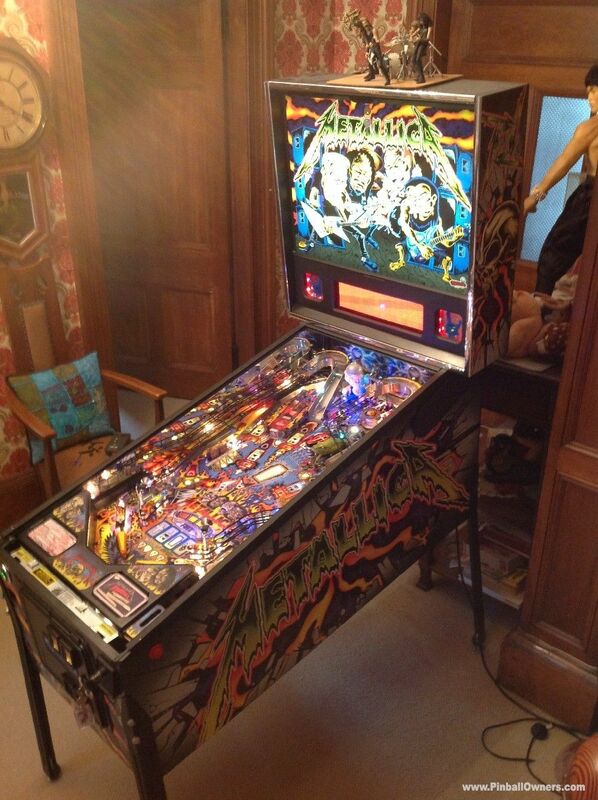 Plays as good as it looks......... Just brilliant. 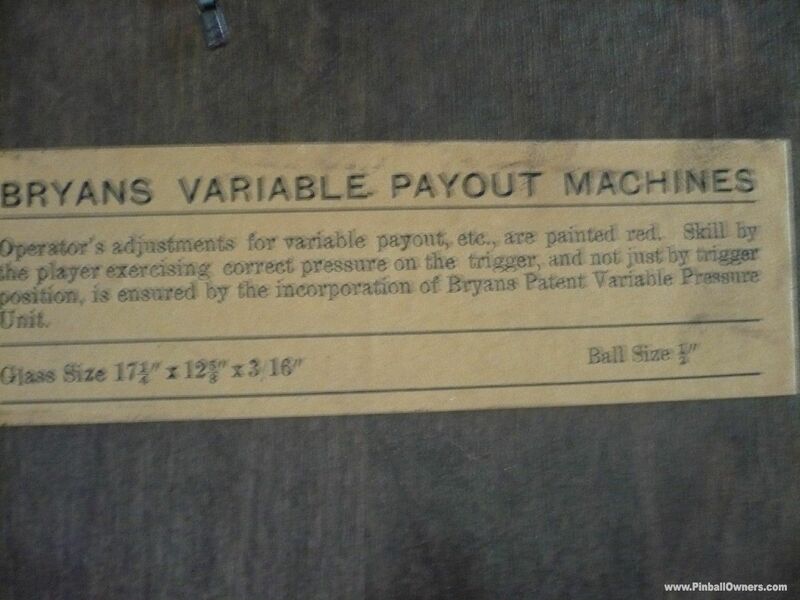 RESERVED payment/Collection in person only. 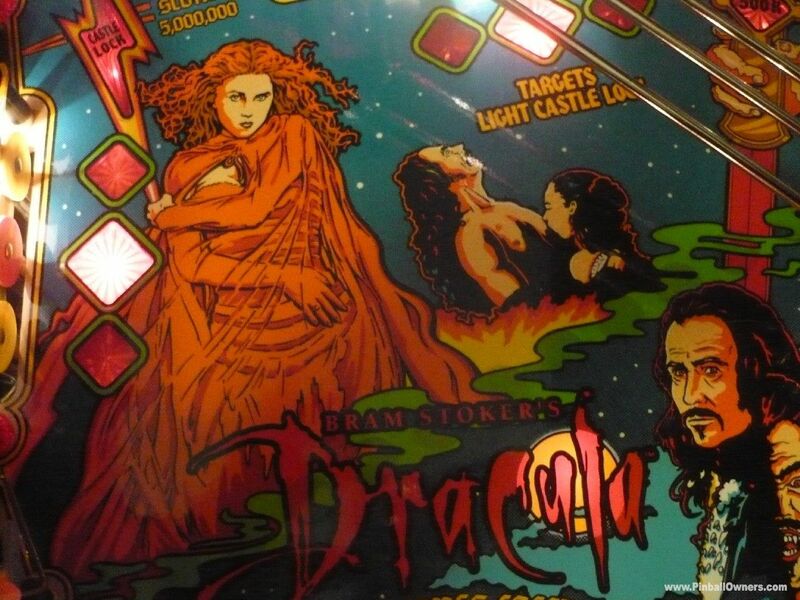 BRAM STOKER'S DRACULA Williams (USA) Vendu 1993(March) Excellent unfettled example. 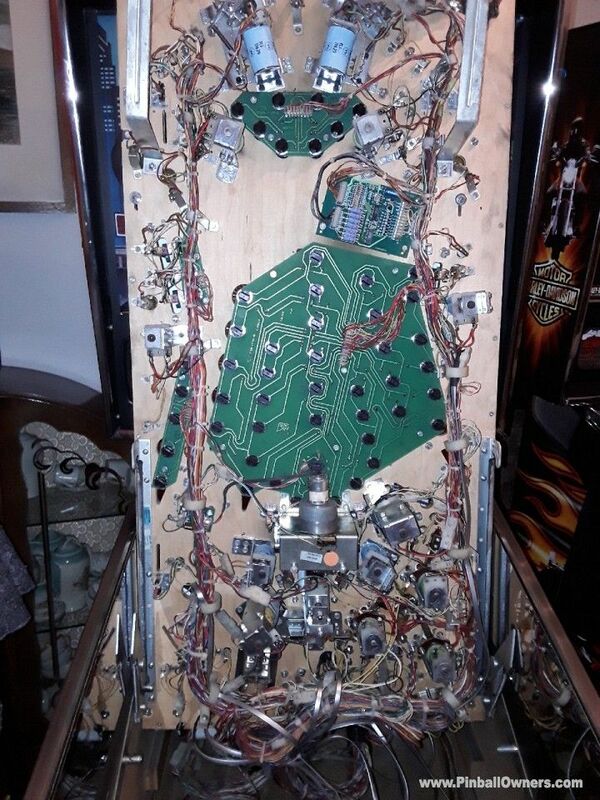 All parts correct. 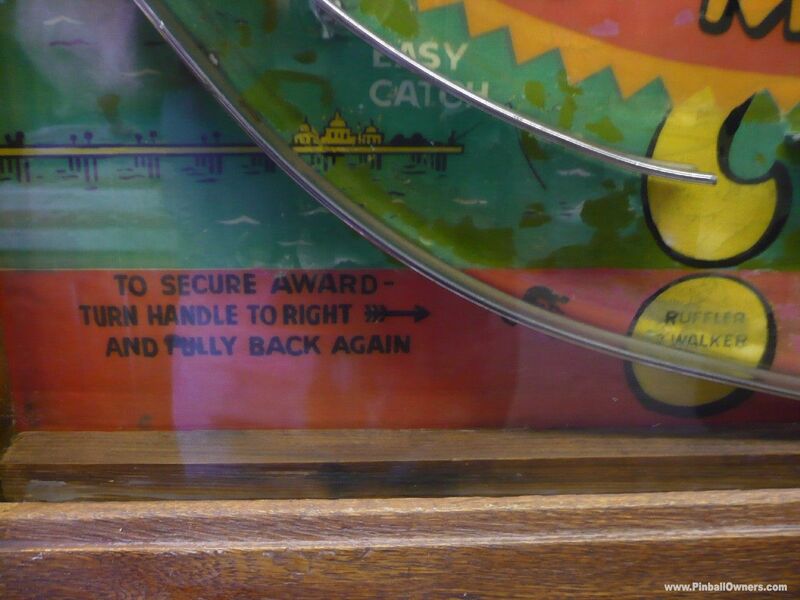 Plays fast without fault. 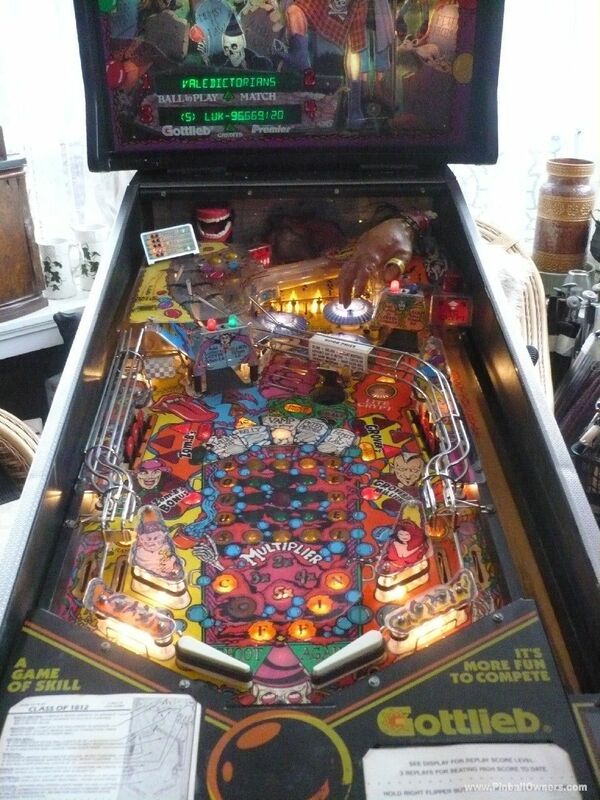 The unique Myst ball, blood red dot matrix display, and atmospheric sound effects set the mood. 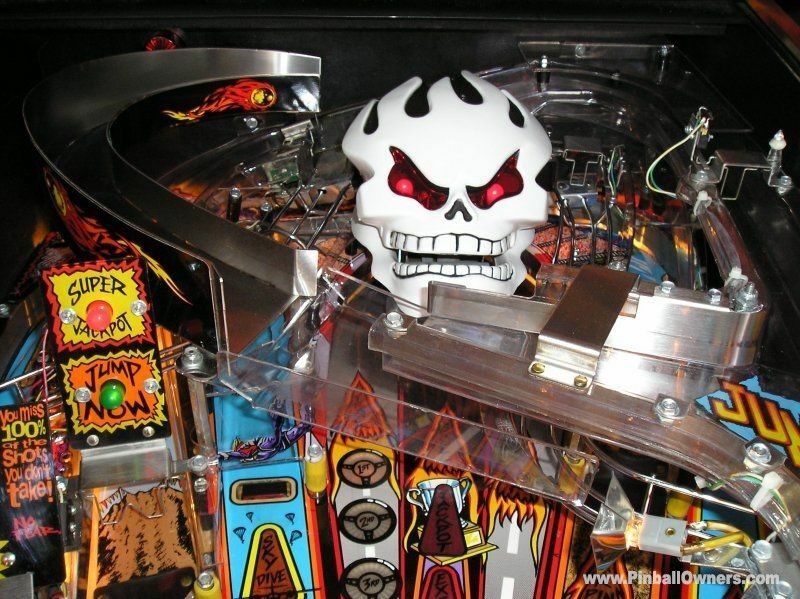 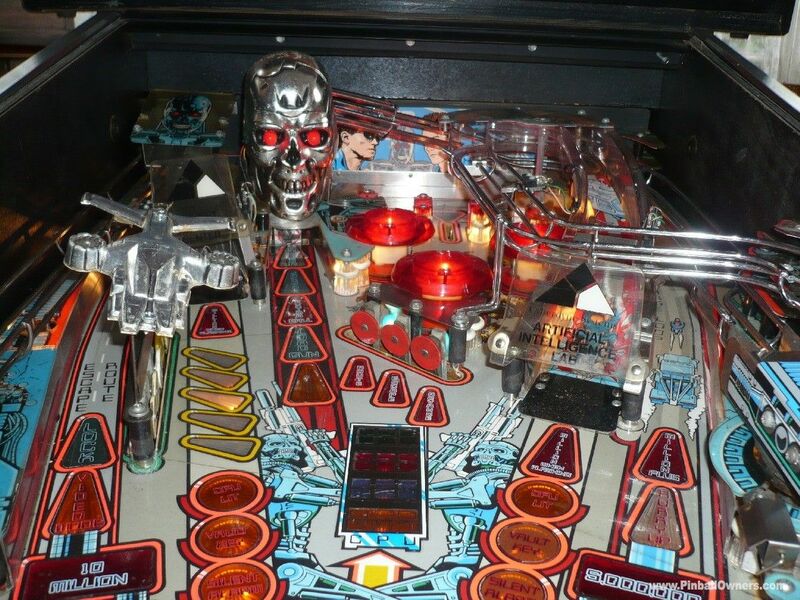 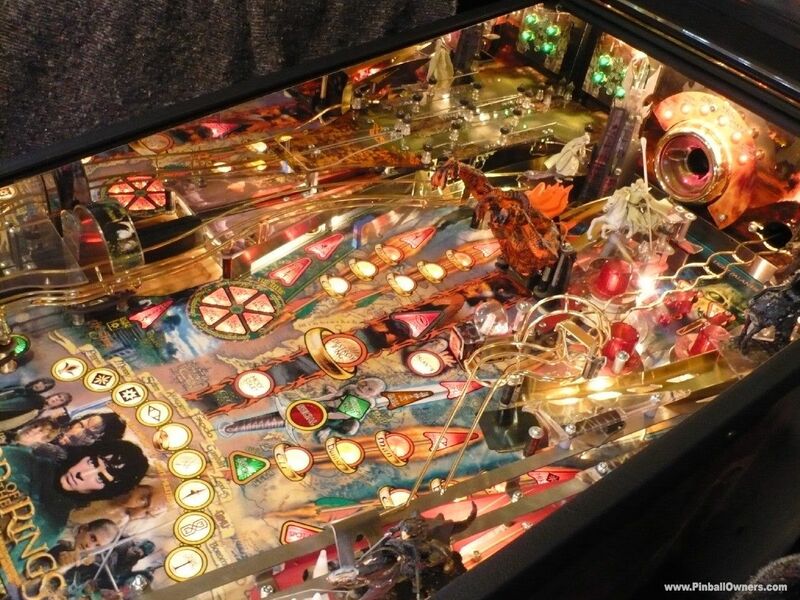 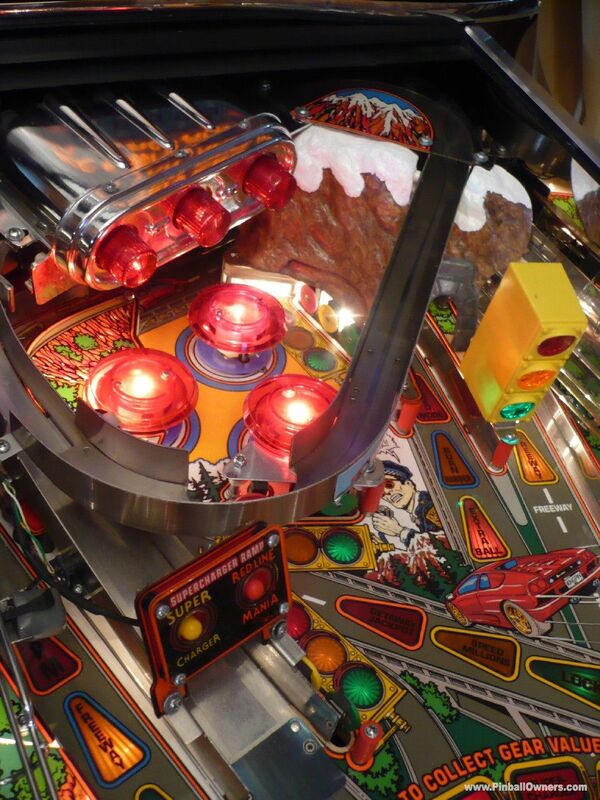 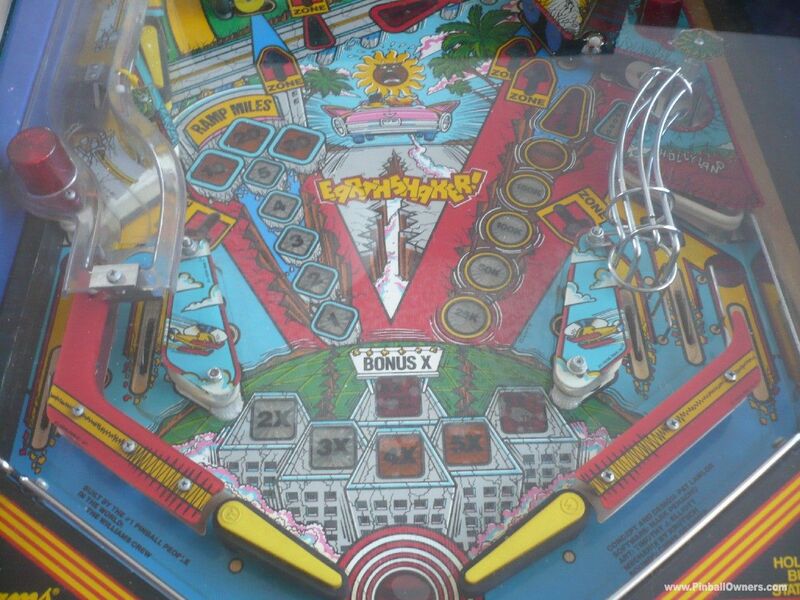 Cosmetically improved by fitting stainless mirror blades which gives the playfield infinite depth. 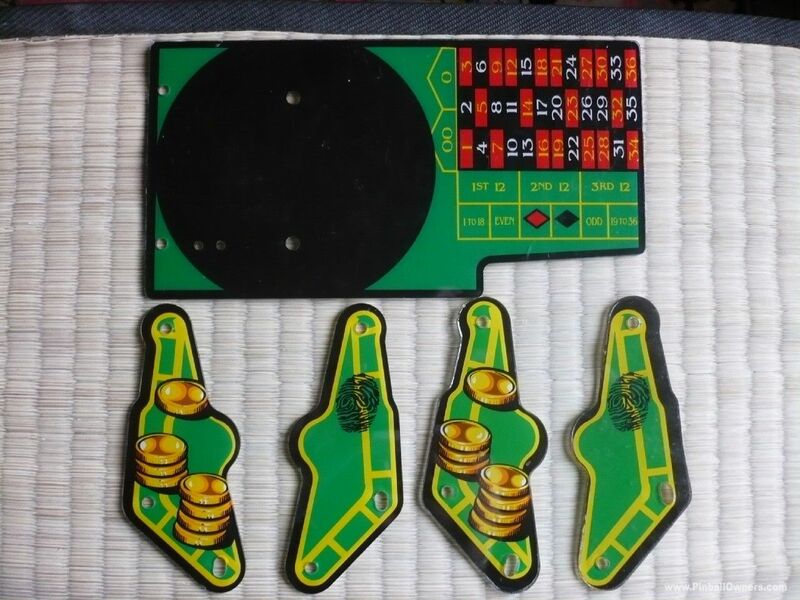 Excellent gameplay with arrow flippers. 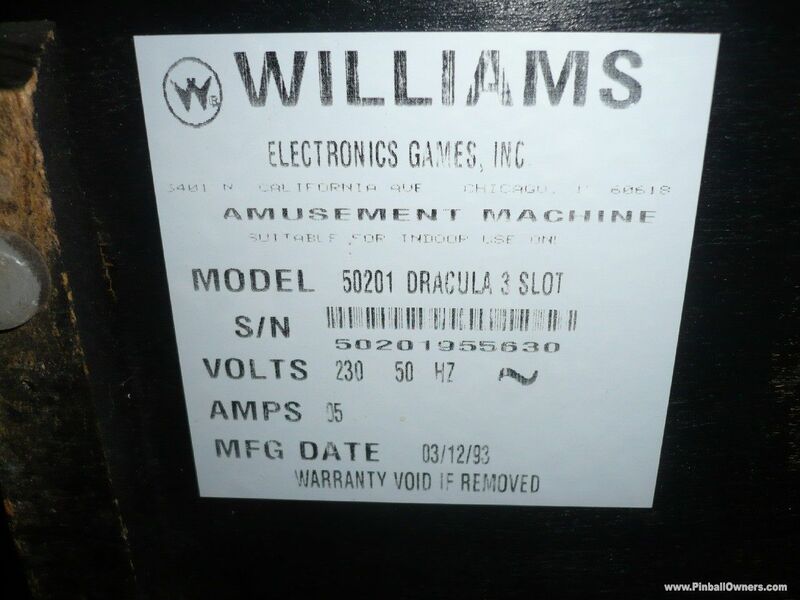 RESERVED. 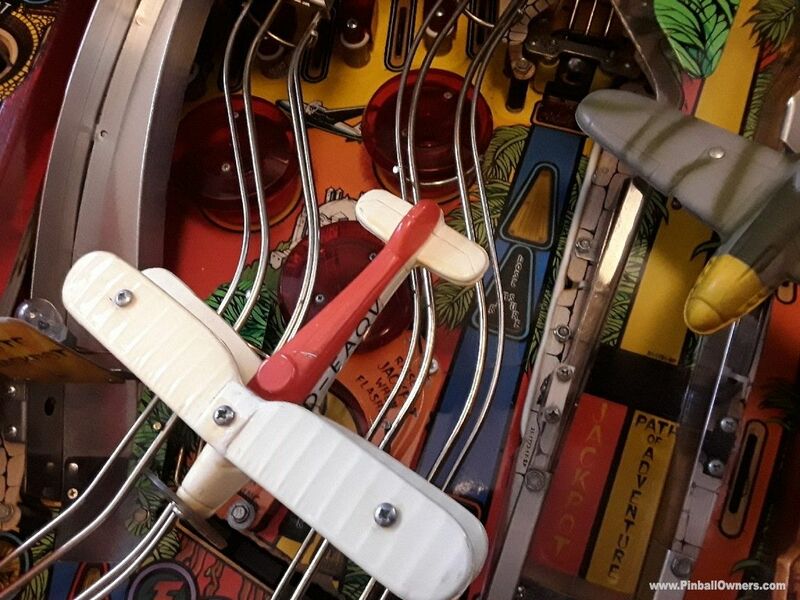 CENTIGRADE 37 Gottlieb (USA) Vendu 1977 (August) good all original wedge head game which has been well maintained over the years. 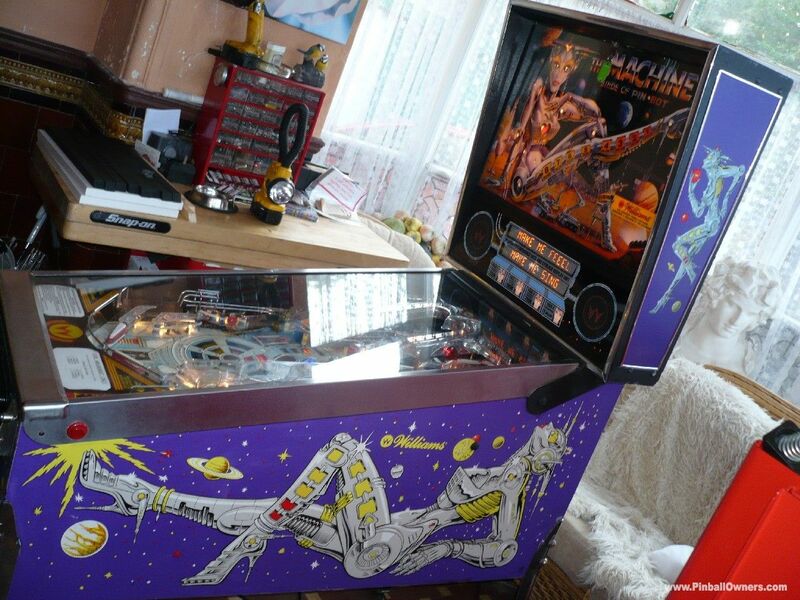 Excellent early space theme with active backglass. 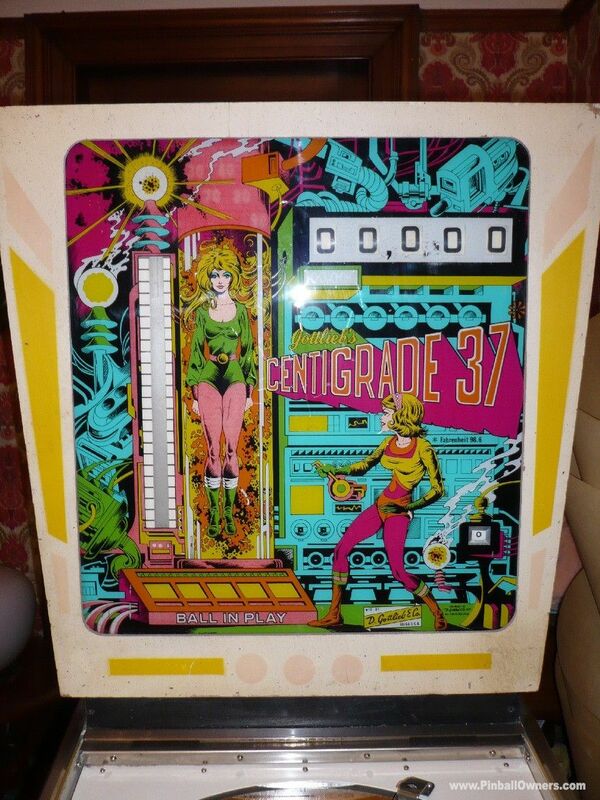 Love the whirrs n clicks and manic xylophone sound effects as you build points and bring the space girl dressed in green to life. 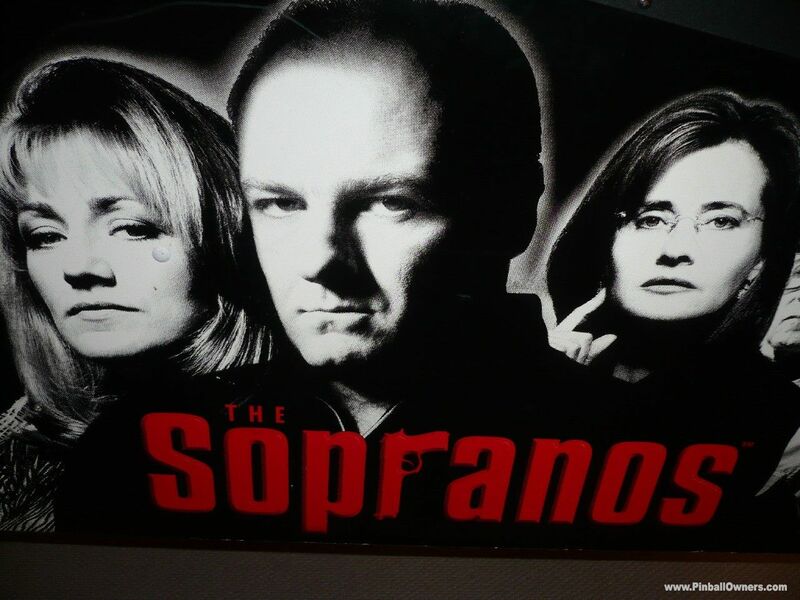 One of the best of its era. 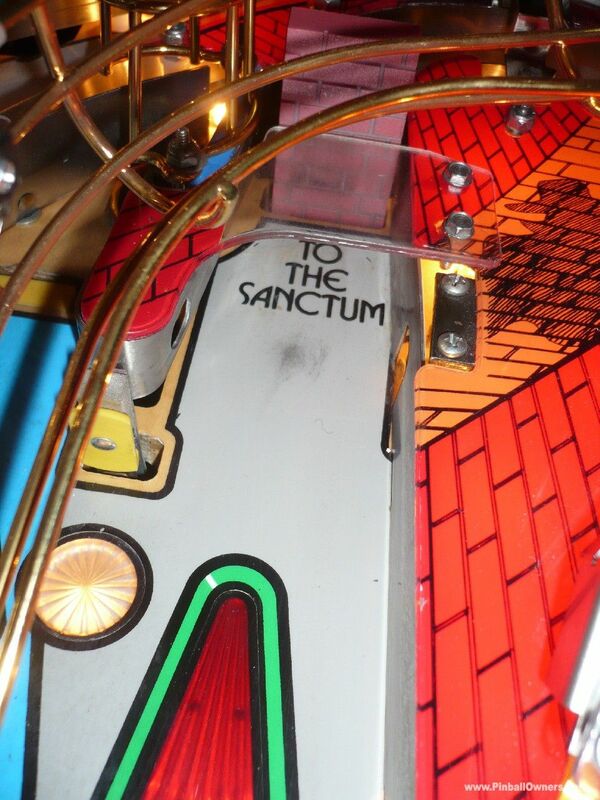 What's in the name? 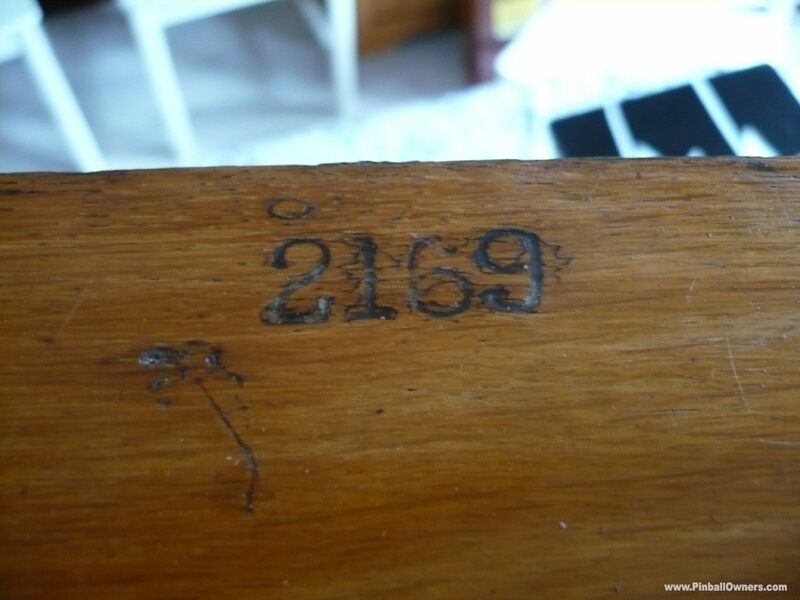 Centigrade 37 is the temperature of blood. 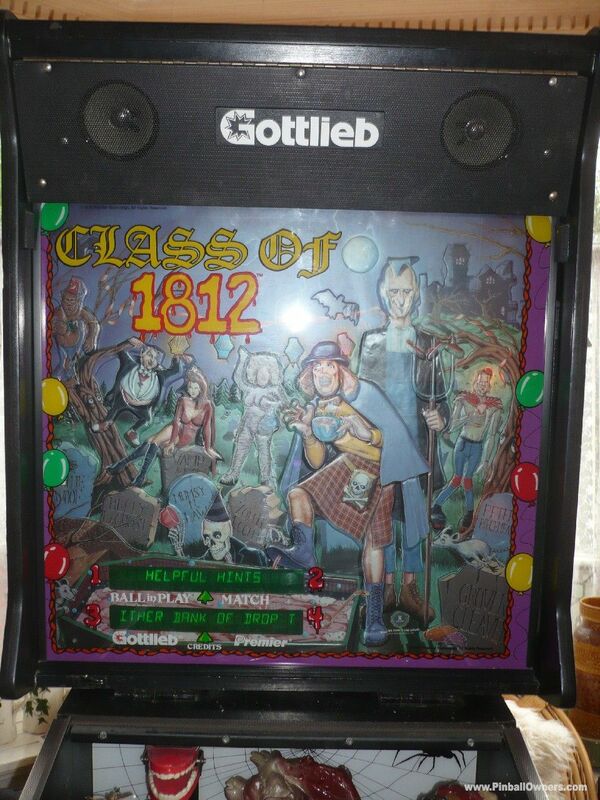 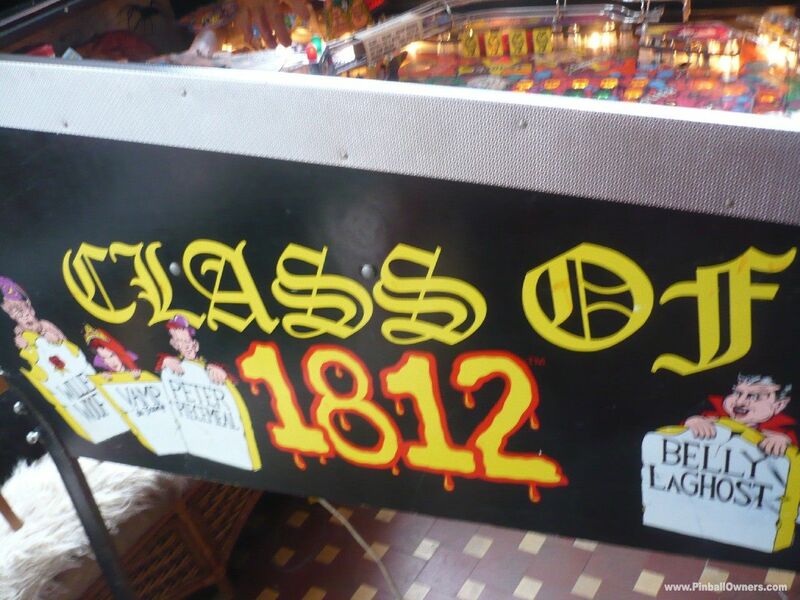 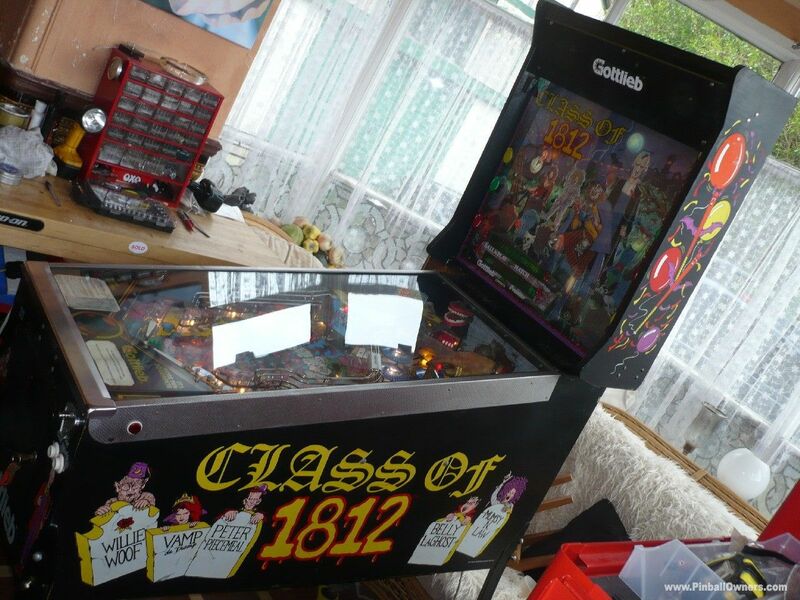 CLASS OF 1812 Gottlieb (USA) Vendu 1991(August) very nice original example plays fast and strong. 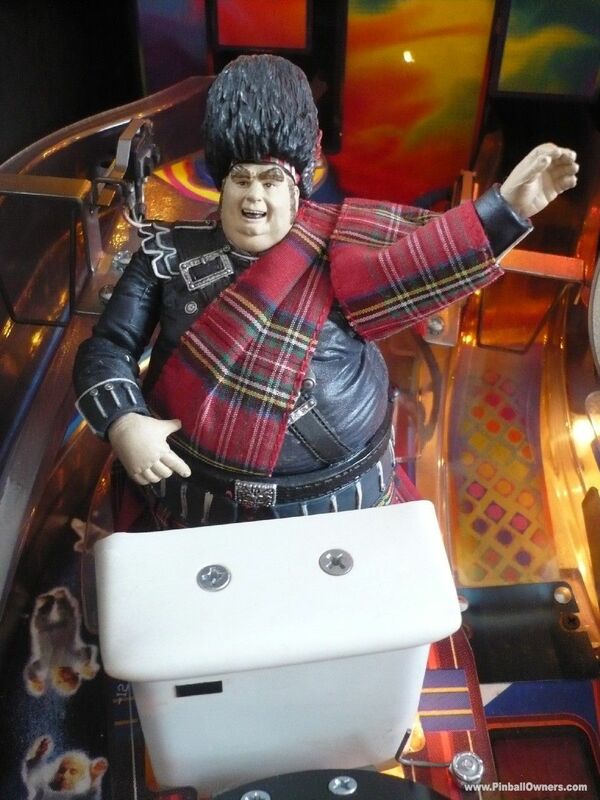 Scottish bagpipe are used to effect. 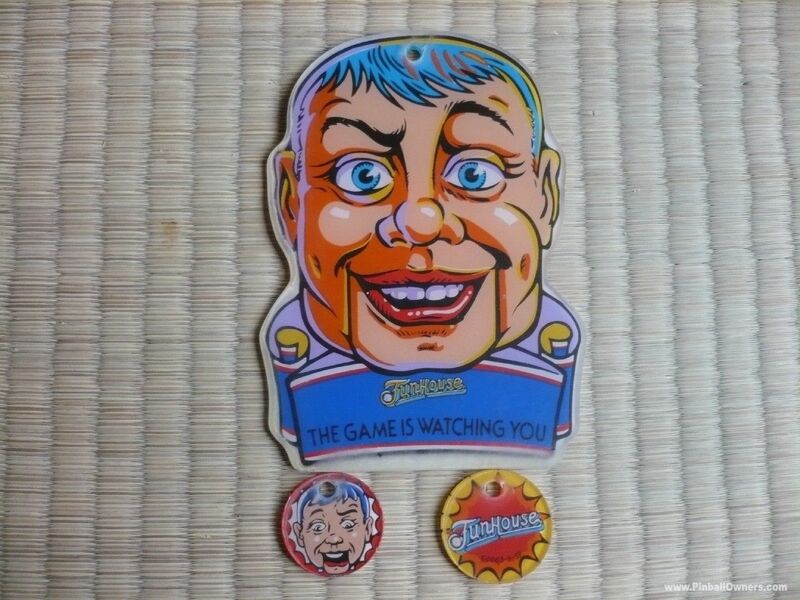 This was Gottliebs unsuccessfully attempt to take sales from Bally's blockbuster TAF. 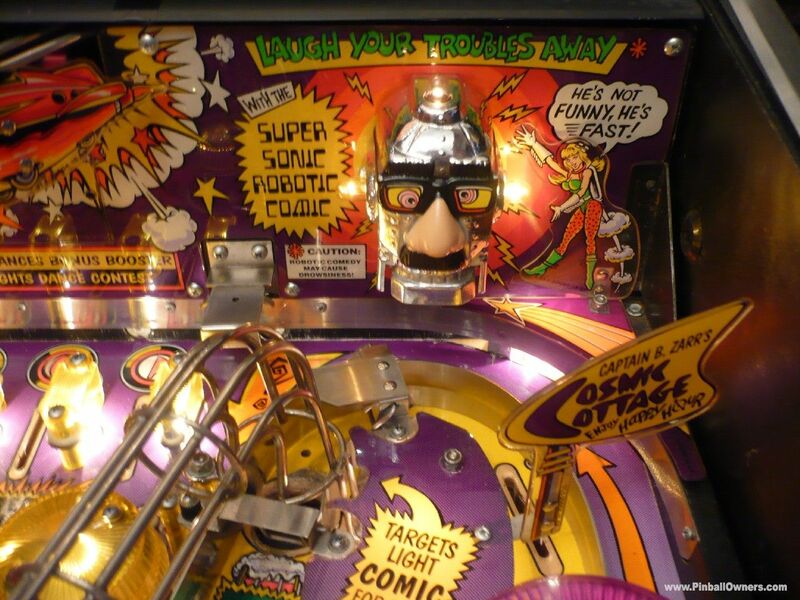 Has amazing sound effects and vocals. 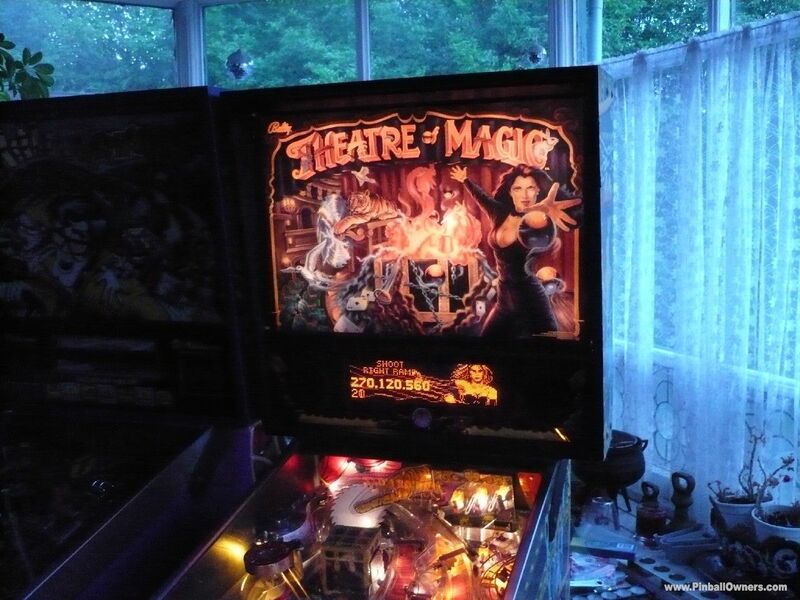 Very effective bright 3D backglass and excellent light show. 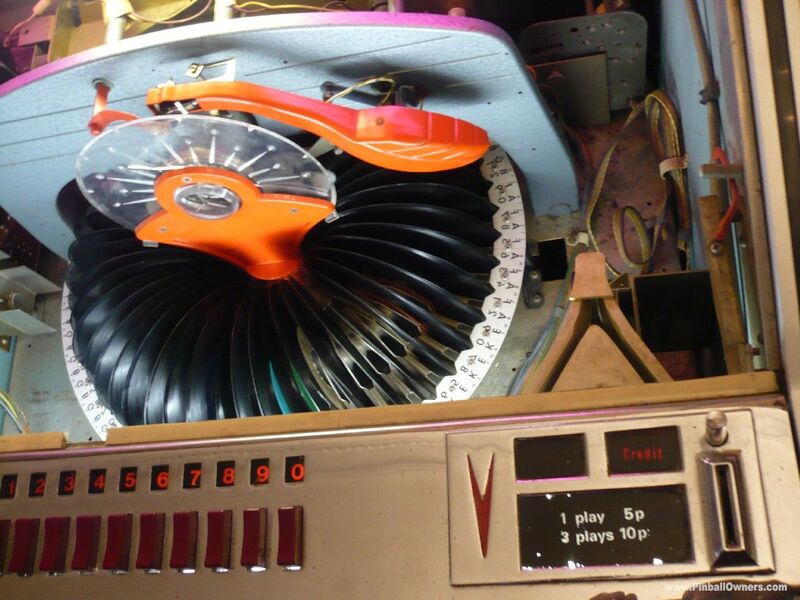 Synchronised beating heart and talking chattering teeth feature with bright-green Alpha-Numeric display. 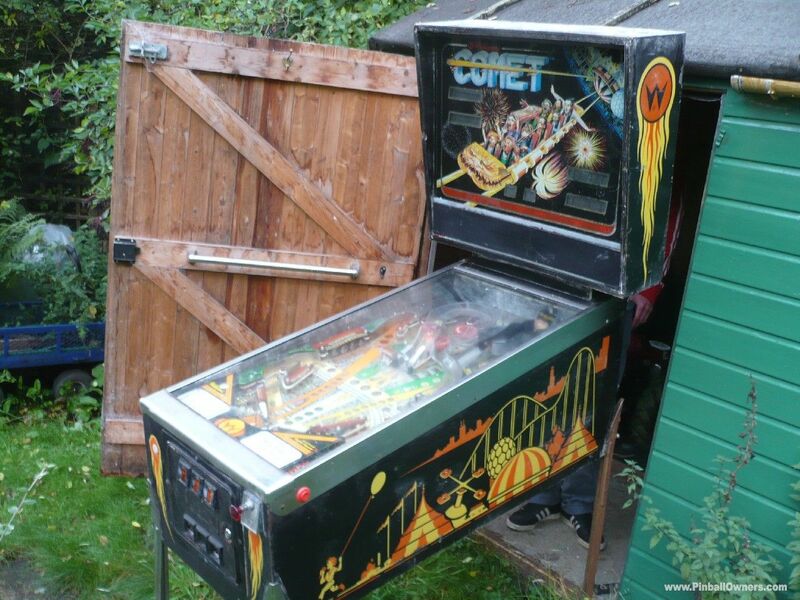 COMET Williams (USA) Vendu Complete machine as of photos. 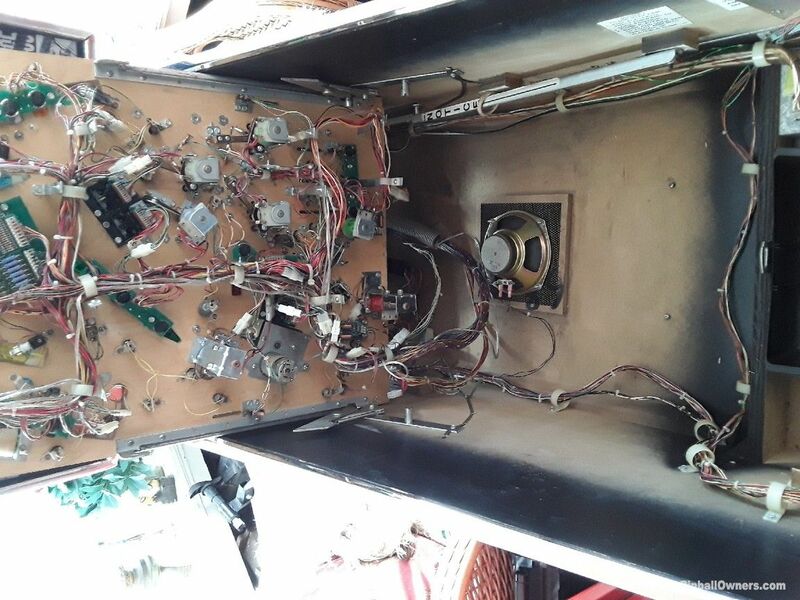 All electrics, Boards and displays to be tested prior power-up. 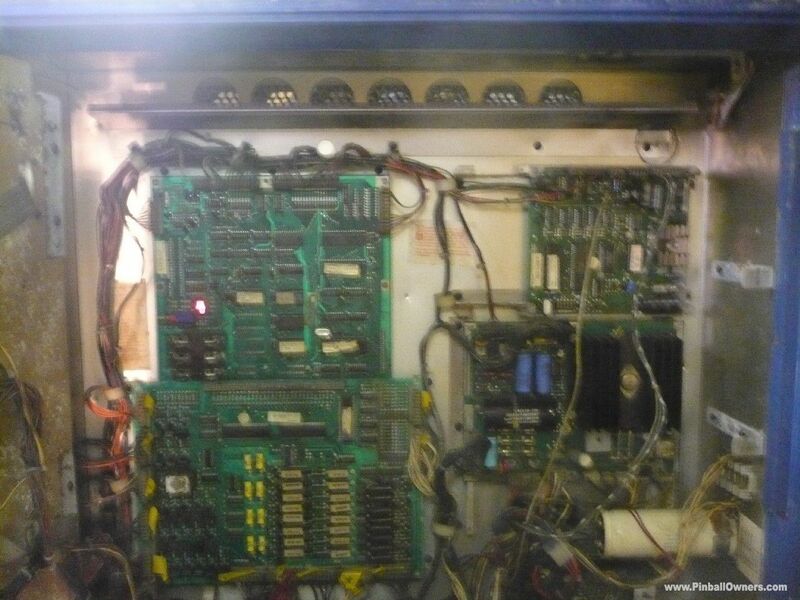 Working before long term store. 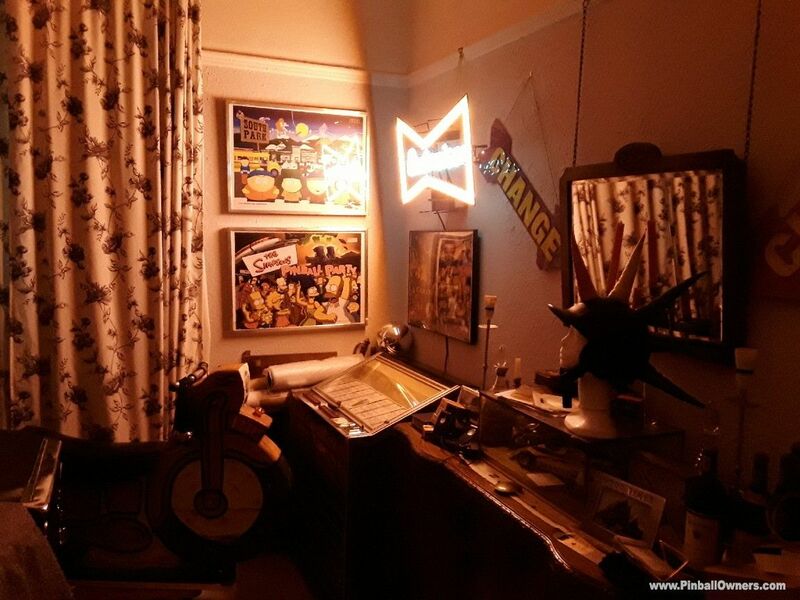 Great potential for Refurbishment?..... 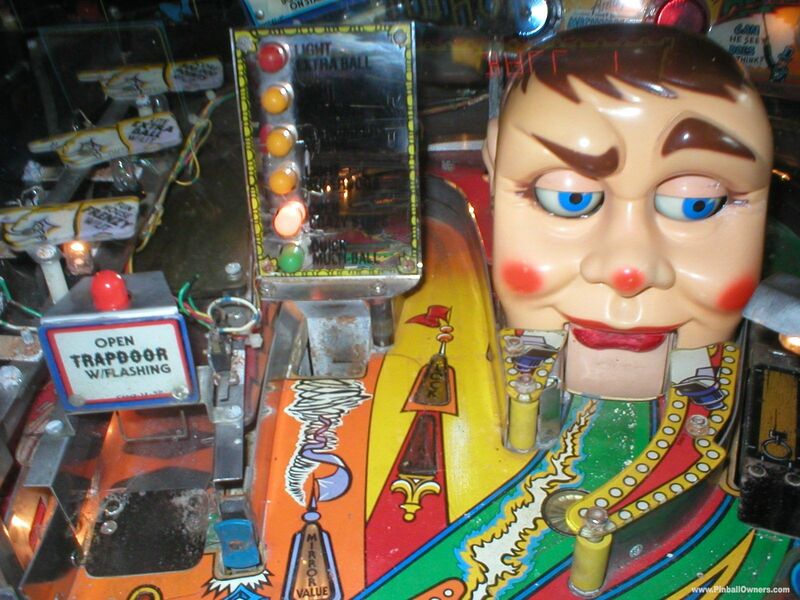 pampering and general film star makeover. 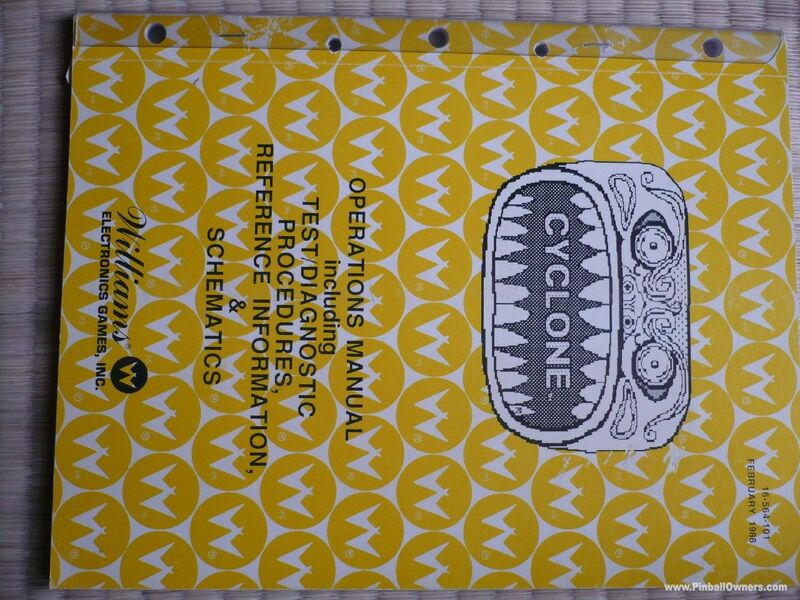 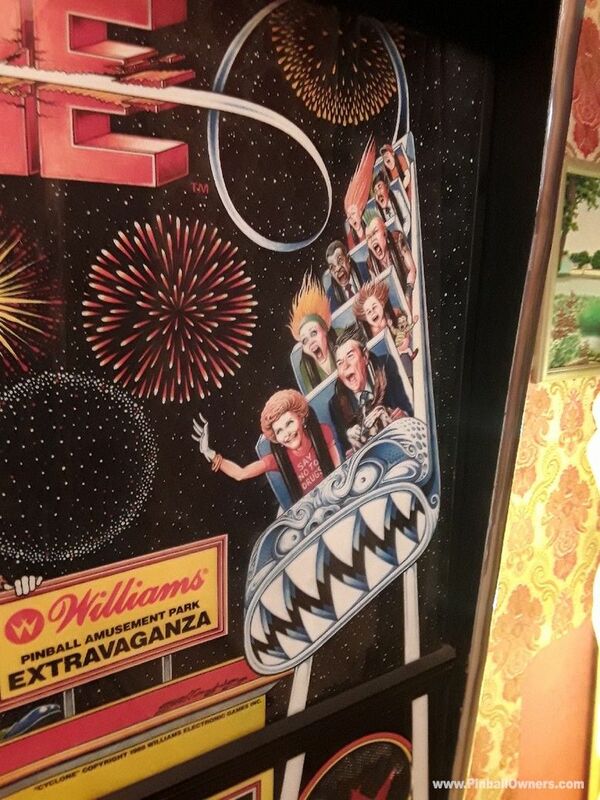 CYCLONE Williams (USA) Vendu 1988 (February) The back glass has President Ronald and smiling Nancy Reagan enjoying the roller-coaster ride. 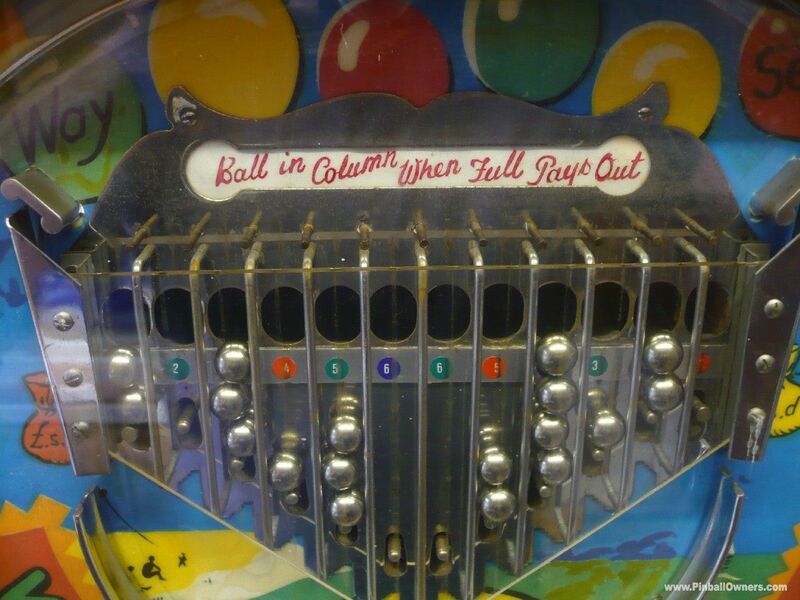 Plays fast and strong without fault as the Clowns flipper fingers work their magic on the silver ball. 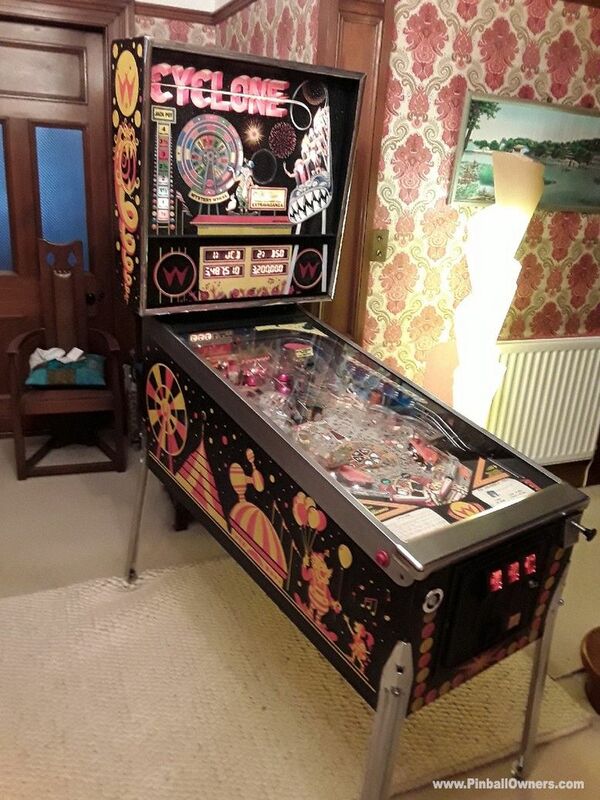 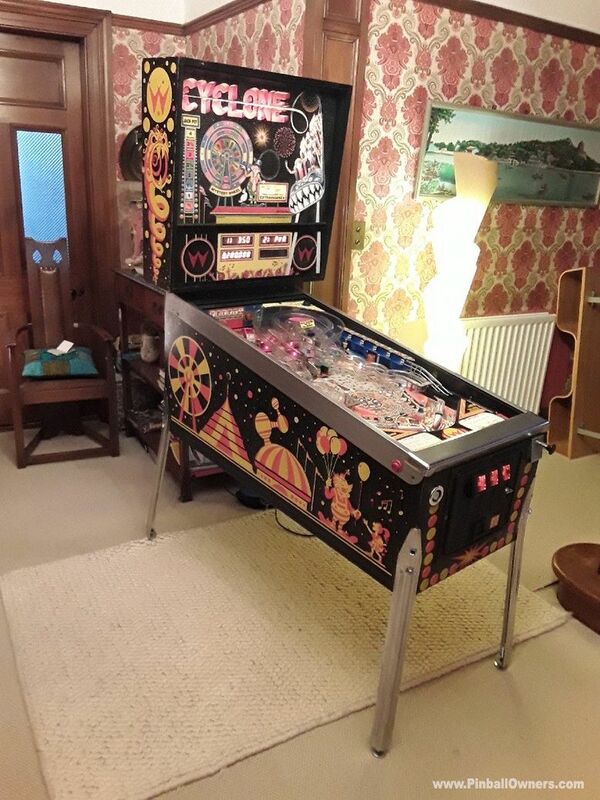 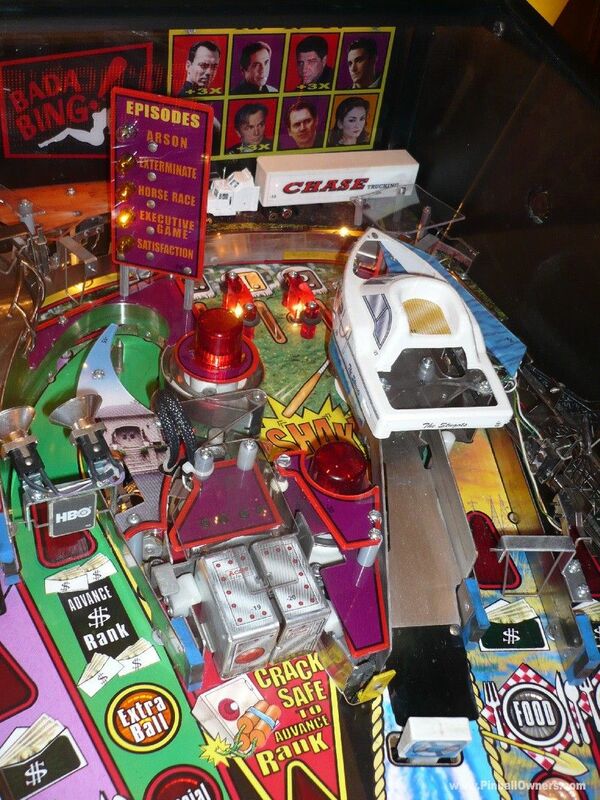 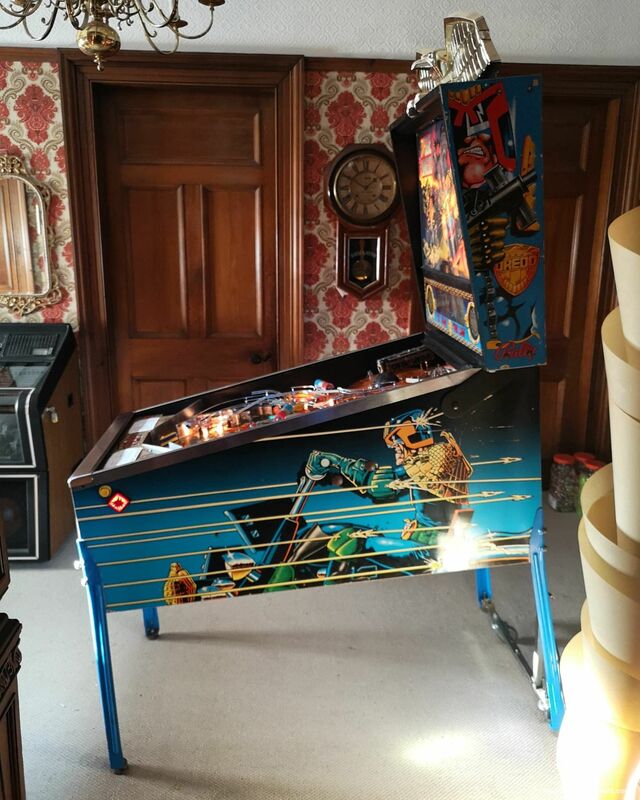 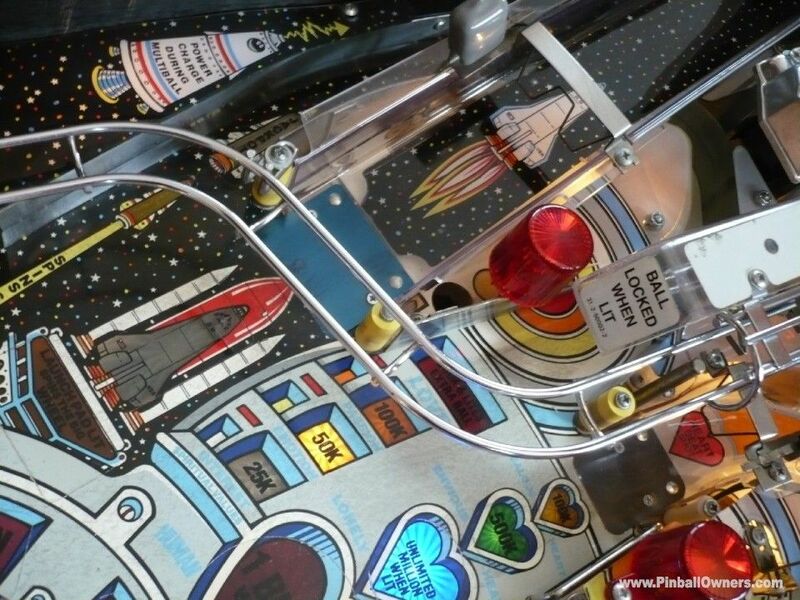 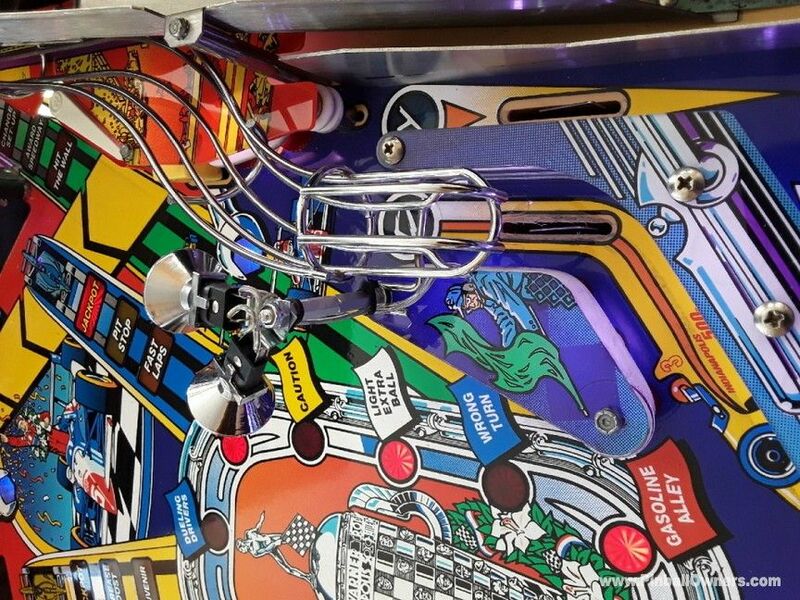 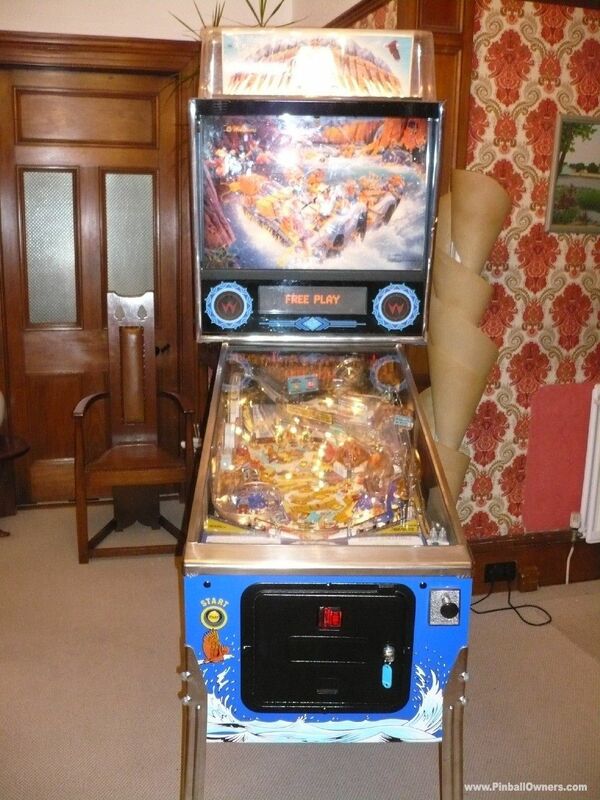 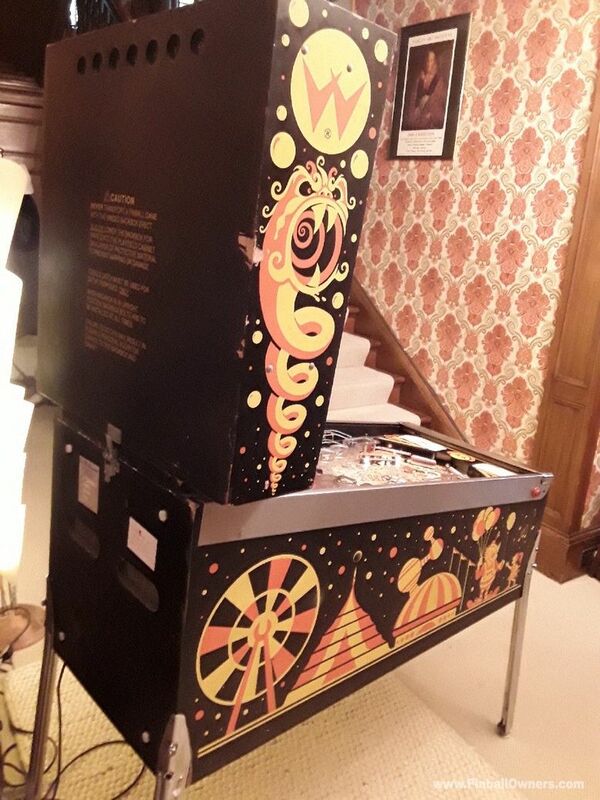 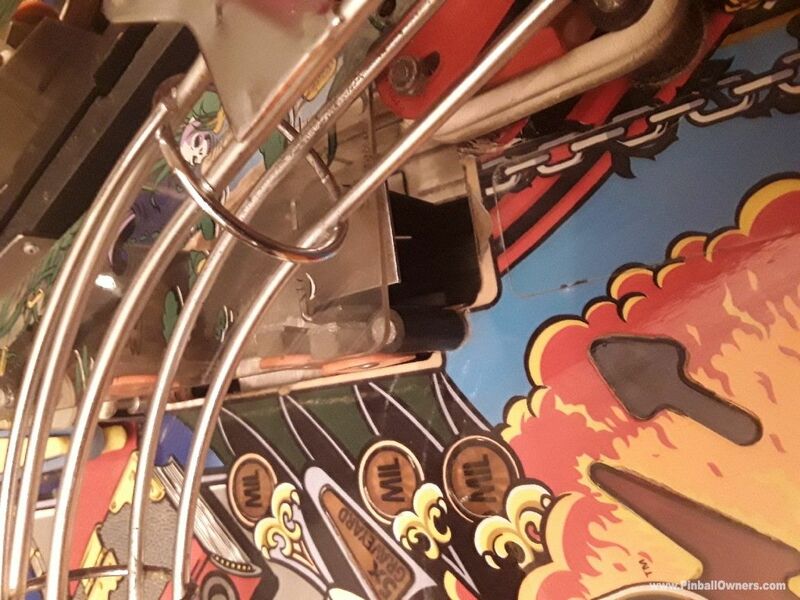 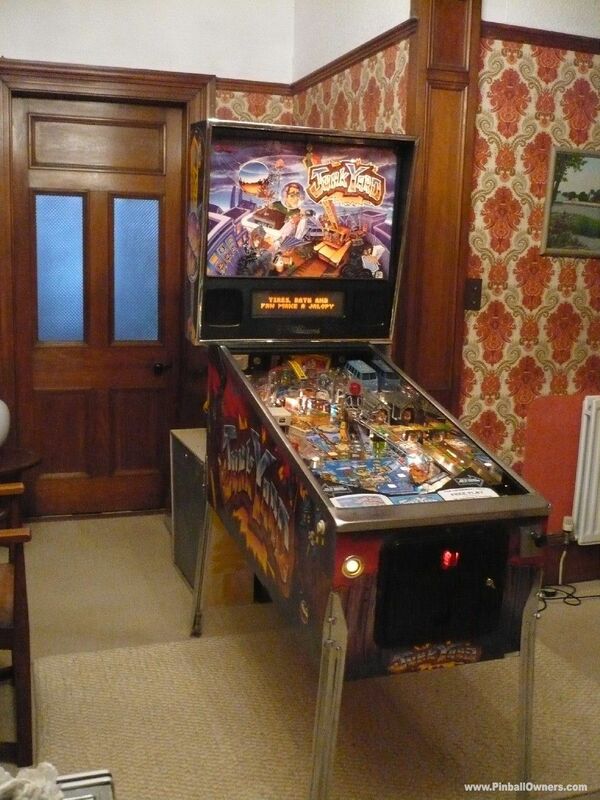 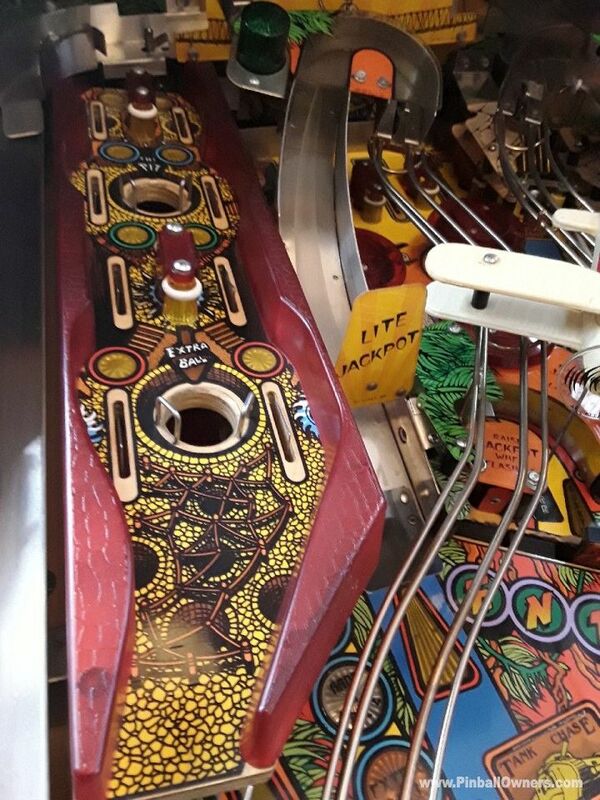 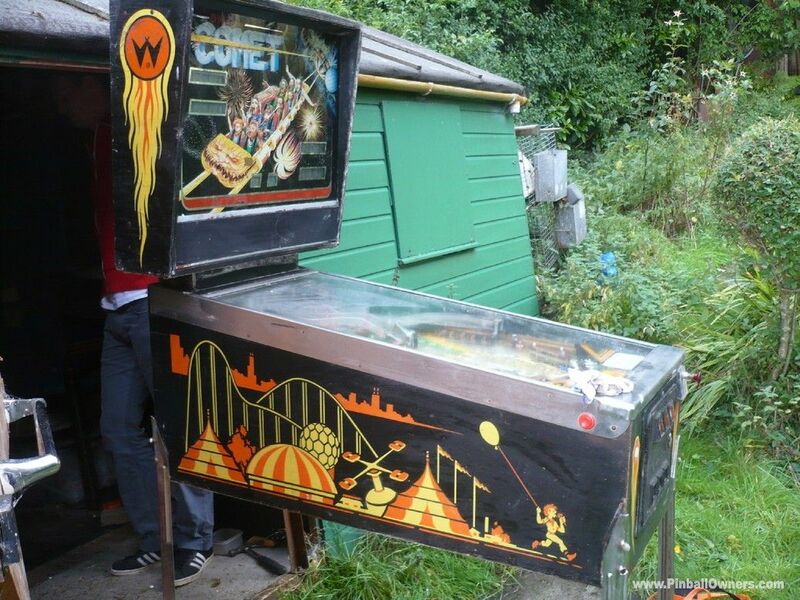 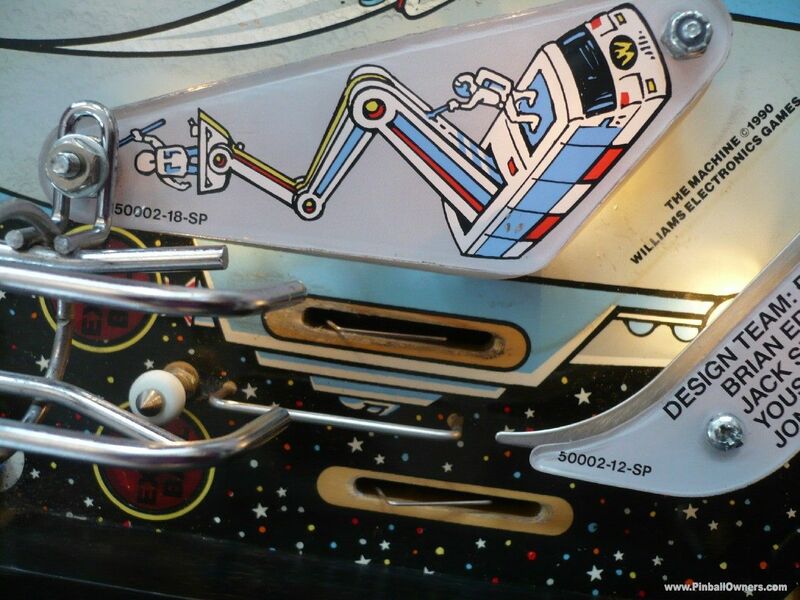 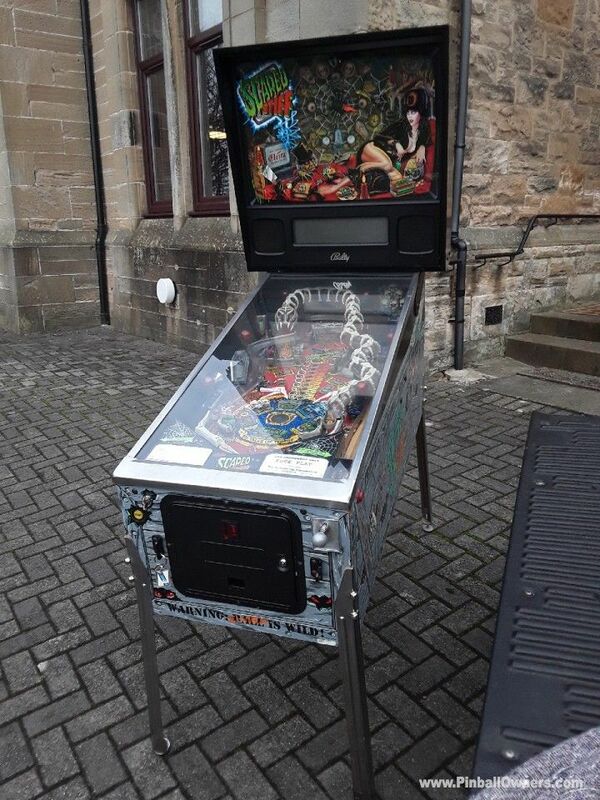 The second in the Williams Carnival theme trilogy (Comet, Cyclone, Hurricane) Has had all four bright brand new displays fitted .all ramps and plastics correct, ...lovely low budget pinball machine, ..... they certainly knew how to make a durable pinball back then. 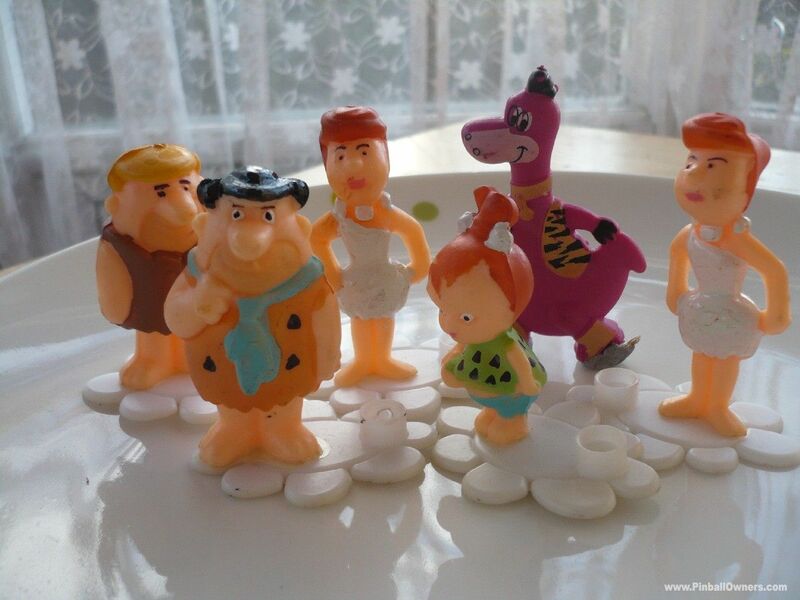 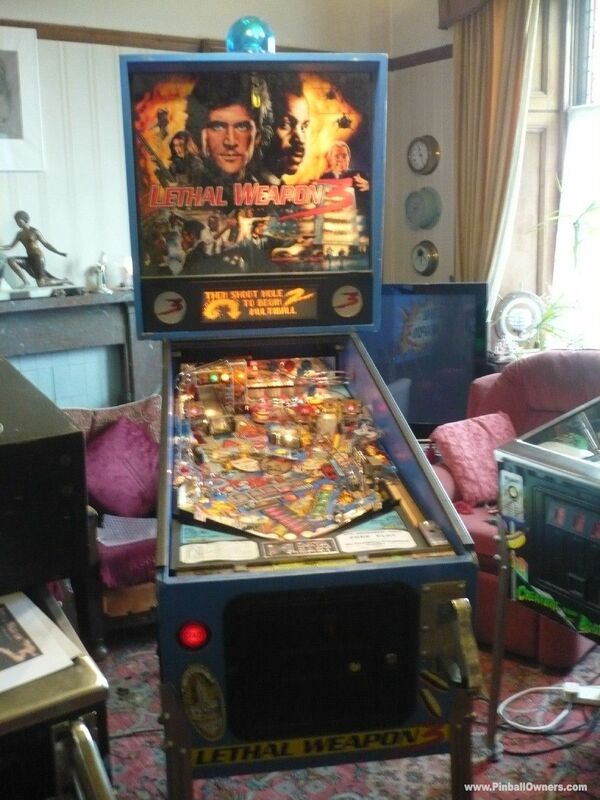 Can it really be 30 Years old !! 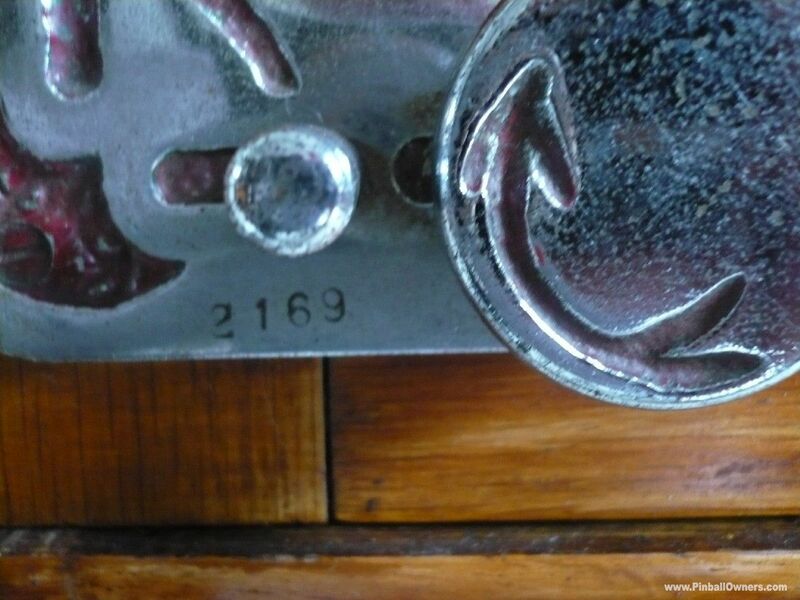 RESERVED to collect. 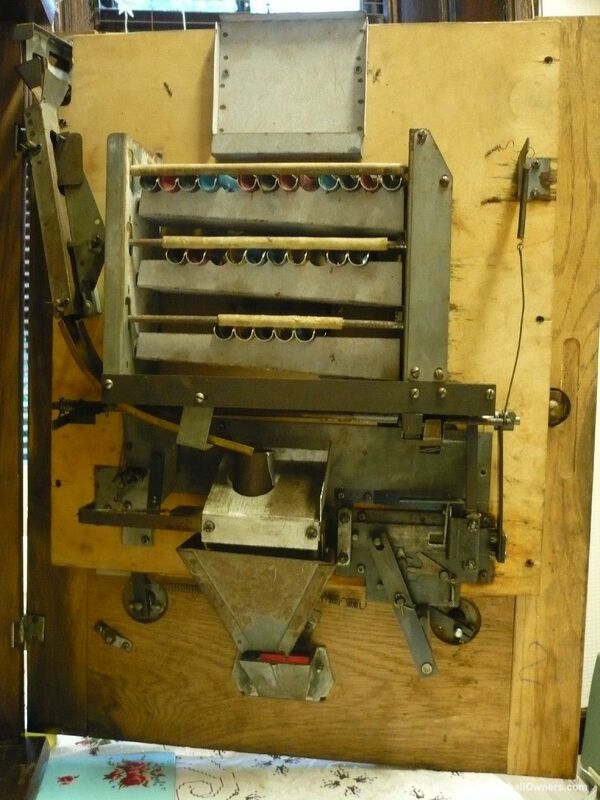 EARTHSHAKER Williams (USA) Vendu 1989 (March) An early Pat Lawlor design pin with the first of the Shaker motors. 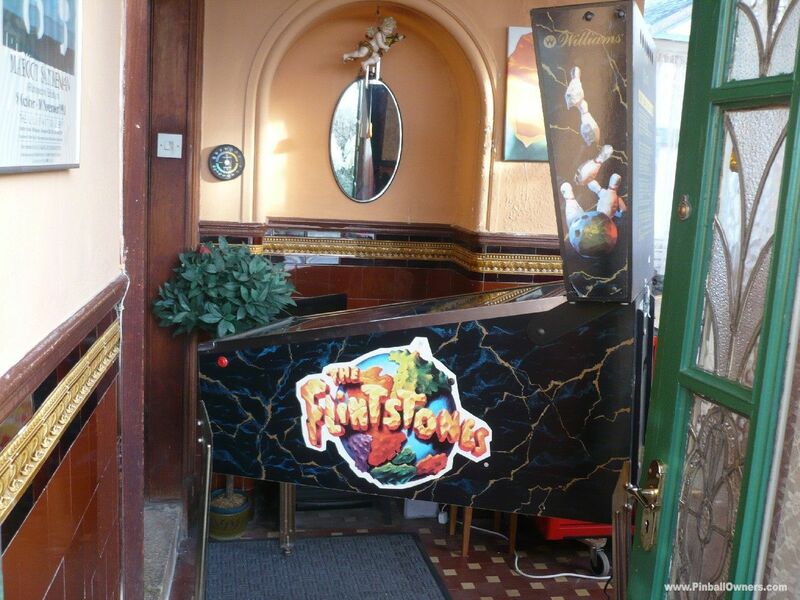 Excellent well looked after example with crisp colours. 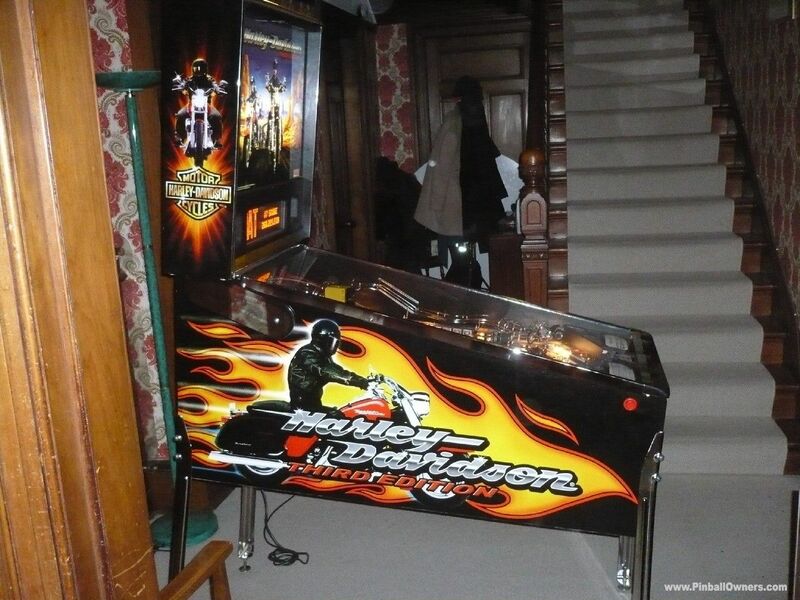 Plays strong and fast. 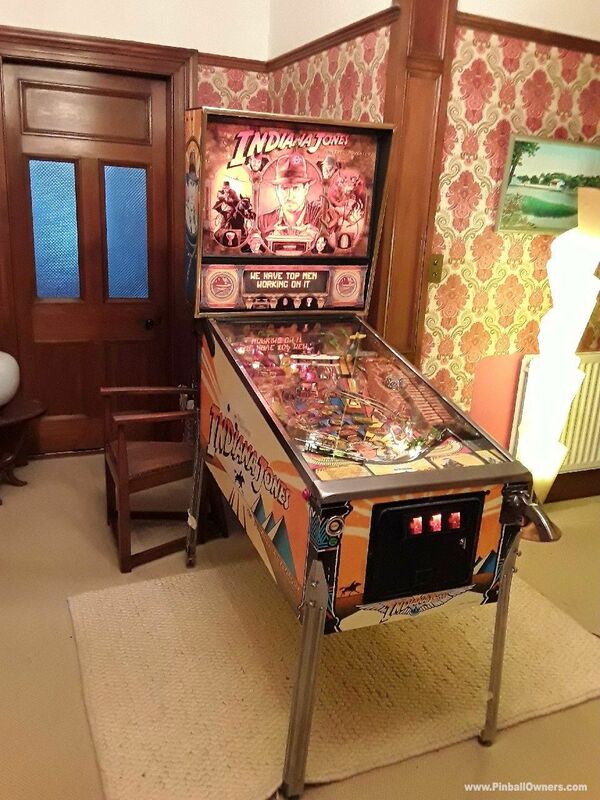 They don't come much nicer. 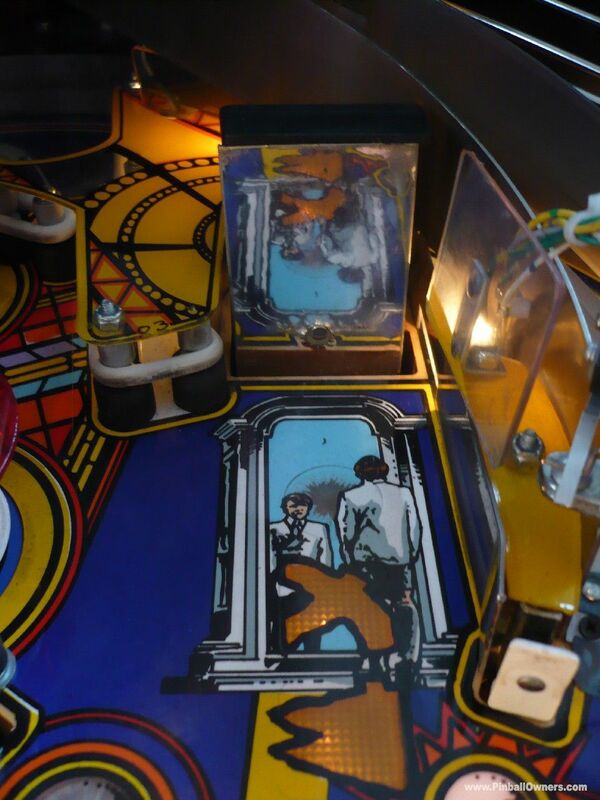 The last of the true mirror glass translites. 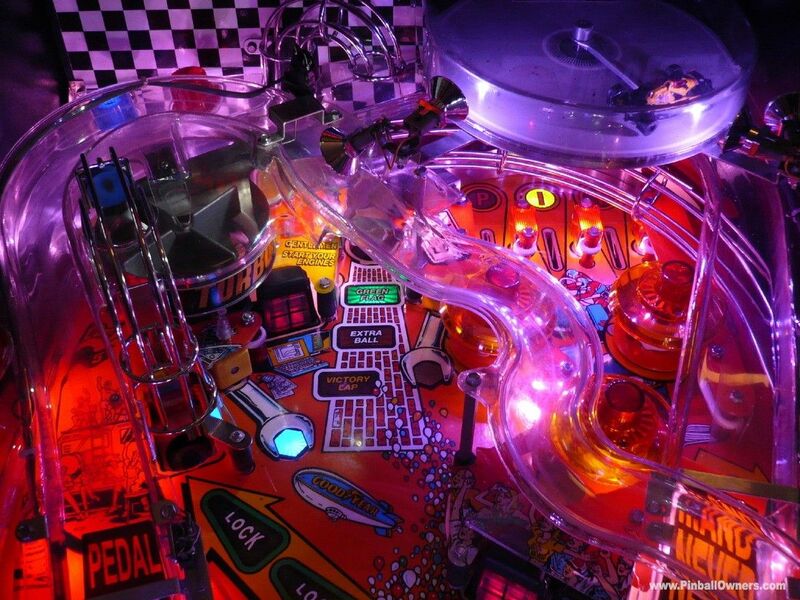 Great theme, smooth gameplay, and catchy music which you will find yourself whistling hours later. 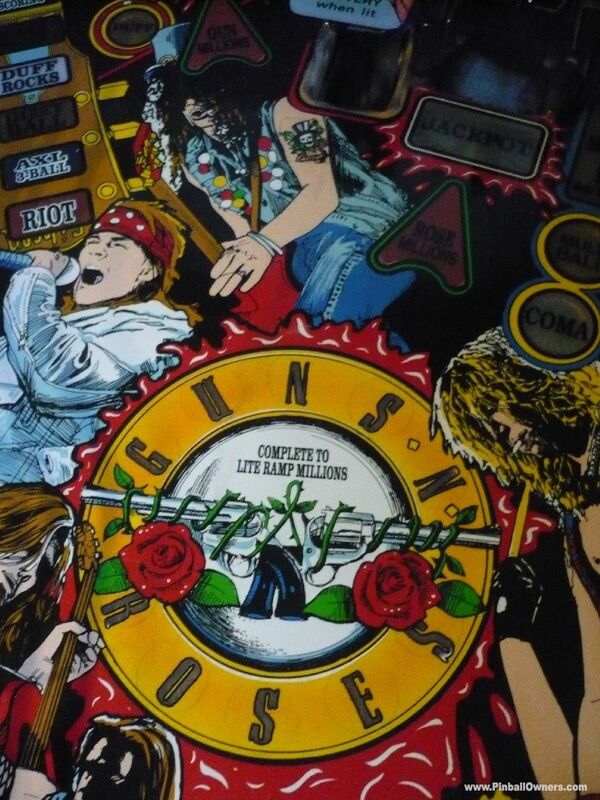 GUNS N' ROSES Data East (USA) Vendu 1994 This pin has been well maintained for all its working life. 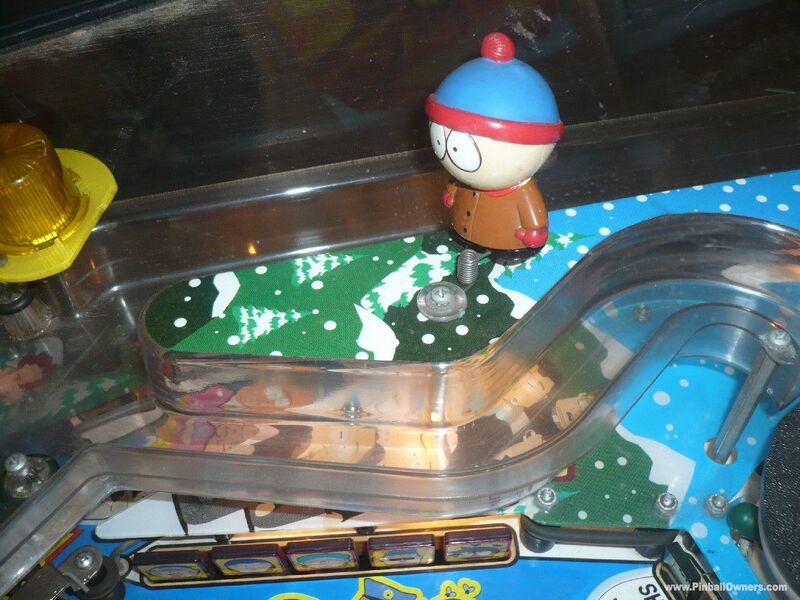 The play-field is excellent for its years. 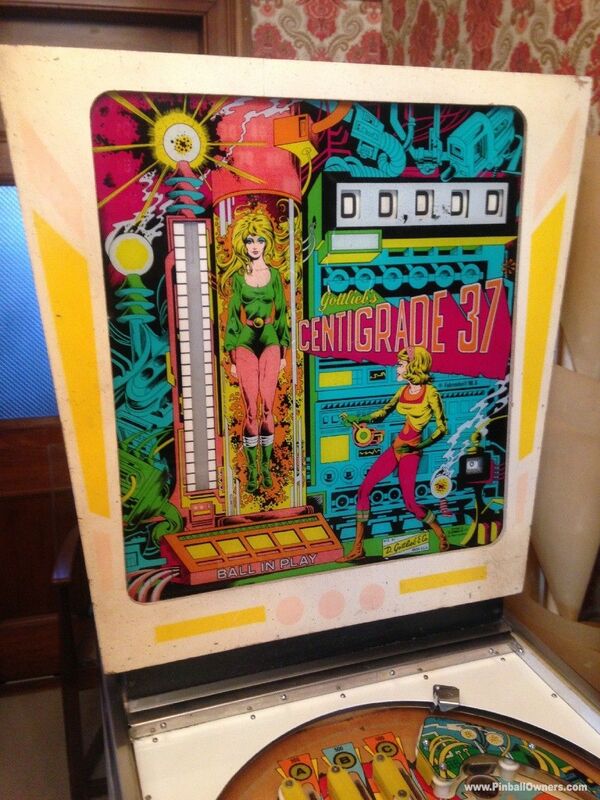 The cabinet is screen printed not decals. 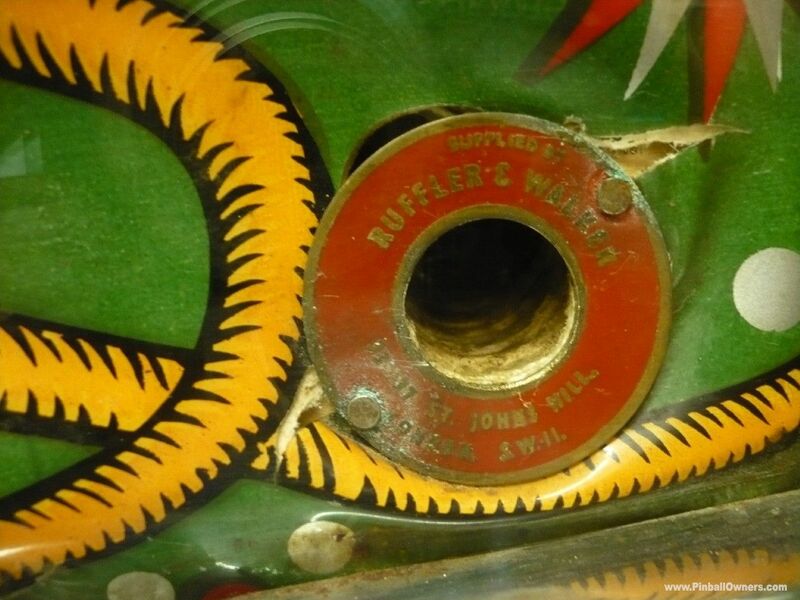 The scoop hole has moderate wear which will be covered by cliffy. 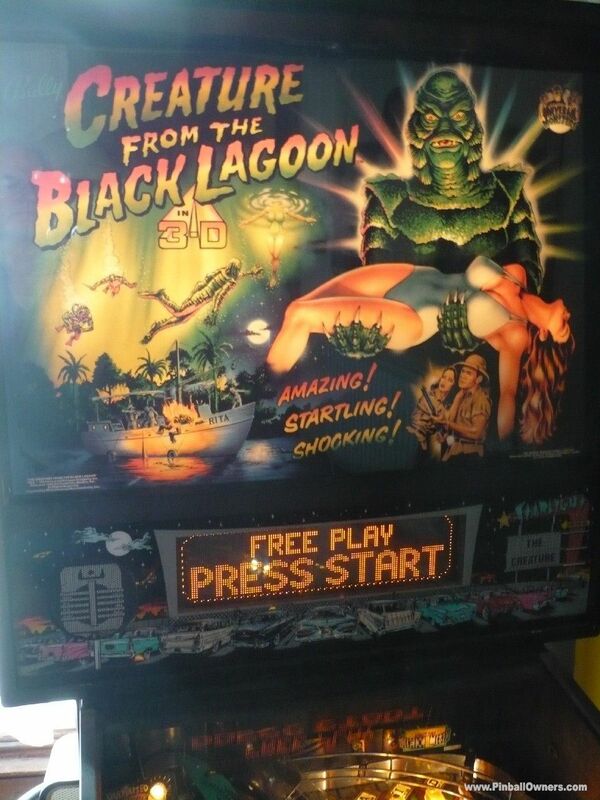 Plays as it should. 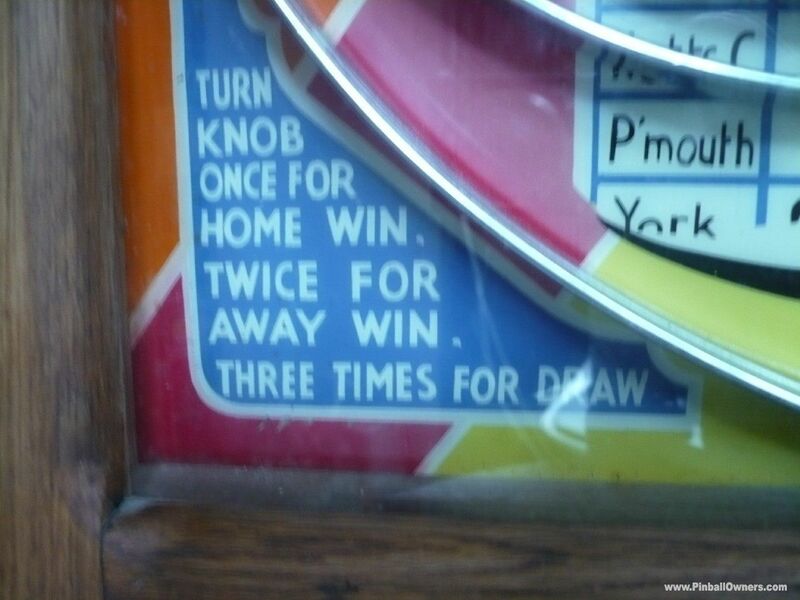 All three magnets are correct and gives a memorable 6 ball multiball. 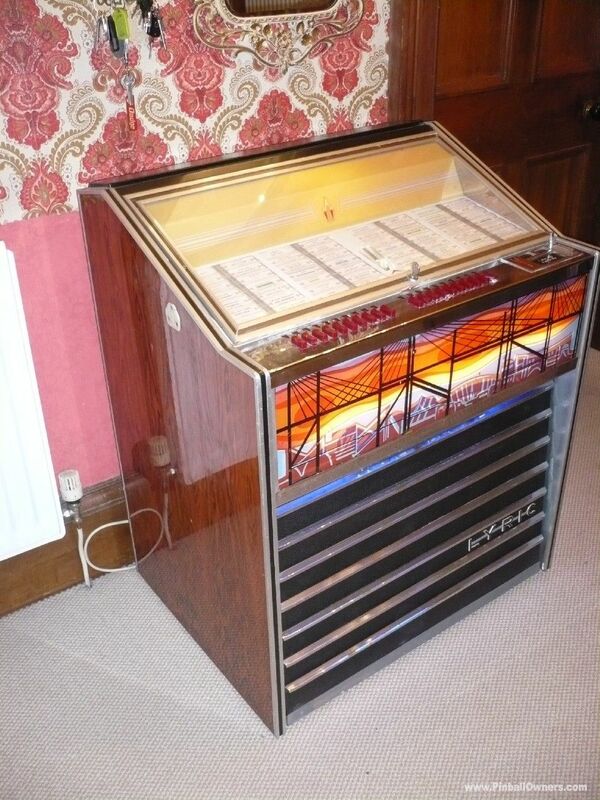 A really nice honest original one.. Crank-up the VOLUME on a BSMT2000...... 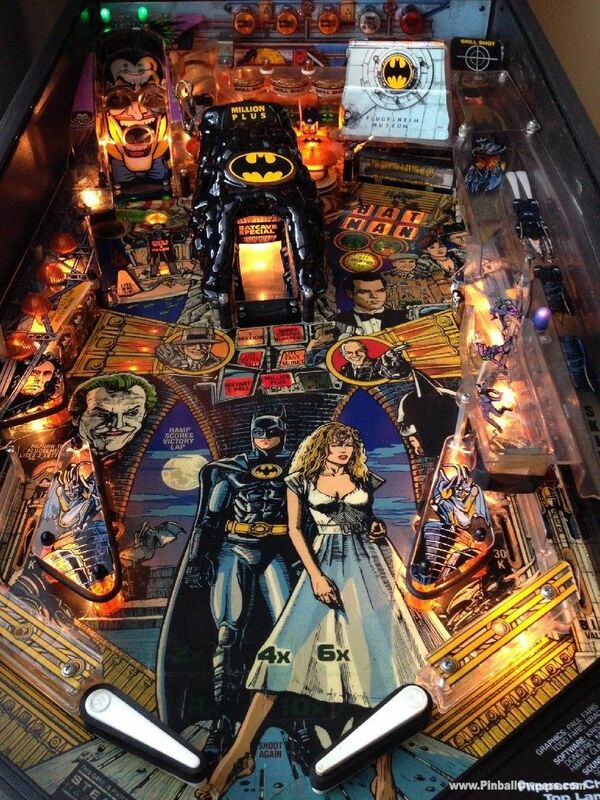 AWSOME!! 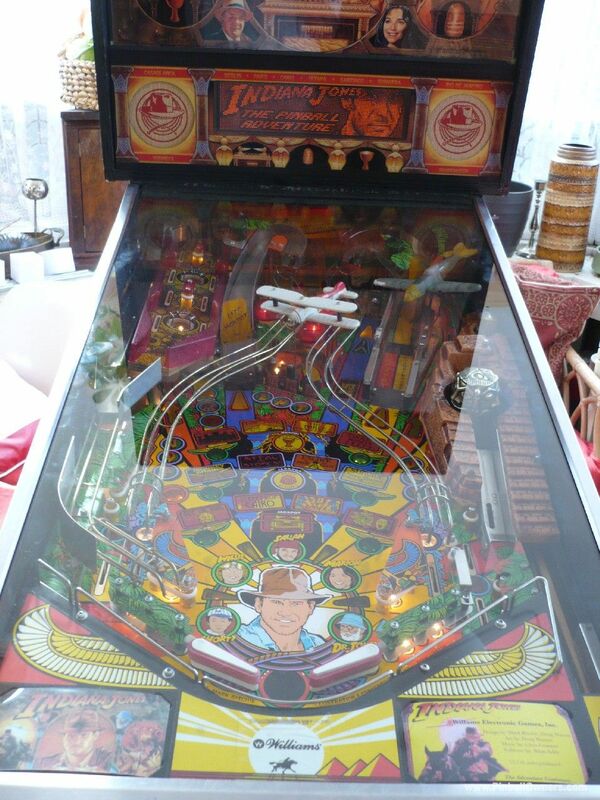 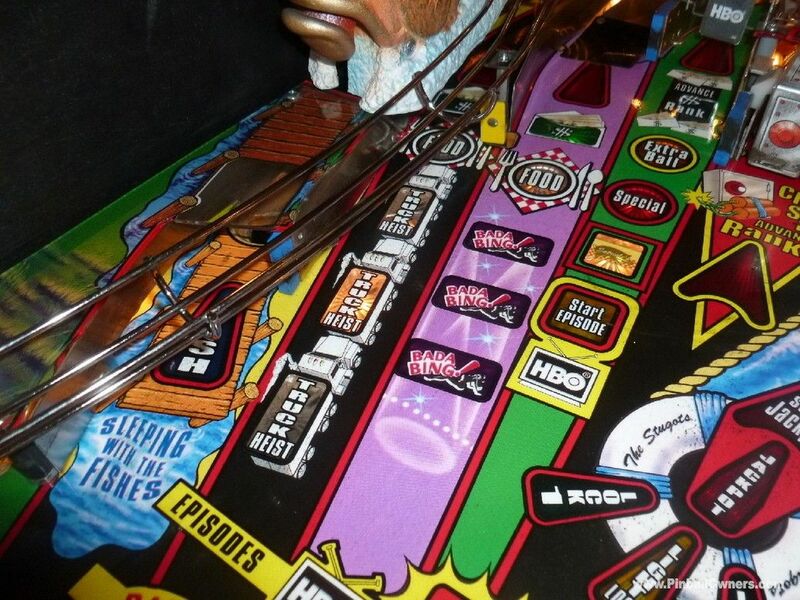 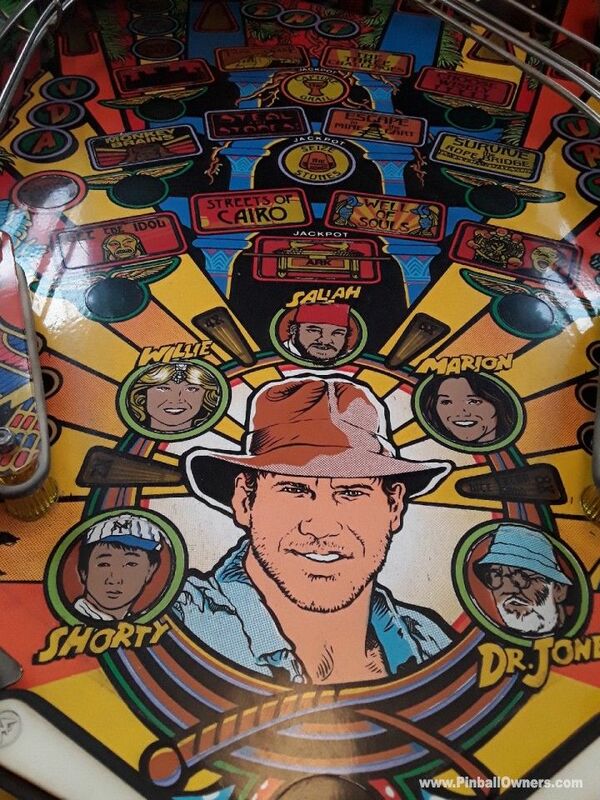 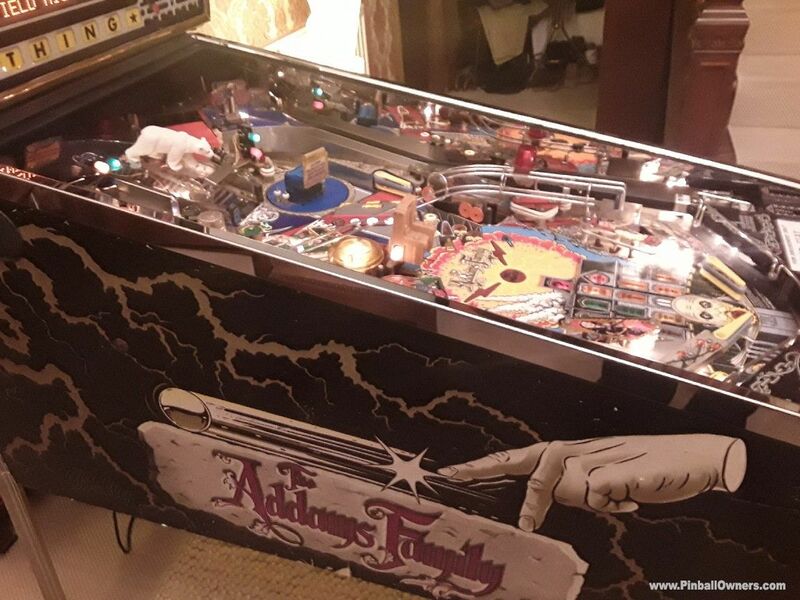 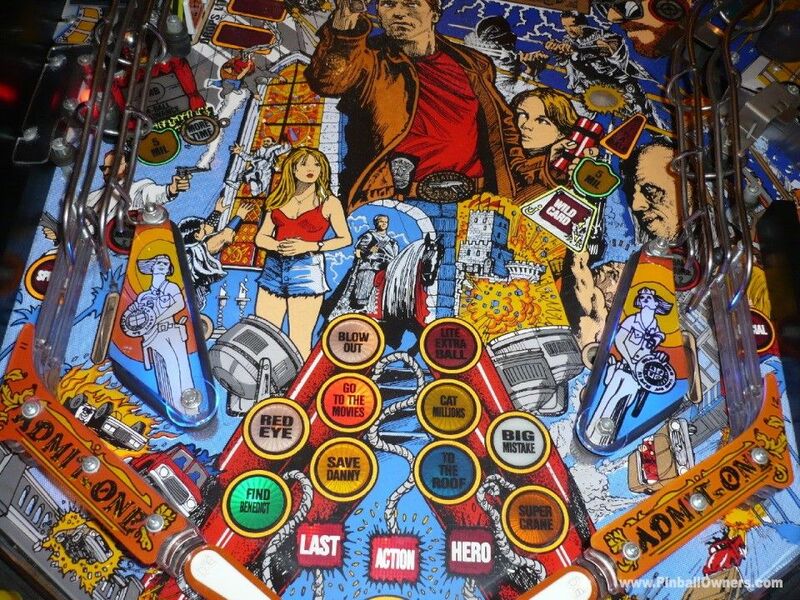 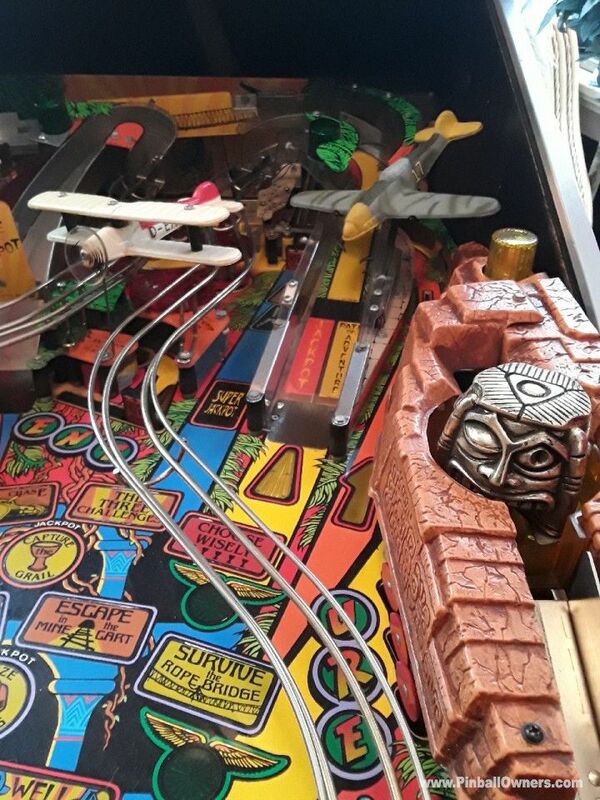 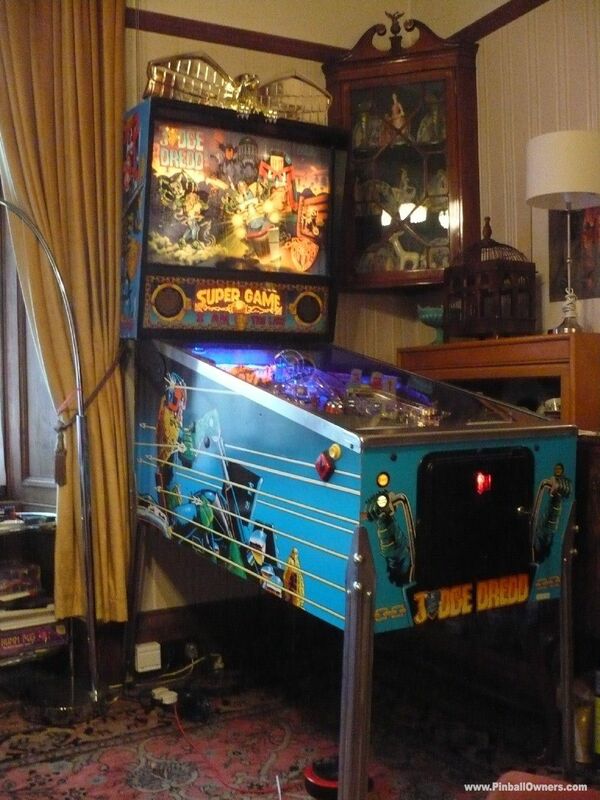 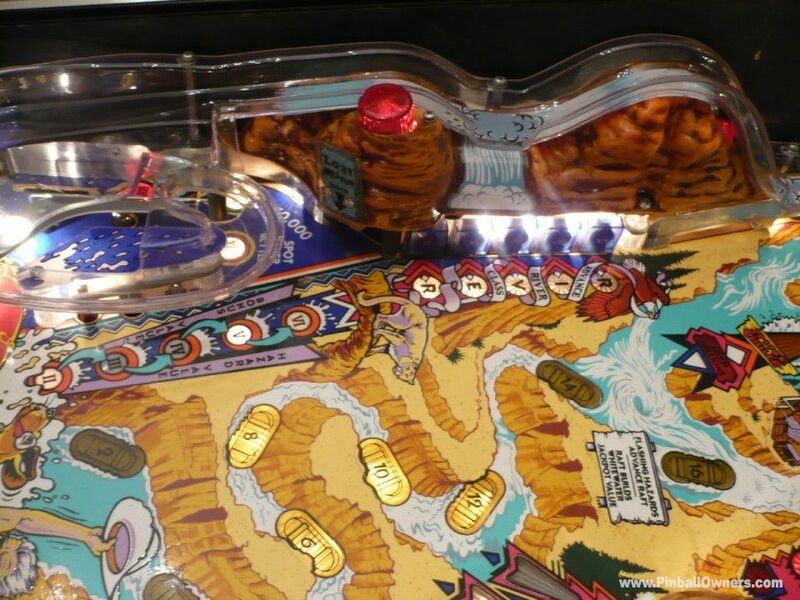 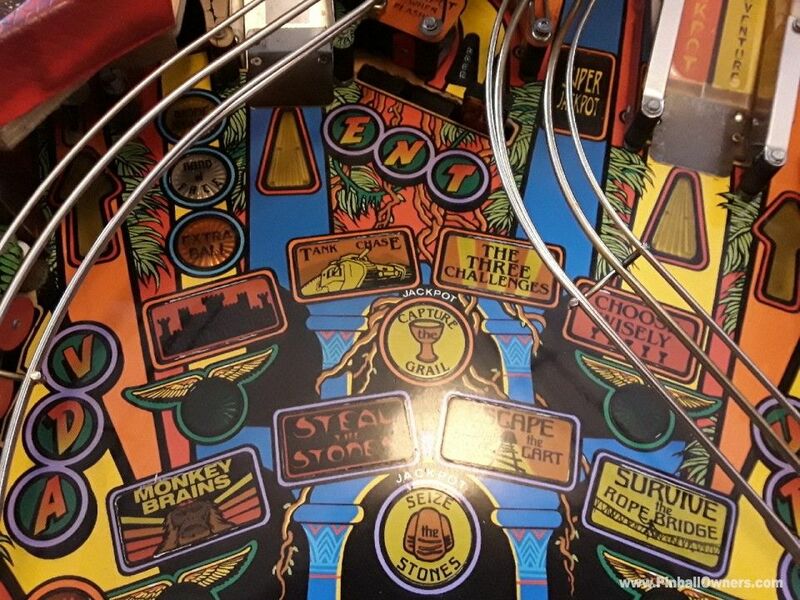 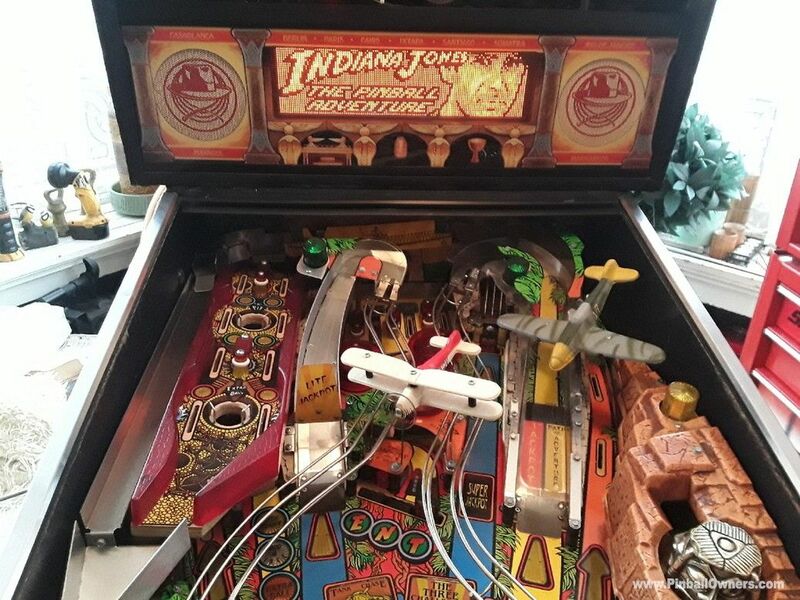 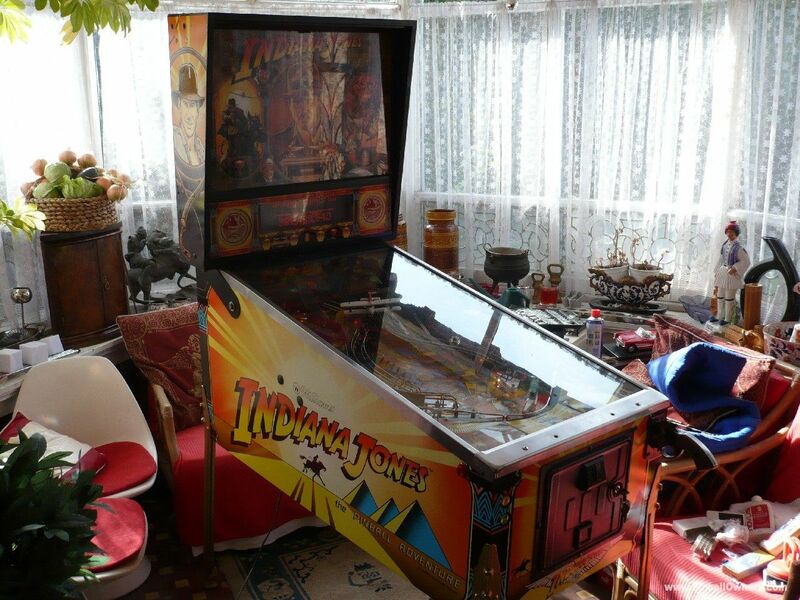 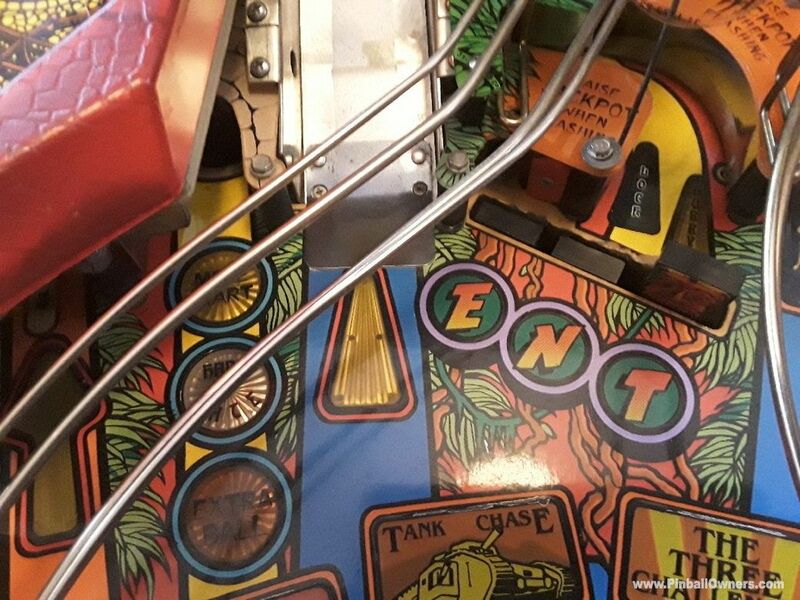 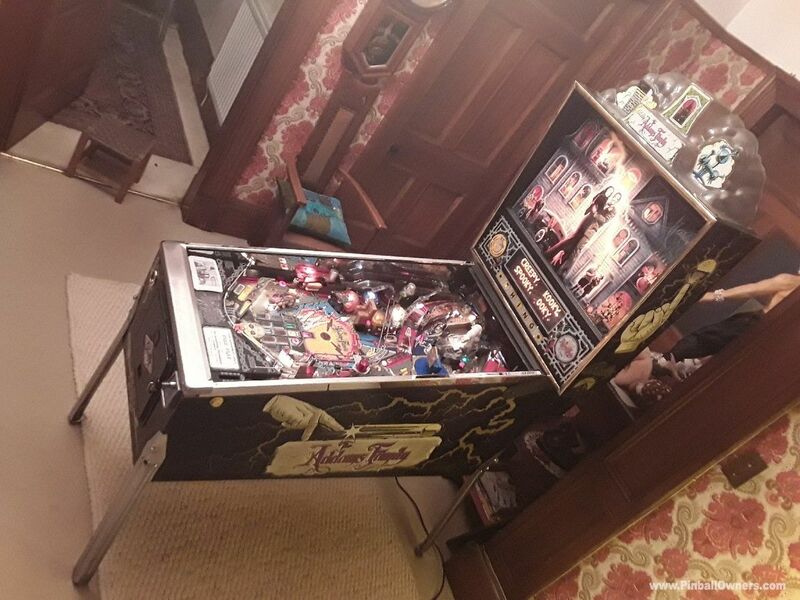 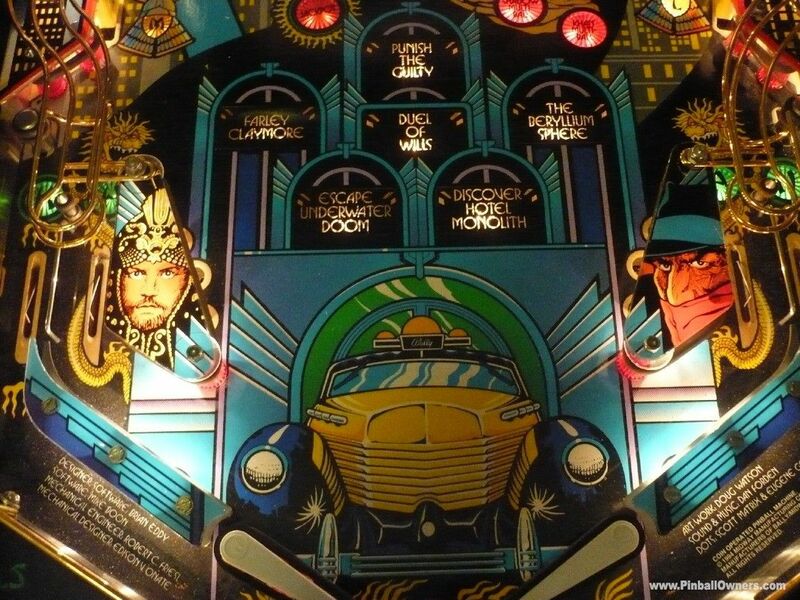 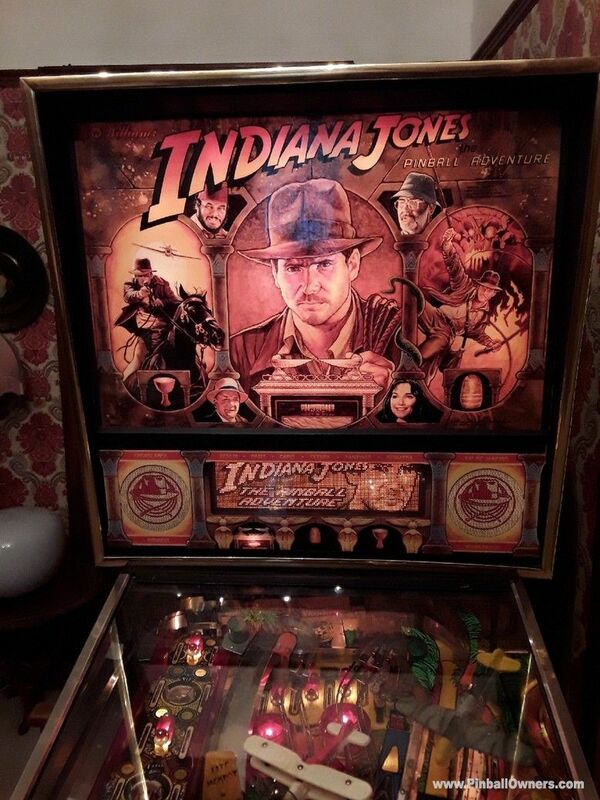 INDIANA JONES: THE PINBALL ADVENTURE Williams (USA) Vendu 1993 (August) After many years in my collection giving flawless service my Indy is inow in need of some pampering and a well deserved Hollywood makeover. 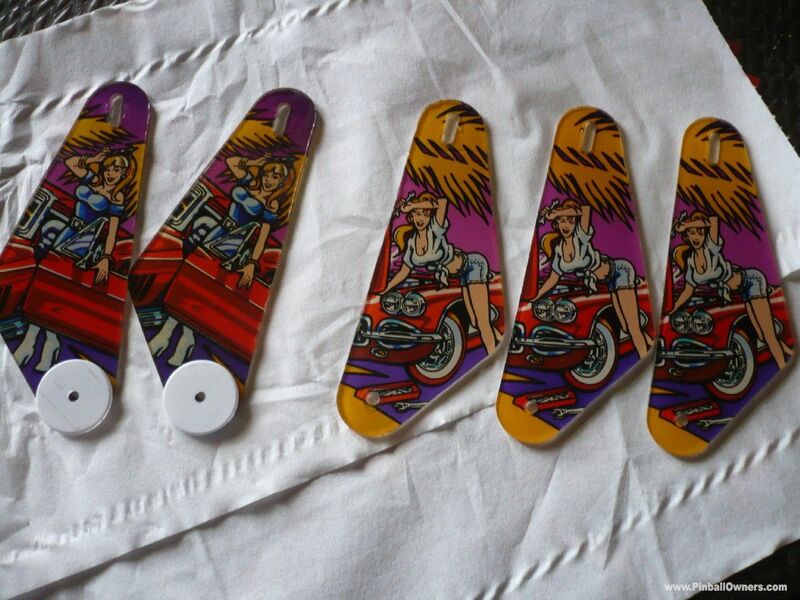 Sale will include a full set of licensed cabinet decals. 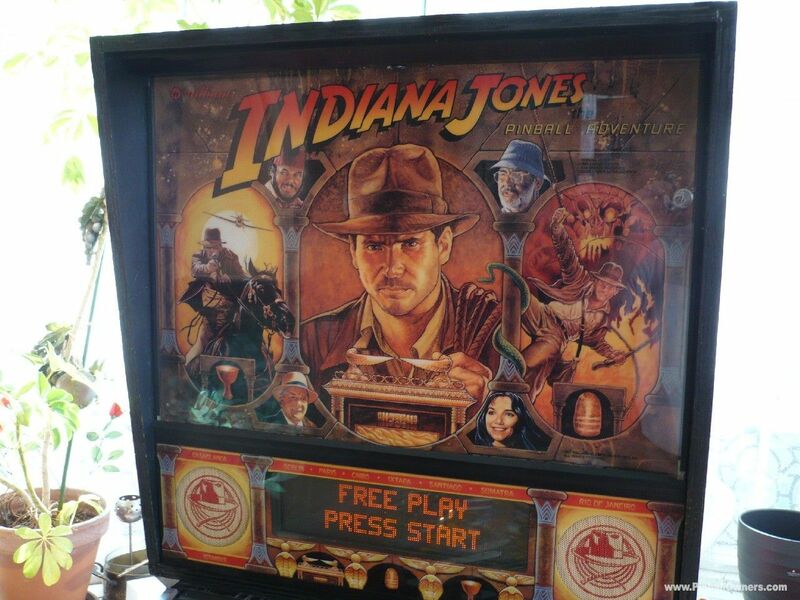 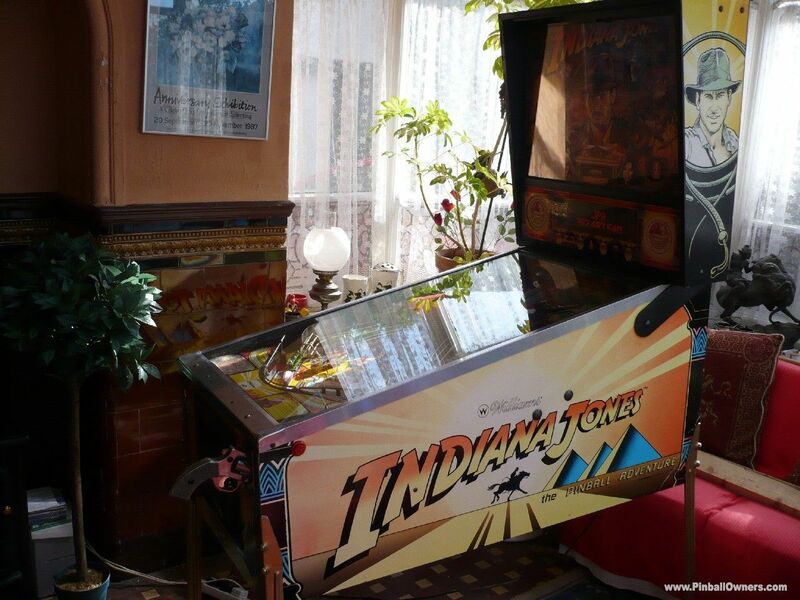 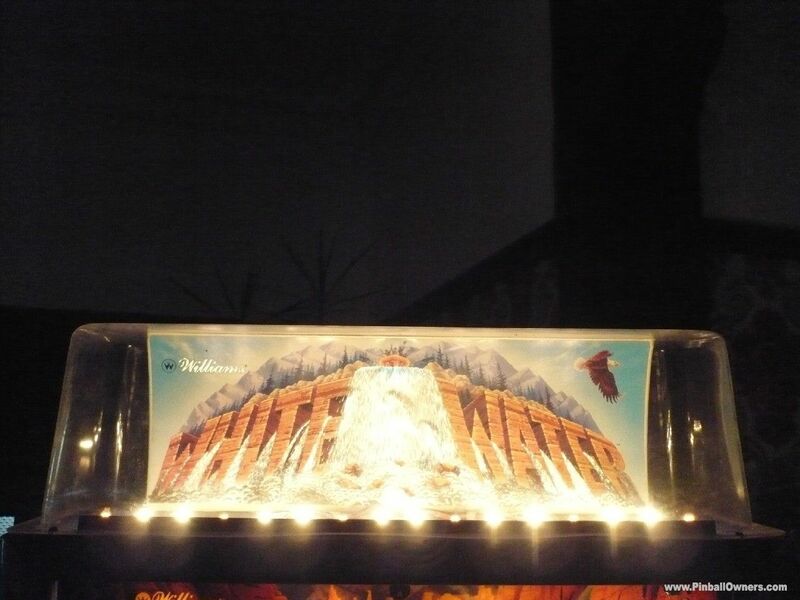 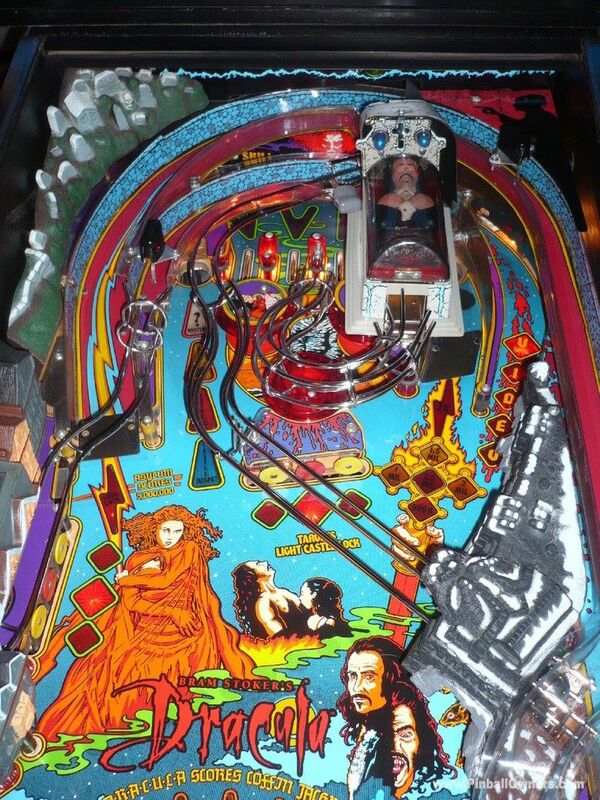 INDIANA JONES: THE PINBALL ADVENTURE Williams (USA) Vendu My Second Indy. 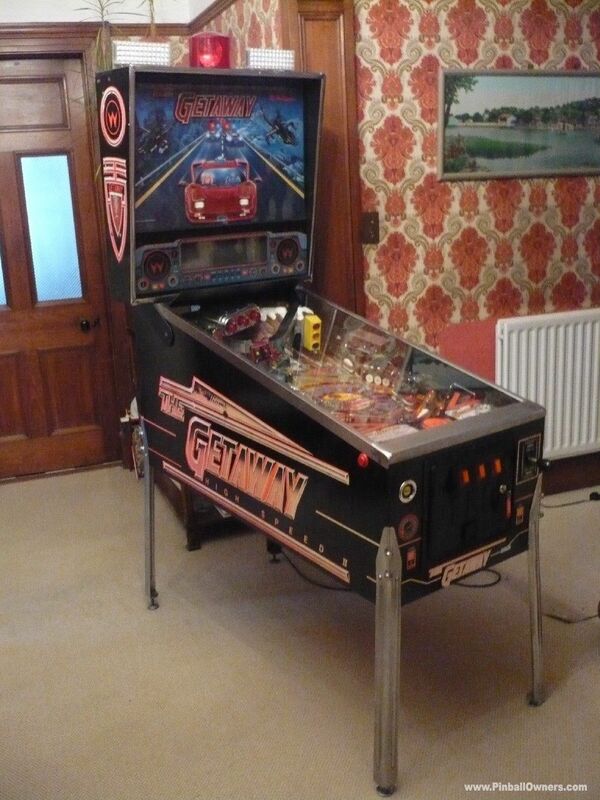 Excellent original condition with lost plastic and display light mod fitted. 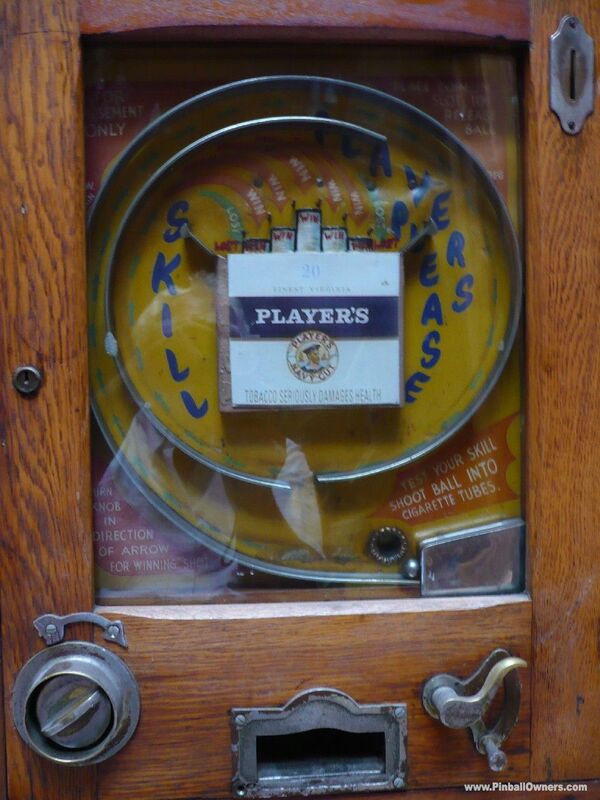 Plays fast and strong. 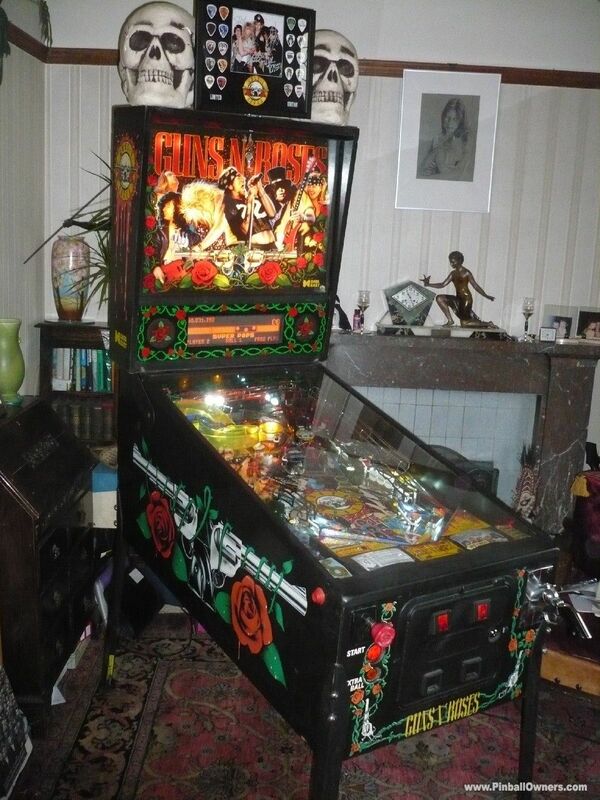 Will Sell or trade for similar Guns and Roses, Theatre of Magic, Cirqus Voltaire or Monster Bash. 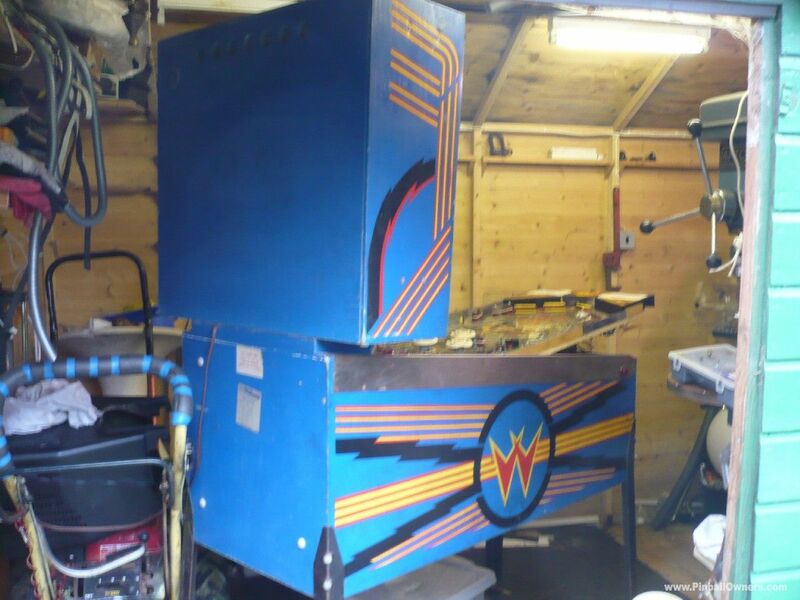 LASER CUE Williams (USA) Vendu 1984 Had spent its whole life in one spot in an arcade, still has protective paper on the chrome siderails!!! 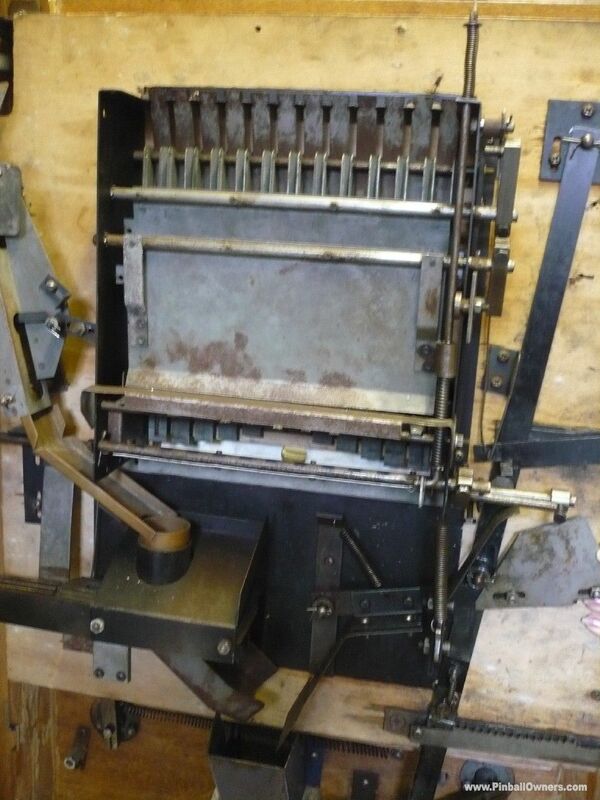 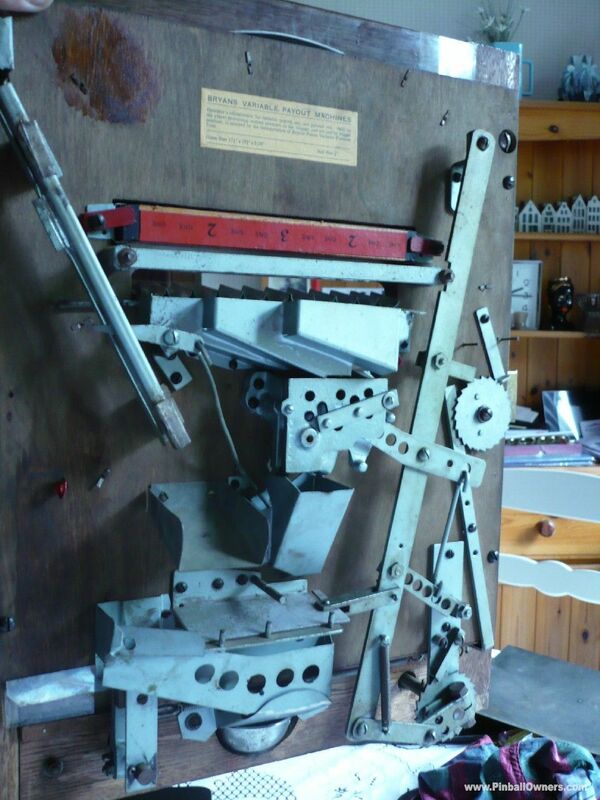 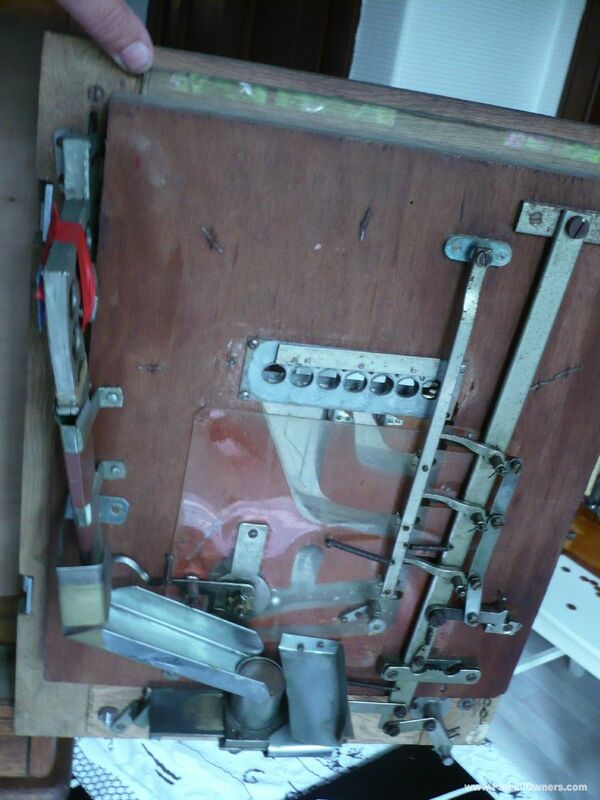 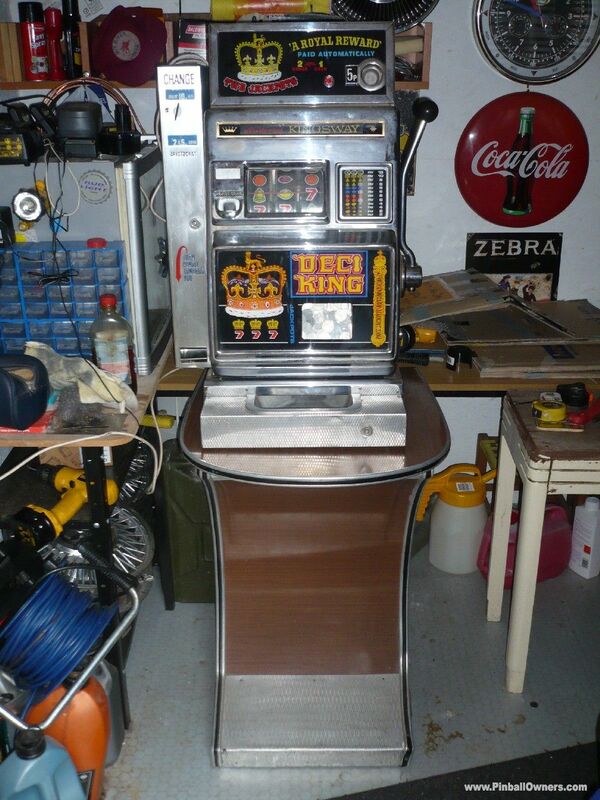 Been stored for some-time so sold as non-working/complete machine for refurb or spare parts. 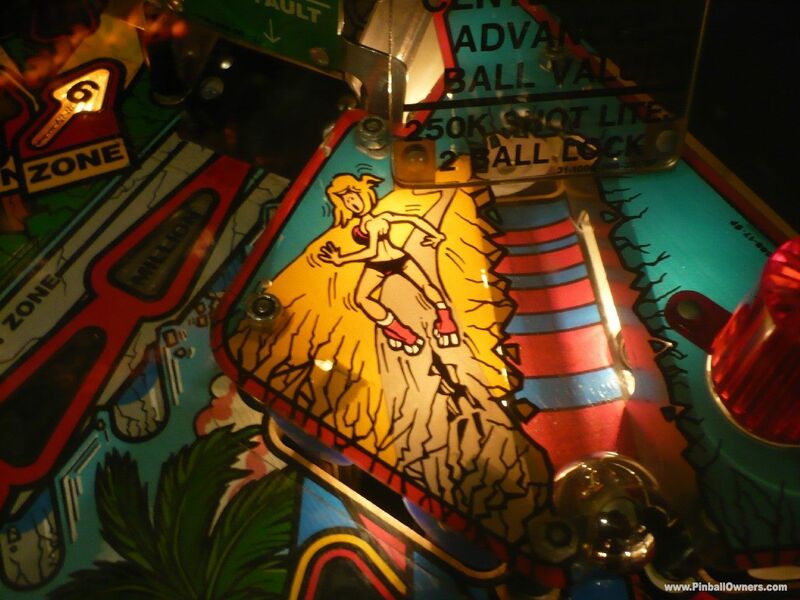 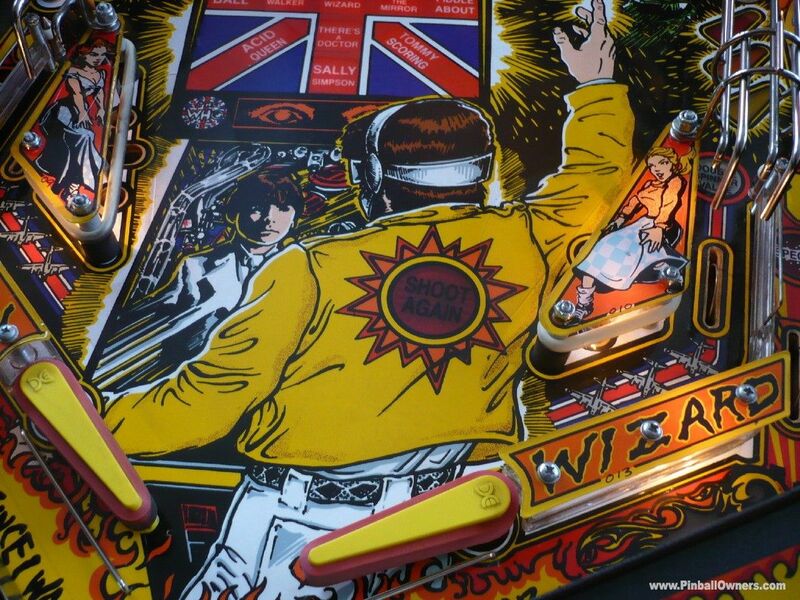 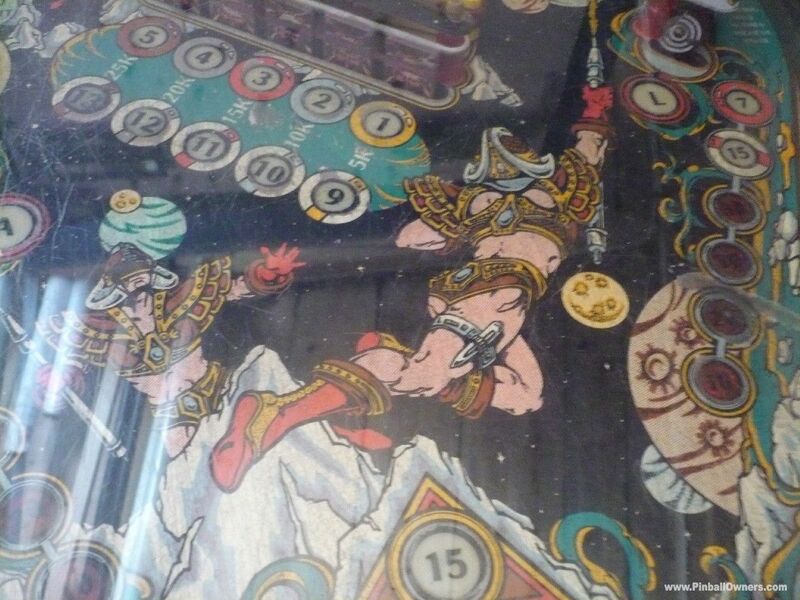 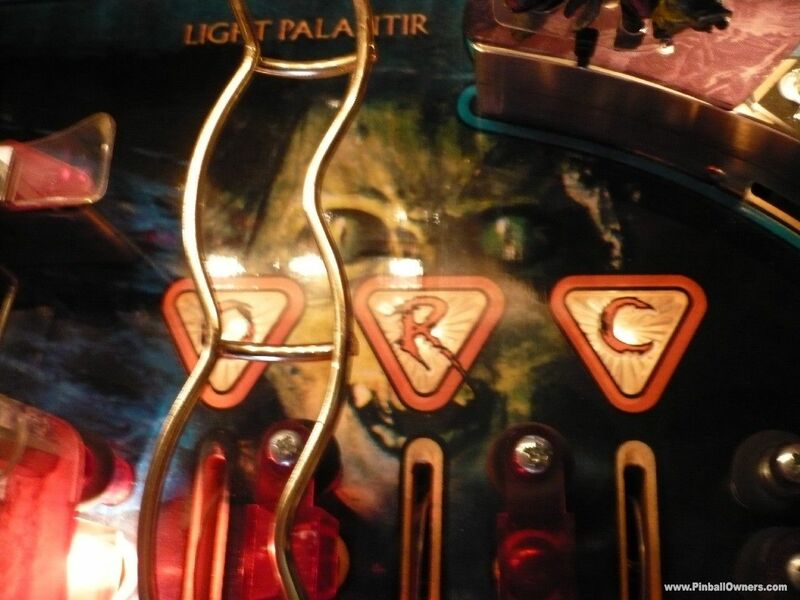 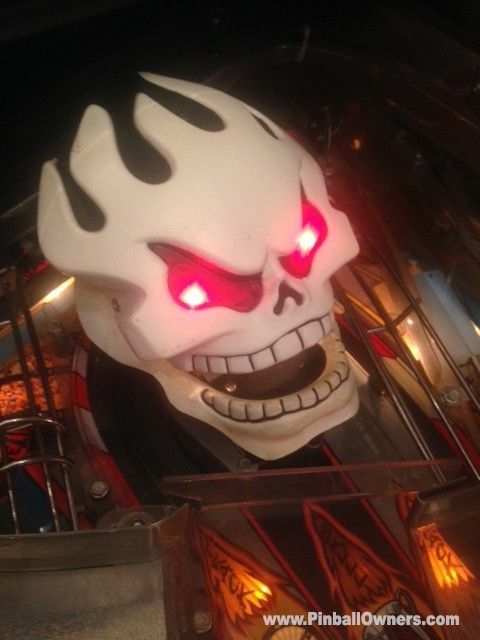 Wear on playfield reflects the money it has earned for its one previous owner. 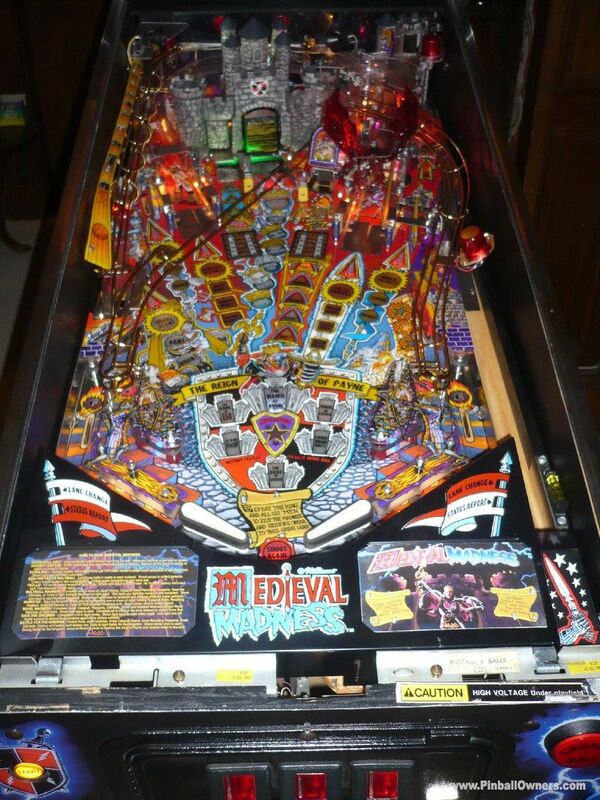 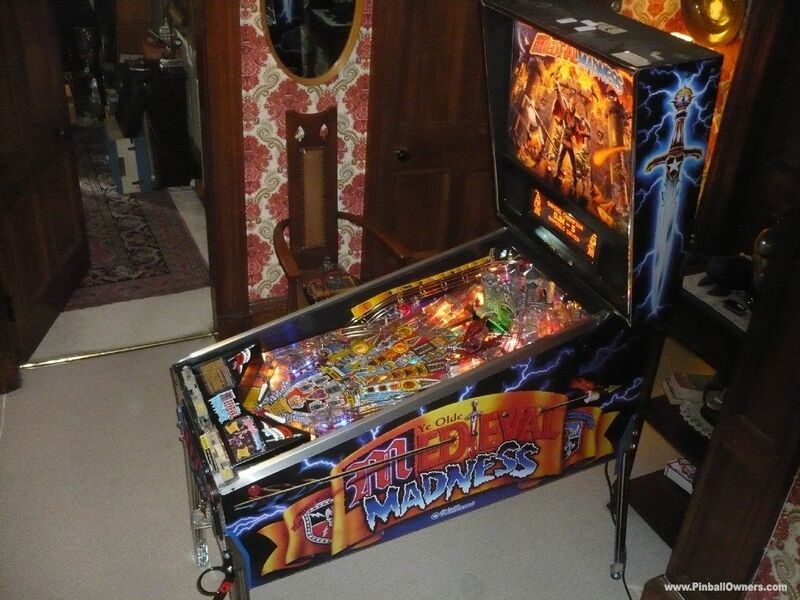 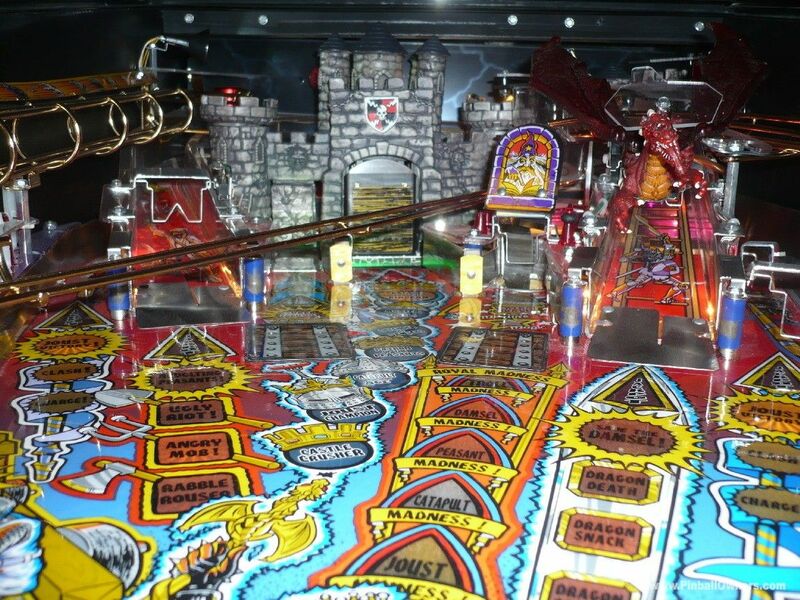 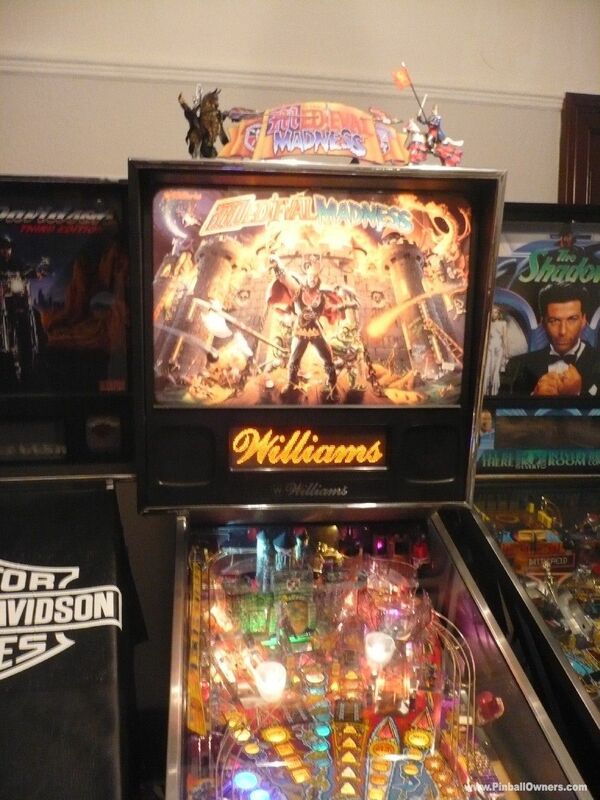 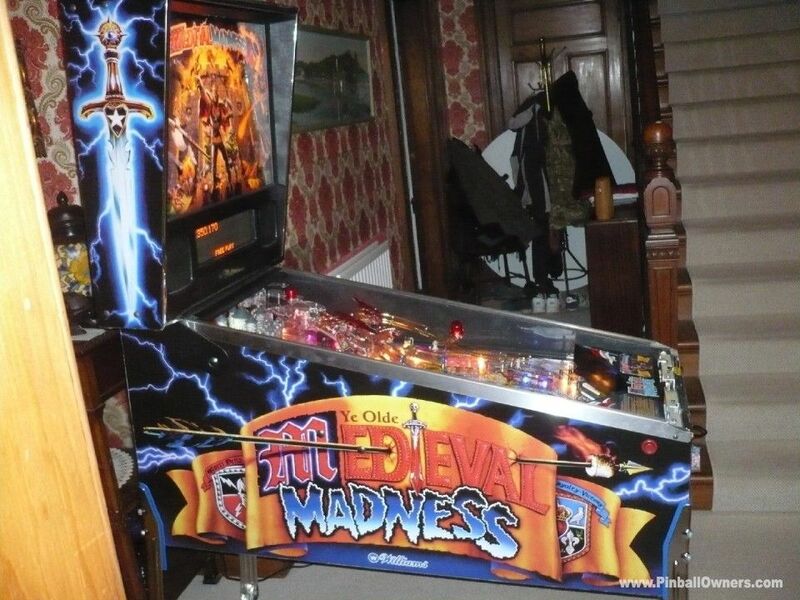 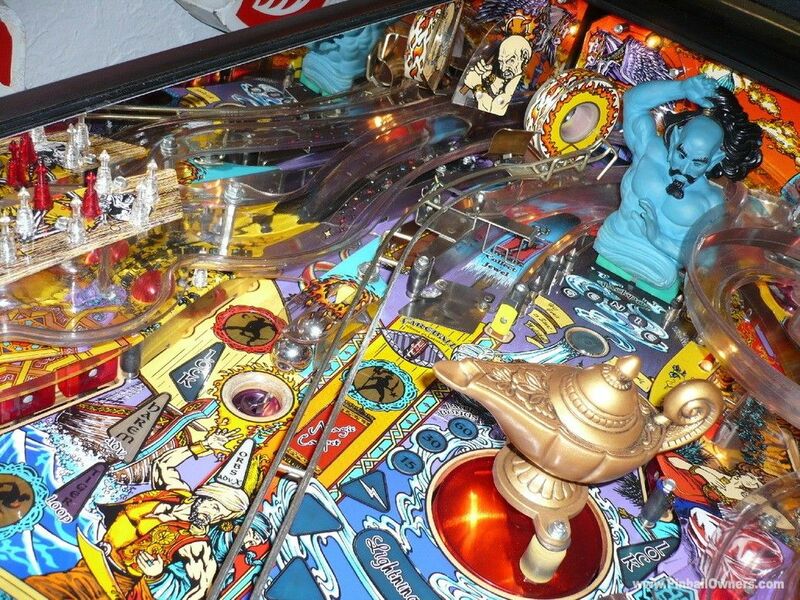 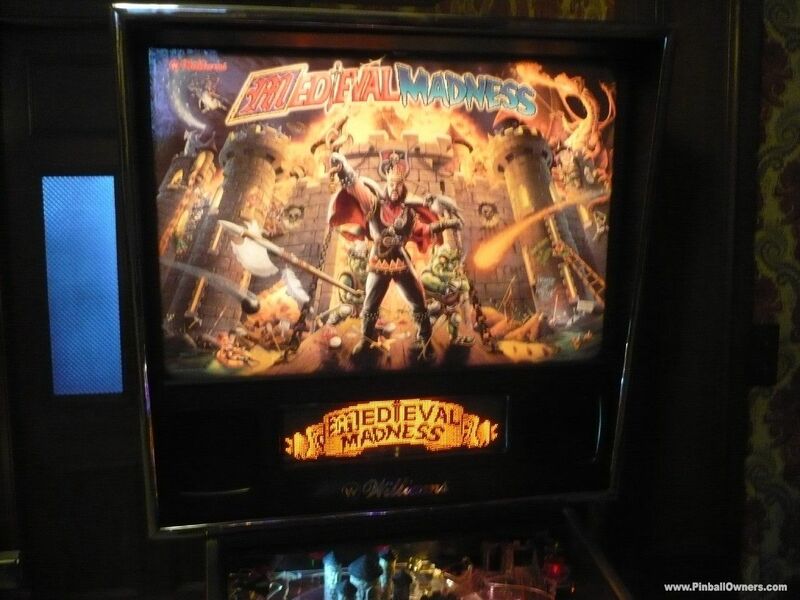 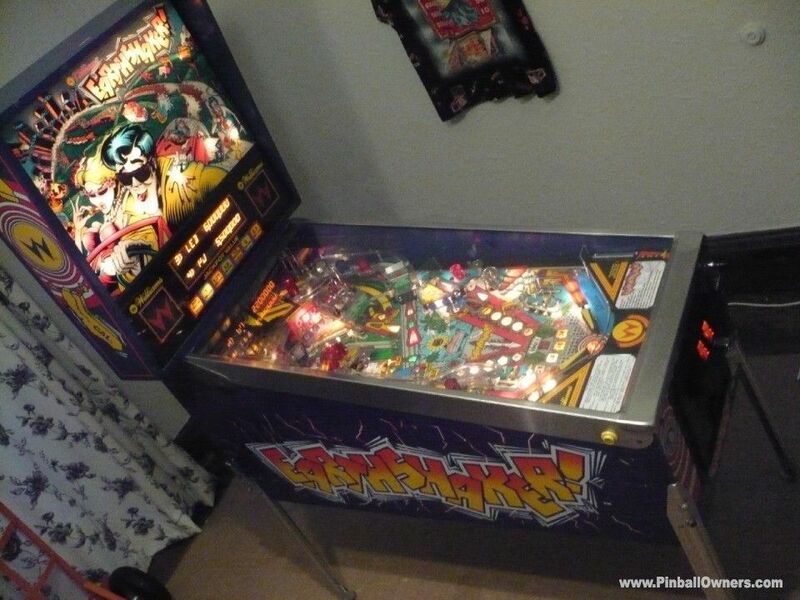 MEDIEVAL MADNESS Williams (USA) Vendu 1997 After years of searching for this Grail Pin I was very fortunate to secure this beautiful refurbished cabinet with clear-coated fully protected play-field. 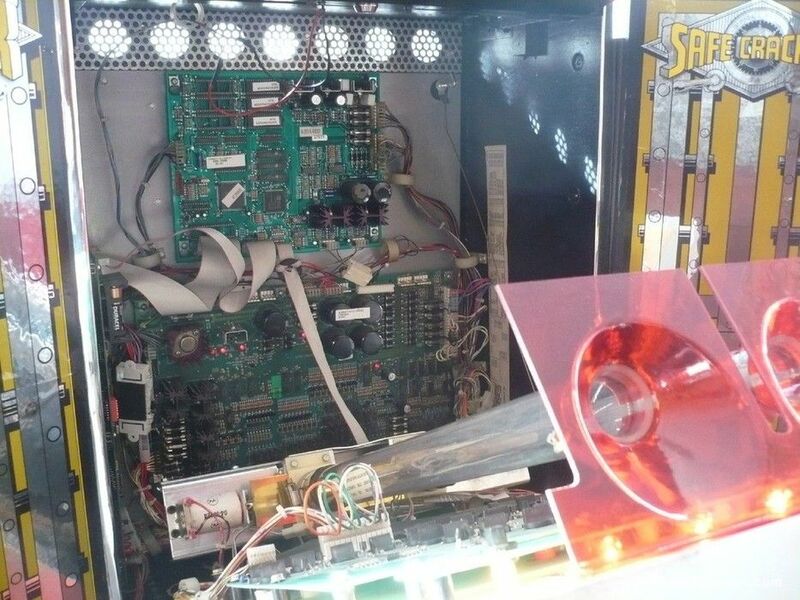 Sound-Pro speaker system., full plastic protector set. 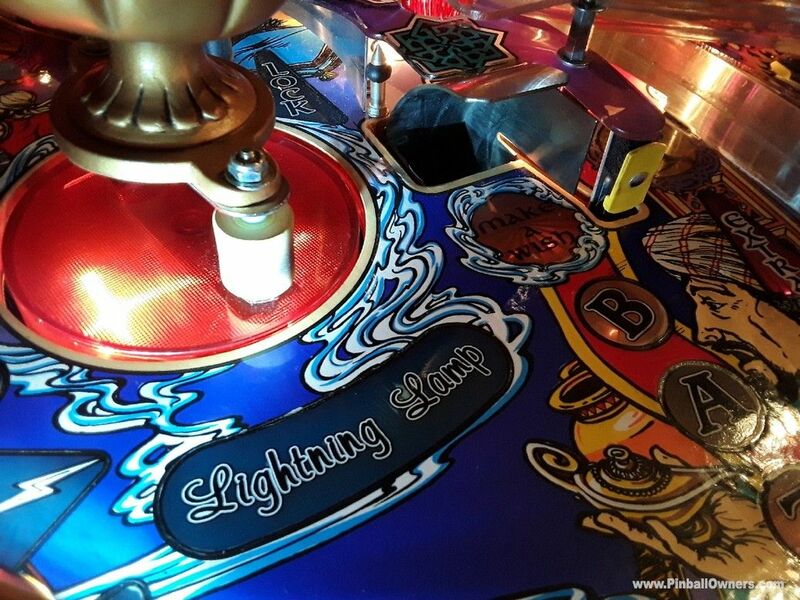 Synchronized Fully illuminated Thunderbolt effect acrylic play-field back panel (By TomDk). 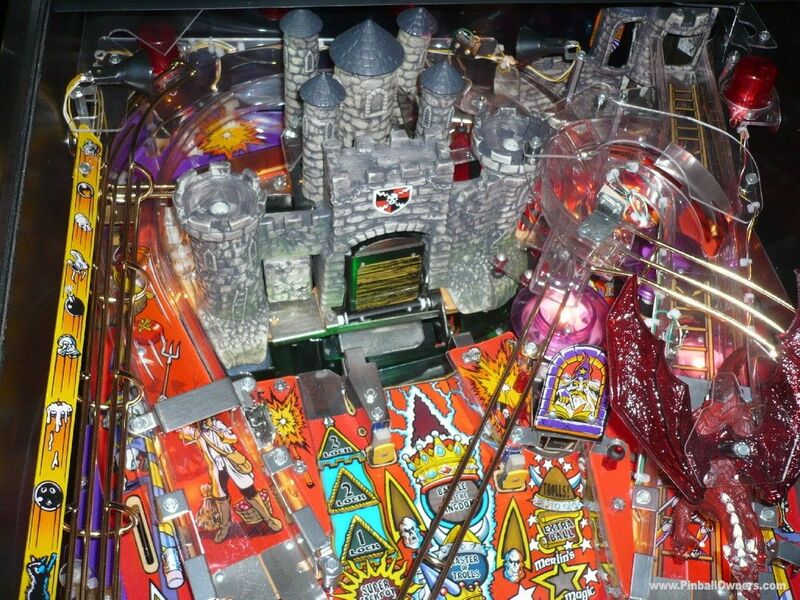 Modified Green swamp lighting to moat, gold plate wireforms. 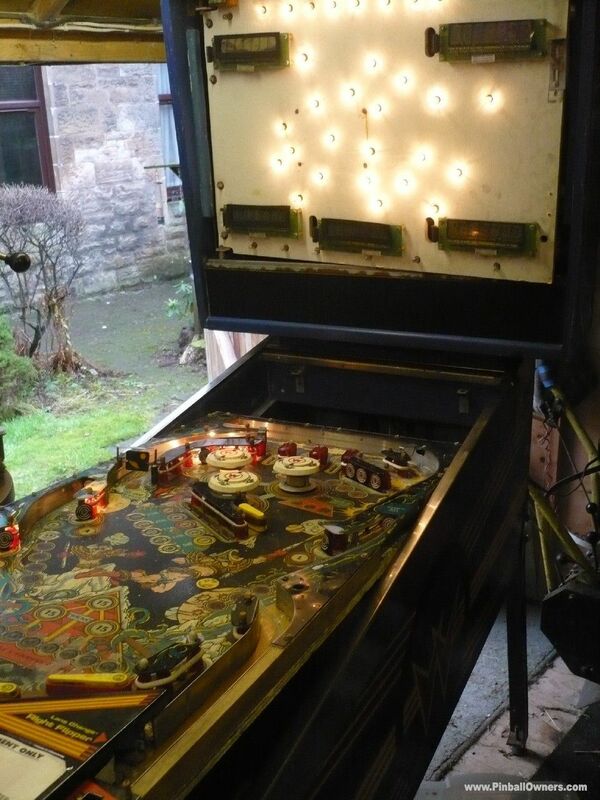 This pin has been cherished over the years and duly refurbished with skill and attention to detail to better than new condition. 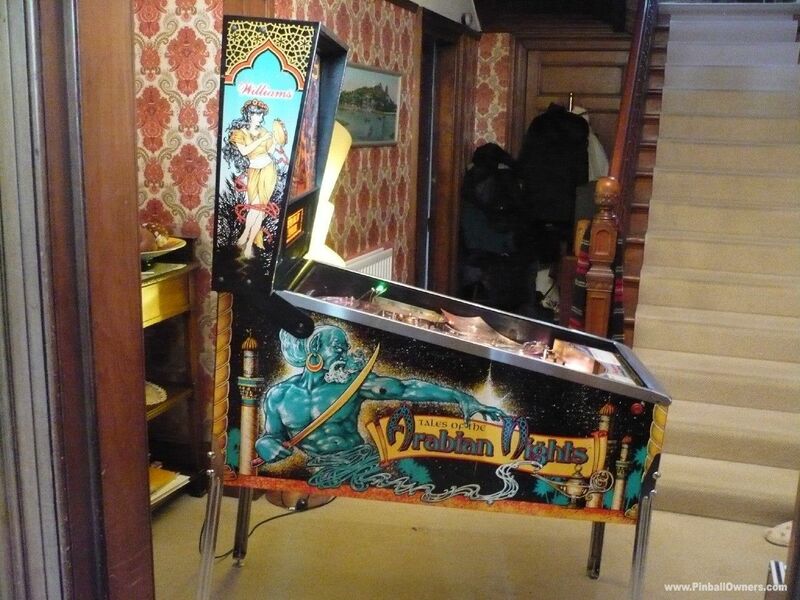 Plays fast and strong........worthy of all the hype. 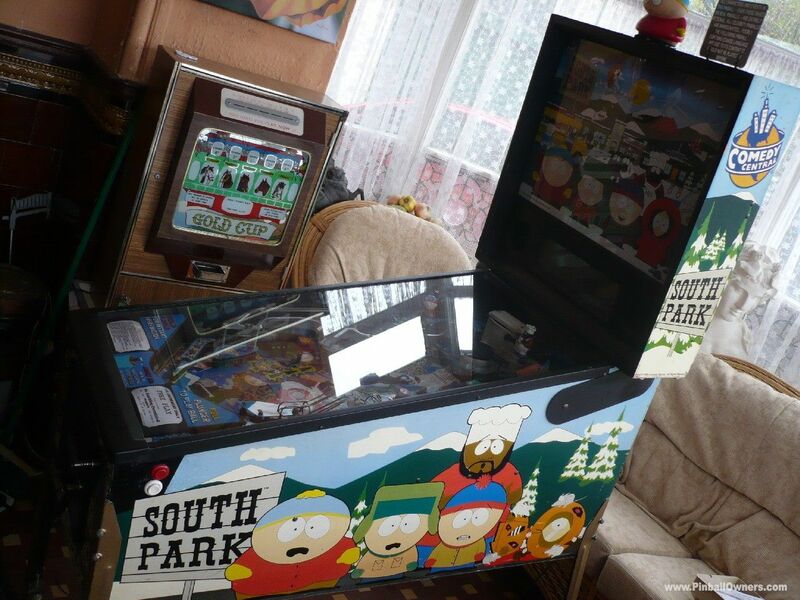 Collection/payment in person only...... 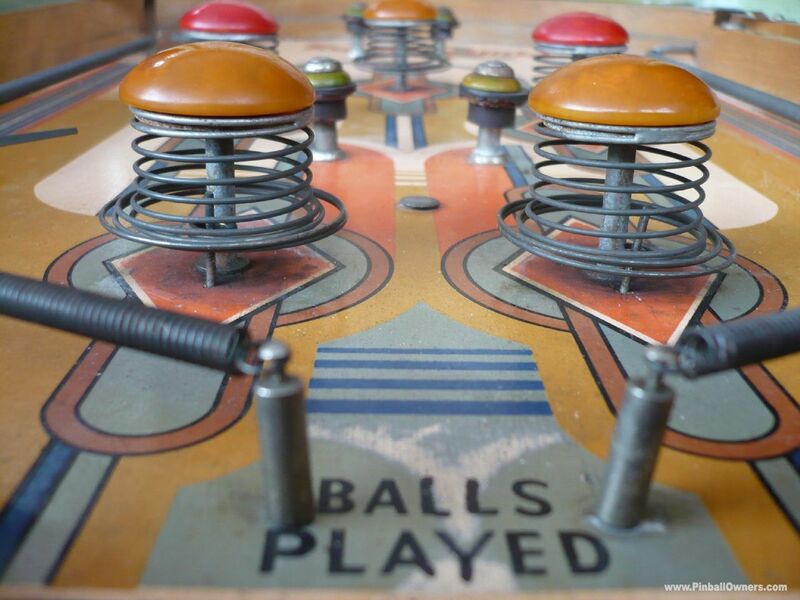 RESERVED. 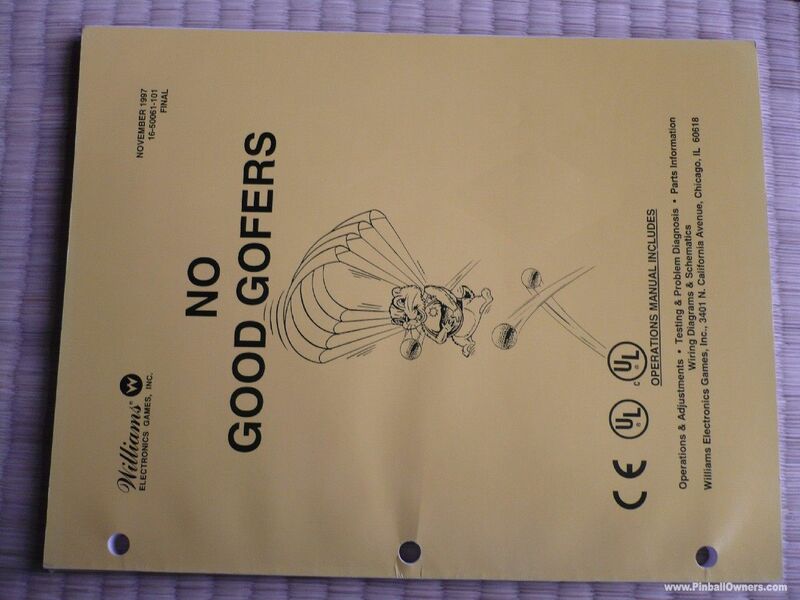 NO GOOD GOFERS Williams (USA) Vendu 1997 (December) Nice clean pin. 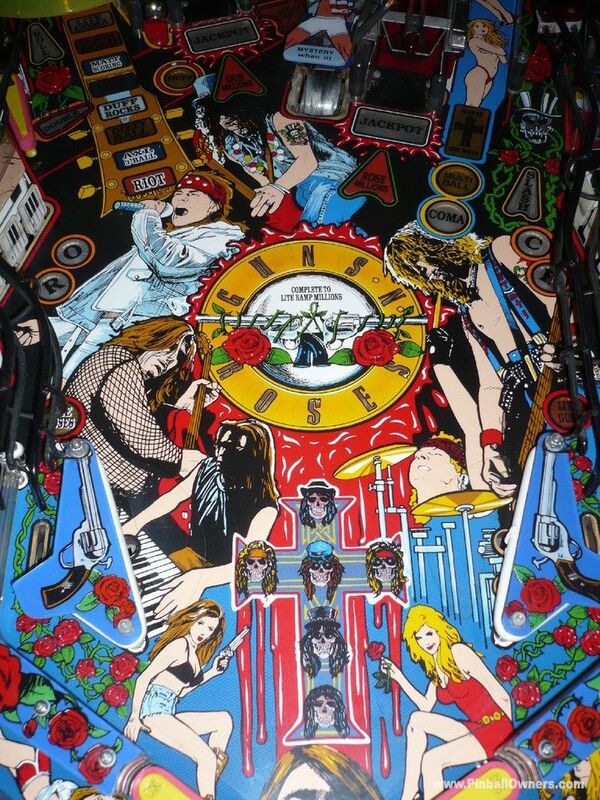 plays fast. 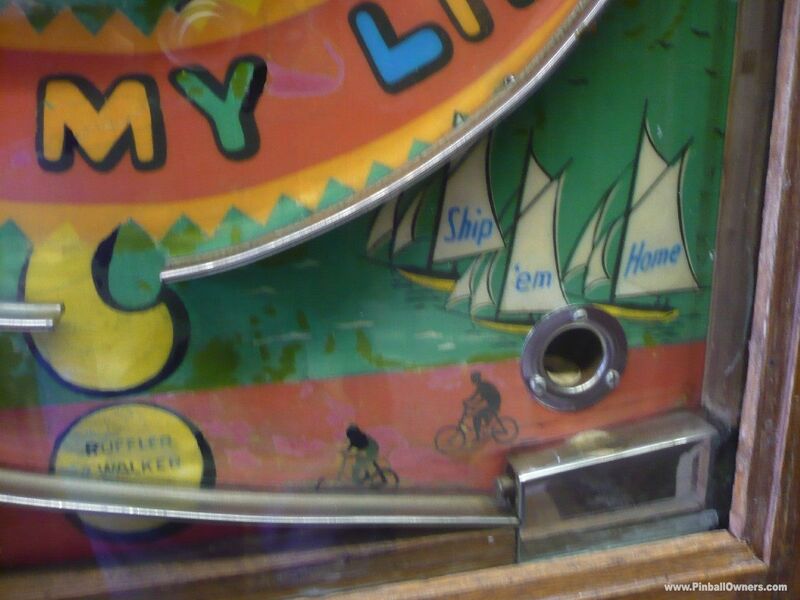 Usual playfield mark by lift ramp. 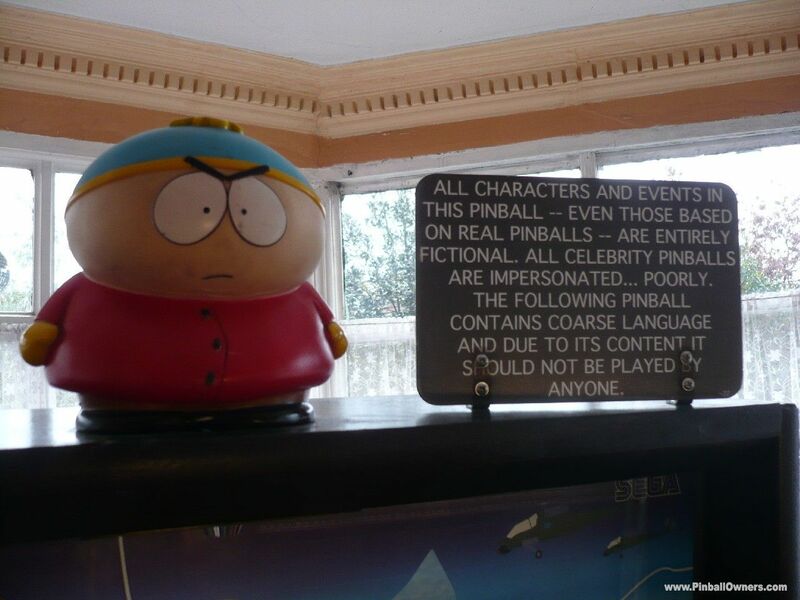 RESERVED. 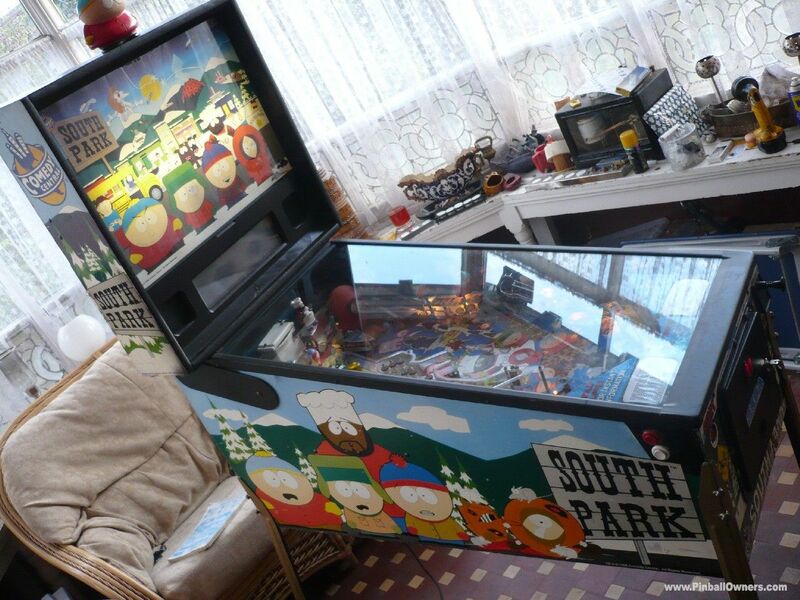 Collection/Payment in person only. 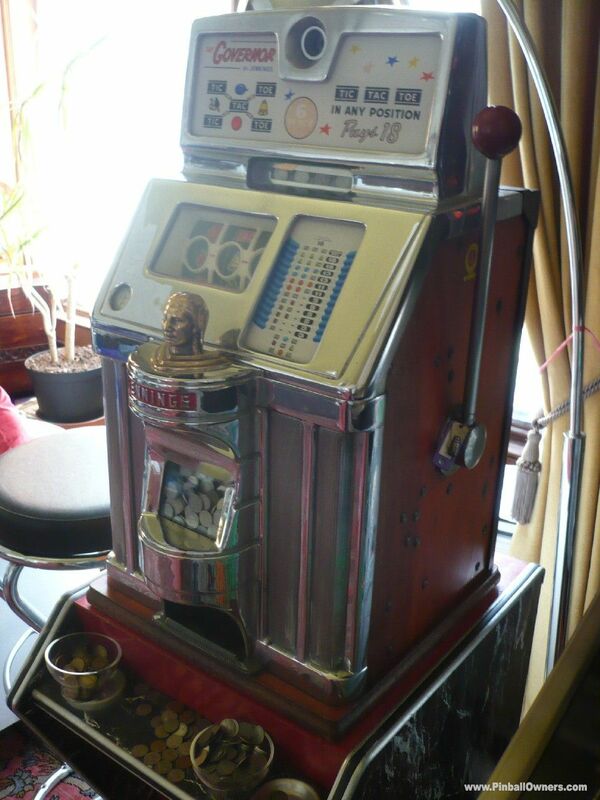 PLAYERS PLEASE autre (voient les notes) Vendu I love the sound the ball makes as it spins the loop.... and if you win, the rattle of the coins coming into the cup. 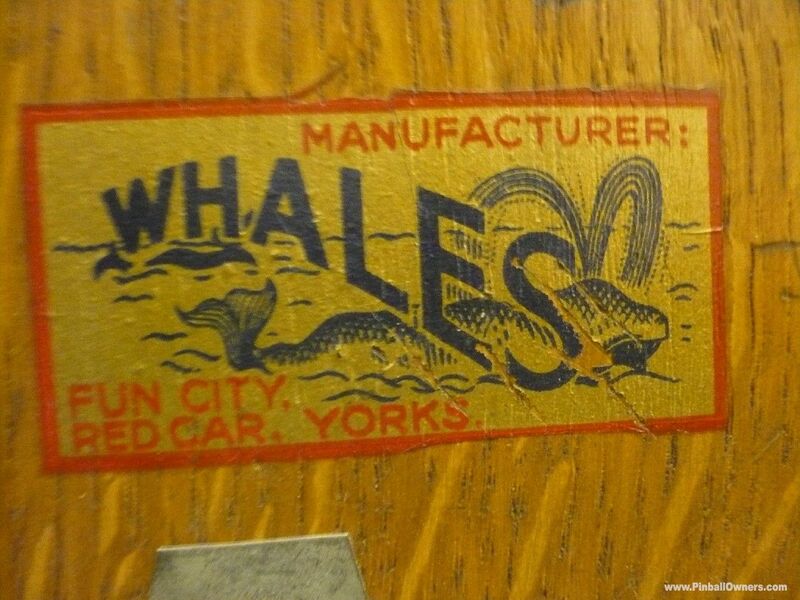 Made in the UK by Oliver Whales of Redcar. 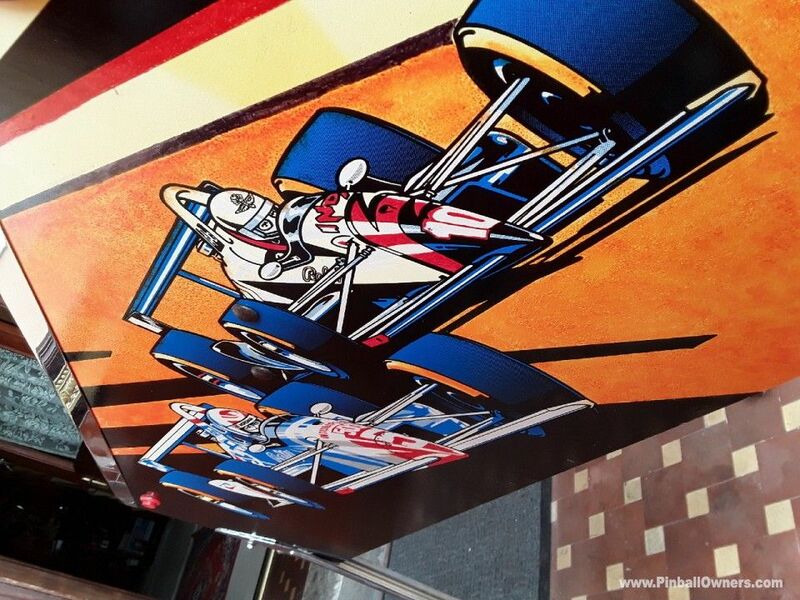 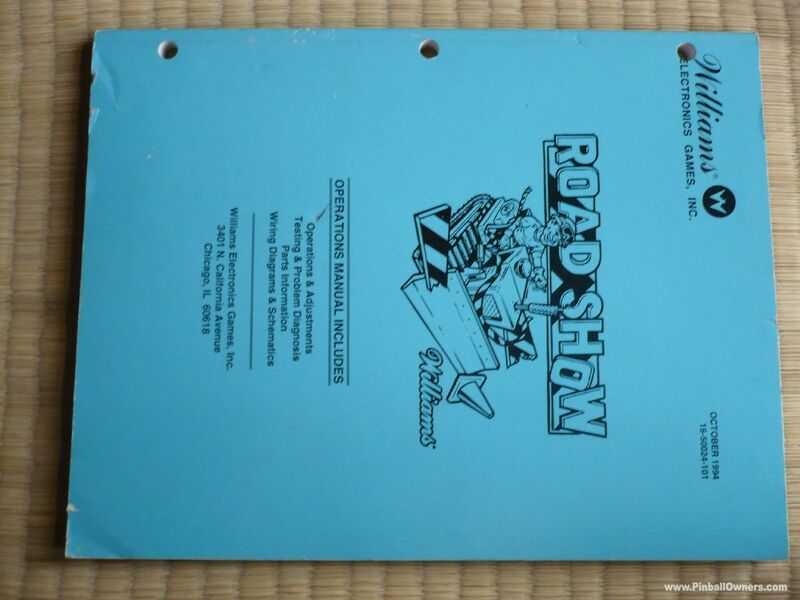 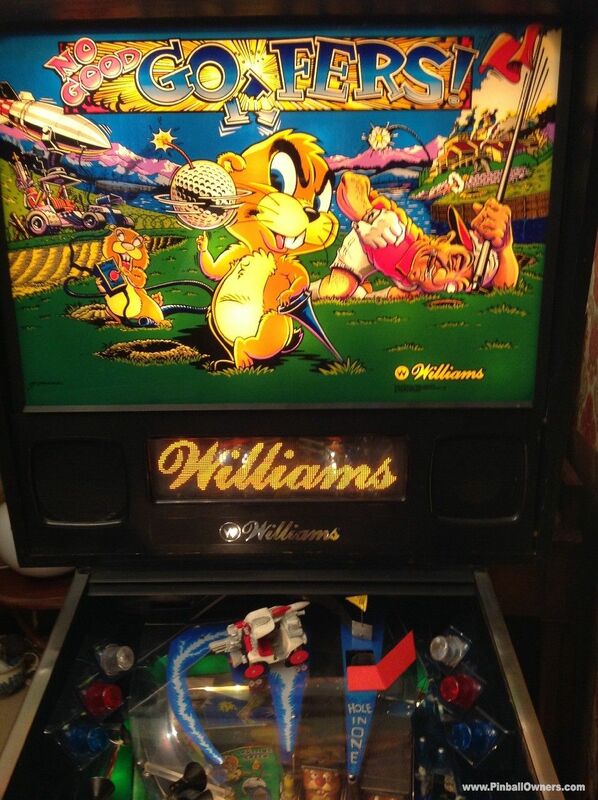 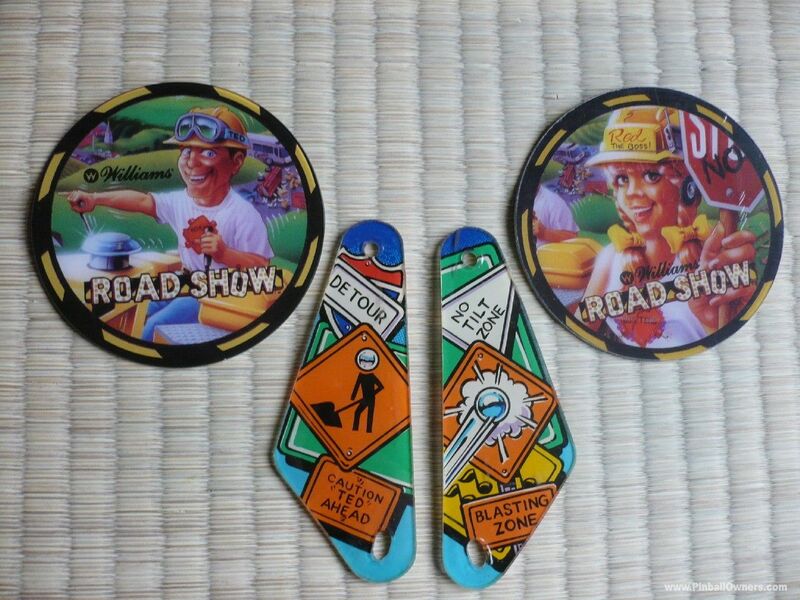 RED & TED'S ROAD SHOW Williams (USA) Vendu 1994 (October) Excellent cabinet and playfield, plays 100%. 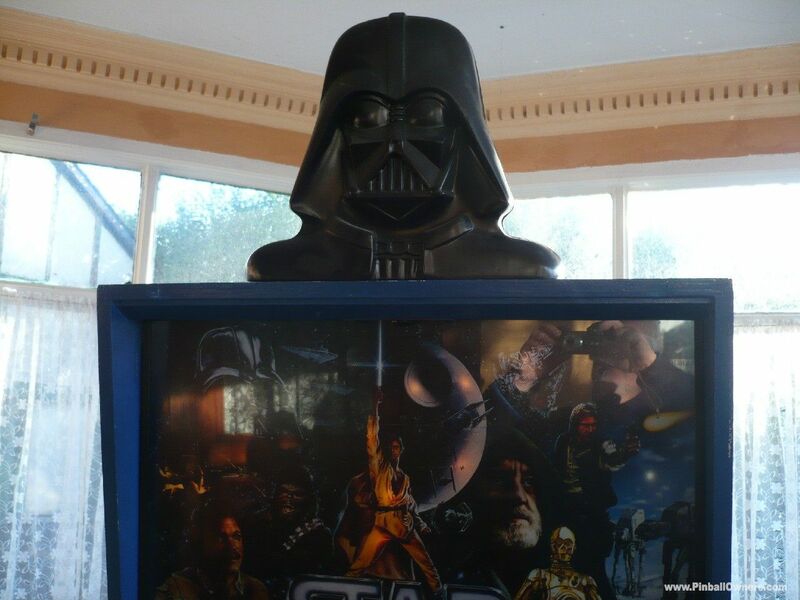 Both heads fully functional. 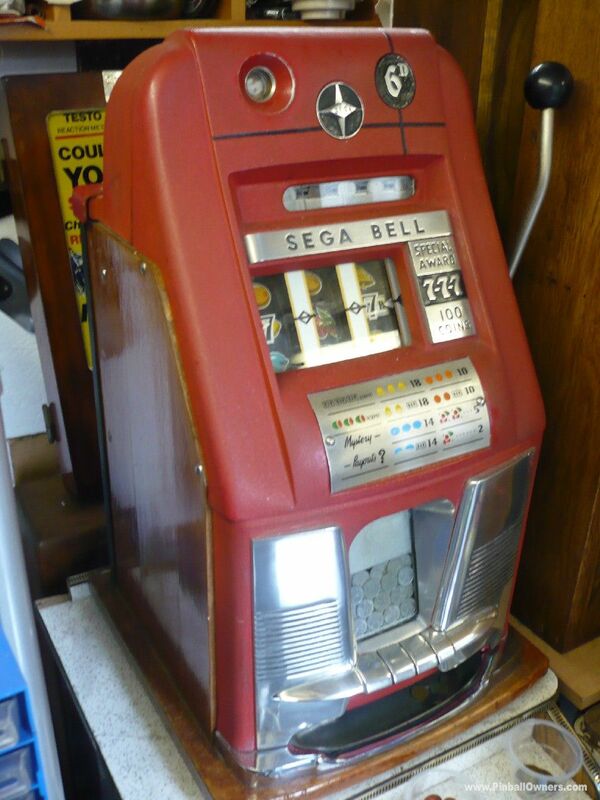 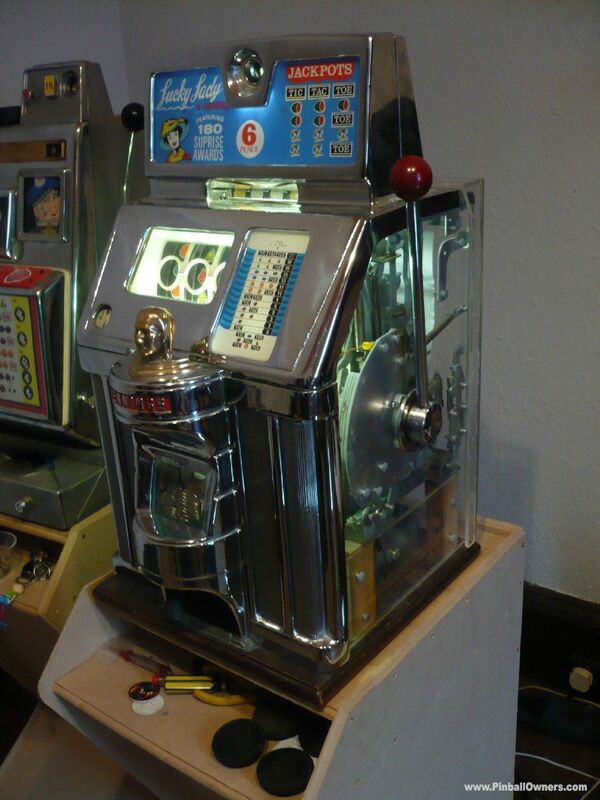 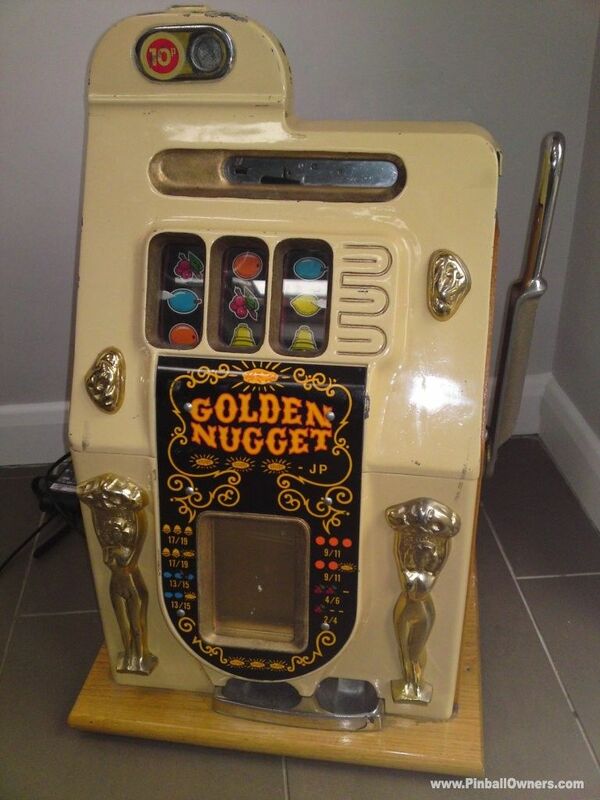 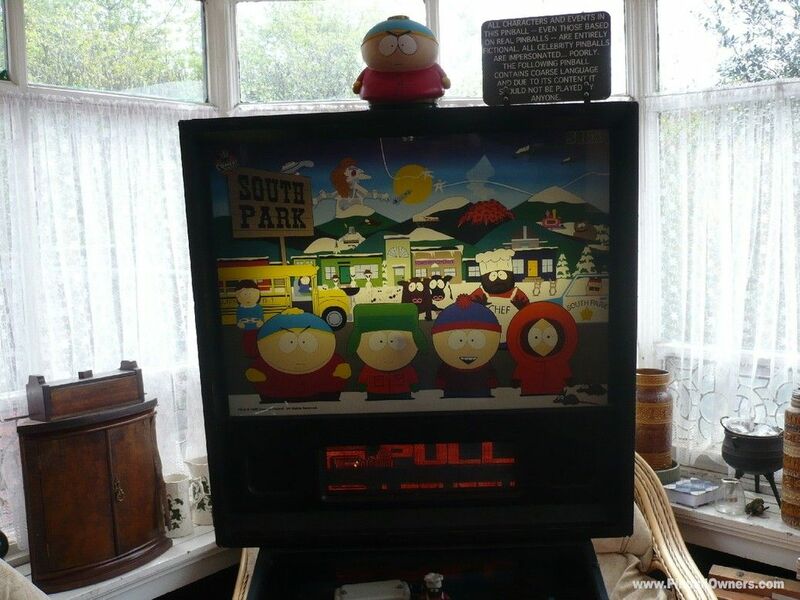 This particular machine has a really memorable Shaker Motor which rumbles to fantastic effect with digital display game features. 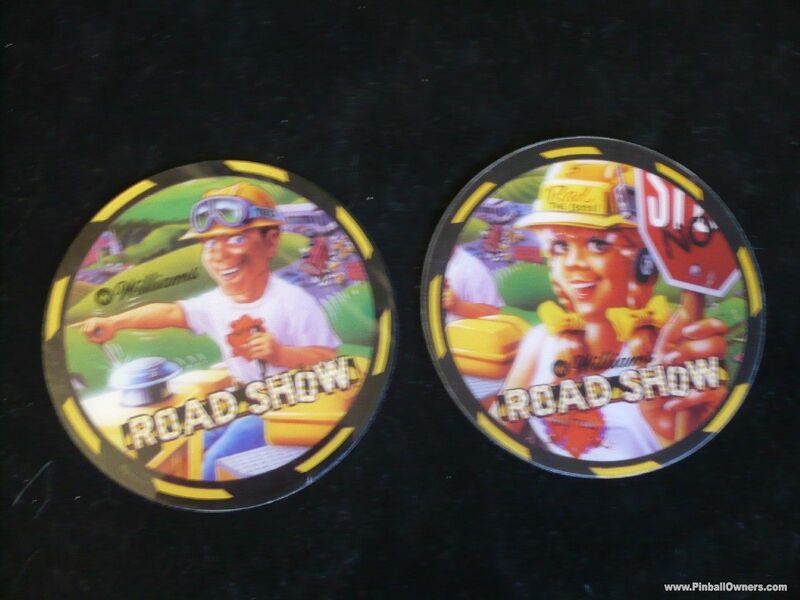 Everyone loves the animated heads of Red and Ted as you transport them on a Coast to Coast adventure across the United States. 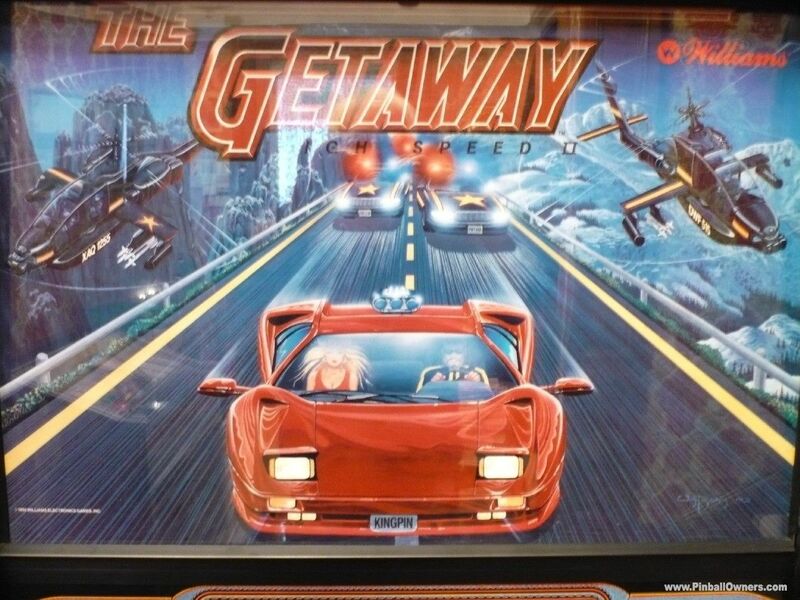 cops and irate taxi drivers chase after them as busily portrayed on the animated dot matrix display. 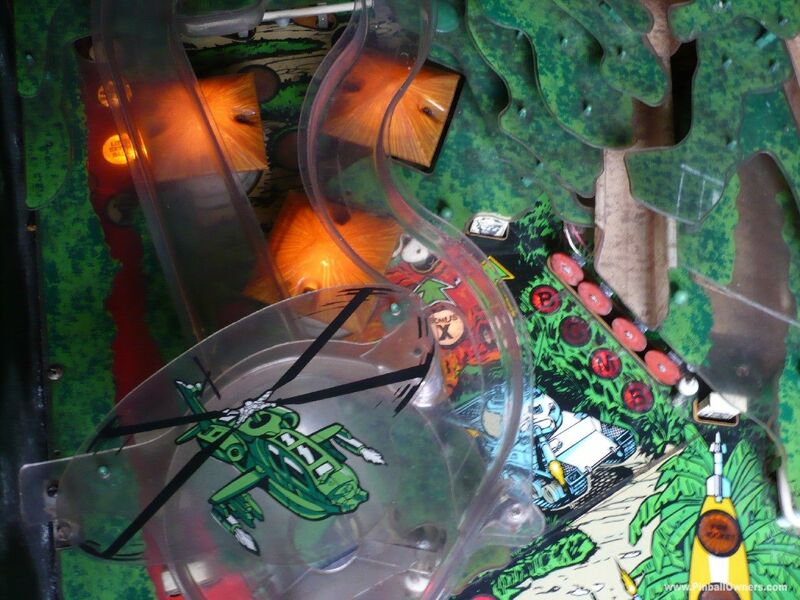 Very very clever and joy to play. 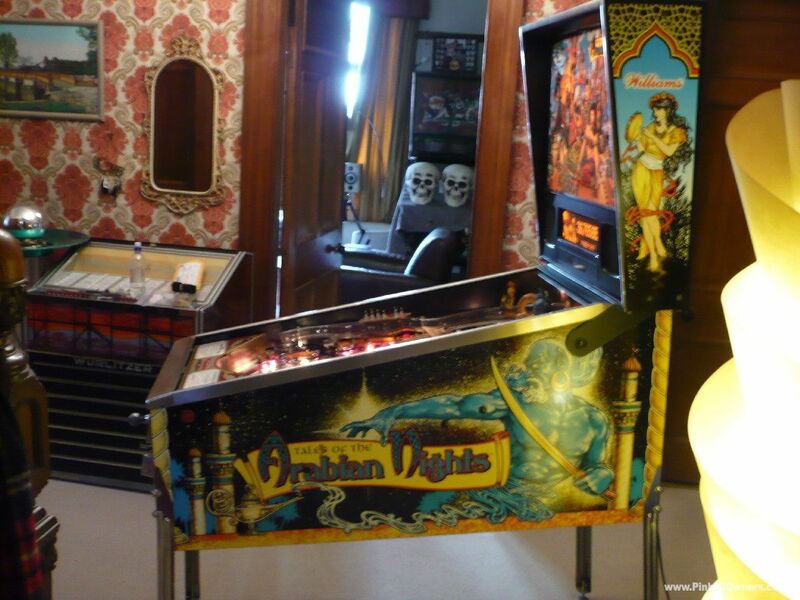 TALES OF THE ARABIAN NIGHTS Williams (USA) Vendu 1996(12th.June) A beautiful all Original well maintained pin with unmarked play-field and bright colorful cabinet and backbox graphics. 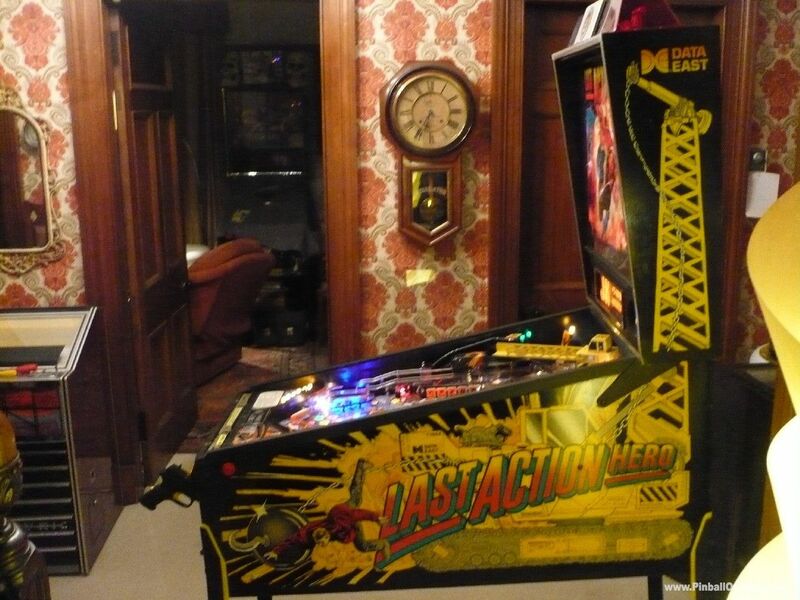 Plays as it should...strong and fast. 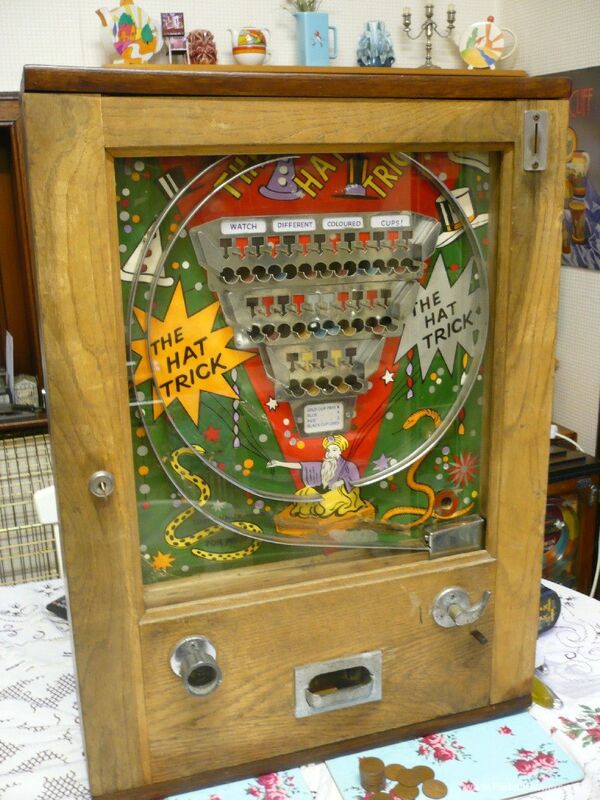 A John Popadiuk game with his signature magnet features, ..........Has had light use being in a large Private Collection for many years. 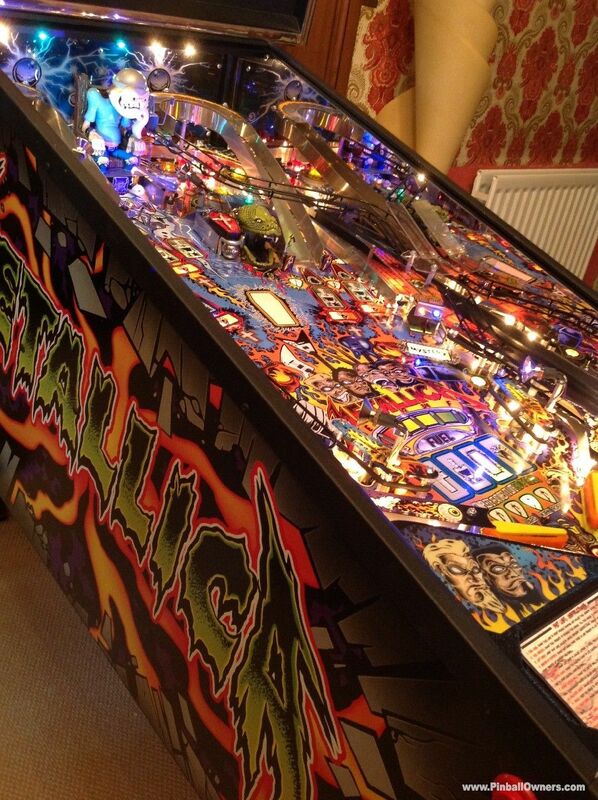 Also looks superb with polished stainless mirror blades. 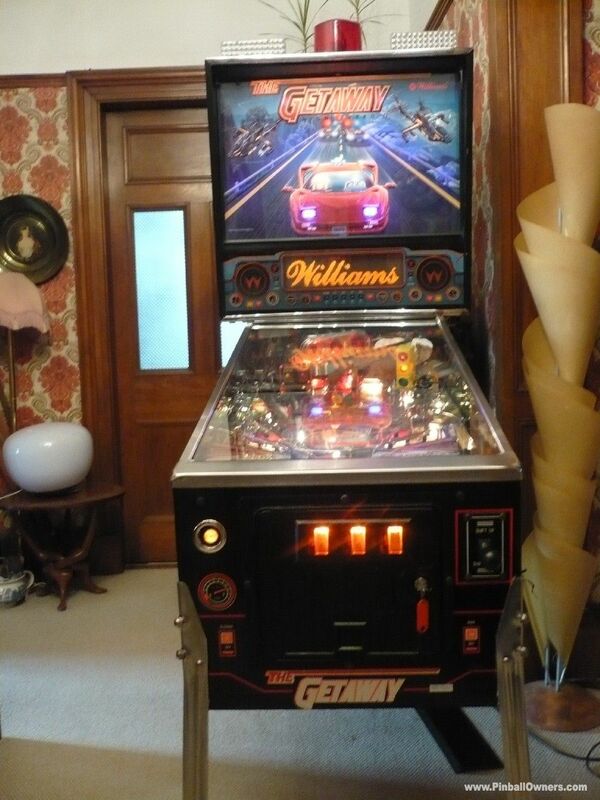 THE GETAWAY: HIGH SPEED II Williams (USA) Vendu 1992(February) Lovely original game with good cabinet and light use diamond plate play-field. 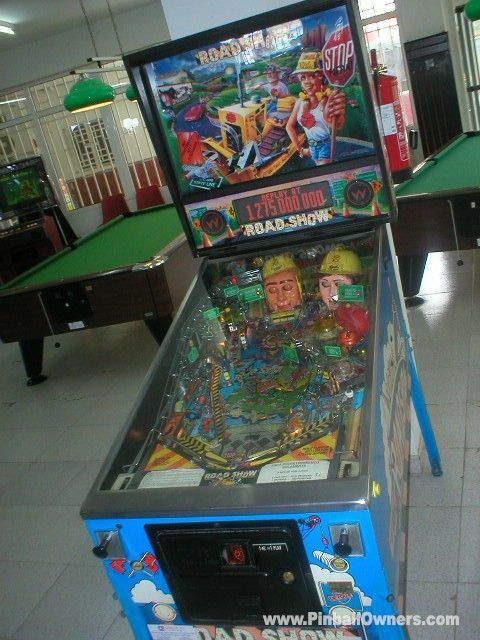 Has been well maintained to give a fast and exciting game. 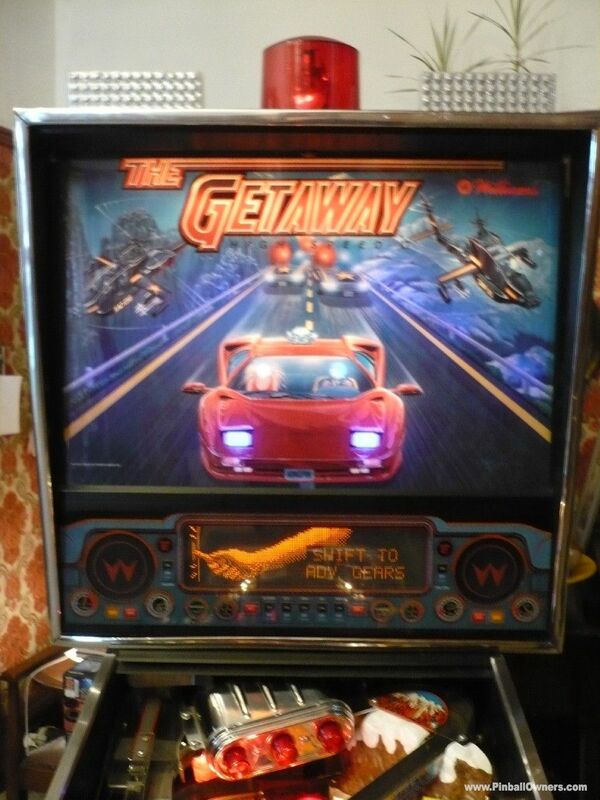 Has many clever features which are complimented by excellent driving music and flashy light show.. 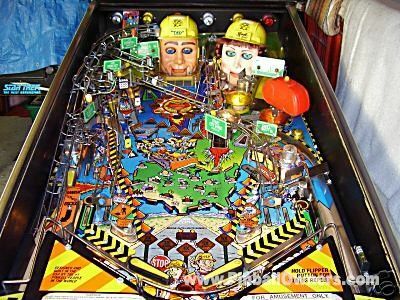 The most memorable being The Magnetic Supercharged ball accelerator with diverters is awesome The play-field is fitted with the Mountain Mode Tunnel Plastic, which should have been included in the original design, Fitted with a Full set of police strobe lights and.....Mirror Blades... Super-Nice very addictive game play..... and a joy in every way.. 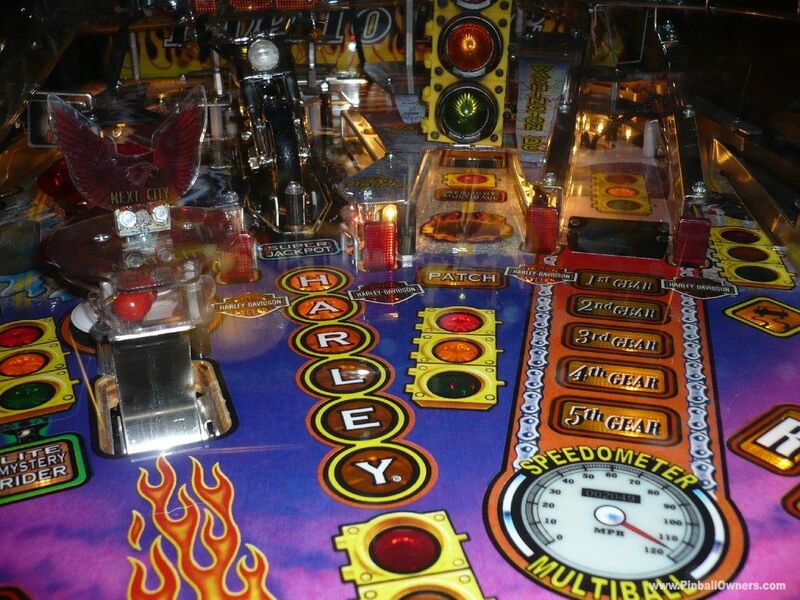 RESERVED. 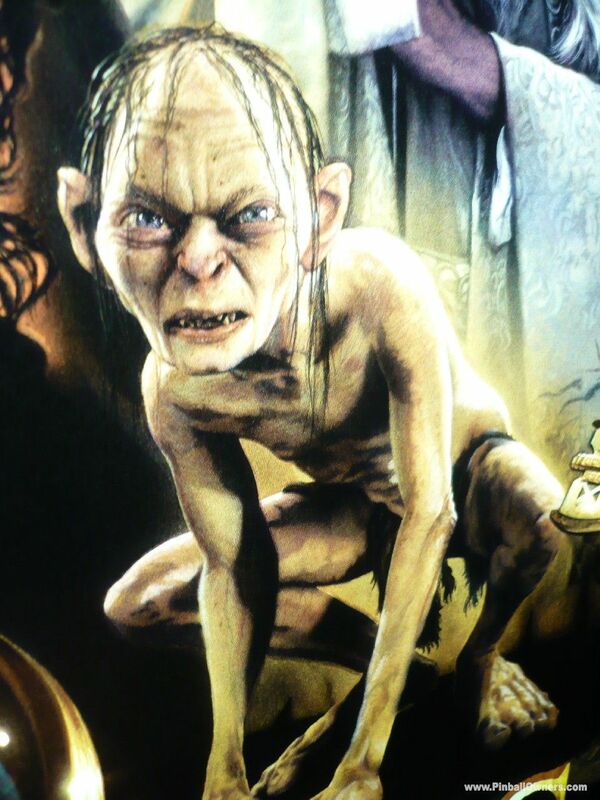 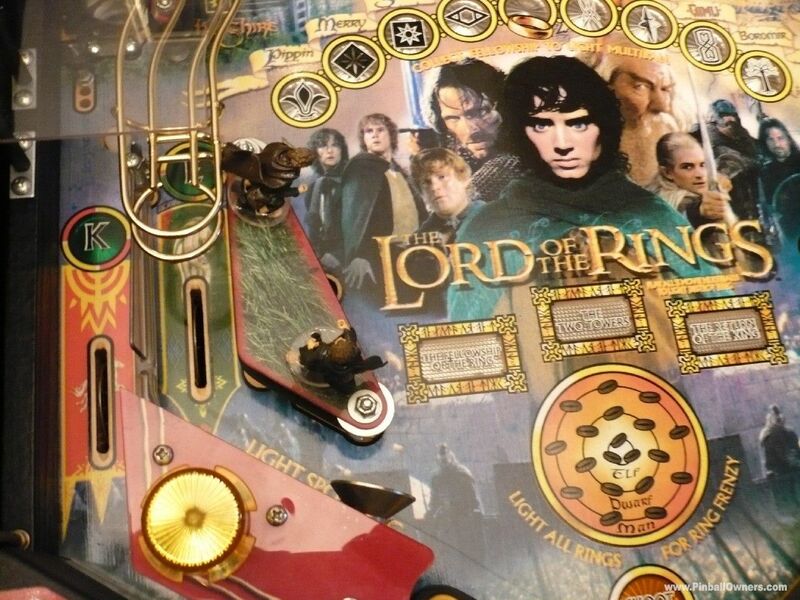 THE LORD OF THE RINGS Stern (USA) Vendu 2004 (May). 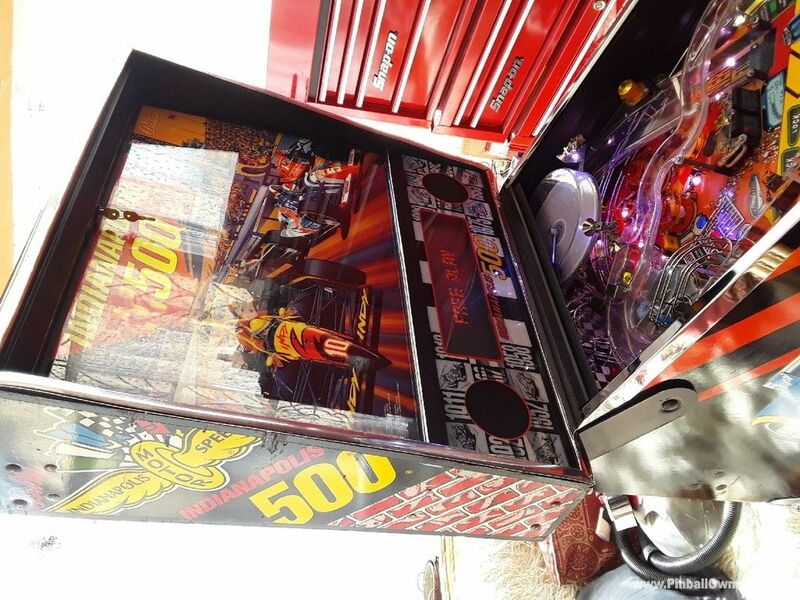 Beautiful HUO condition unblemished cabinet And perfect play-field. 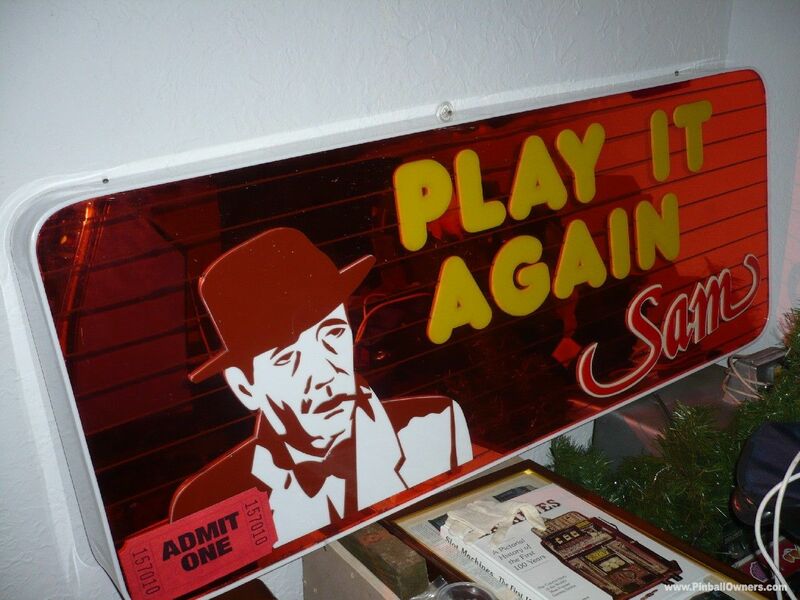 Plays better than new. 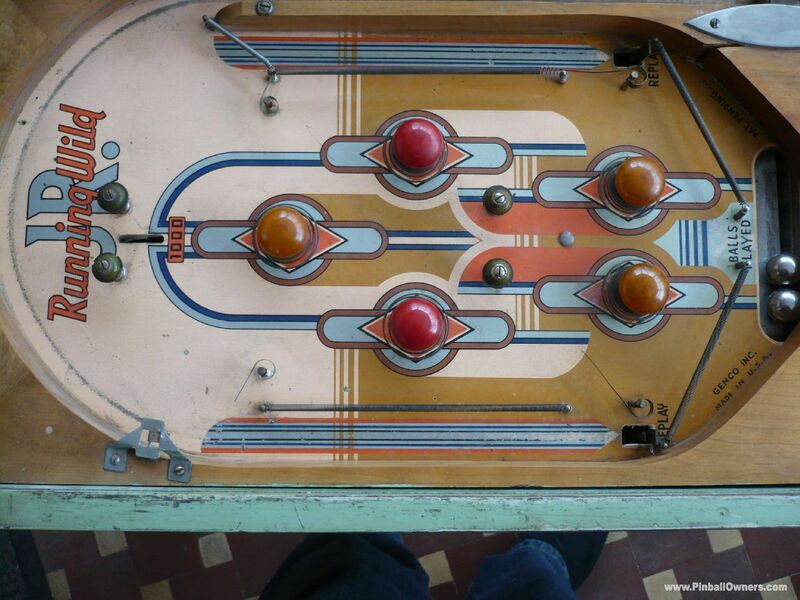 A game which can be as complex or as simple as you want it to be. 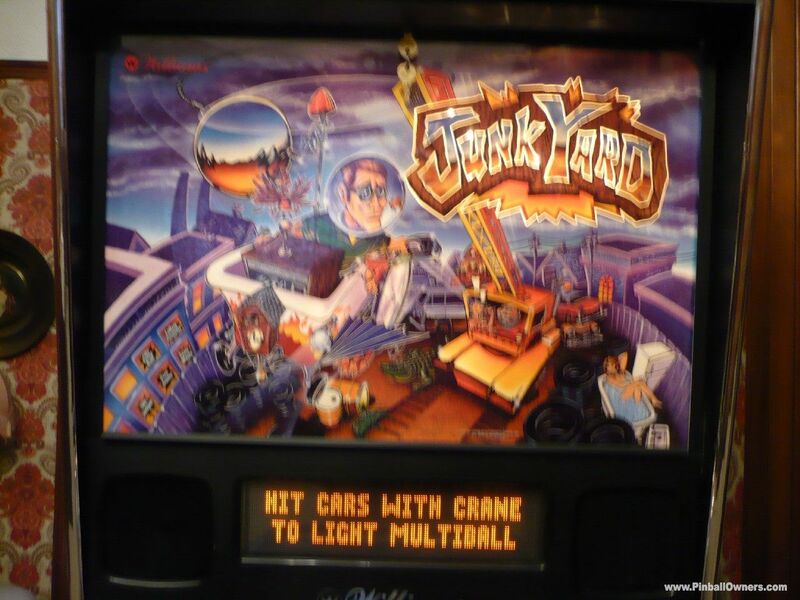 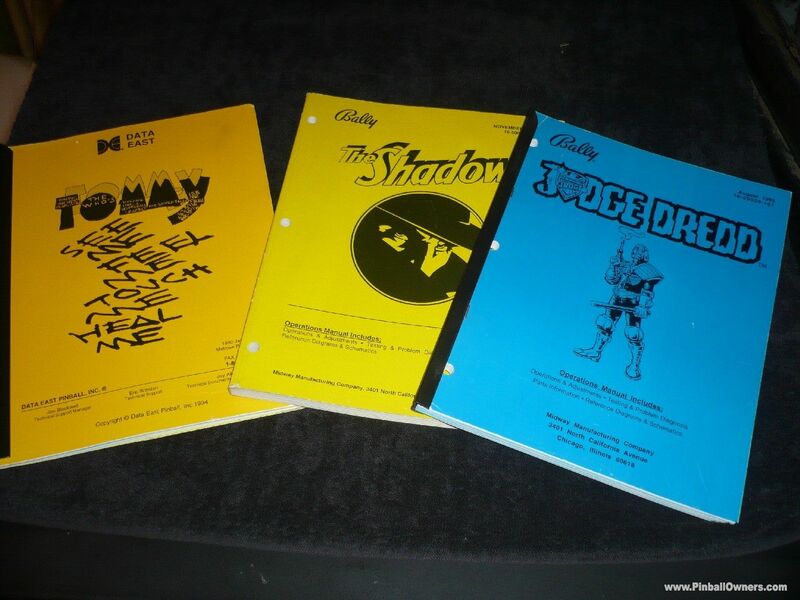 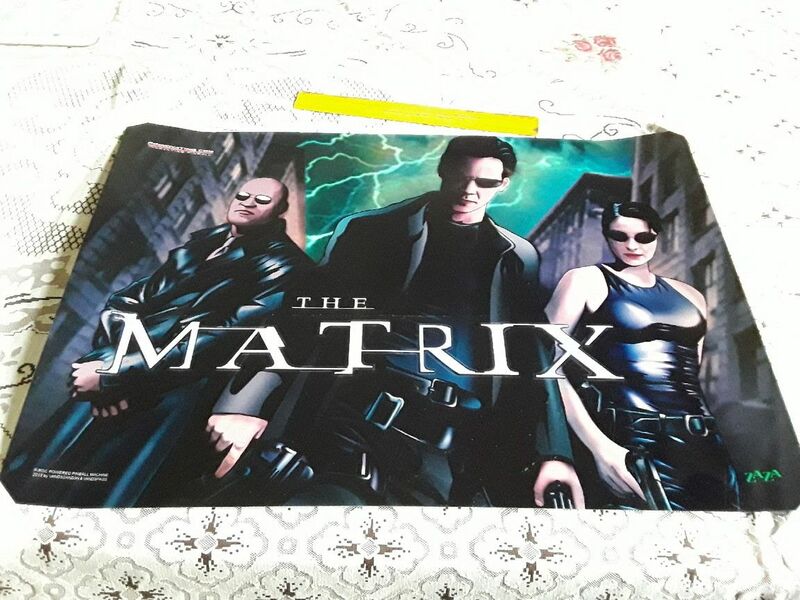 The Game play is target rich with a very busy dot matrix display with voices and music from the Three(3) films. 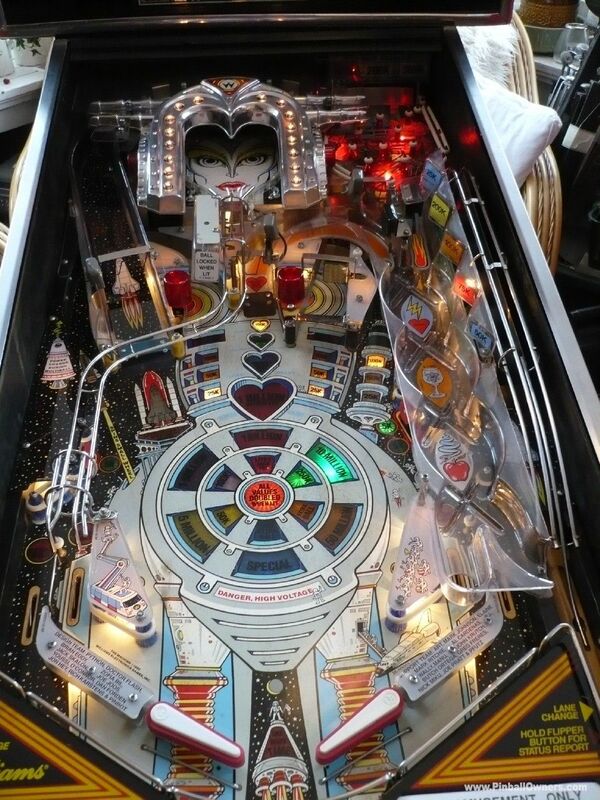 The game looks huge when fitted with polished stainless mirror blades. 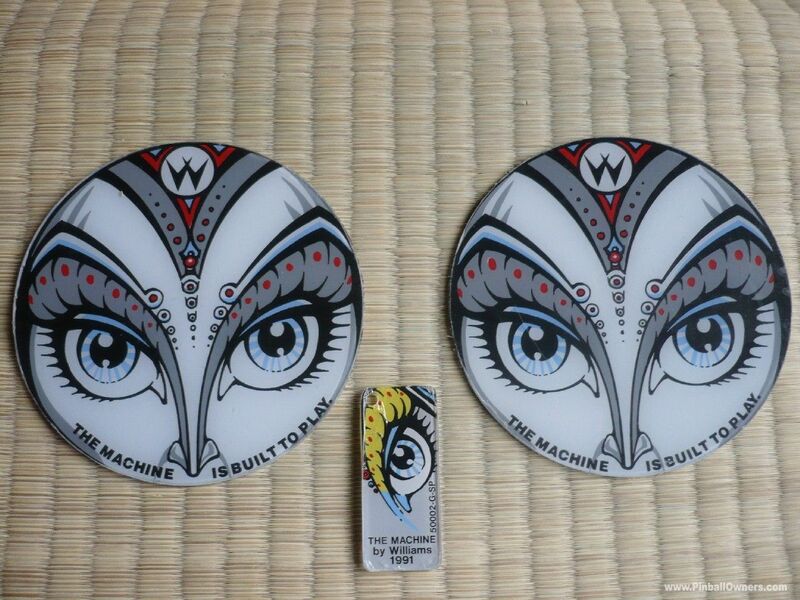 Collection/payment in person only. 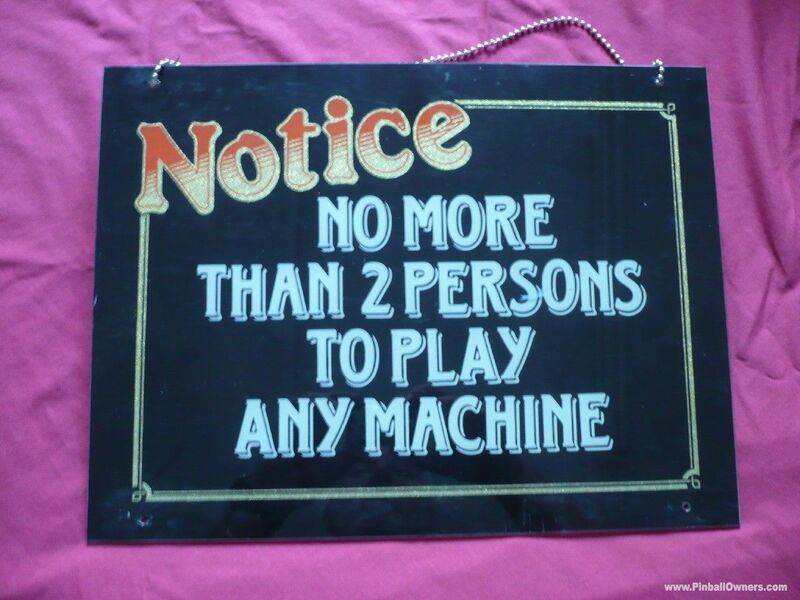 RESERVED. 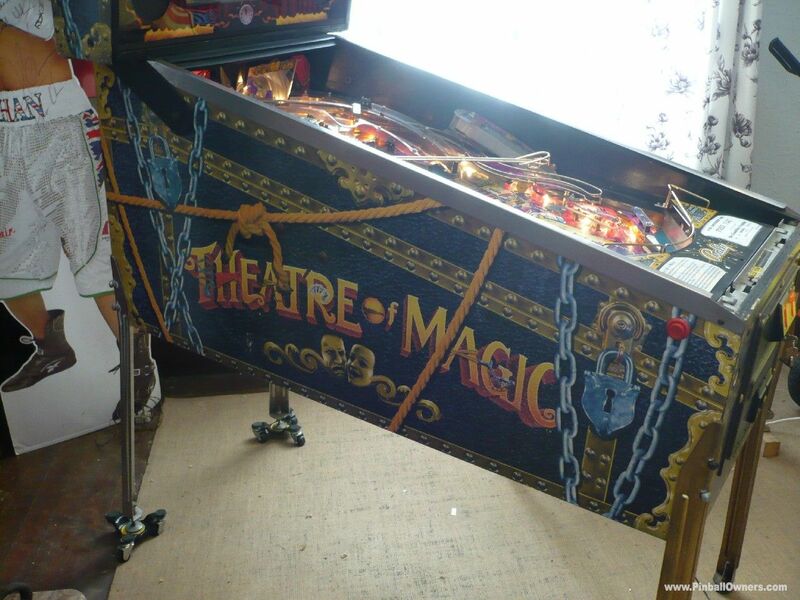 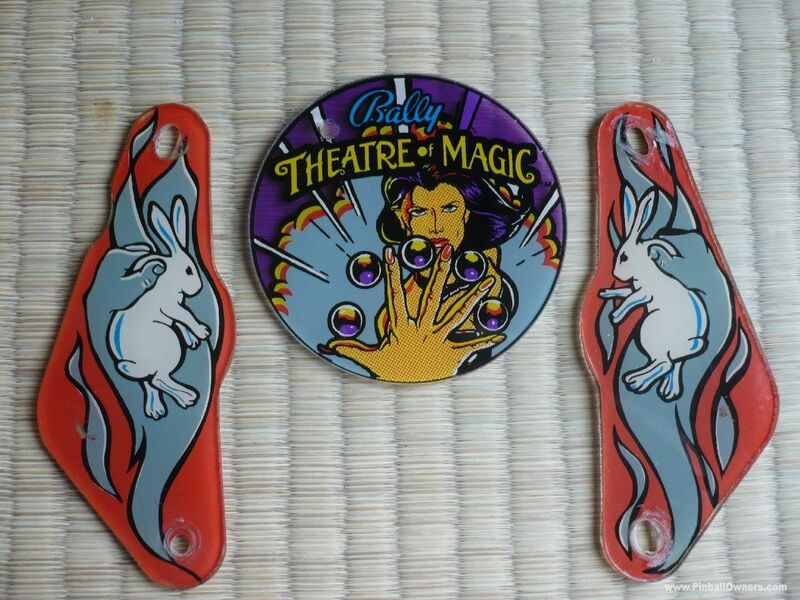 THEATRE OF MAGIC Bally (USA) Vendu March 1995. 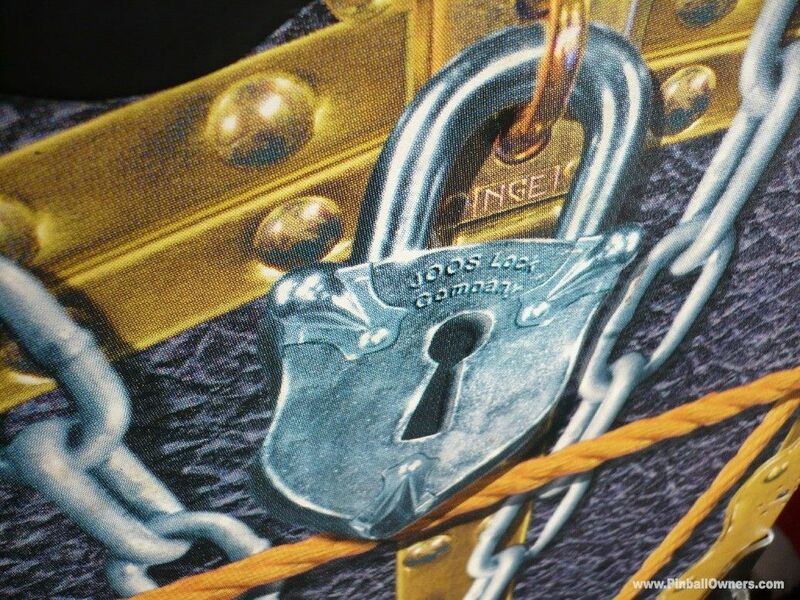 Very very clever trompe-l'oeil art work which most reckon to be the best ever. 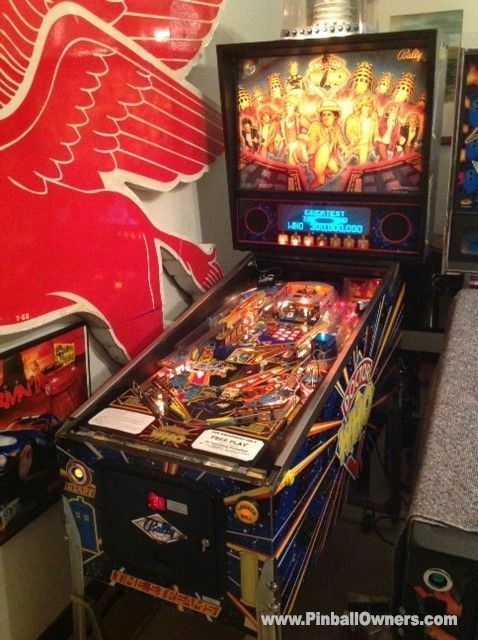 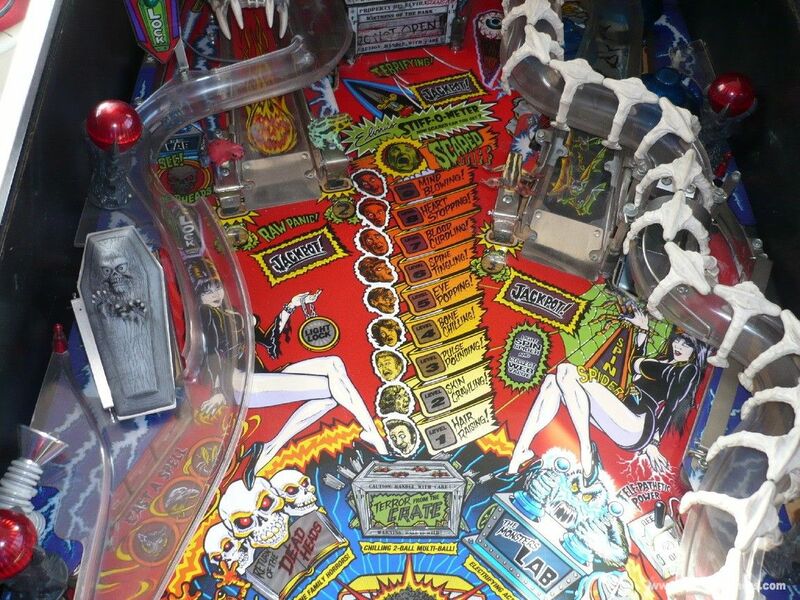 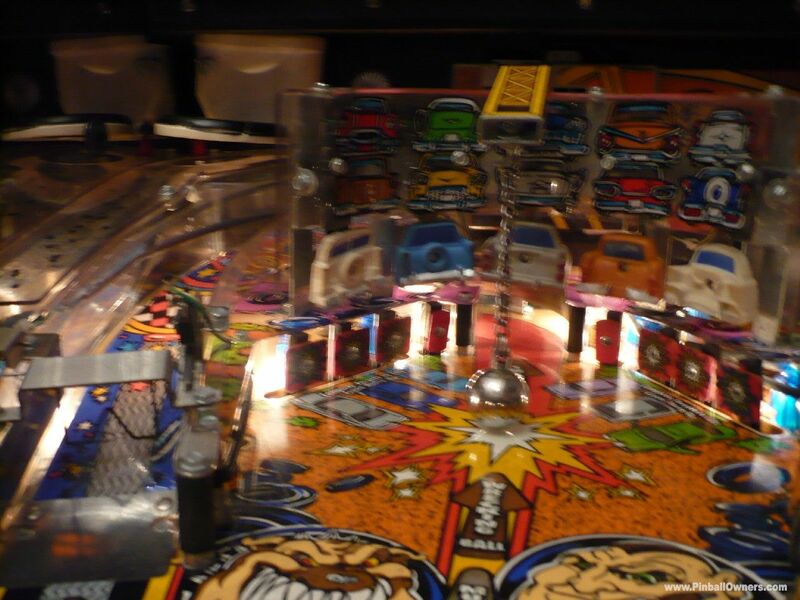 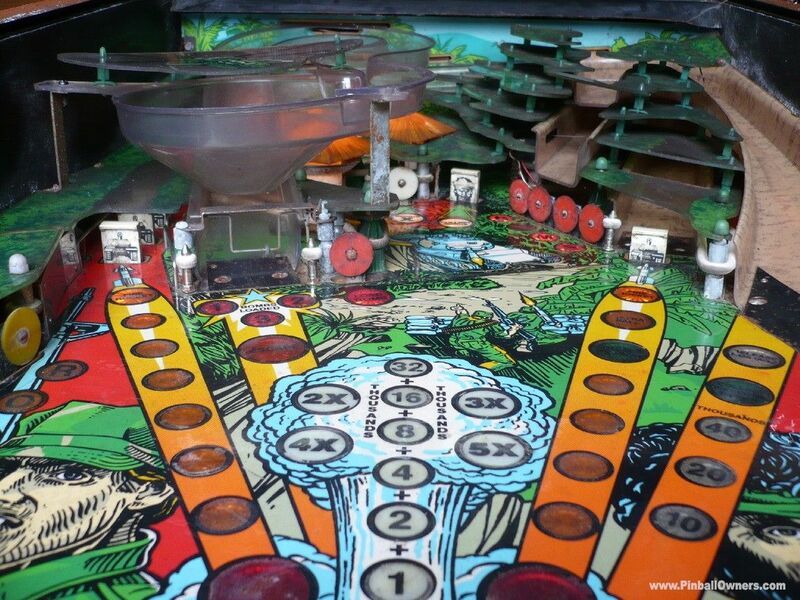 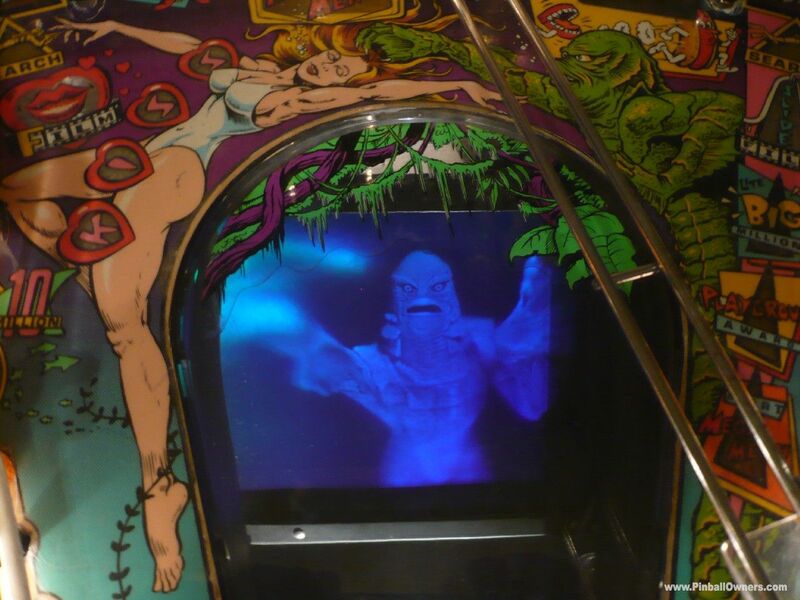 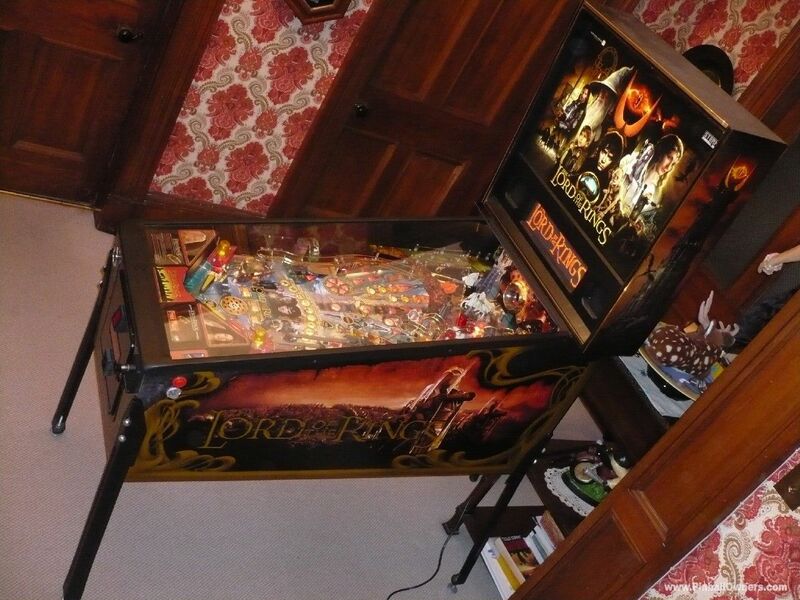 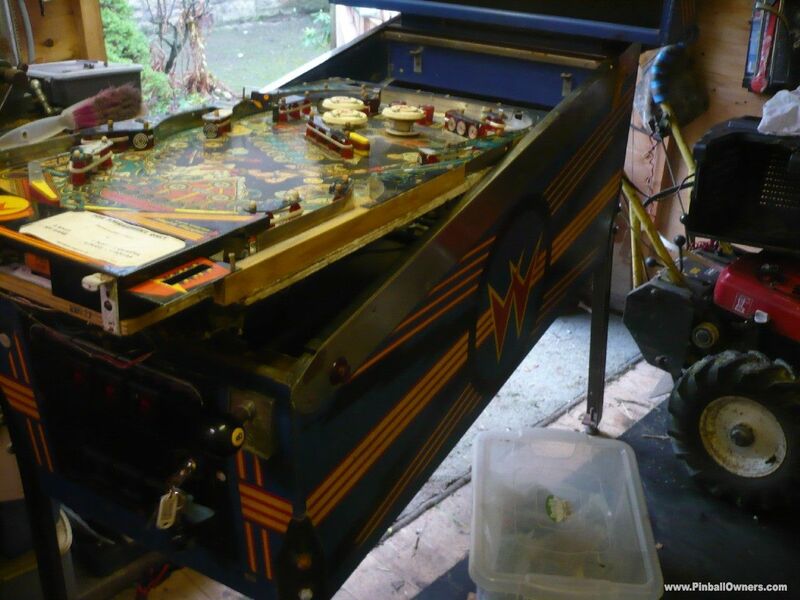 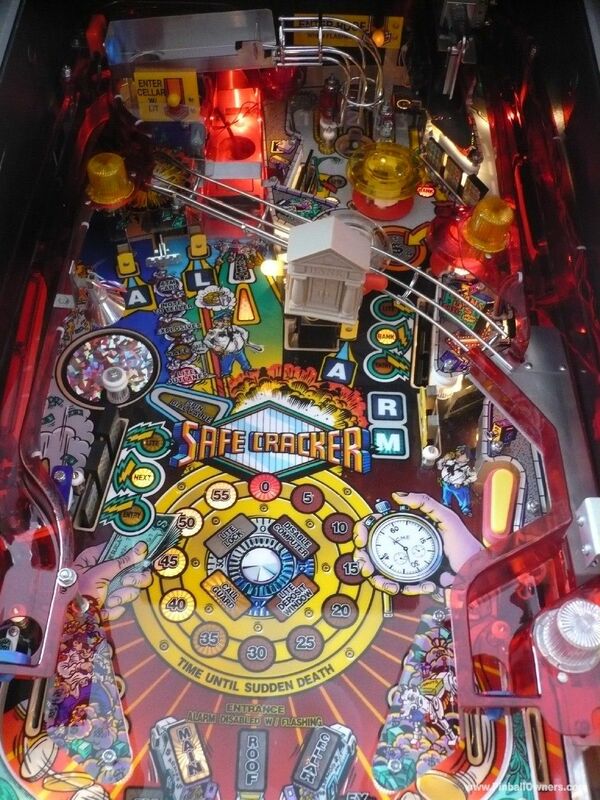 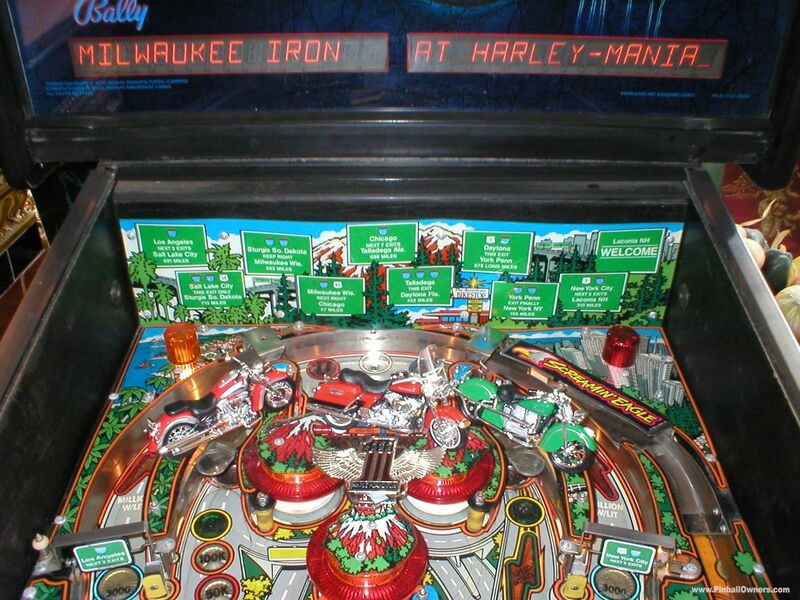 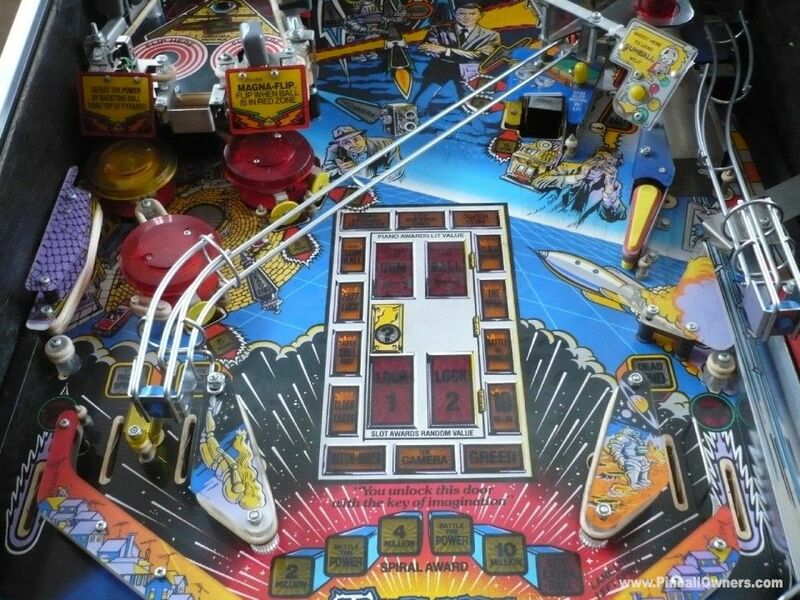 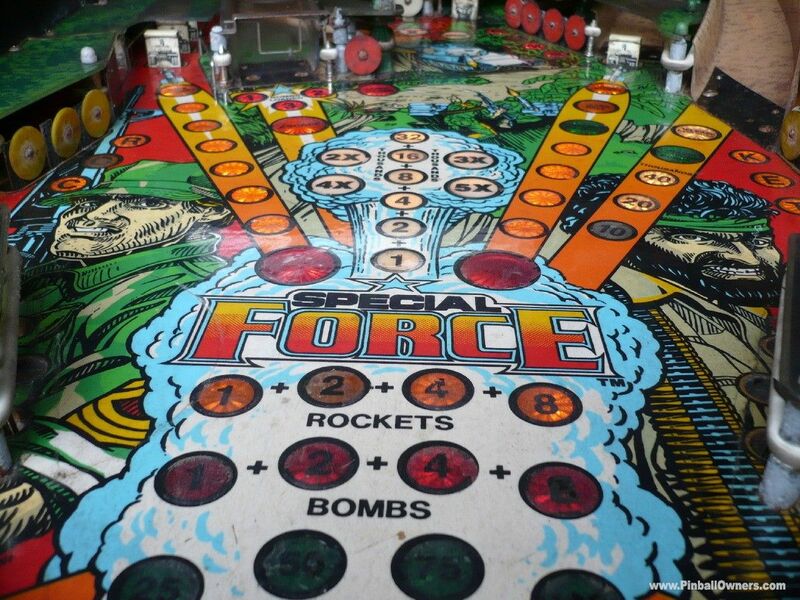 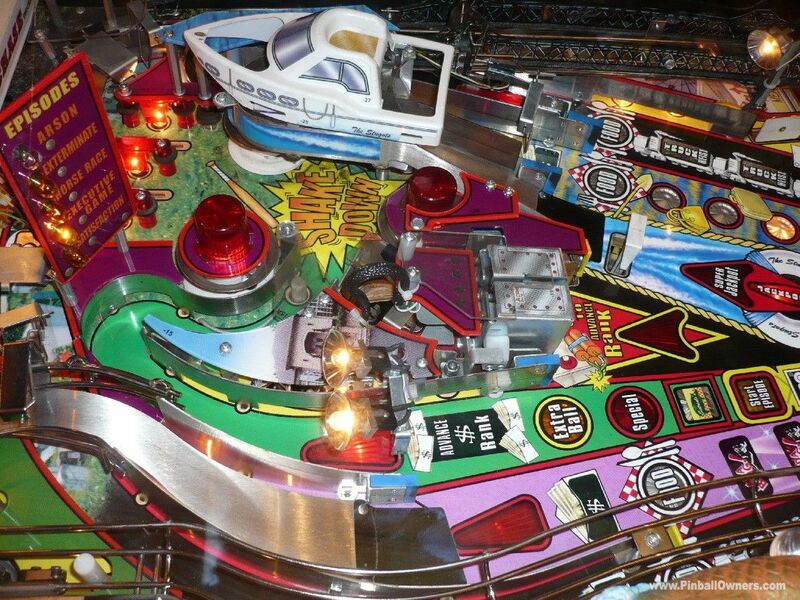 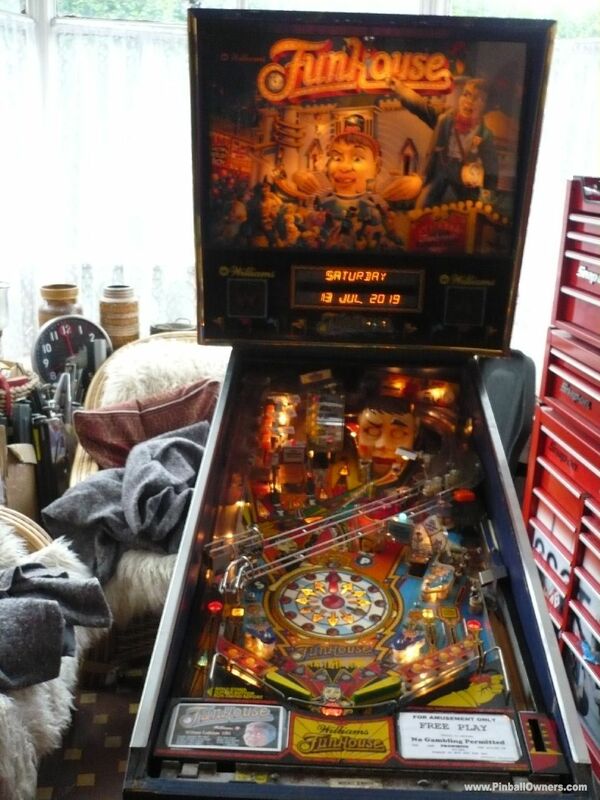 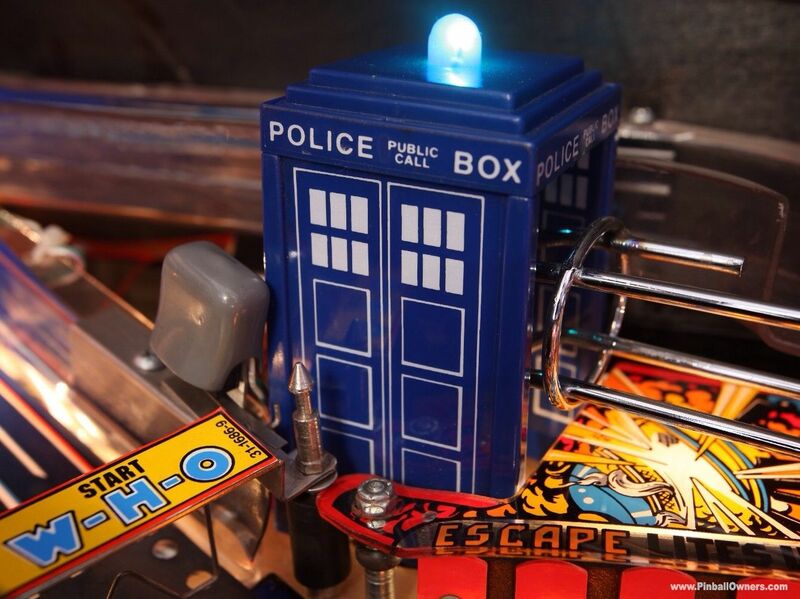 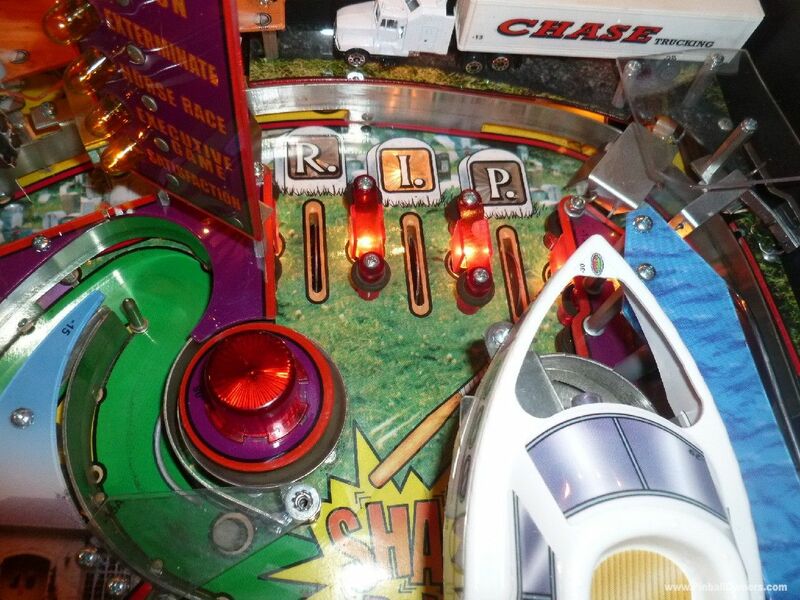 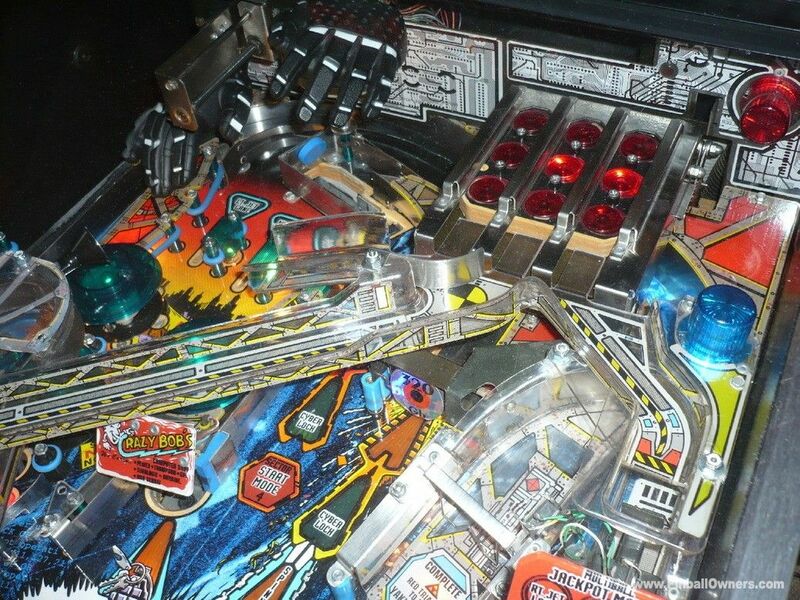 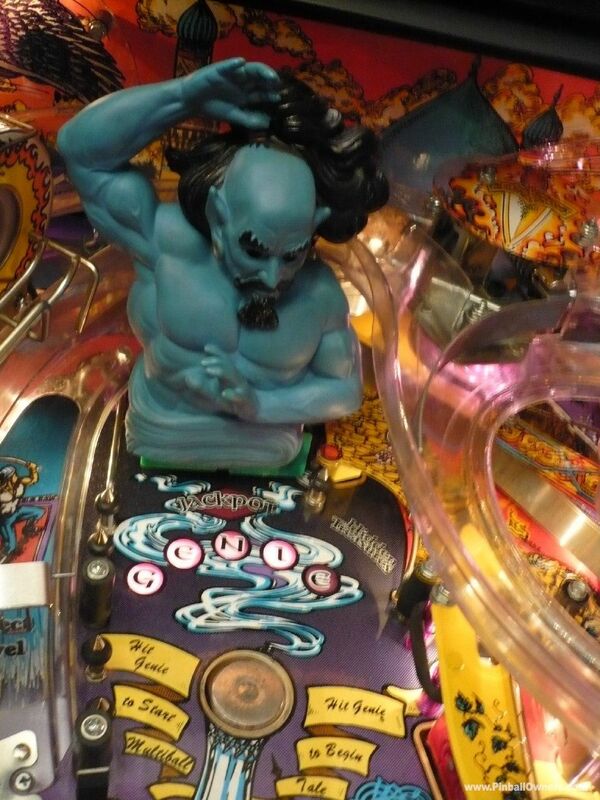 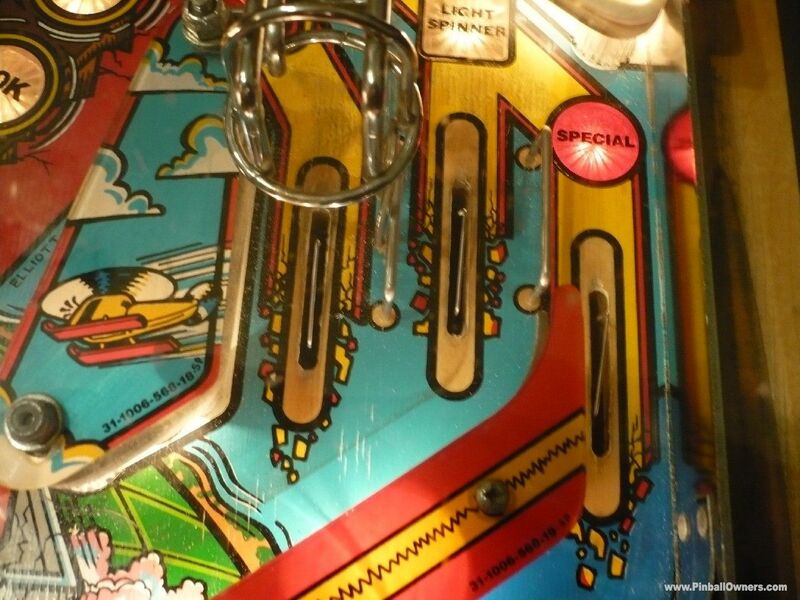 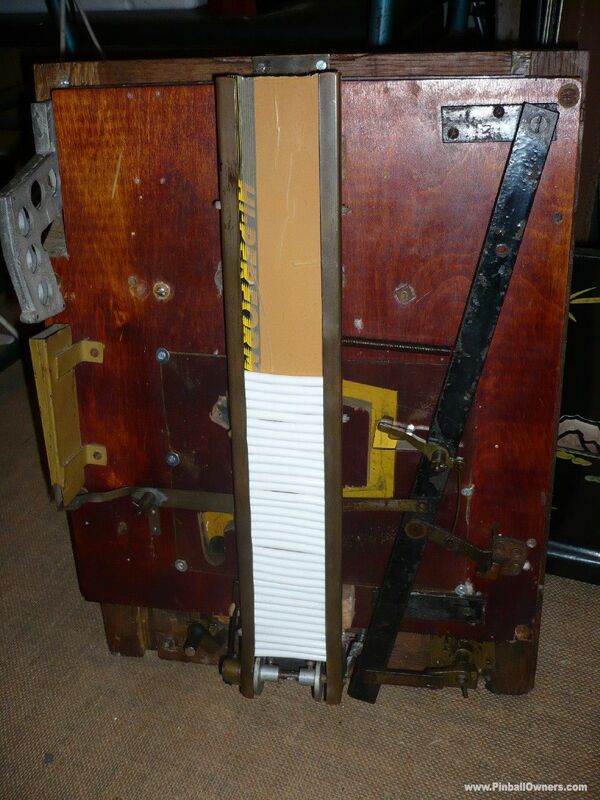 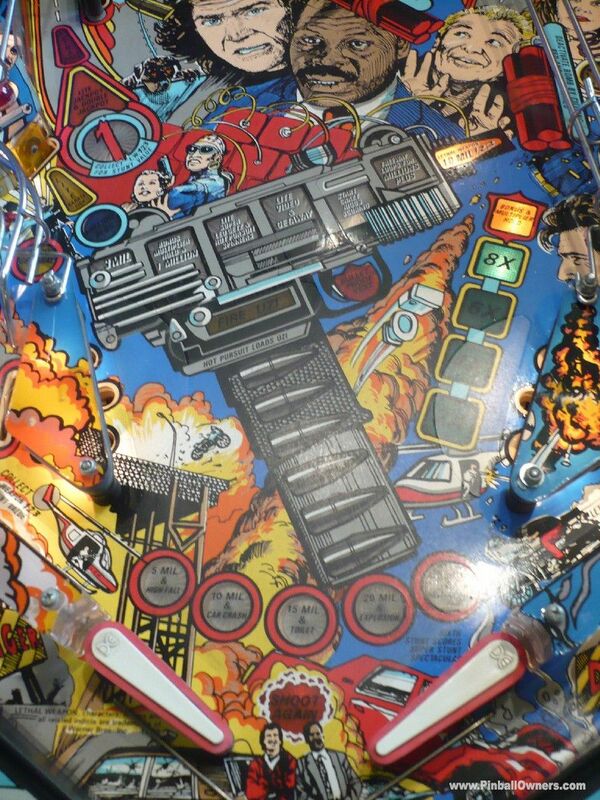 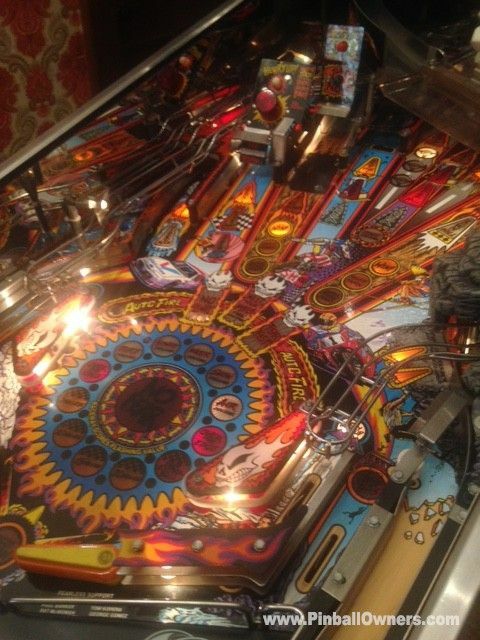 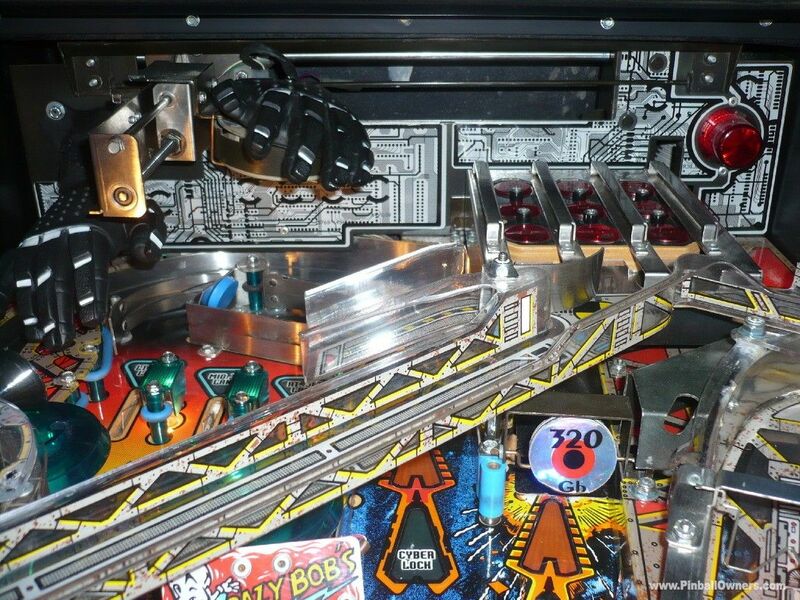 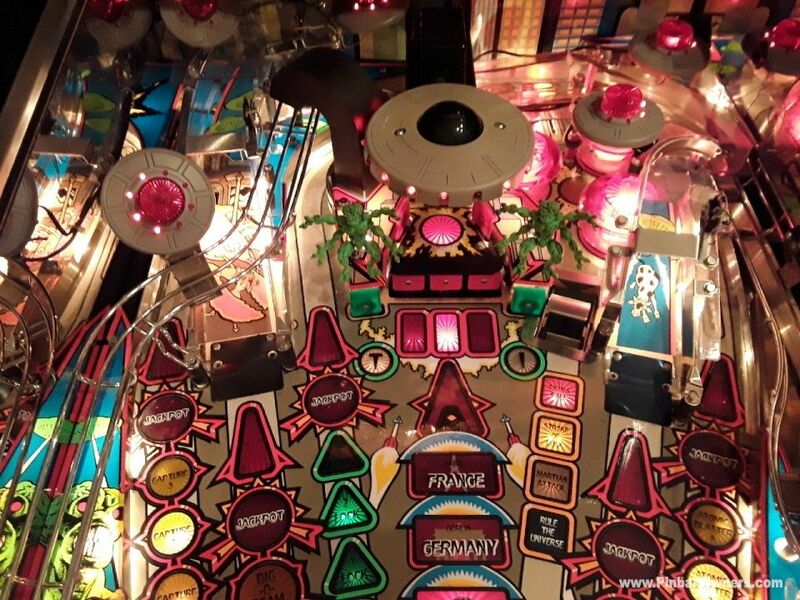 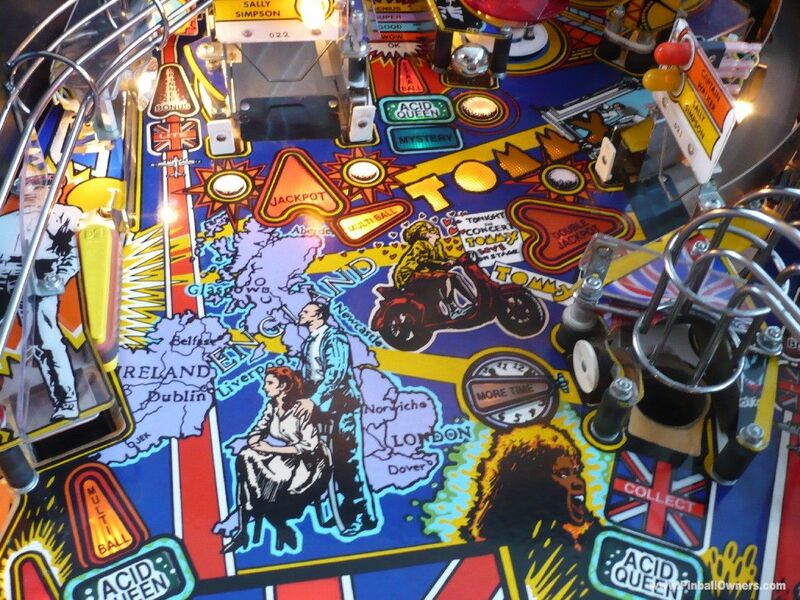 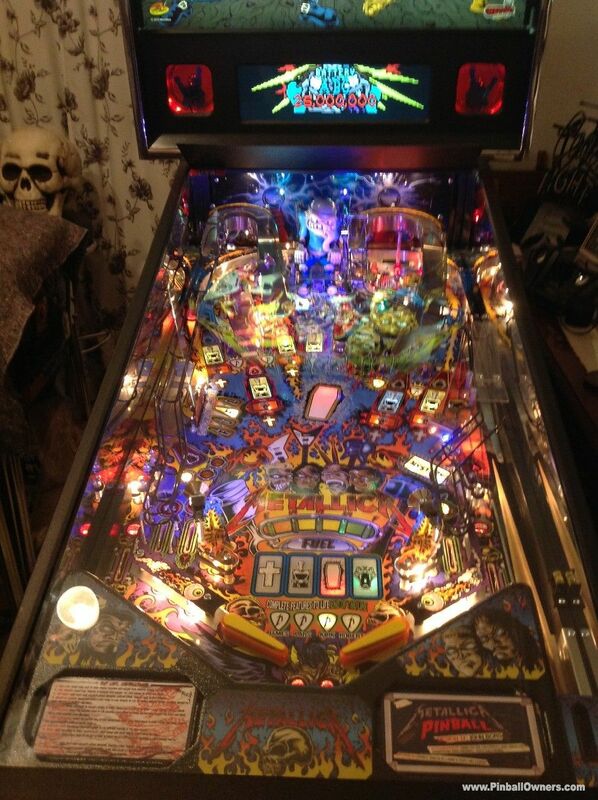 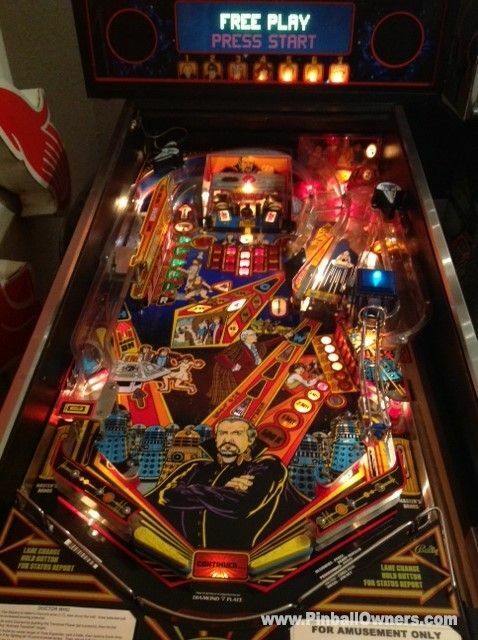 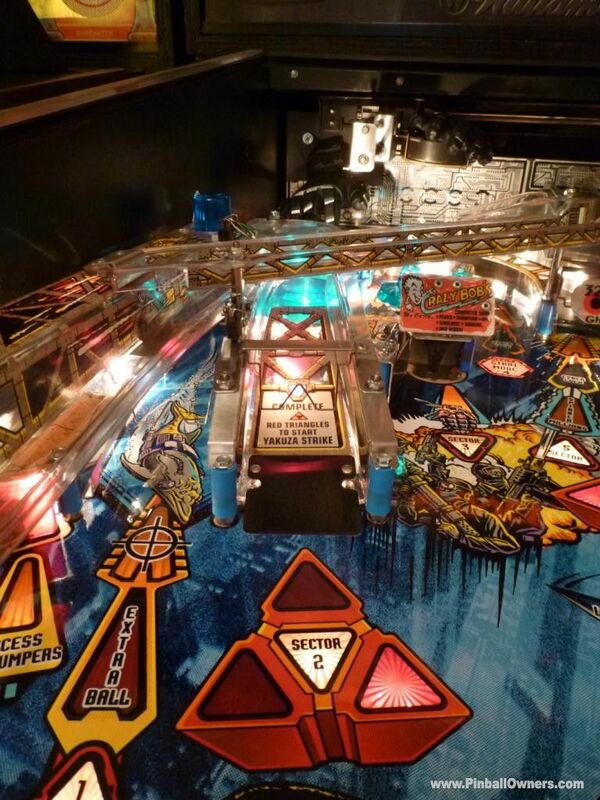 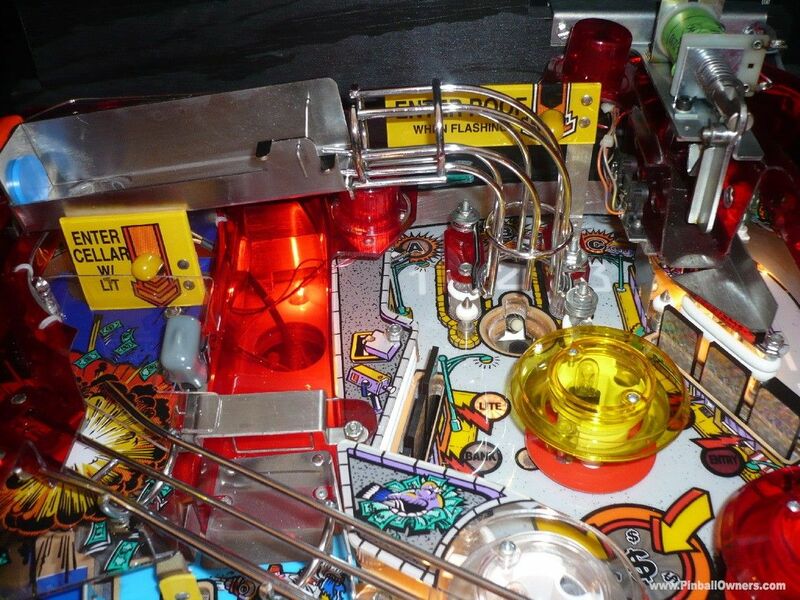 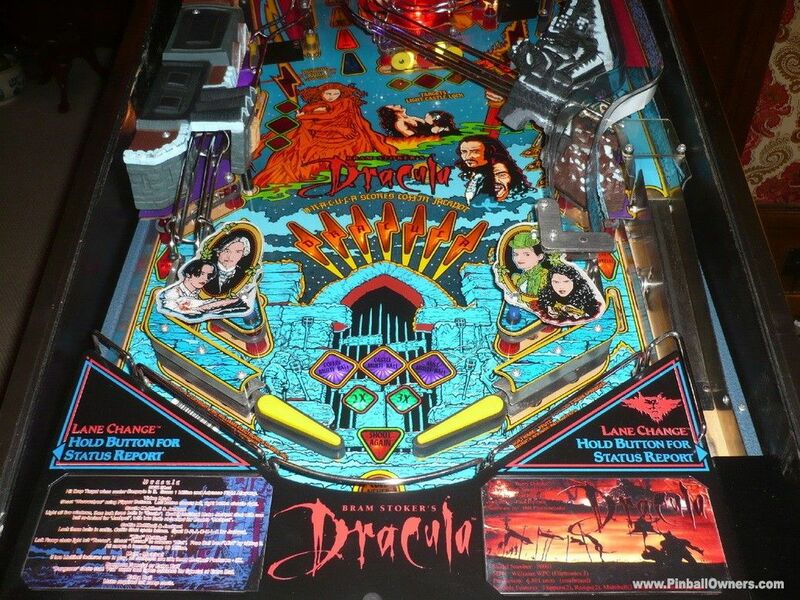 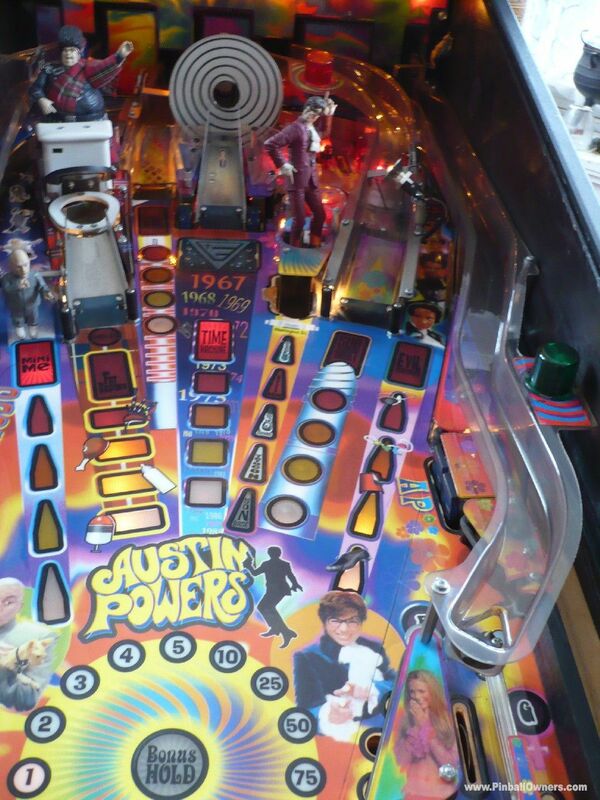 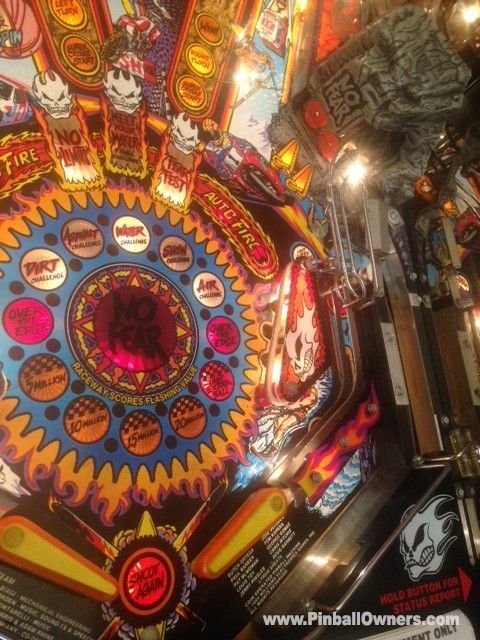 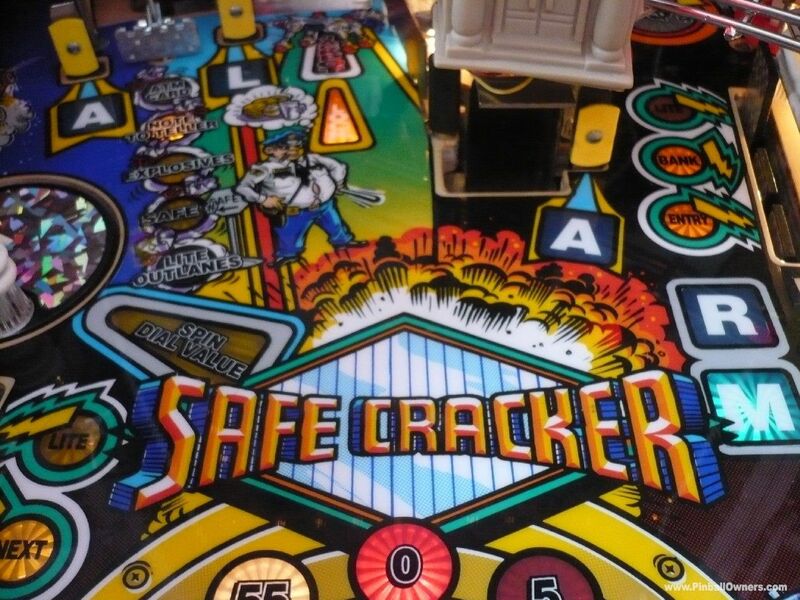 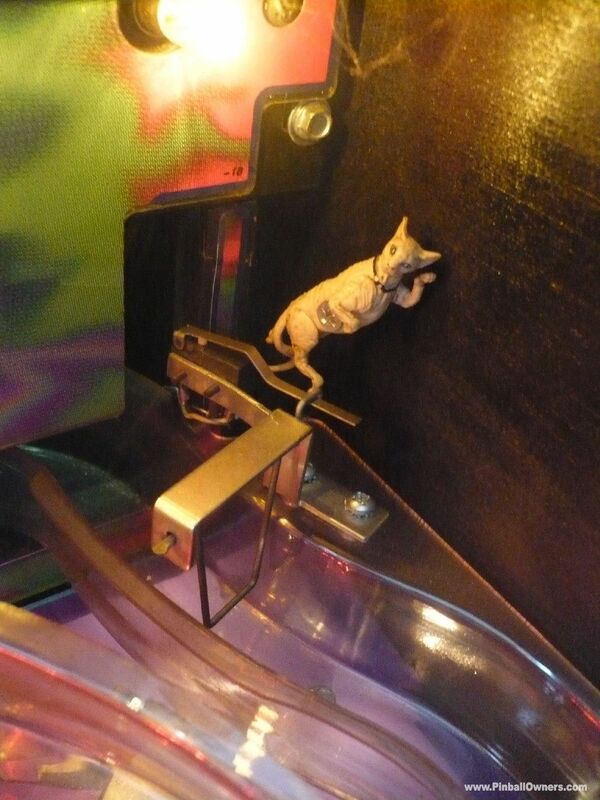 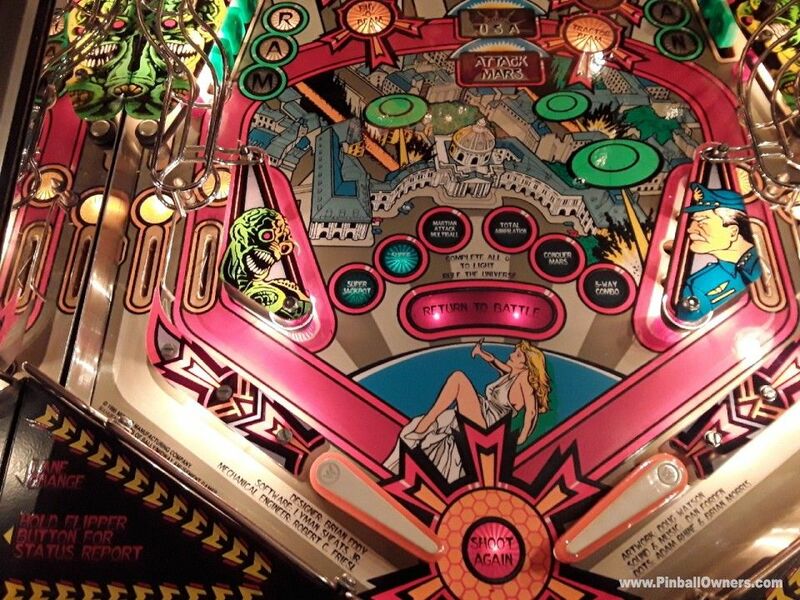 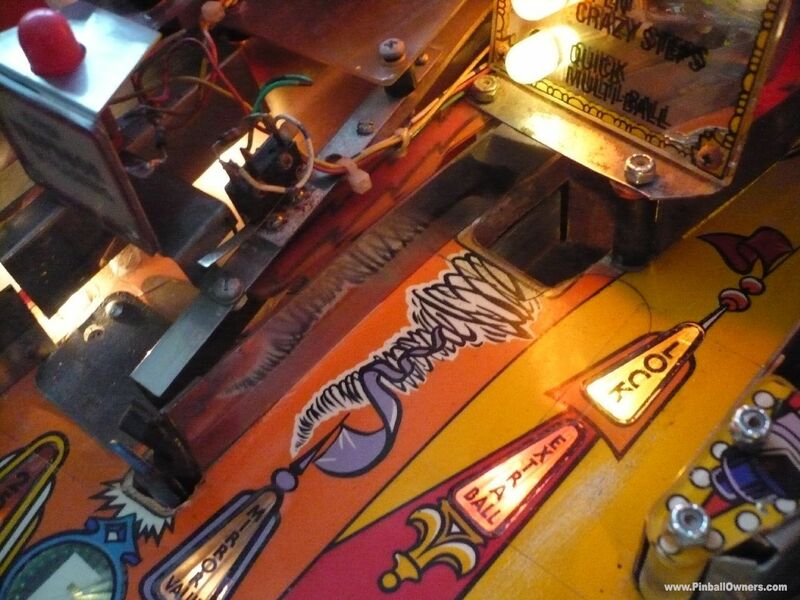 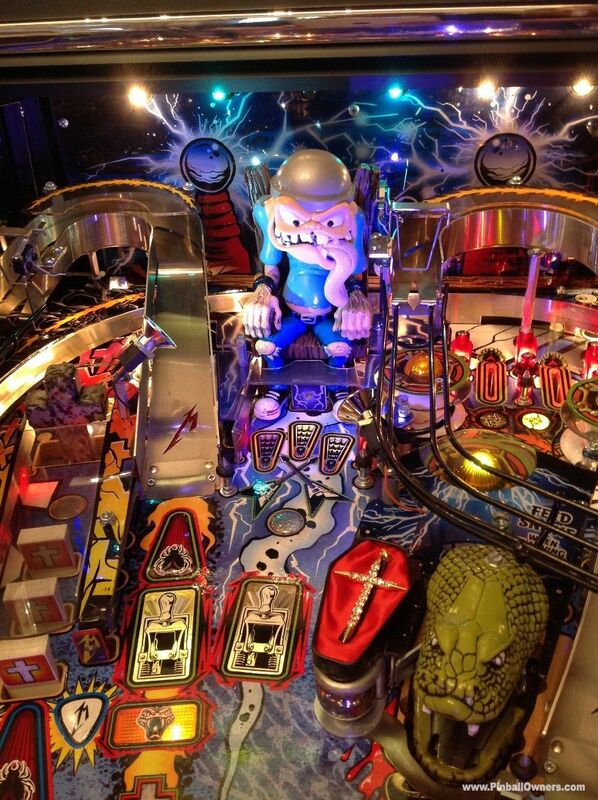 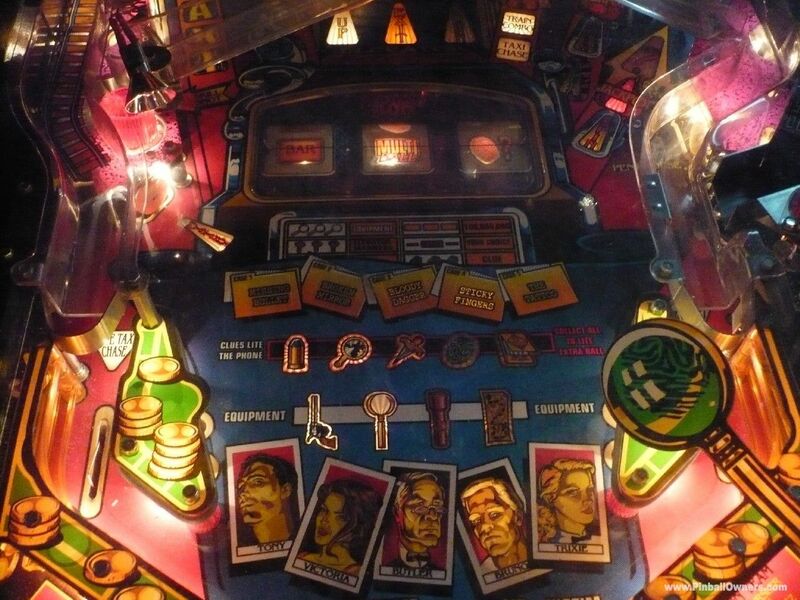 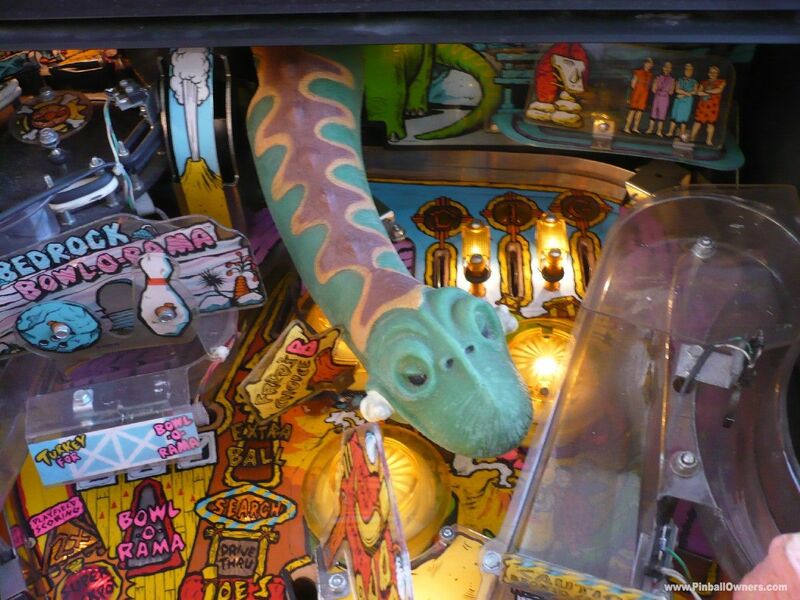 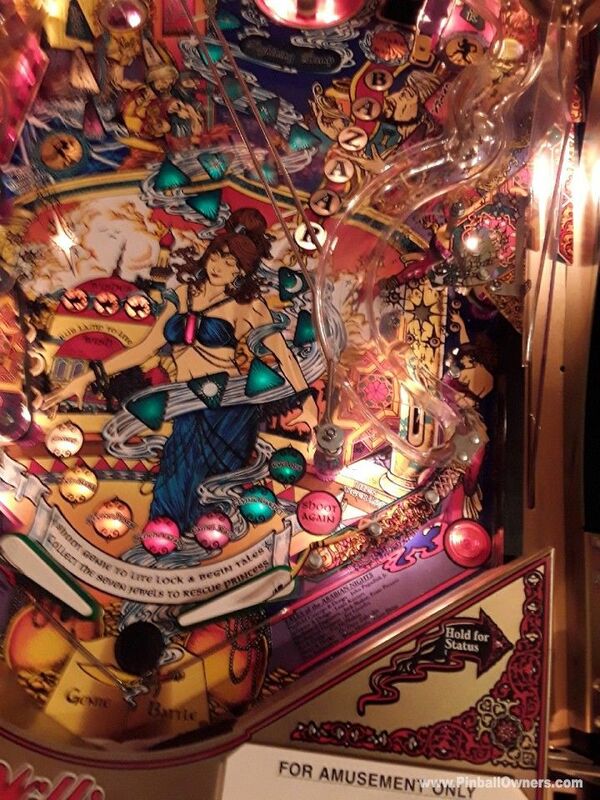 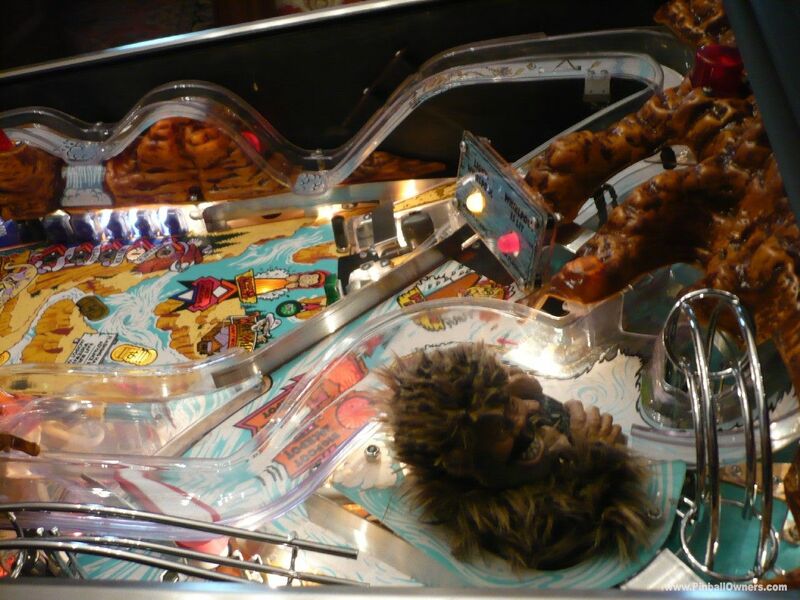 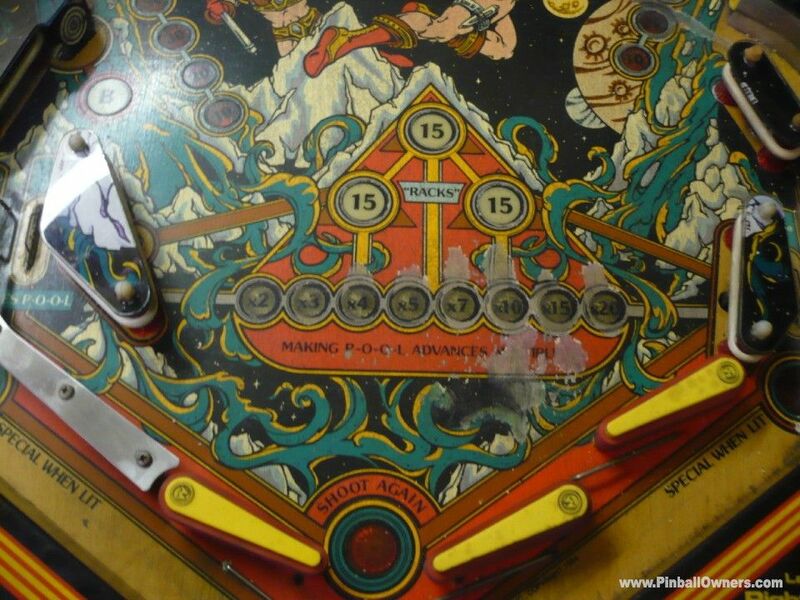 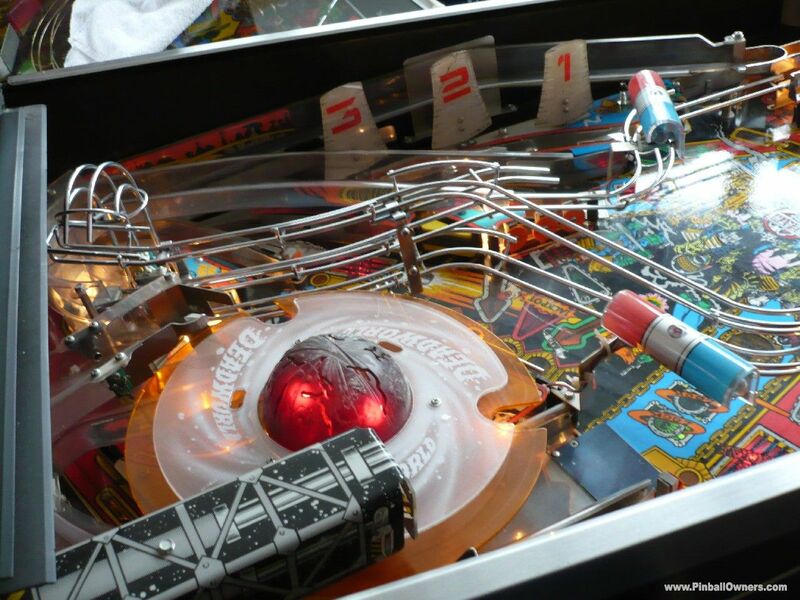 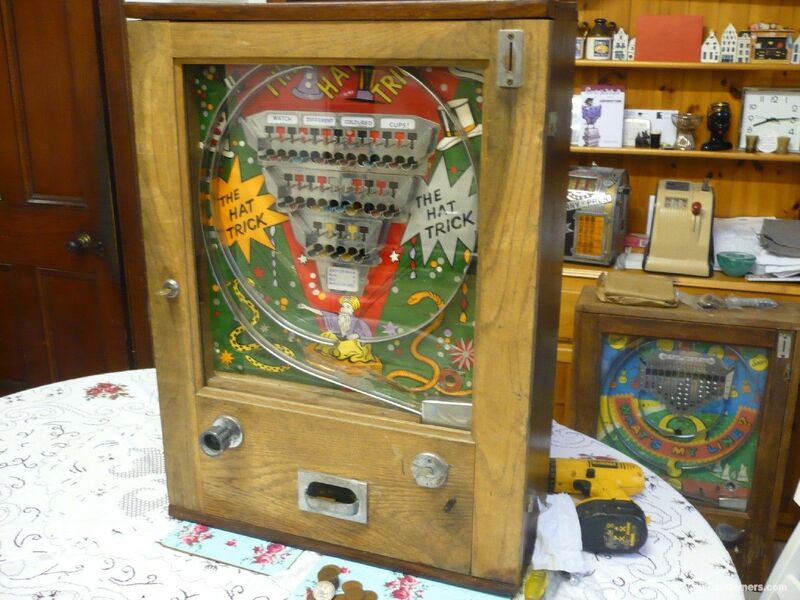 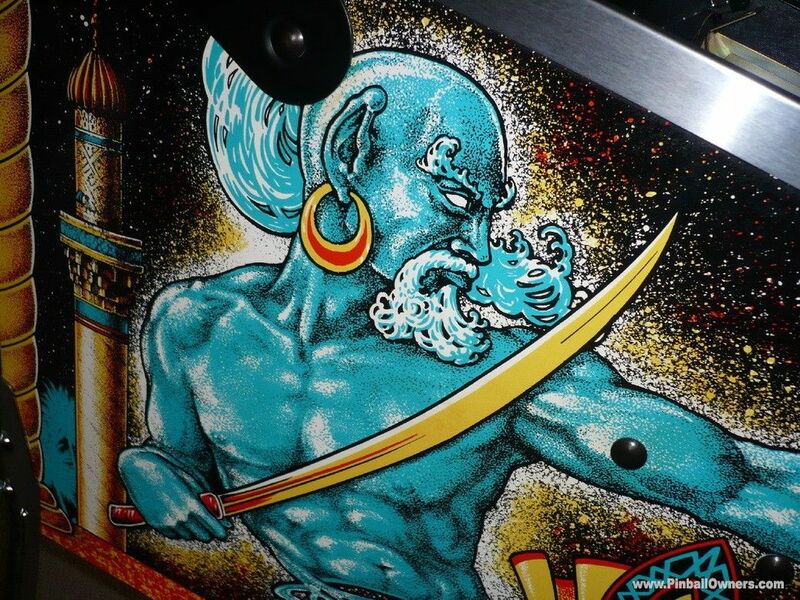 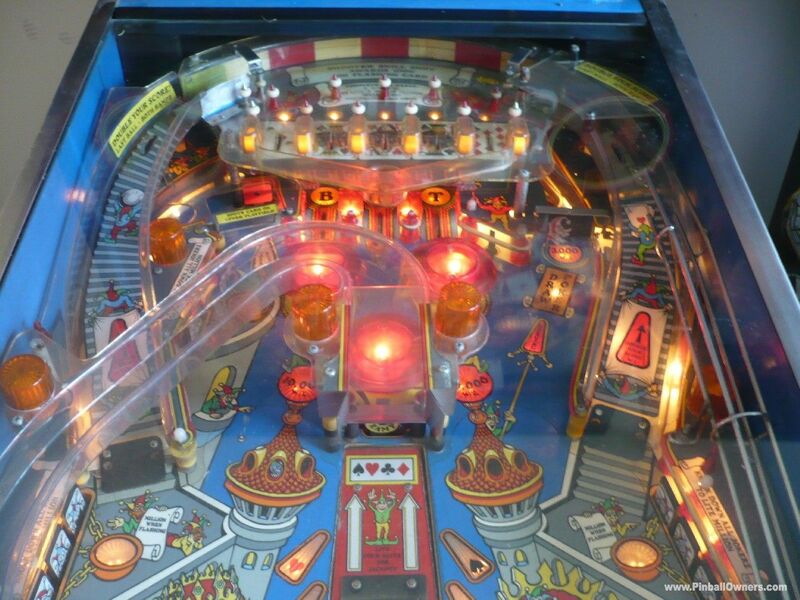 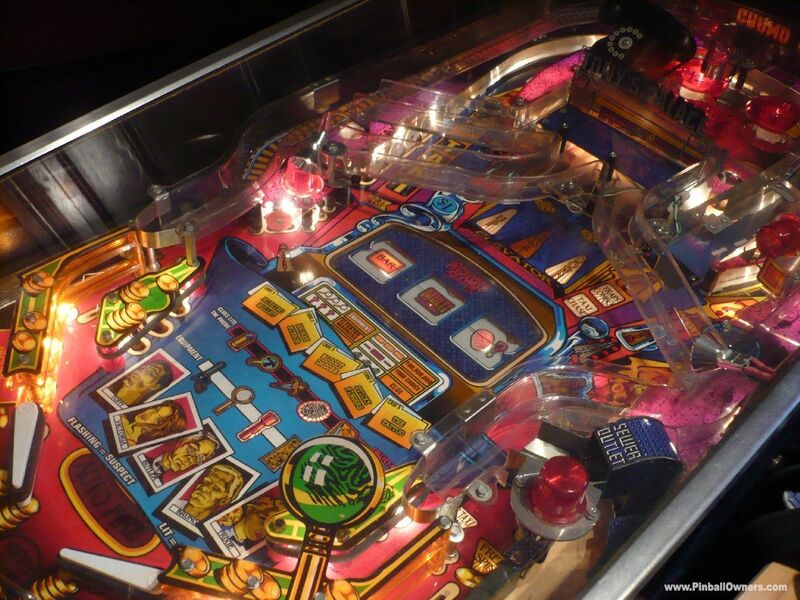 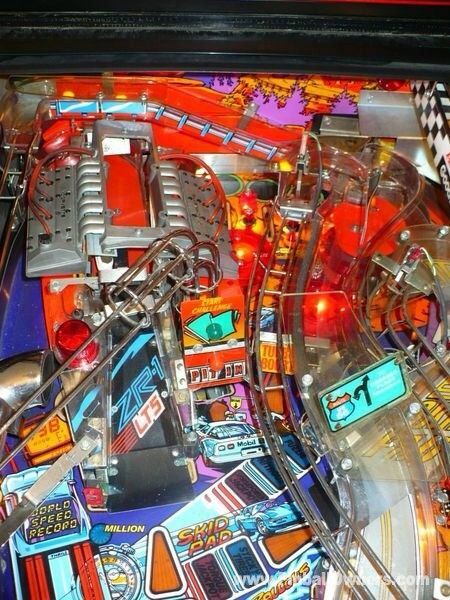 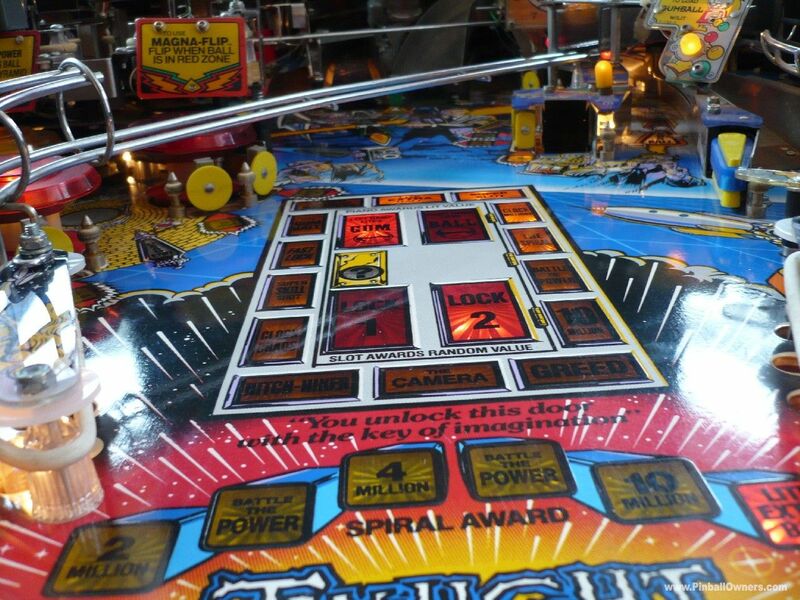 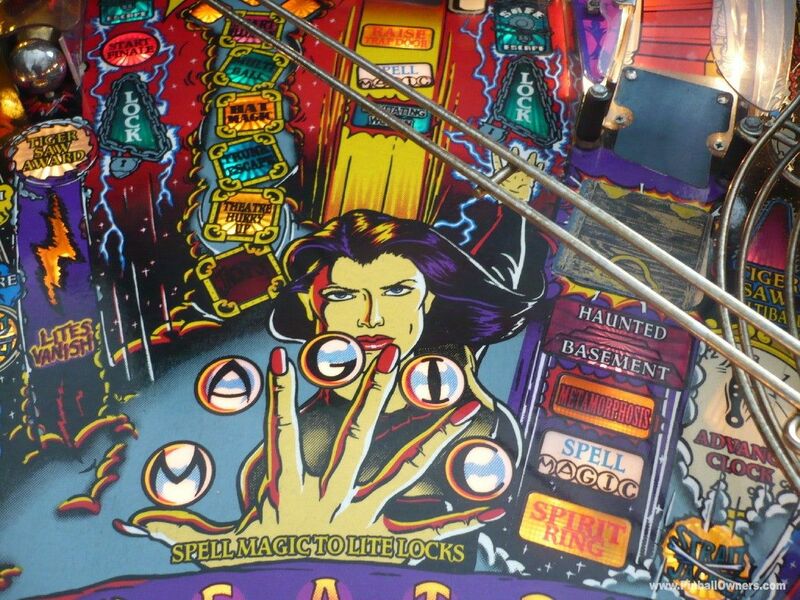 Its a lovely pin to play with an unmarked playfield. 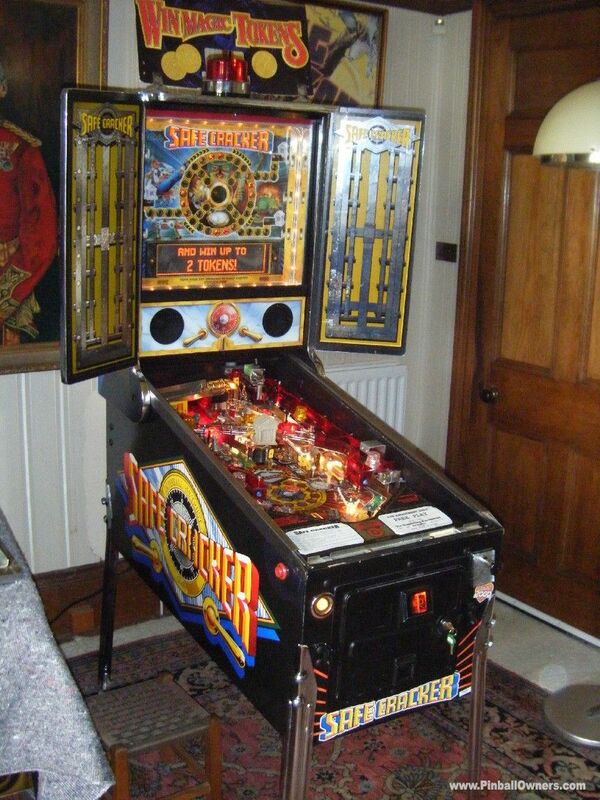 This one lends itself to be BLINGED!! 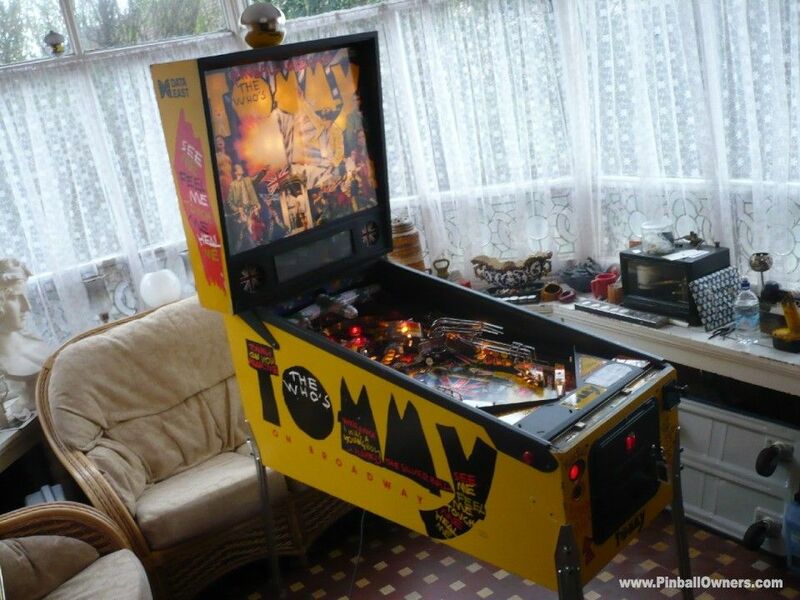 TOMMY Data East (USA) Vendu Never = Probably 1994 (29th.January) Nice cabinet with excellent playfield. 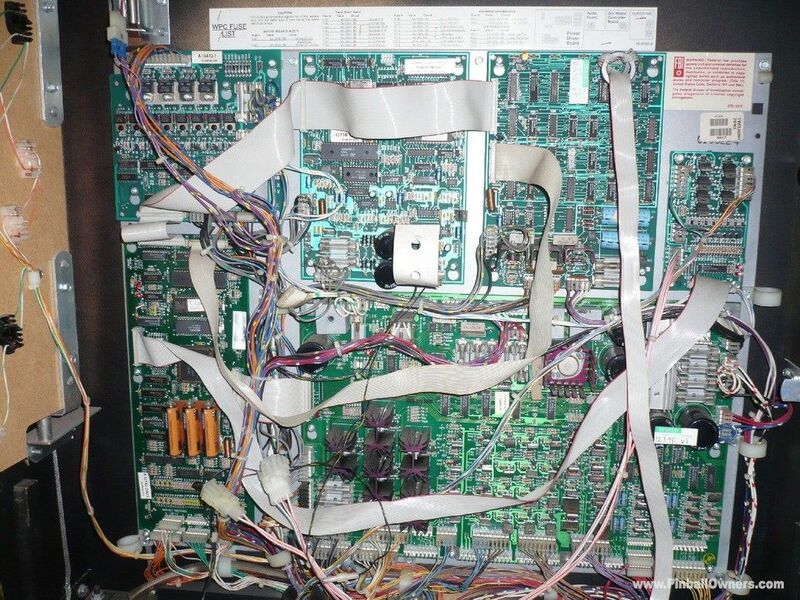 All features work perfectly. 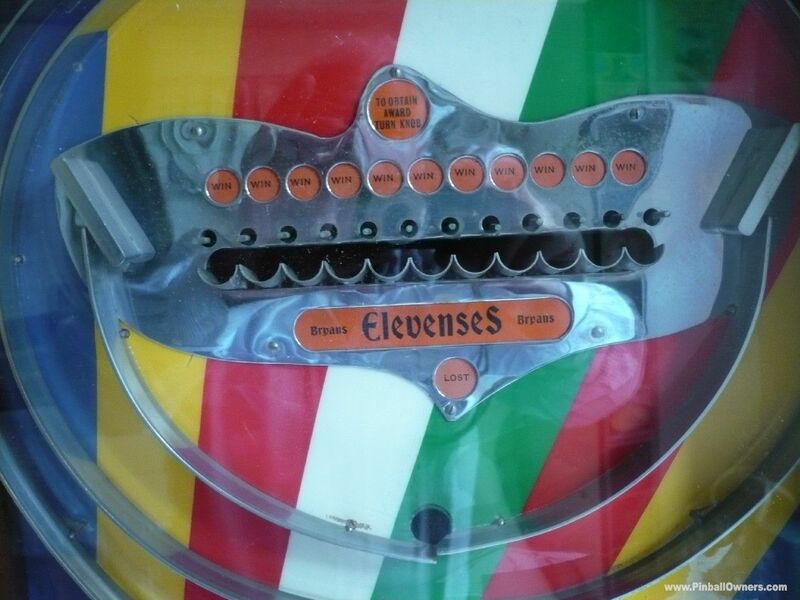 Comprehensive sounds, light effects and music. 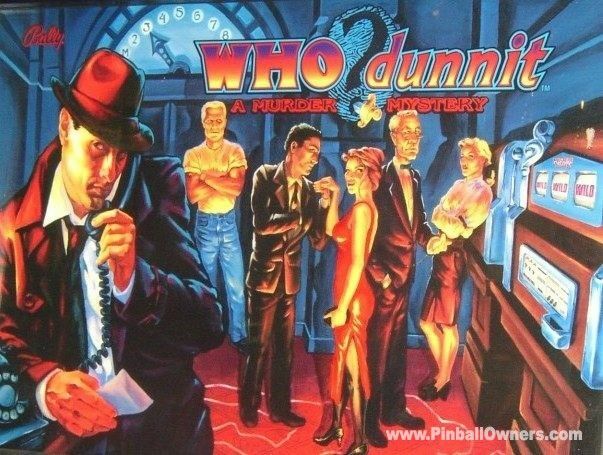 For those who have never had a game on The Who there's a lot of surprises and a deep game to master. 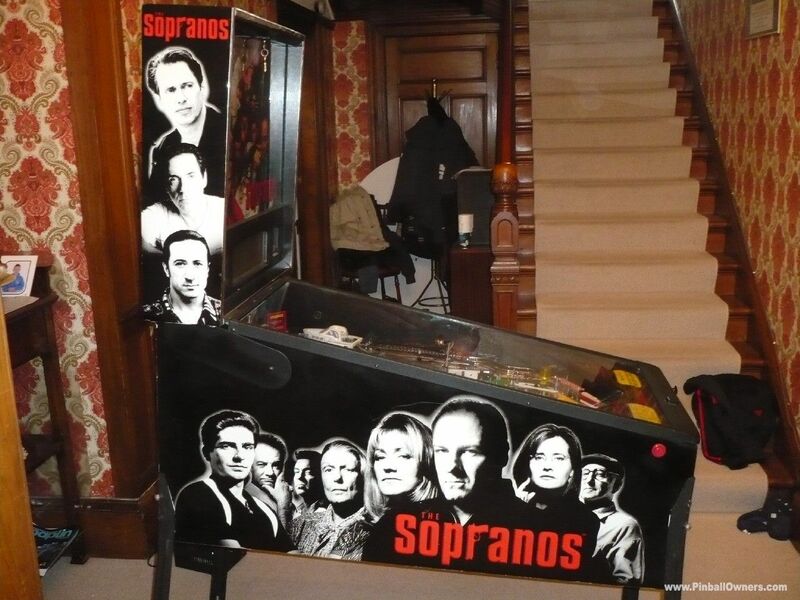 If I didn't have, I'd want. 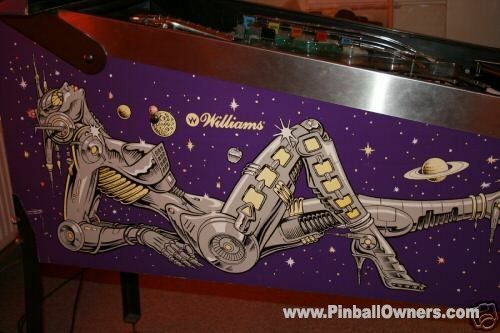 RESERVED. 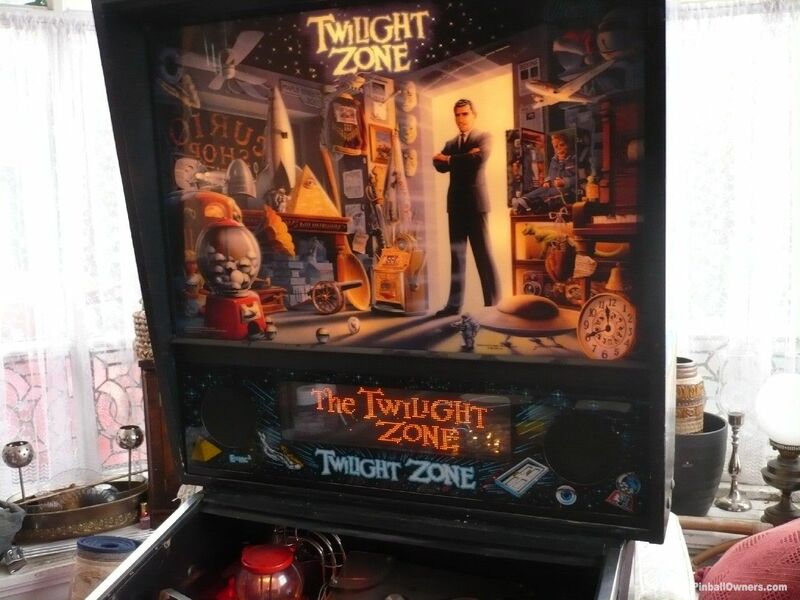 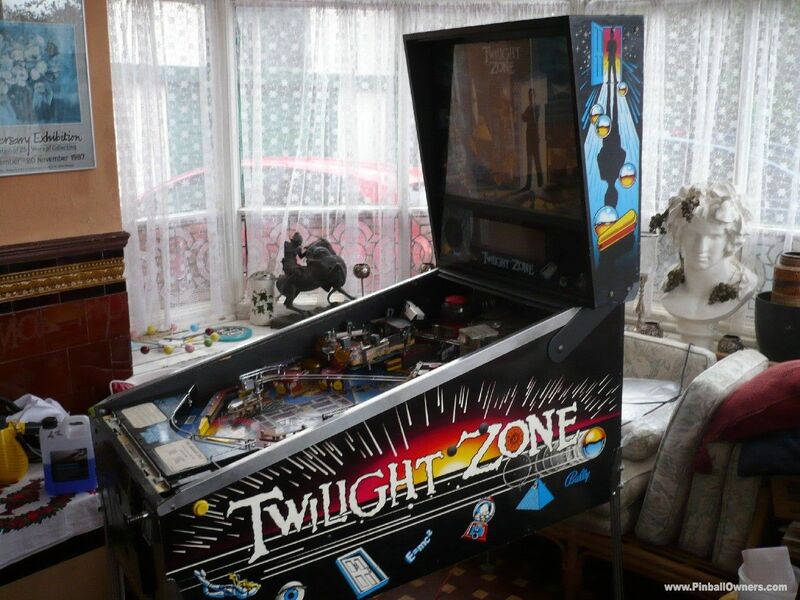 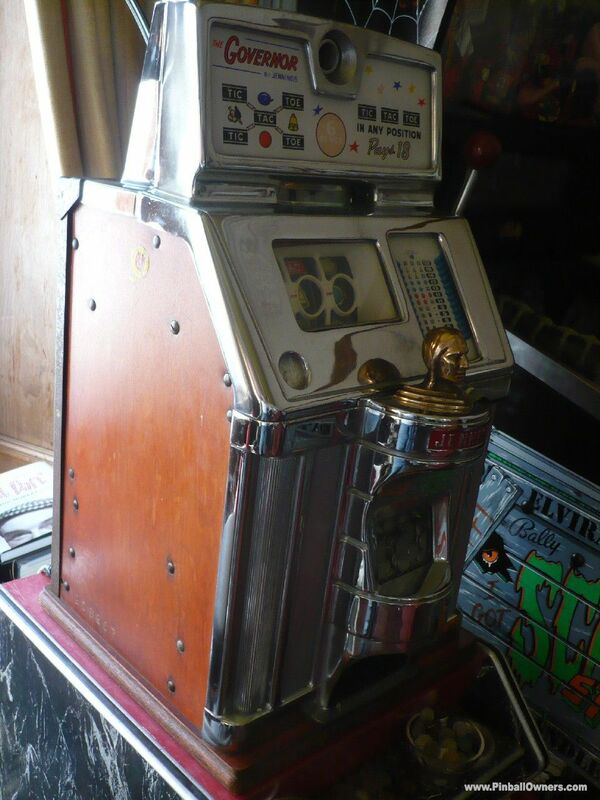 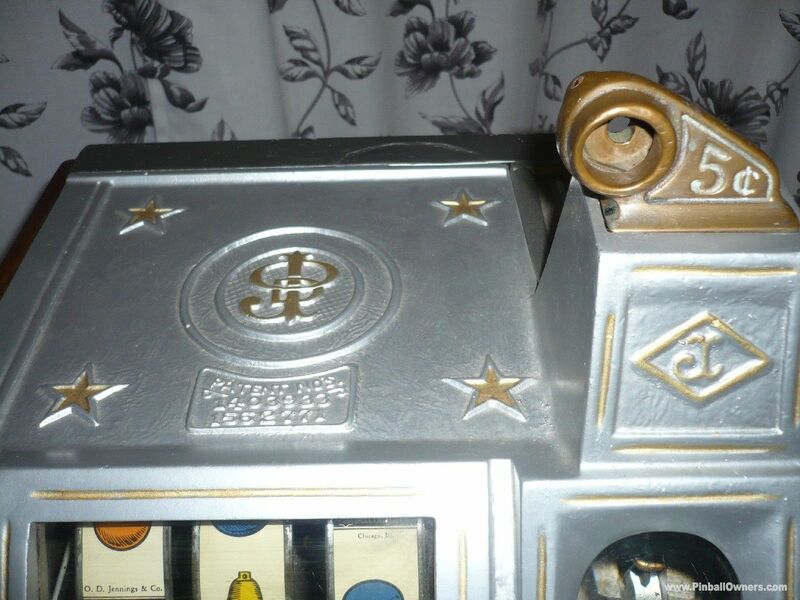 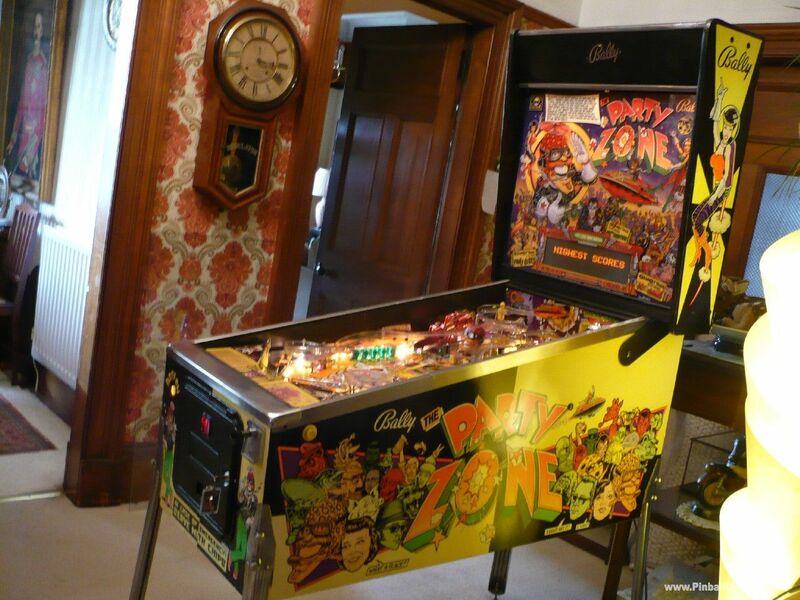 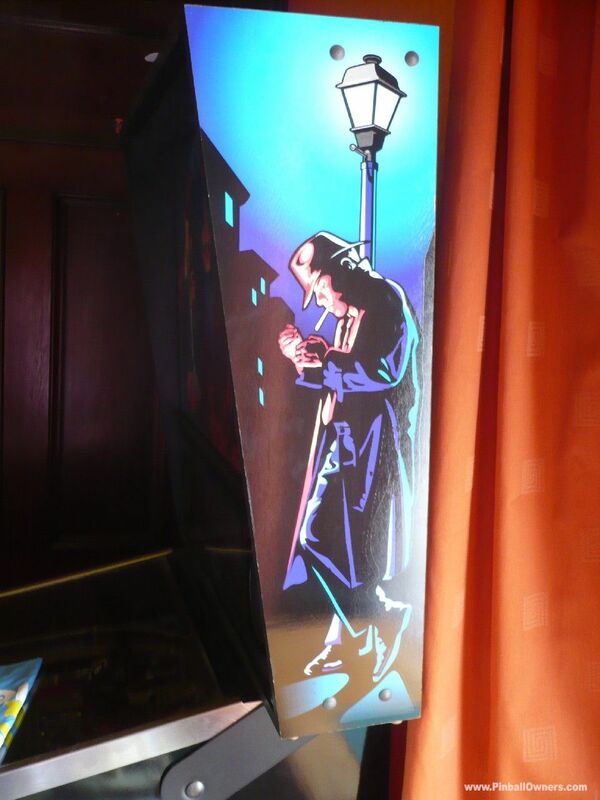 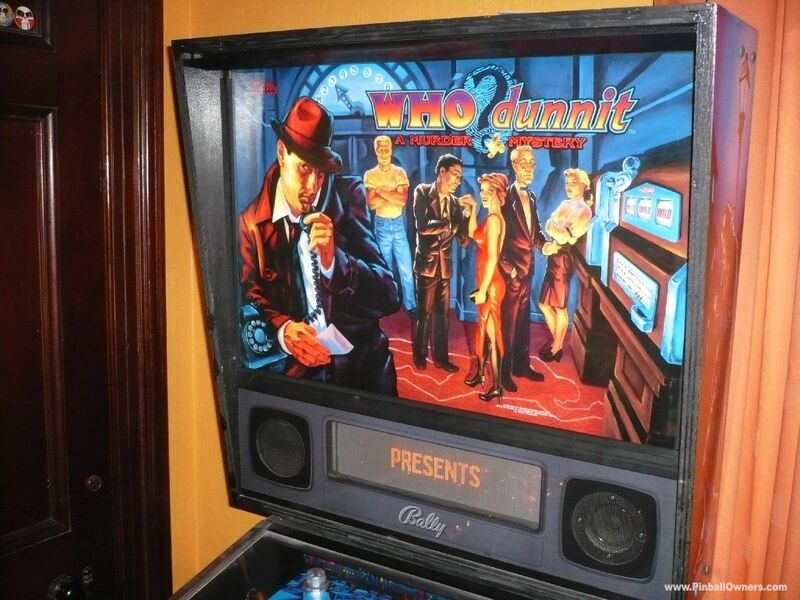 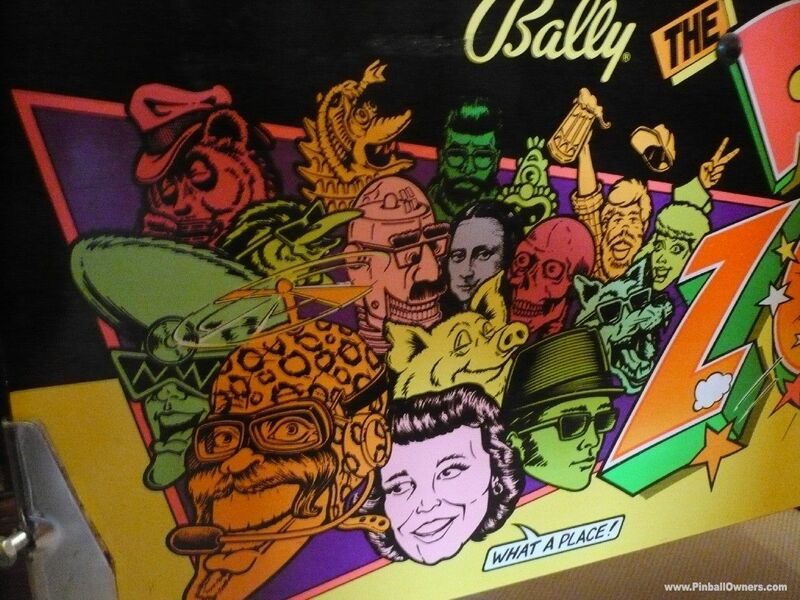 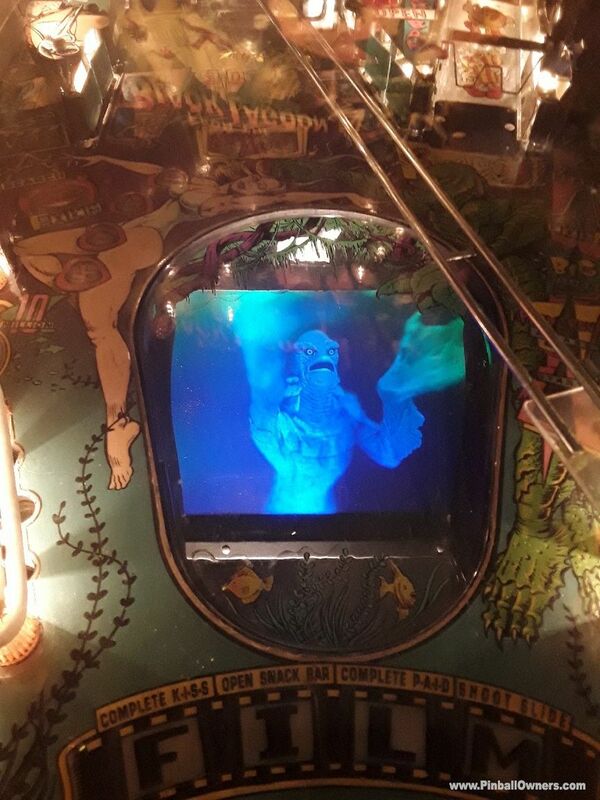 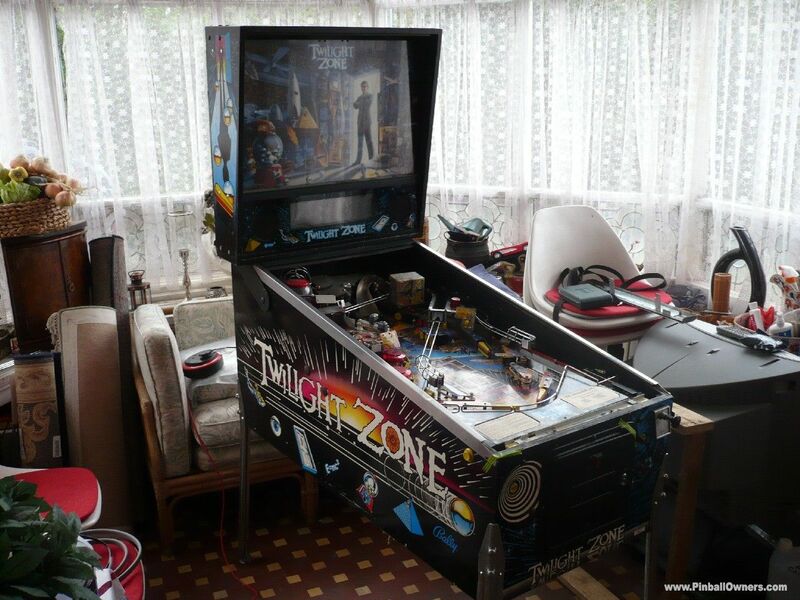 TWILIGHT ZONE Bally (USA) Vendu 1993 (May) Beautiful cabinet, with unmarked playfield. 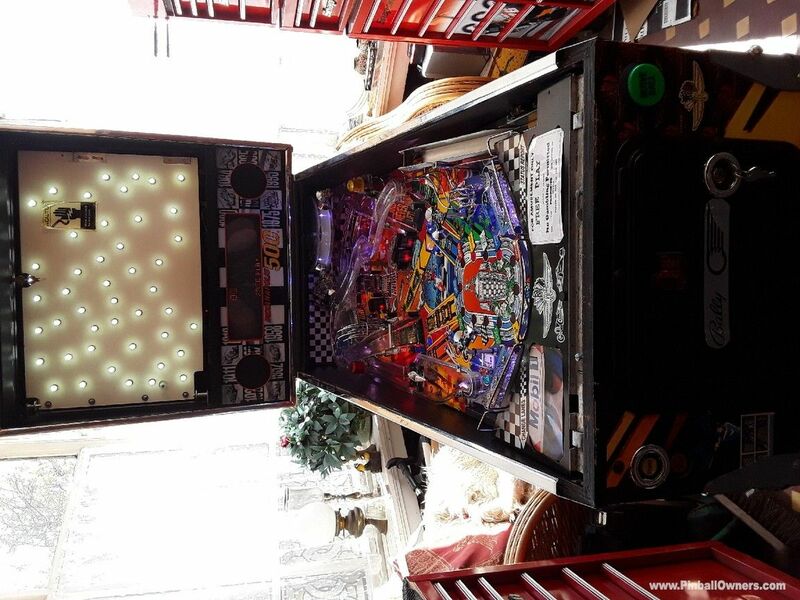 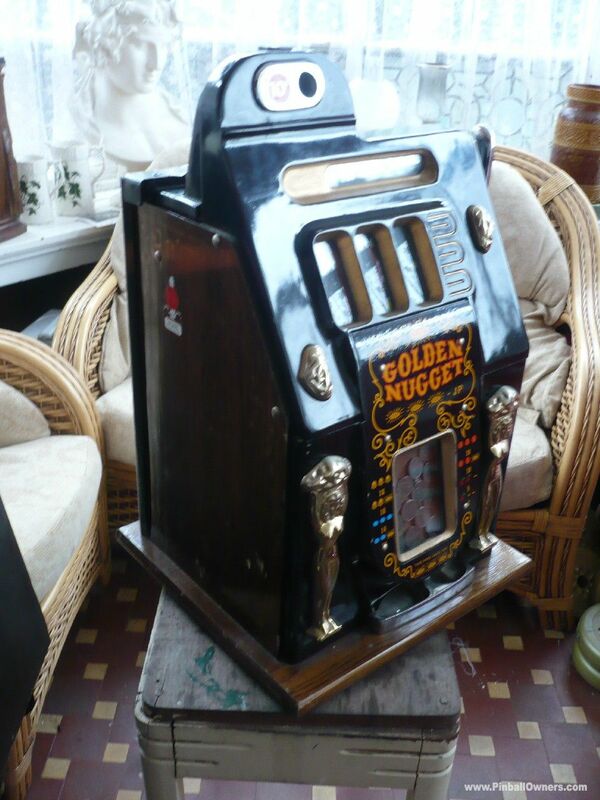 .Everything works as it should......magnets, diverters, powerball, Clock in all modes, gumball machine all targets, all light effects., excellent sound and speech, plays fast and accurate with all the bells and whistles. 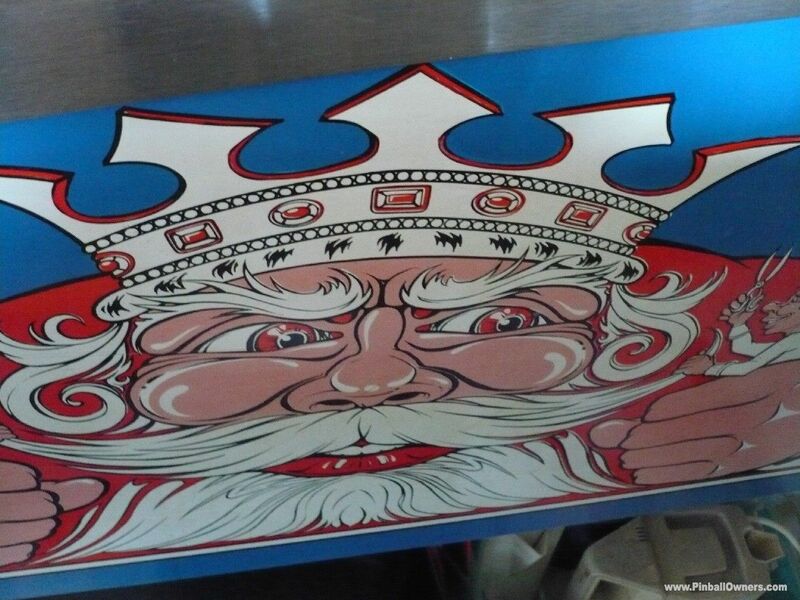 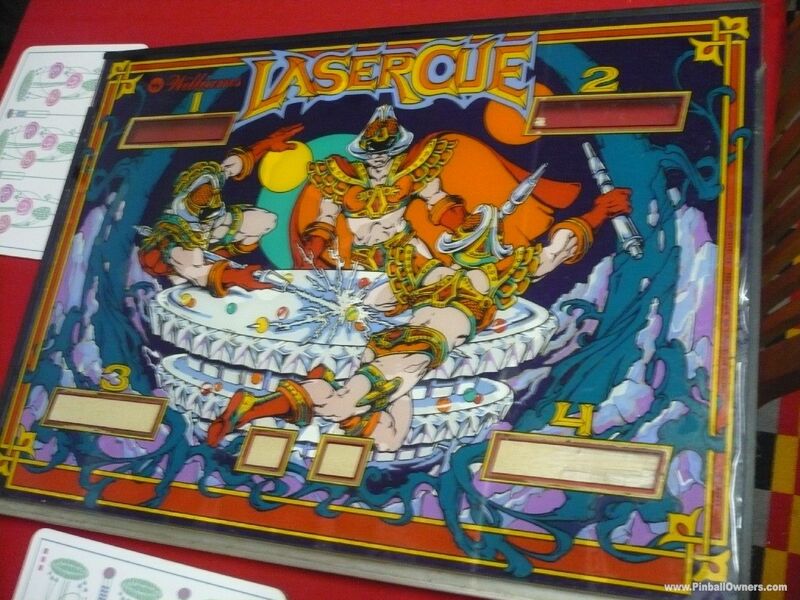 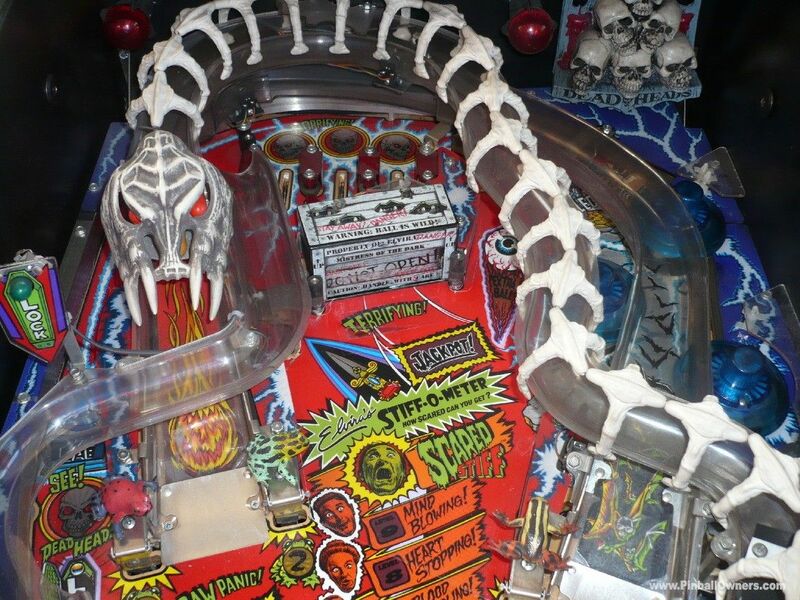 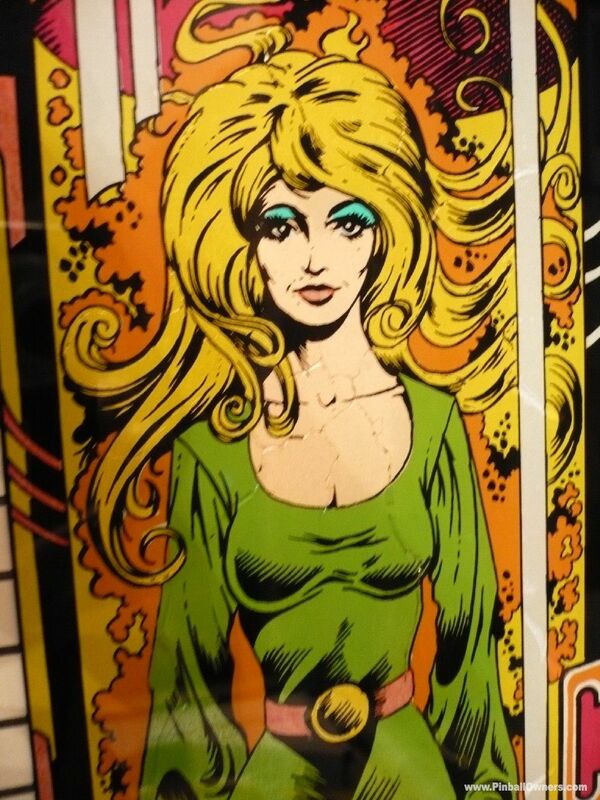 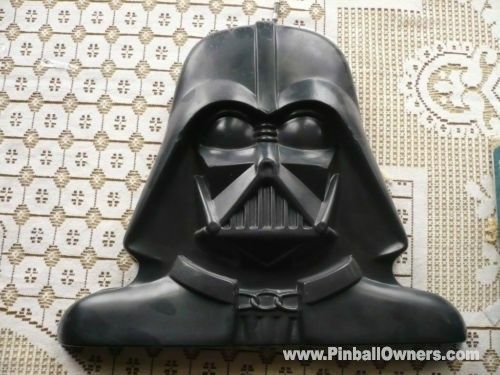 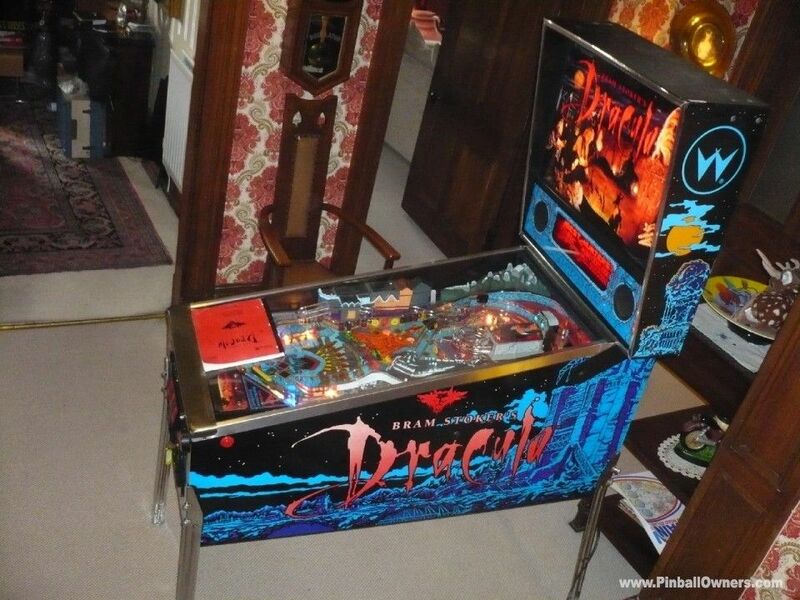 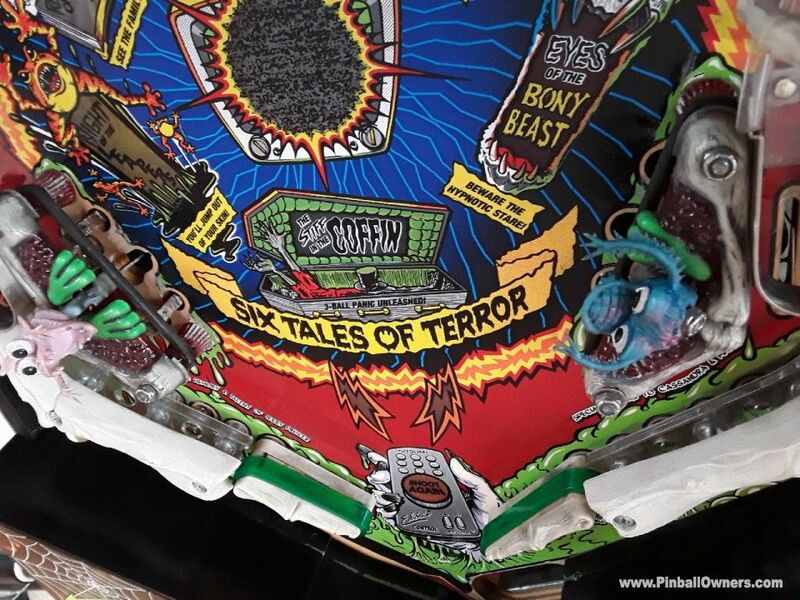 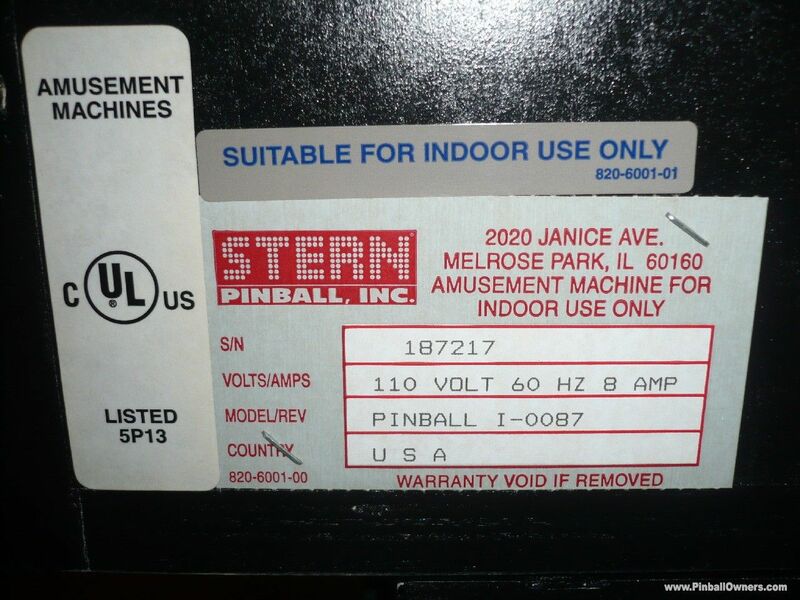 Allegedly one of the most expensive production line pinball machines for its time. 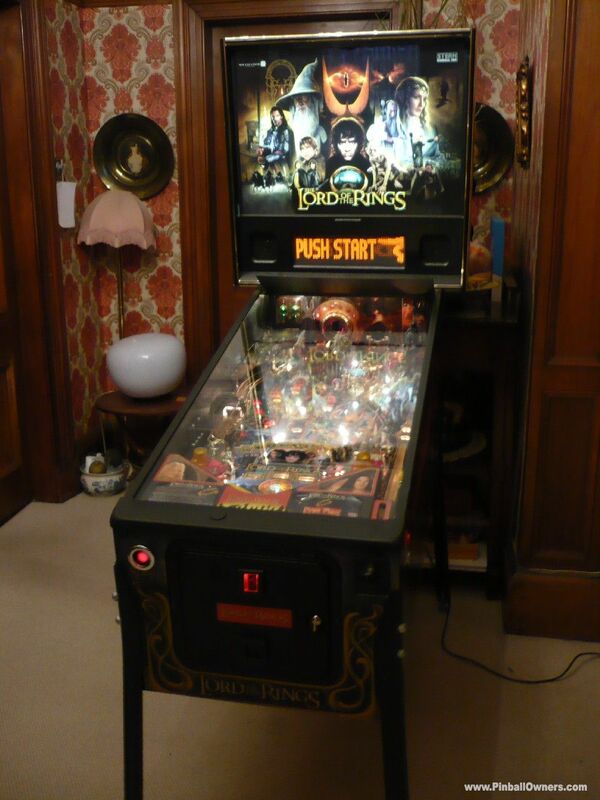 By comparison It just looks and plays top quality... collection and payment in person only. 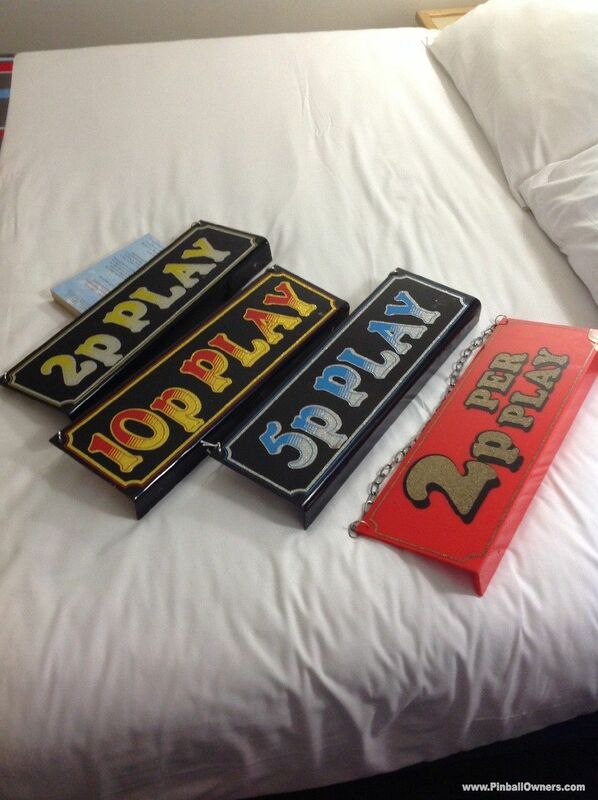 RESERVED. 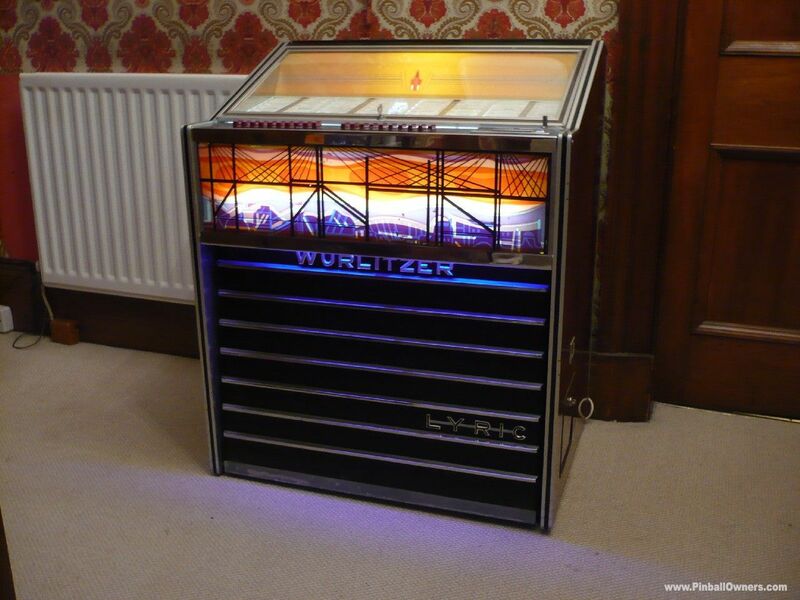 IMPORTANT: Cette page montre la collection de flippers du membre hensteeth2go de Glasgow, United Kingdom. 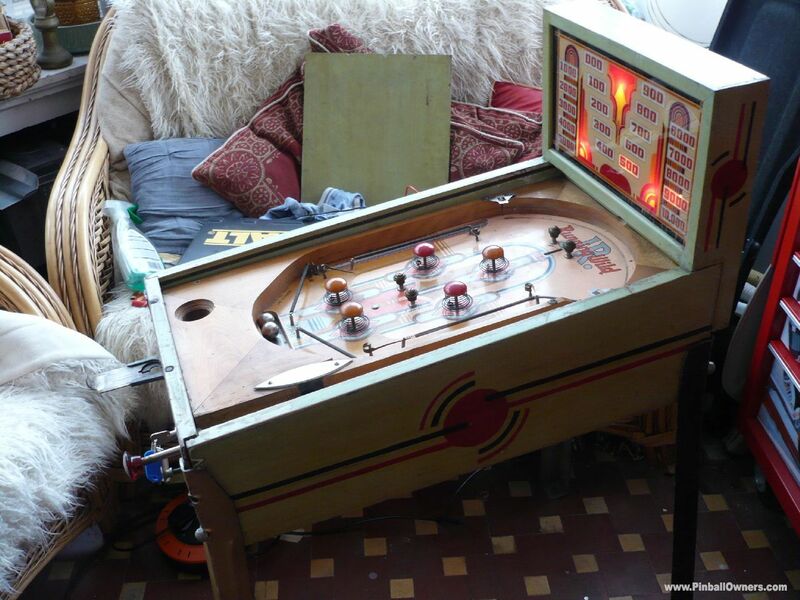 Les flippers à monnayeur énumérés ci-dessus, y compris leurs images, ont été téléchargés dans notre base de données par hensteeth2go lui-même; hensteeth2go est le seul responsable de l'information contenue en cette page. 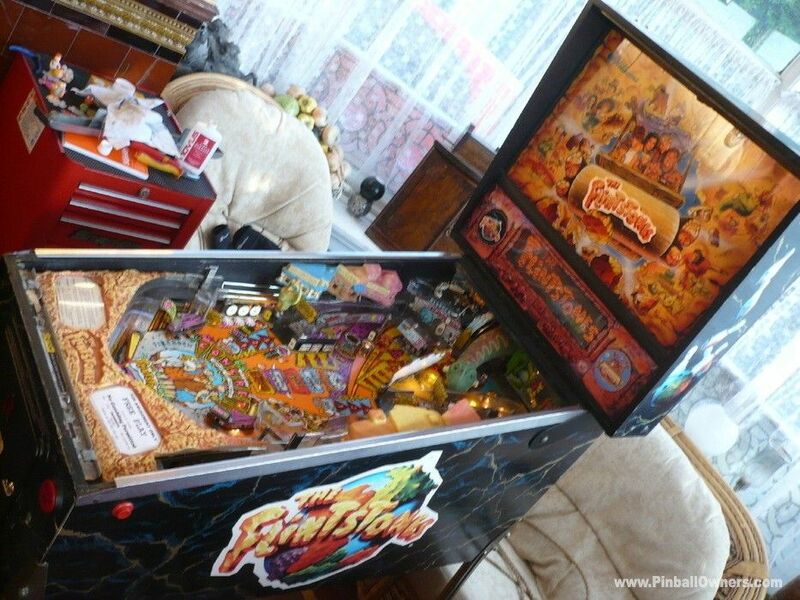 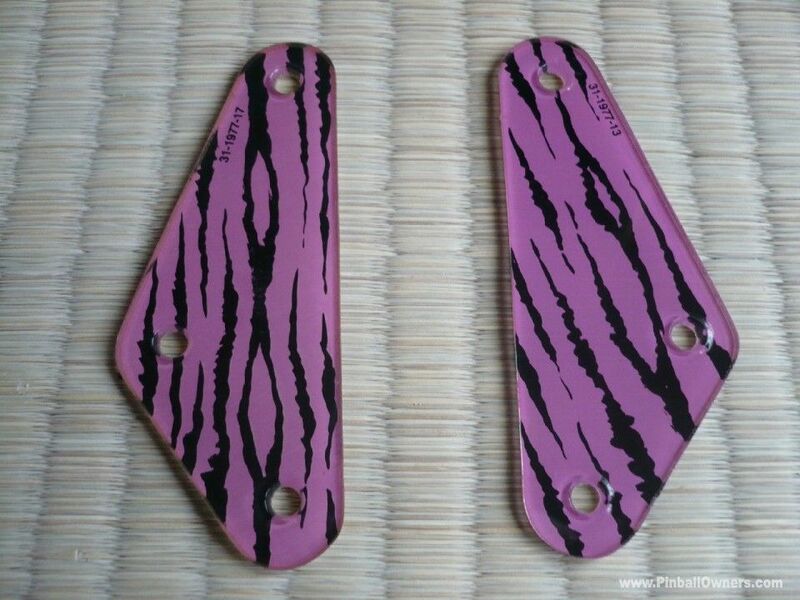 Les flippers montrés ci-dessus ne sont pas nécessairement à vendre! 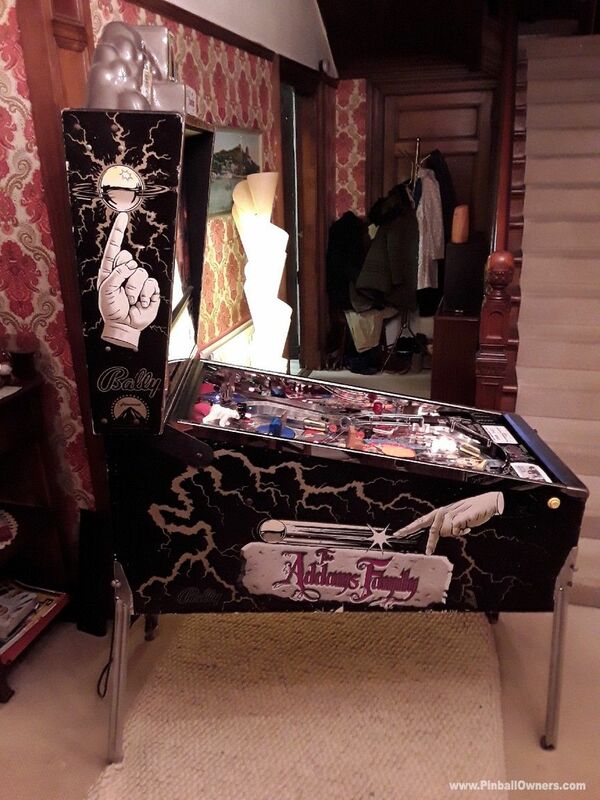 Veuillez se référer à la 4ème colonne dans la liste pour savoir si un certain flipper est en vente ou pas. 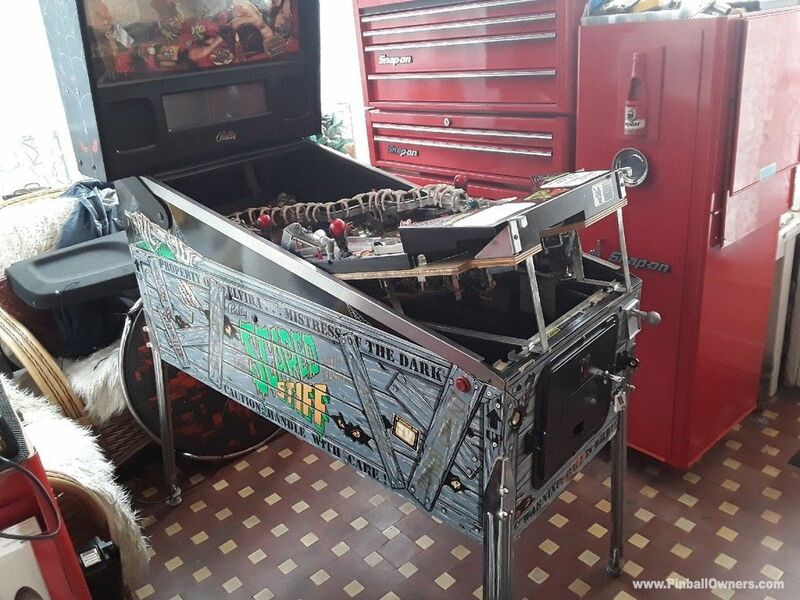 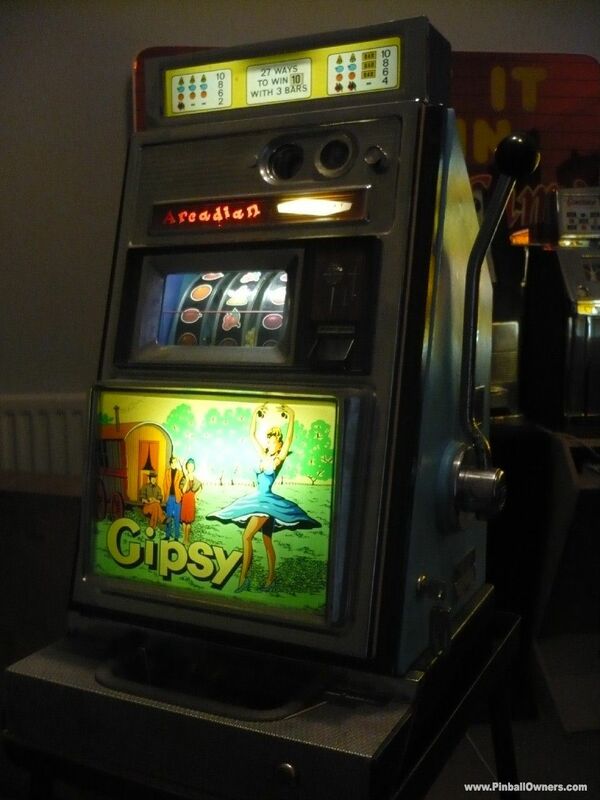 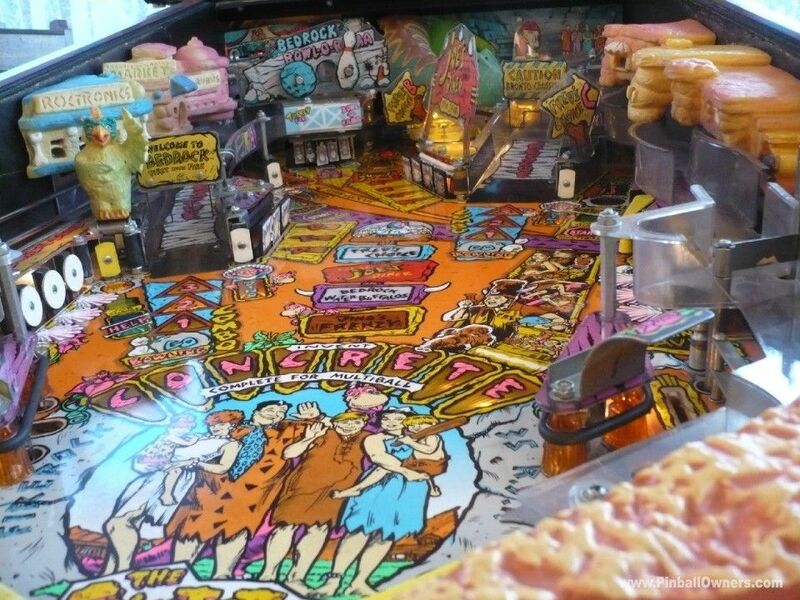 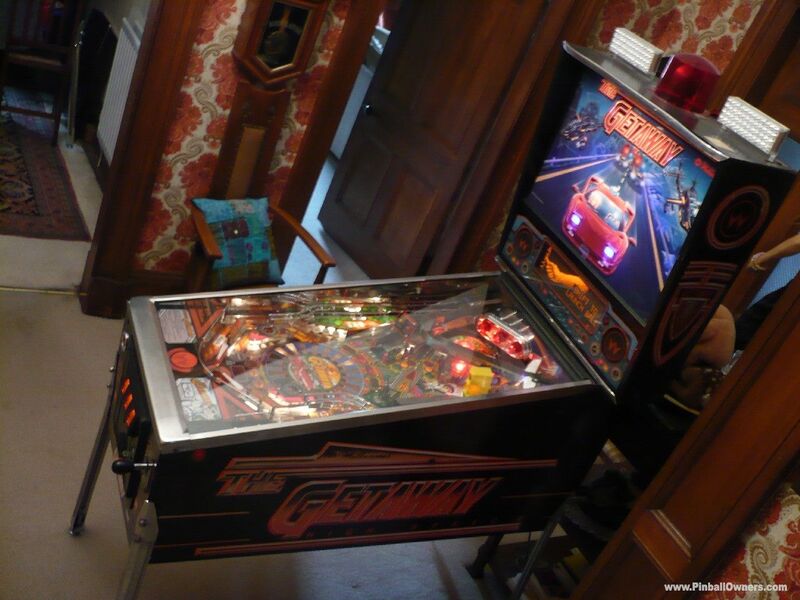 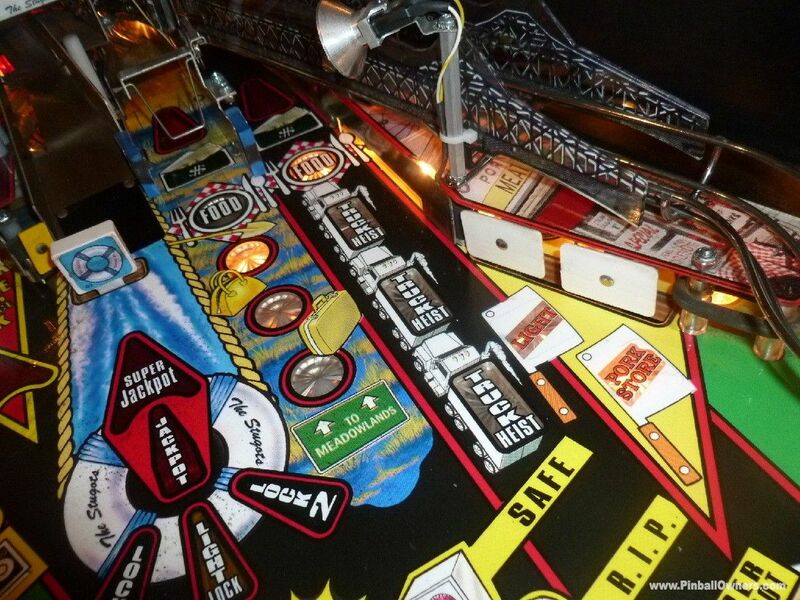 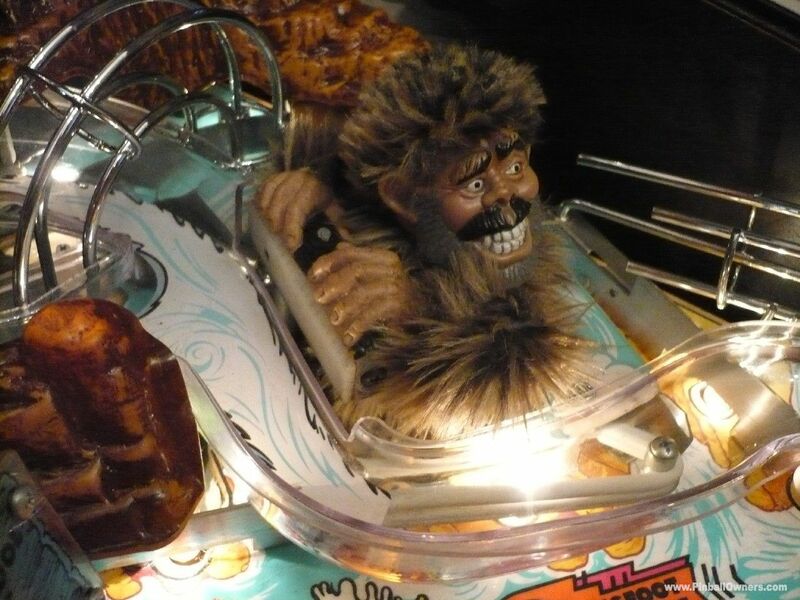 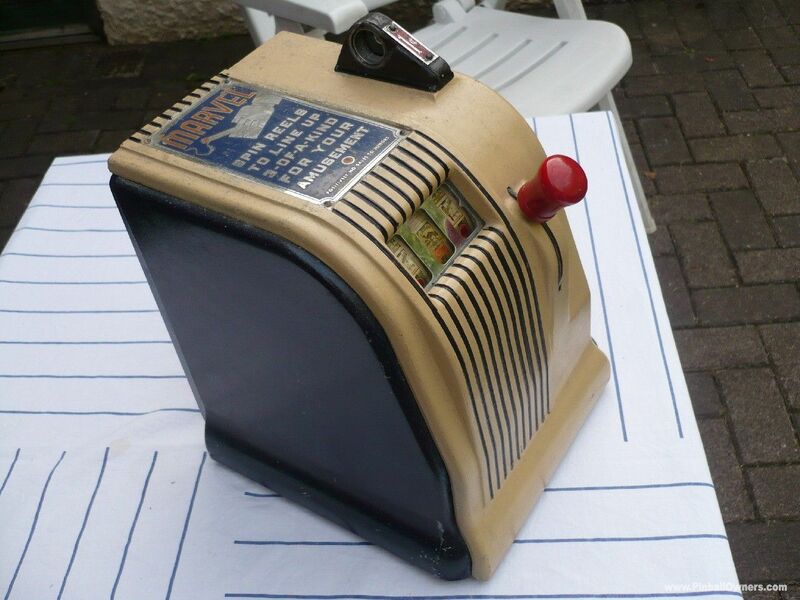 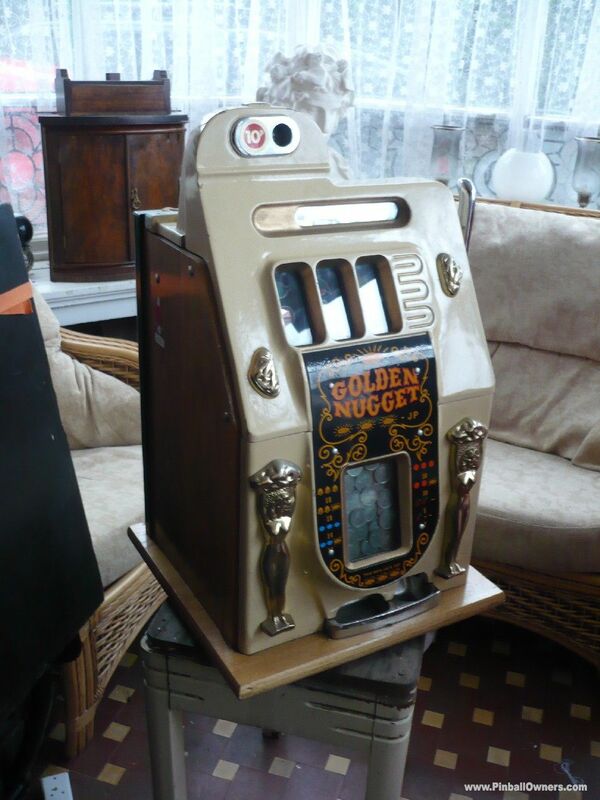 Très probablement, la plupart des flippers de hensteeth2go sont des flippers d'occasion qui ont été installés dans les cafes et d'autres lieux publics; leur valeur en tant que collectable dépend en grande partie de l'aspect et de la fonctionnalité de chaque flipper. 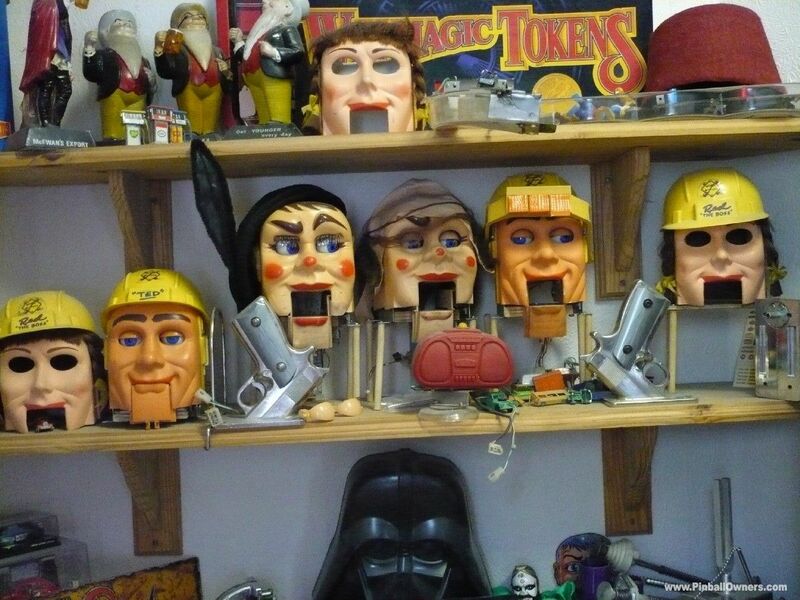 Superb collection. 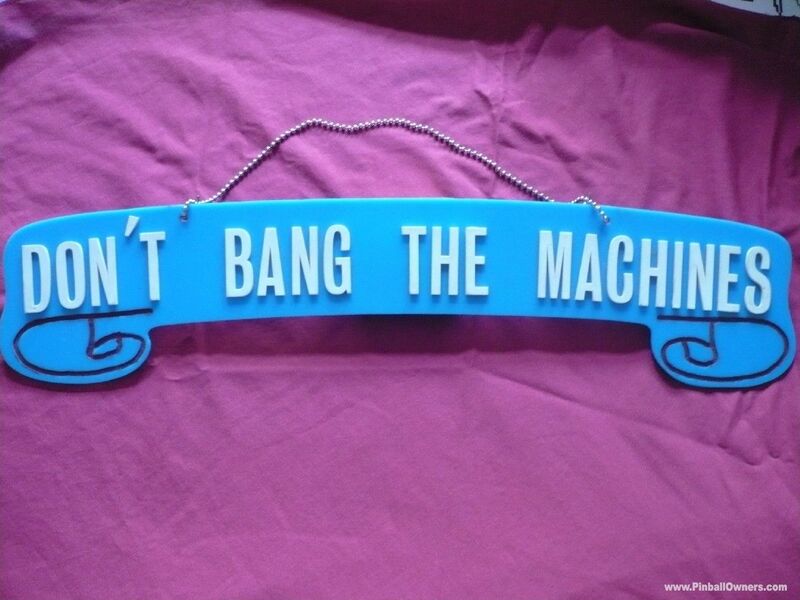 I can see quite few that I'd love to have off you! 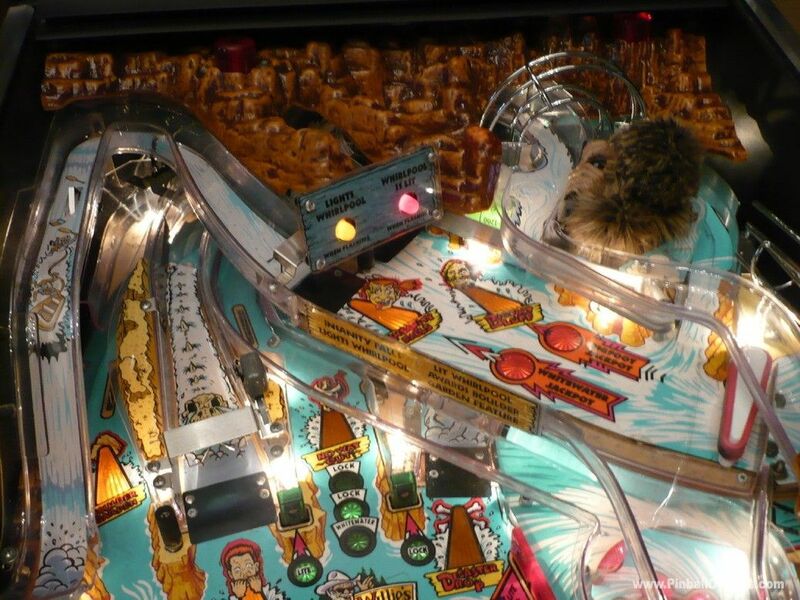 Faire un commentaire sur la Collection de Flippers de hensteeth2go, qui sera montr&eracute; à tous ceux qui visitent cette page! 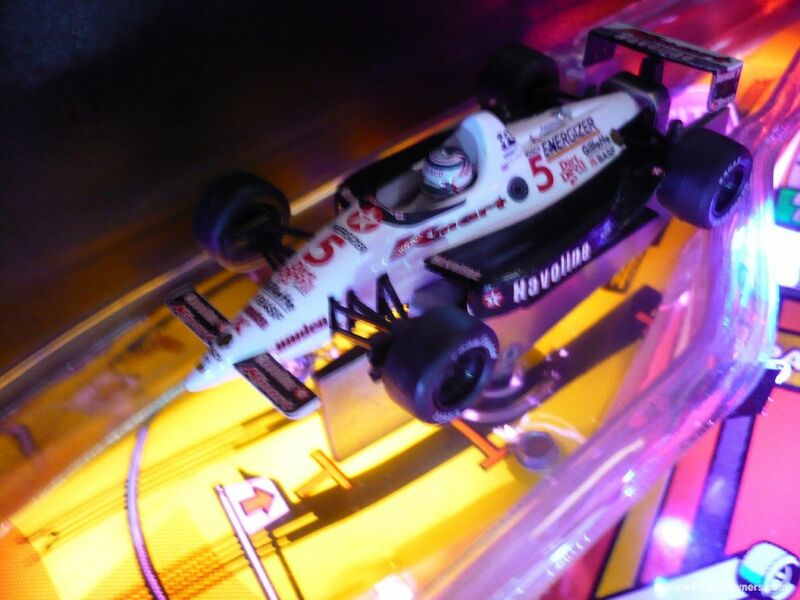 Si vous utilisez le formulaire ci-dessus pour envoyer un message privé à hensteeth2go, votre message sera rejeté.